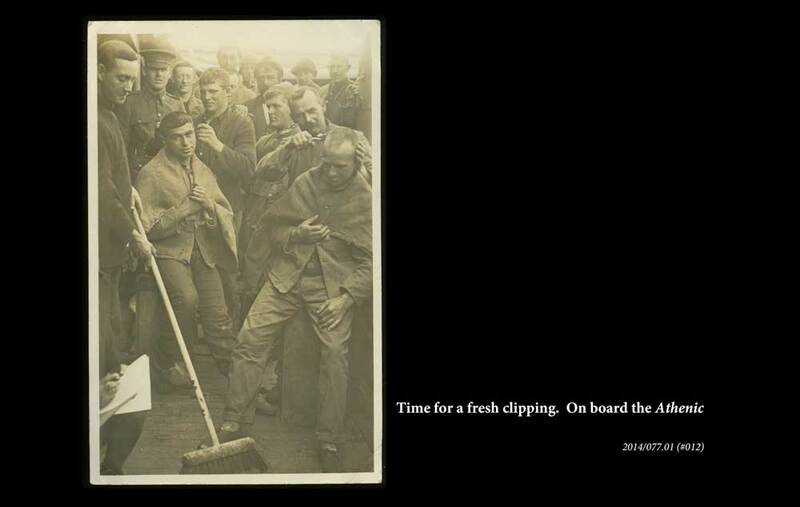 The gallery below features images from our SCRoll profiles. 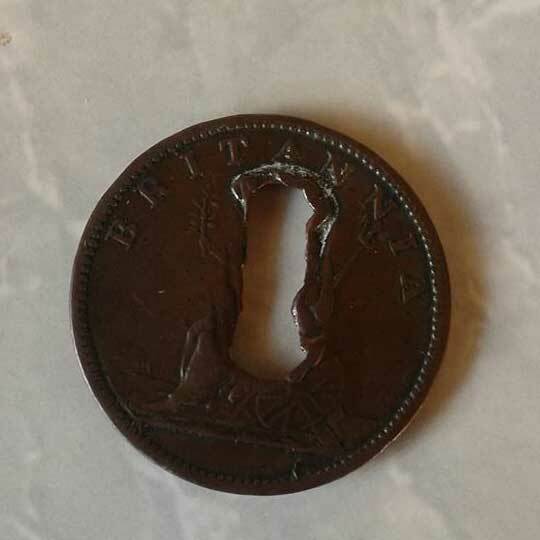 See something interesting? 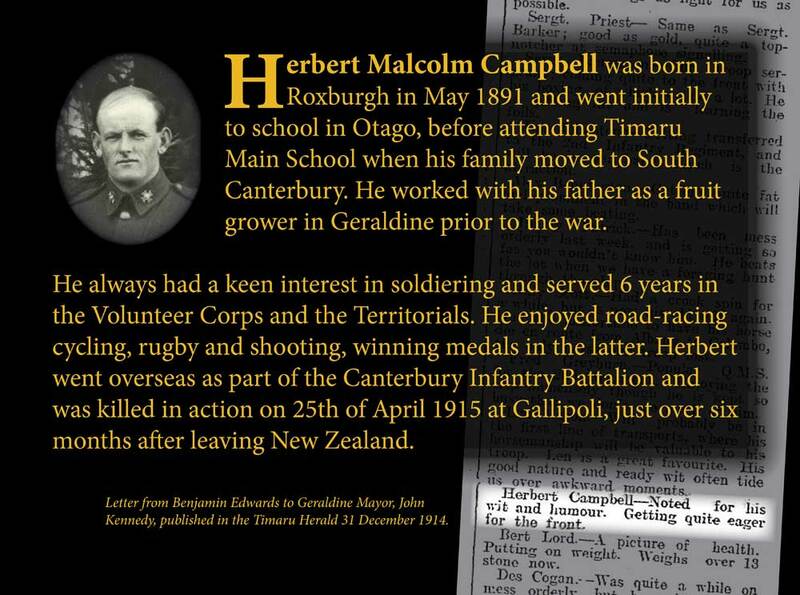 Explore individual profiles by searching our SCRoll stories. 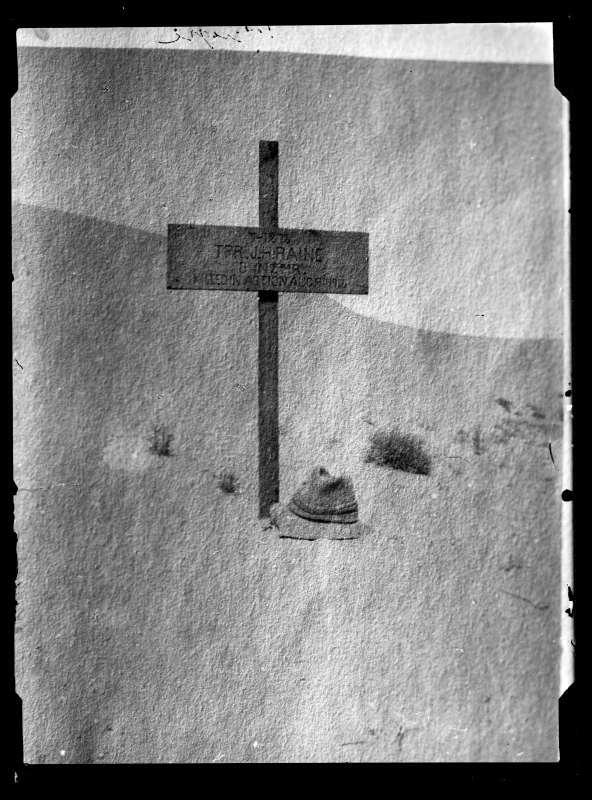 Back from left: J.L. 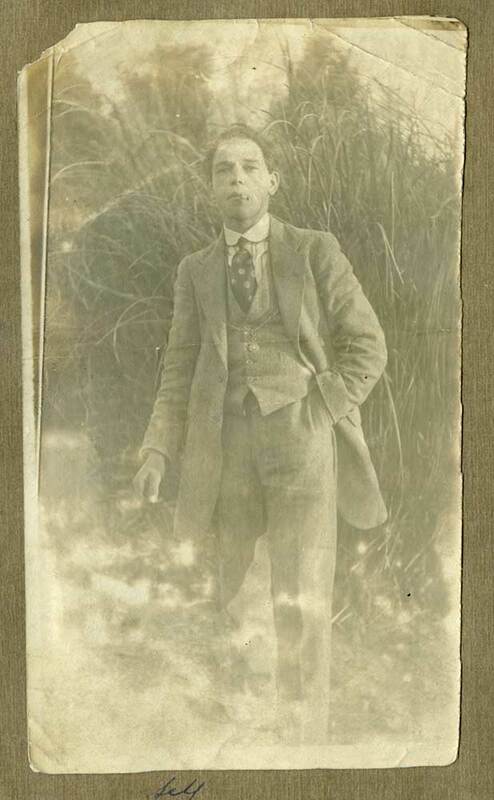 Lucena, W.G. 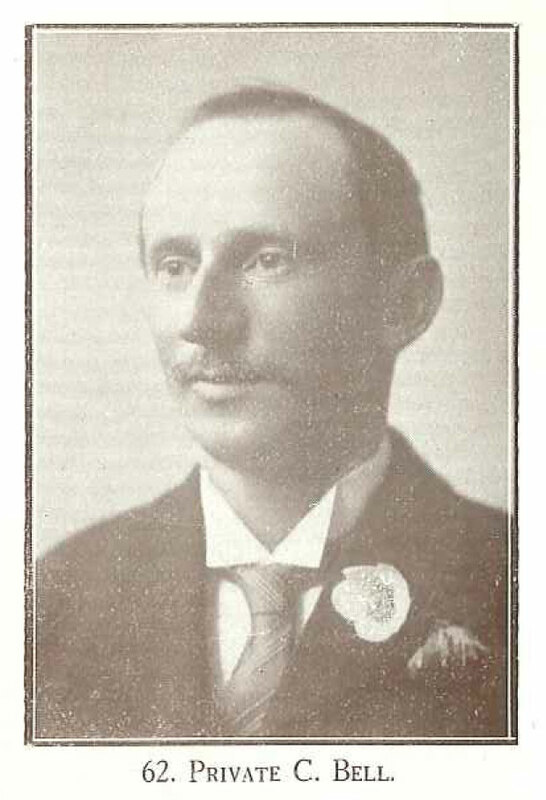 Rich, L.R. 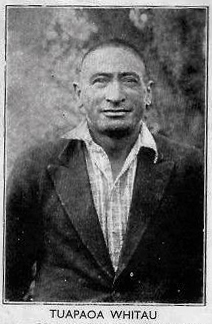 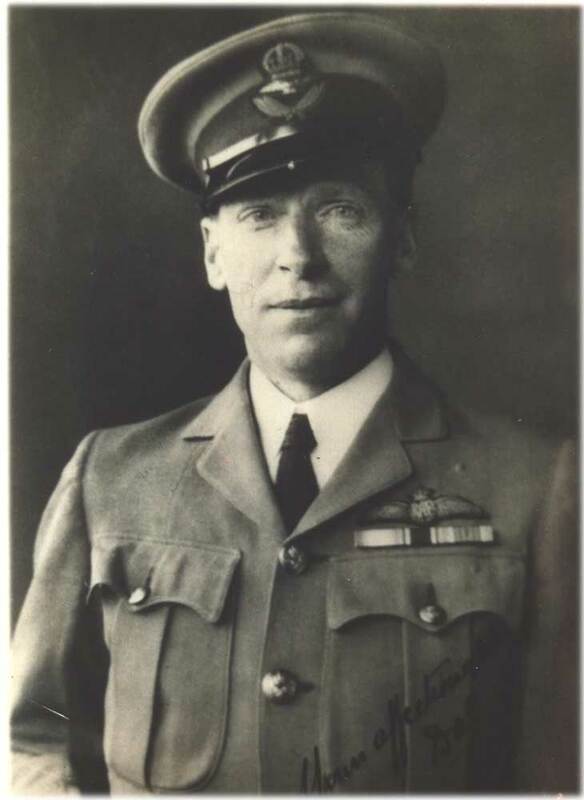 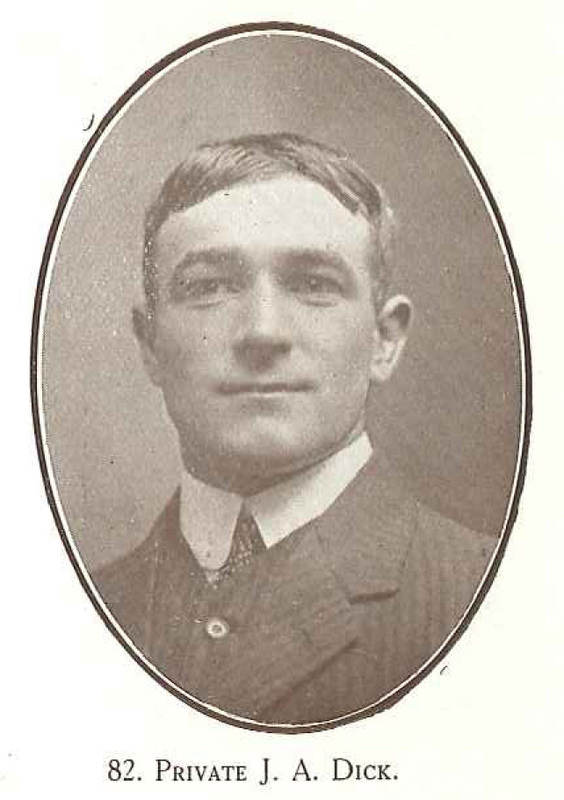 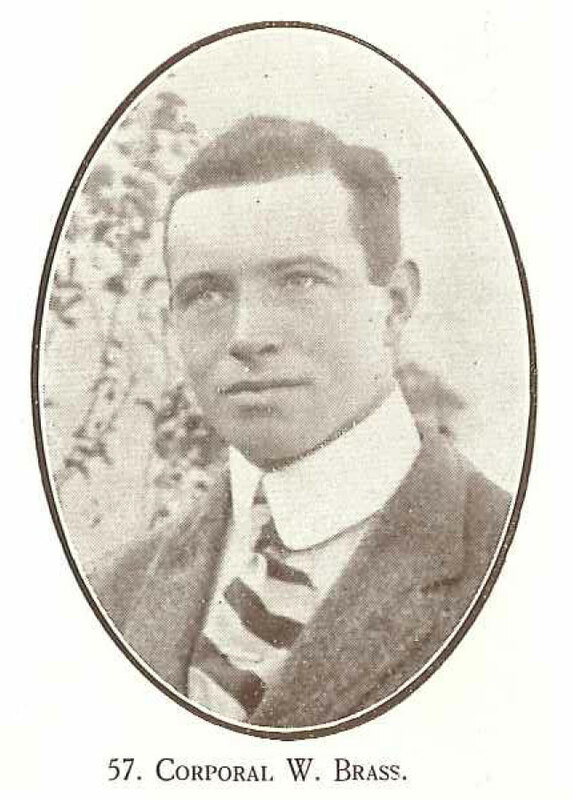 Harris, E.W. 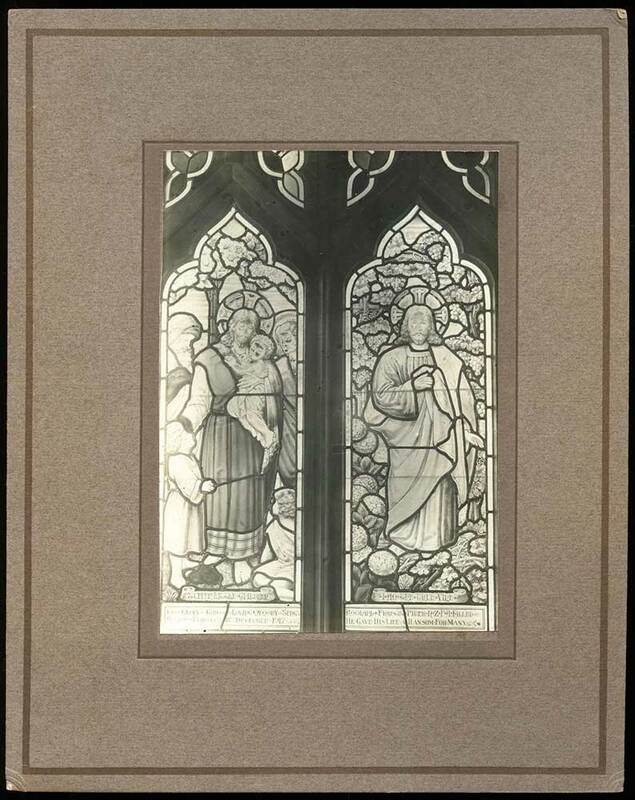 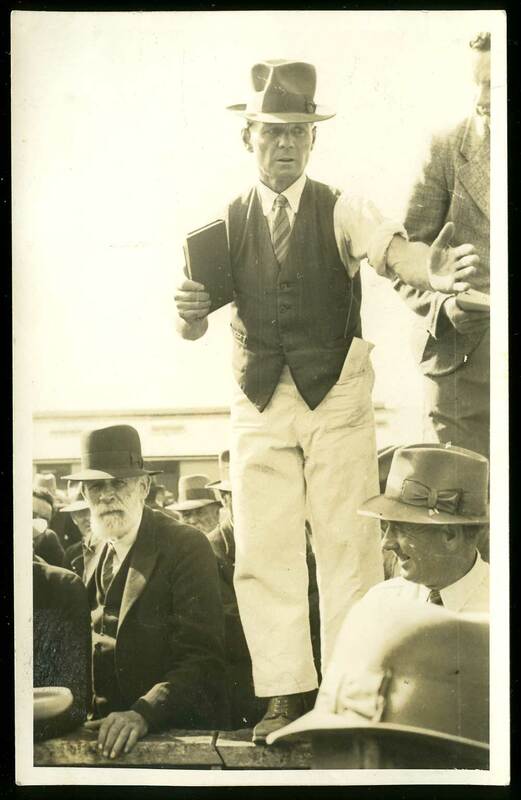 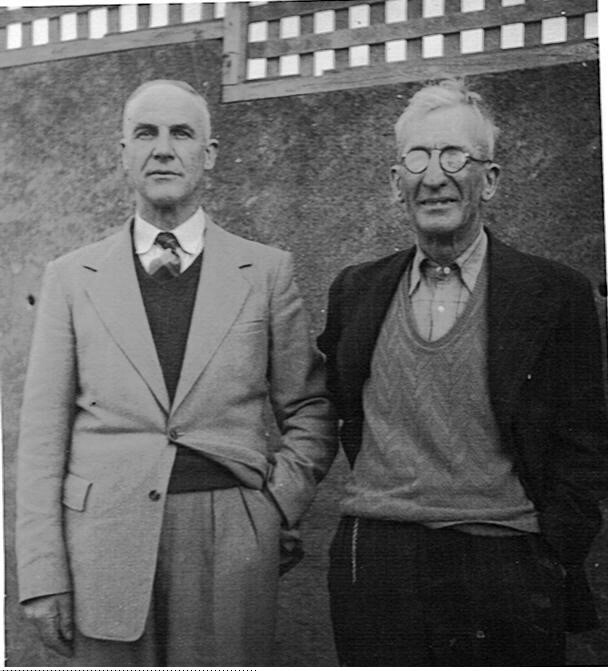 Reeves, S.C. Bennington, W.R. Lightbody. 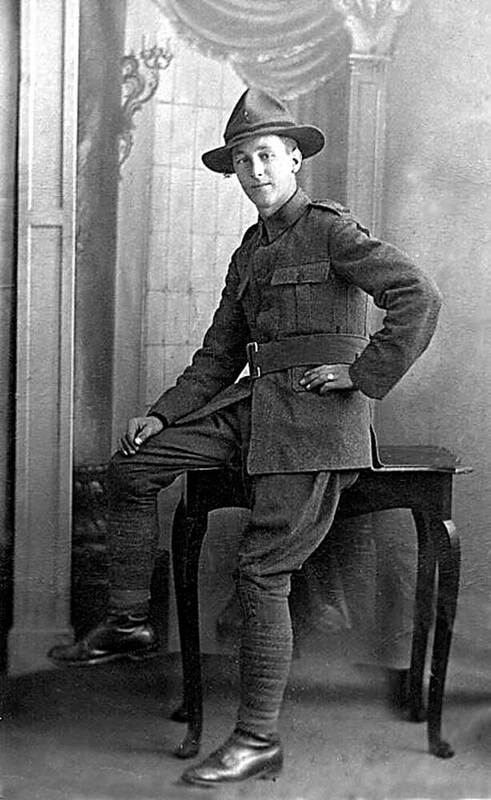 Mid (sitting) from left: J.H. 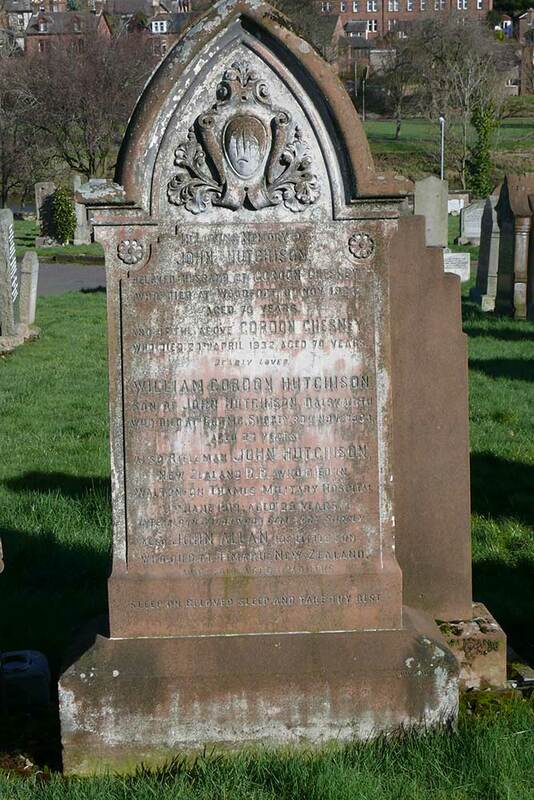 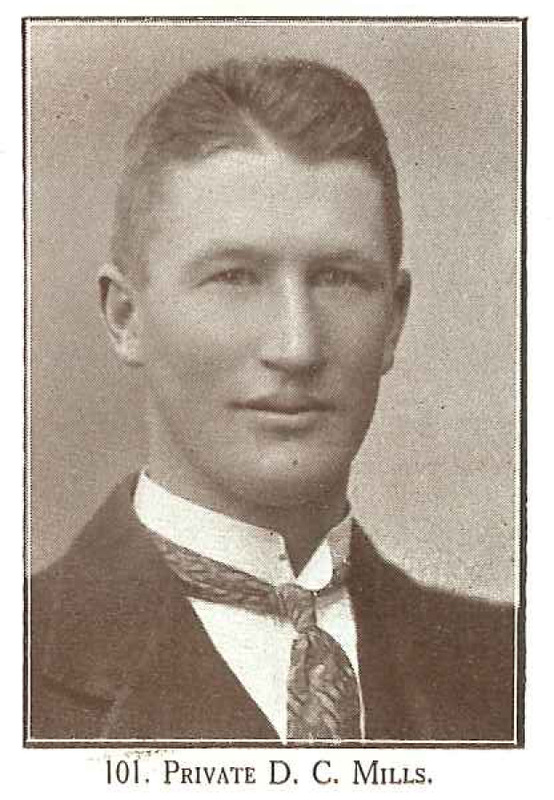 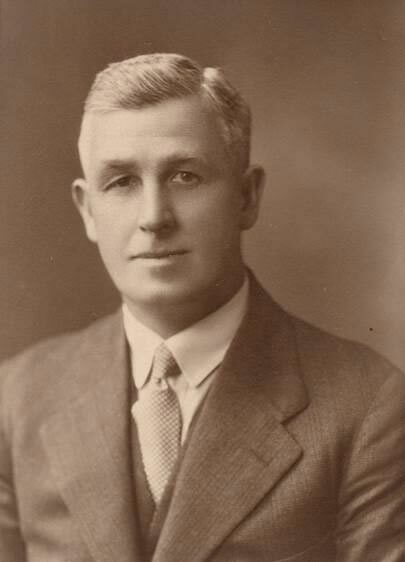 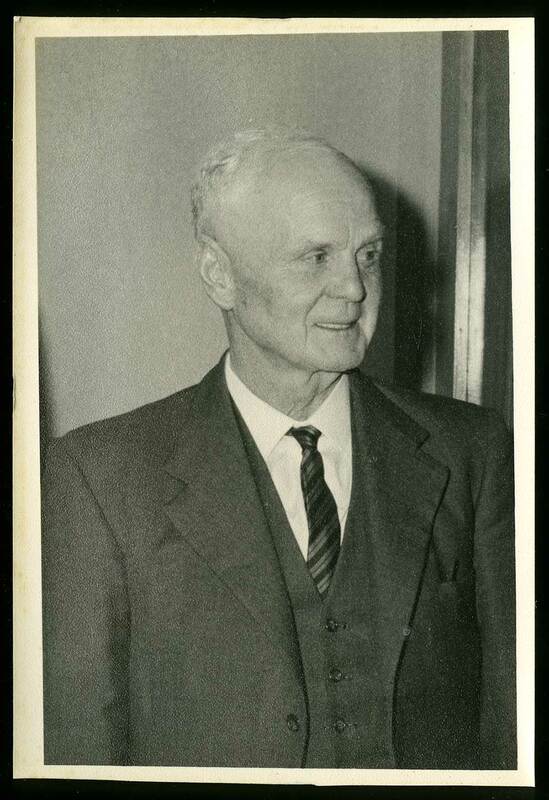 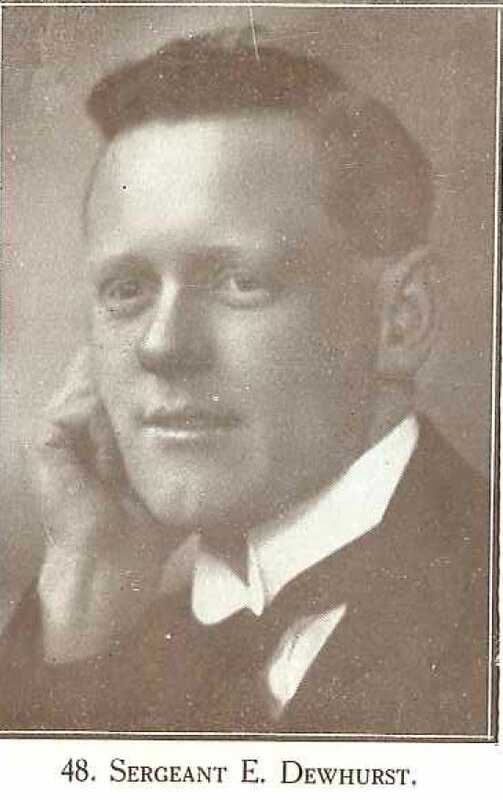 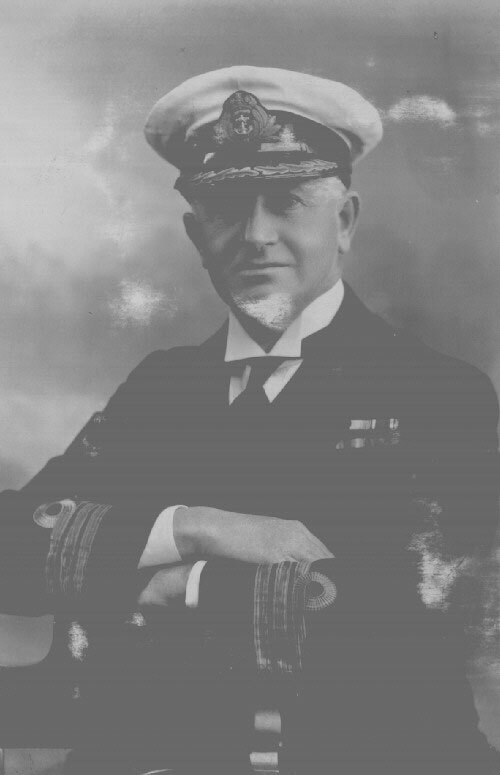 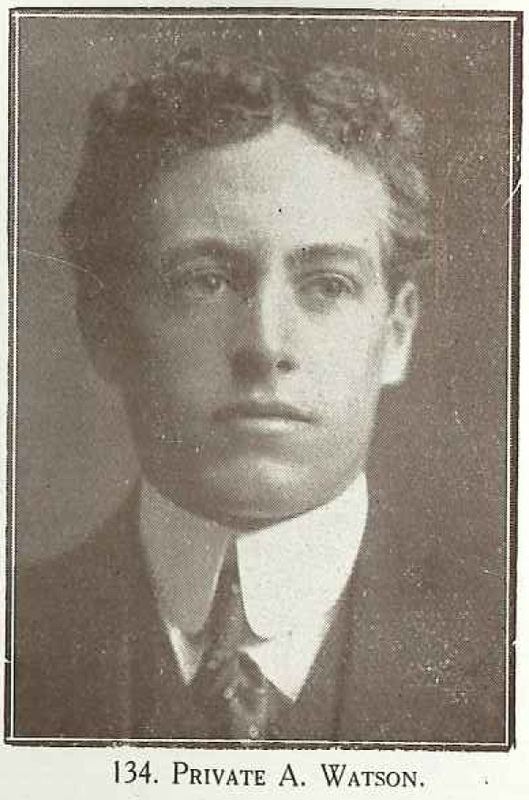 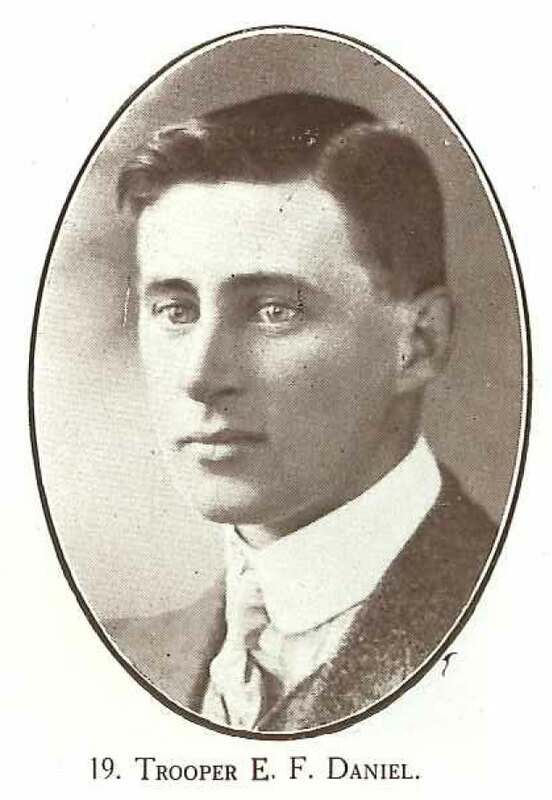 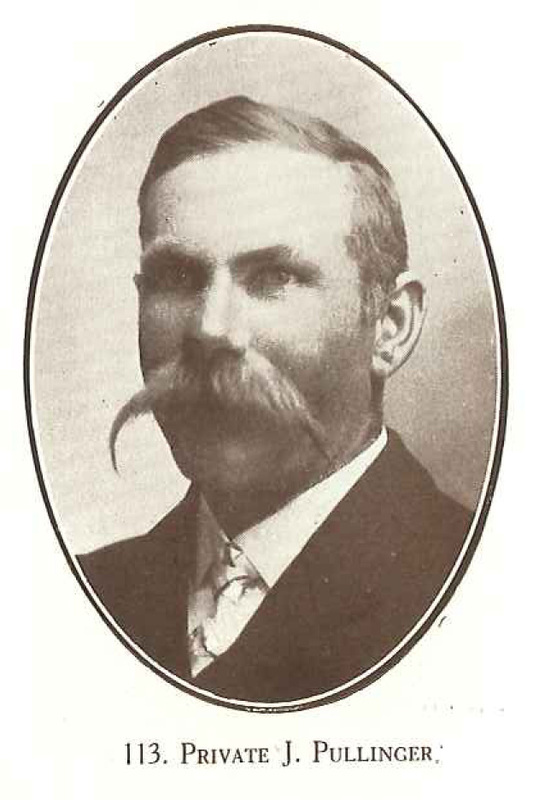 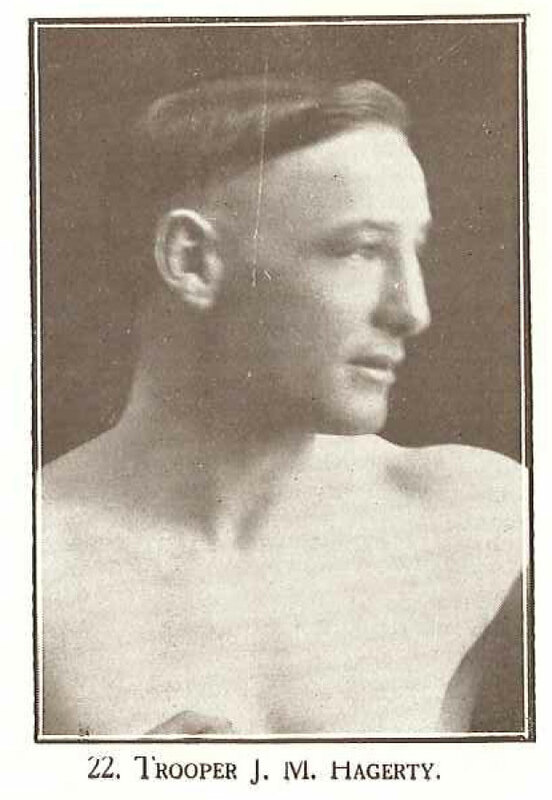 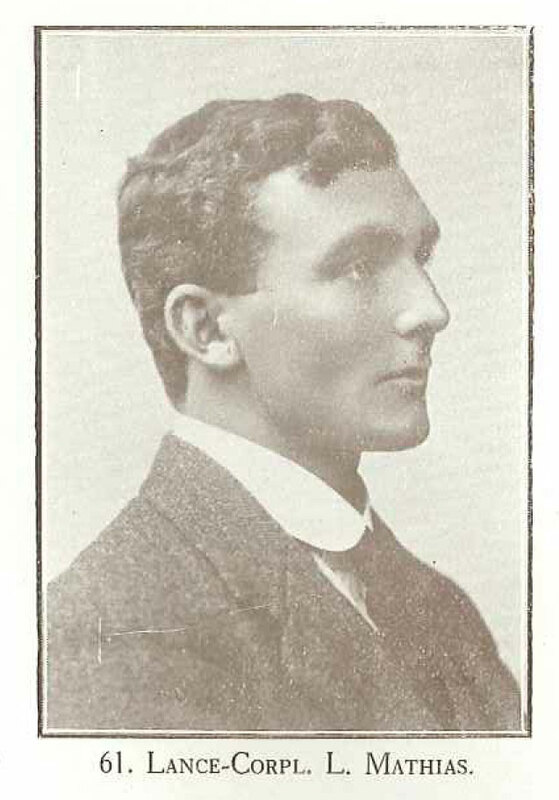 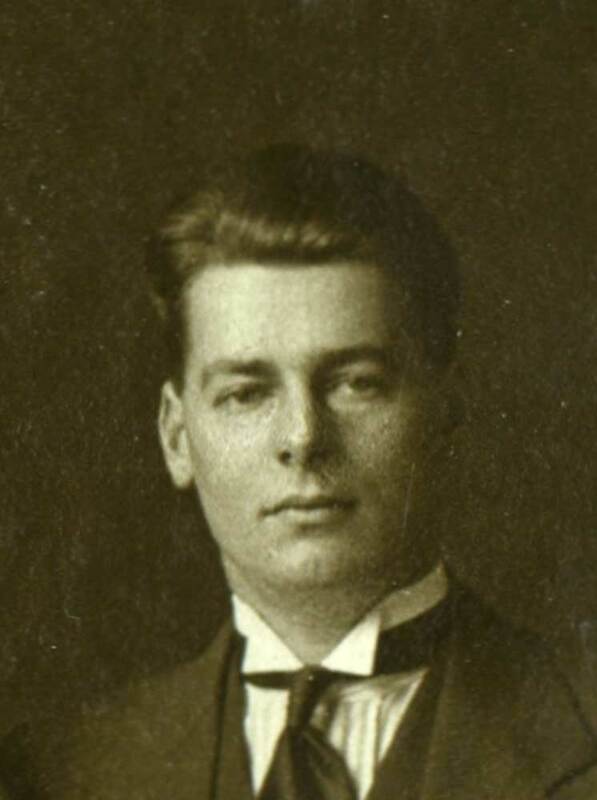 McKendry, H.L. 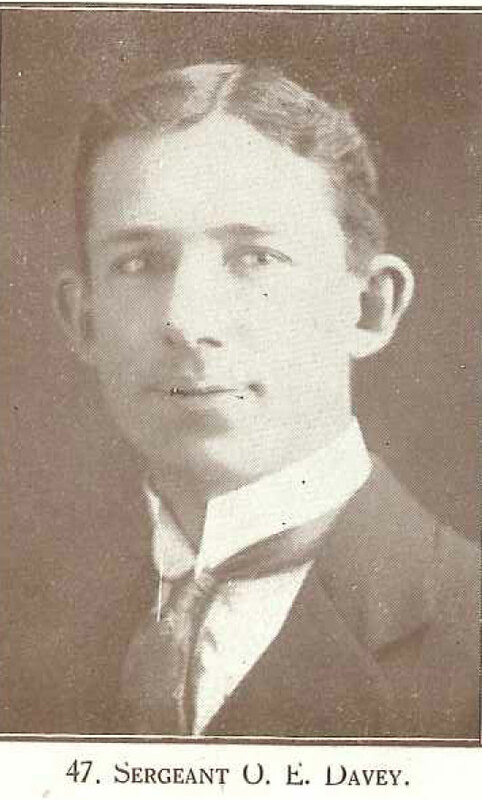 White, J.L. 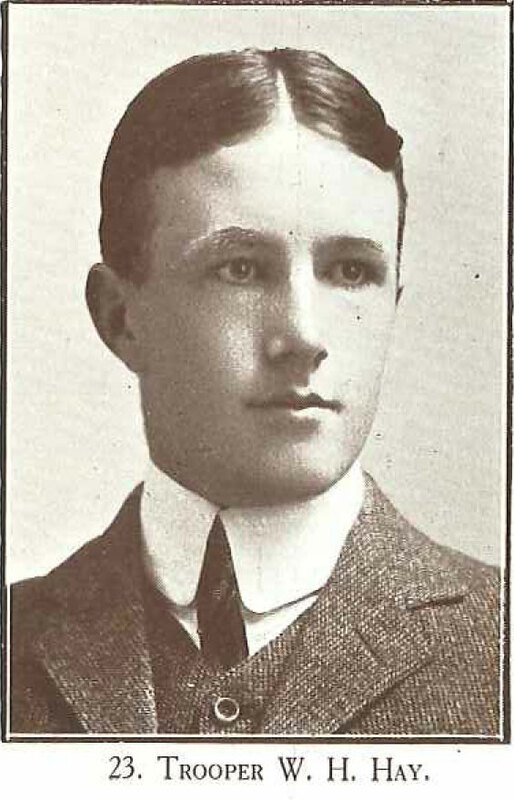 Davis, T.E. 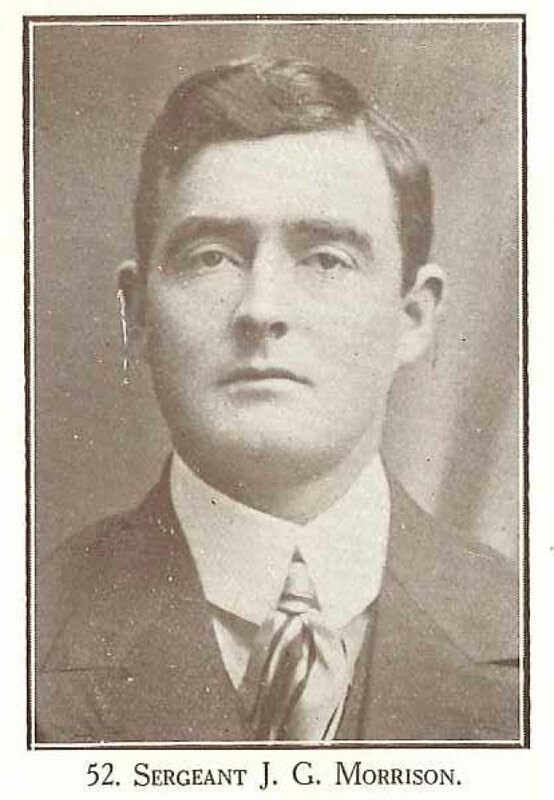 Royds, H.D. 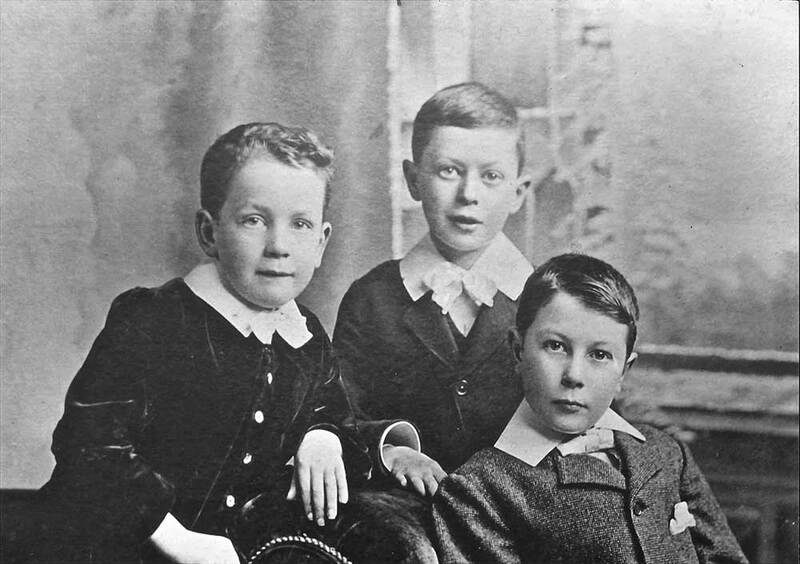 Christie, R.R.Napier, J. E. Rawnsley. 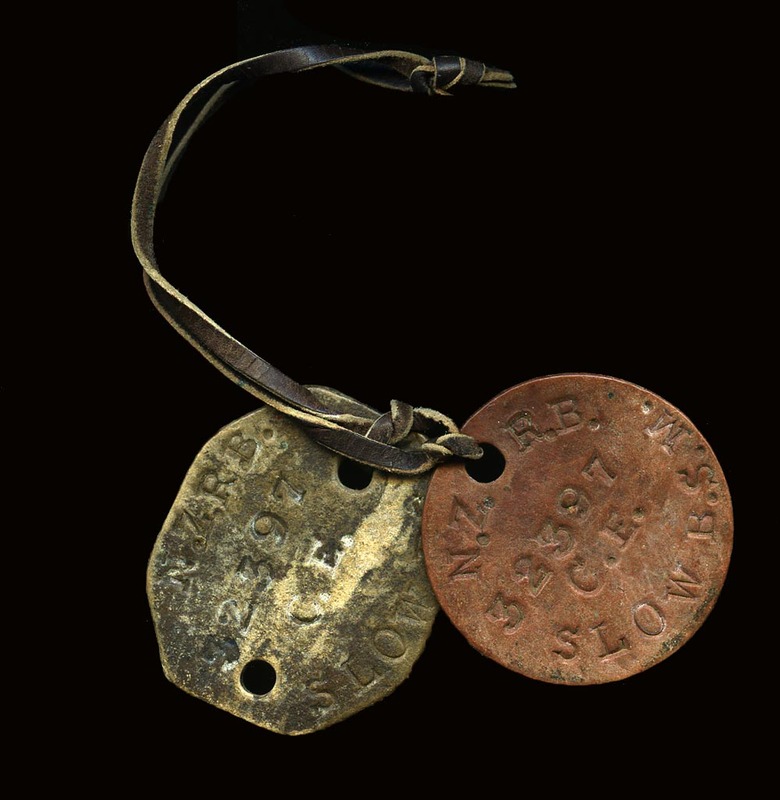 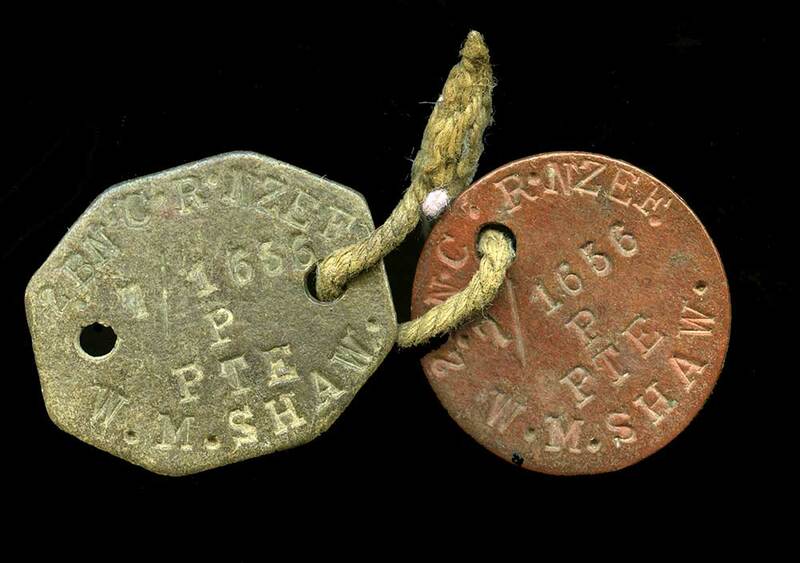 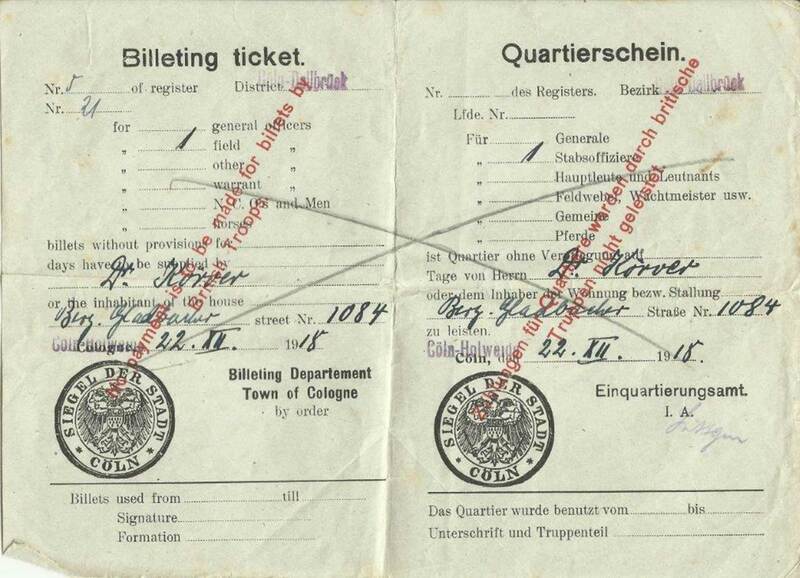 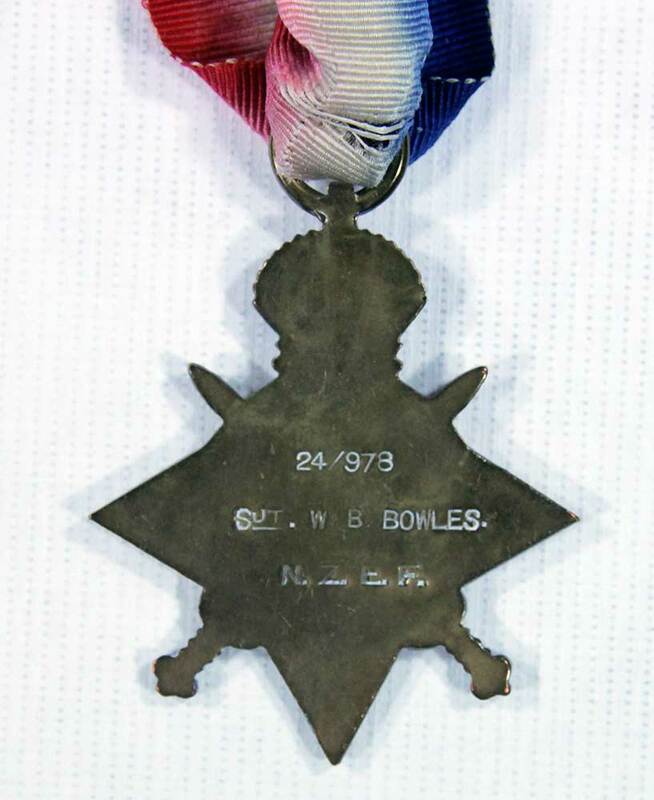 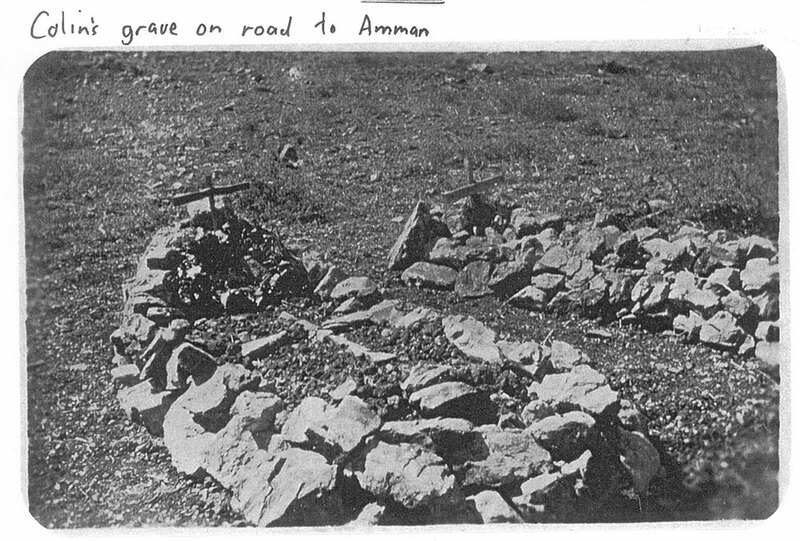 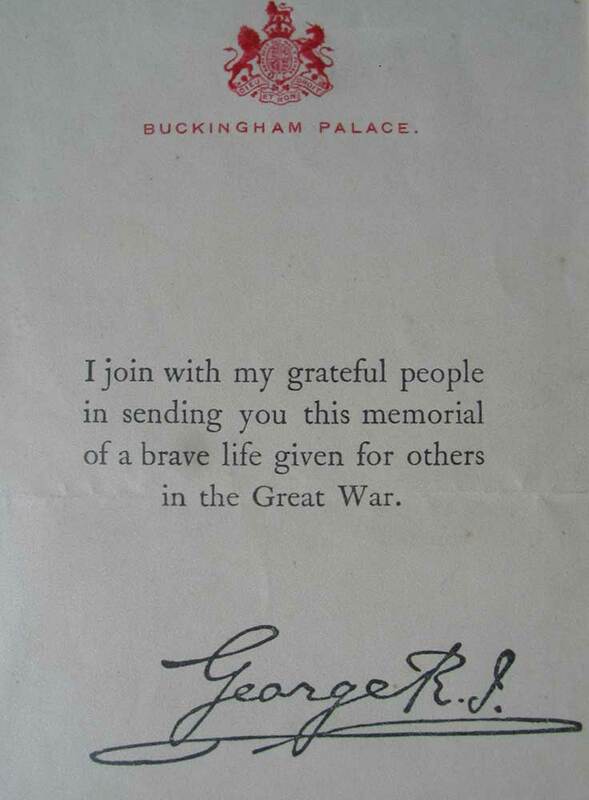 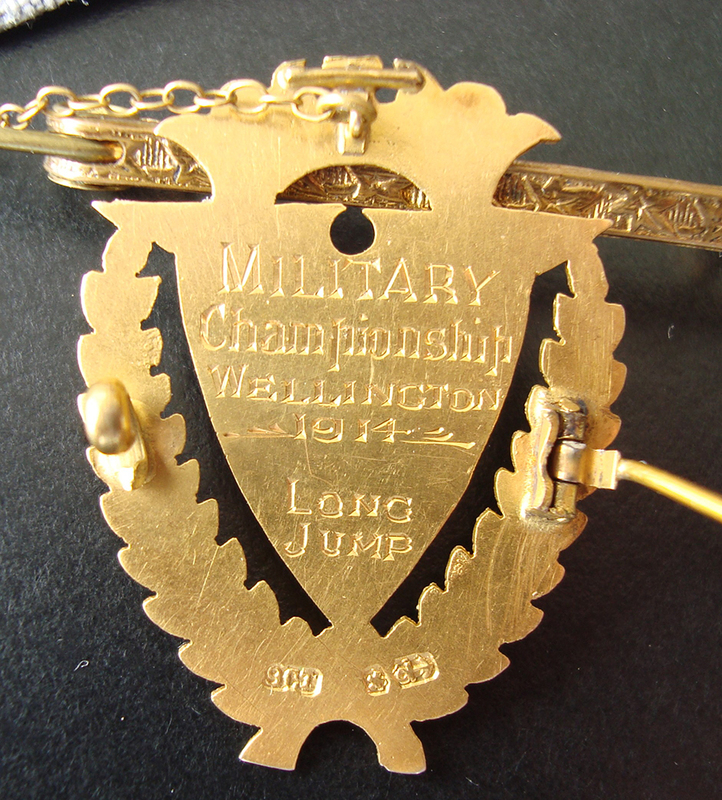 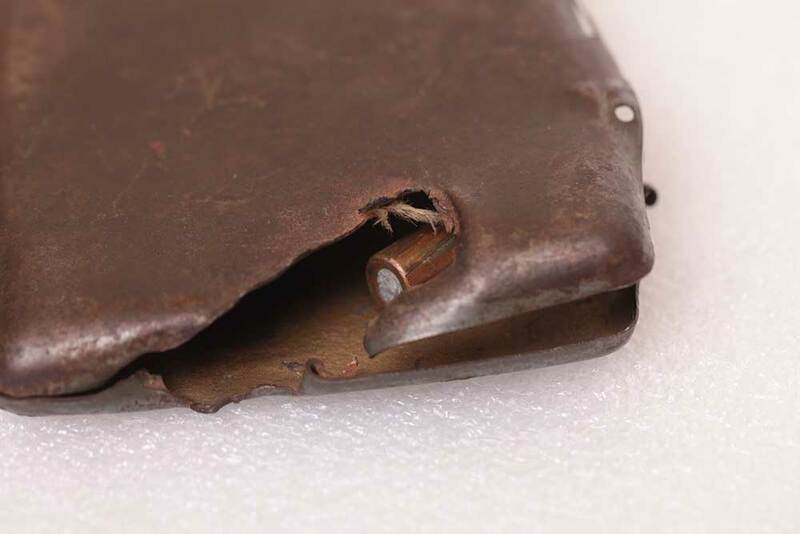 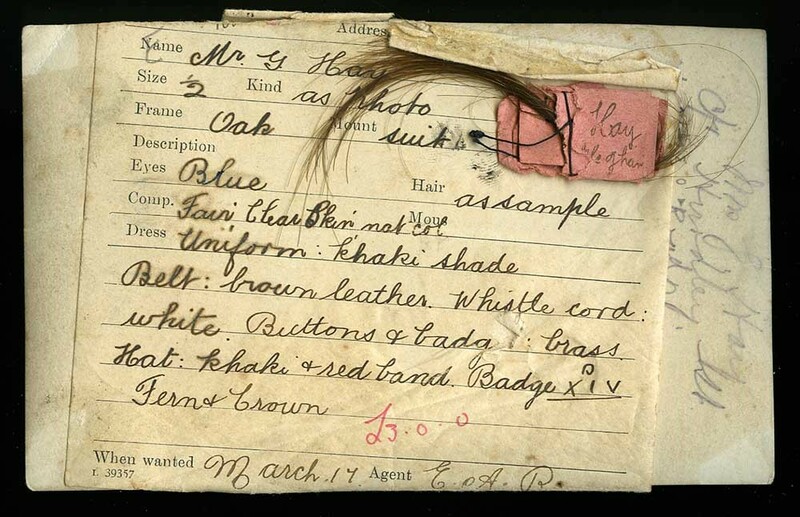 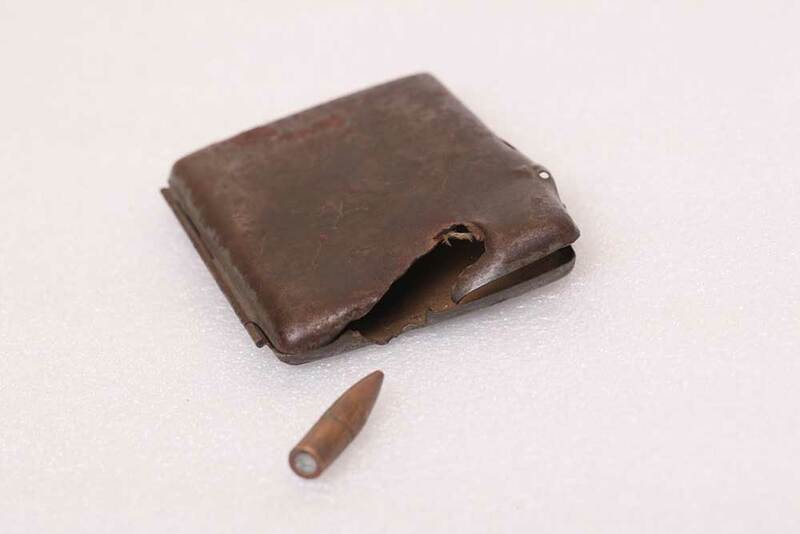 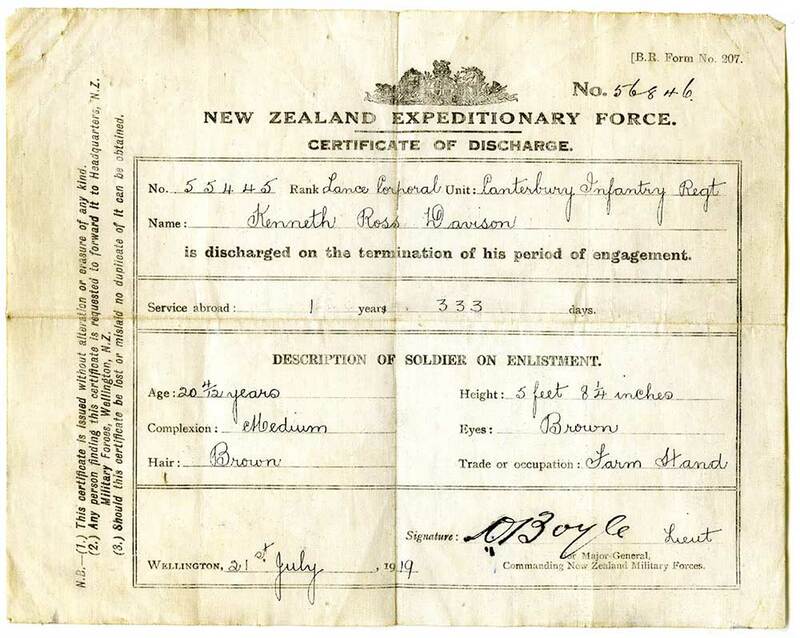 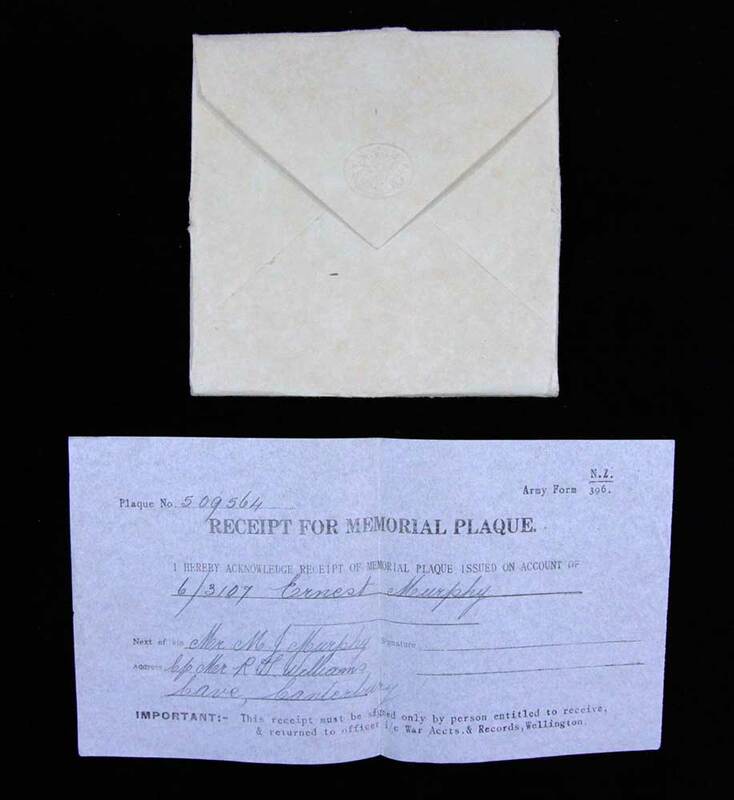 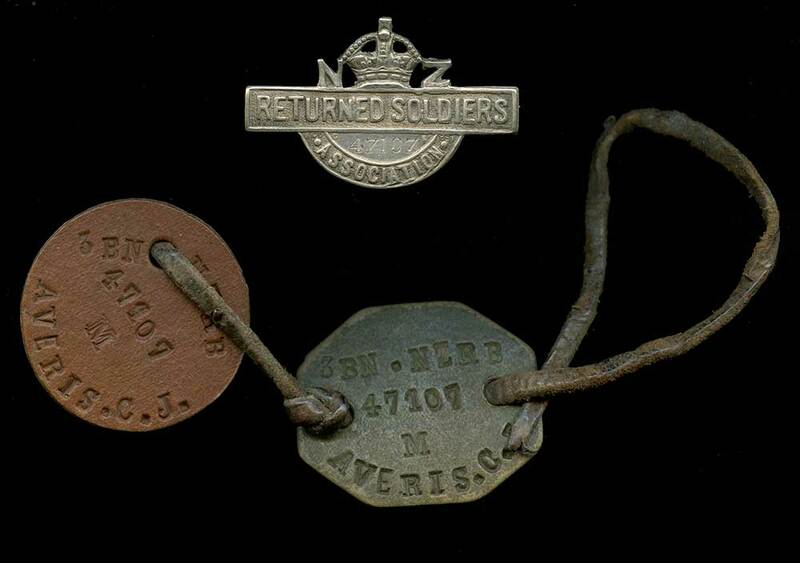 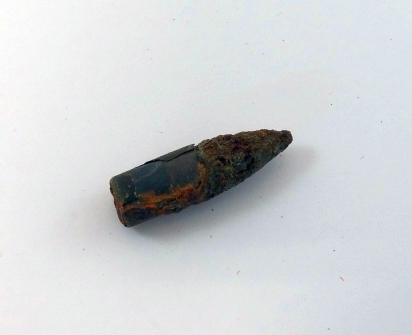 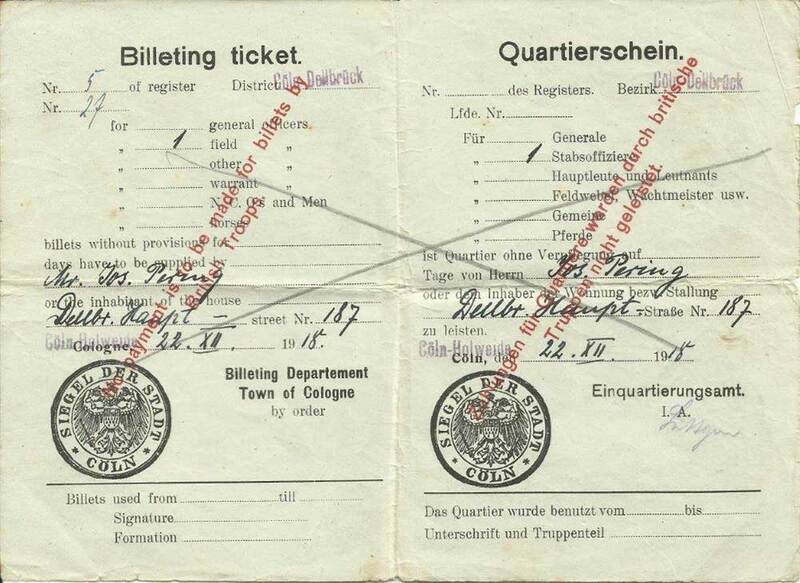 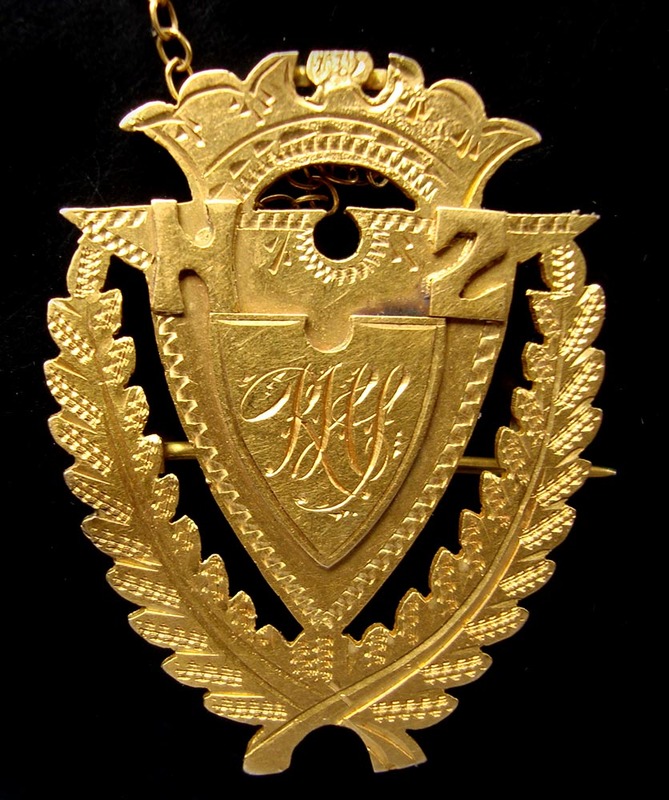 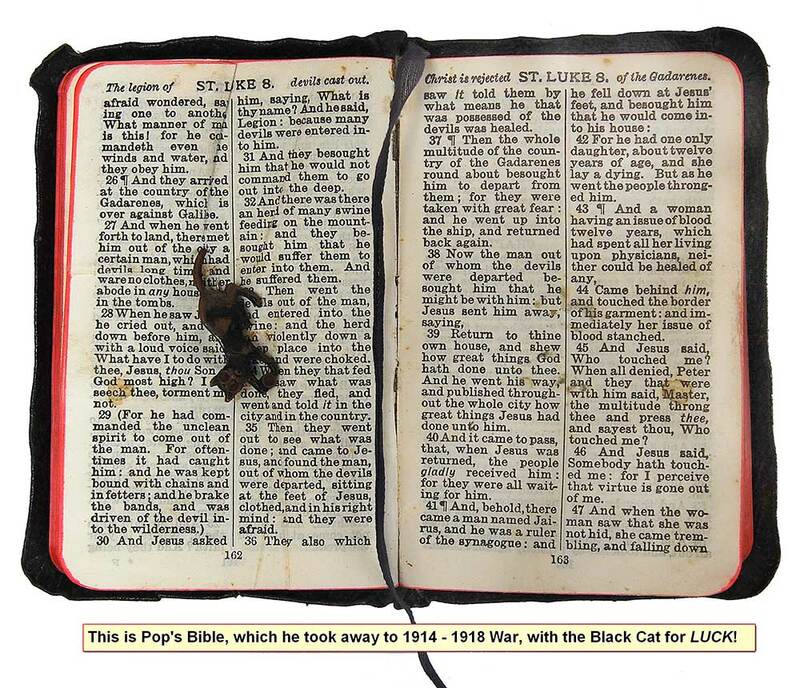 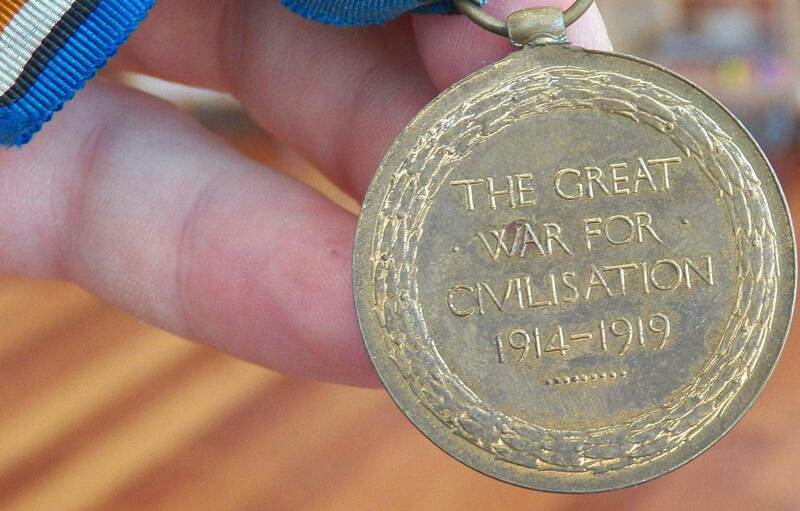 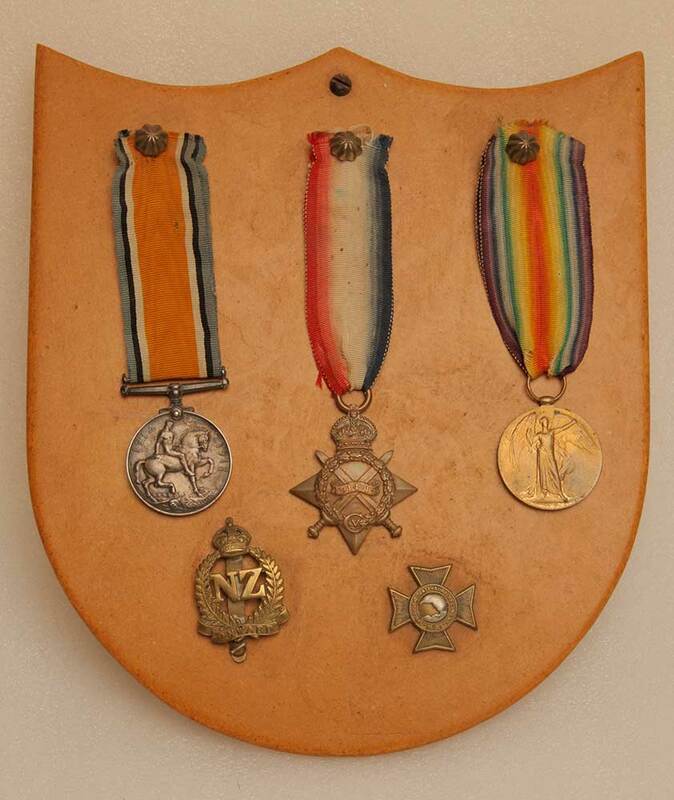 A keepsake collected by Jordan during his World War I experience and later. 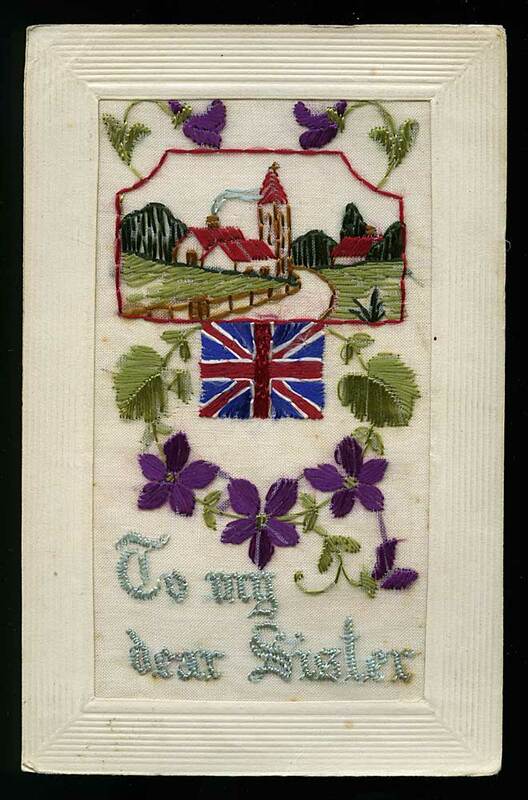 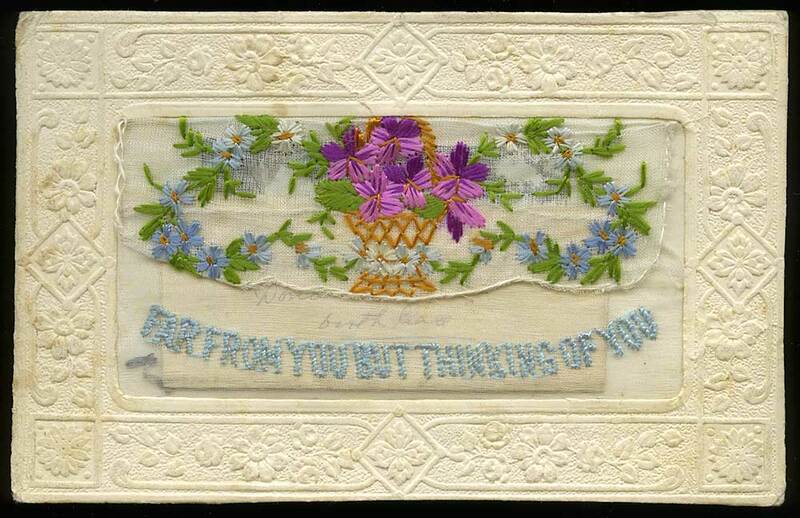 A silk embroidered postcard, bearing the message "Far from you but thinking of you", from Alister (Alex) Ross, serving in France, to his sister Belle Ross at Washdyke, Timaru, dated 11 August 1918. 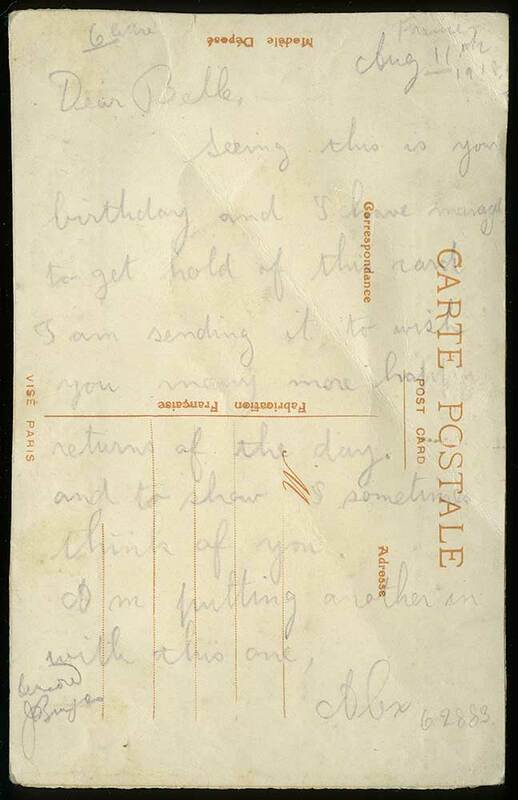 Alex sent the card to mark Belle's birthday. 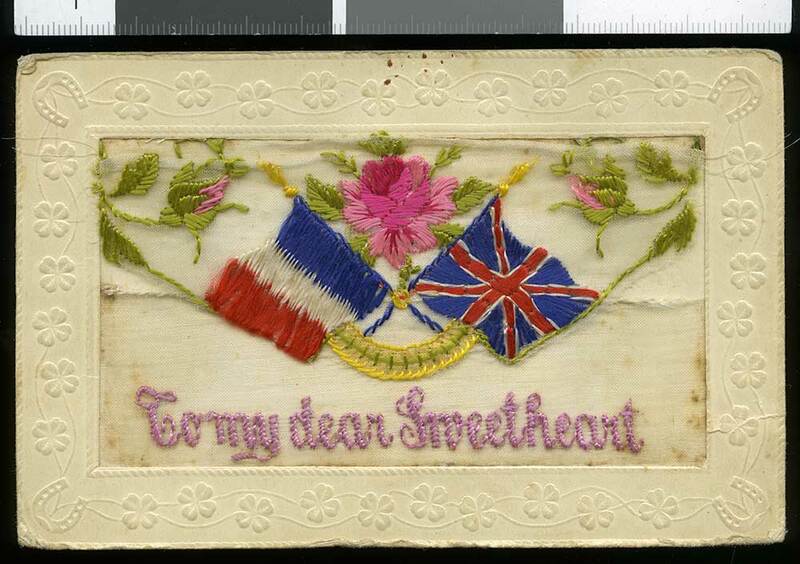 Included in the silk pocket at the front of the card was a small square of paper containing plant matter (heather flower?) 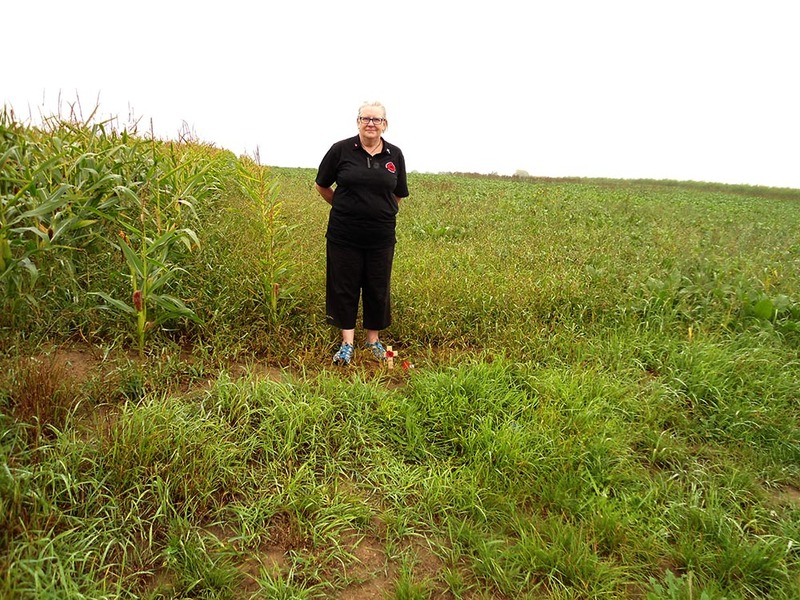 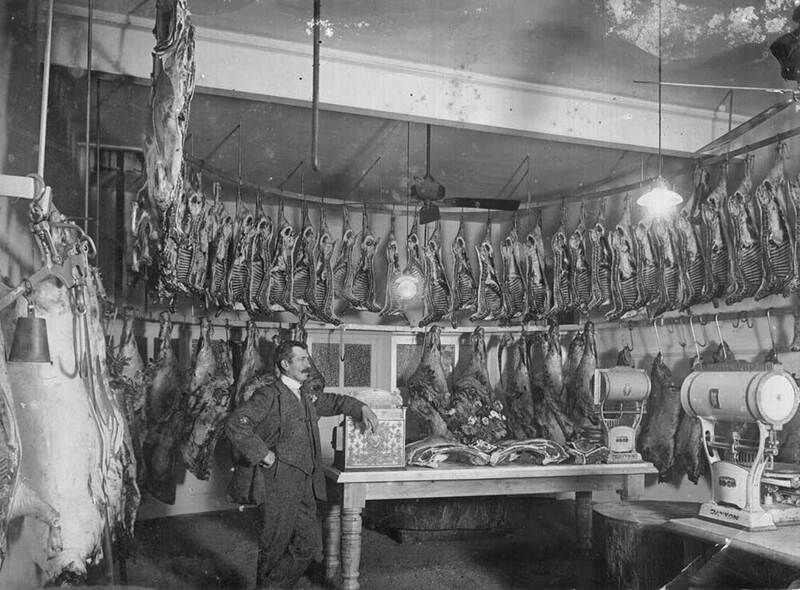 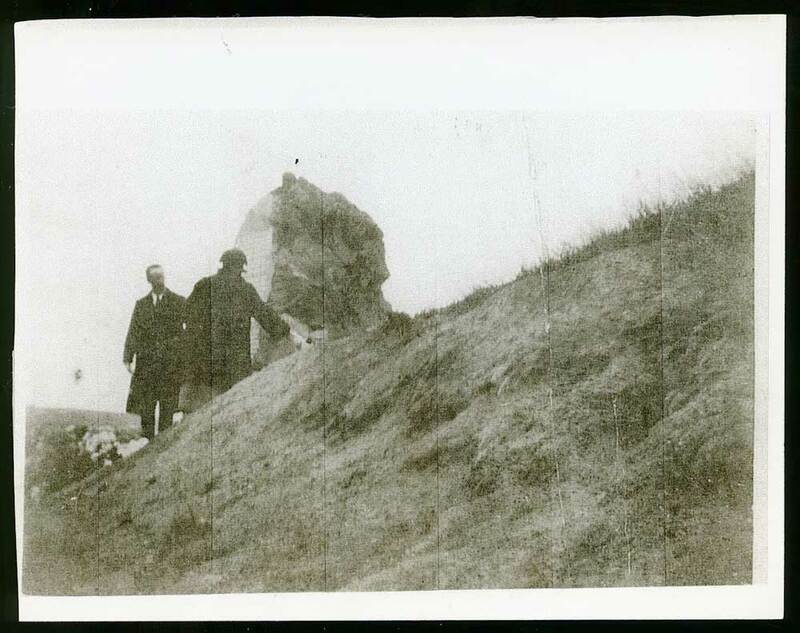 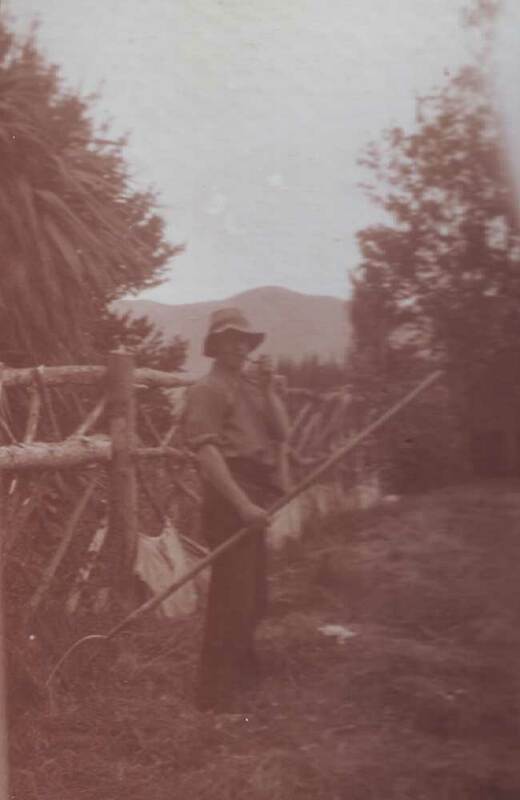 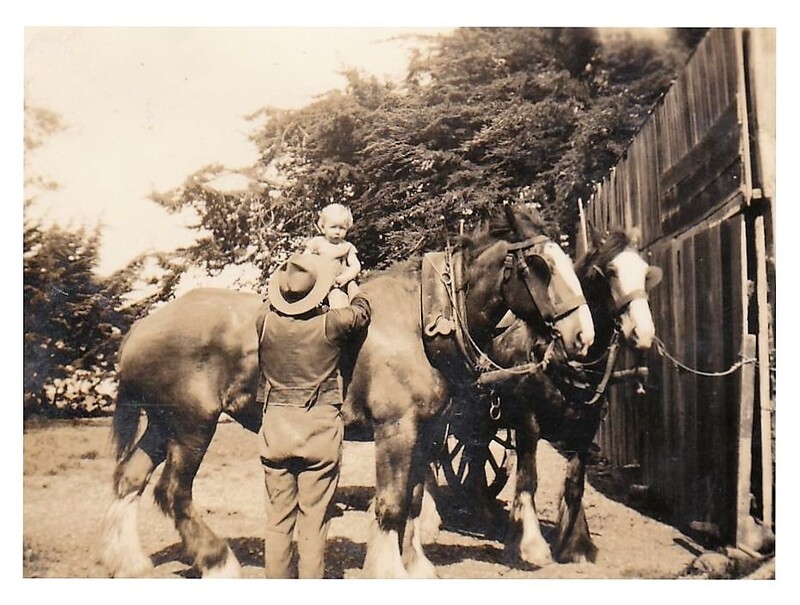 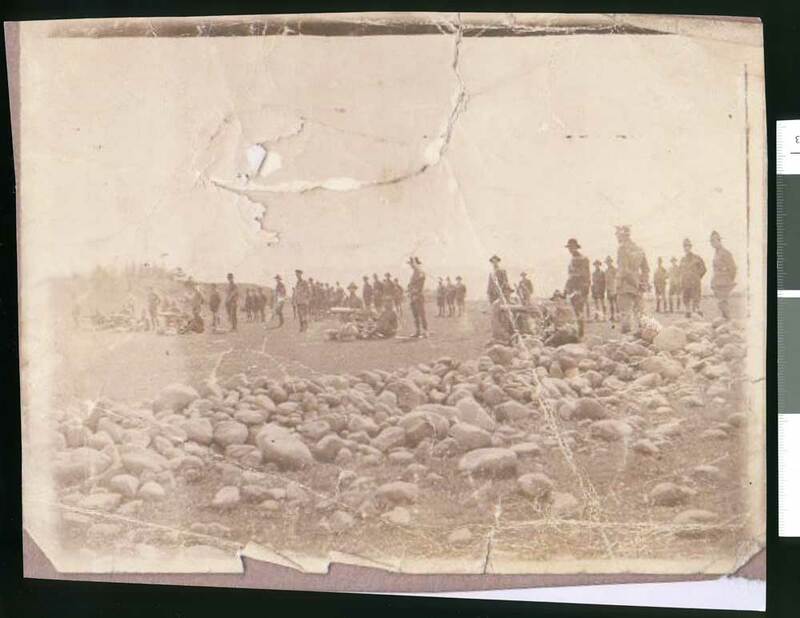 labelled "Gathered near Donald Ross's birth place". 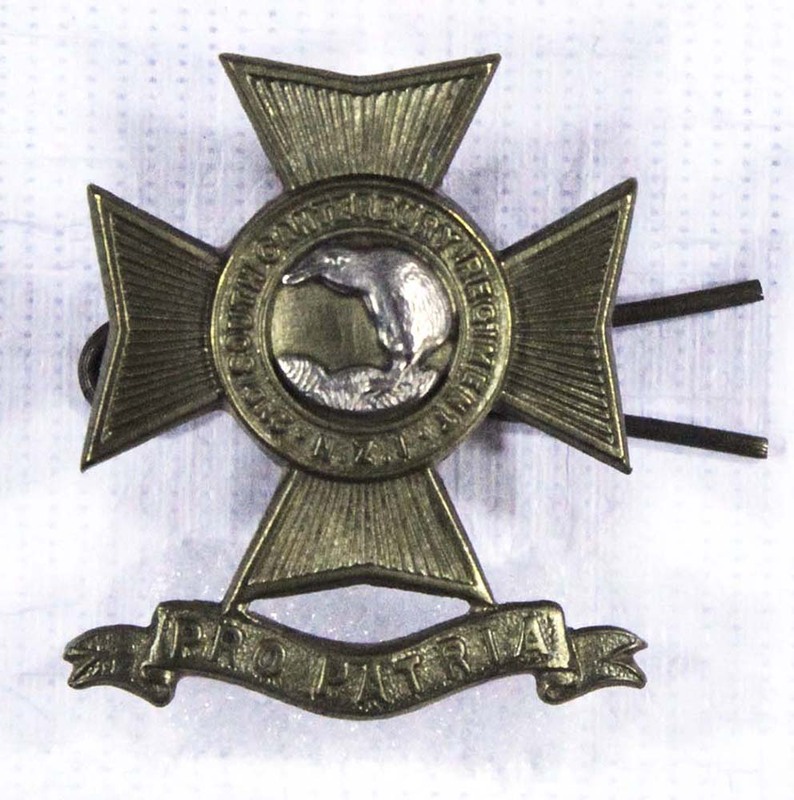 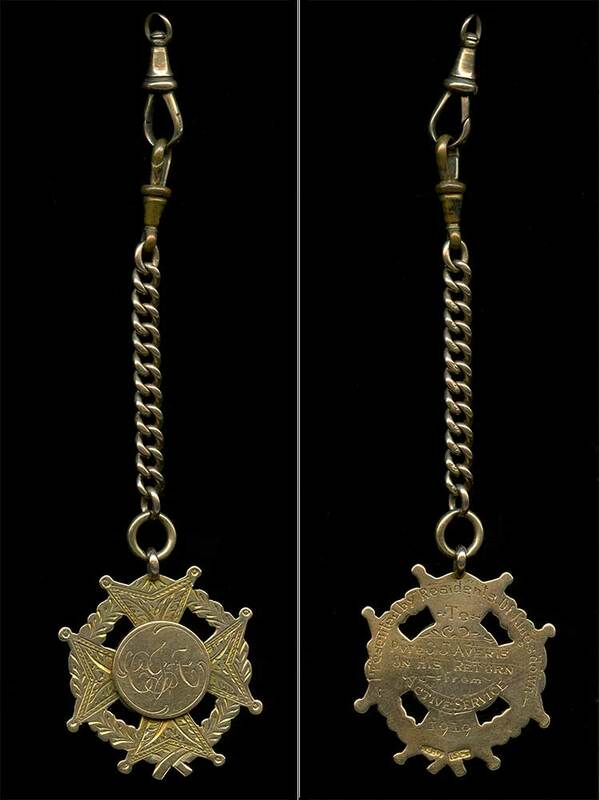 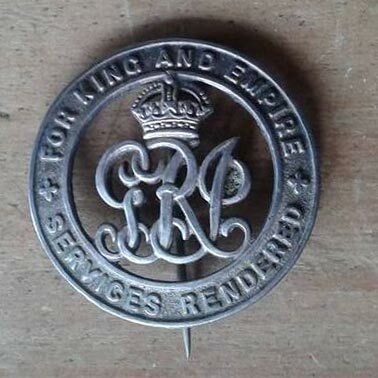 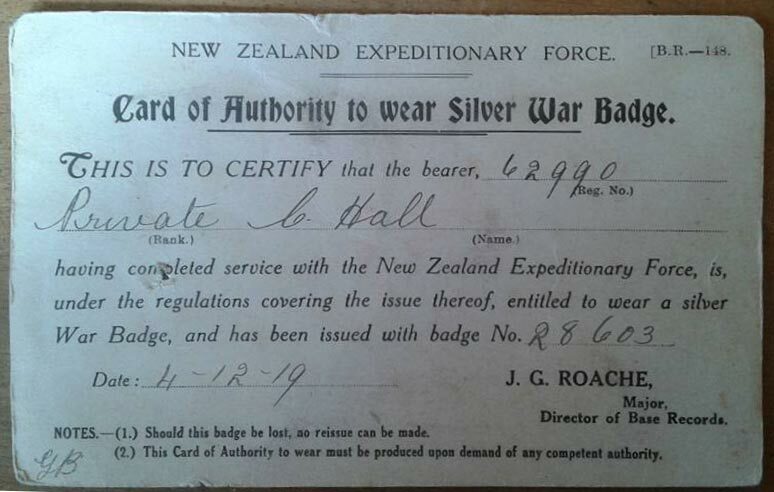 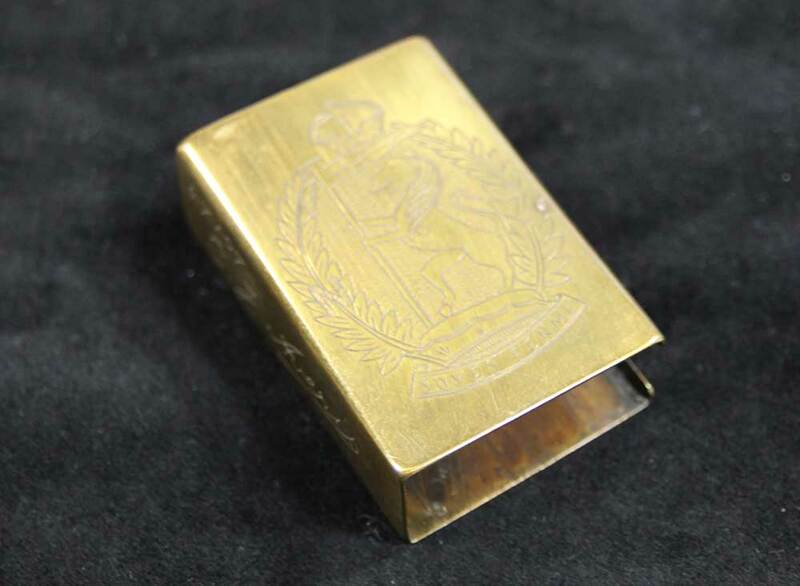 The Silver War badge, sometimes known as the Discharge Badge, Wound Badge or Services Rendered Badge, was first issued in the UK in September 1916. 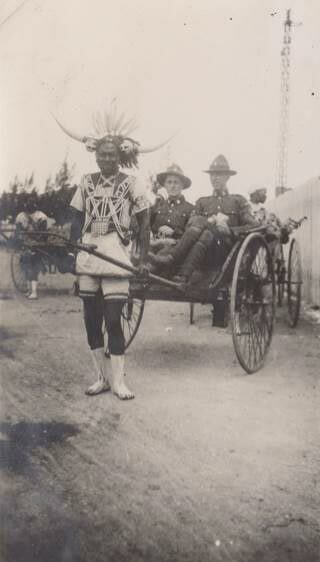 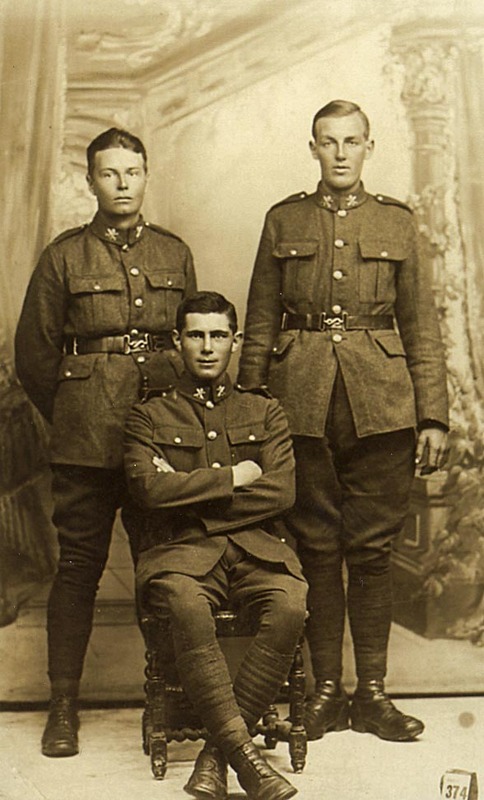 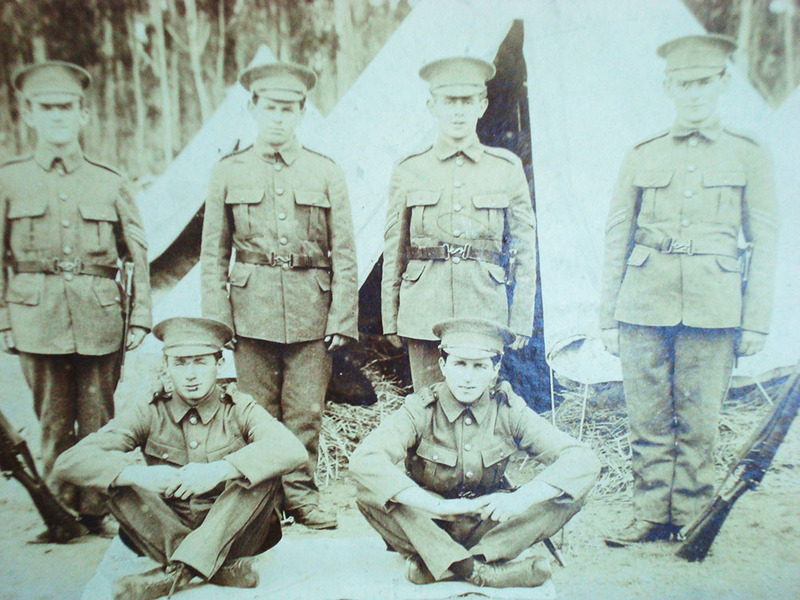 "Boys of the old brigade, Specialist Coy", during World War One, circa 1916 to 1919. 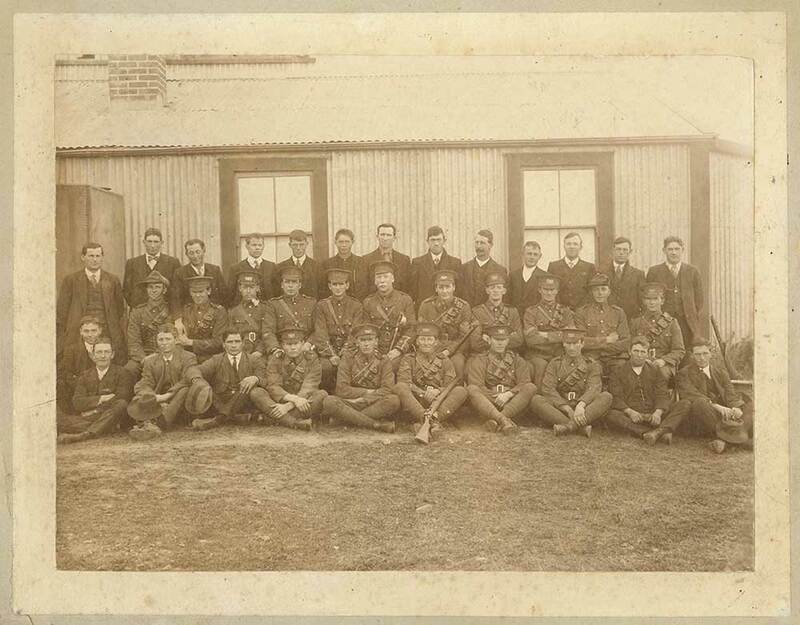 Presumably the group are pictured encamped, possibly during training (note the number of closely shaved heads). 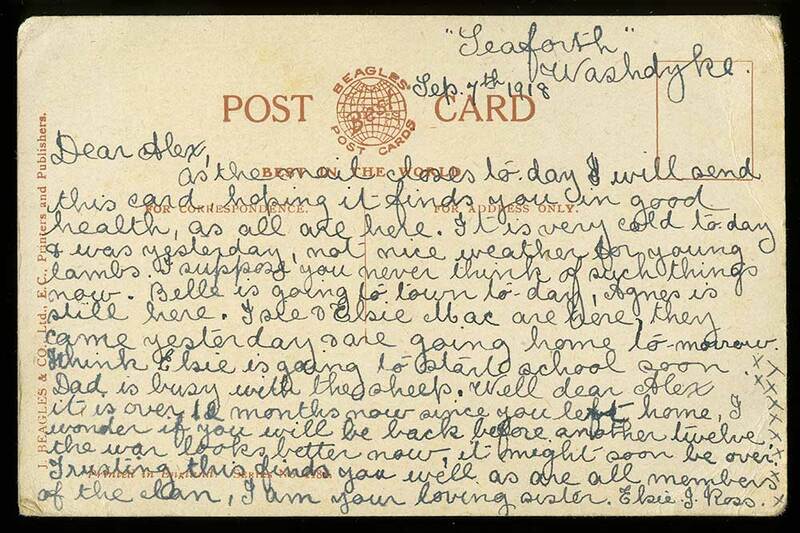 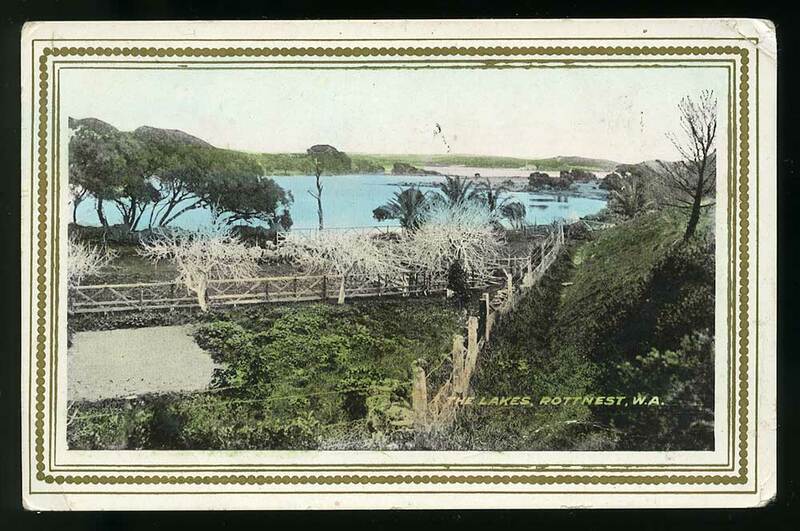 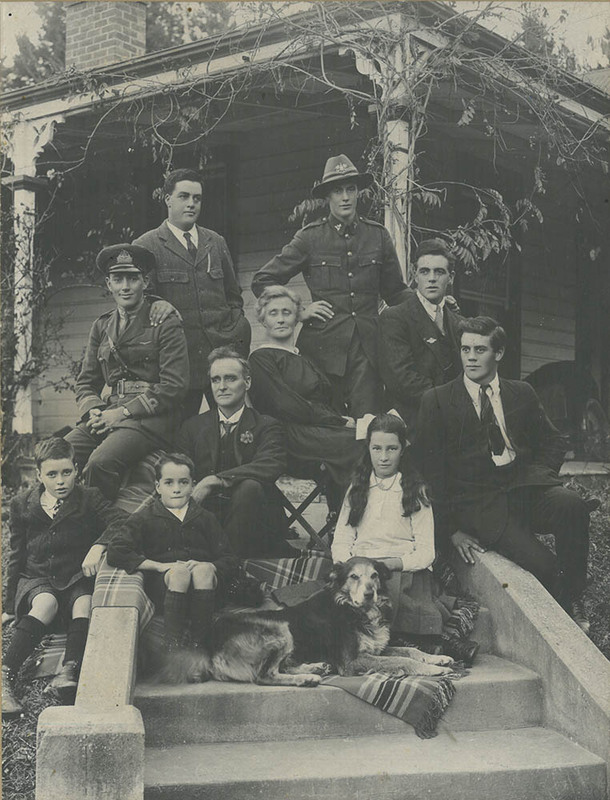 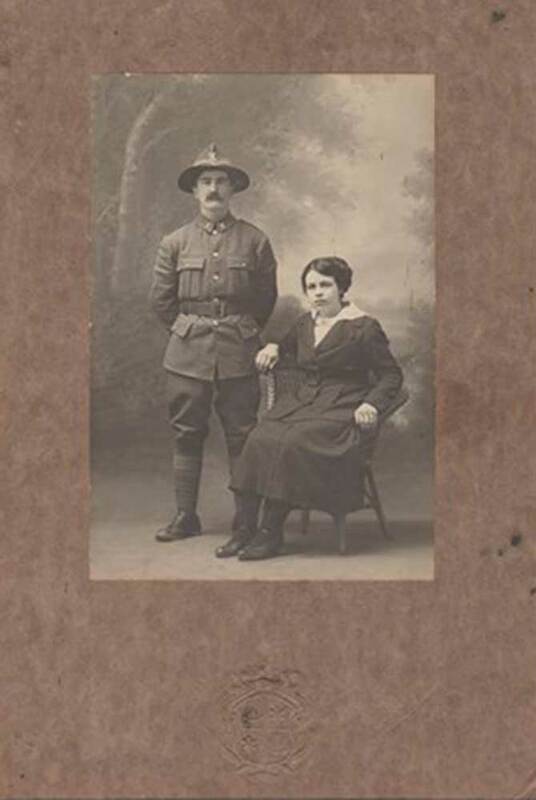 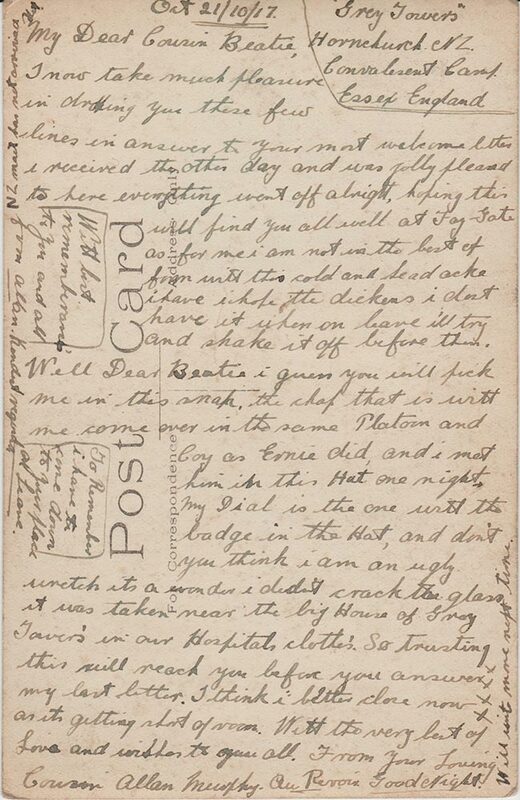 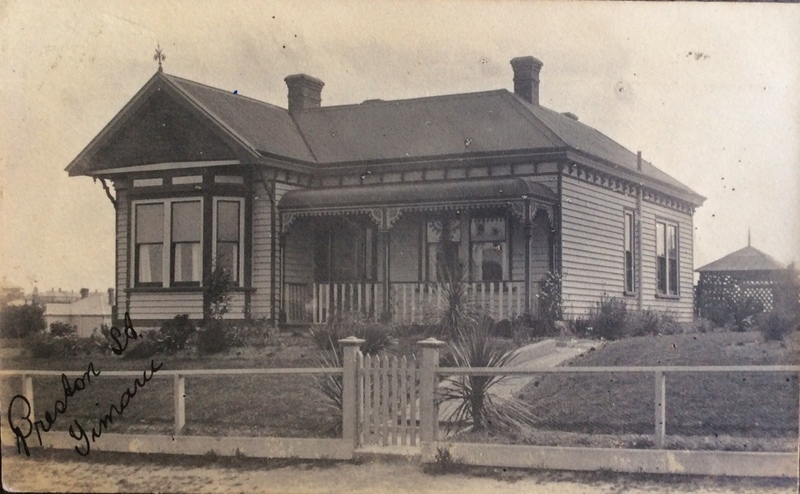 Pictorial postcard, "Greetings from hearth & home", from Belle Ross of 'Seaforth' at Washdyke, Timaru, to her brother Alister (Alex) Ross, serving on the western front, dated 1 September 1918. 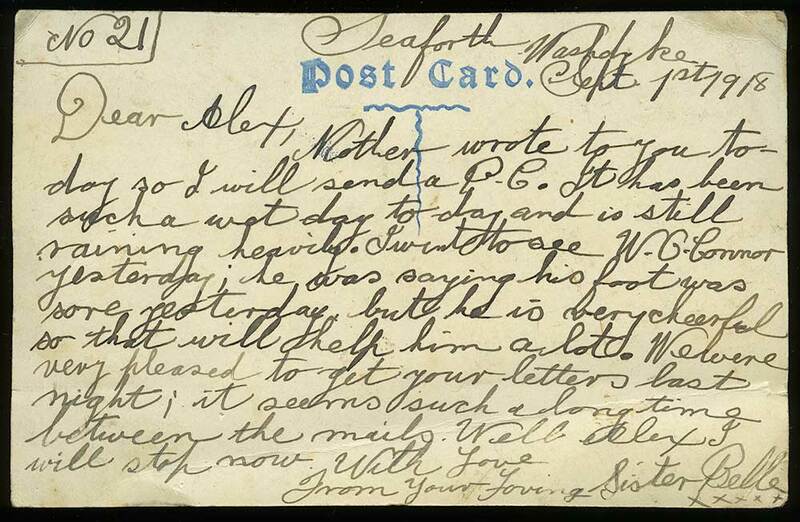 Belle mentions that her mother had also written and commented on the wet weather (at Washdyke) and the amount of time since last receiving a letter from Alex. 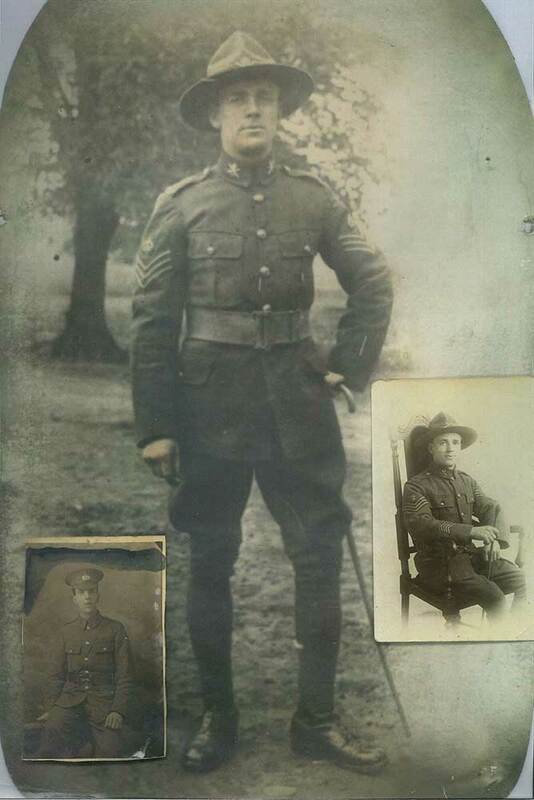 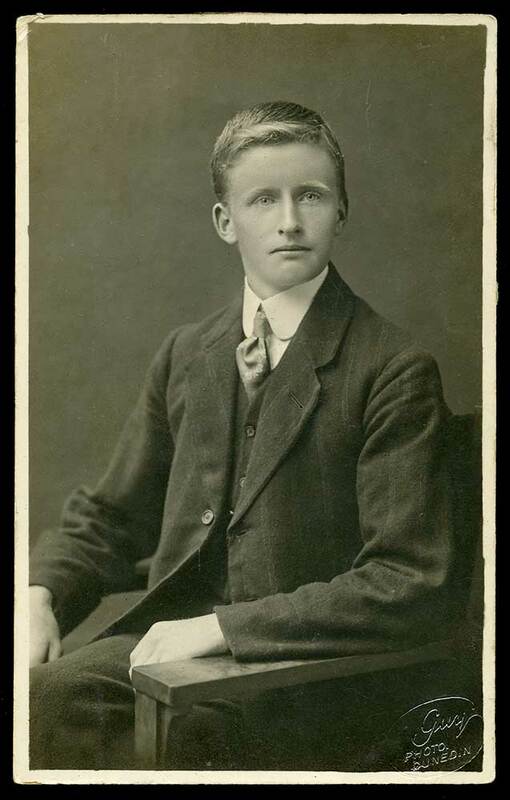 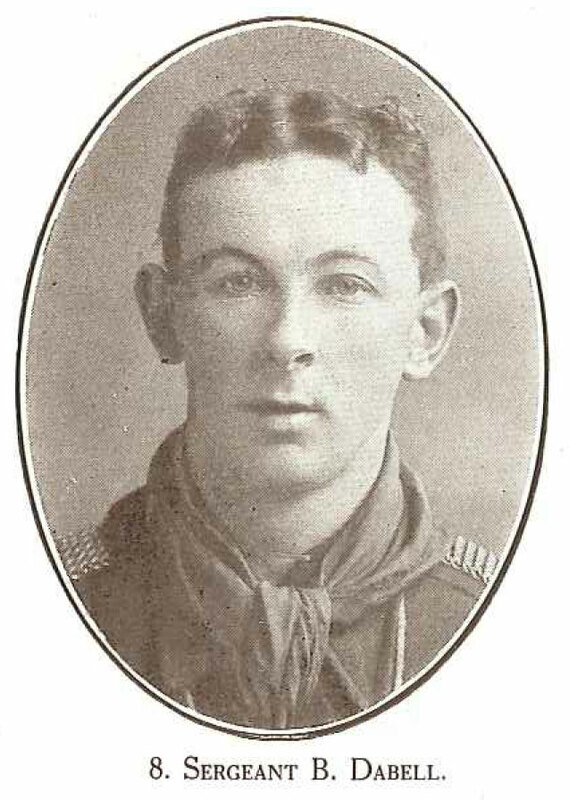 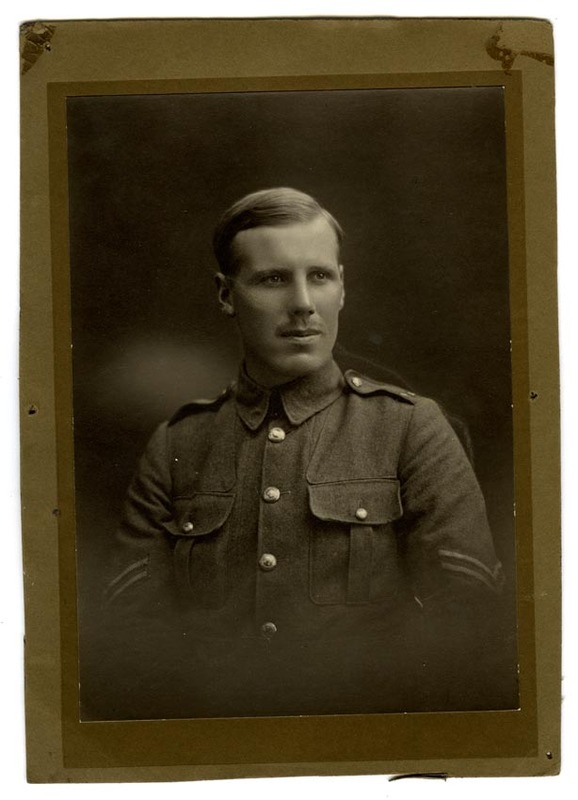 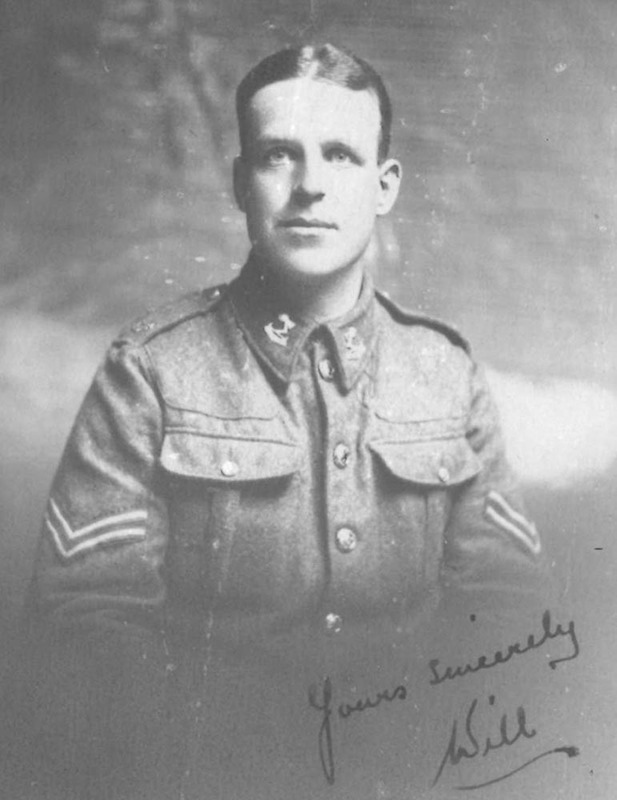 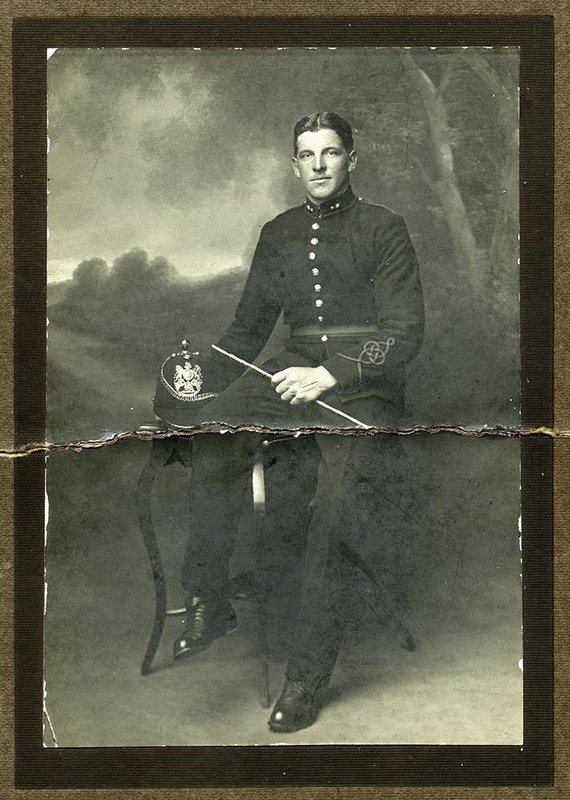 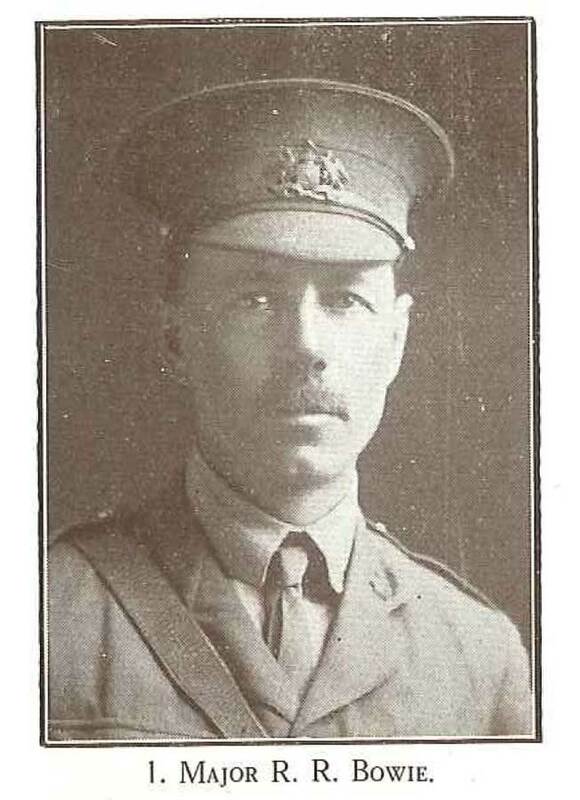 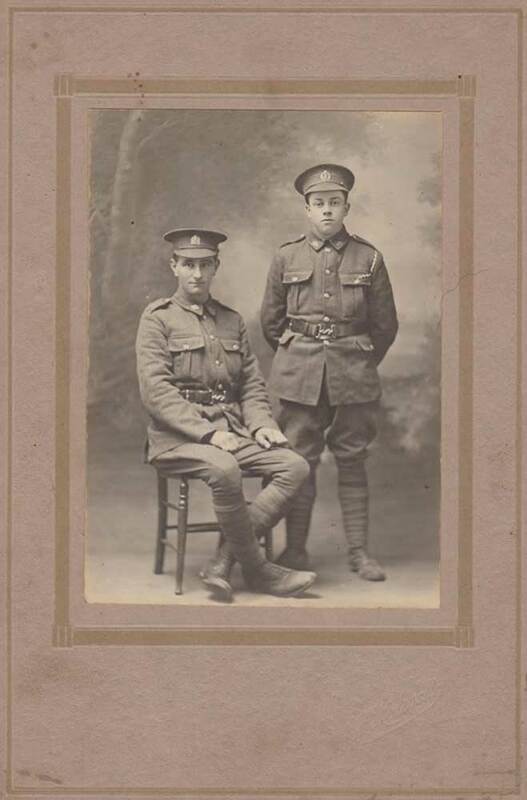 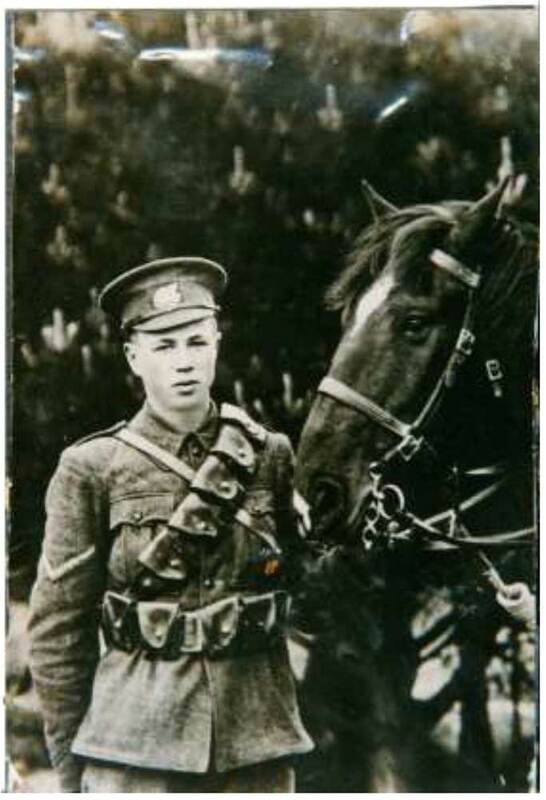 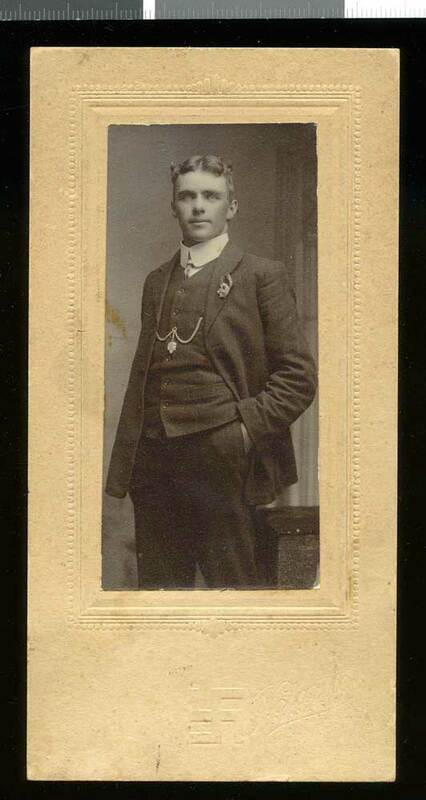 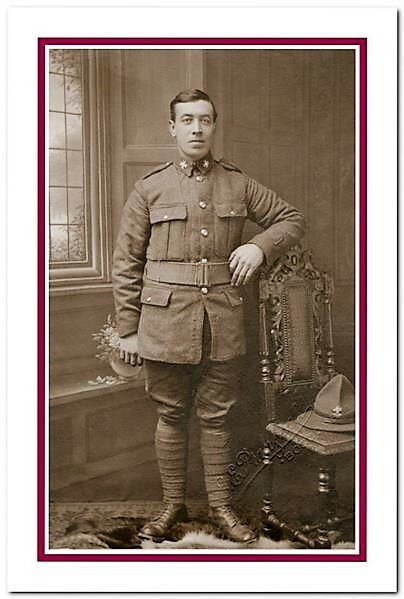 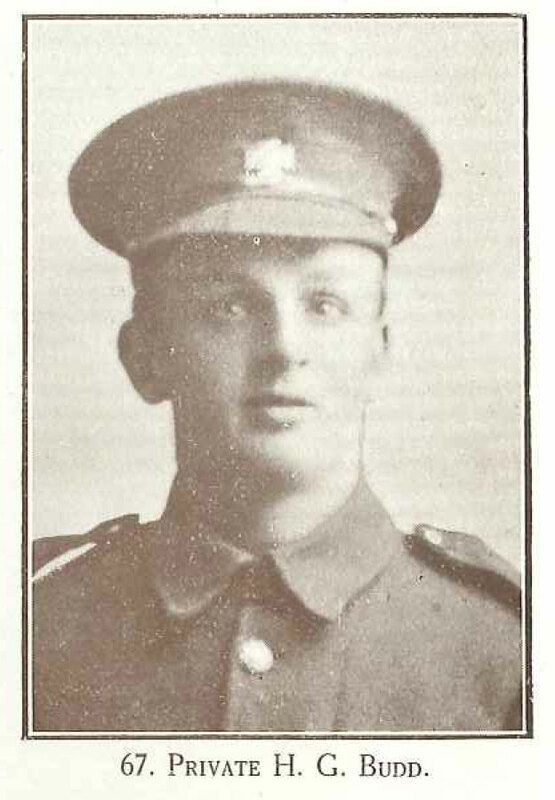 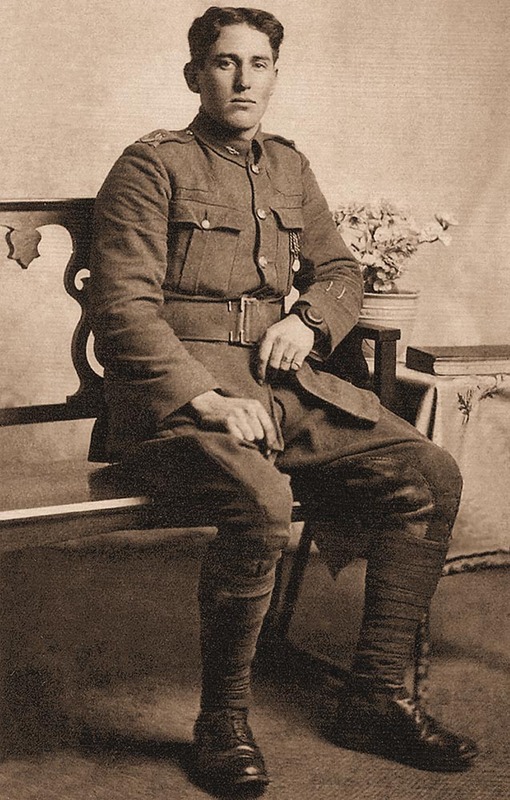 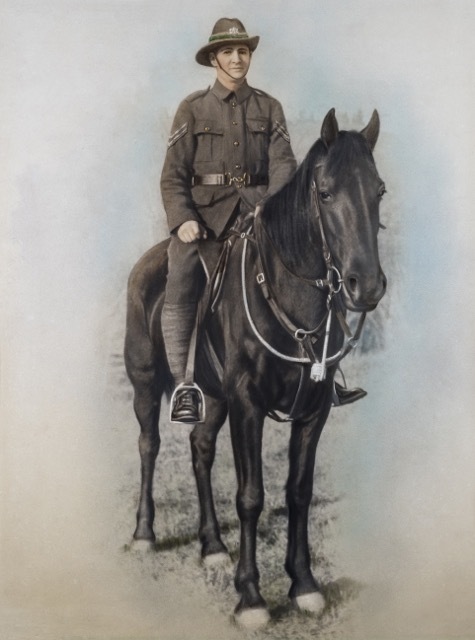 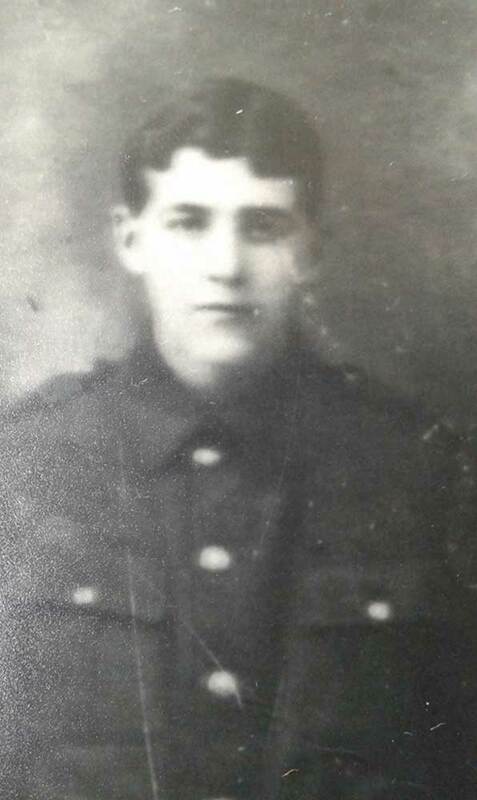 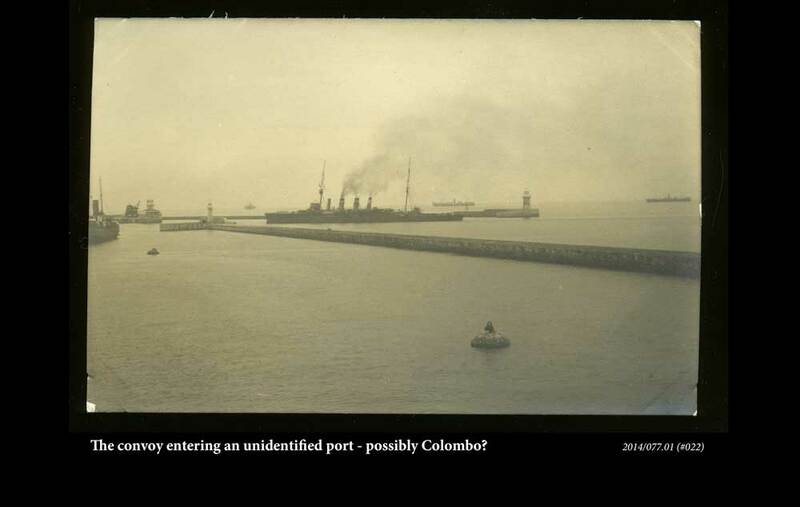 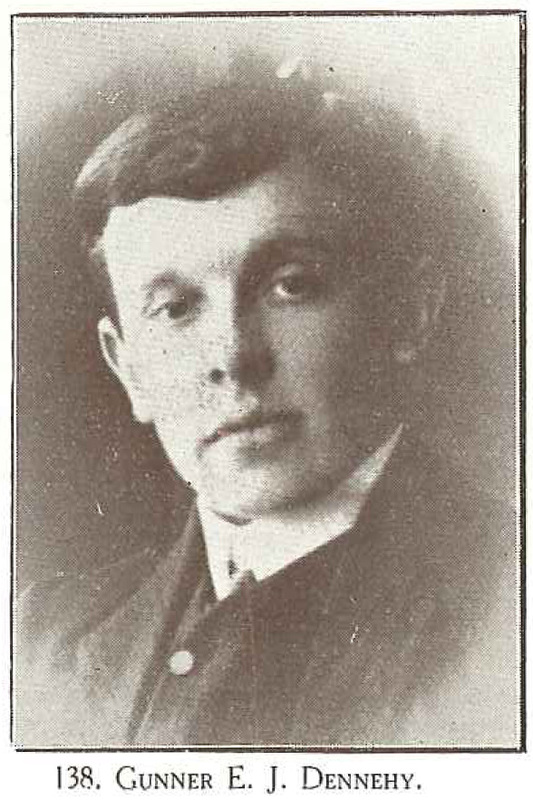 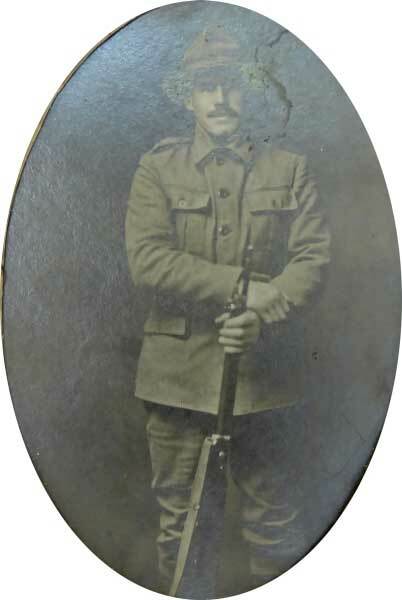 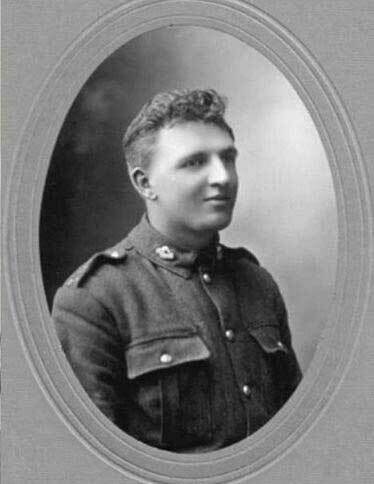 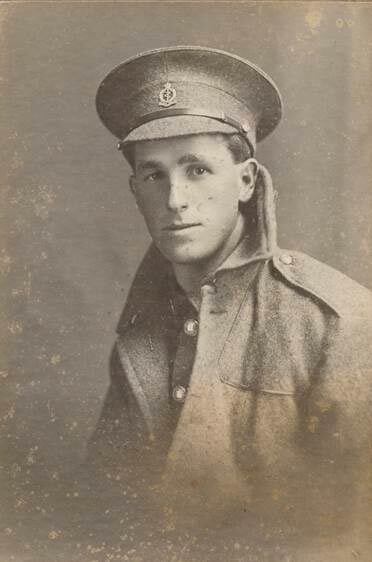 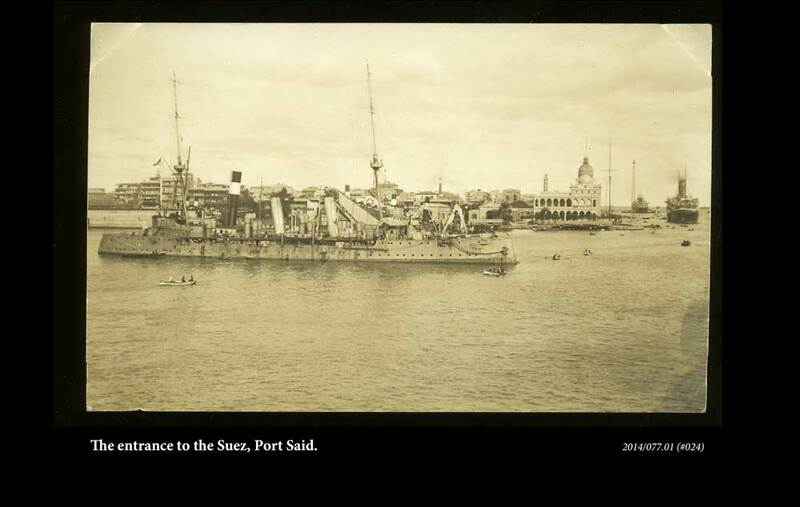 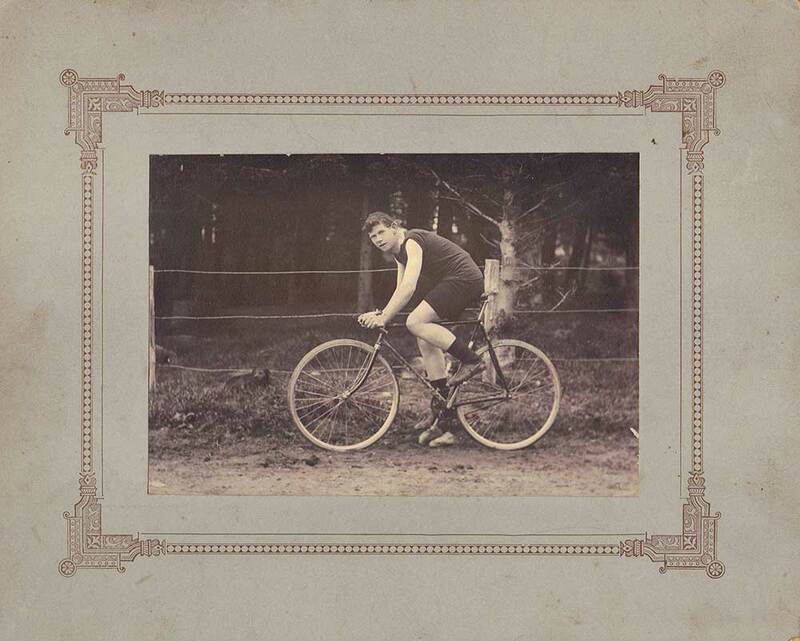 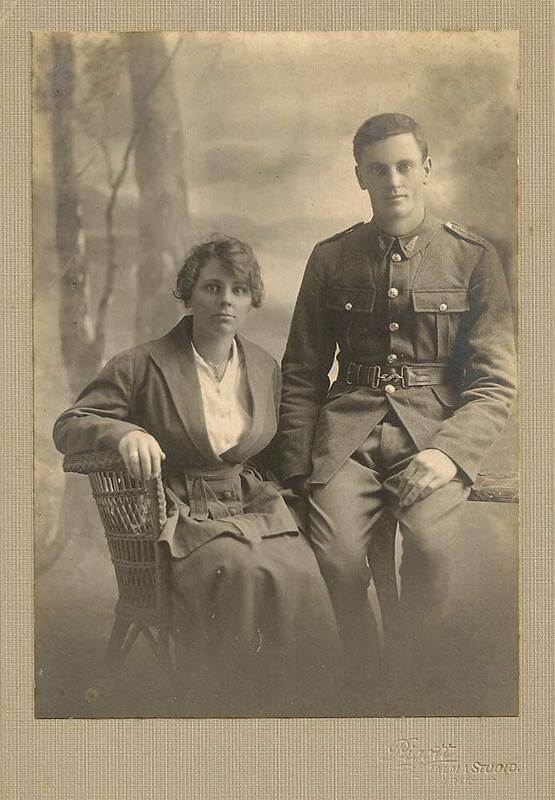 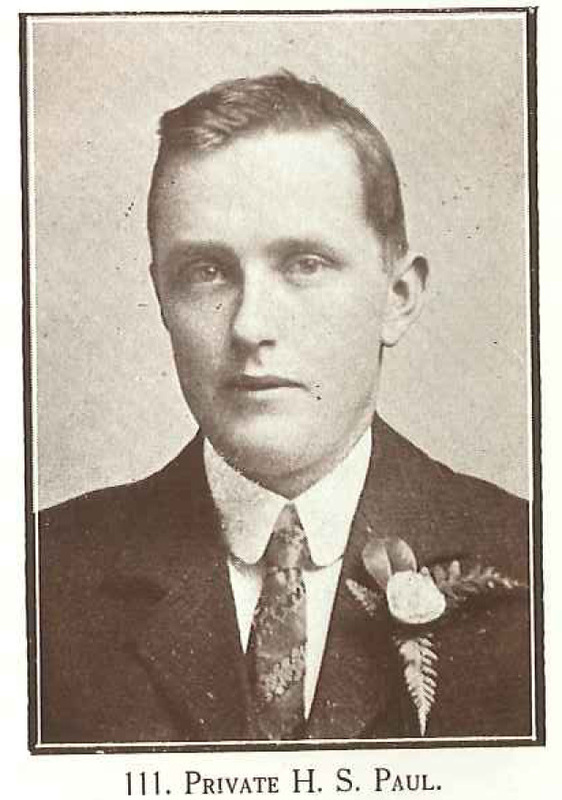 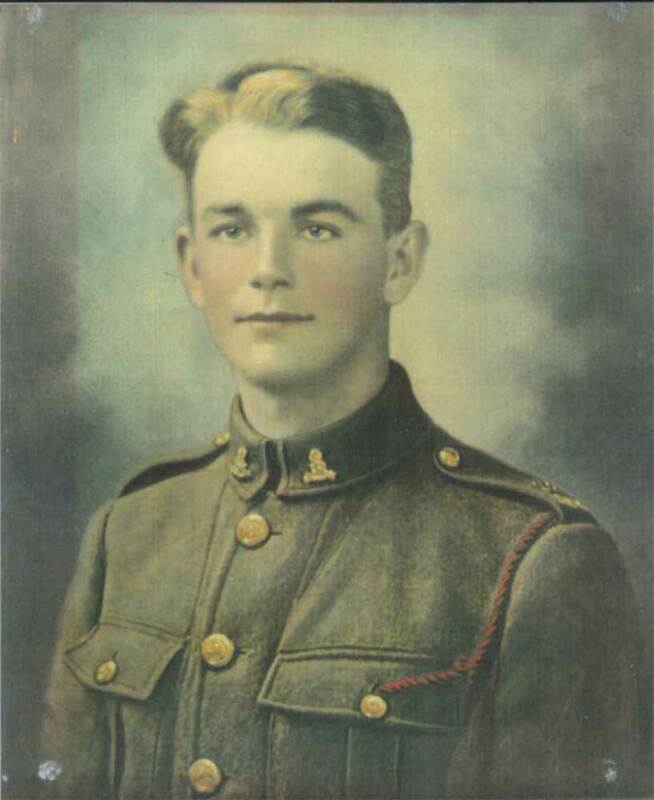 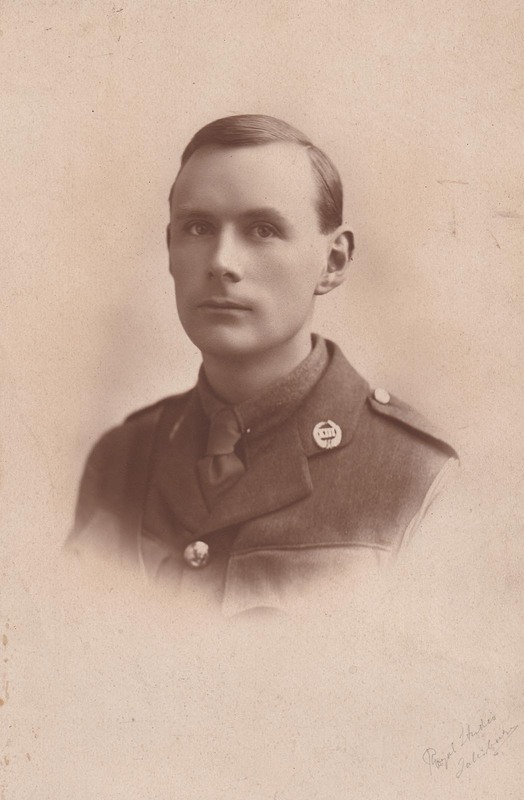 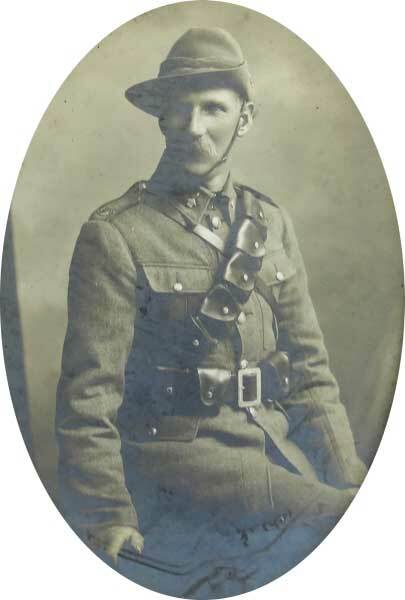 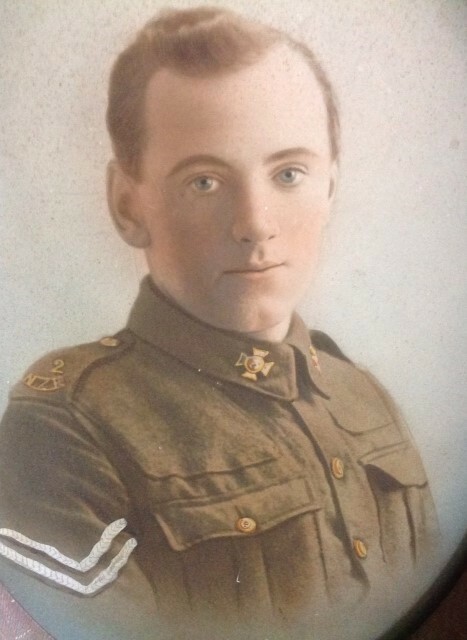 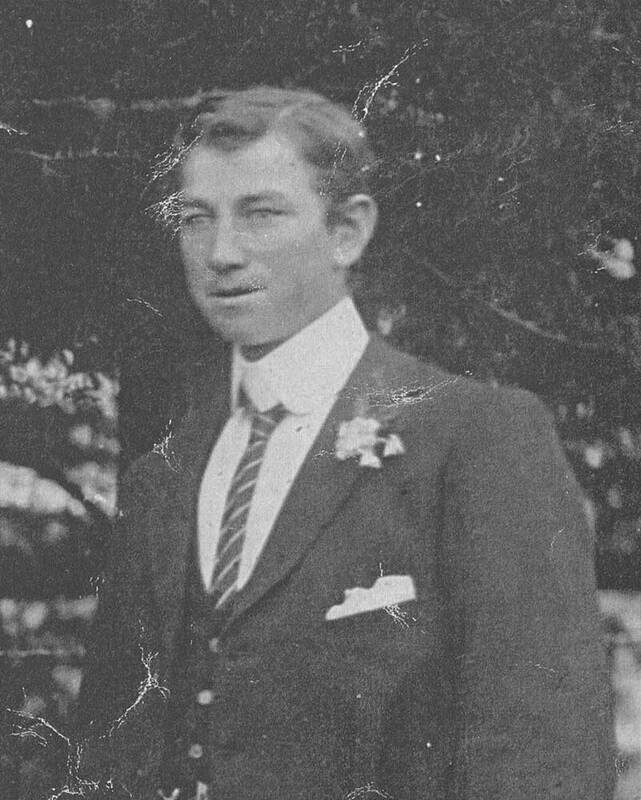 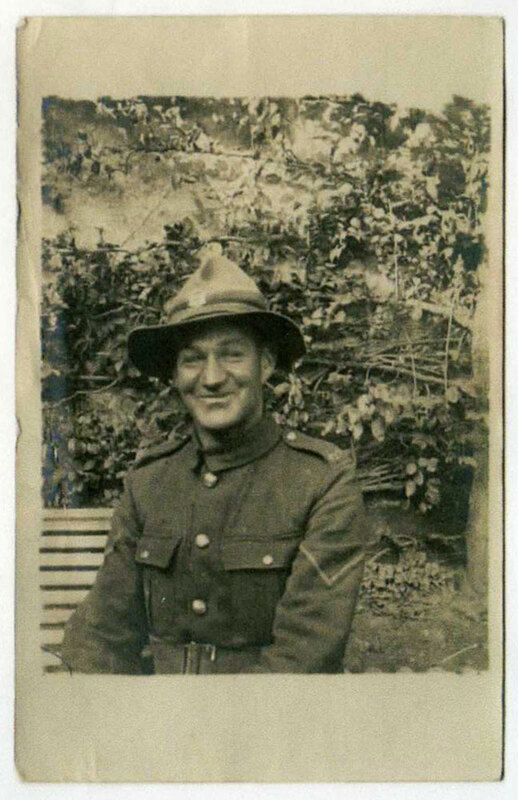 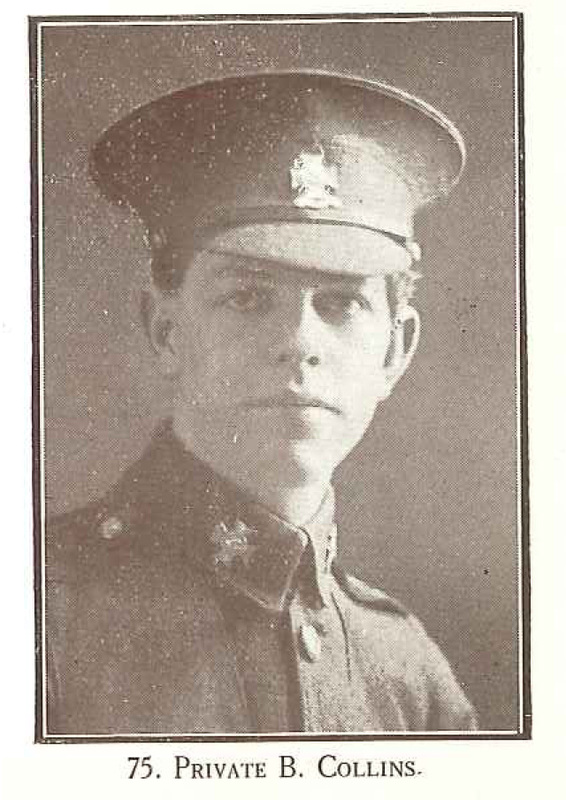 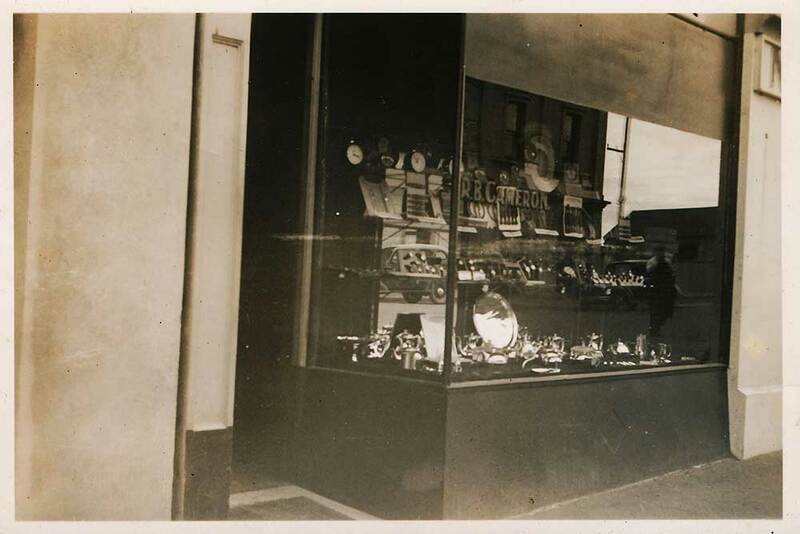 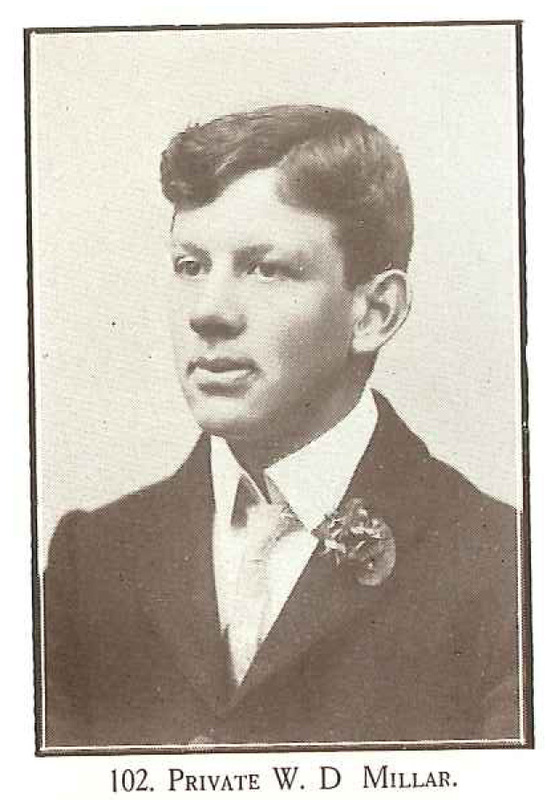 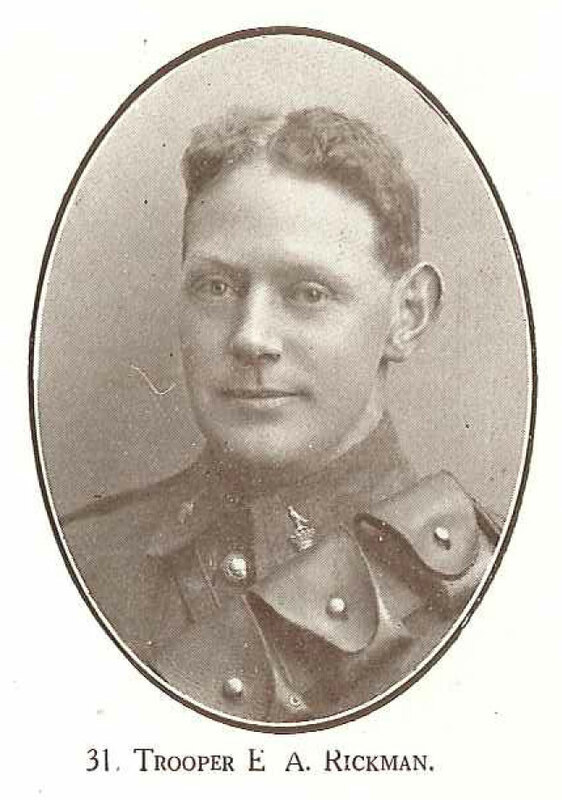 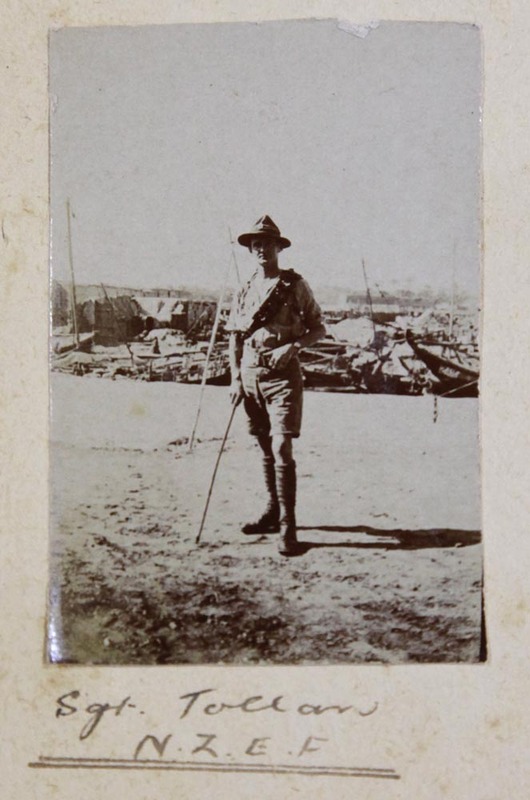 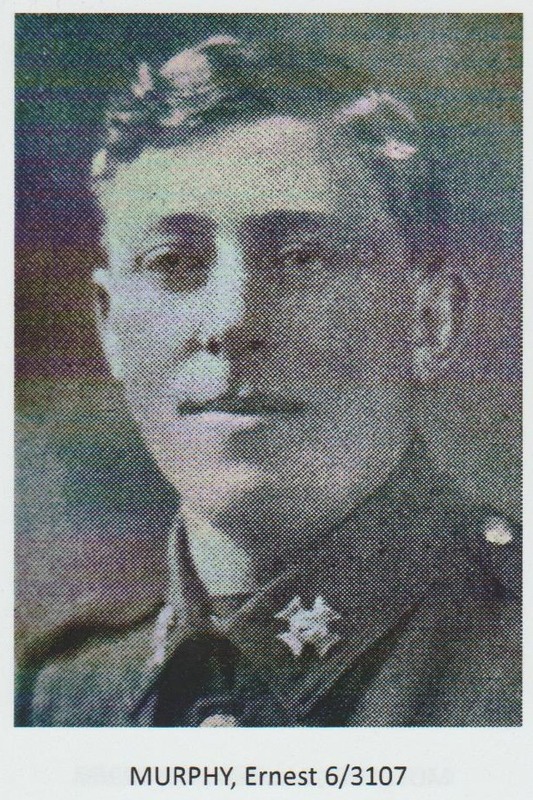 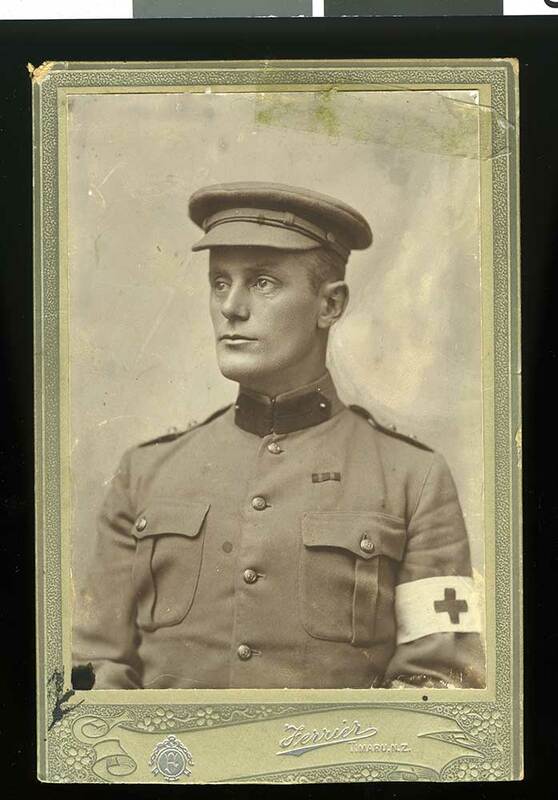 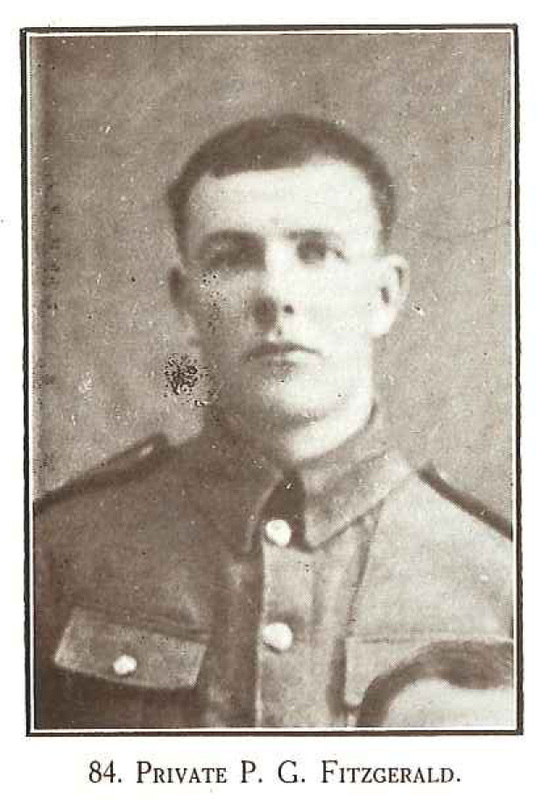 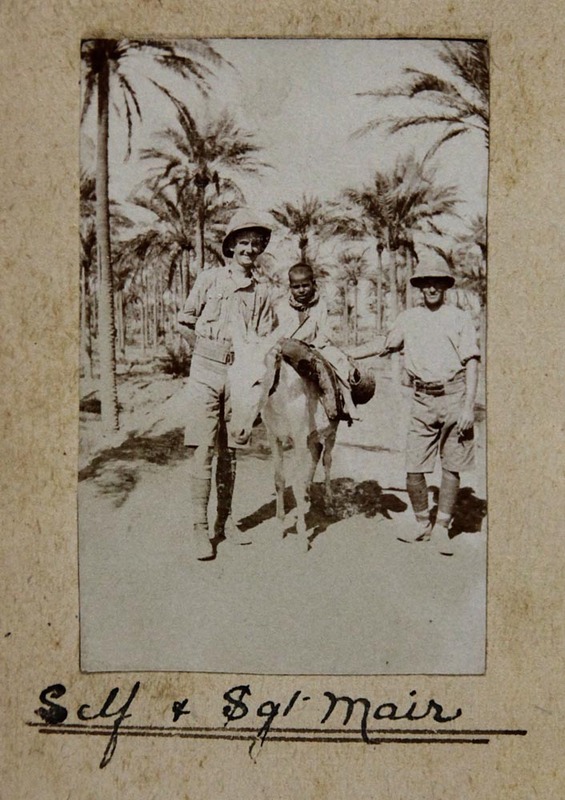 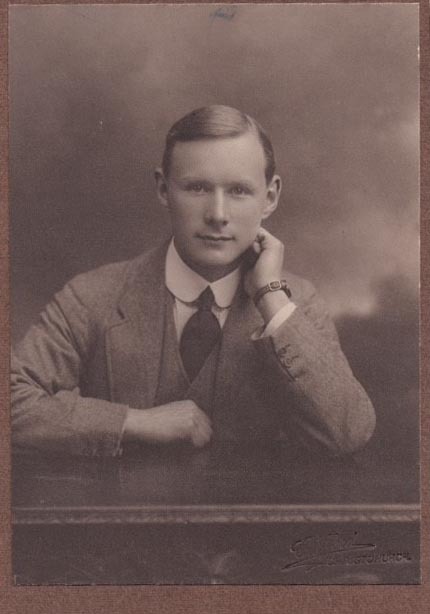 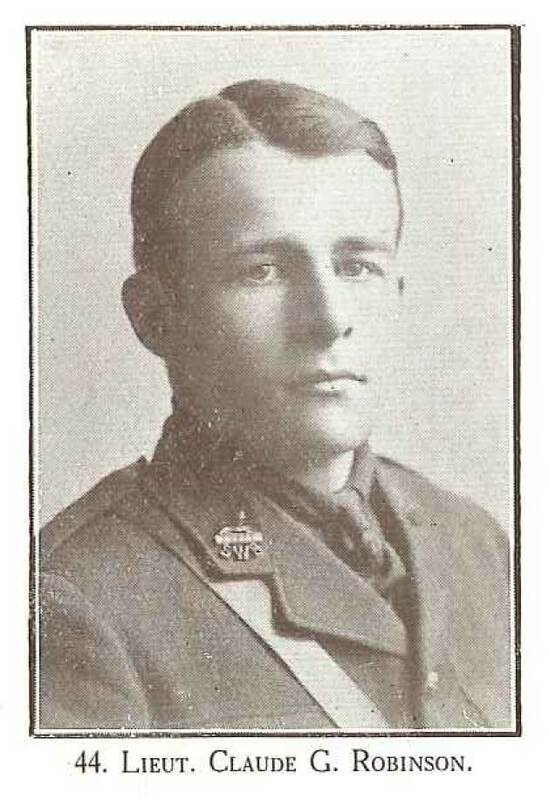 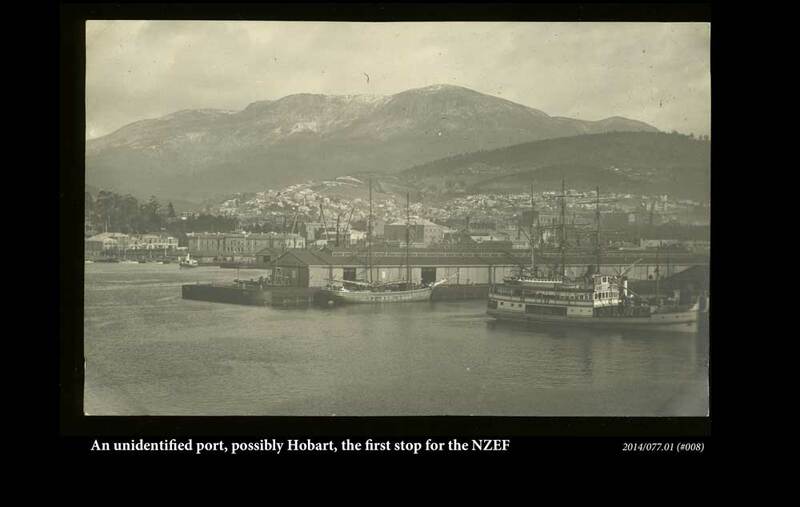 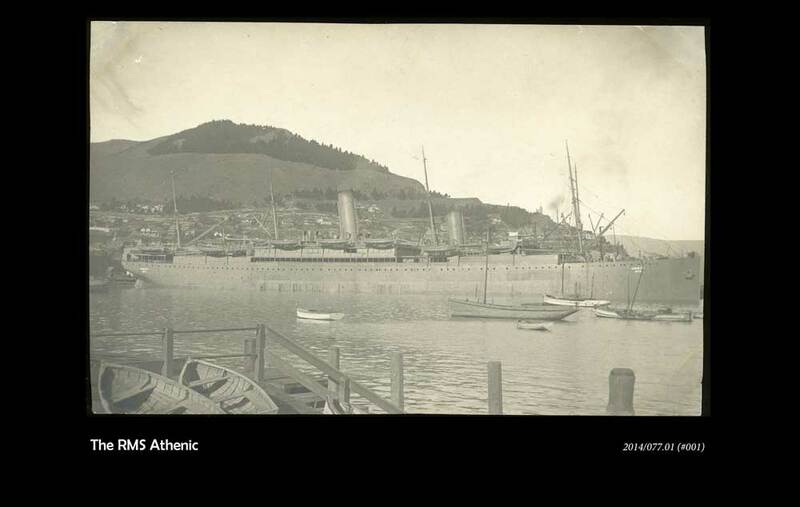 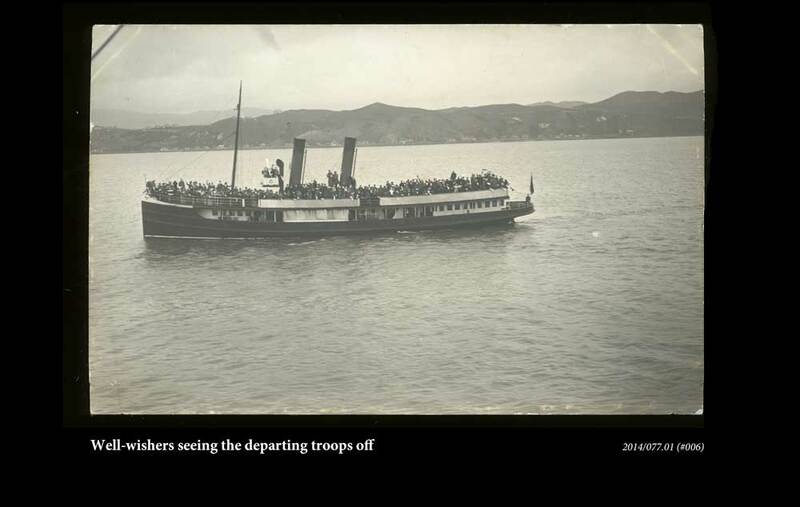 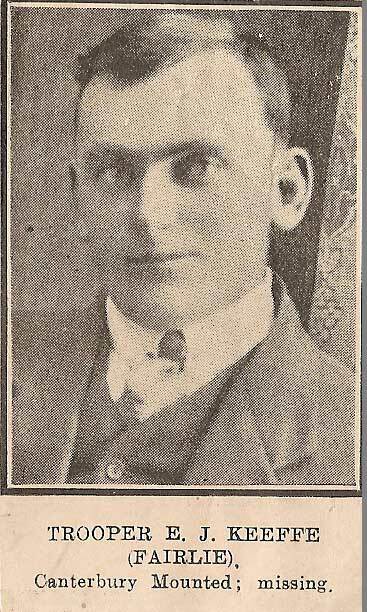 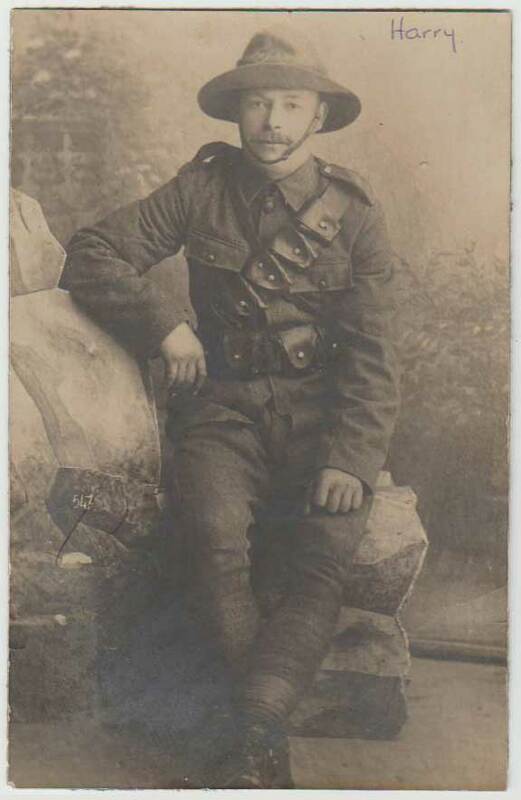 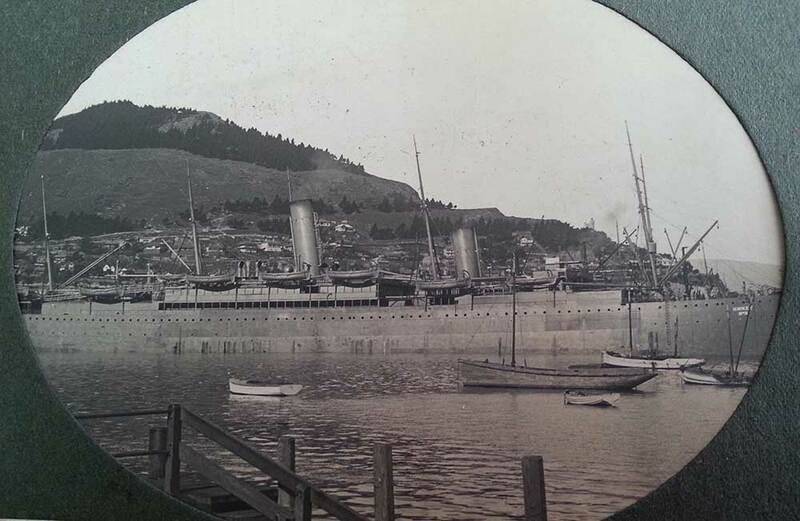 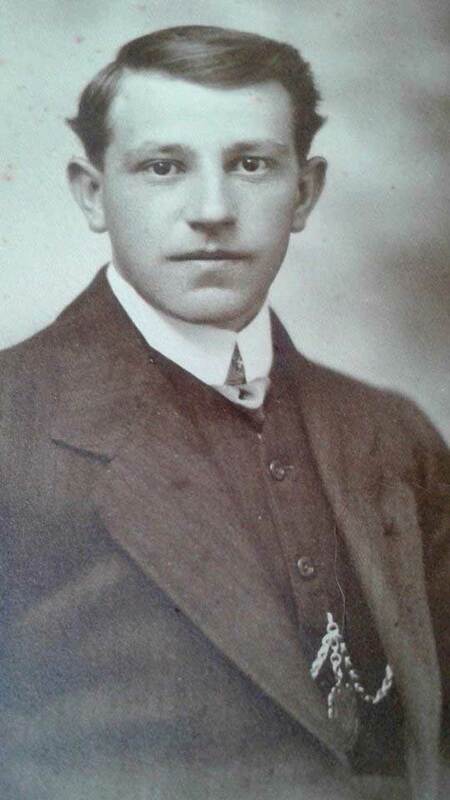 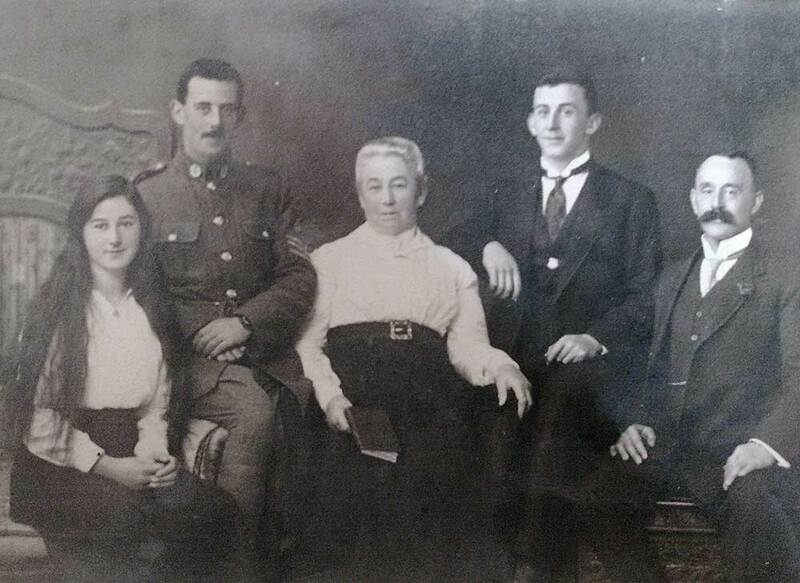 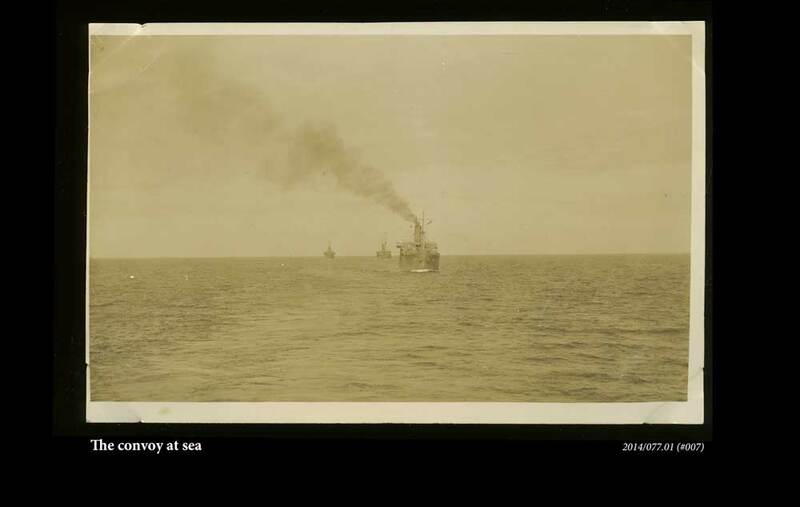 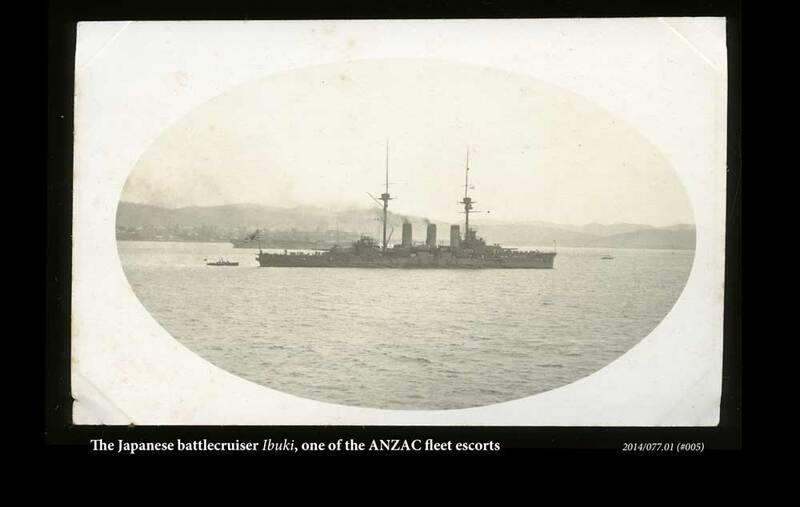 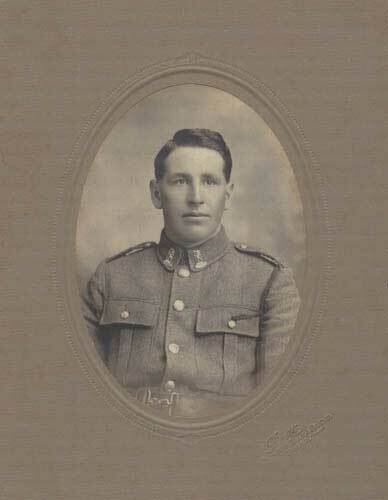 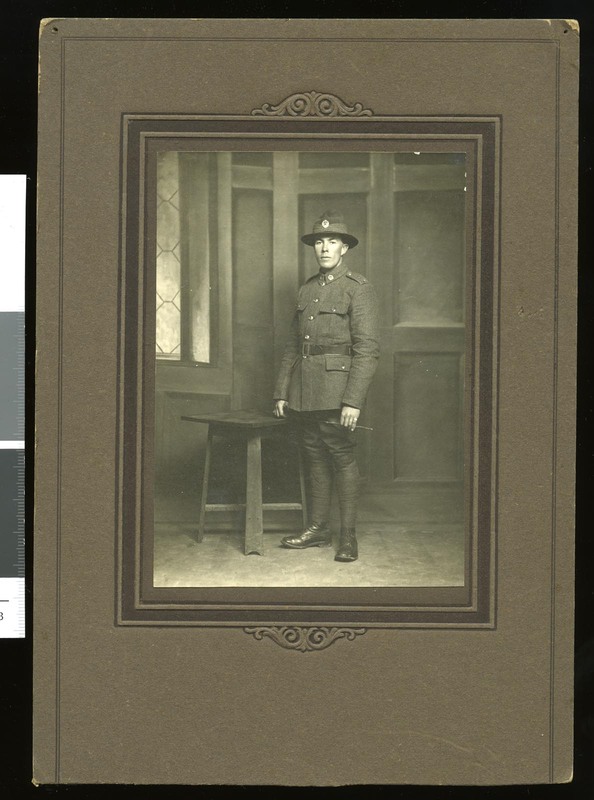 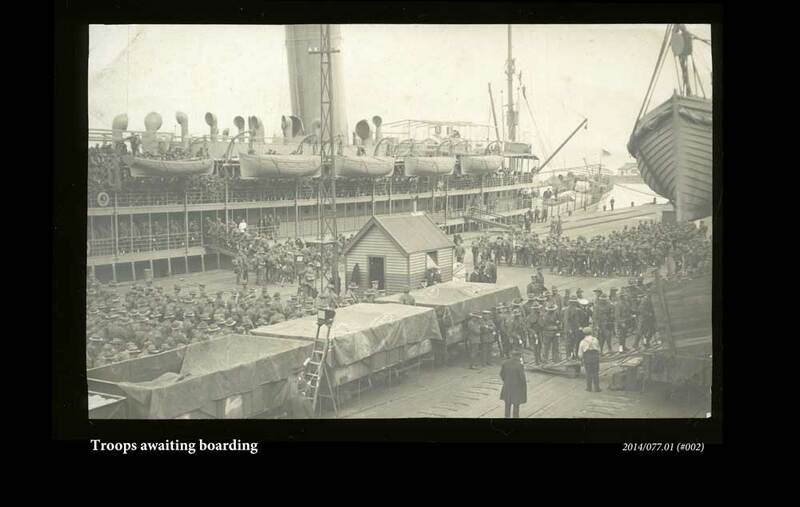 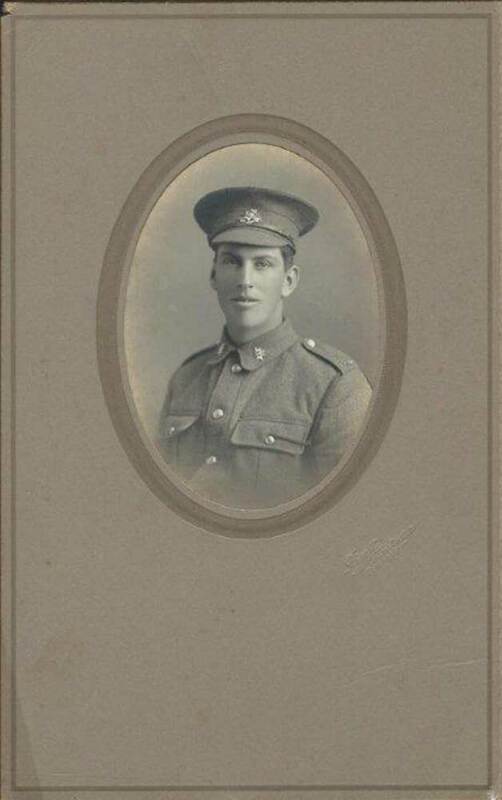 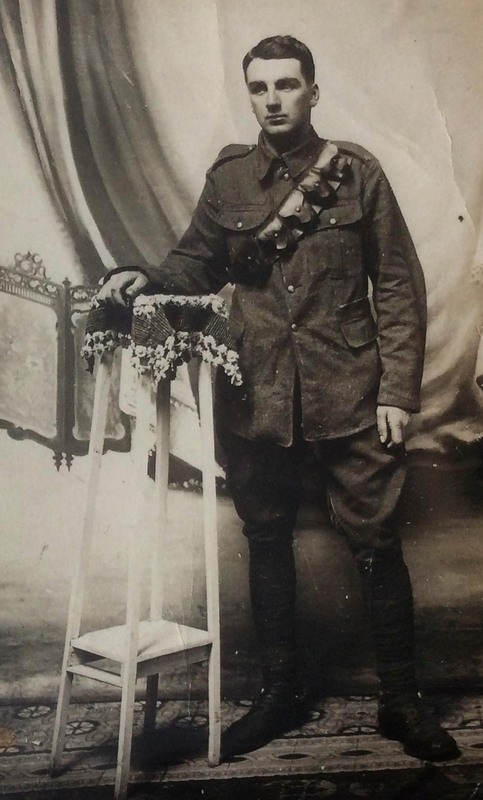 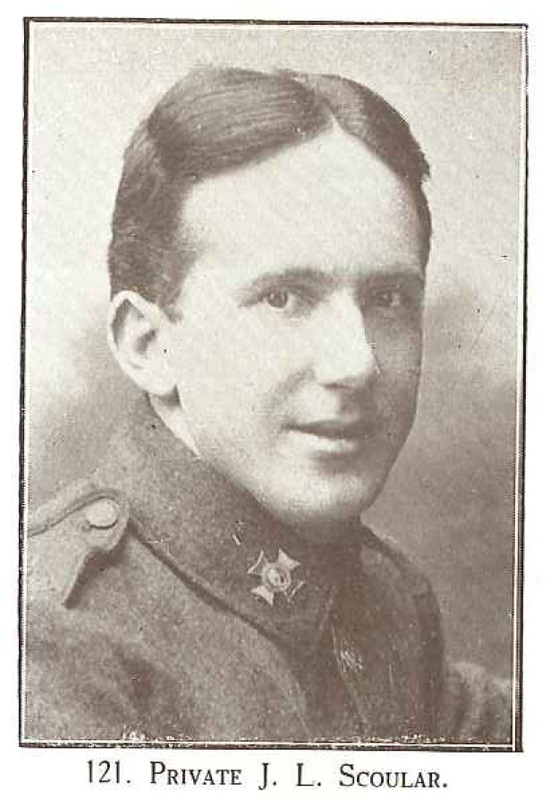 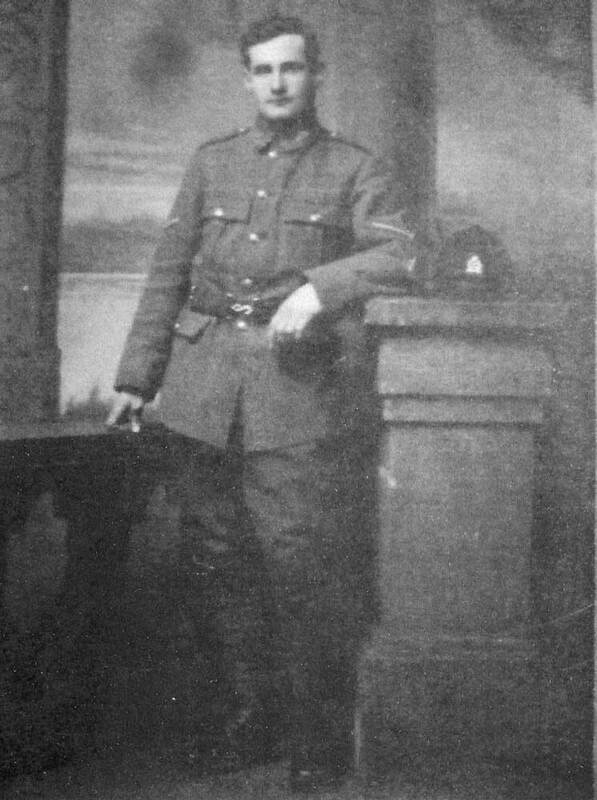 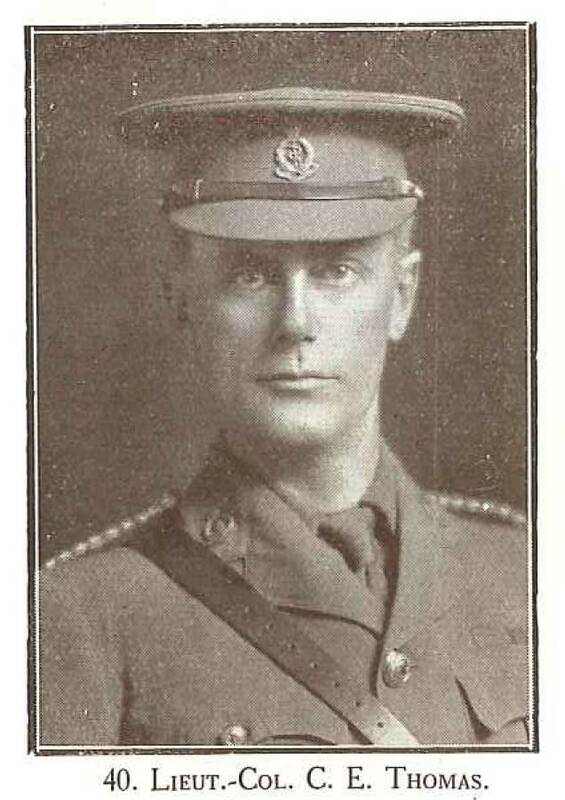 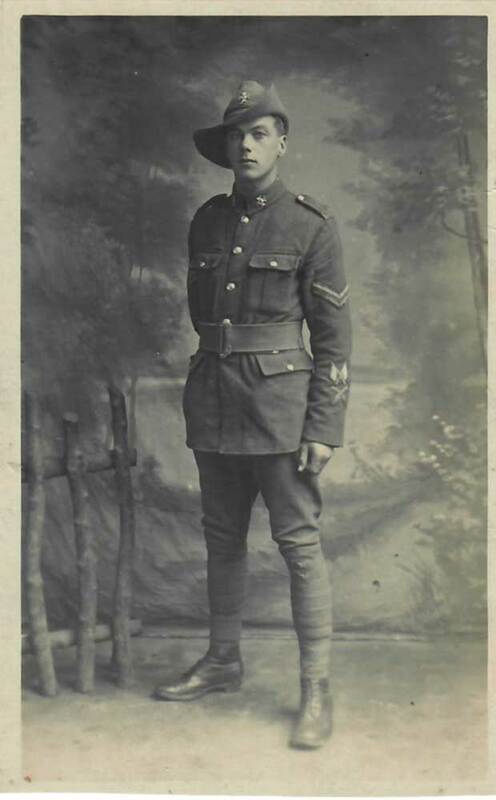 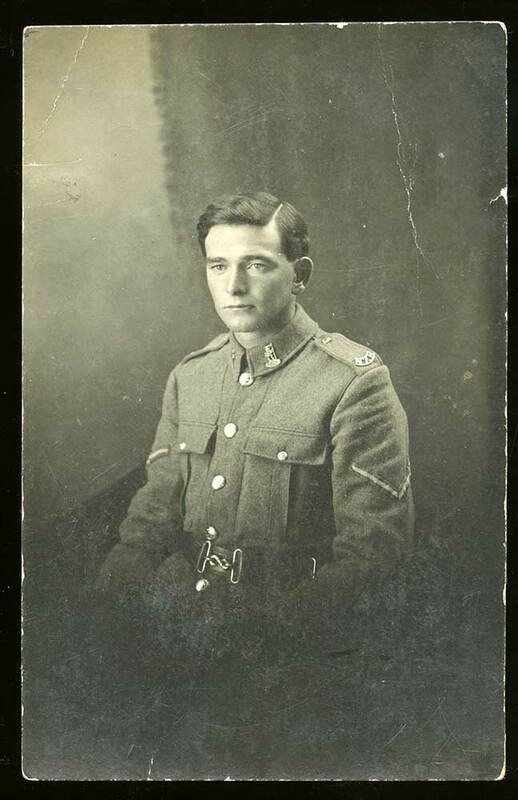 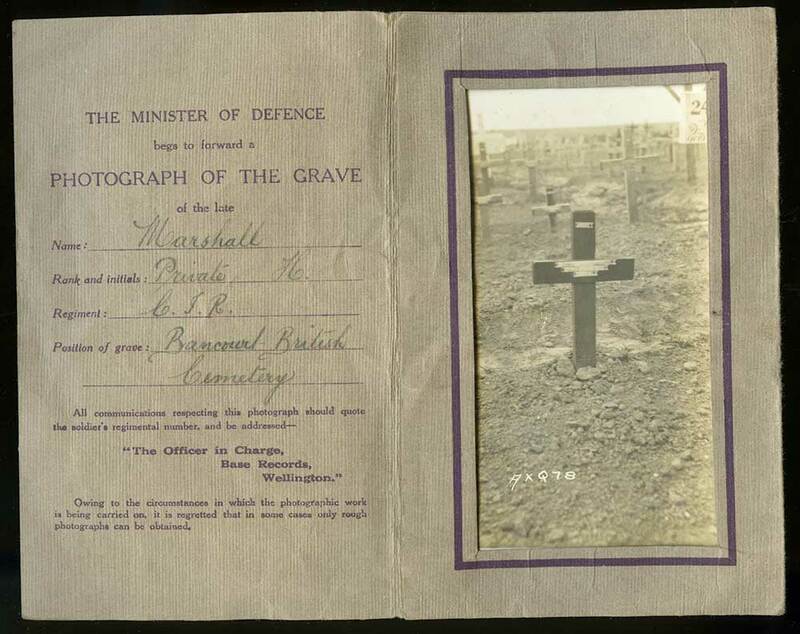 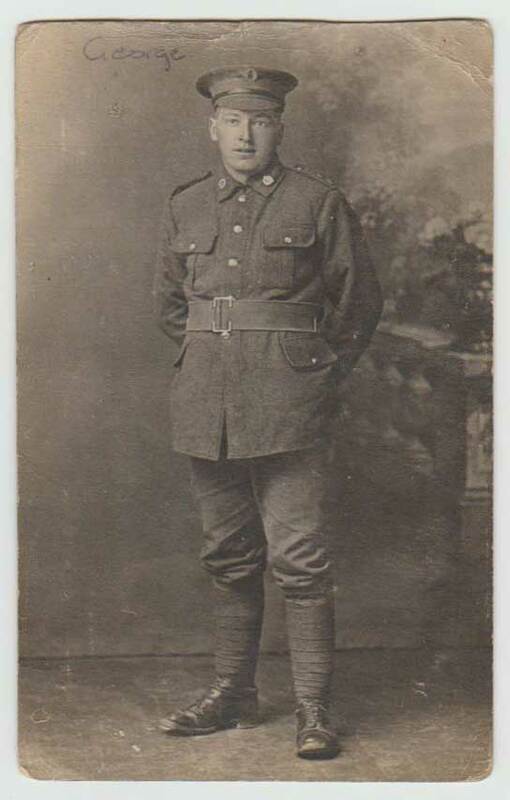 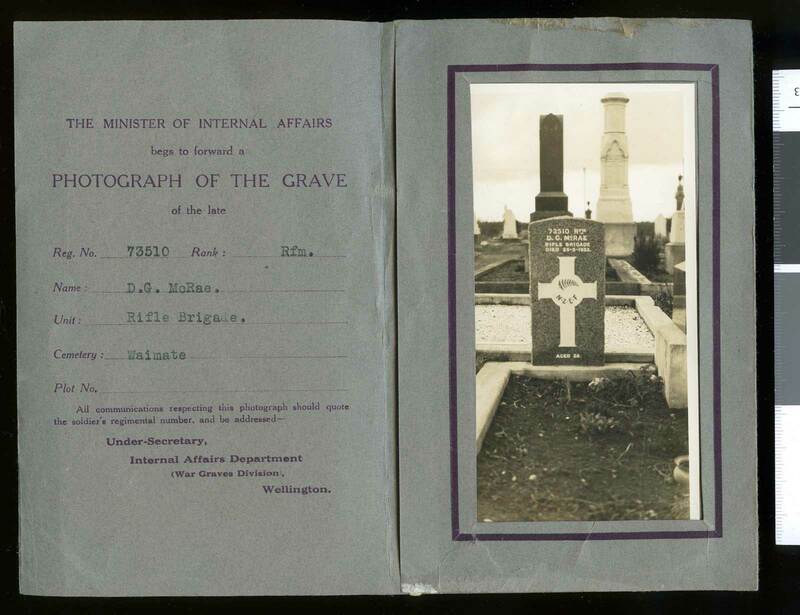 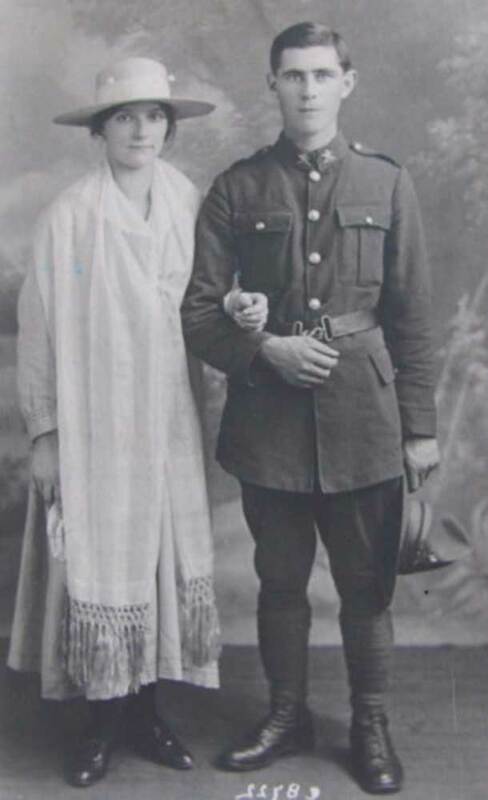 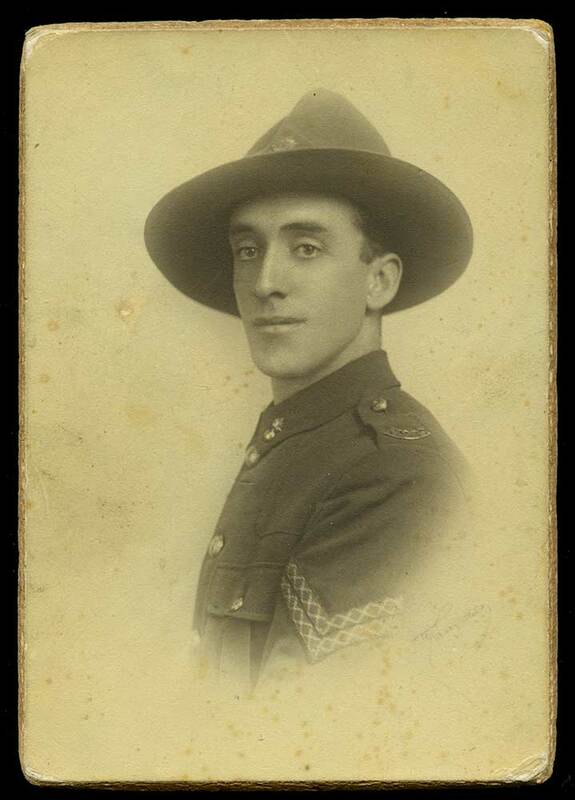 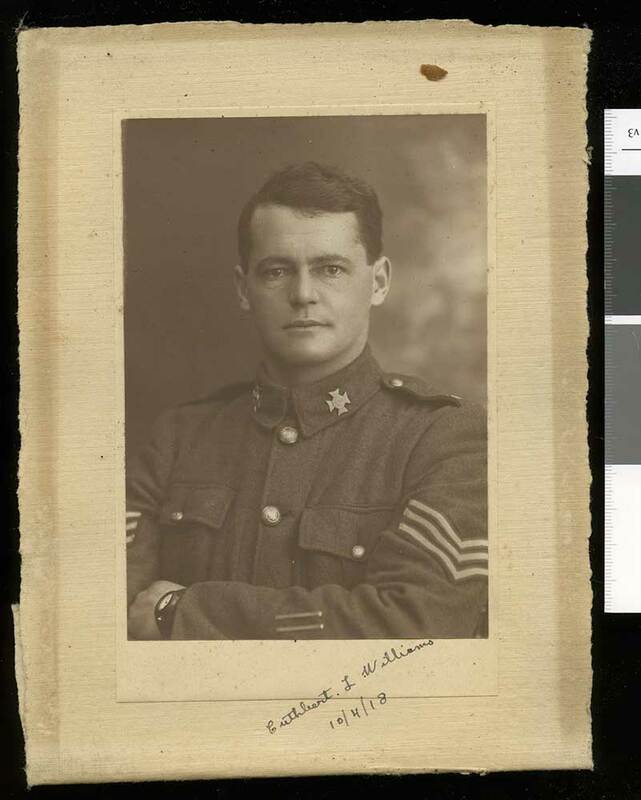 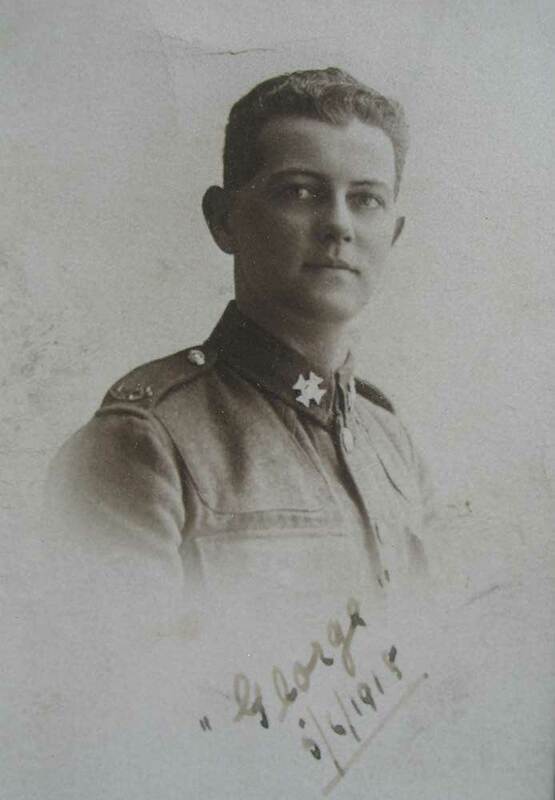 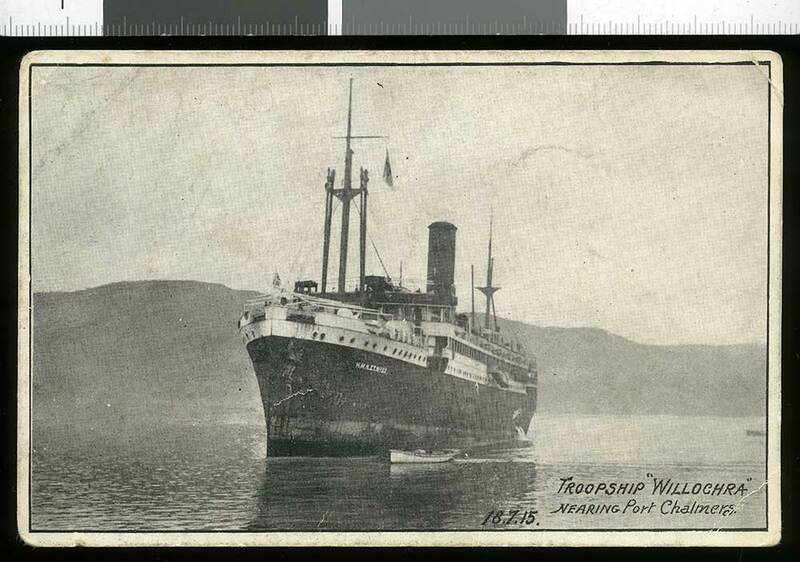 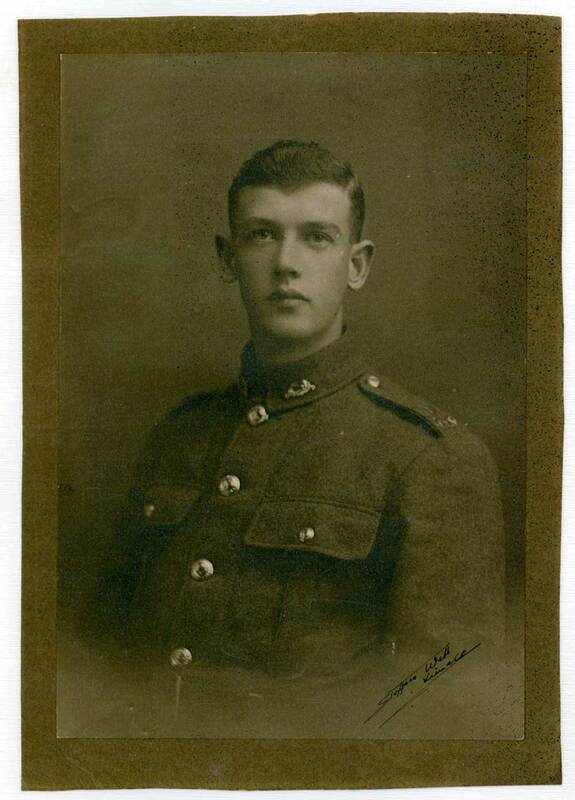 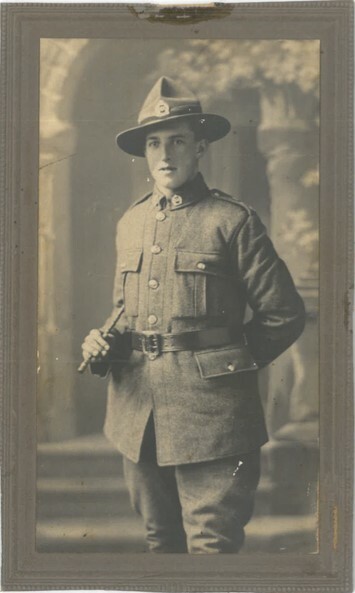 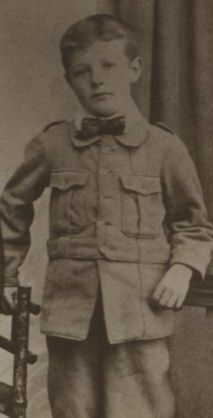 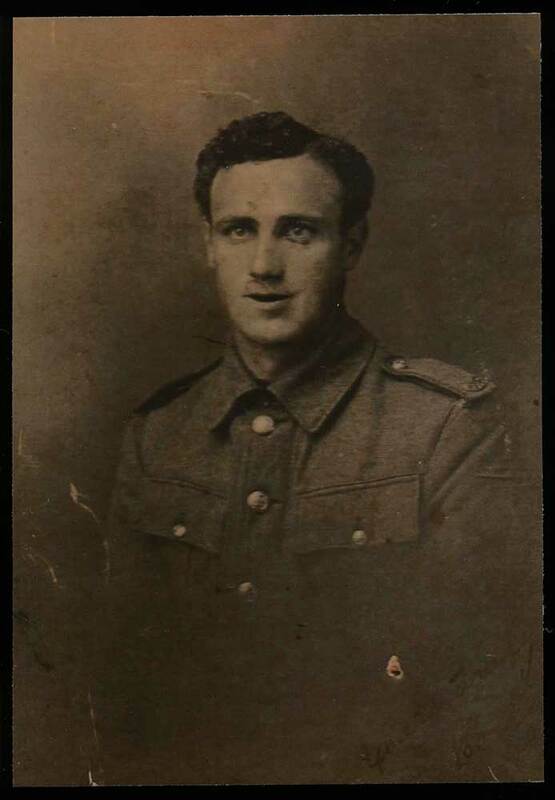 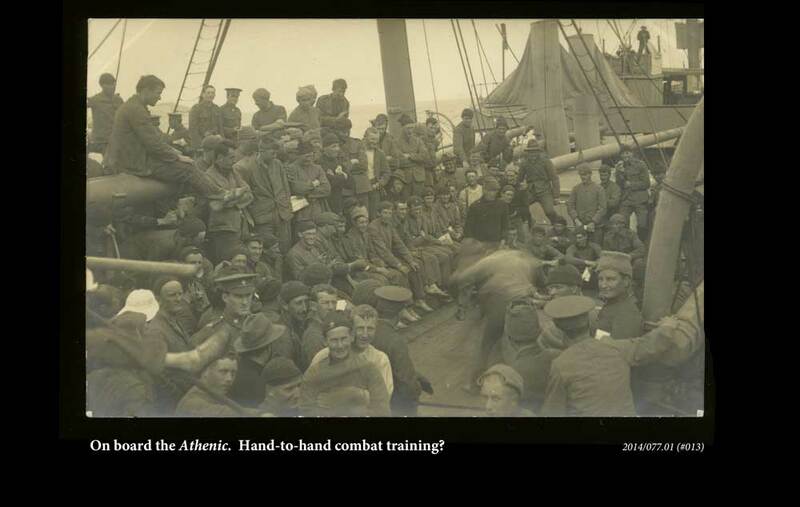 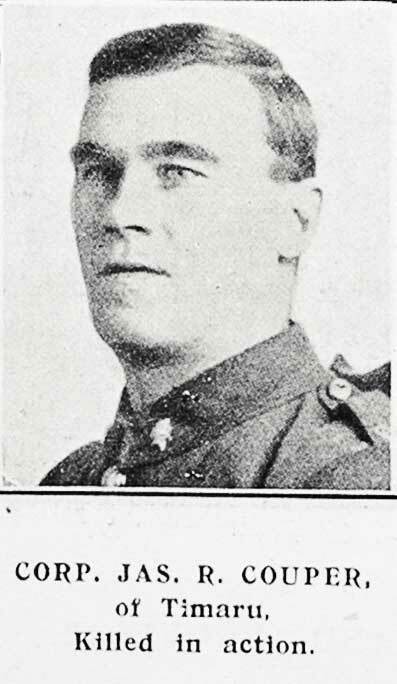 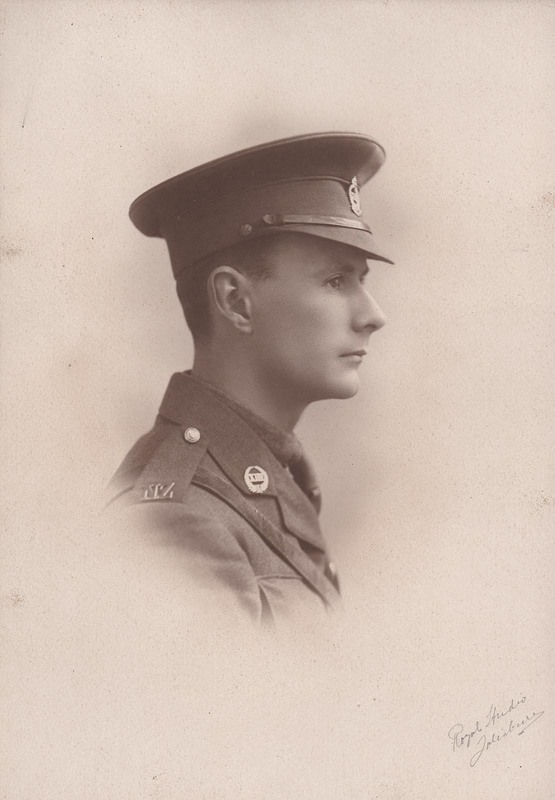 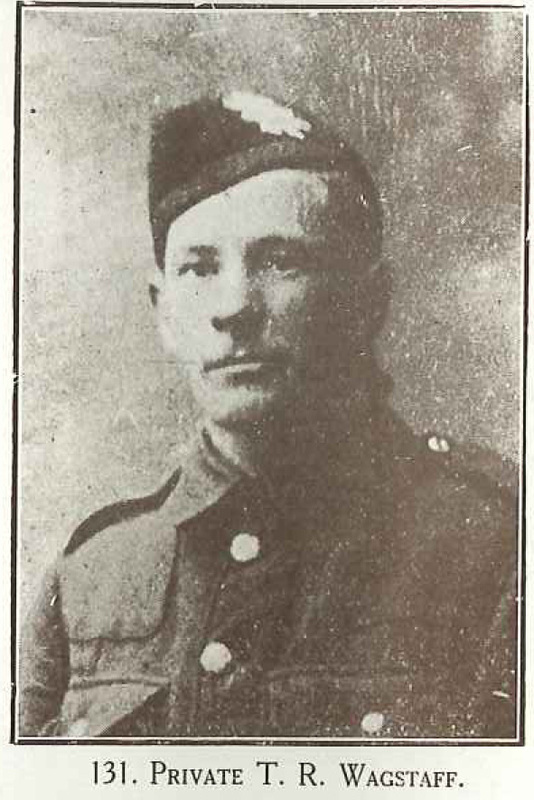 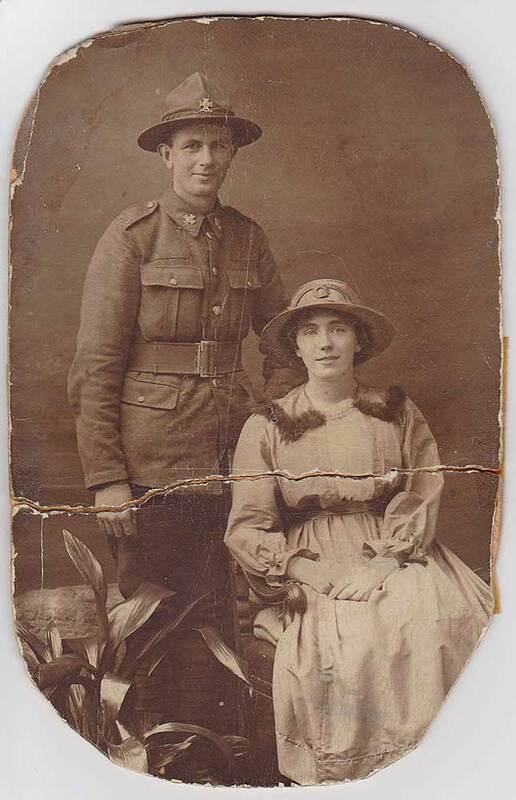 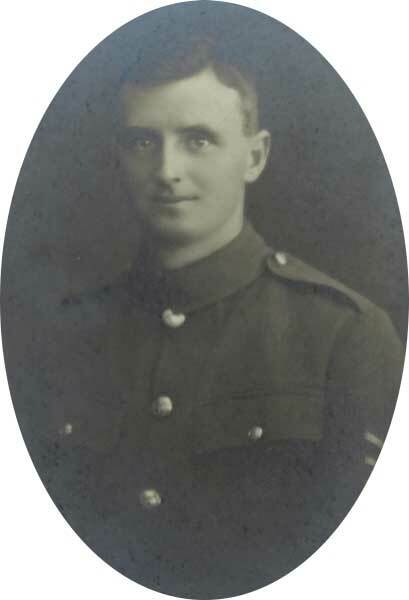 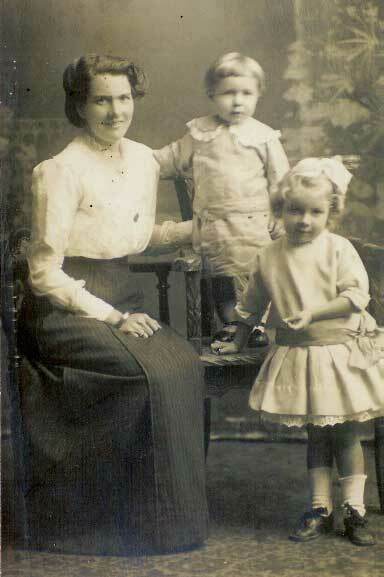 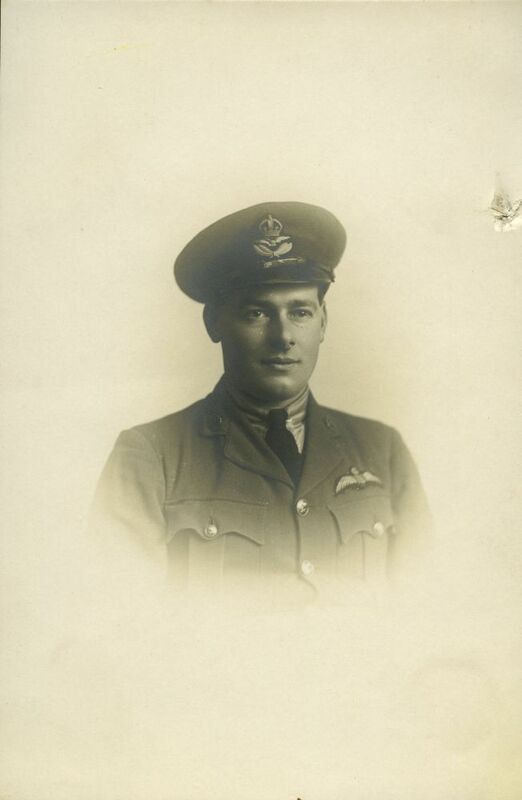 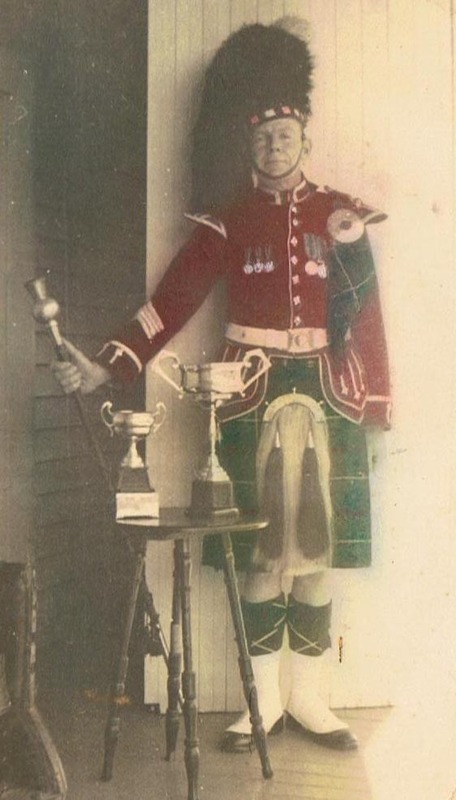 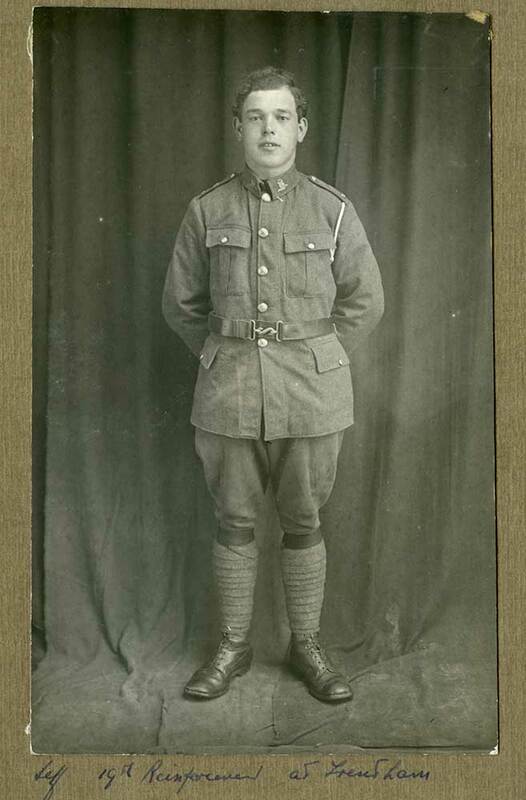 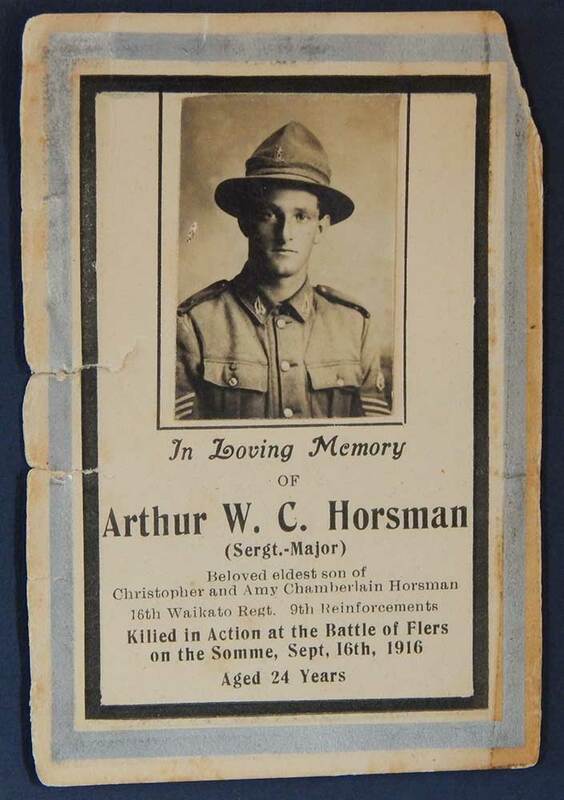 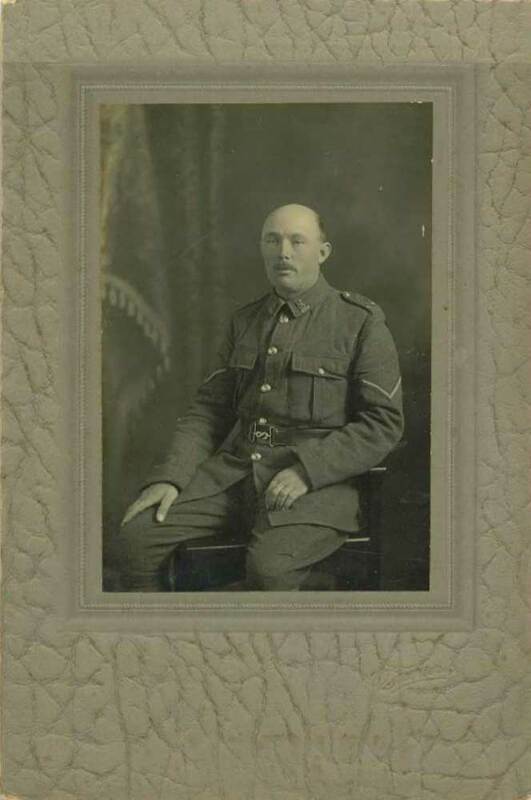 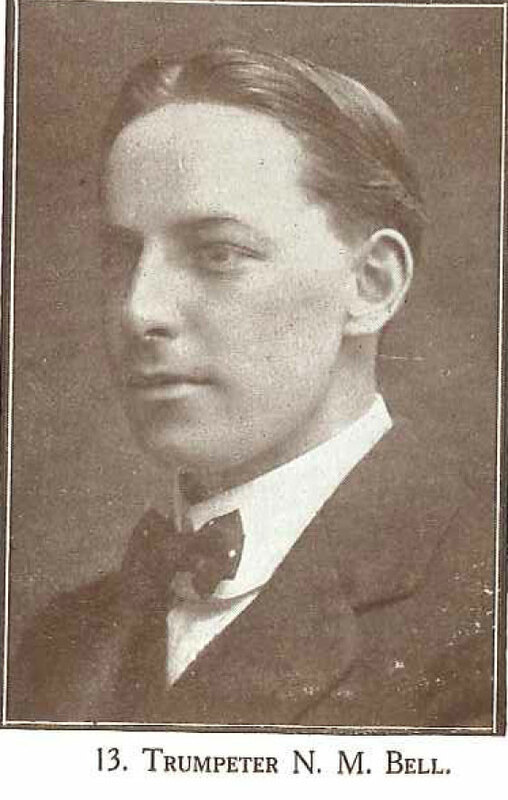 A small photograph belonging to Alister Ross, who embarked for service in Europe during World War One in February 1918. 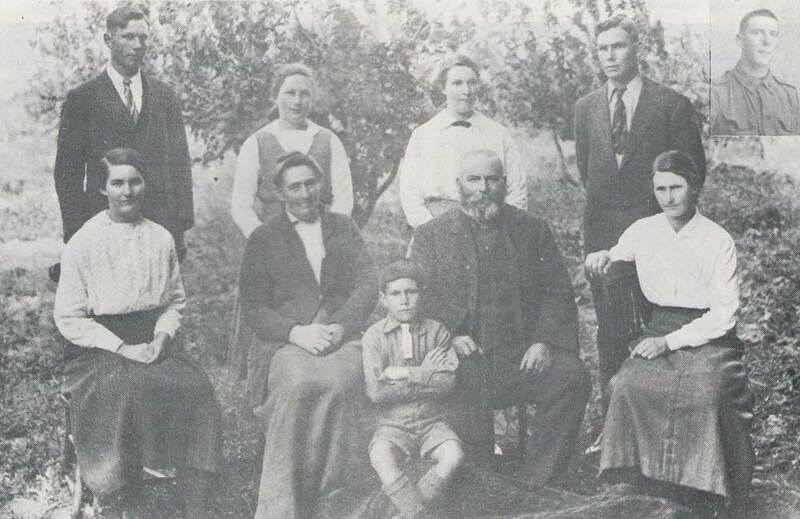 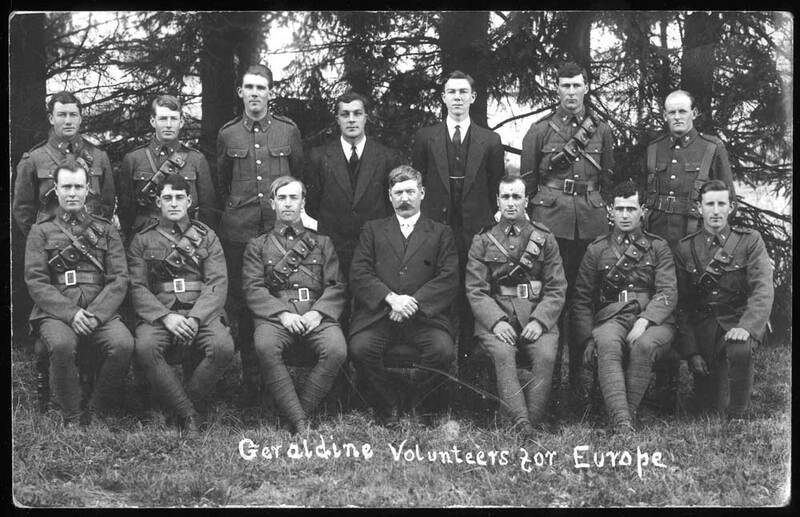 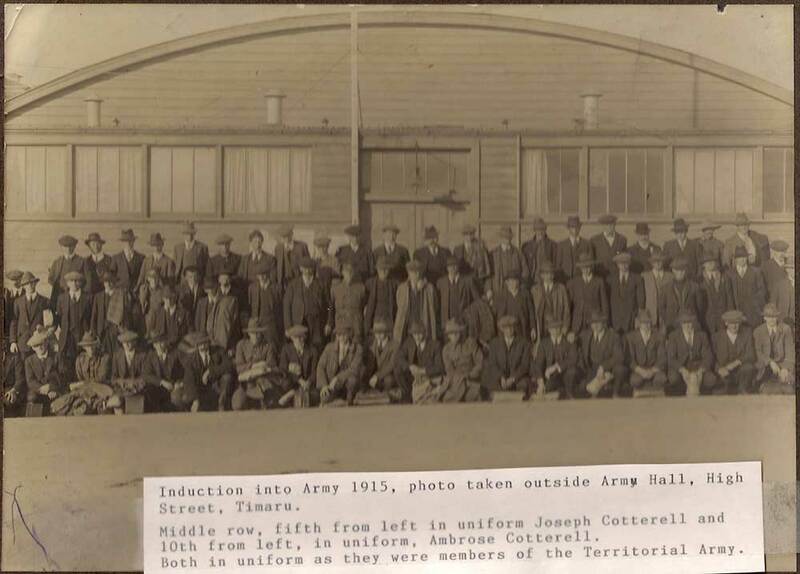 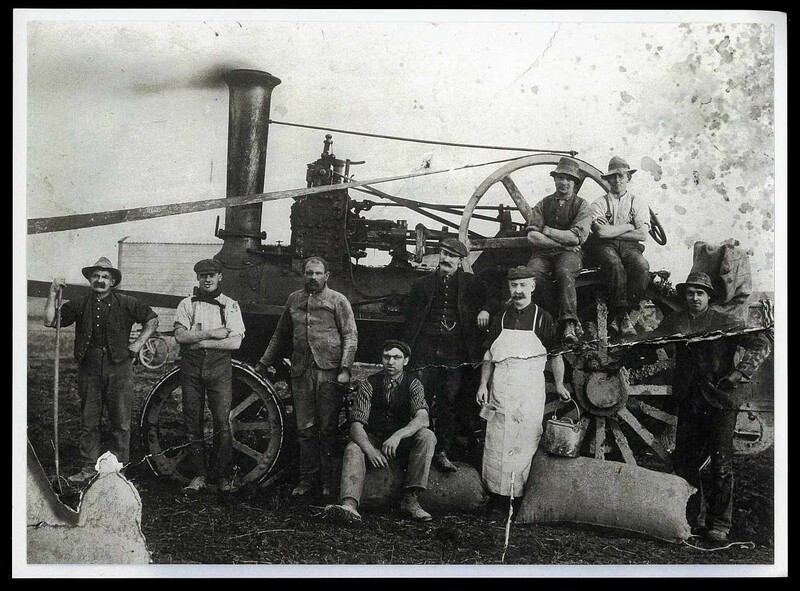 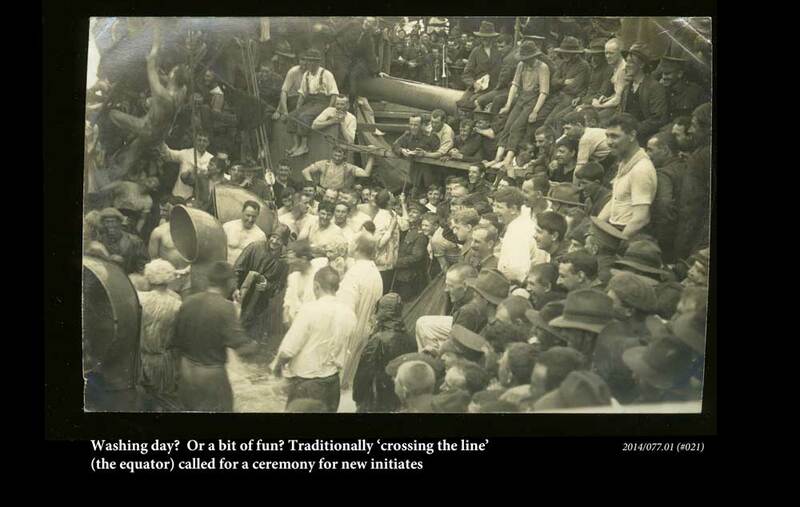 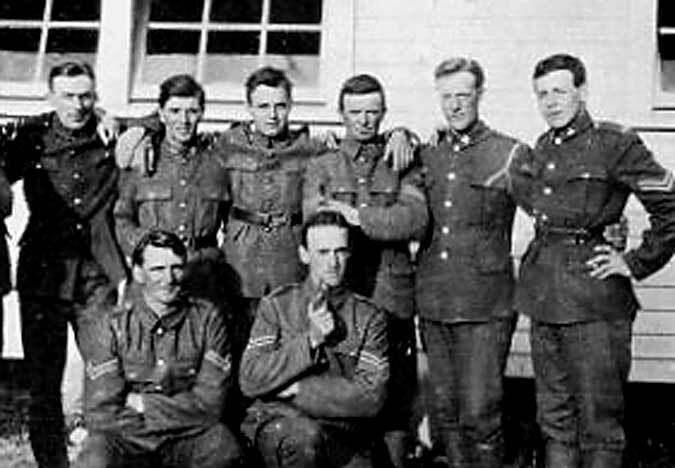 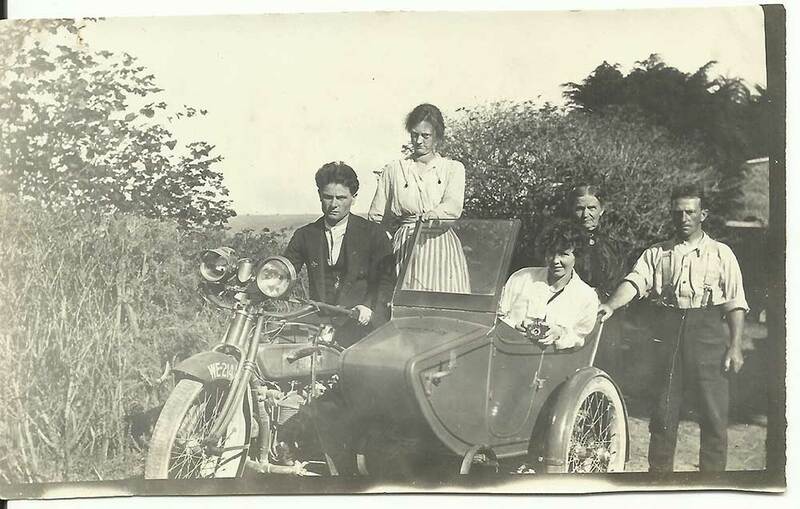 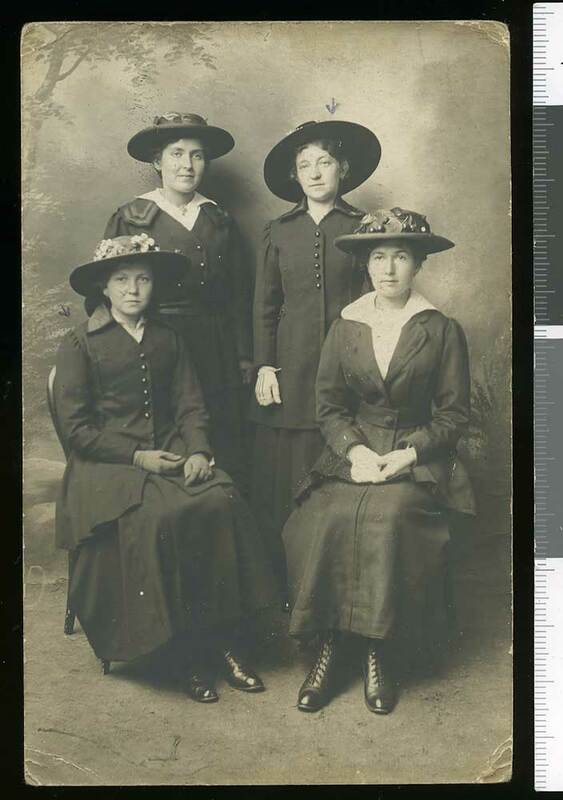 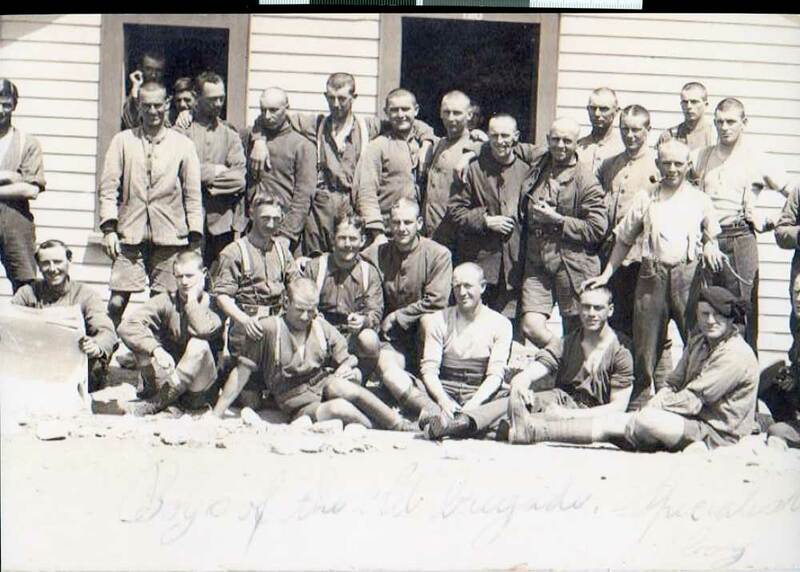 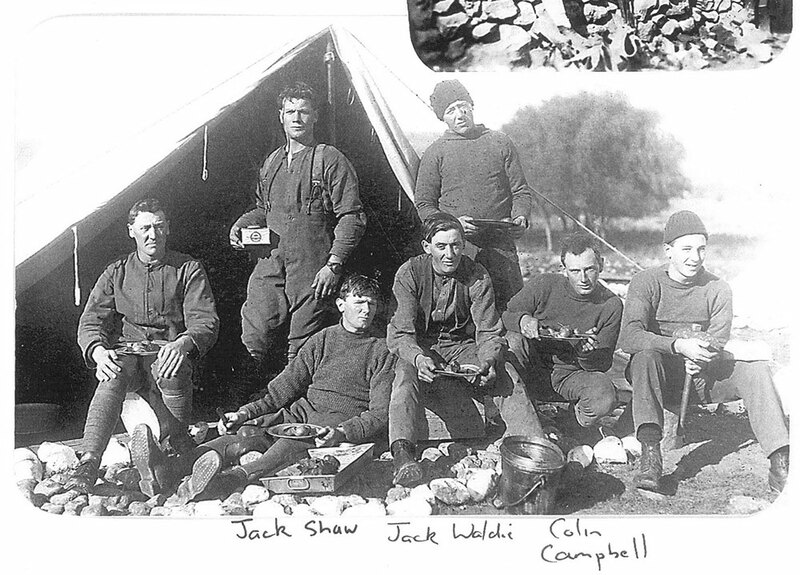 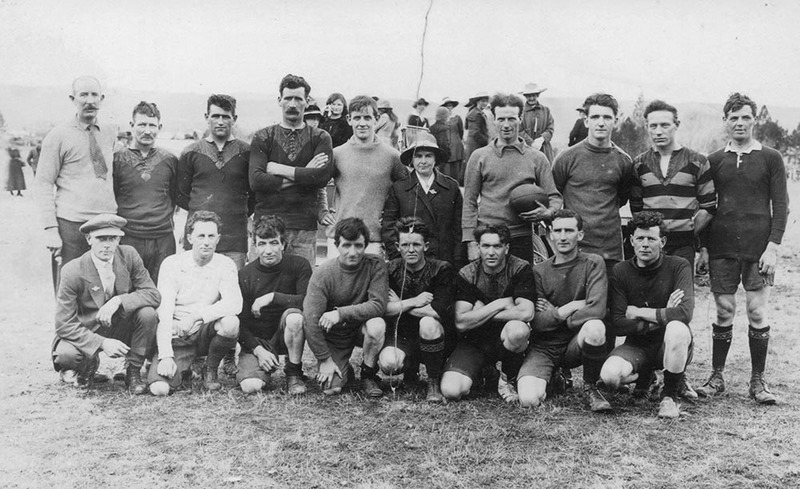 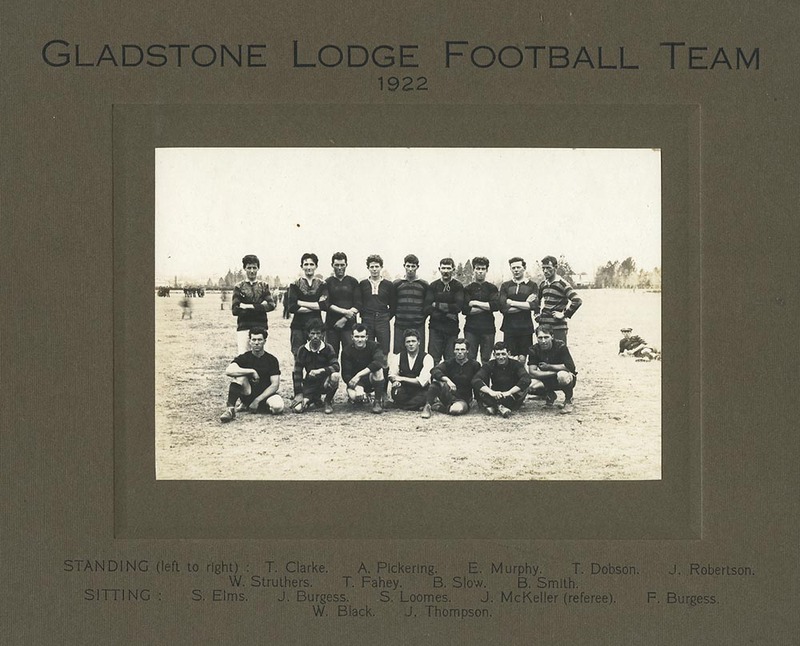 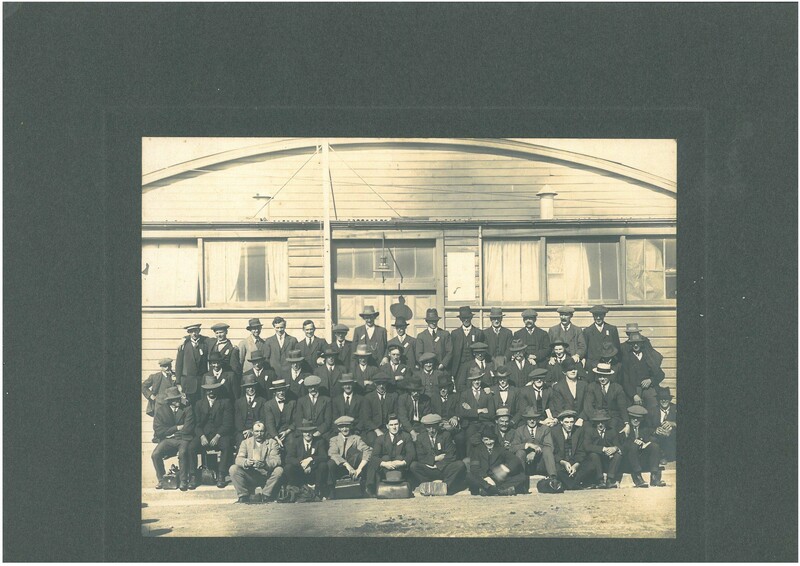 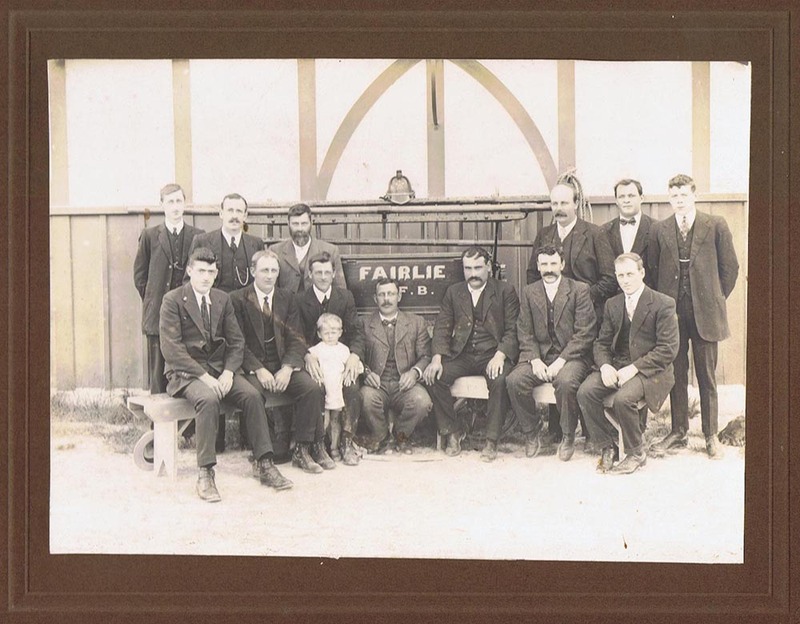 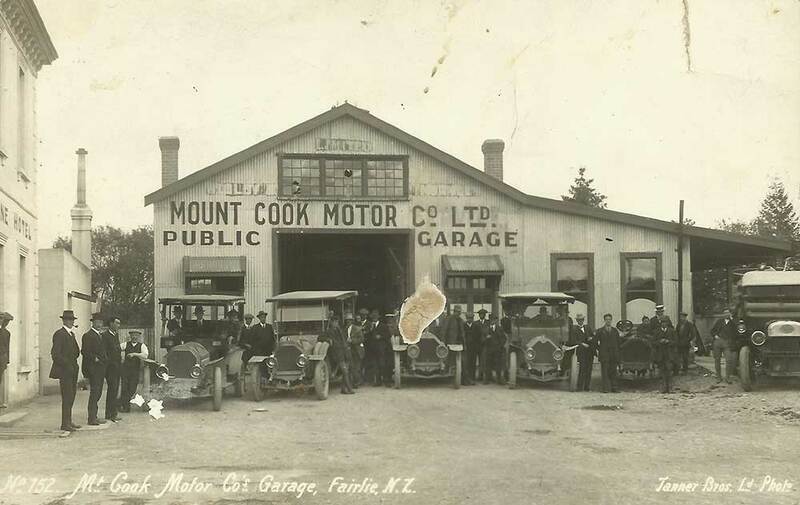 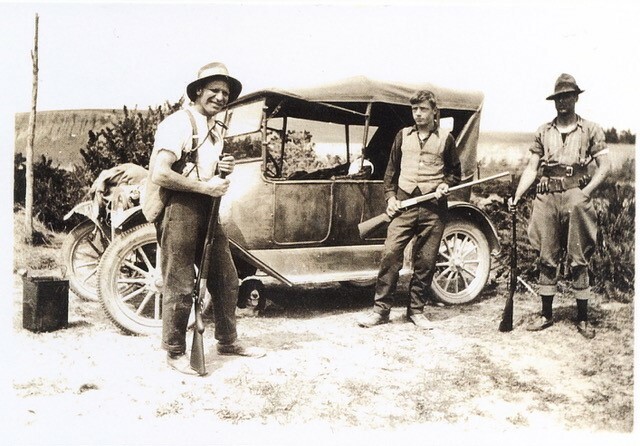 This group all embarked in 1917 and all come from the Cave - Albury - Cricklewood area of the MacKenzie County. 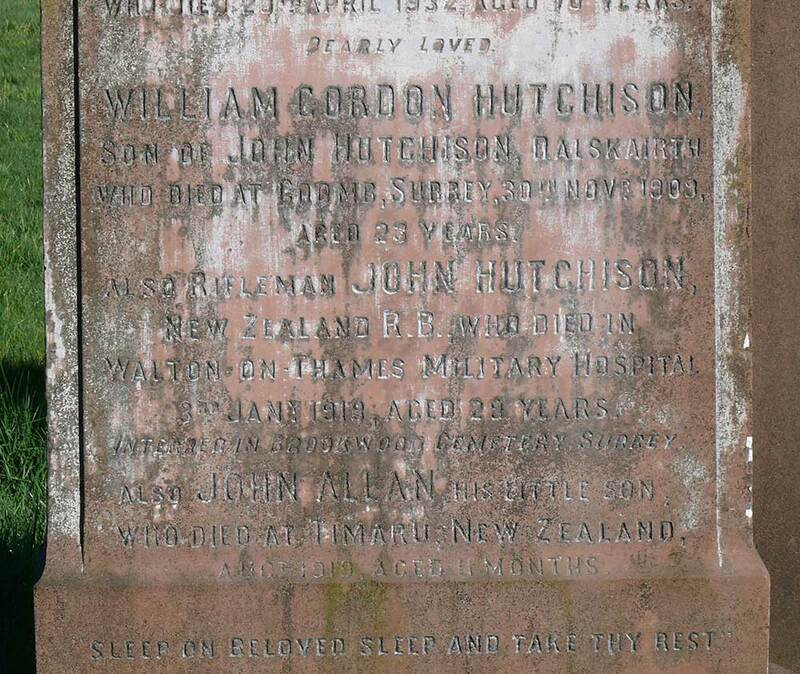 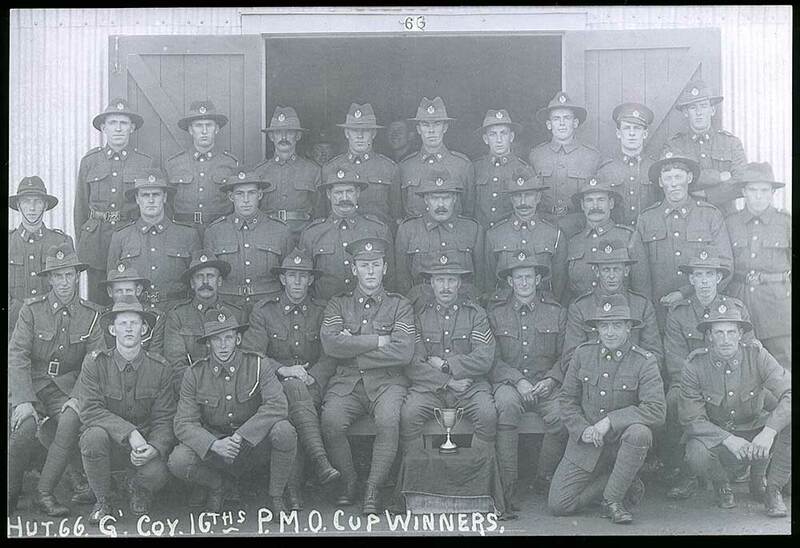 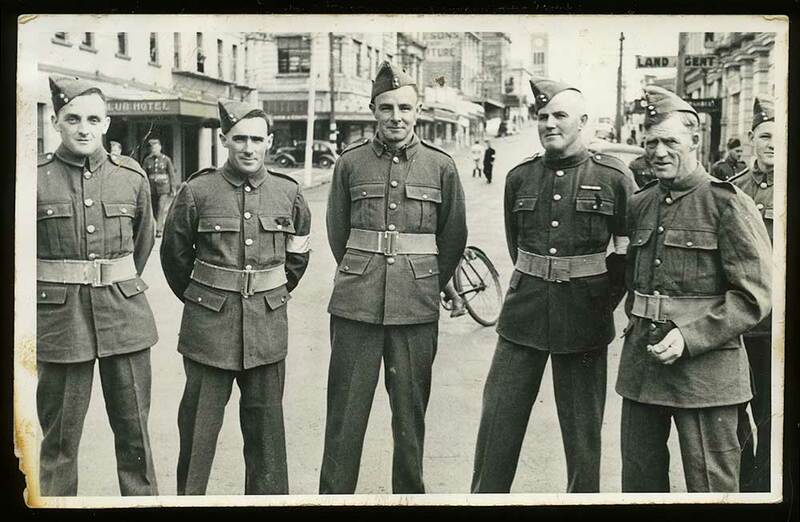 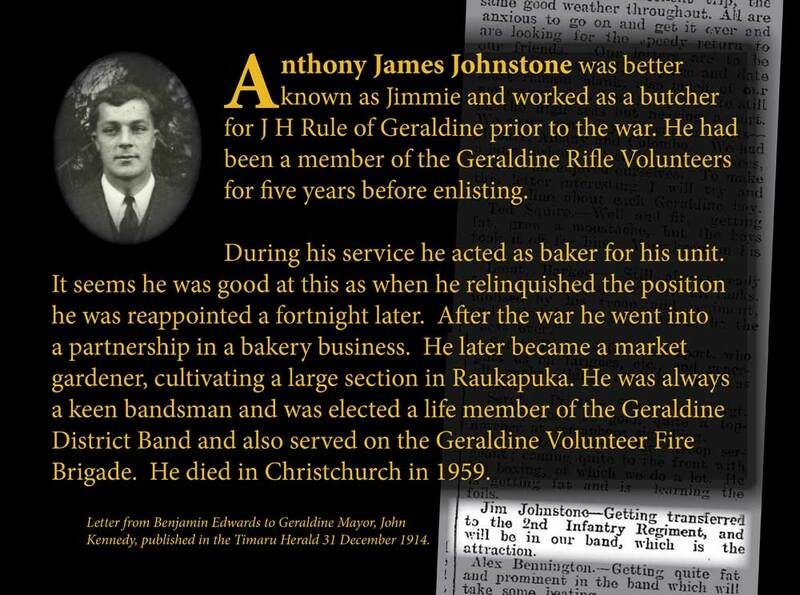 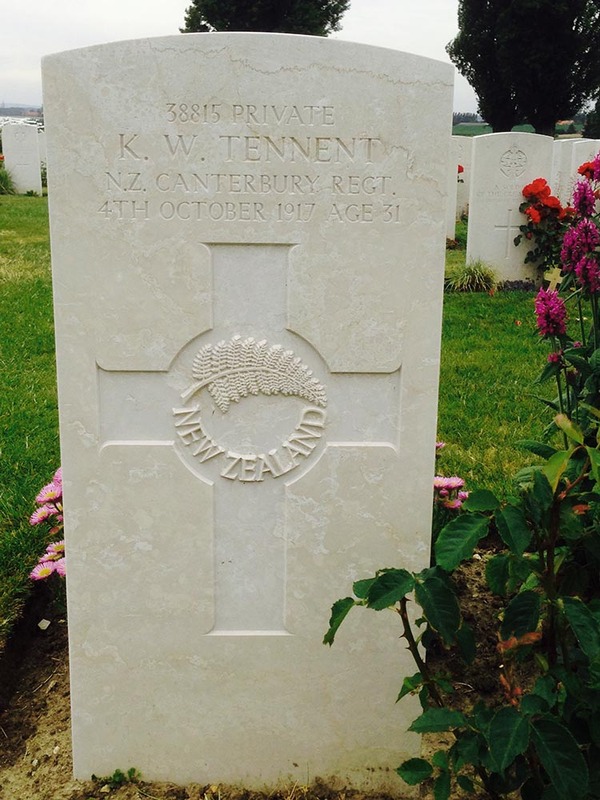 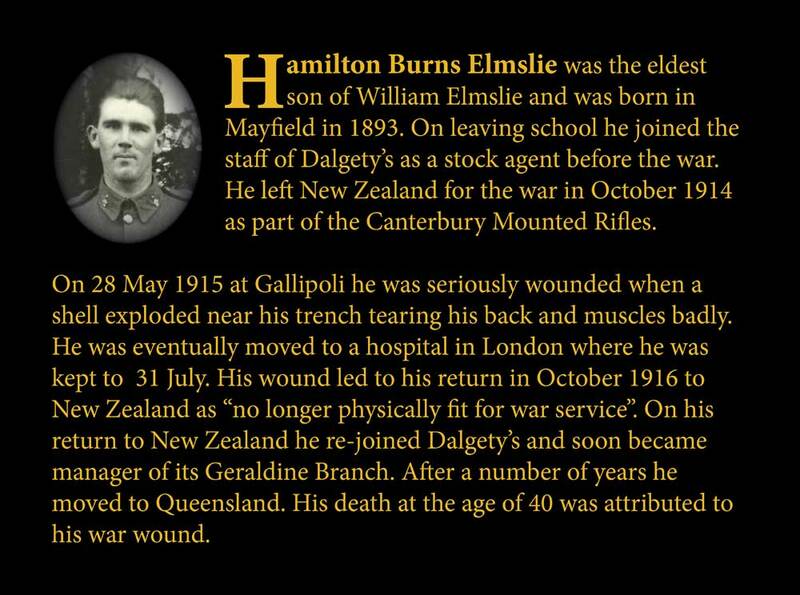 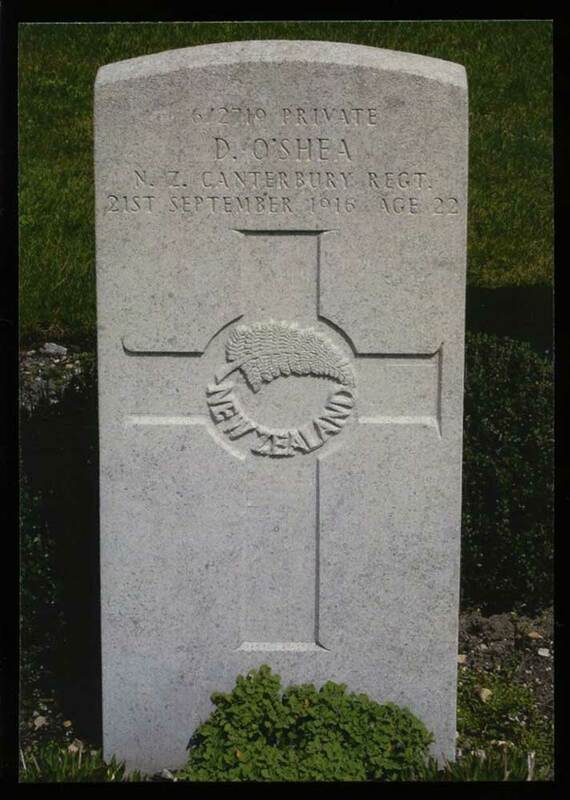 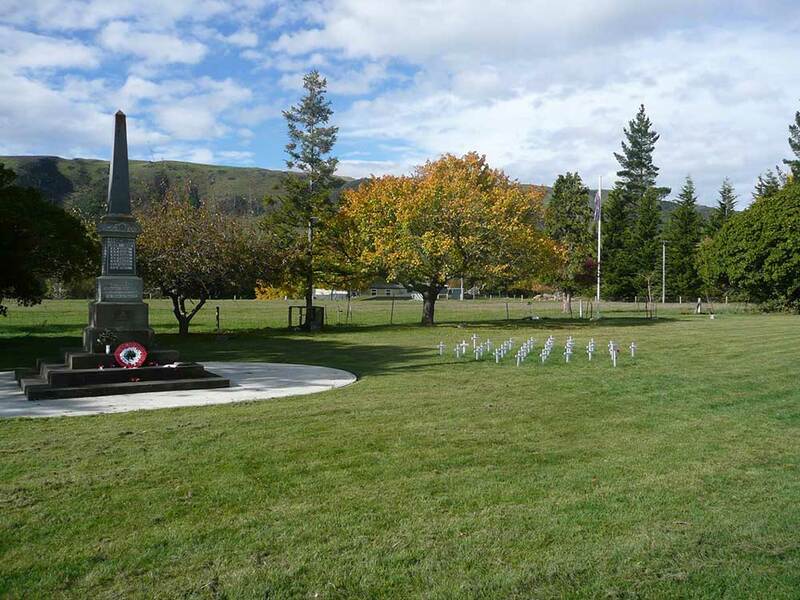 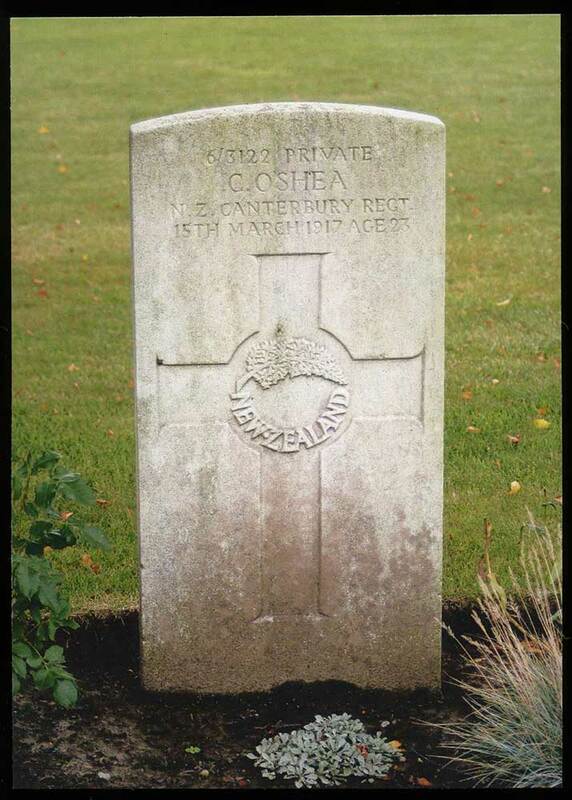 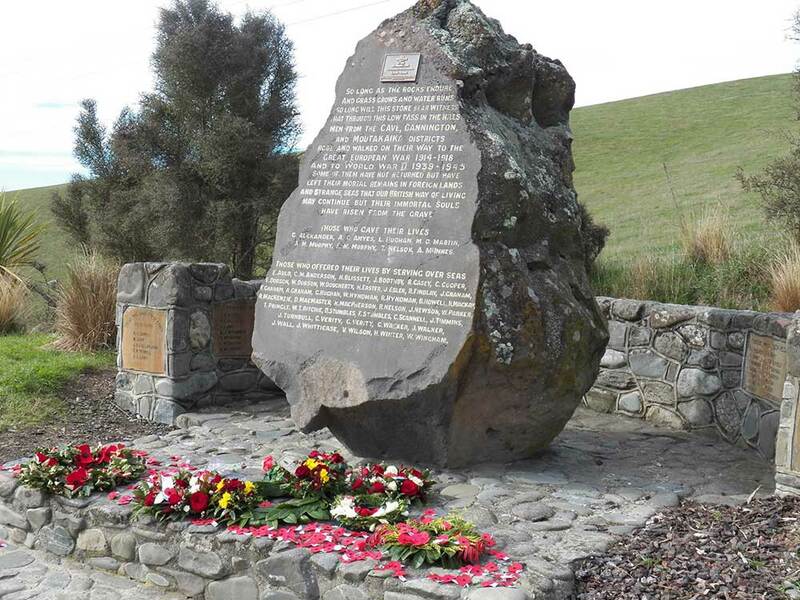 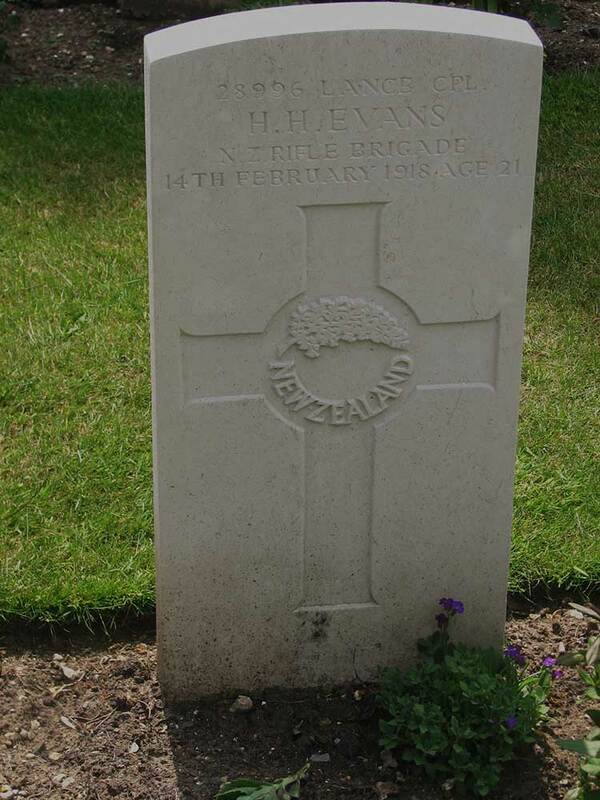 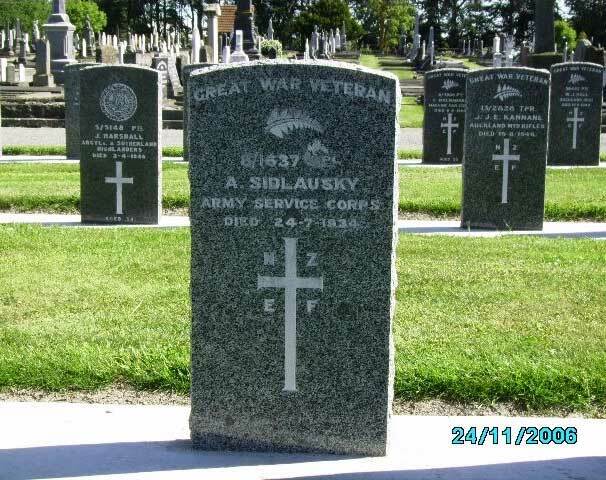 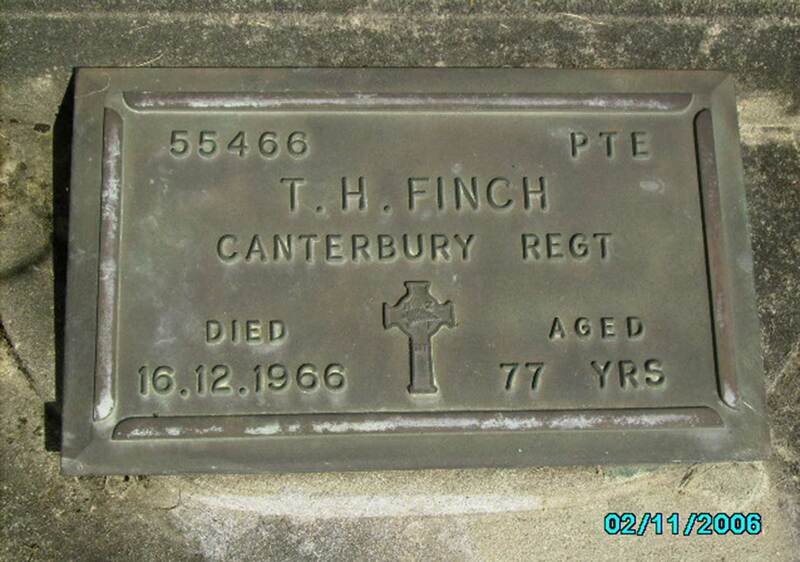 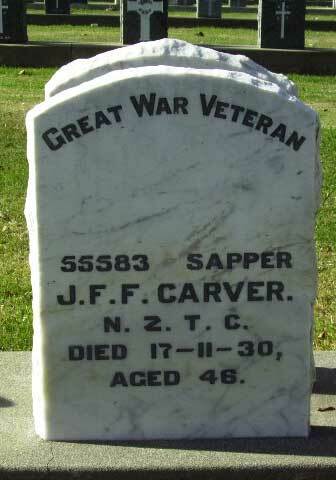 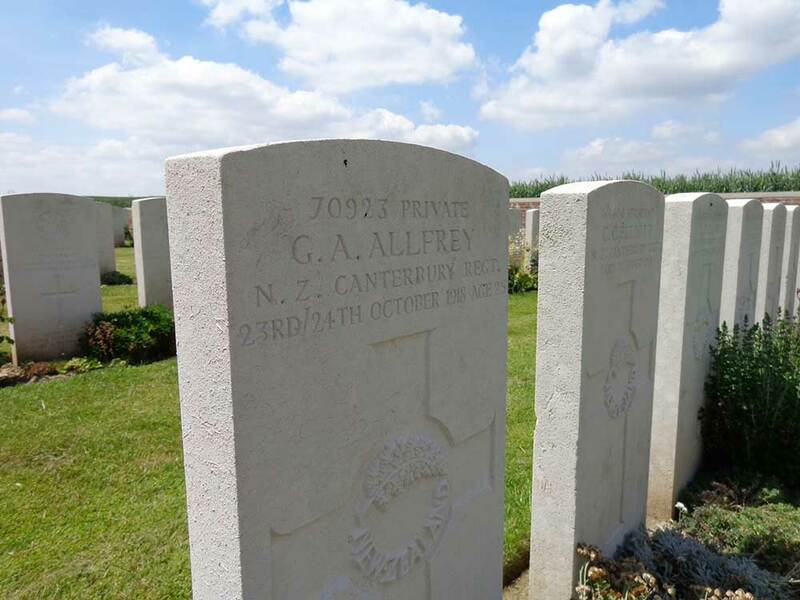 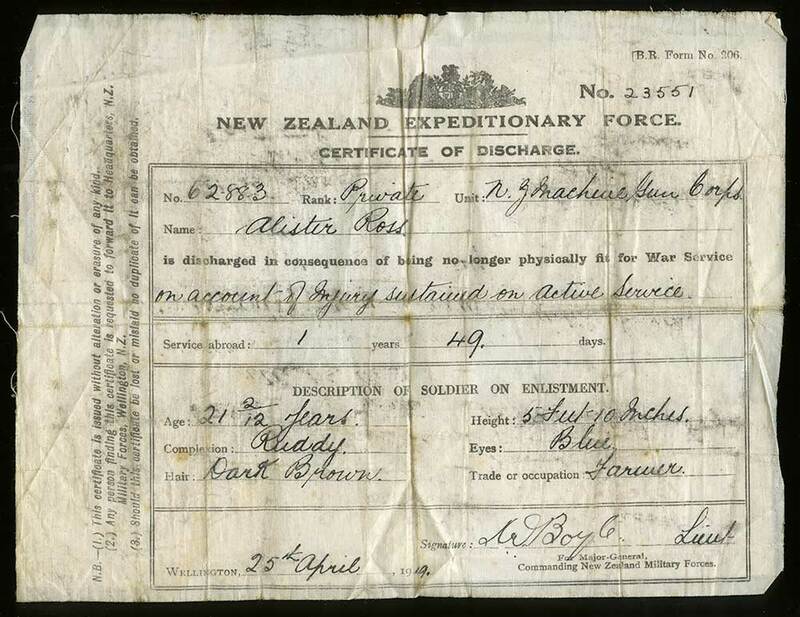 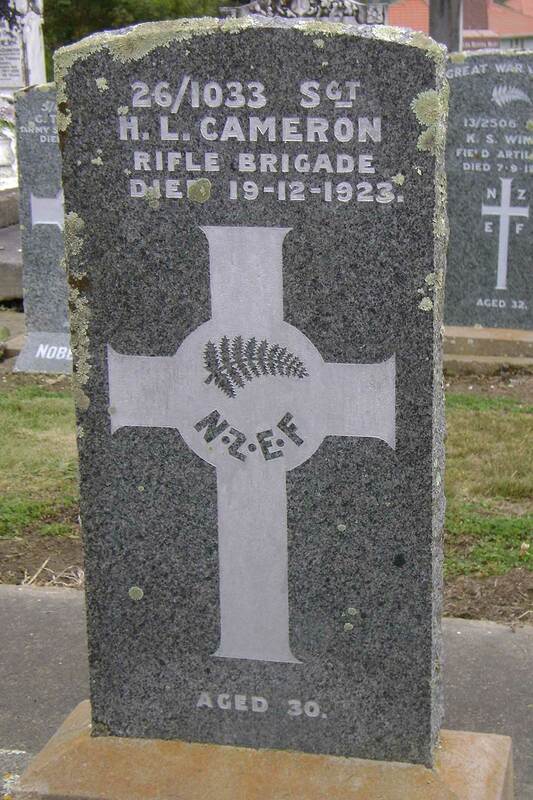 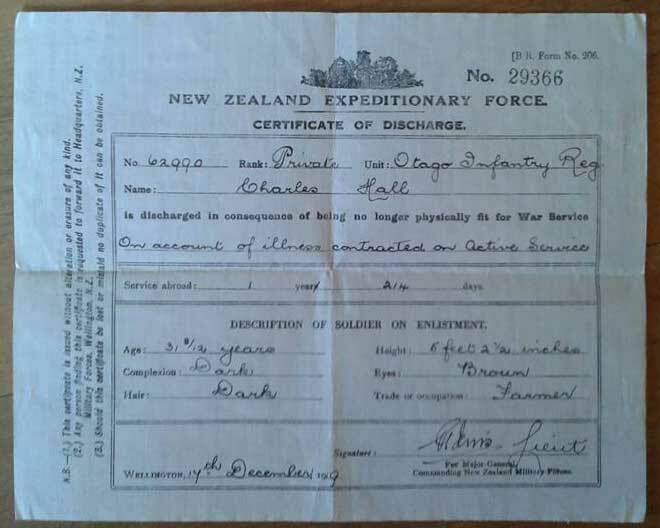 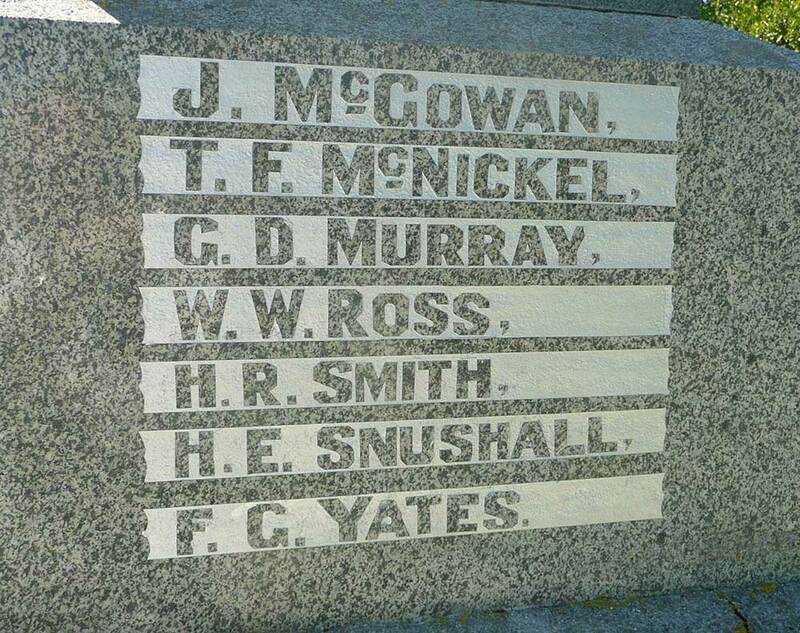 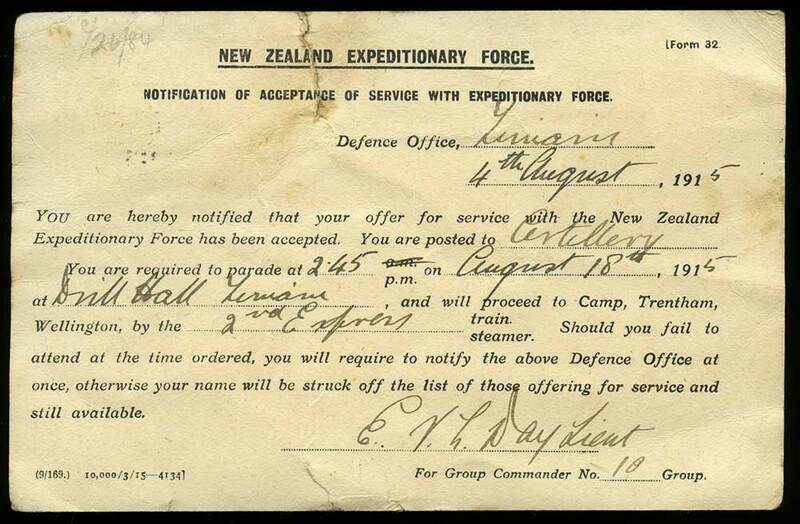 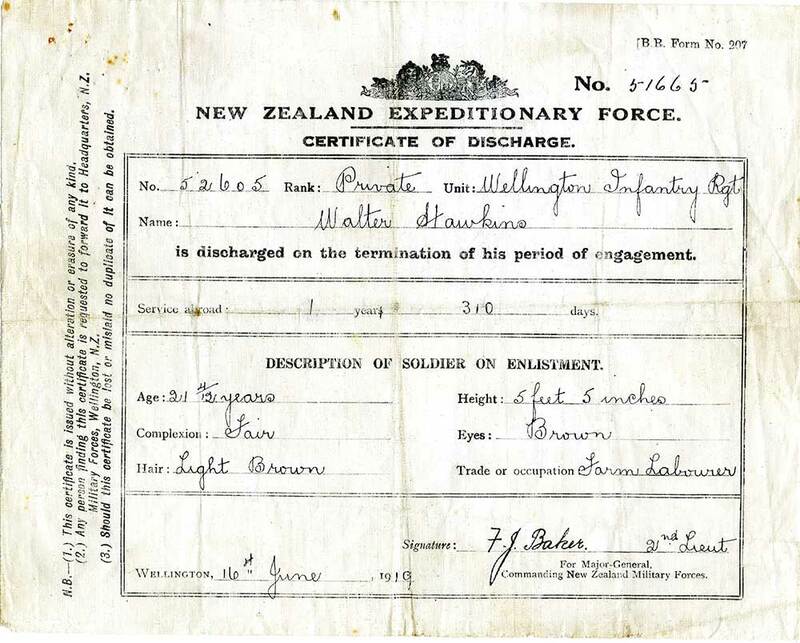 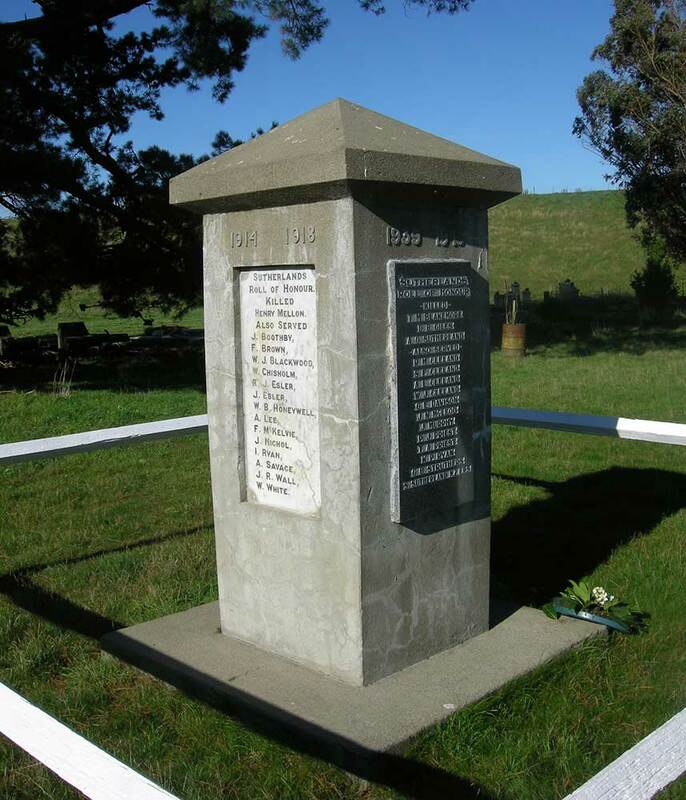 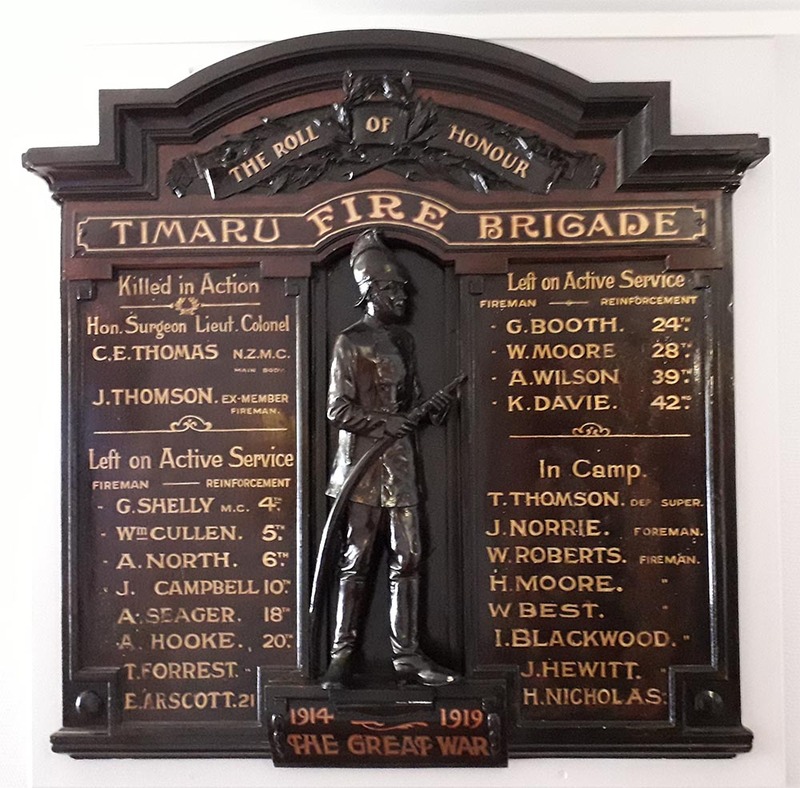 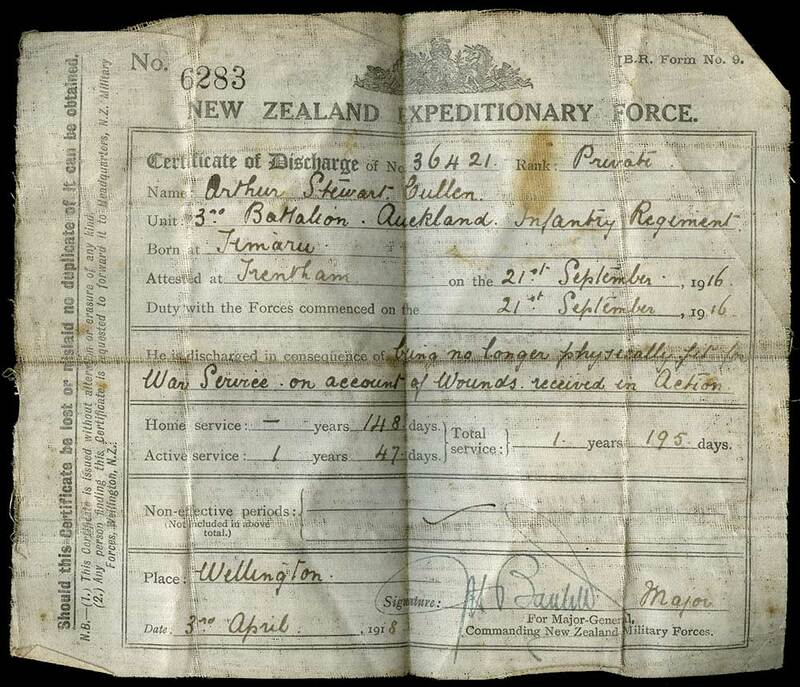 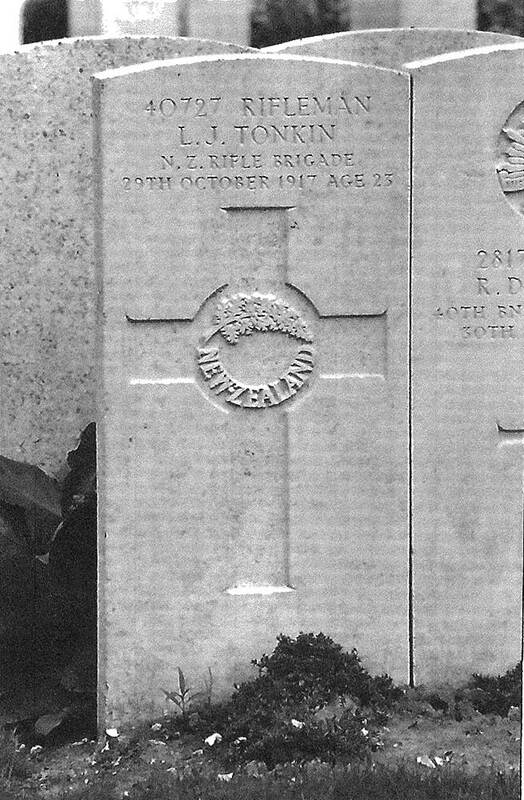 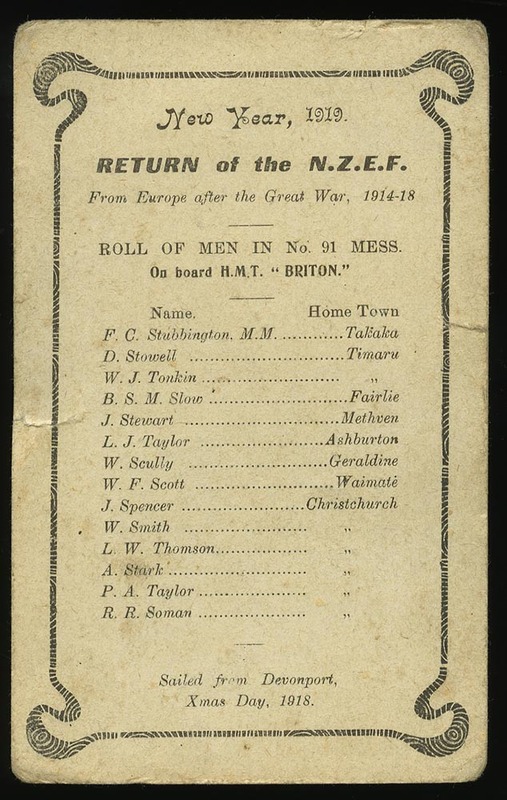 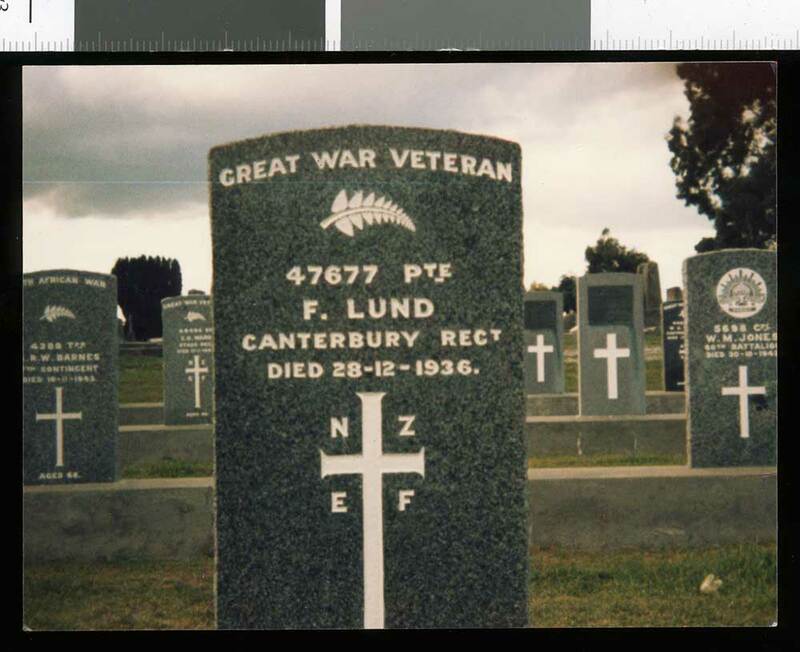 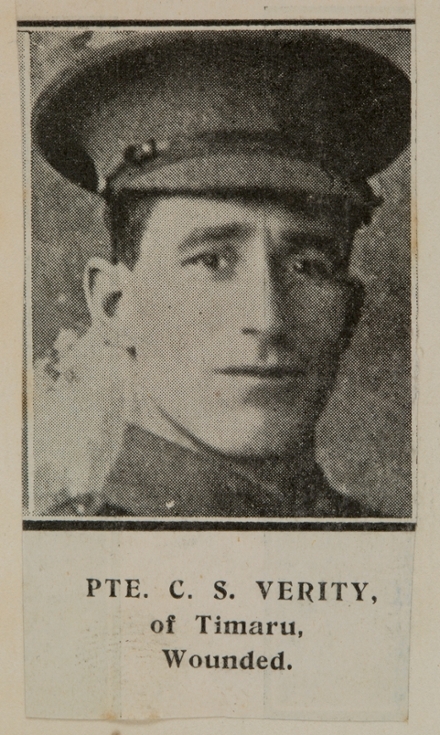 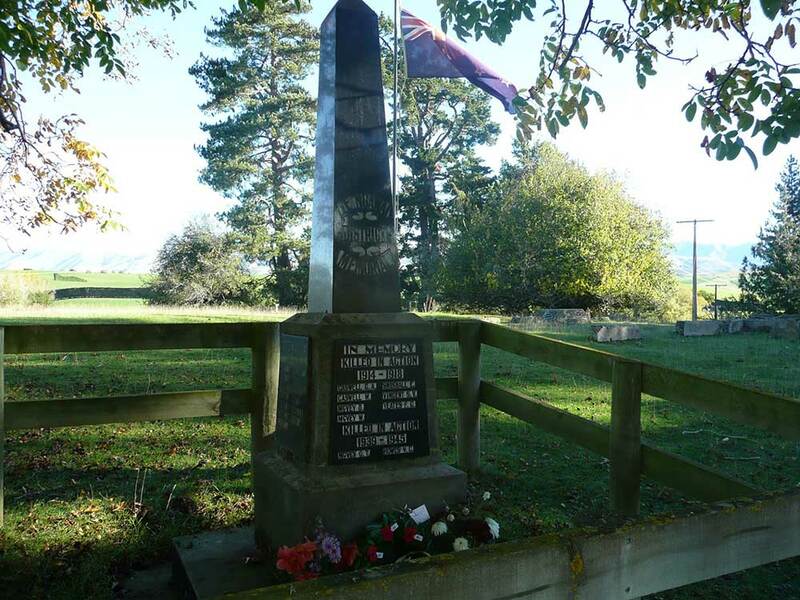 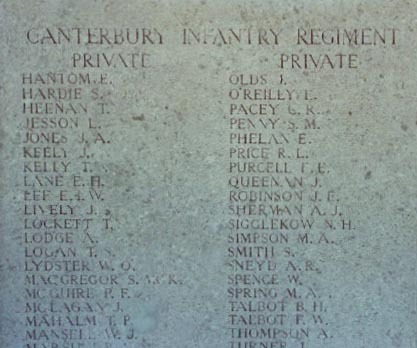 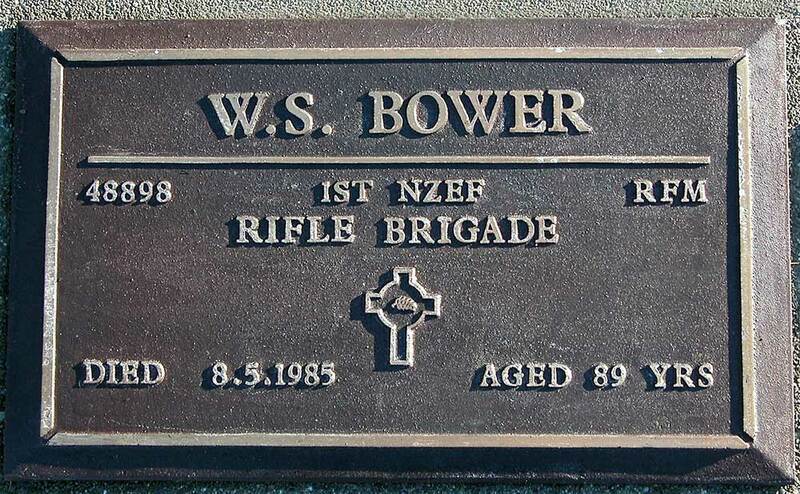 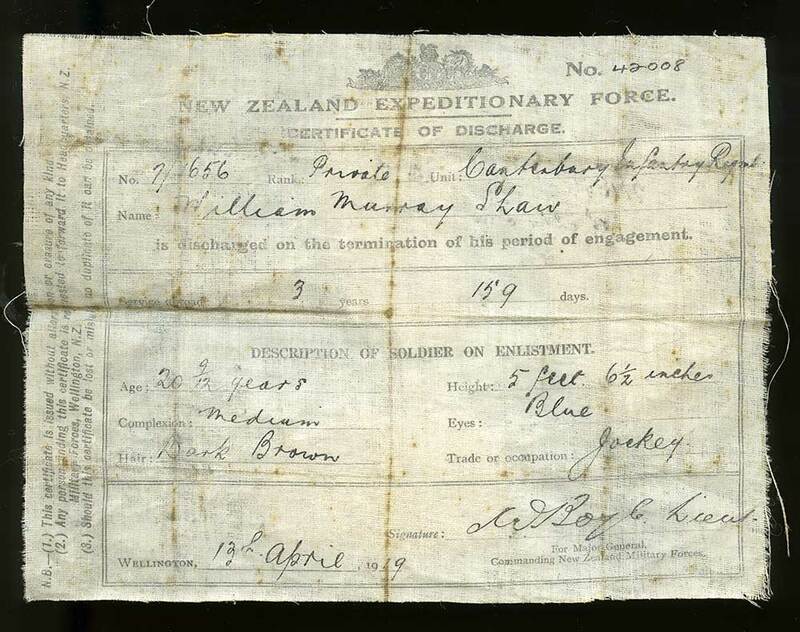 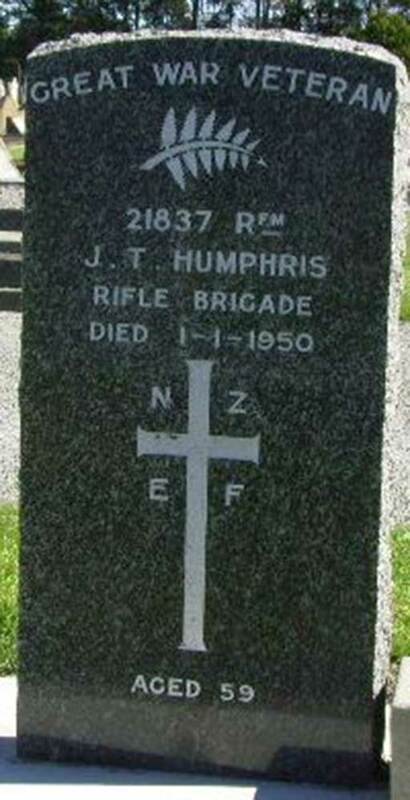 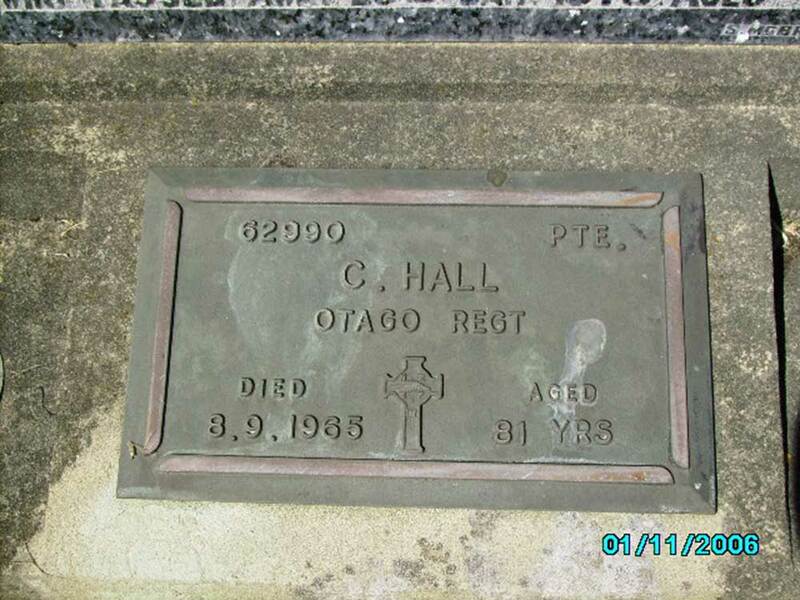 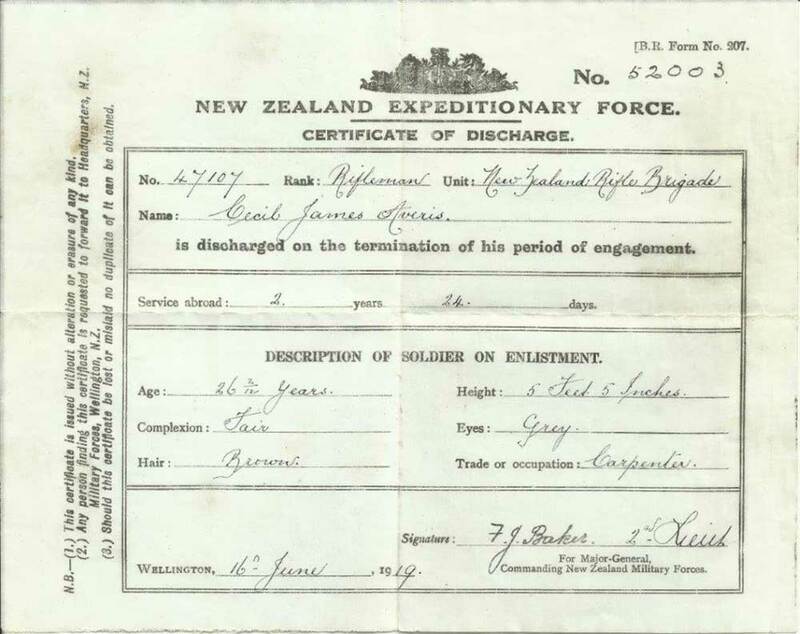 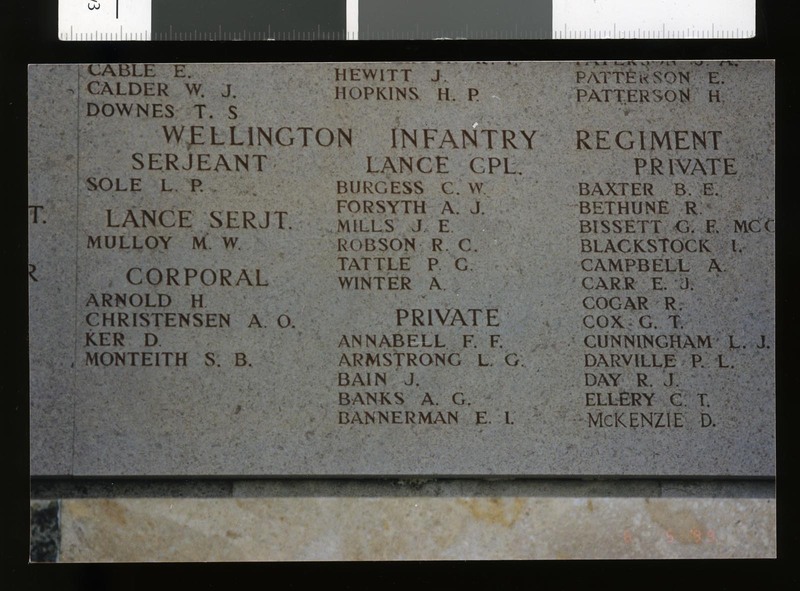 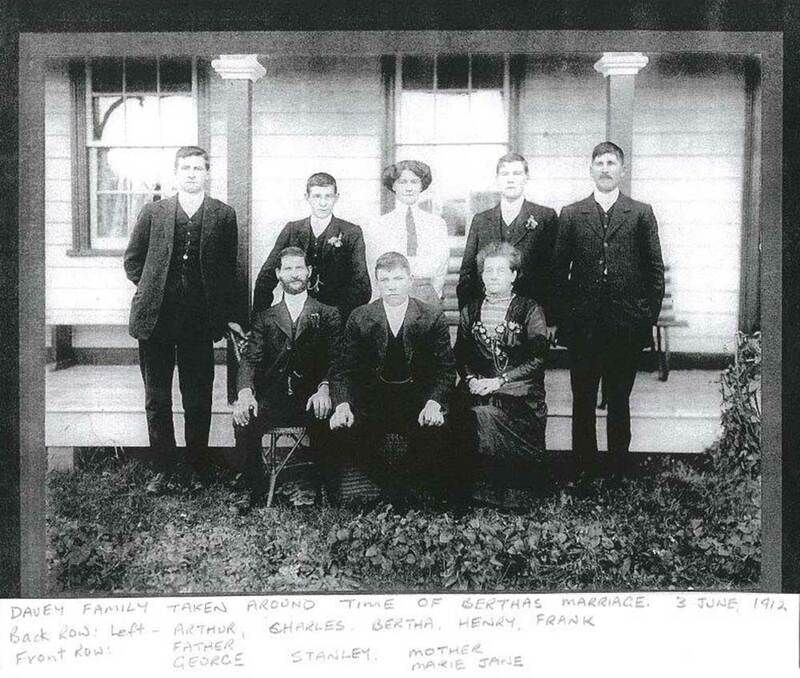 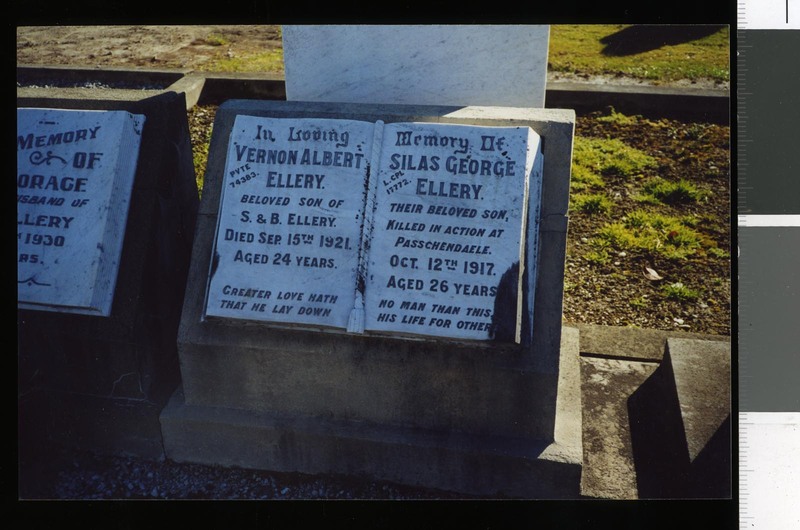 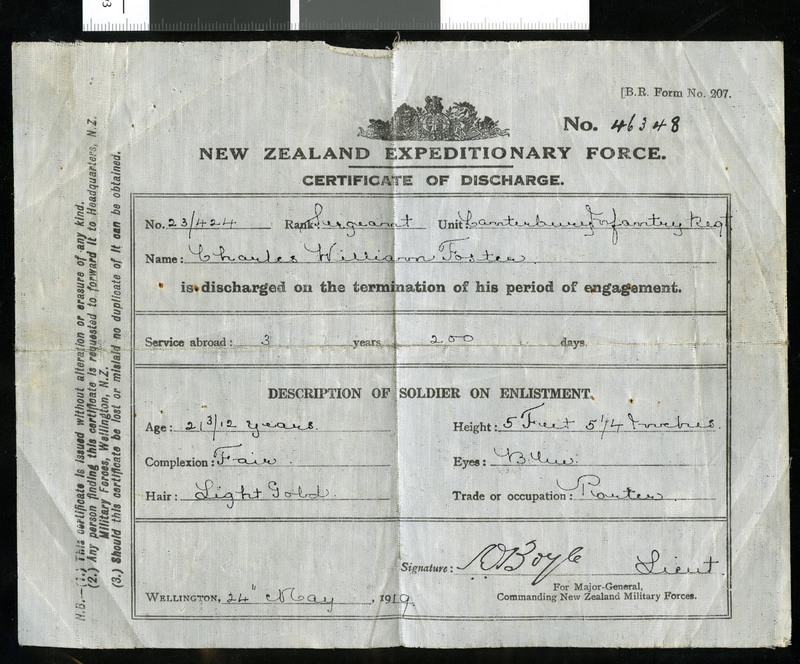 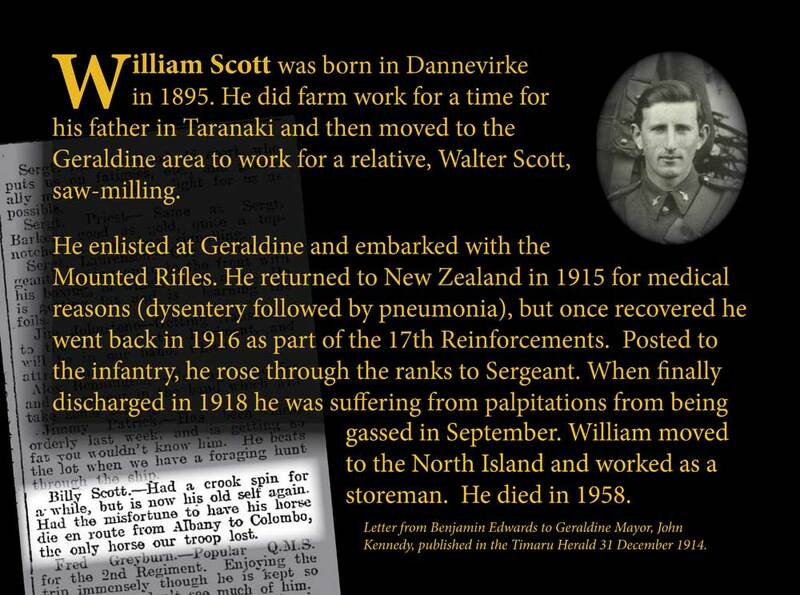 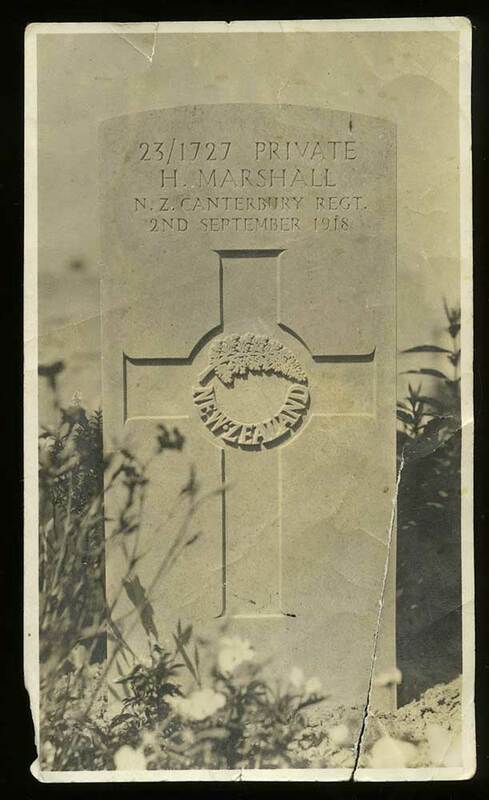 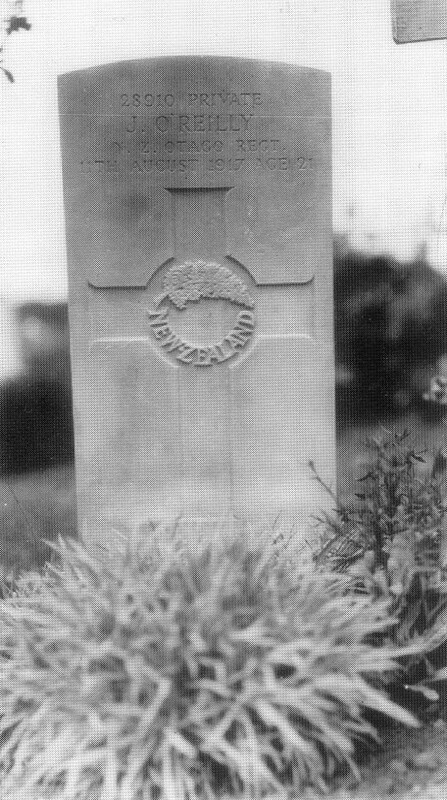 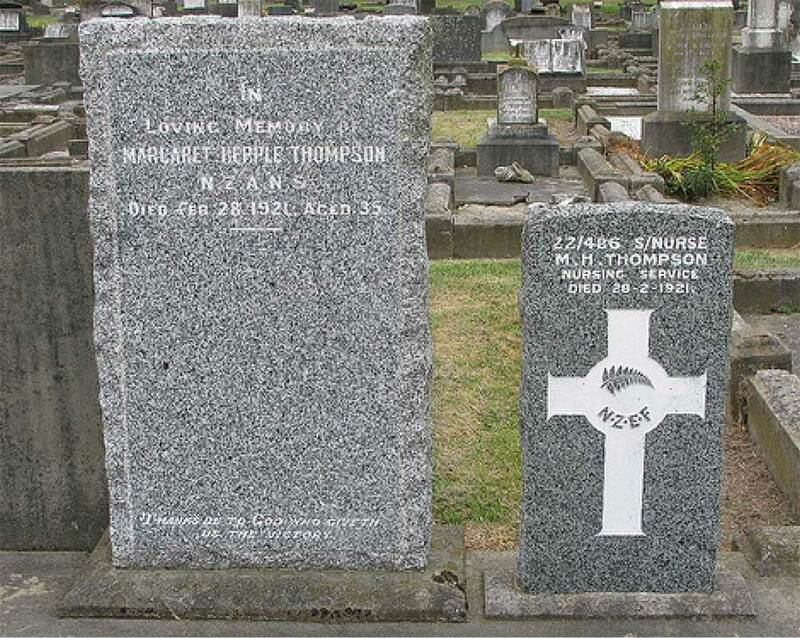 All were 2nd South Canterbury Infantry, except Casey, who was NZ Rifle Brigade. 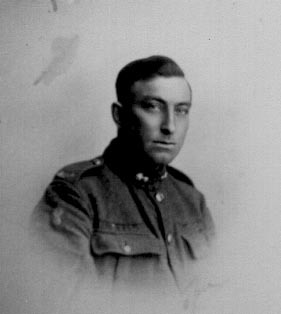 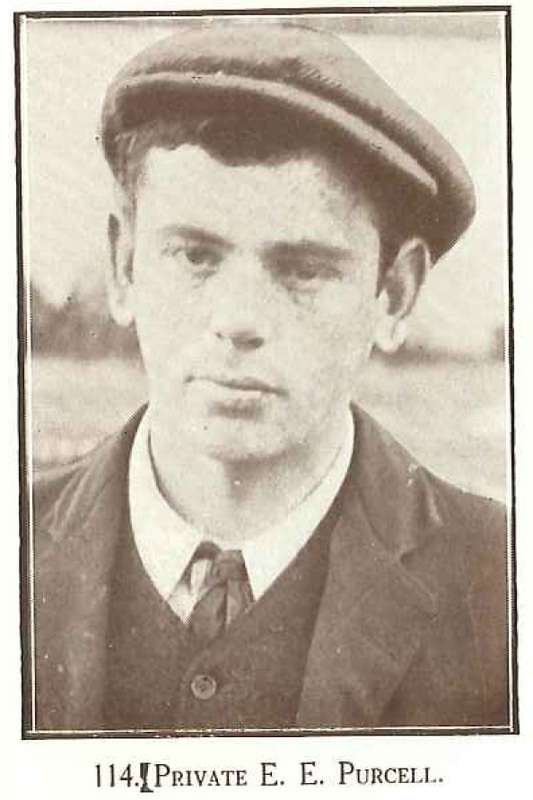 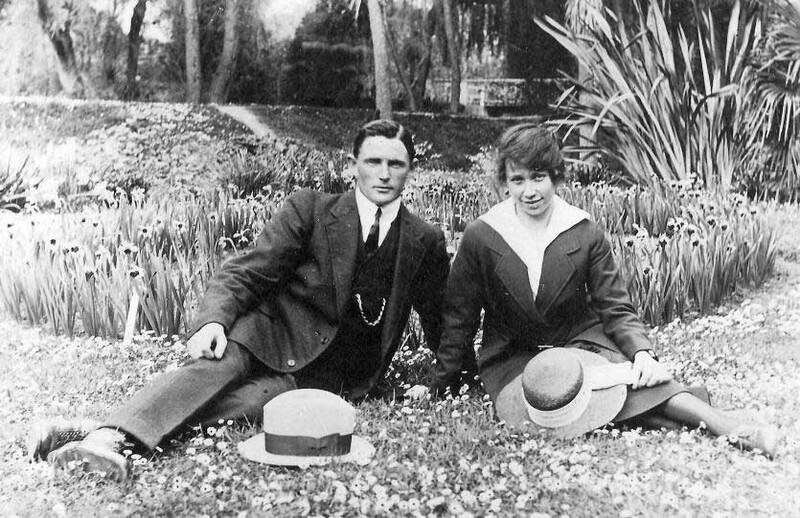 Most embarked in June 1917, except Robert Nelson who didn’t leave until October, meaning the image was probably taken in England. 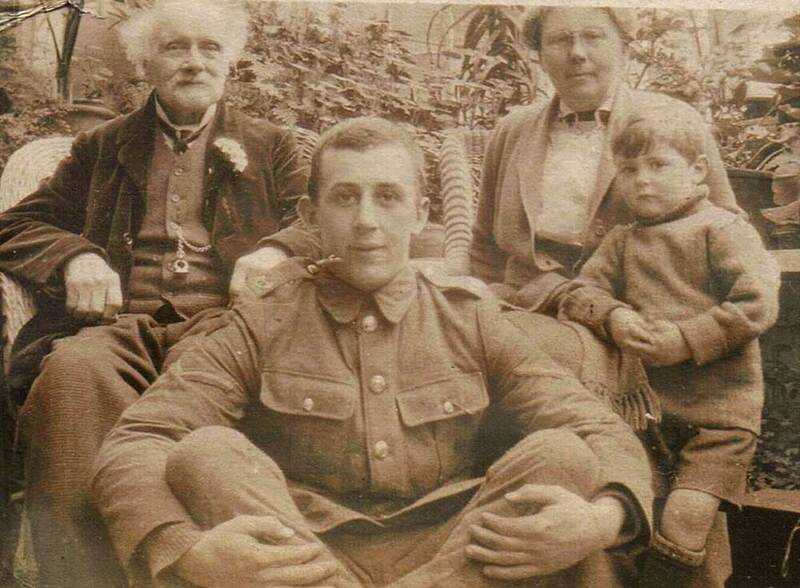 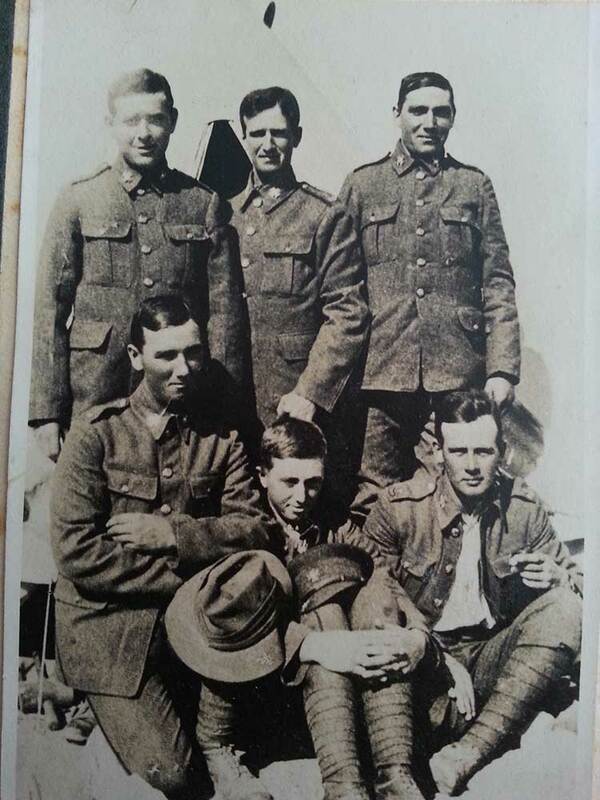 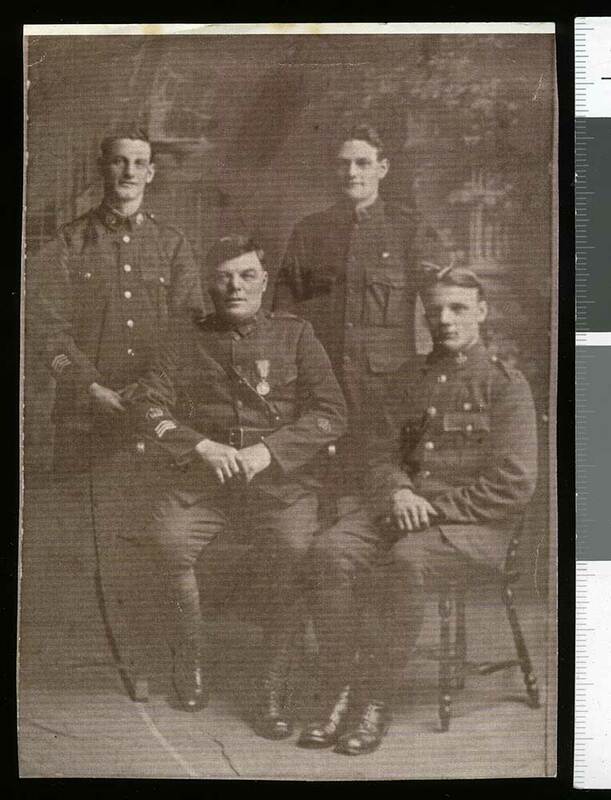 BACK ROW: L/Cpl Arthur George Curtis, Pte William Maylen (DOD), Pte Robert Nelson, Pte William Hugh Corbett, Pte Adam Corbett (KIA). 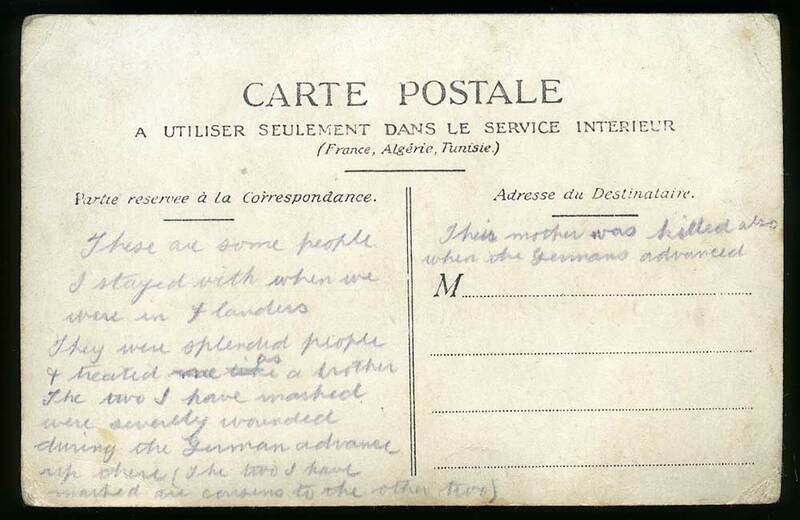 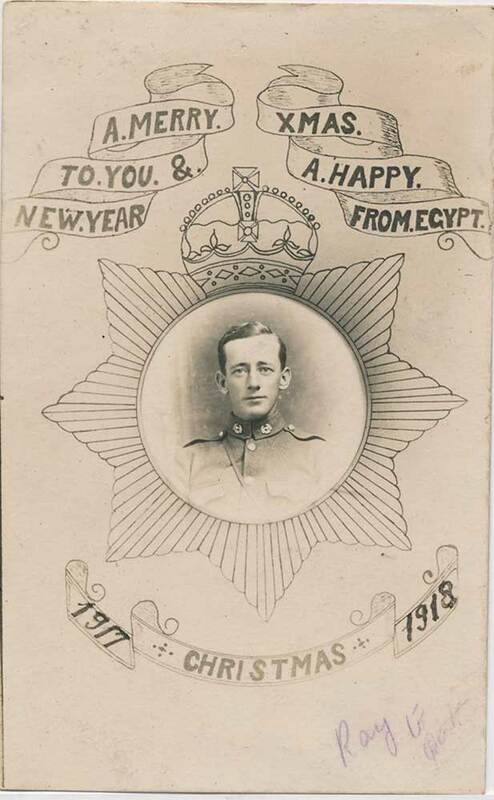 A postcard, bearing the message "To my own dear son at the front", from T J Ross of Seaforth at Washdyke, Timaru, to Alister (Alex) Ross, serving in France, dated 9 June 1918. 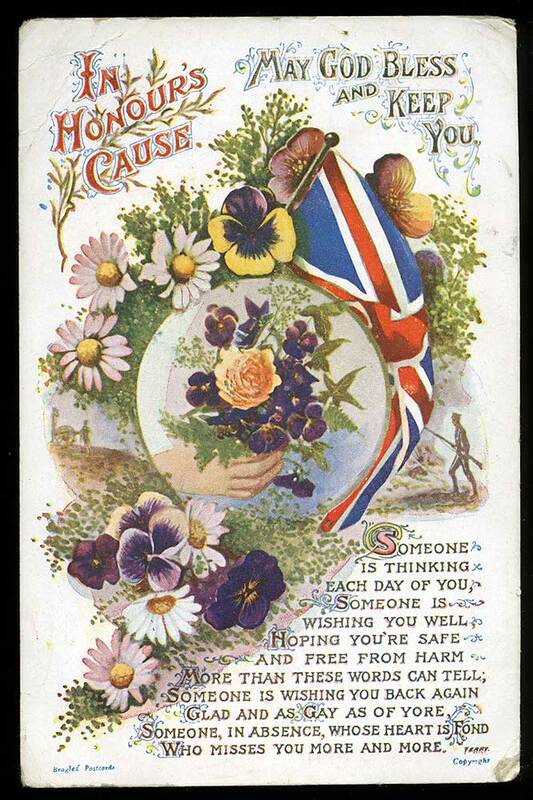 The reverse bears a message of love and best wishes to Alex from home. 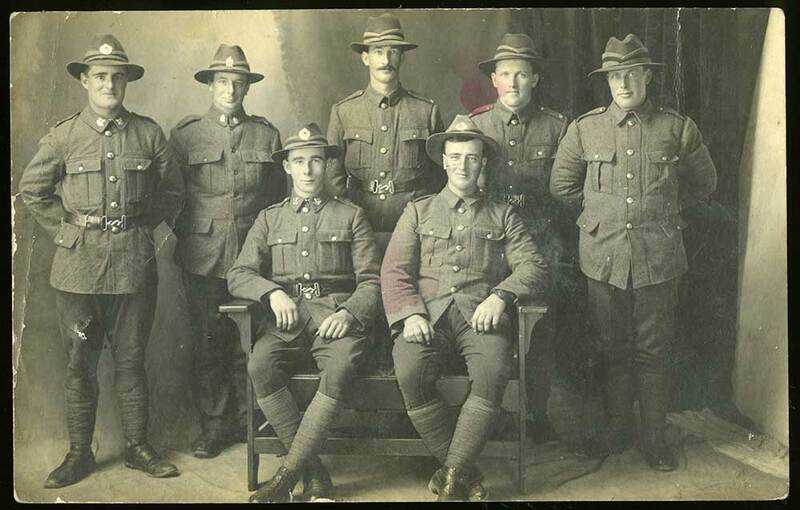 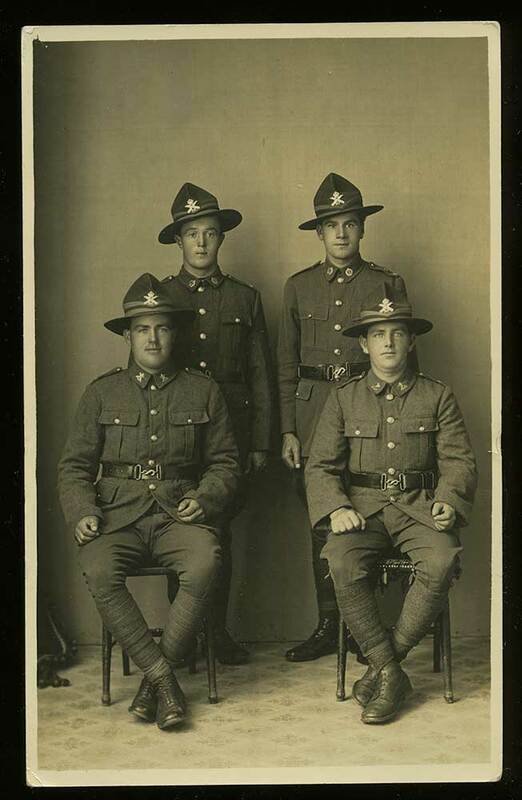 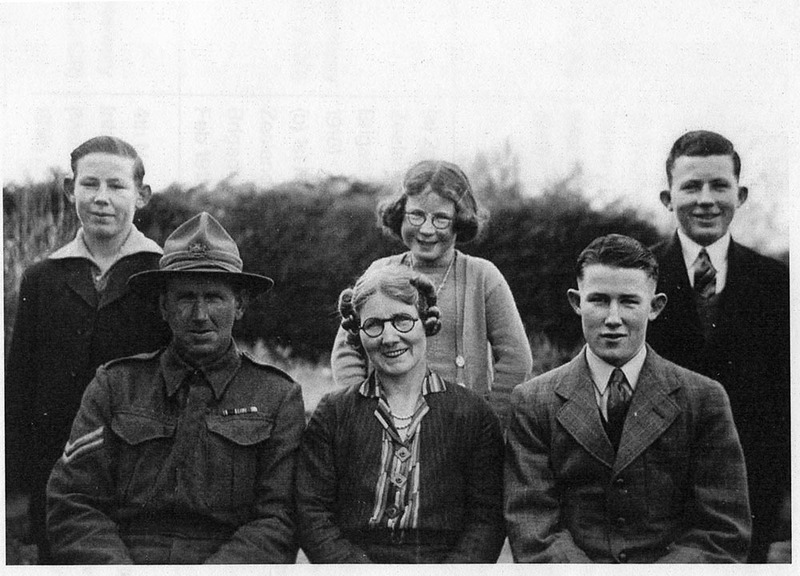 Portrait of "Four Timaru Boys" including Alister Ross (front left, service no.62883), circa 1918. 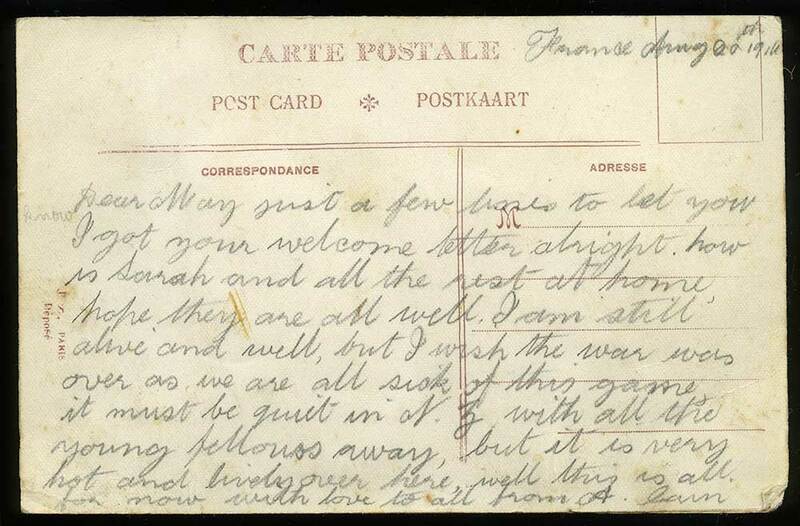 The verso bears a message of love and best wishes to Alex from home. 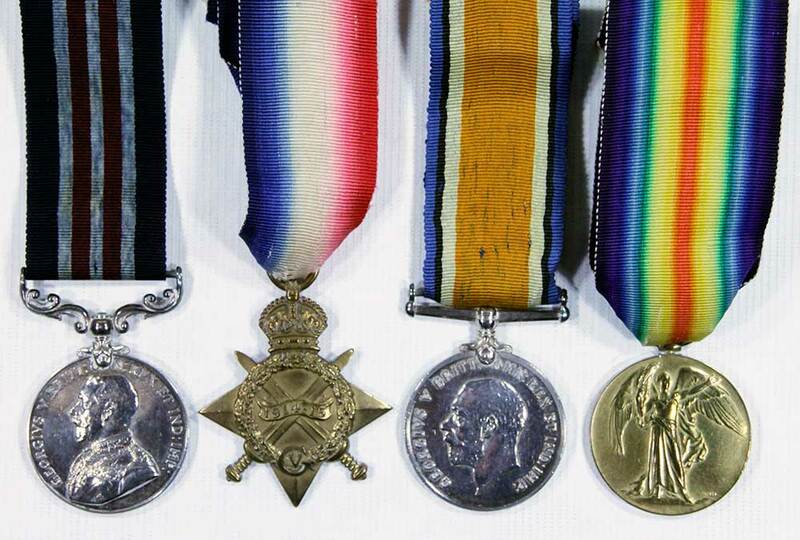 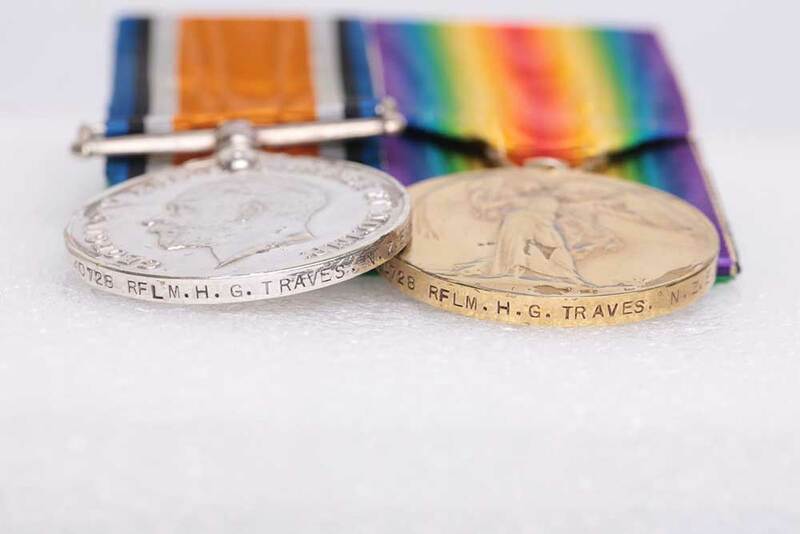 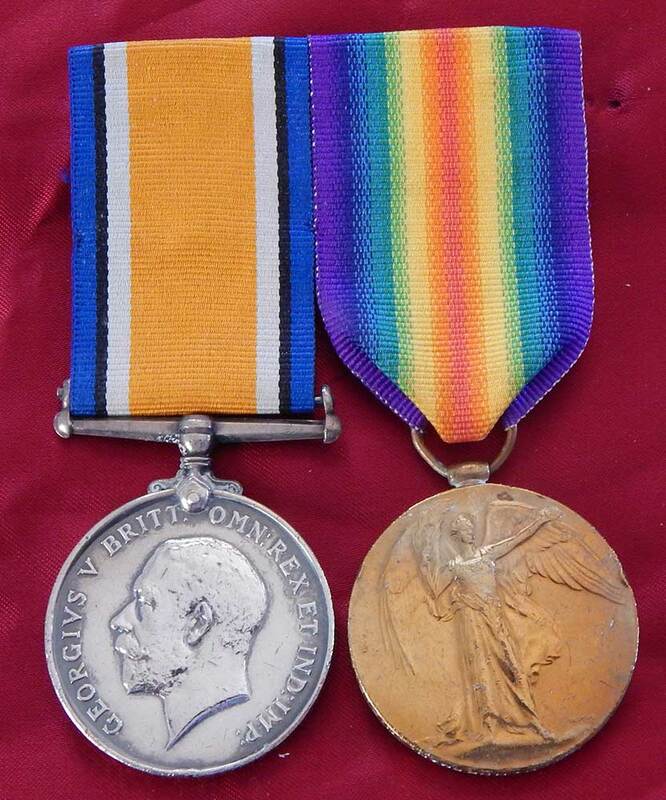 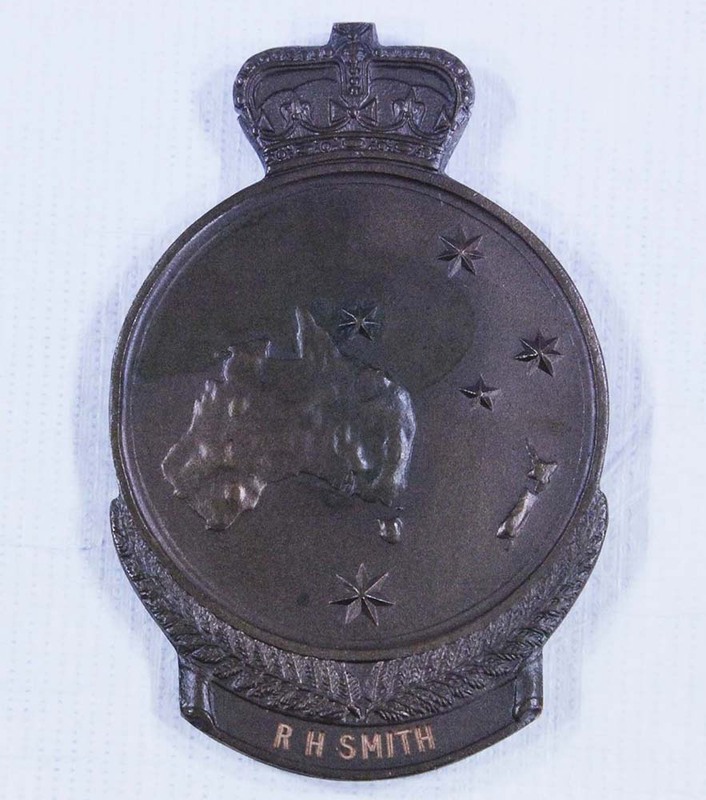 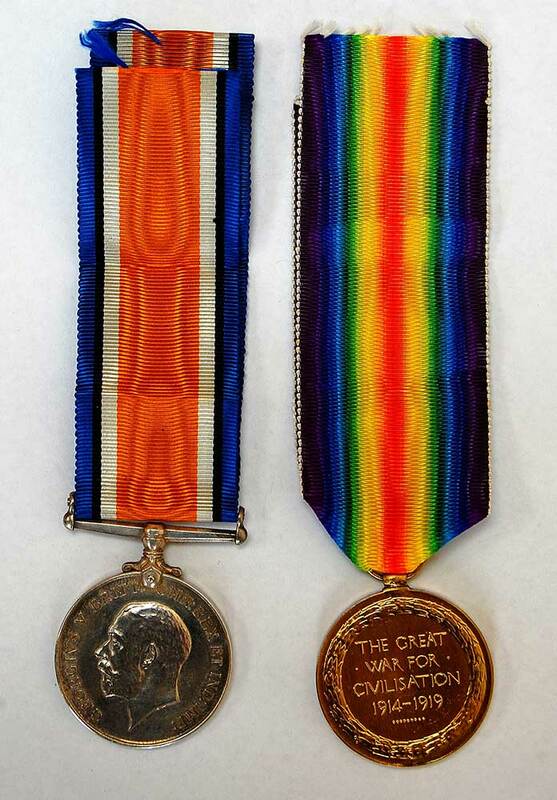 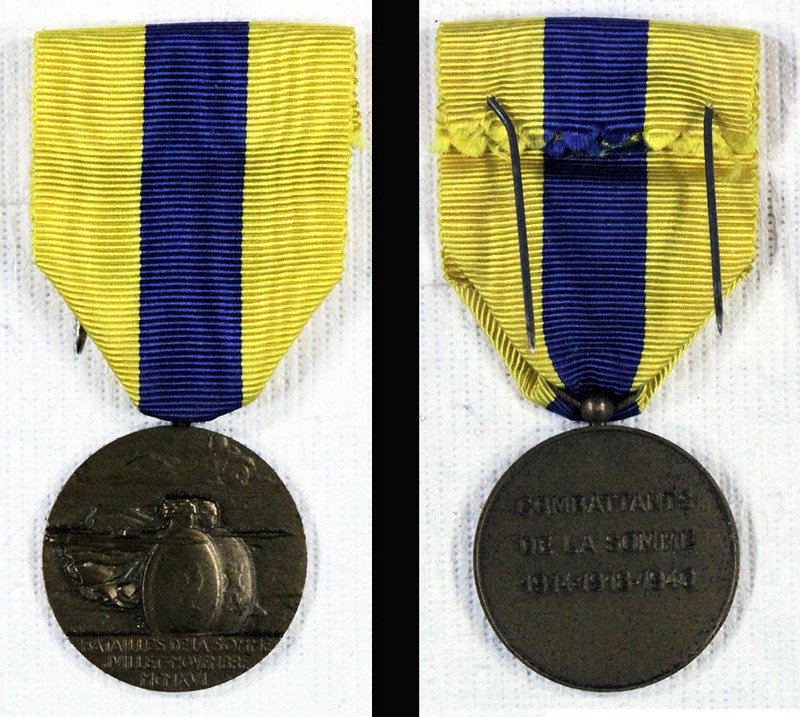 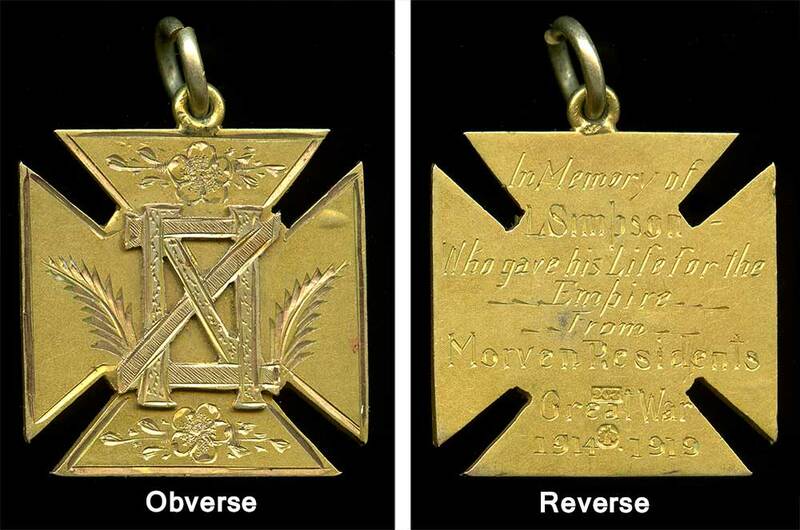 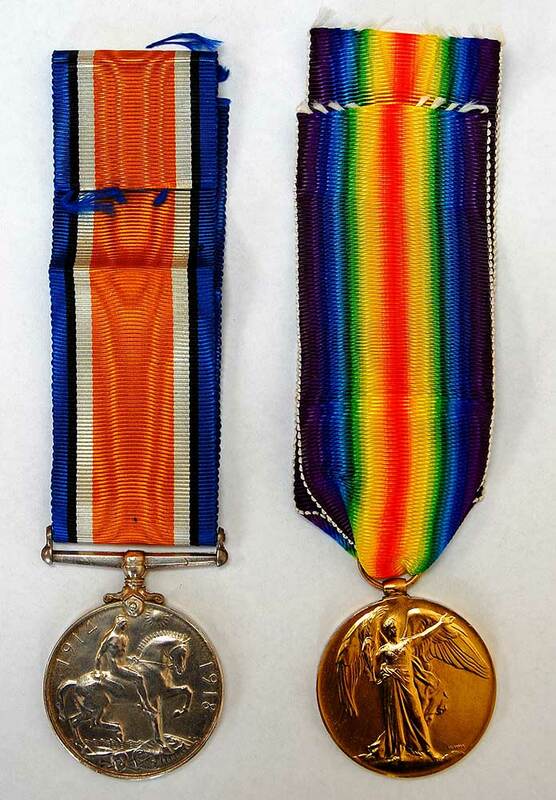 Includes the 1914-1915 Star (left) and British Victory Medal (right). 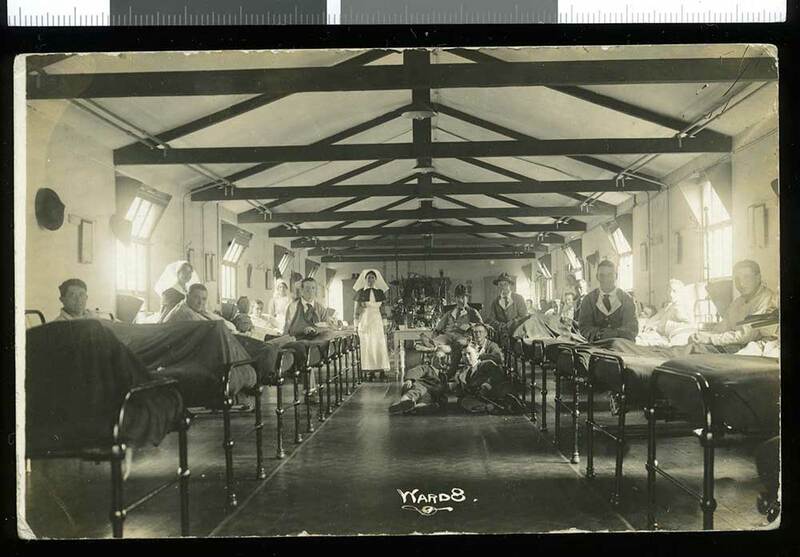 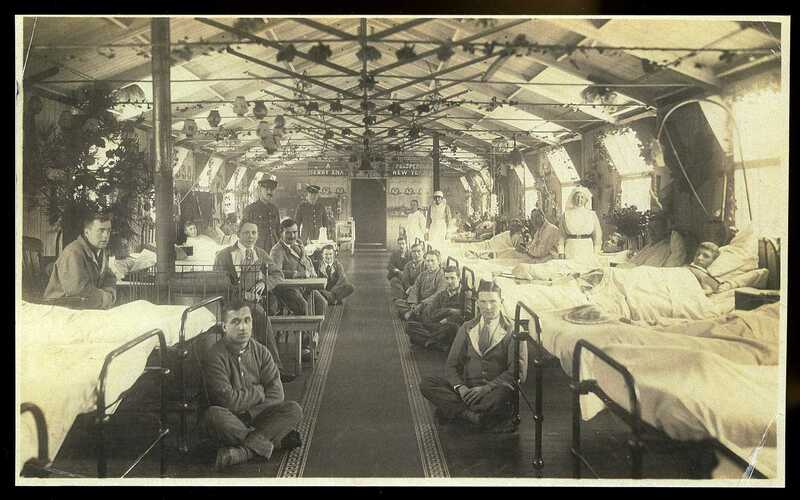 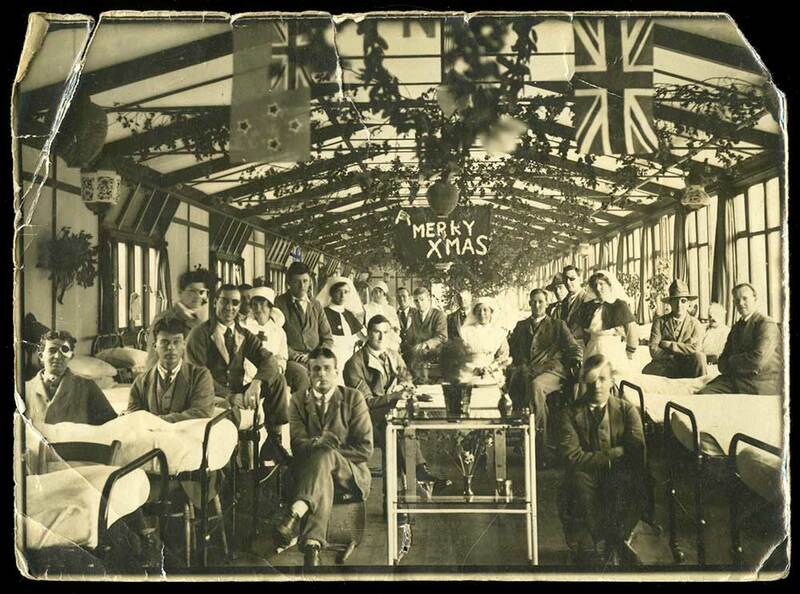 "This is the photo of the hospital ward I was in at Christmastime - some of the Xmas decorations - Two Doctors, two nurses and orderly and some of the 34 patients. 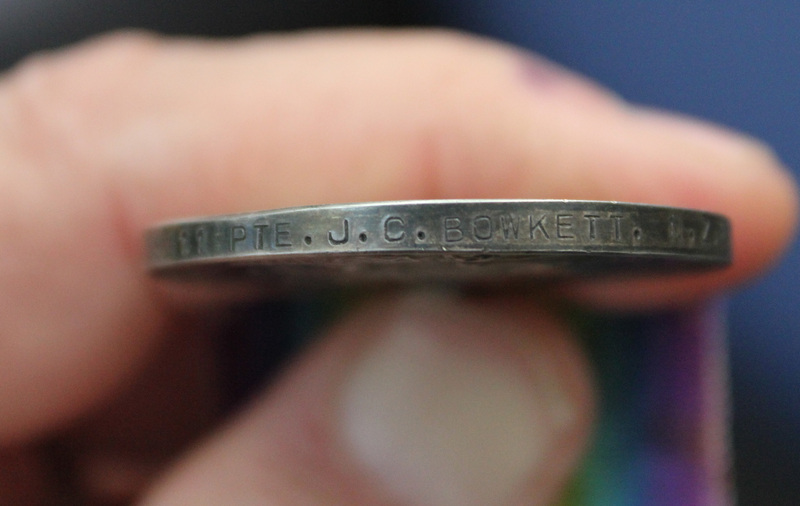 Have marked myself. 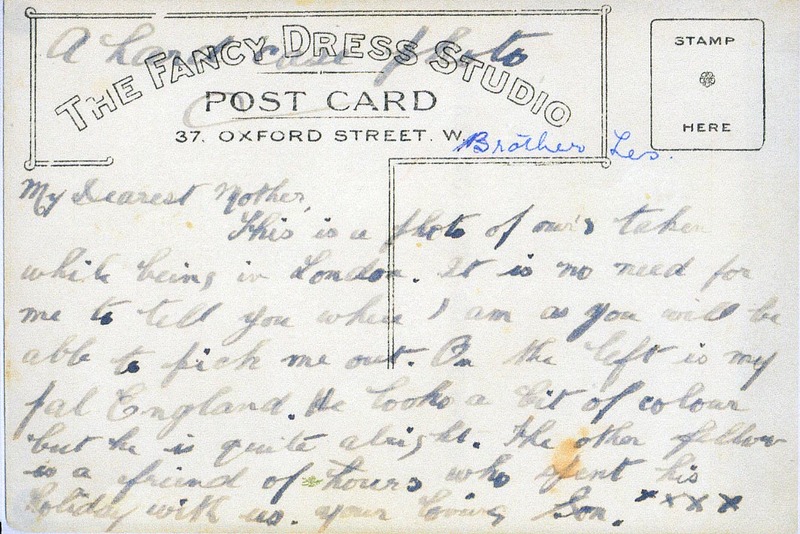 From Will." 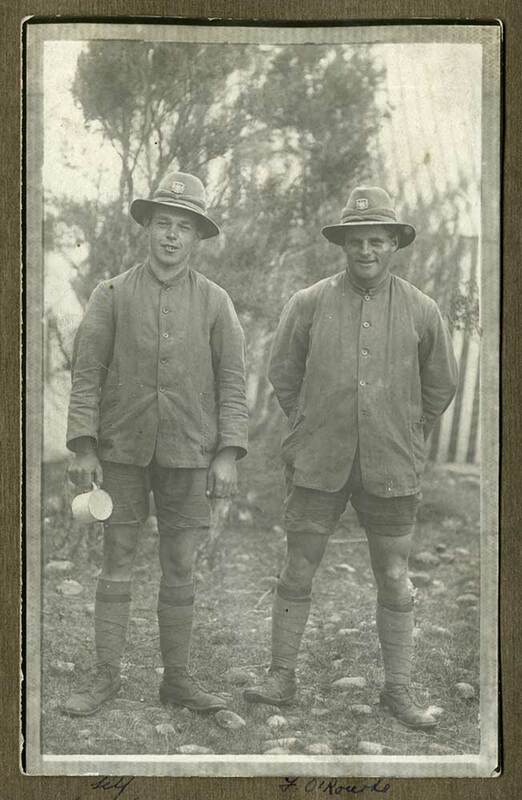 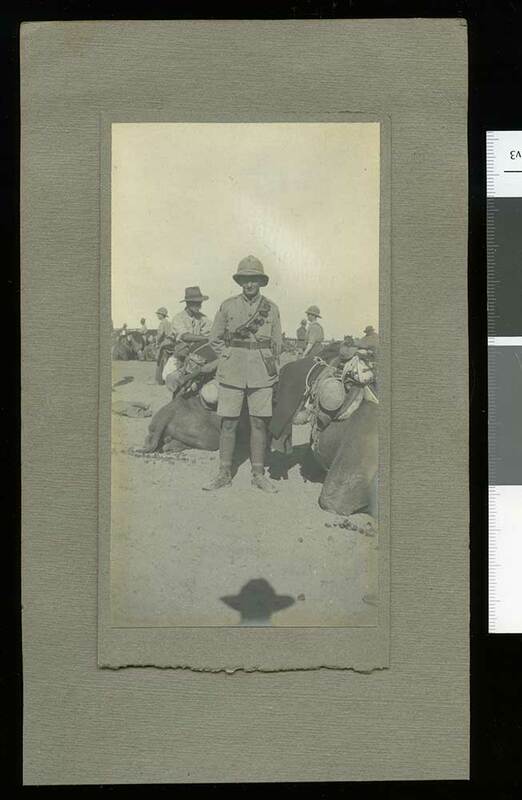 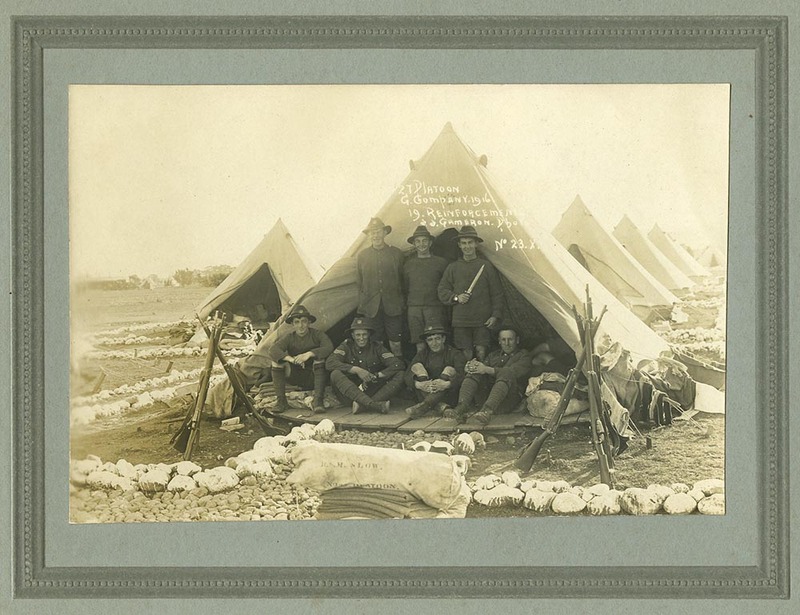 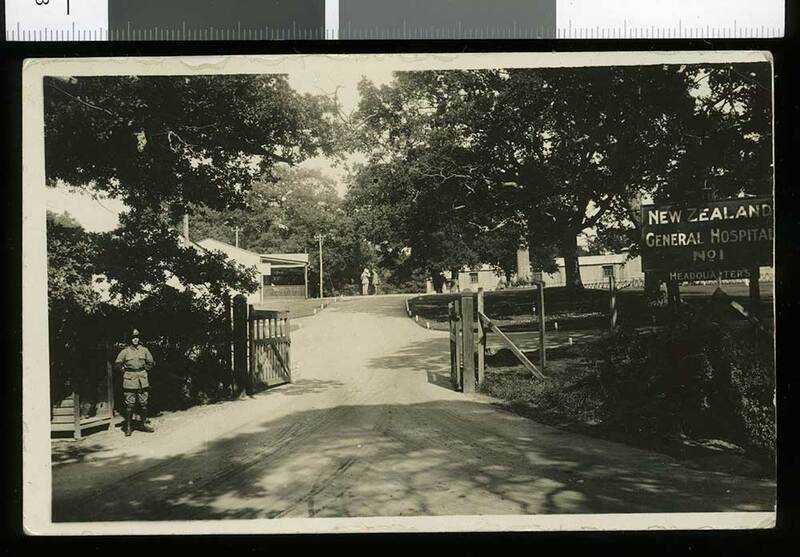 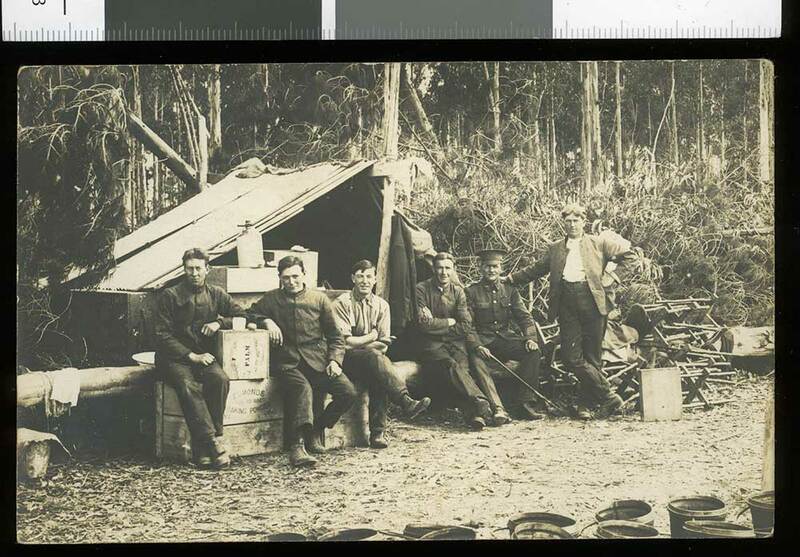 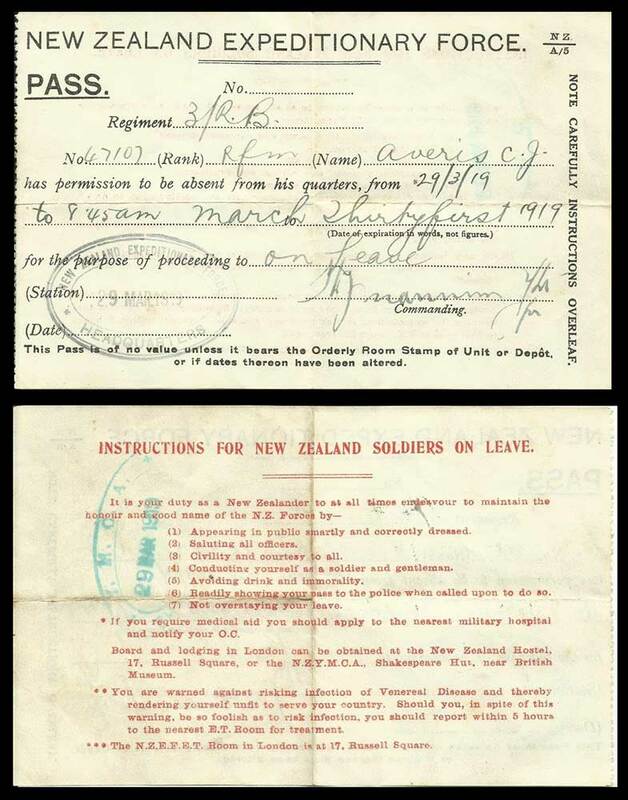 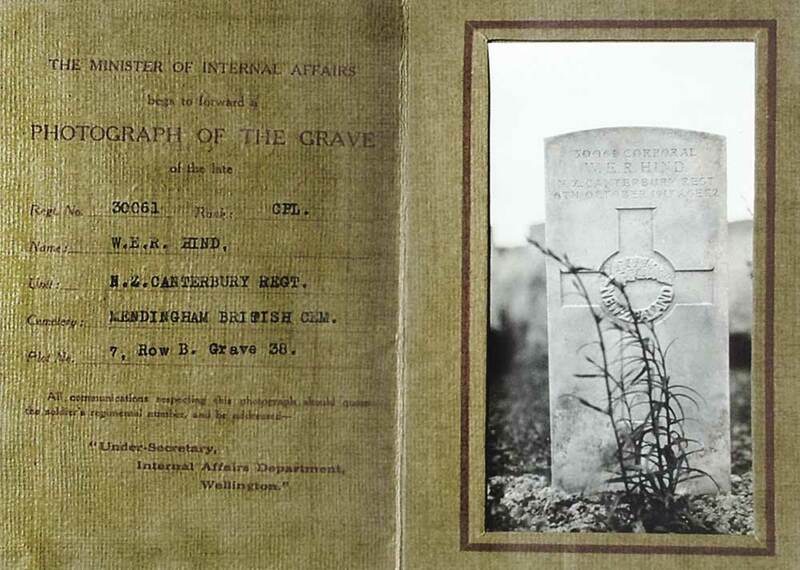 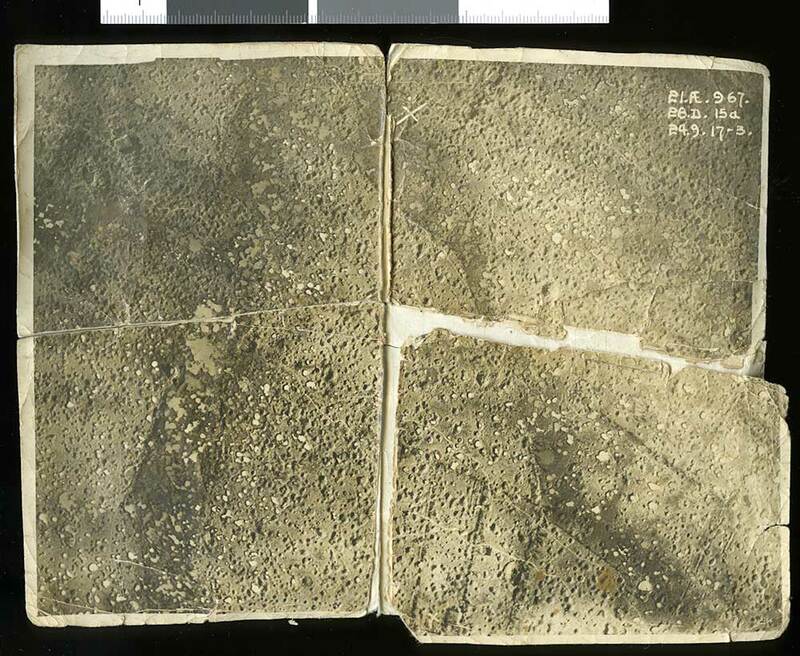 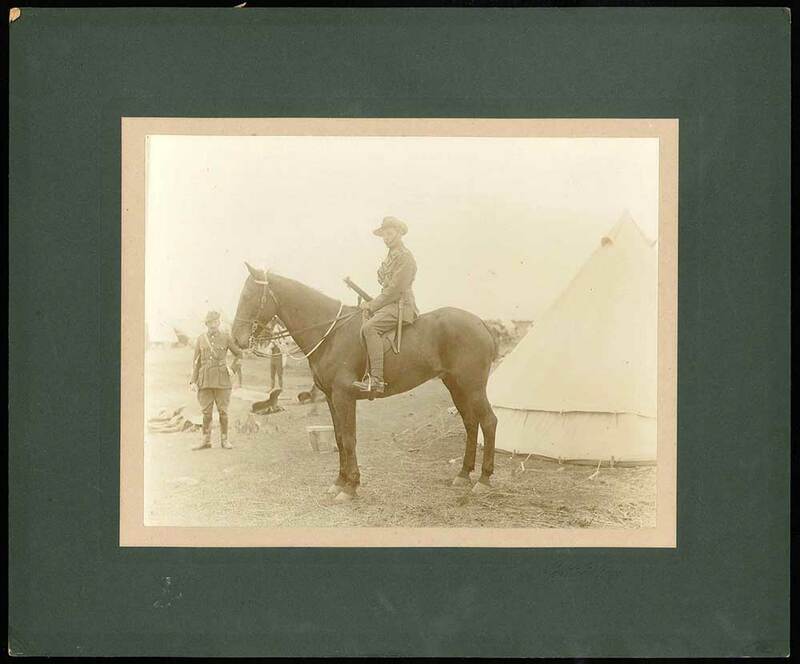 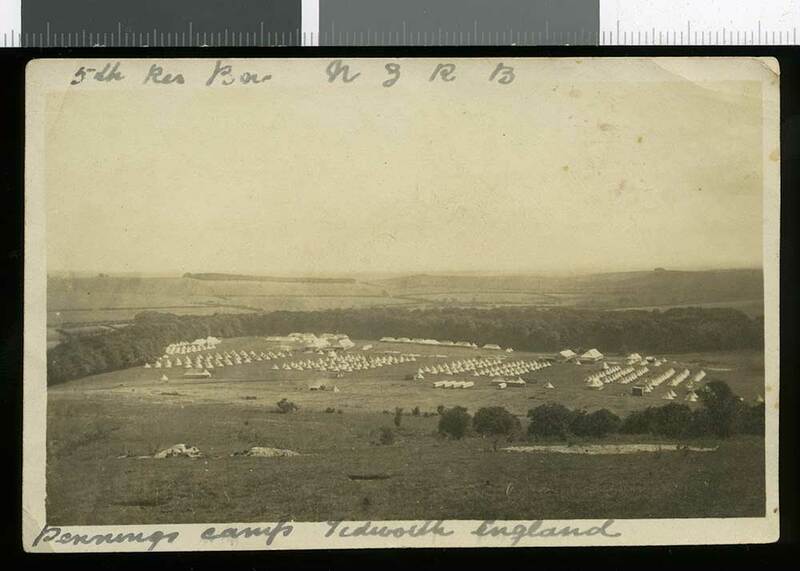 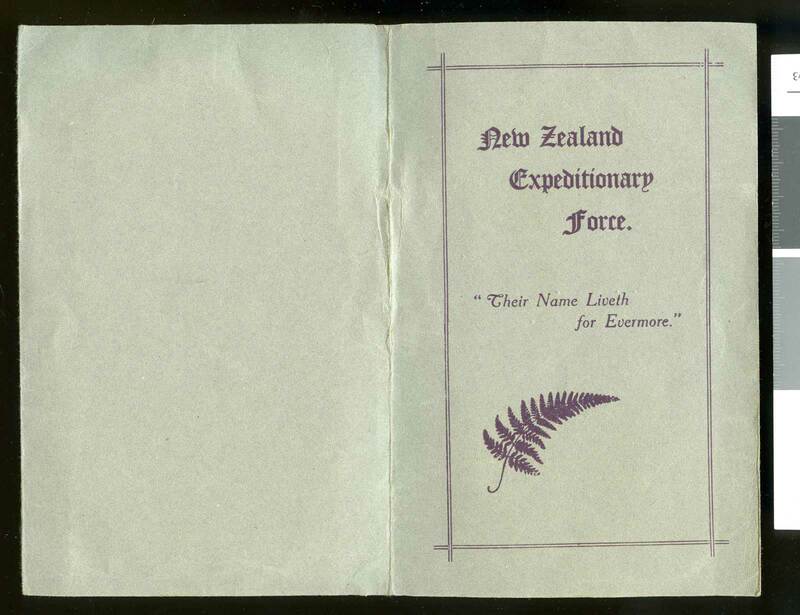 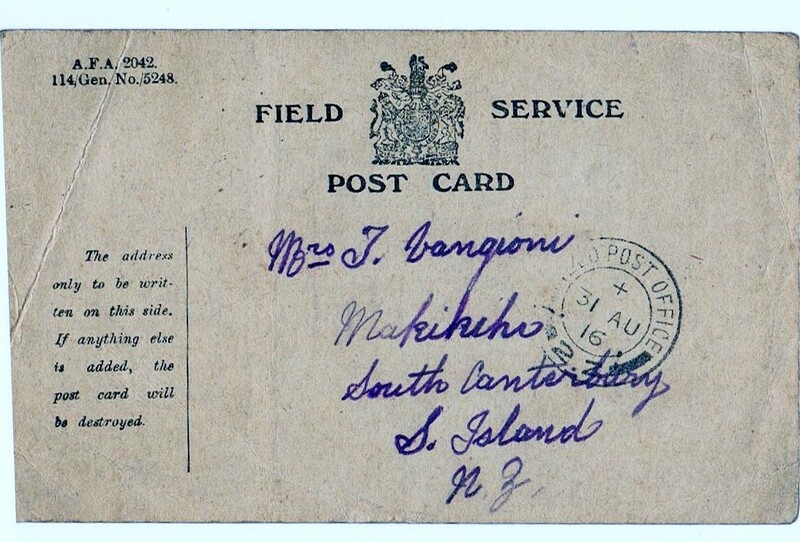 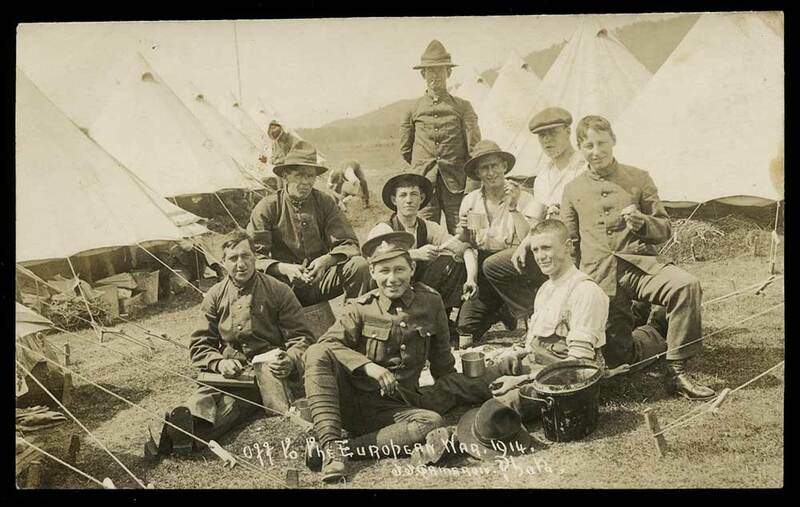 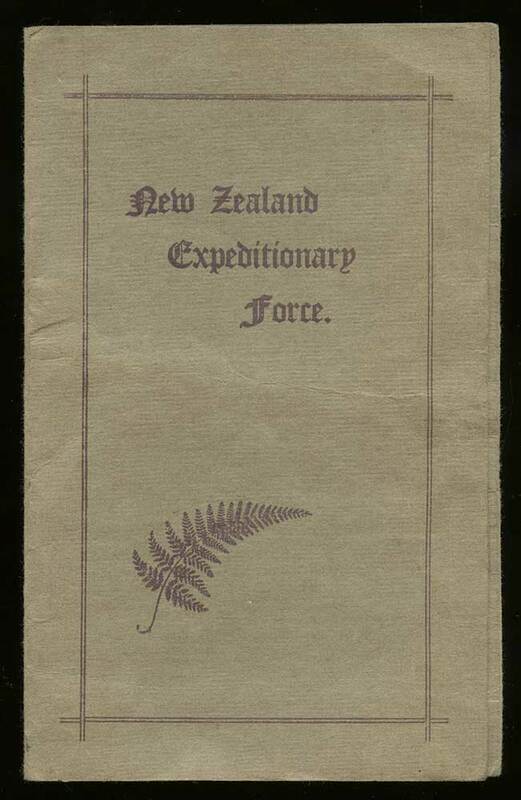 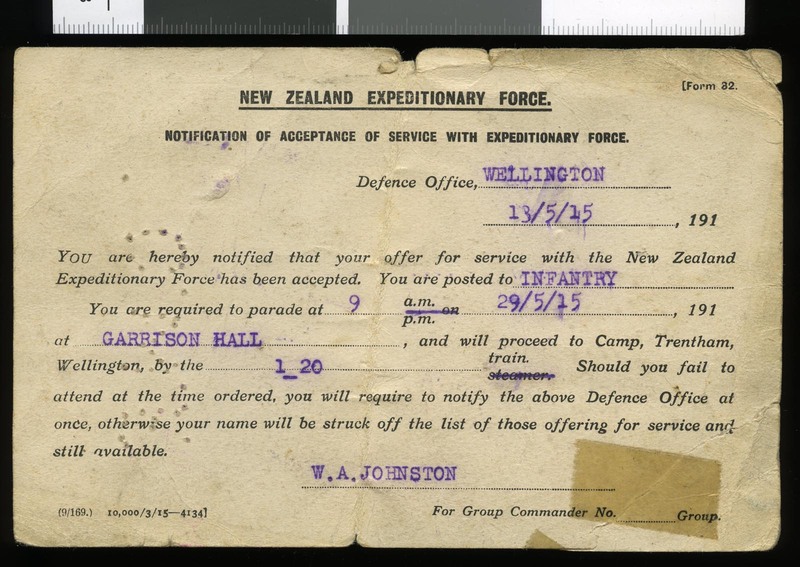 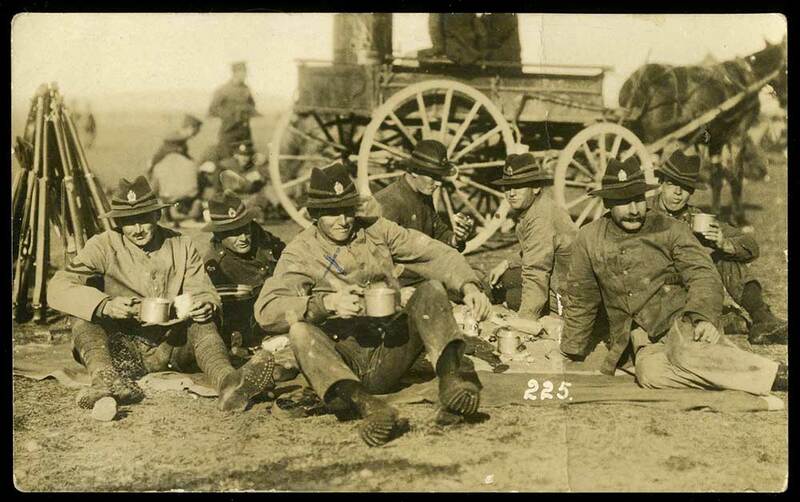 Labelled in the margin "5th Res Bn NZRB" and bears a message on the verso which reads "This is a photo of Pennings Camp Tidworth. 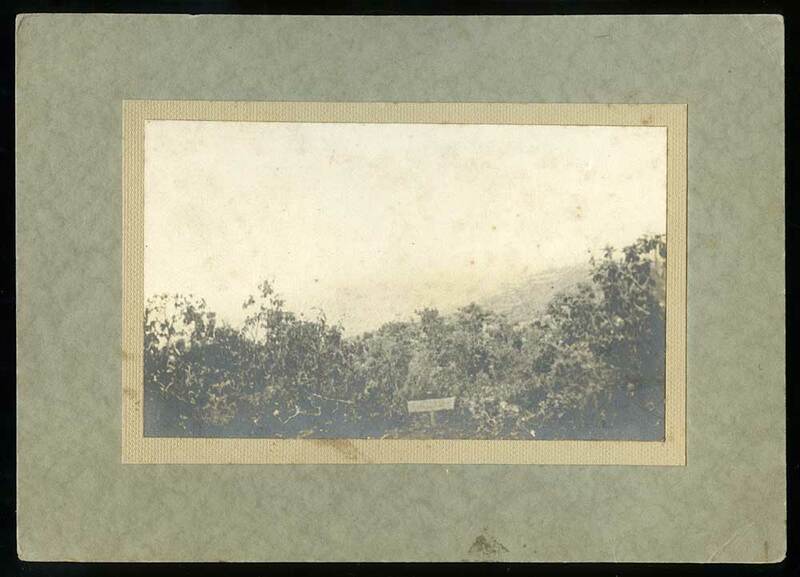 It was taken from a hill along side which was the site of an old Roman fortification". 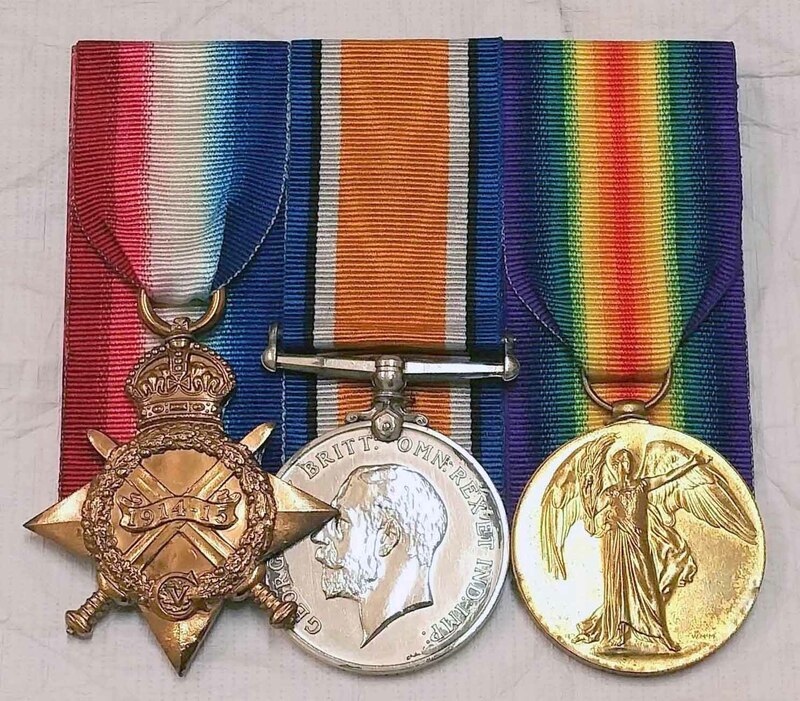 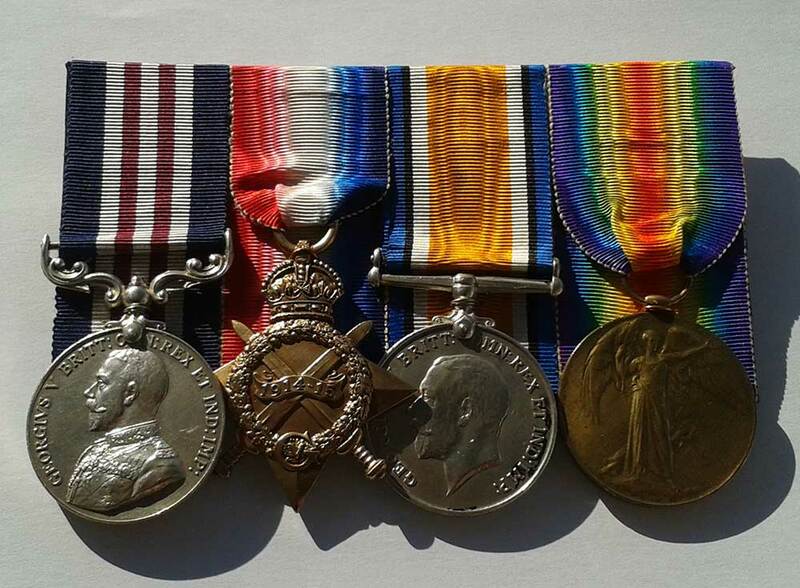 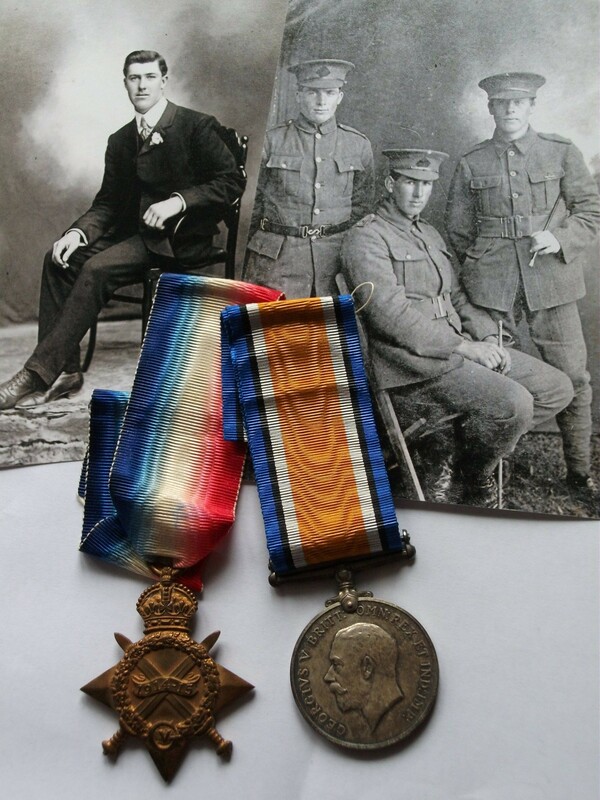 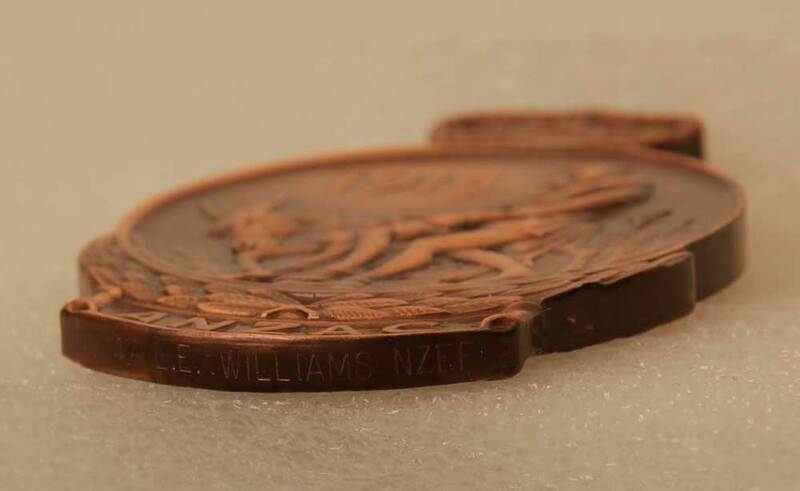 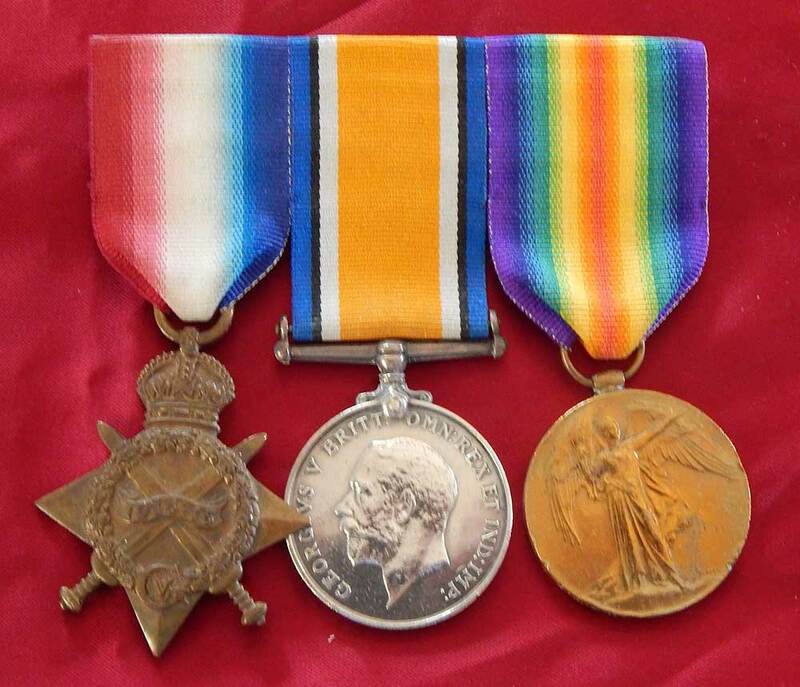 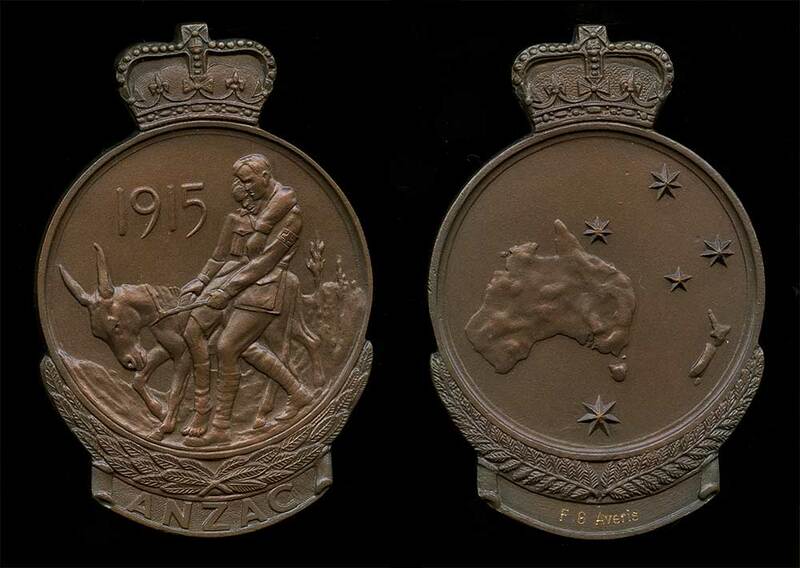 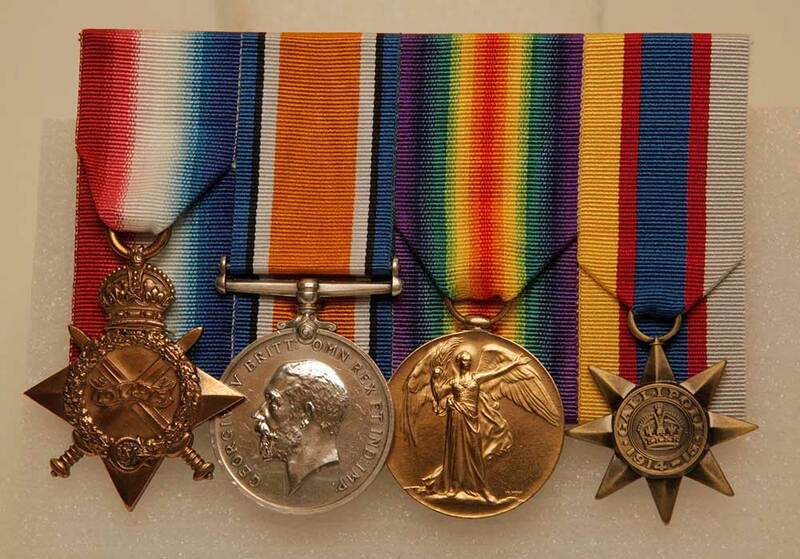 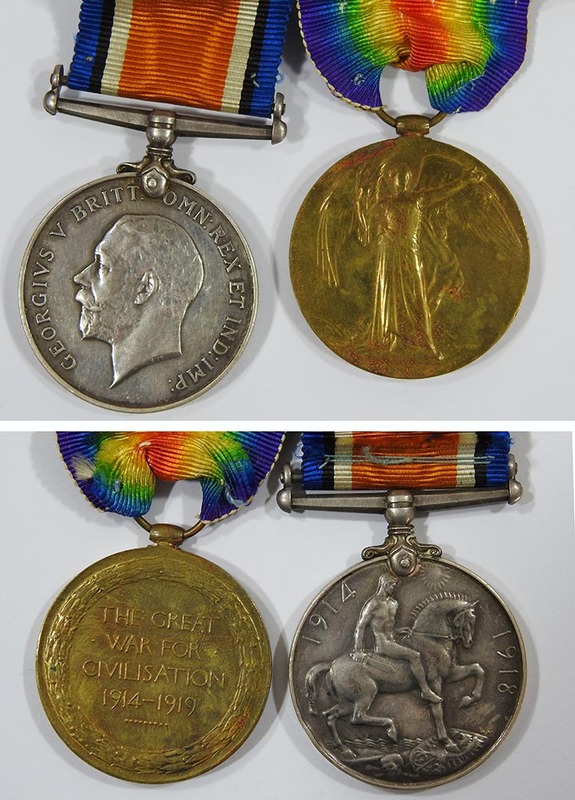 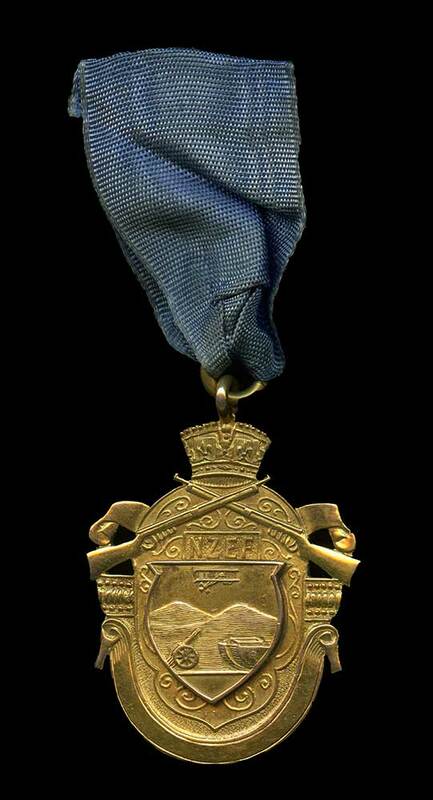 British War Medal, Victory Medal, War Medal 1939-45 and NZ War Service Medal. 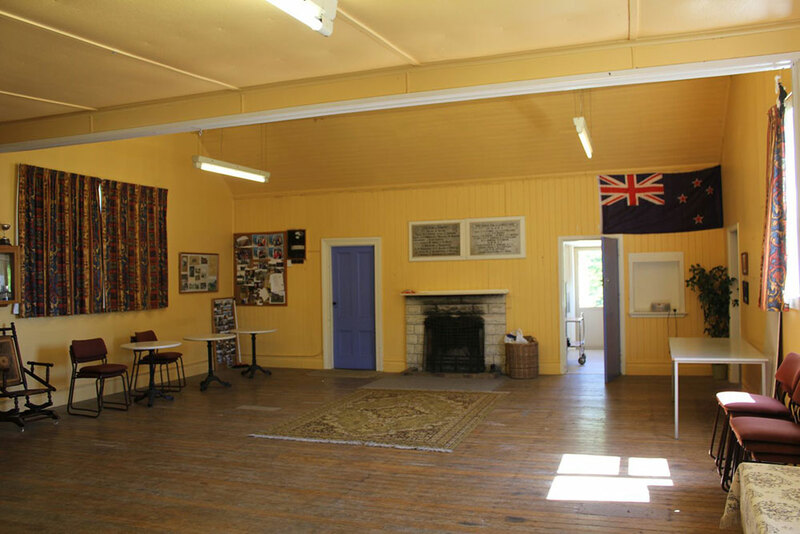 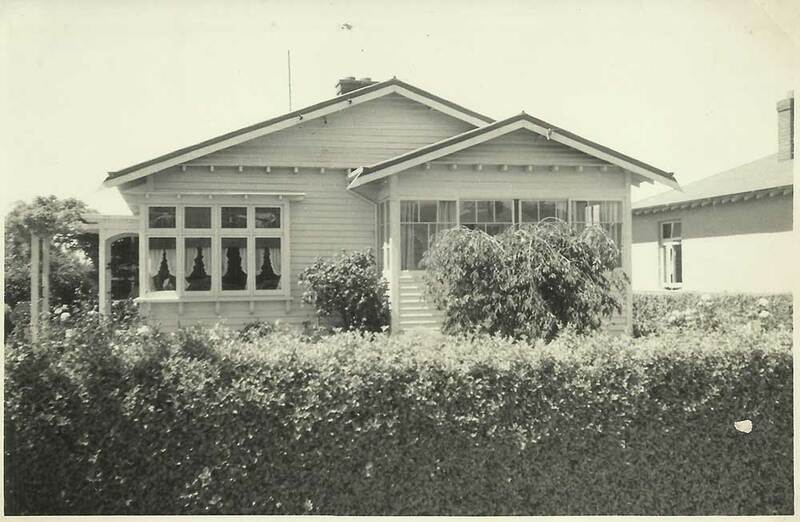 The plaque above the building’s door reads: “Geraldine Hockey Club Memorial Pavilion. 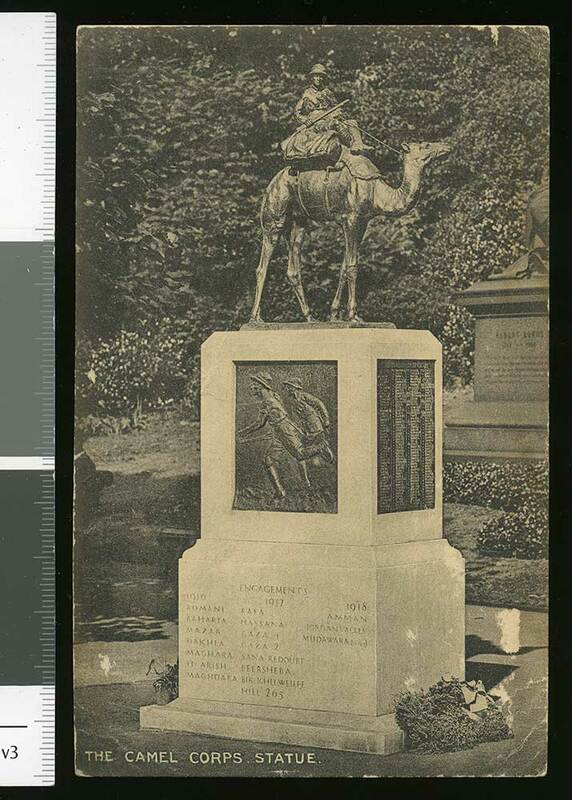 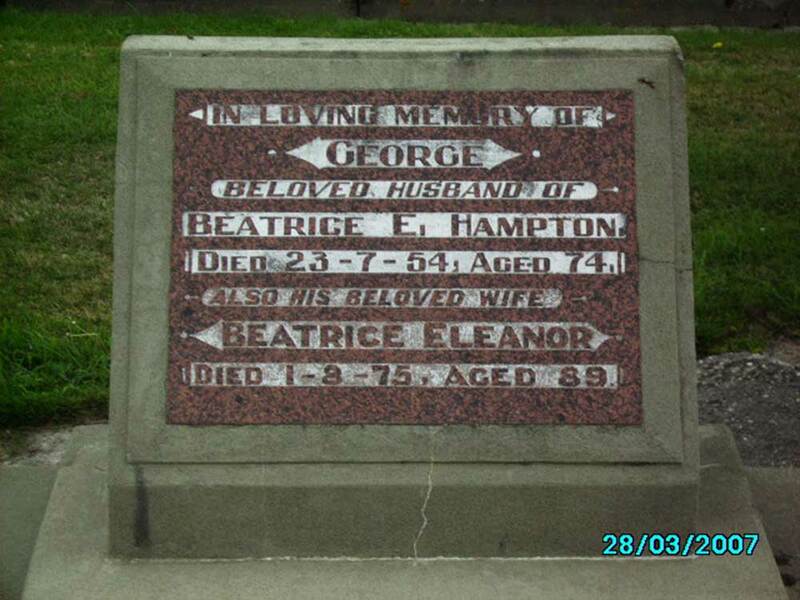 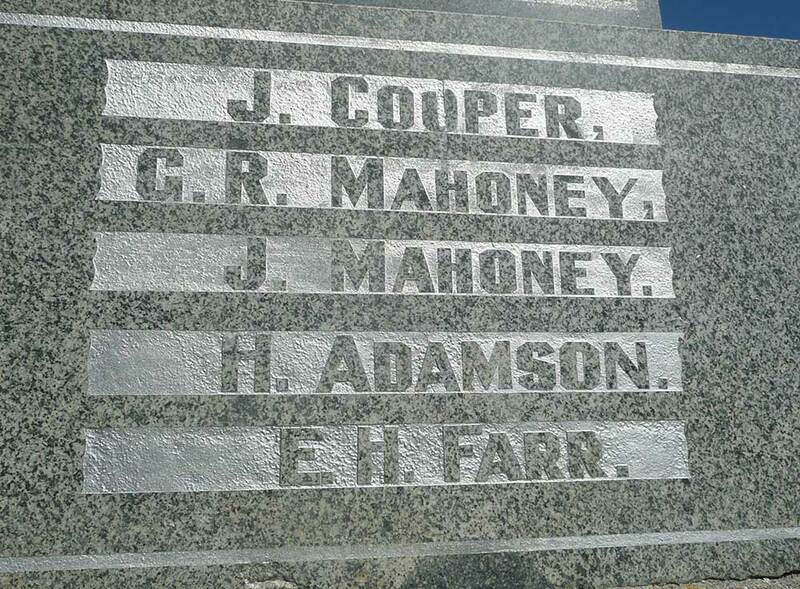 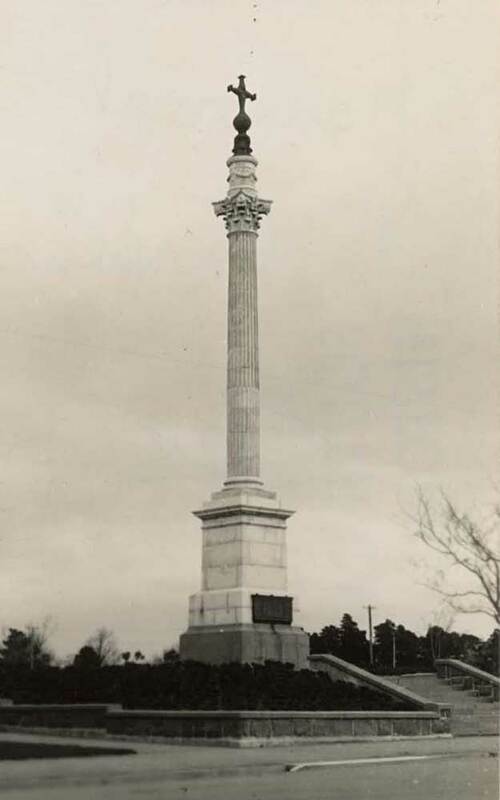 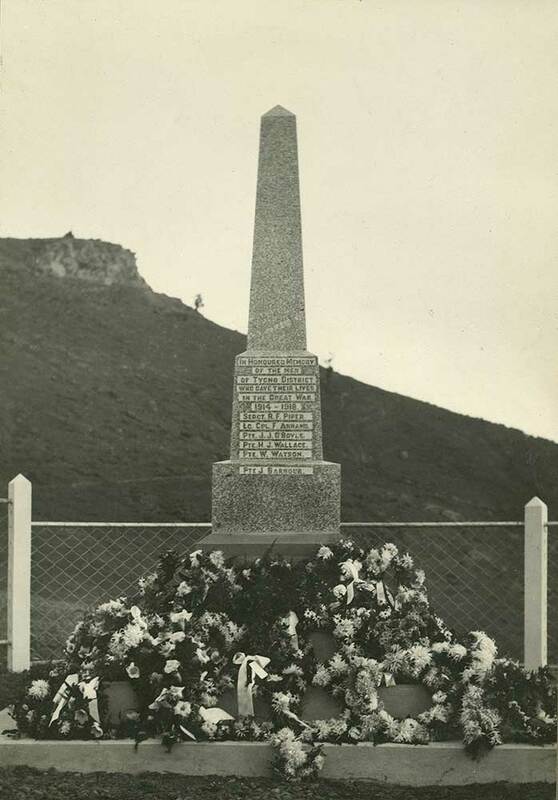 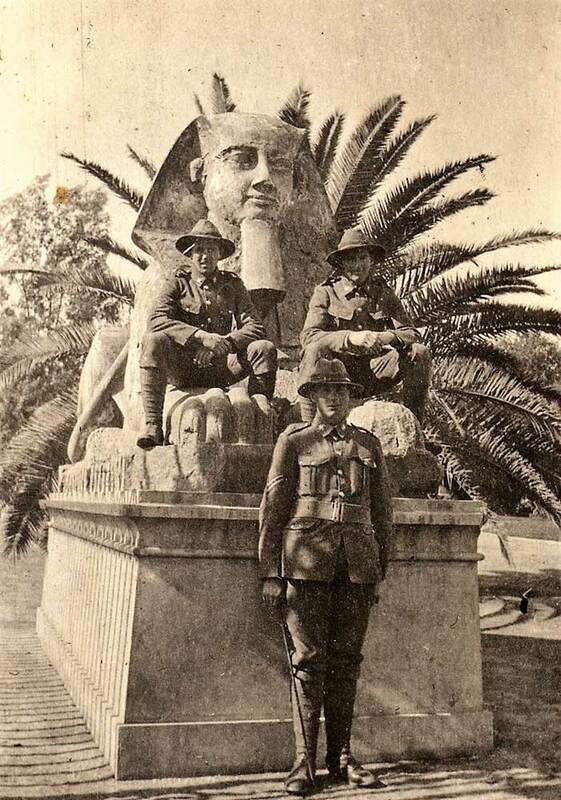 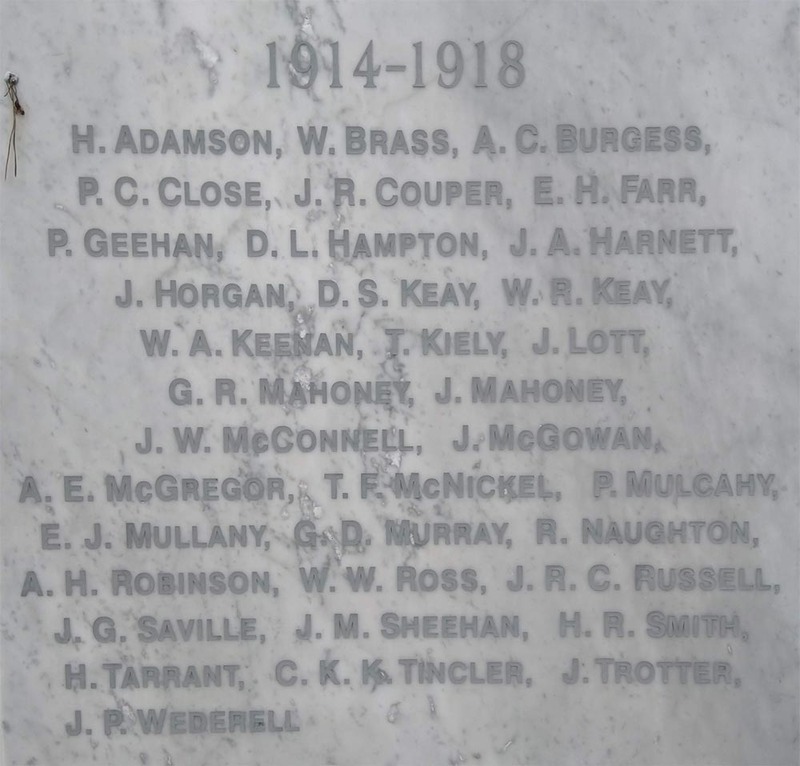 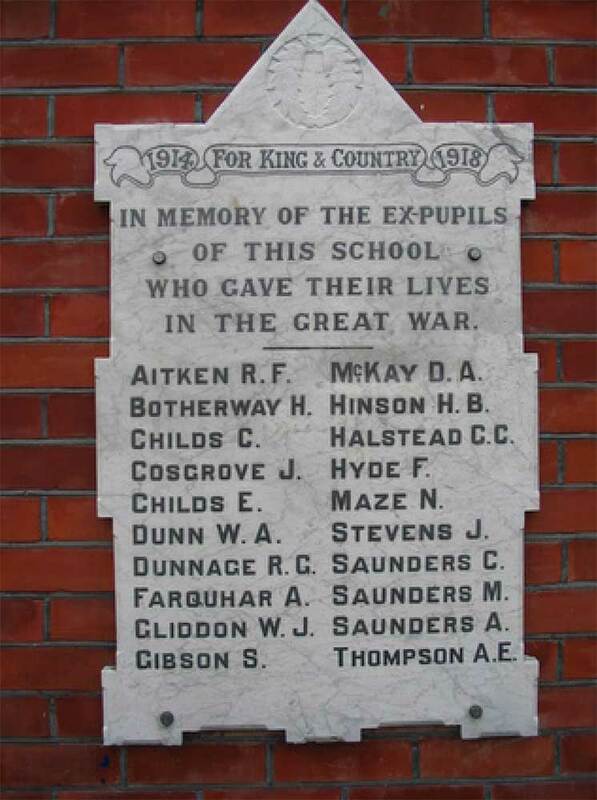 Erected by the members in memory of their comrades who fell in the Great War 1914-1918”. 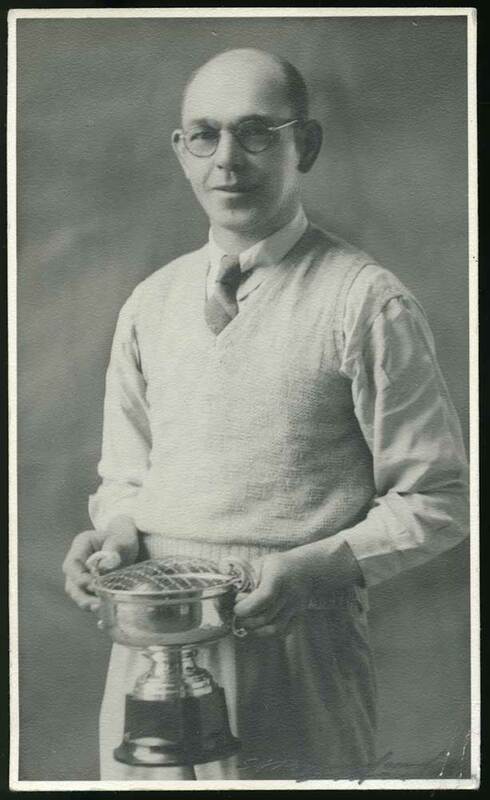 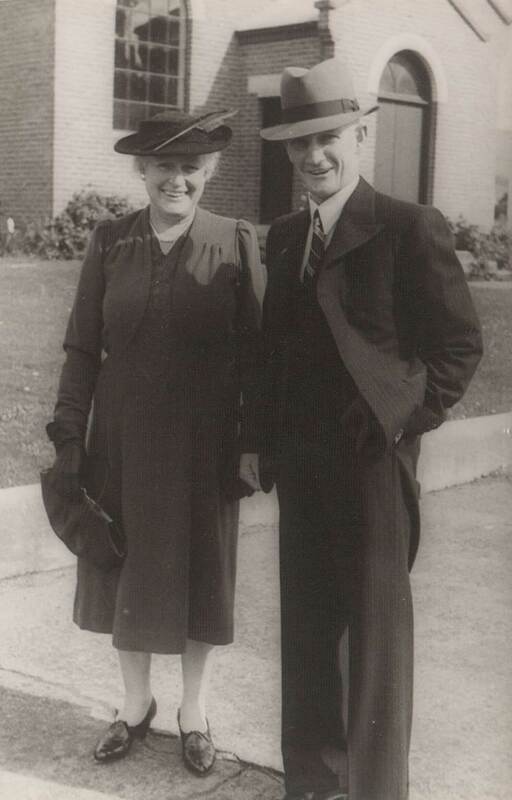 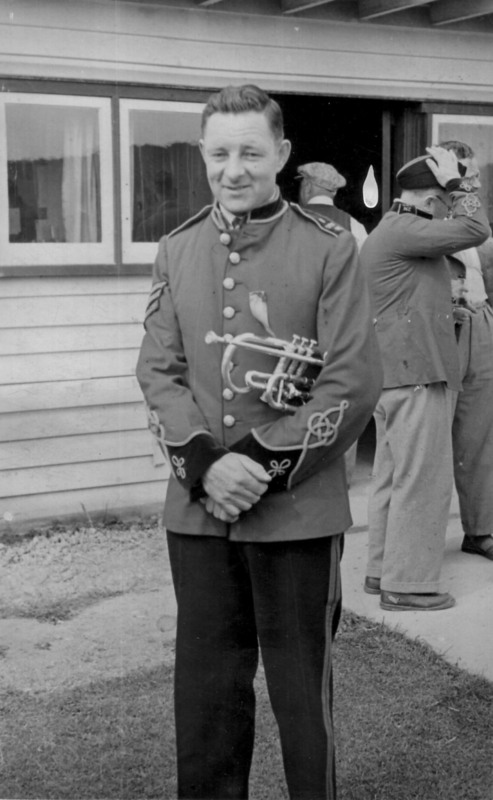 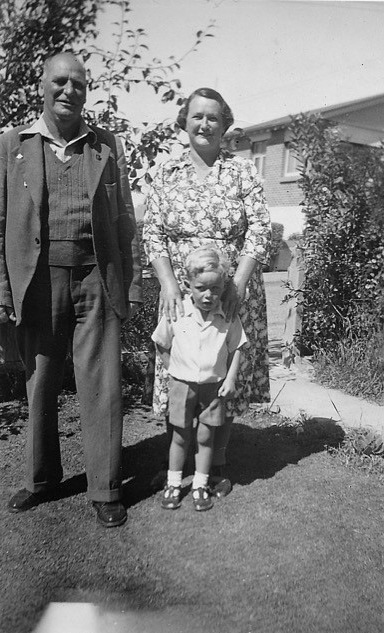 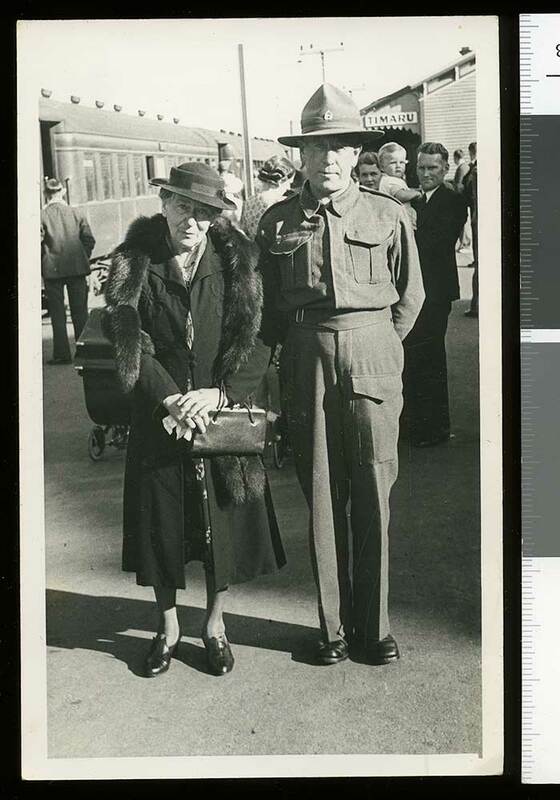 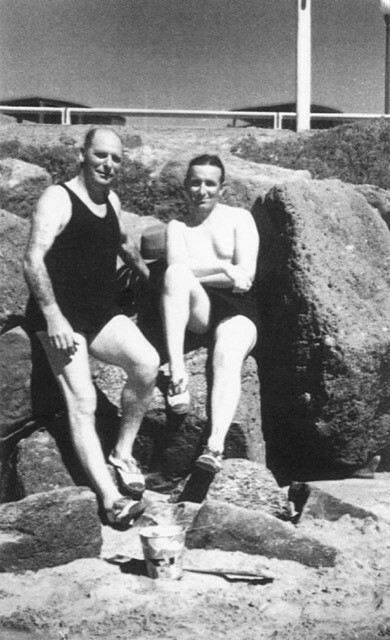 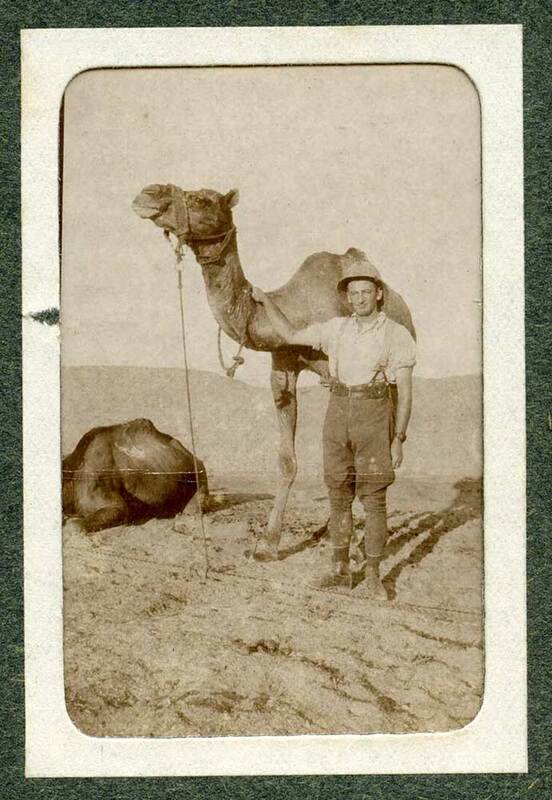 From Hector Saunderson's wartime album. 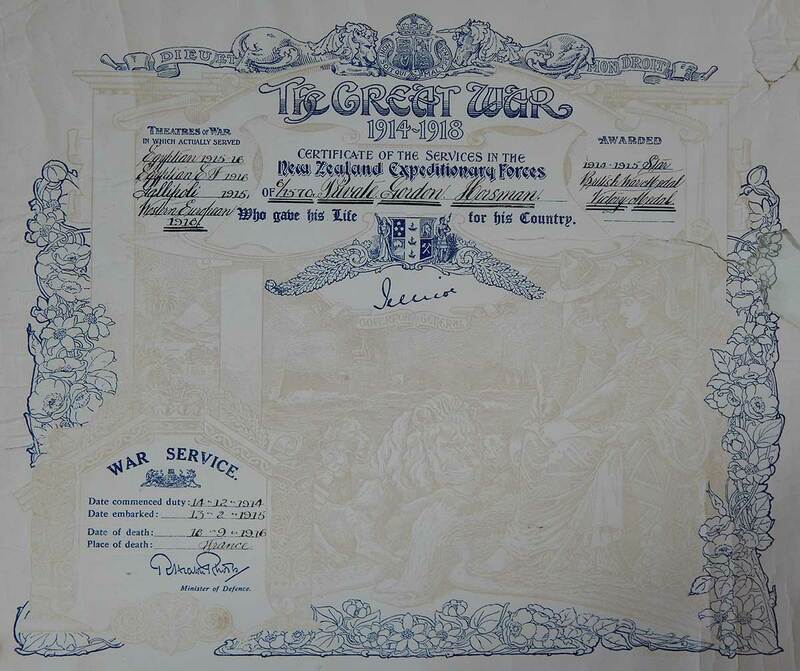 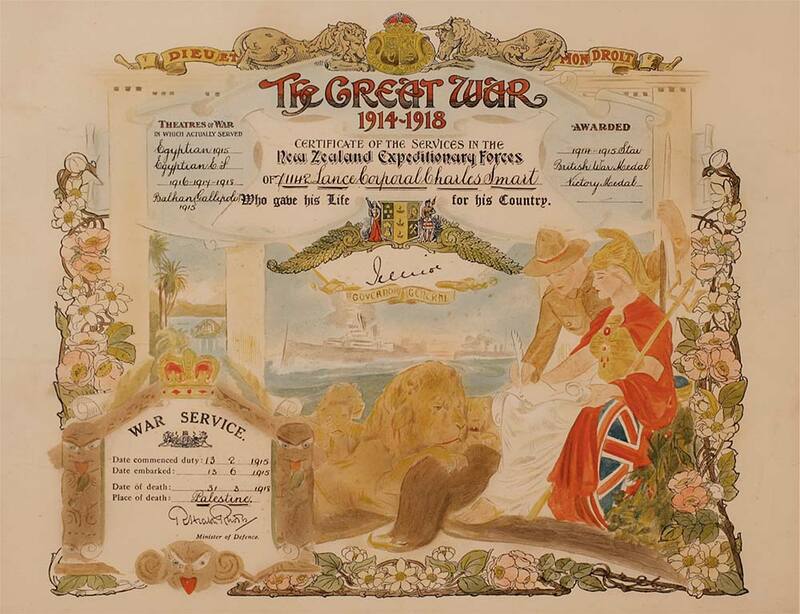 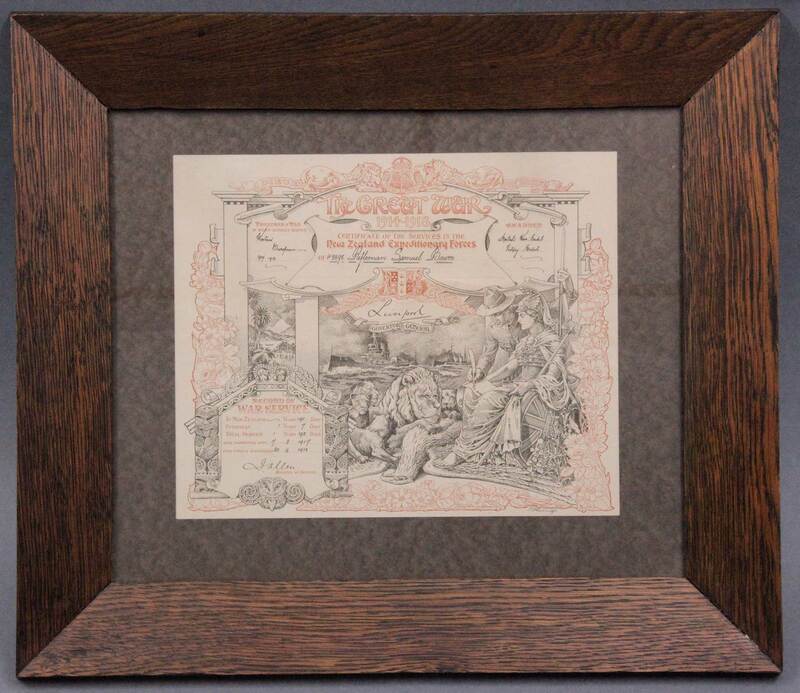 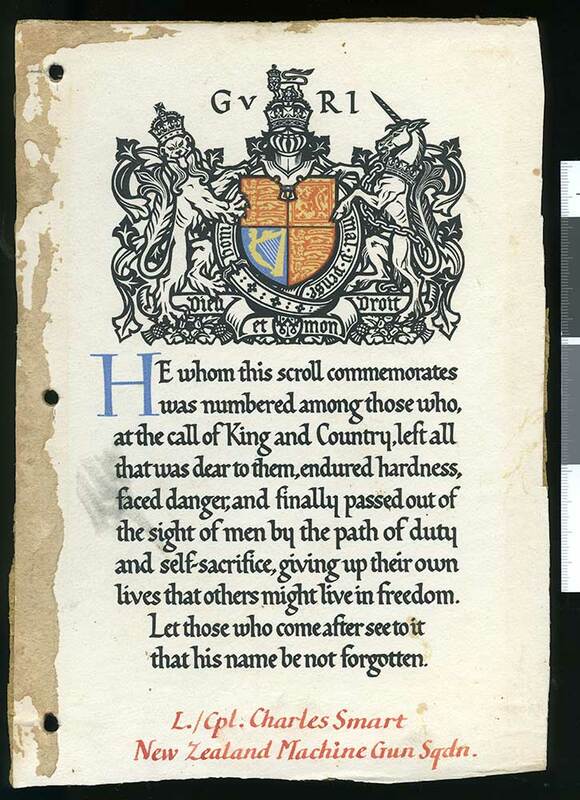 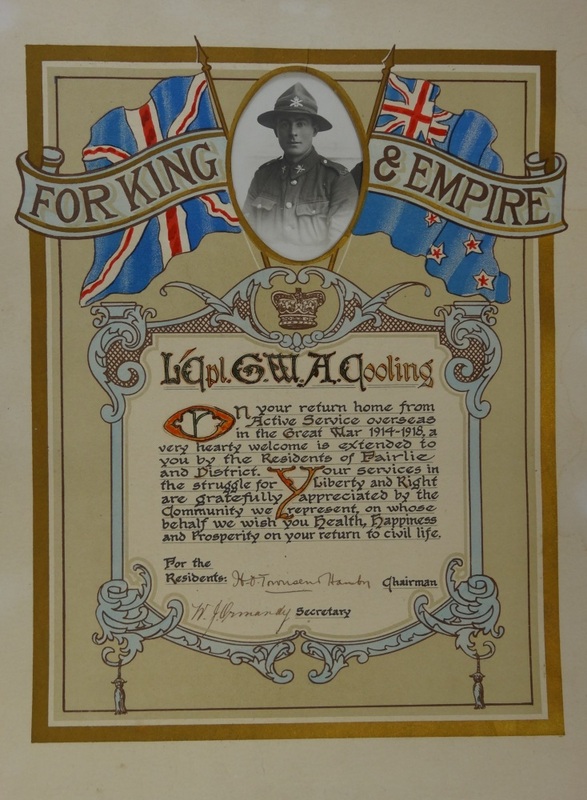 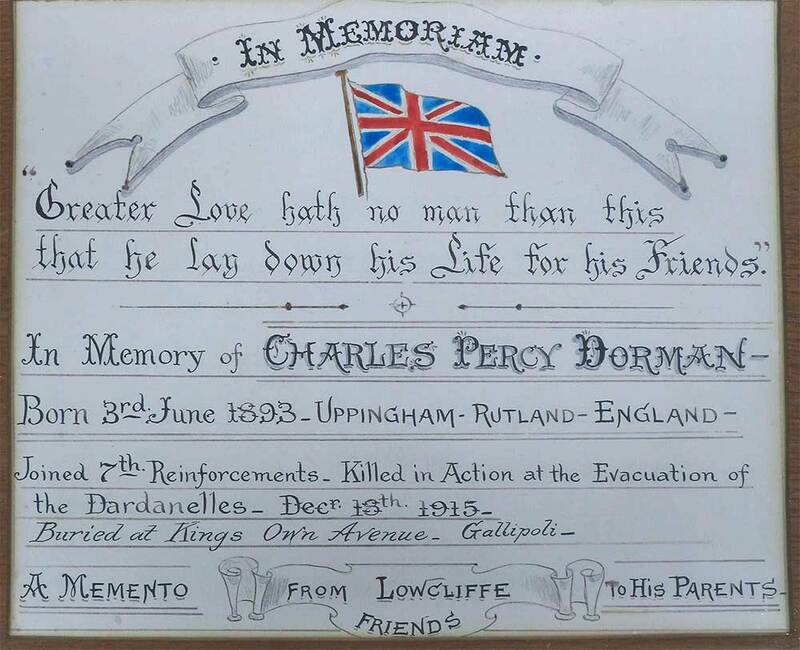 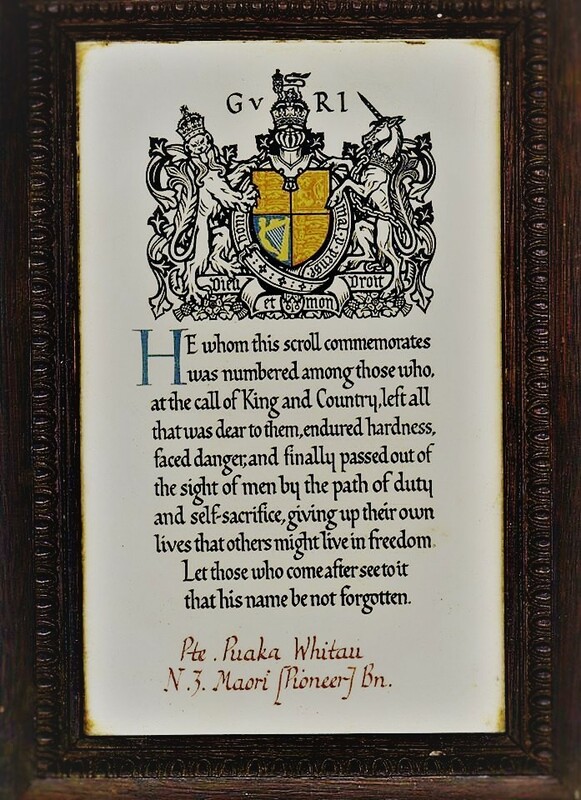 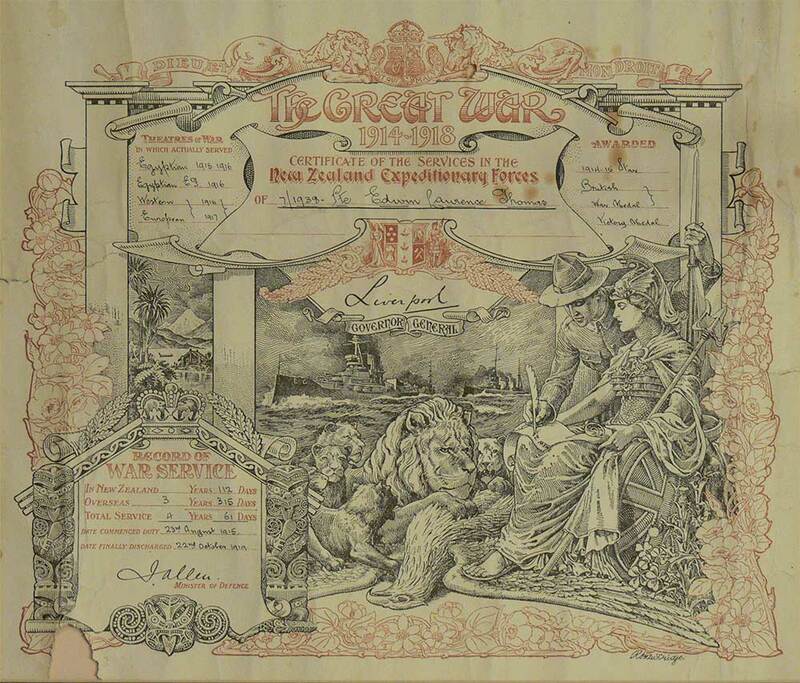 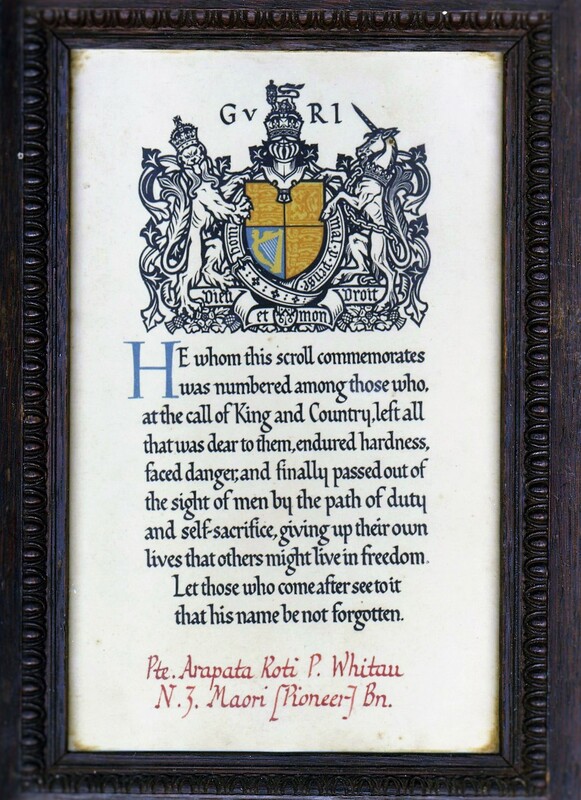 A close-up of the certificate issued to commemorate the sacrifice of Charles Smart's life, sometime between 1920 and 1924. 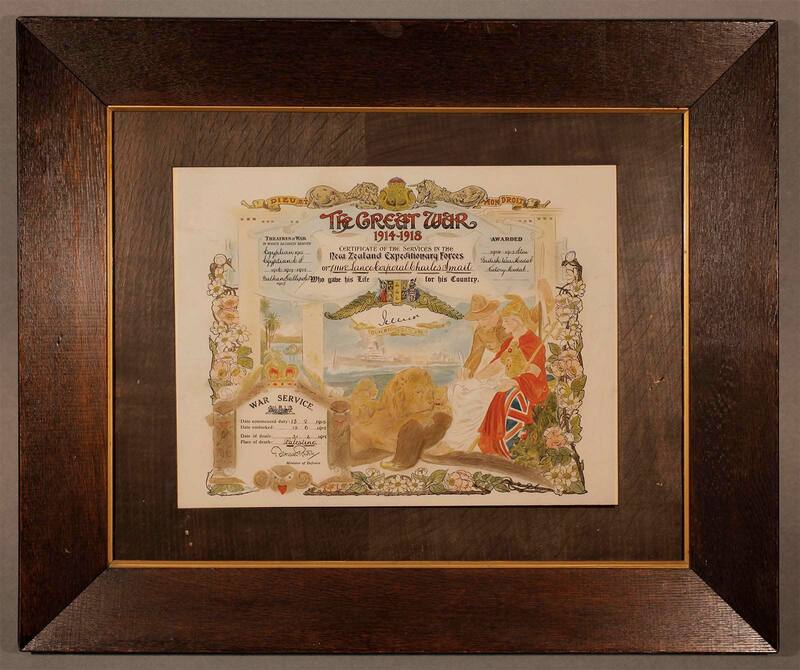 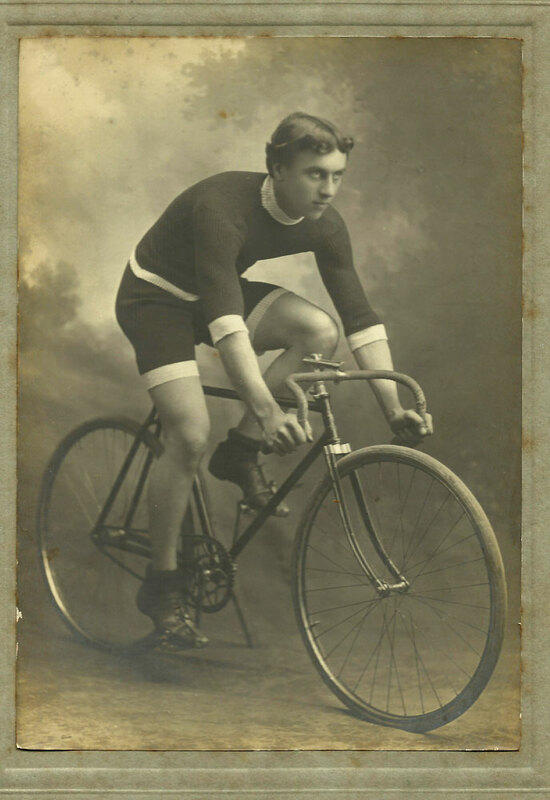 Notes on the original mount indicate that his mother had the certificate hand colored and framed in 1934. 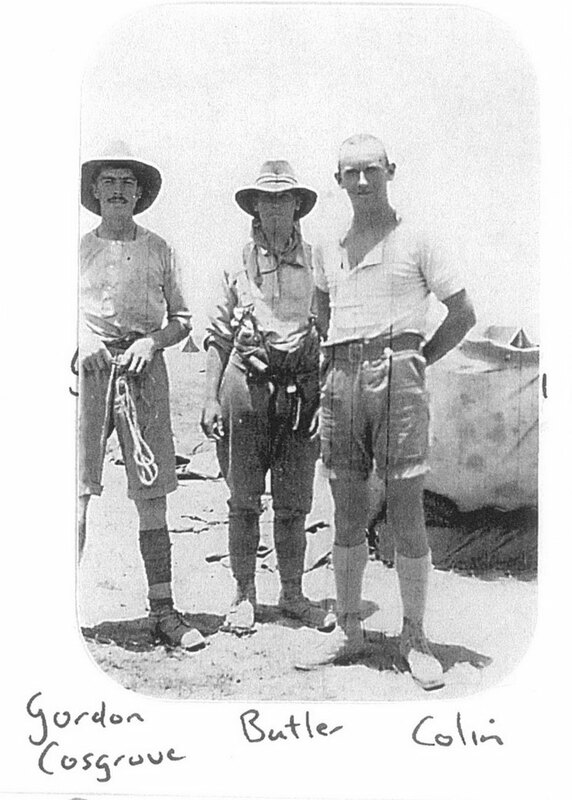 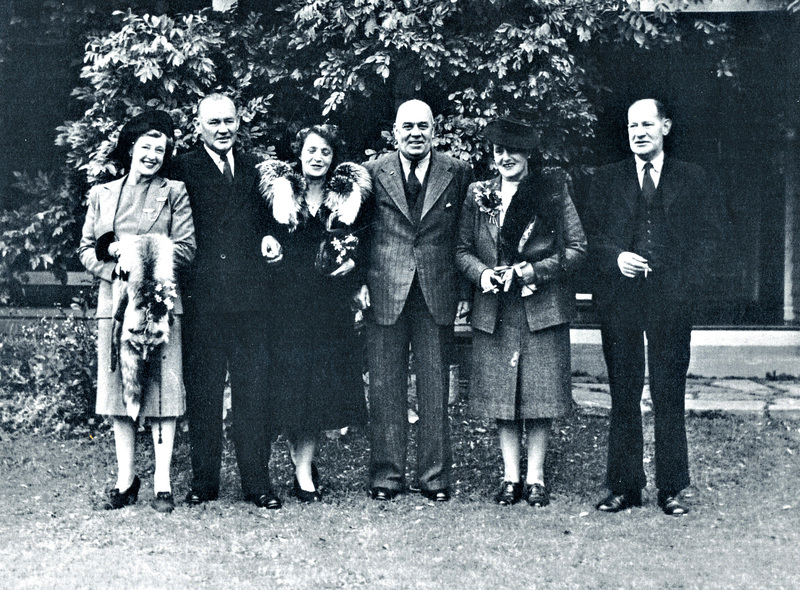 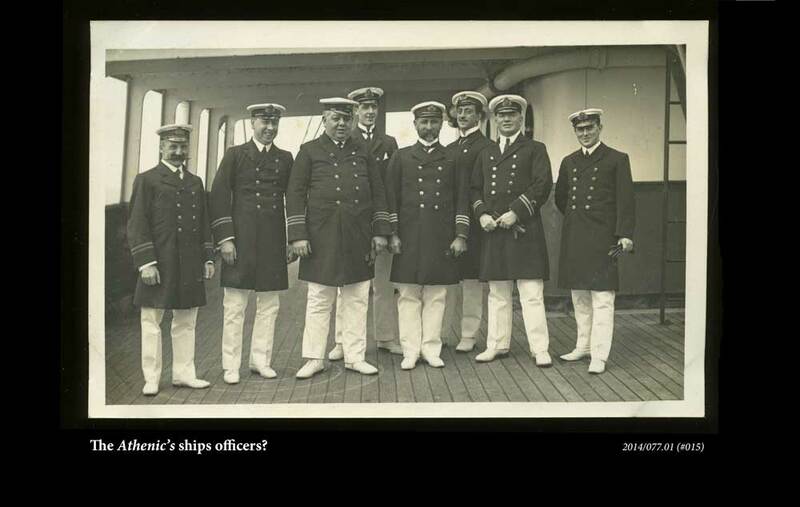 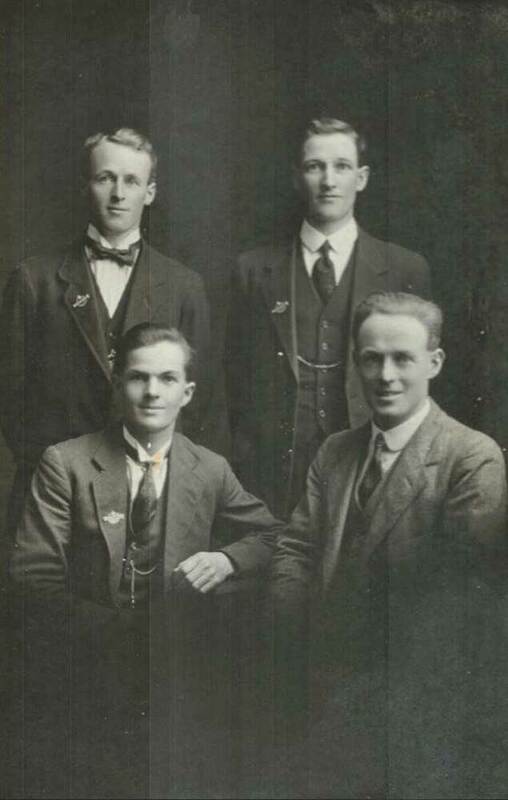 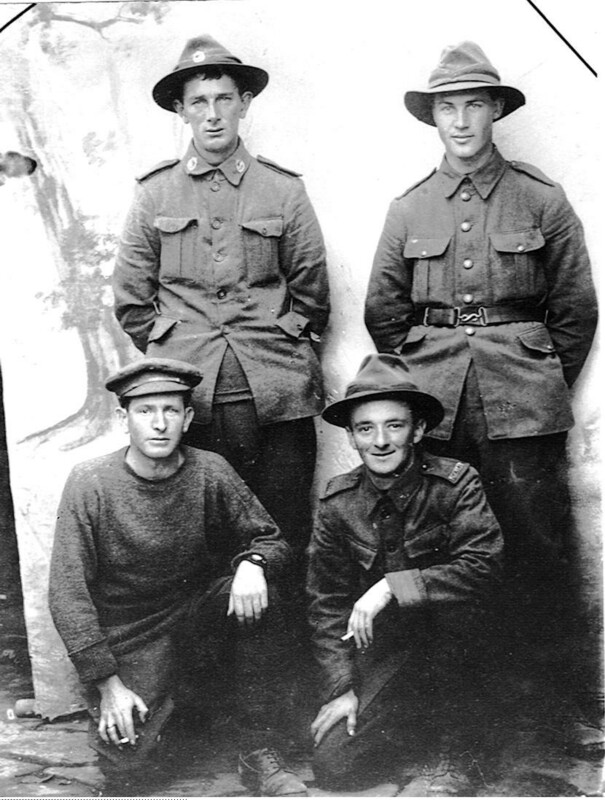 James Looker (standing, third from right) pictured with an unidentified group of men. 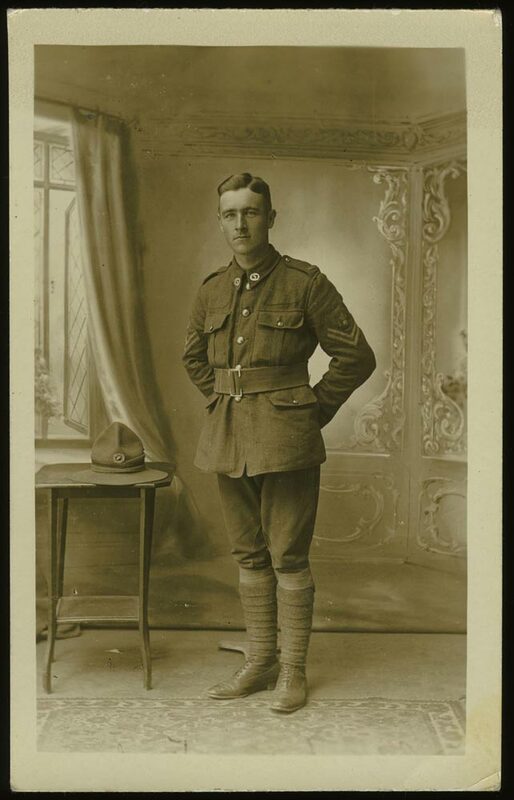 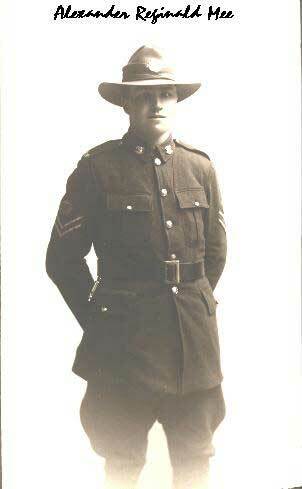 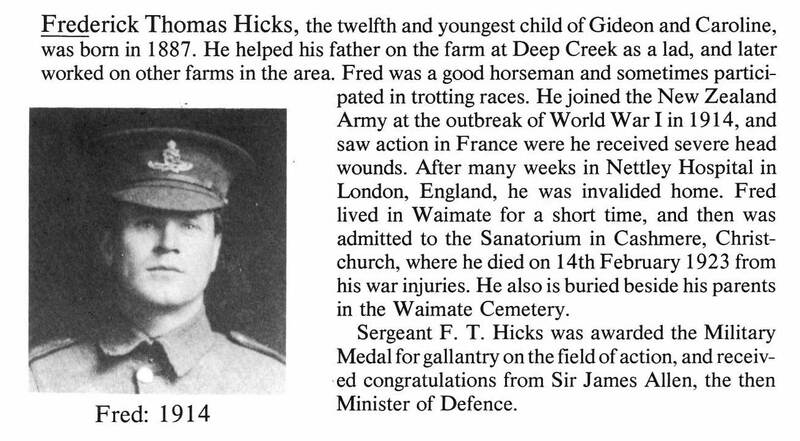 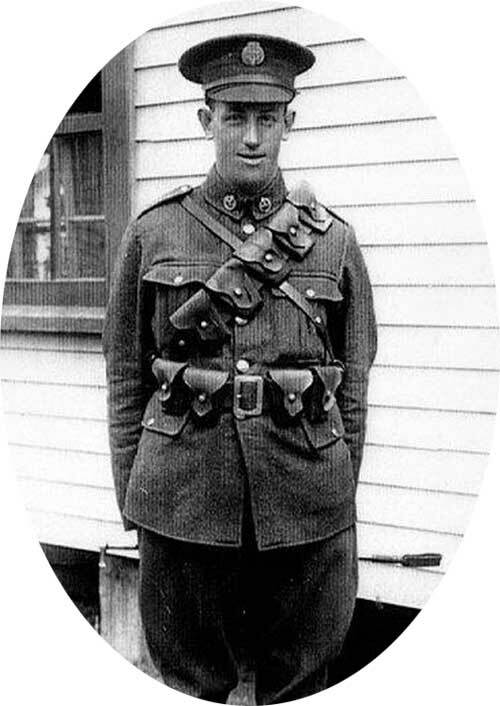 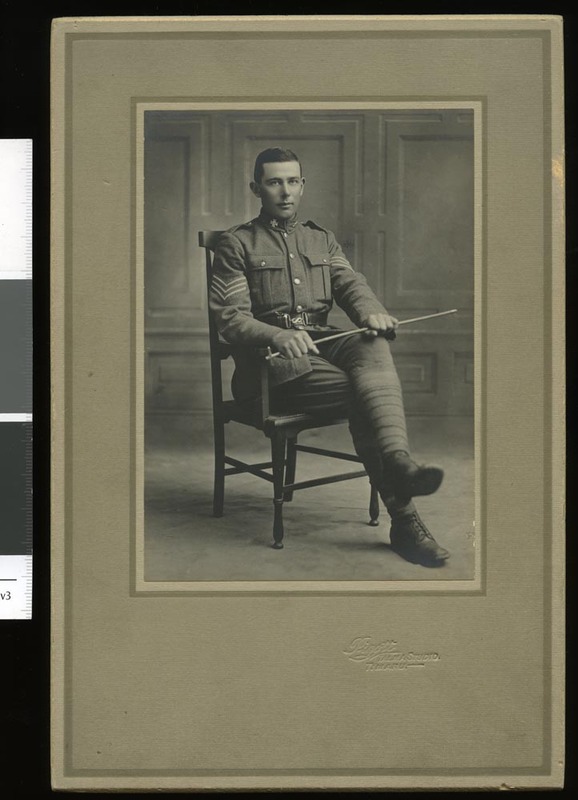 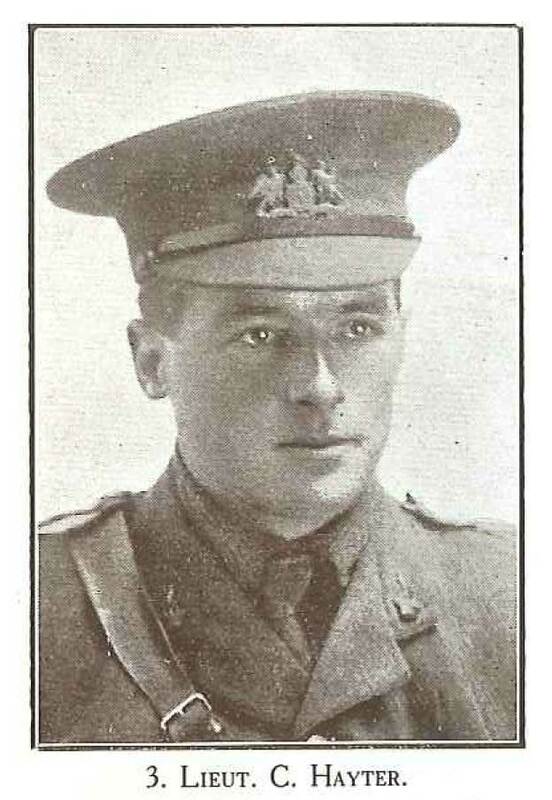 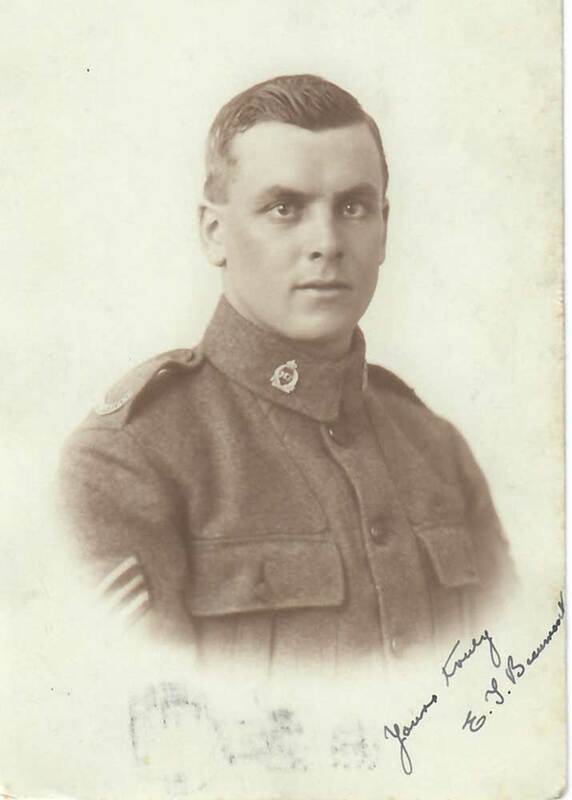 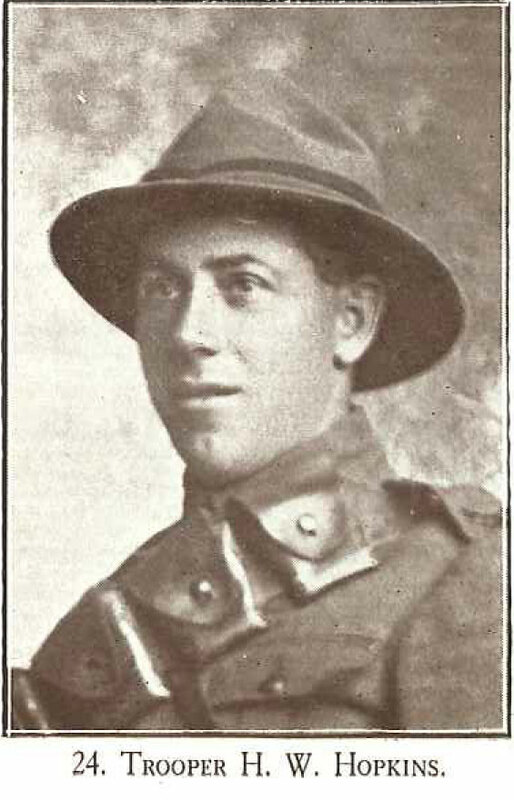 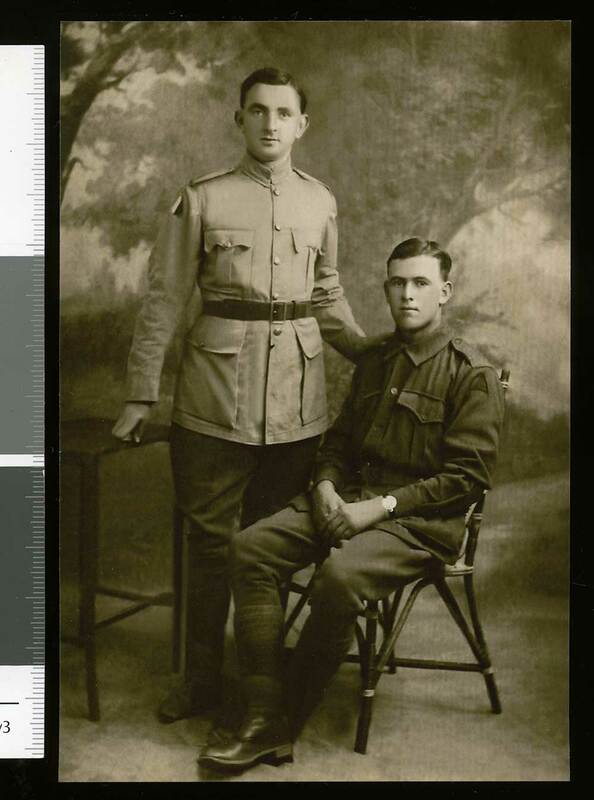 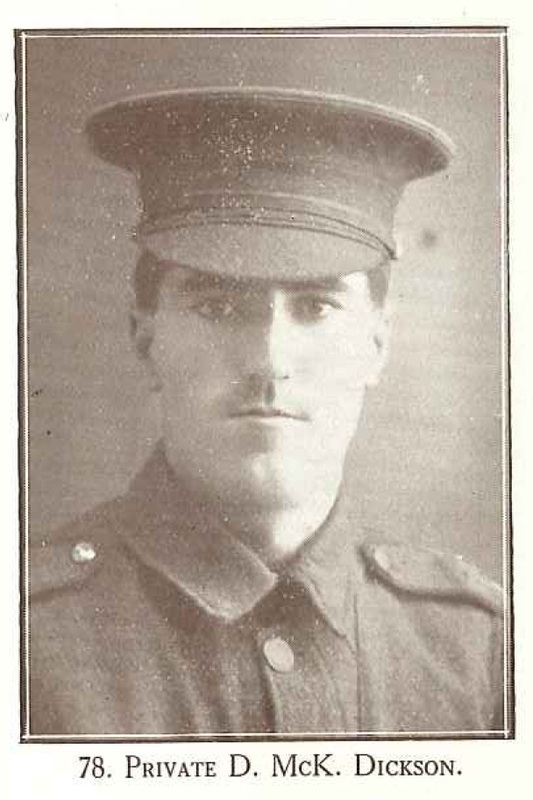 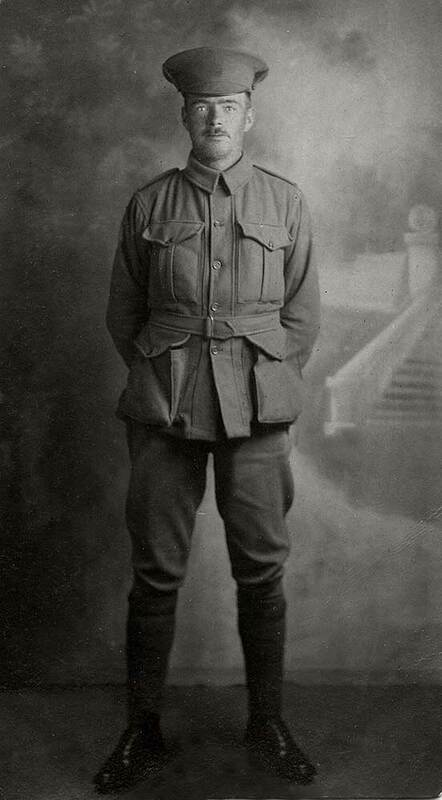 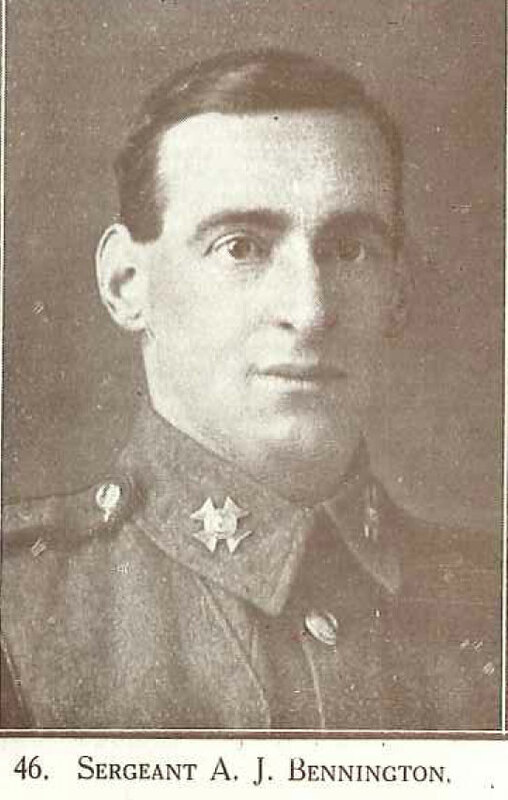 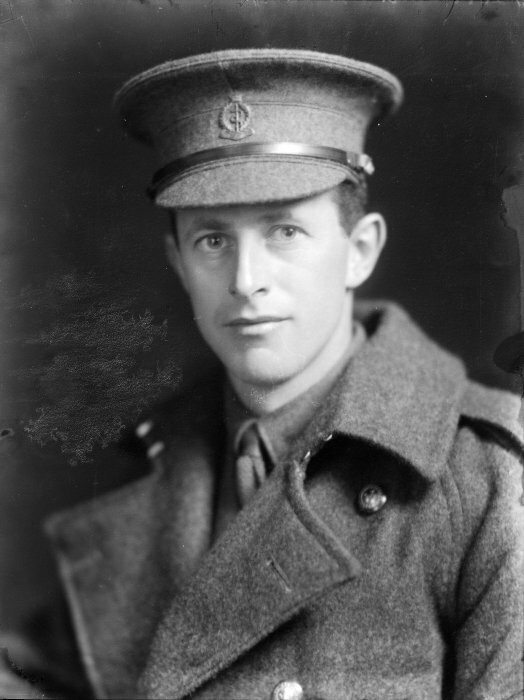 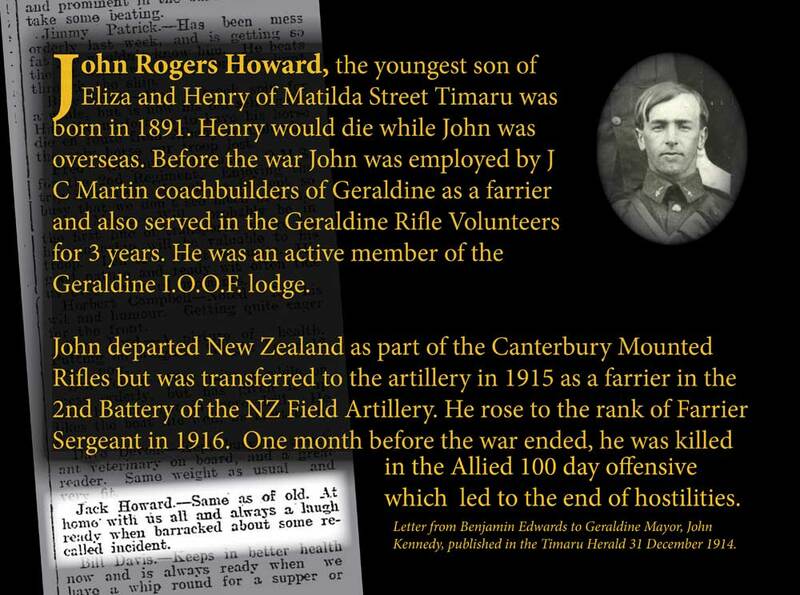 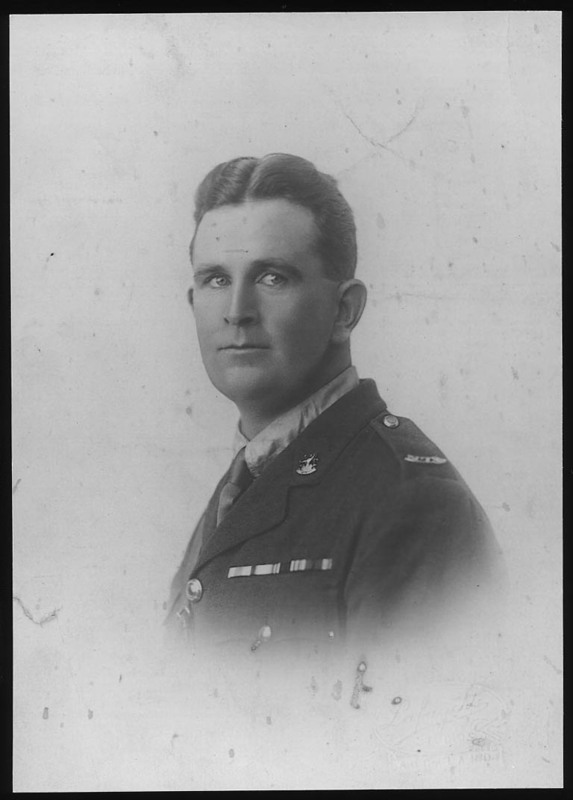 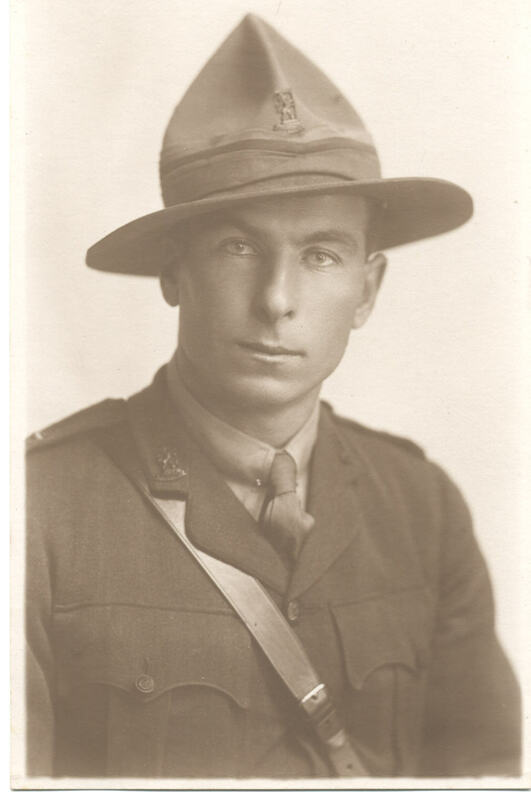 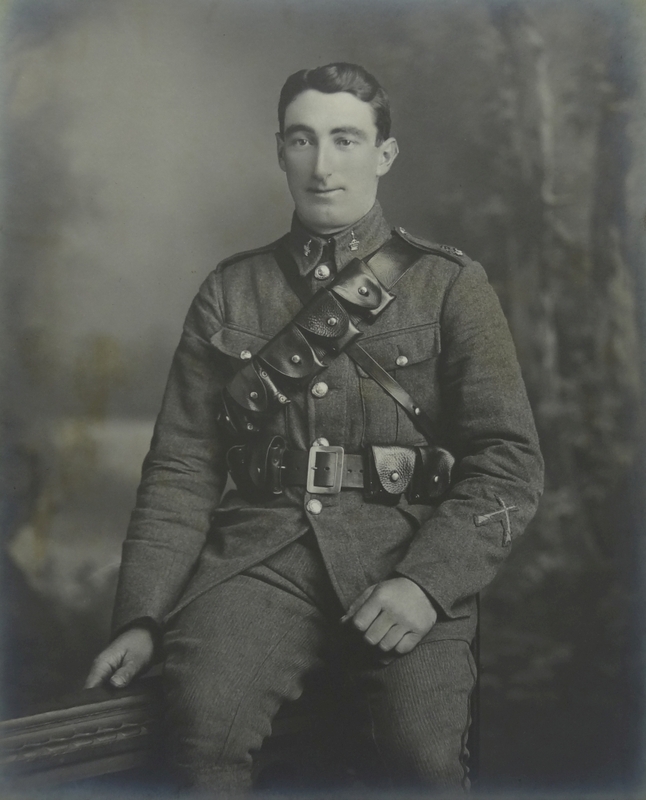 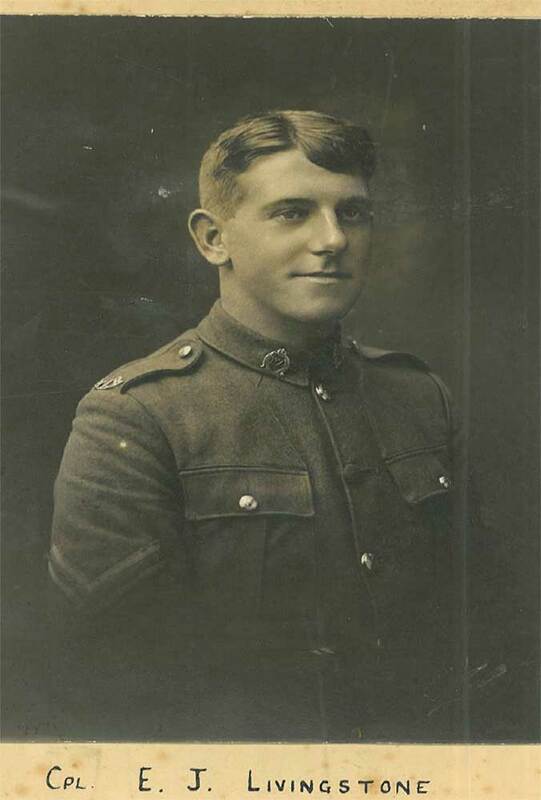 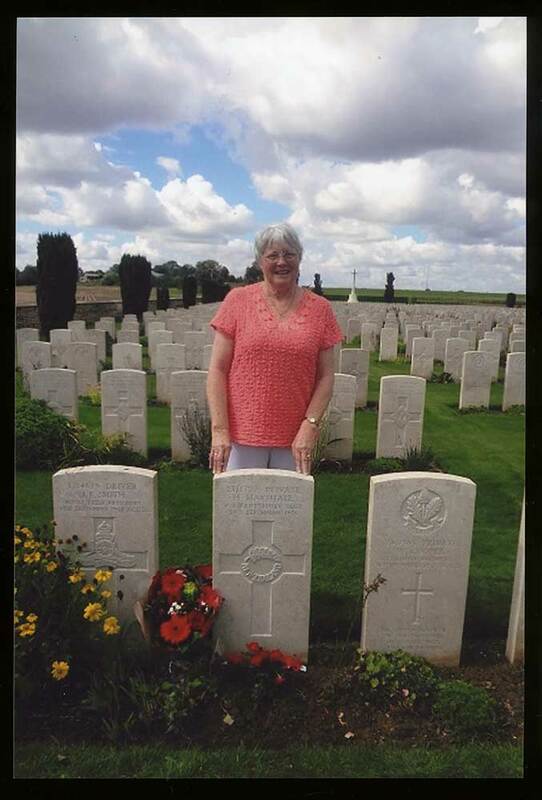 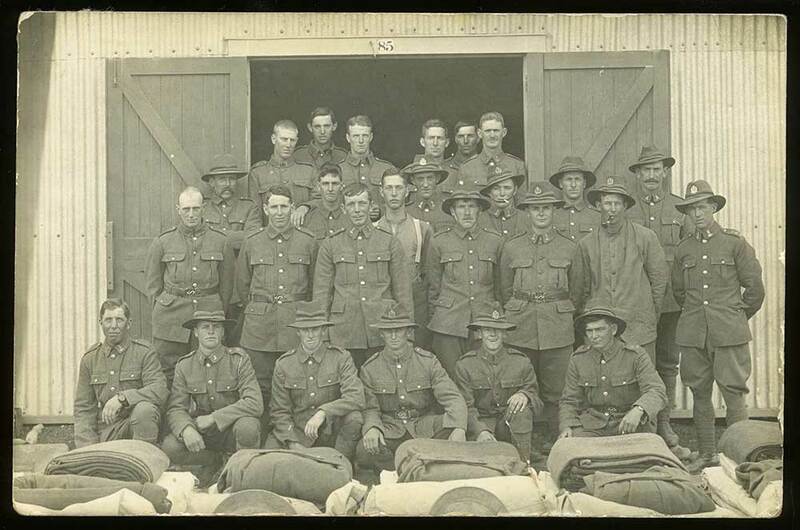 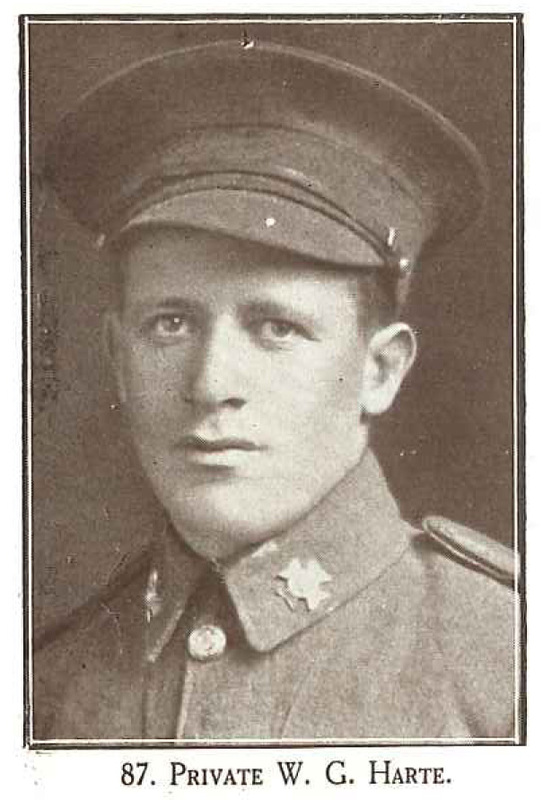 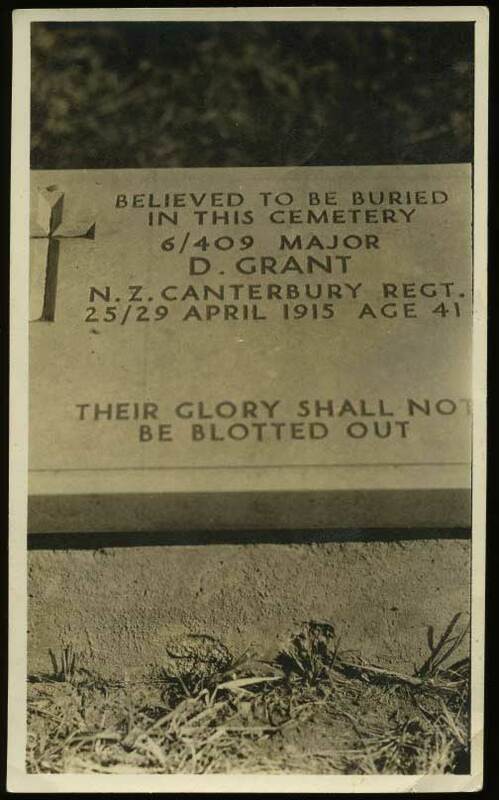 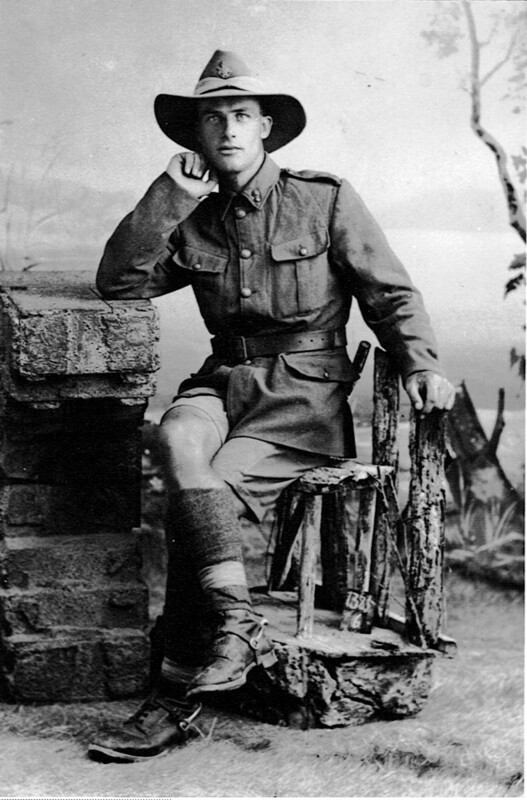 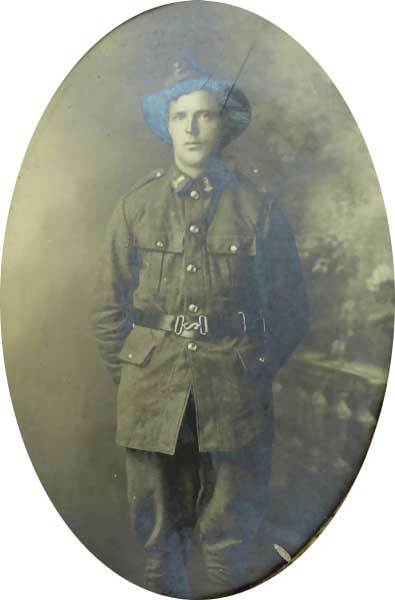 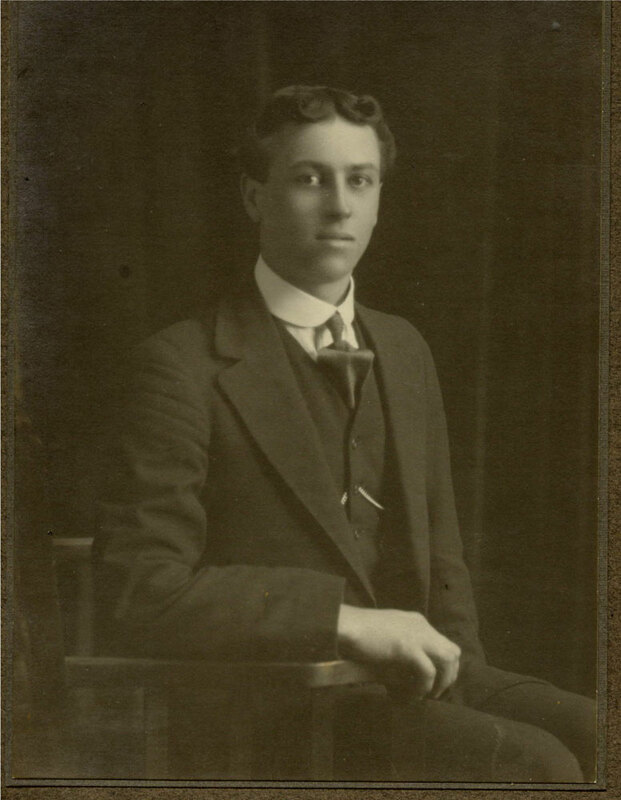 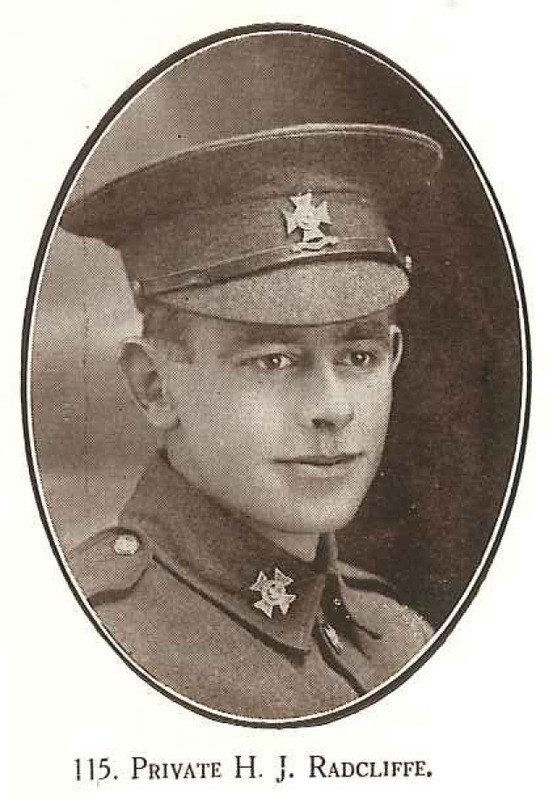 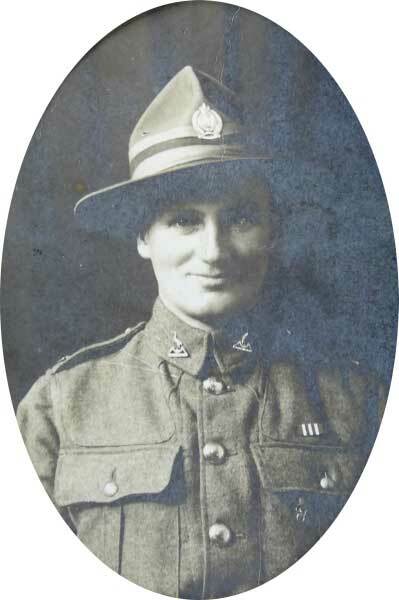 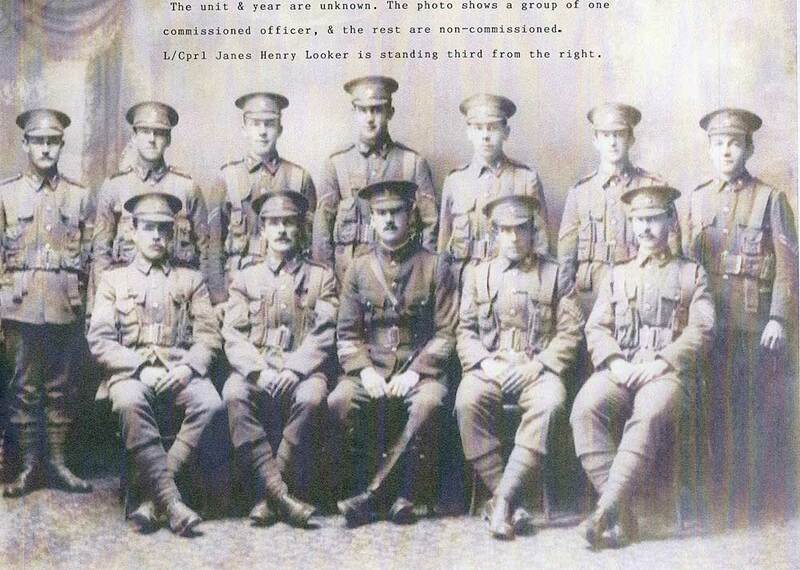 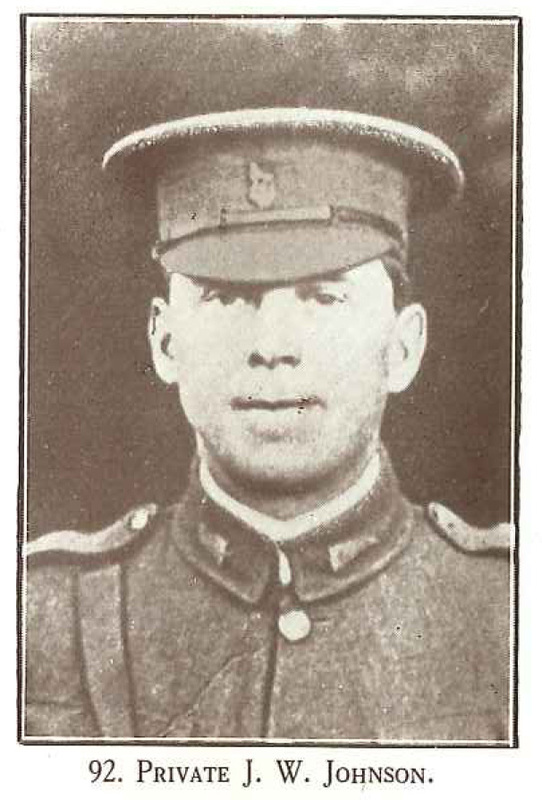 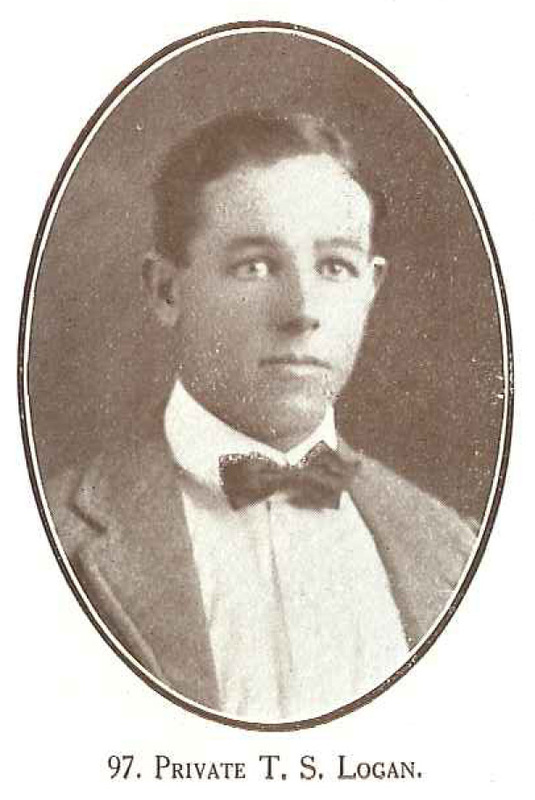 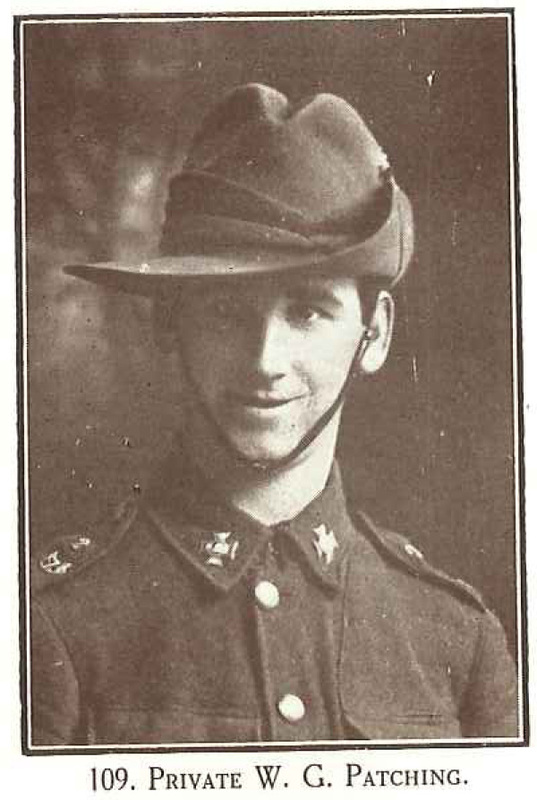 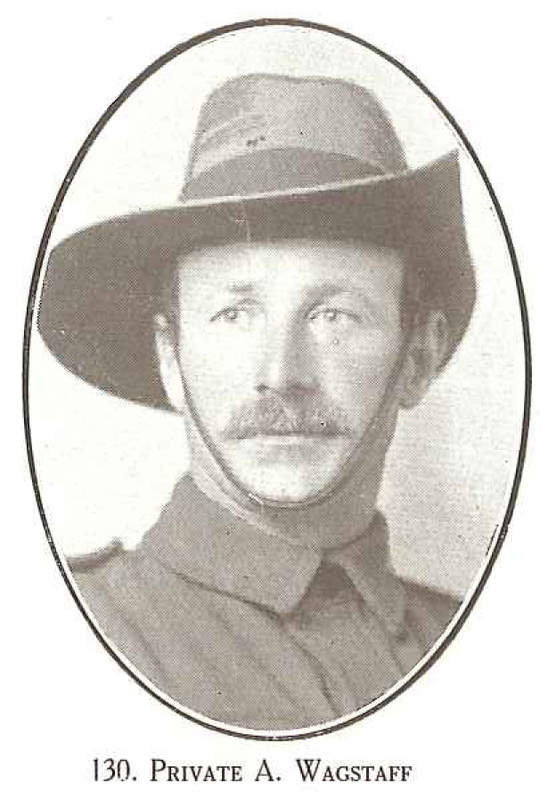 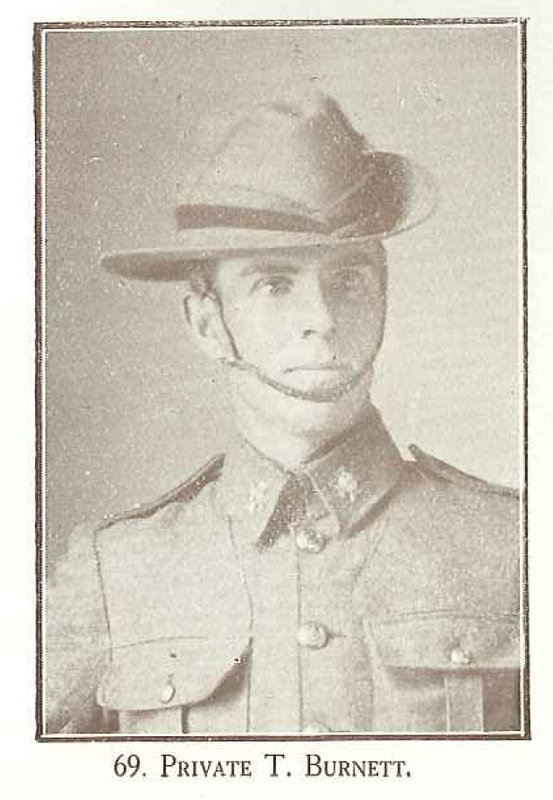 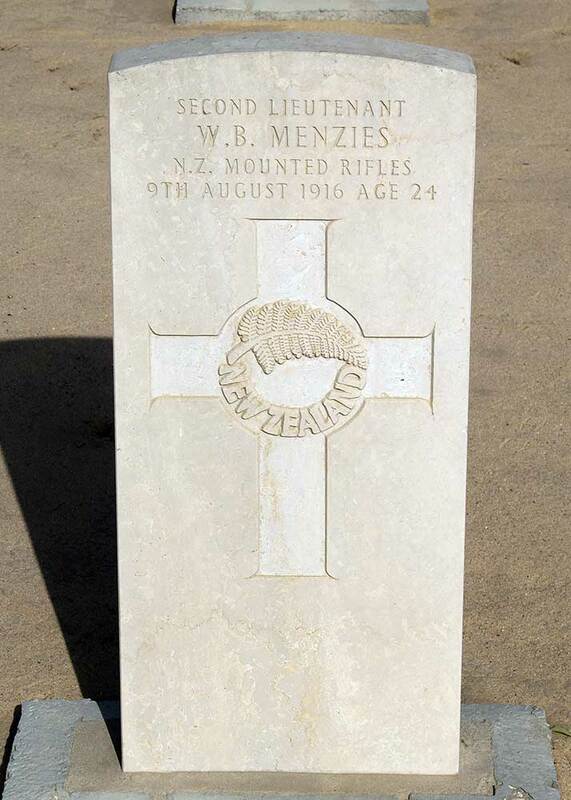 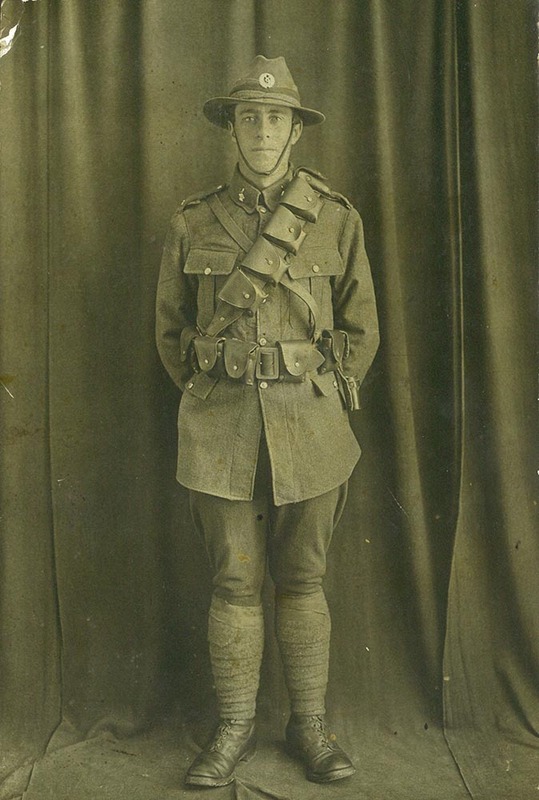 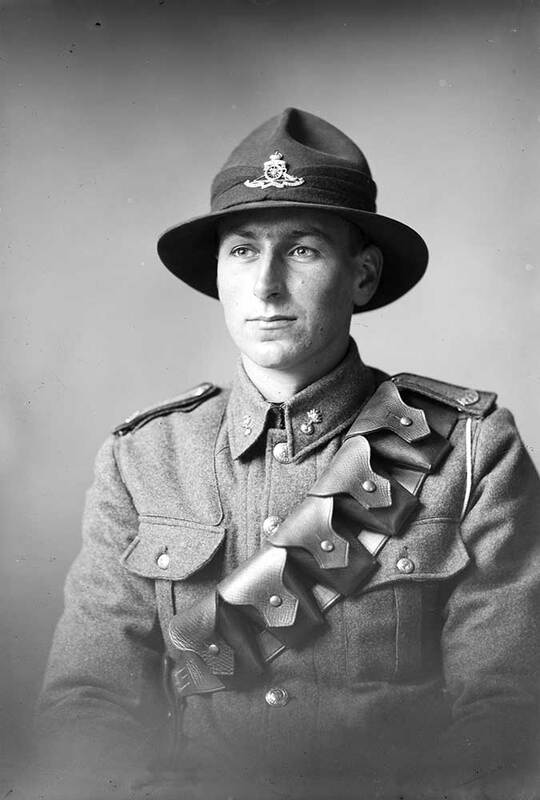 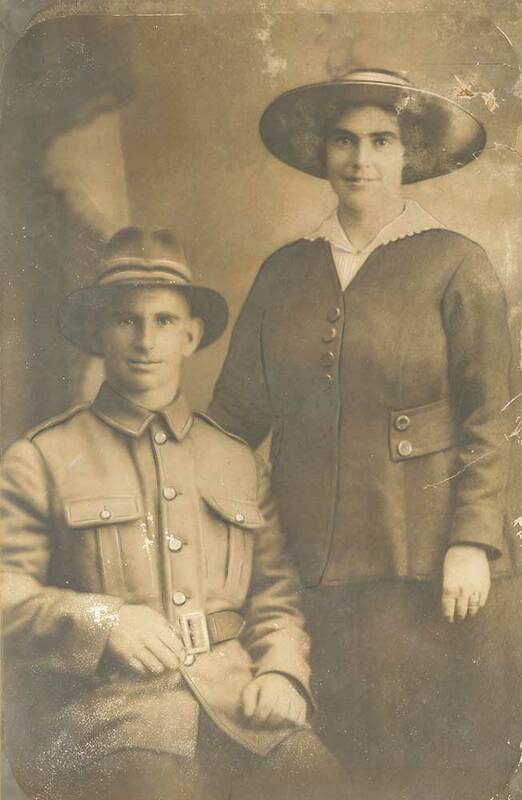 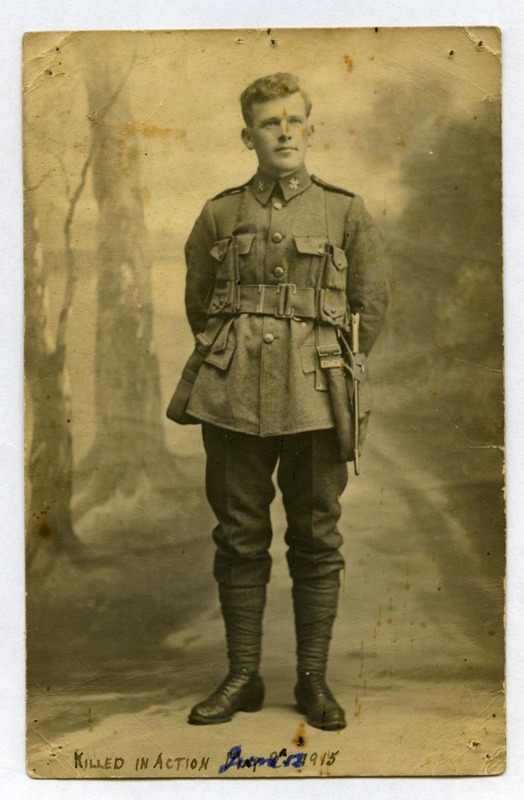 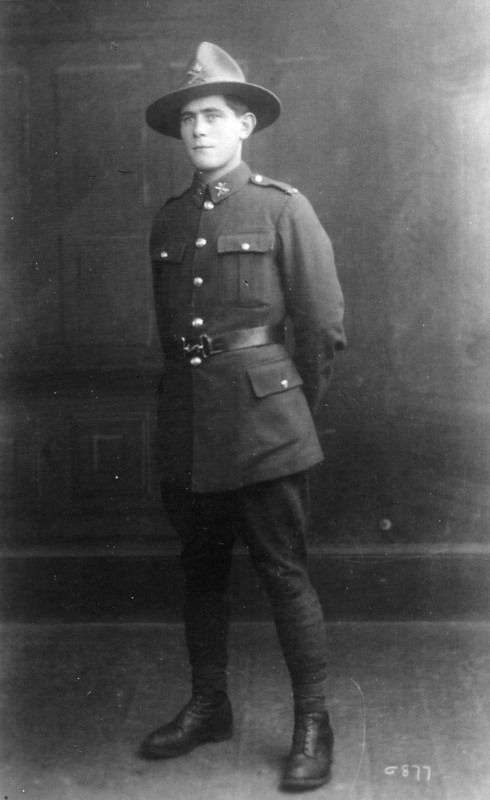 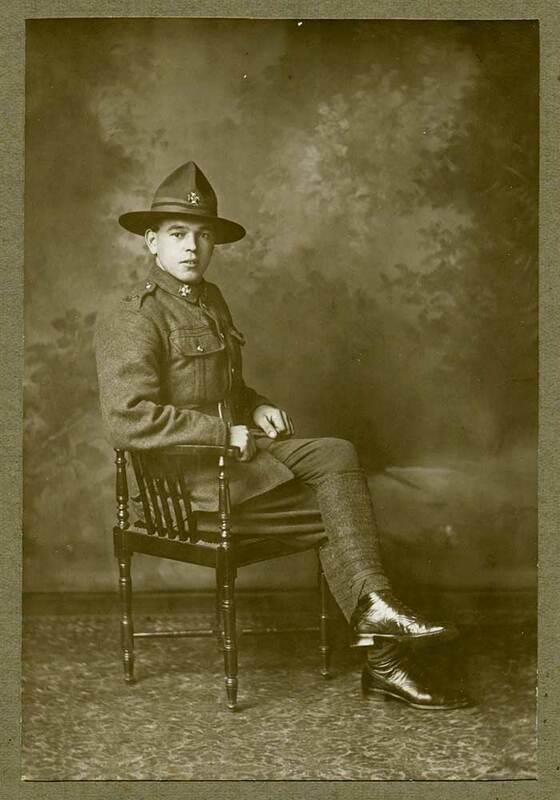 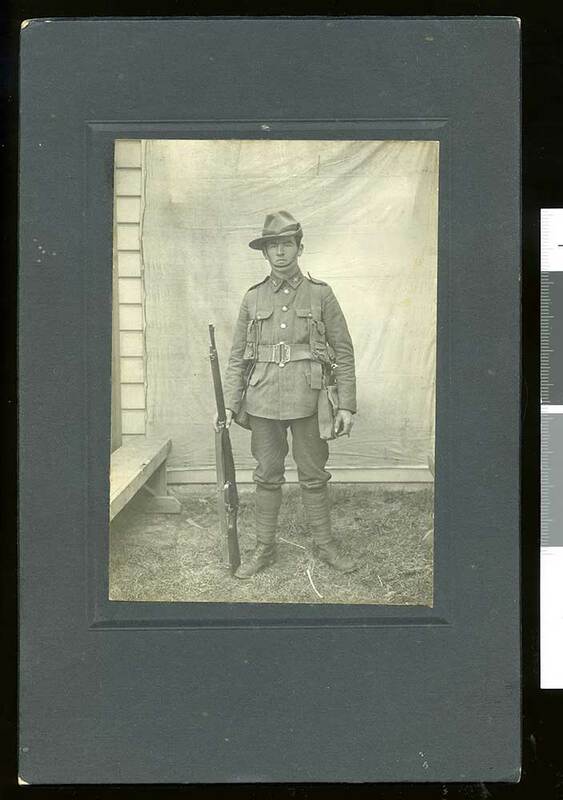 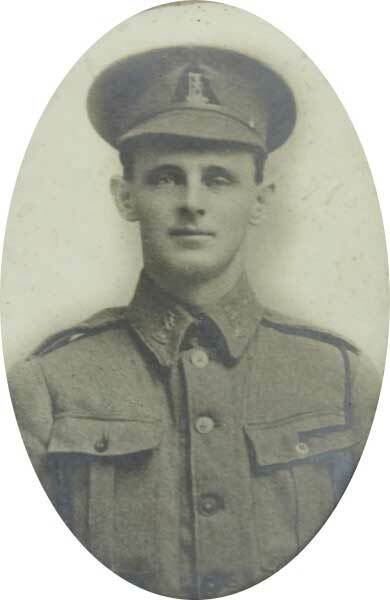 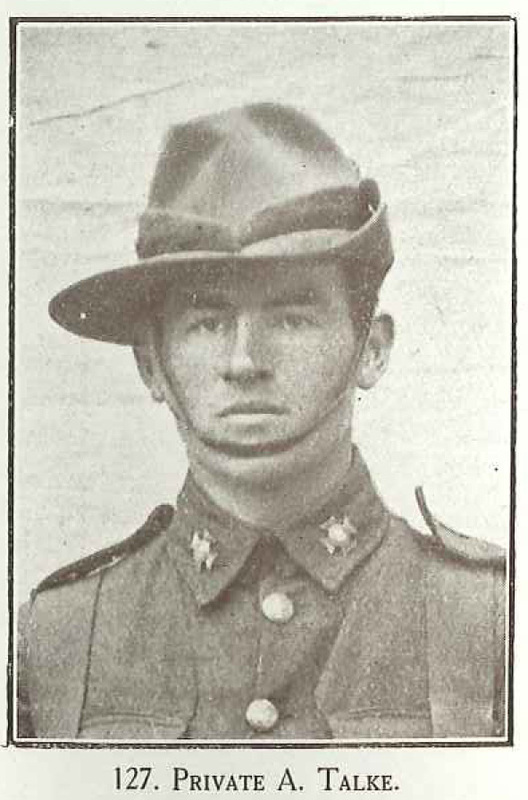 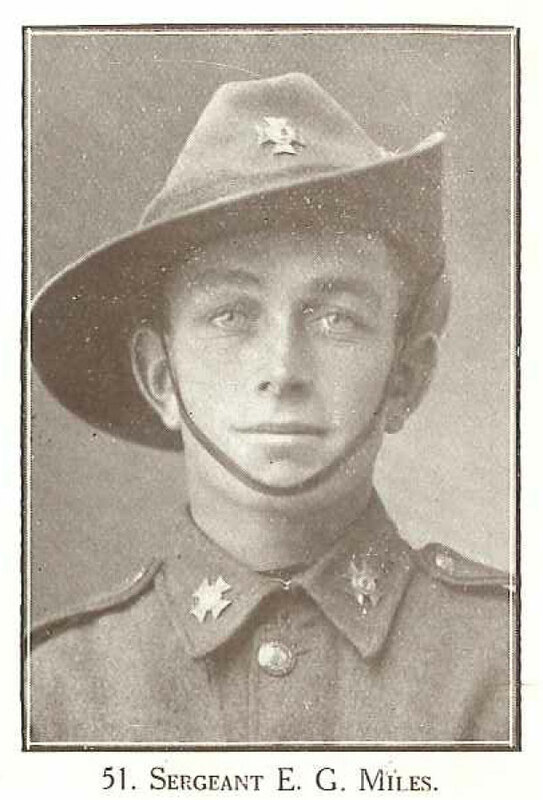 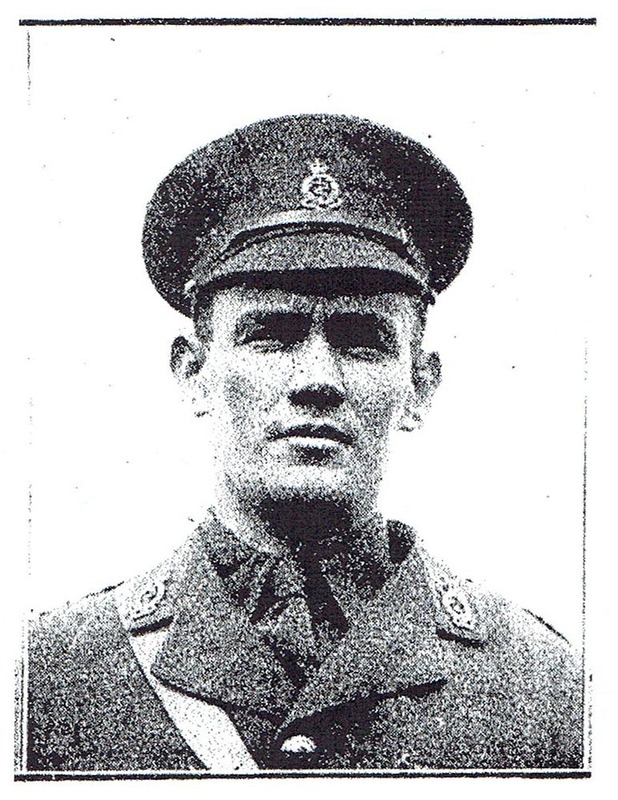 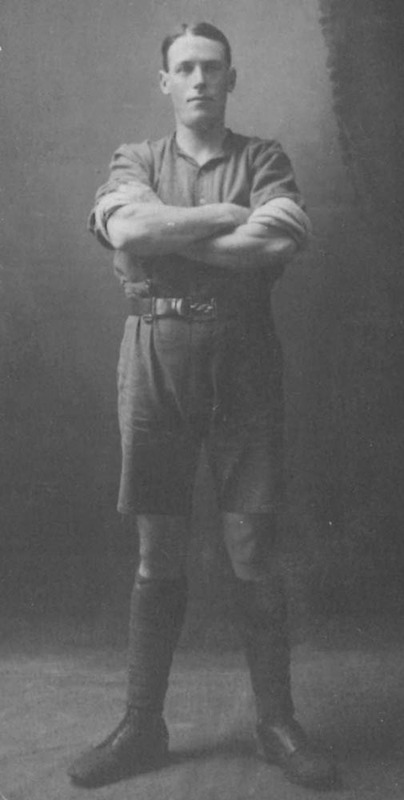 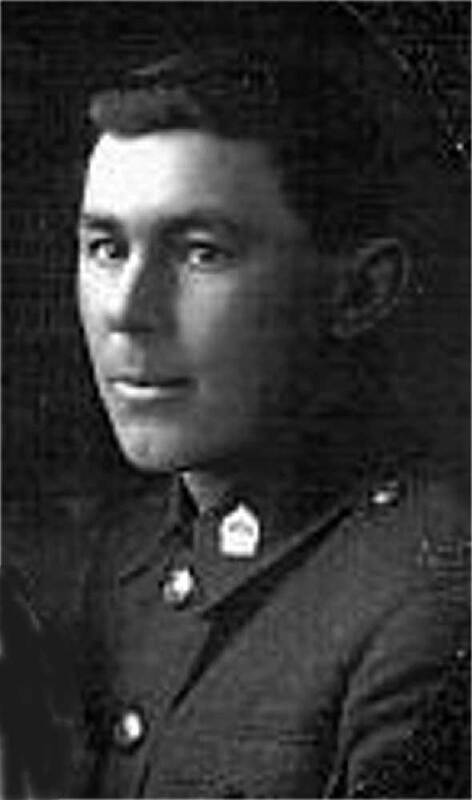 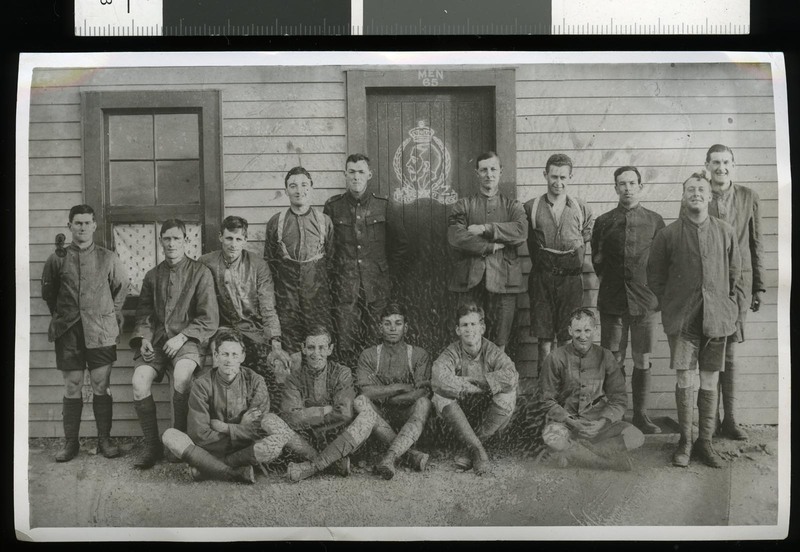 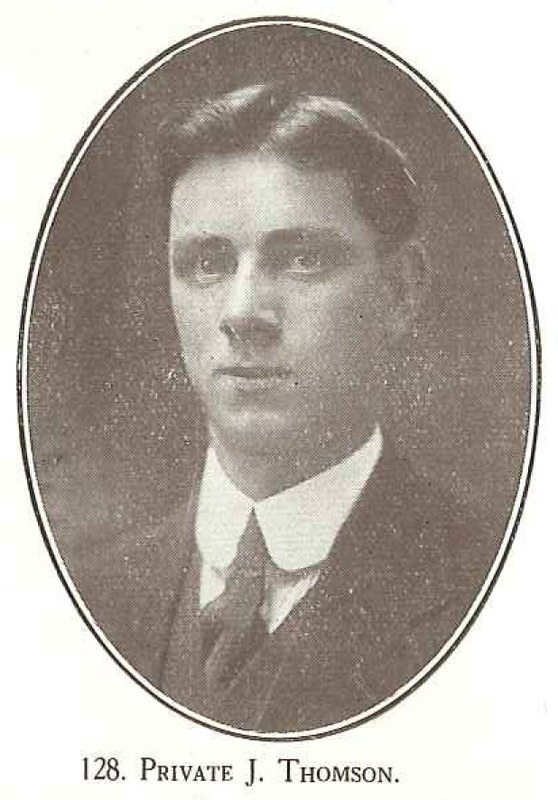 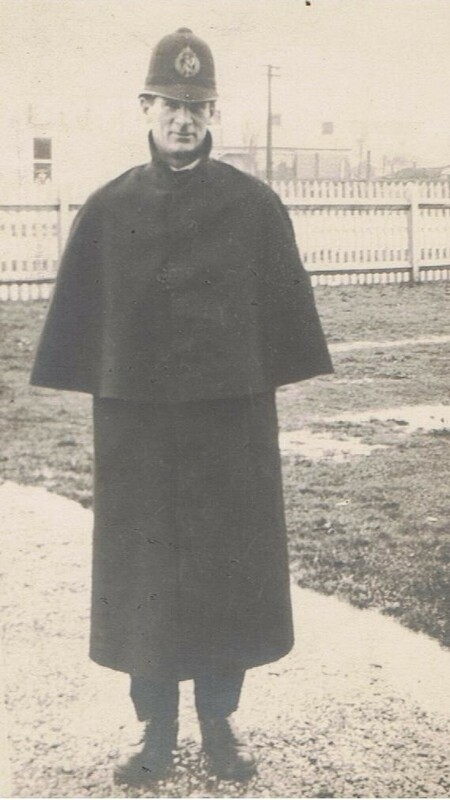 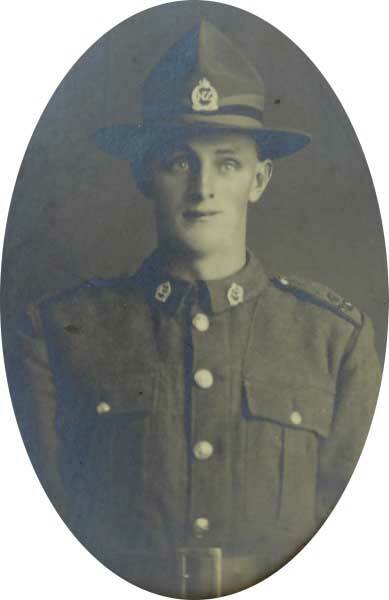 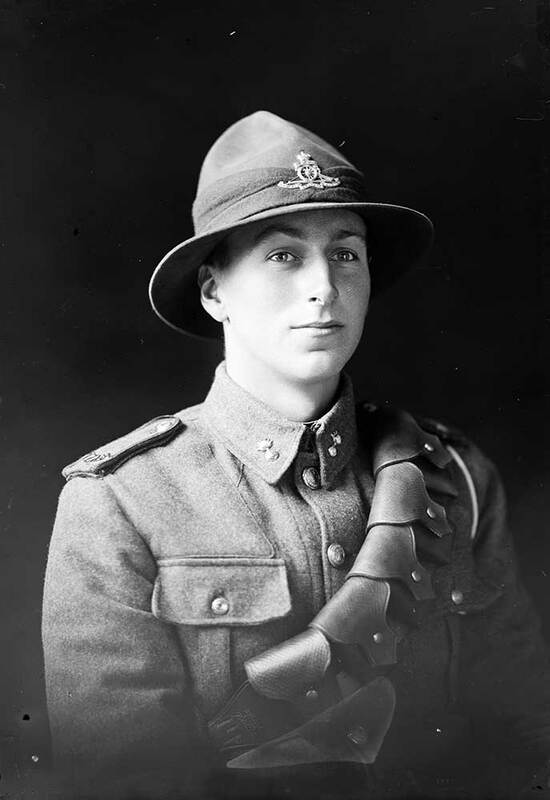 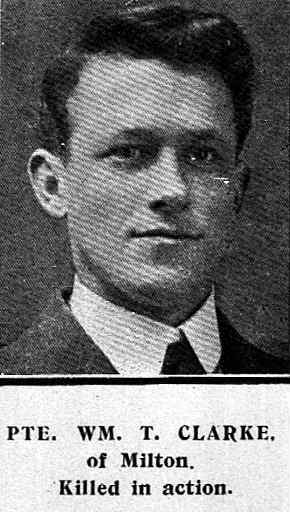 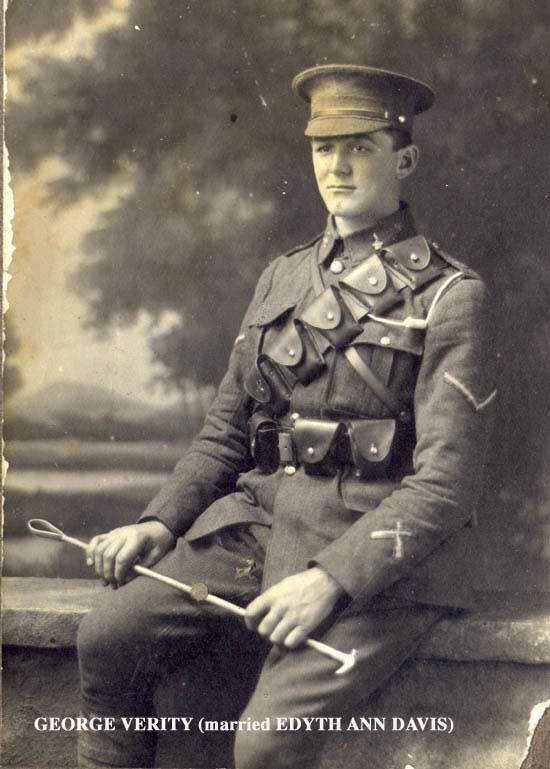 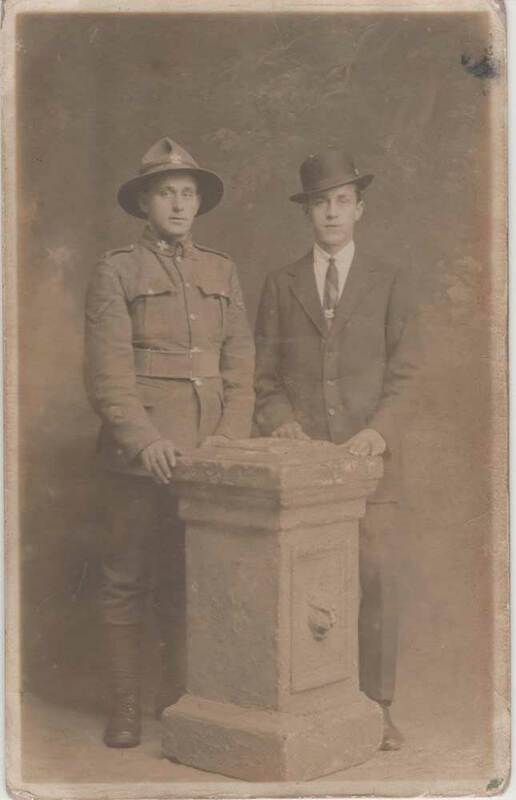 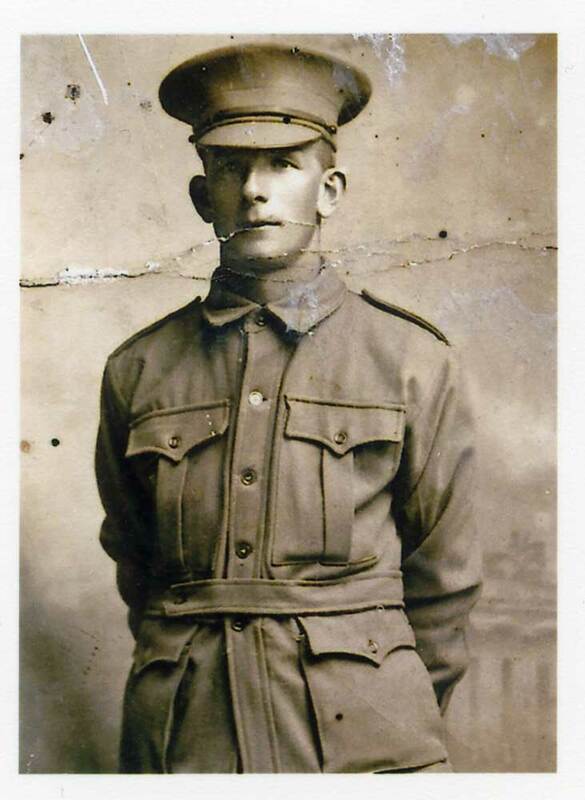 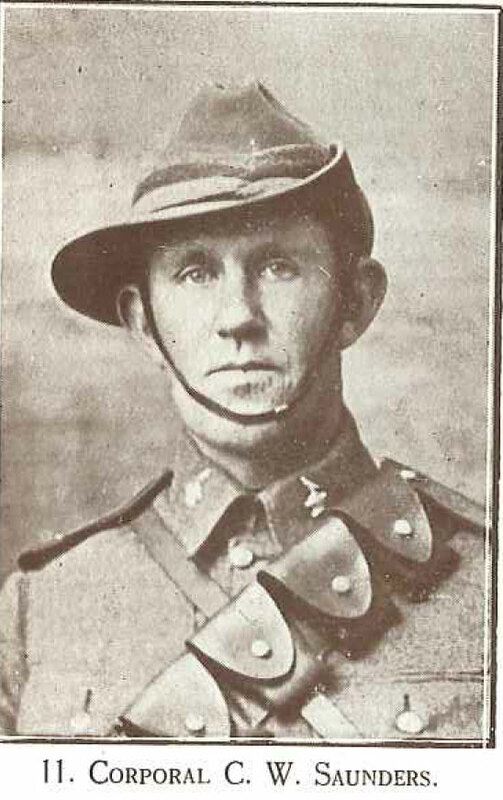 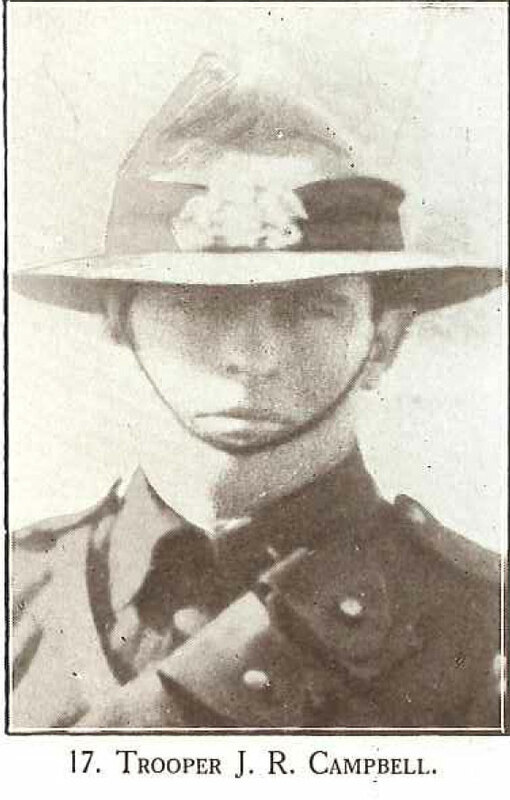 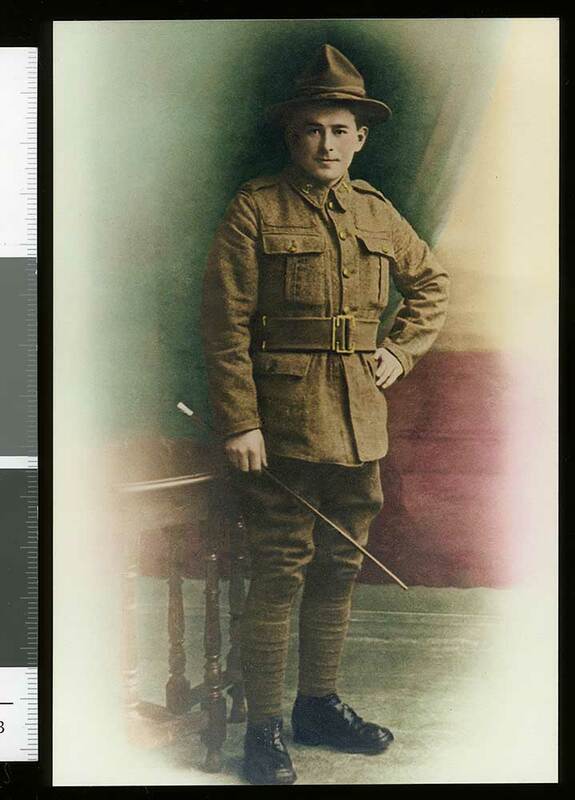 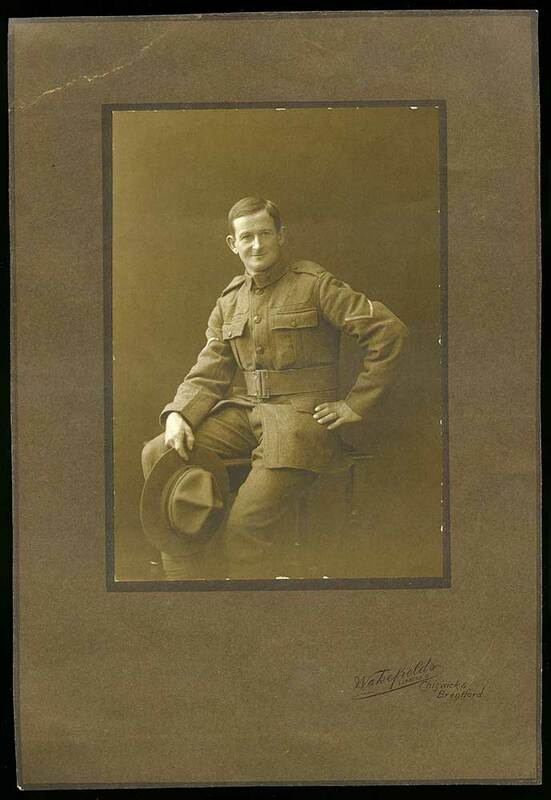 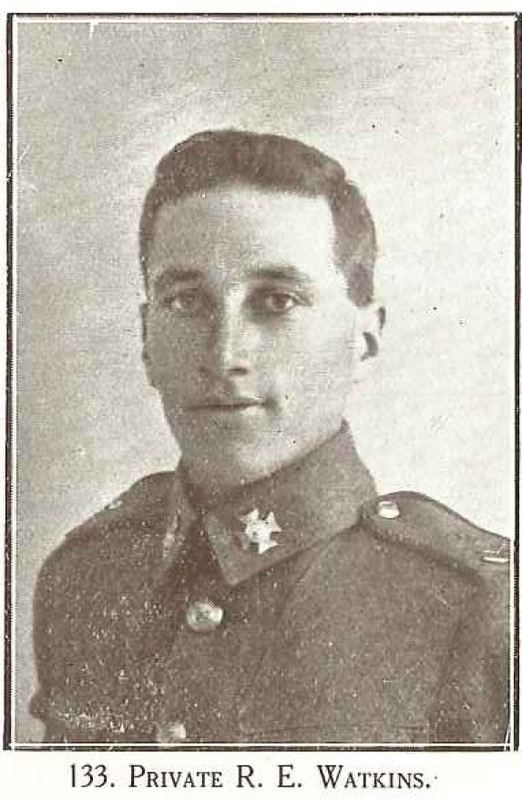 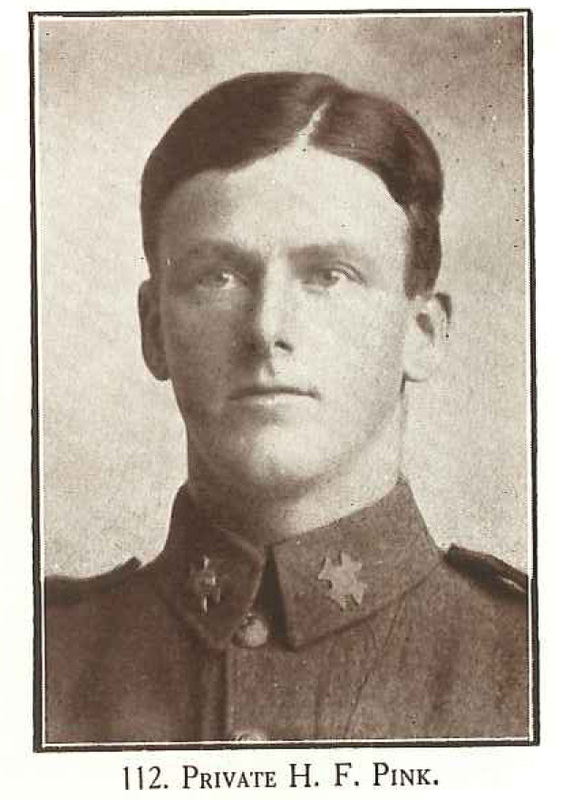 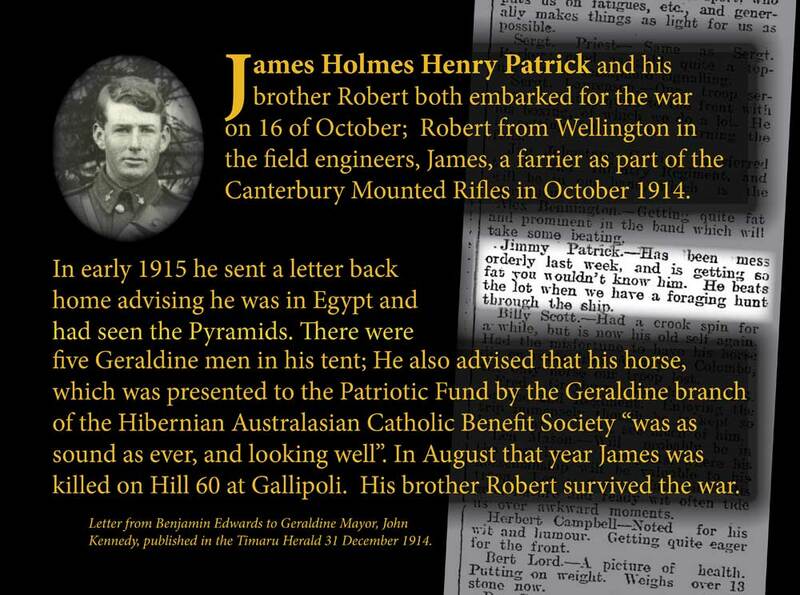 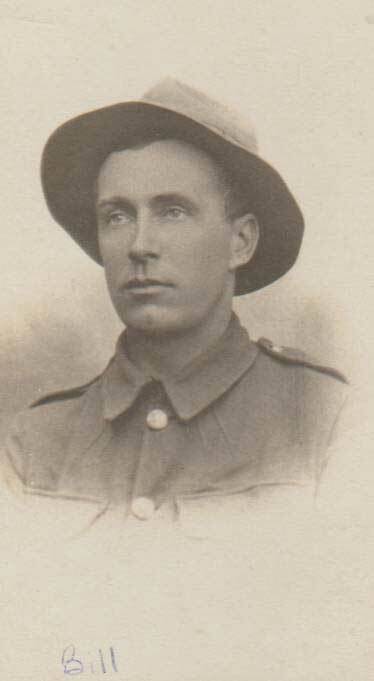 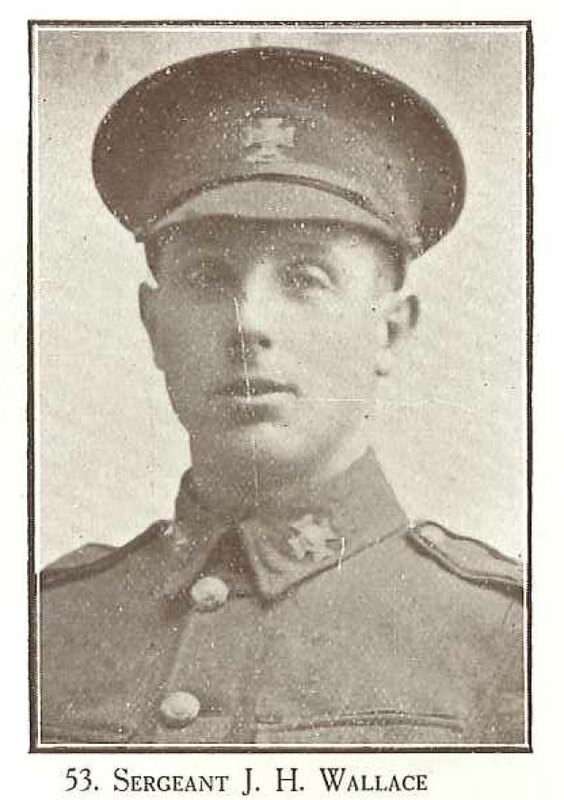 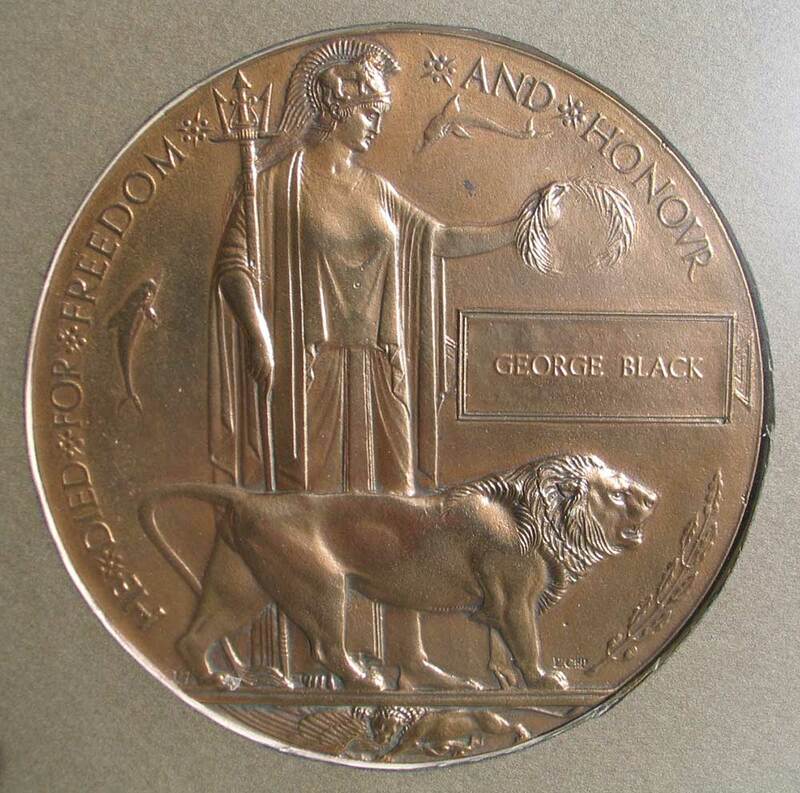 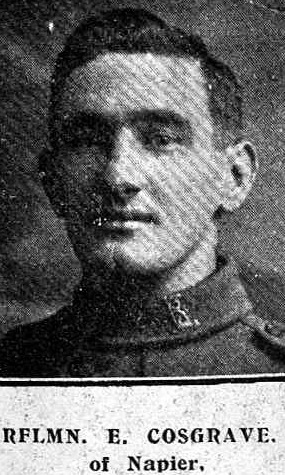 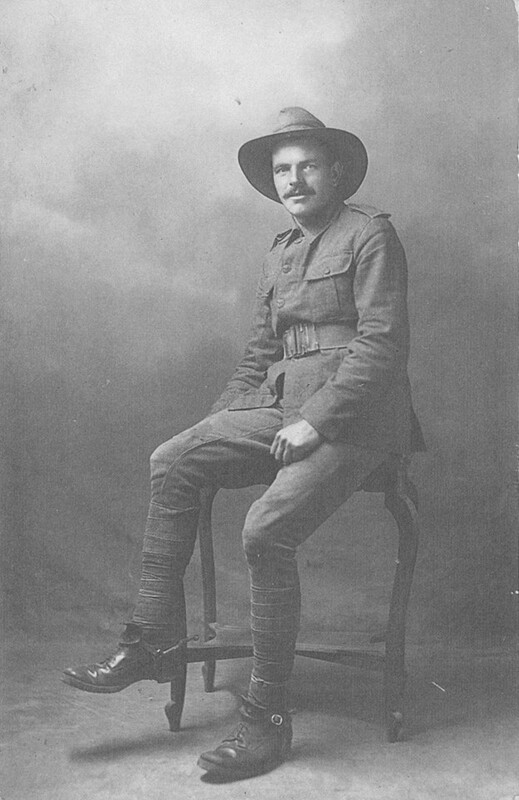 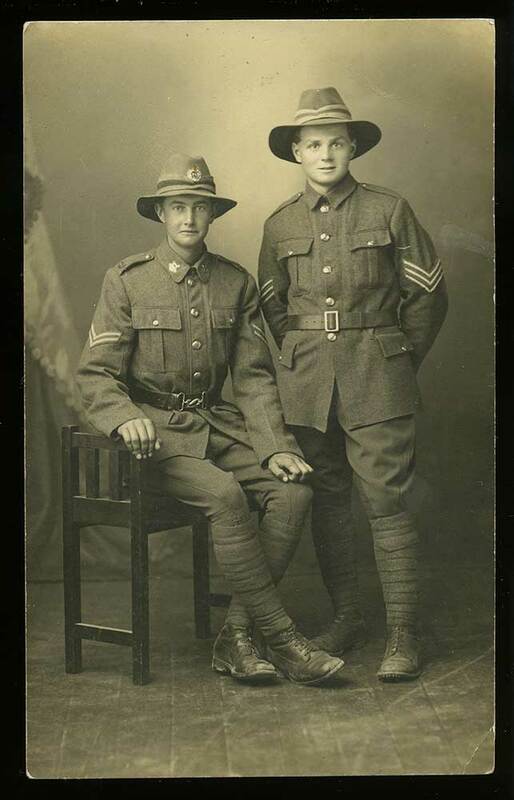 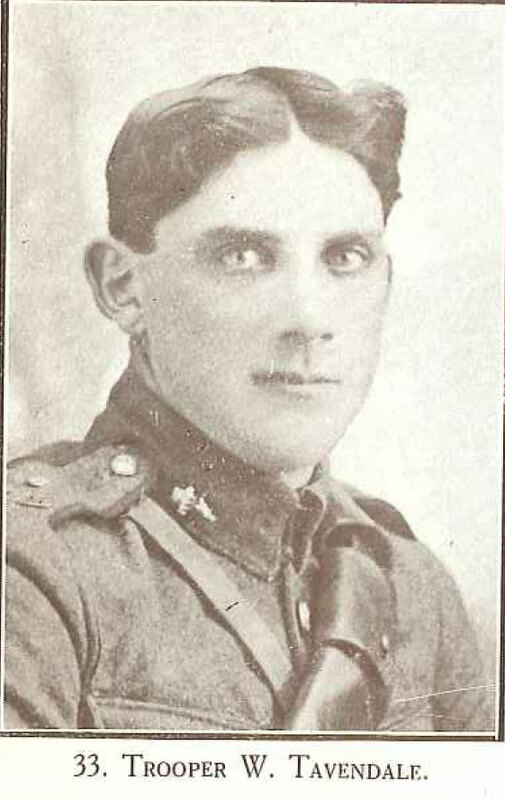 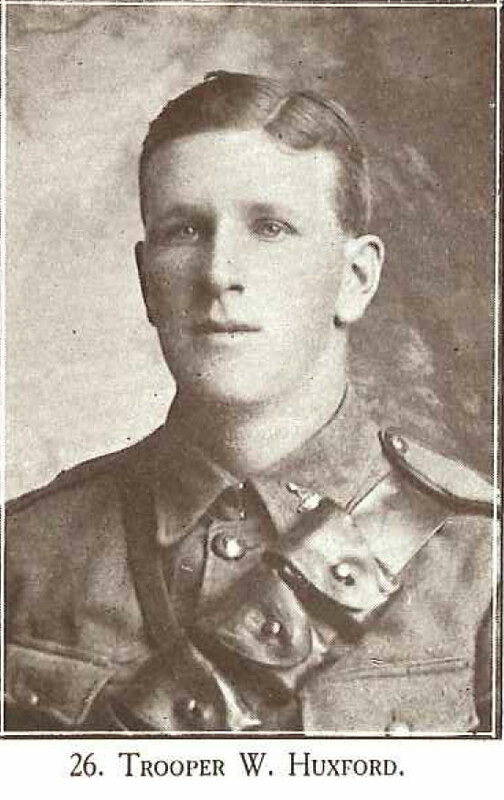 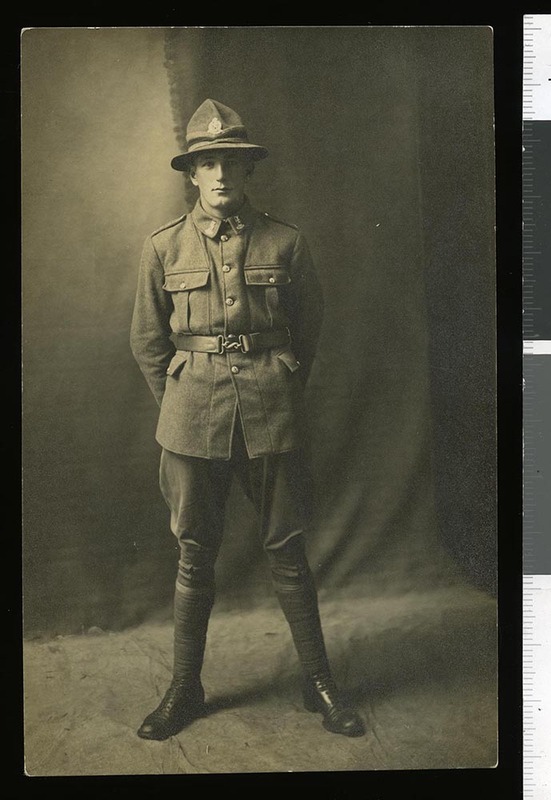 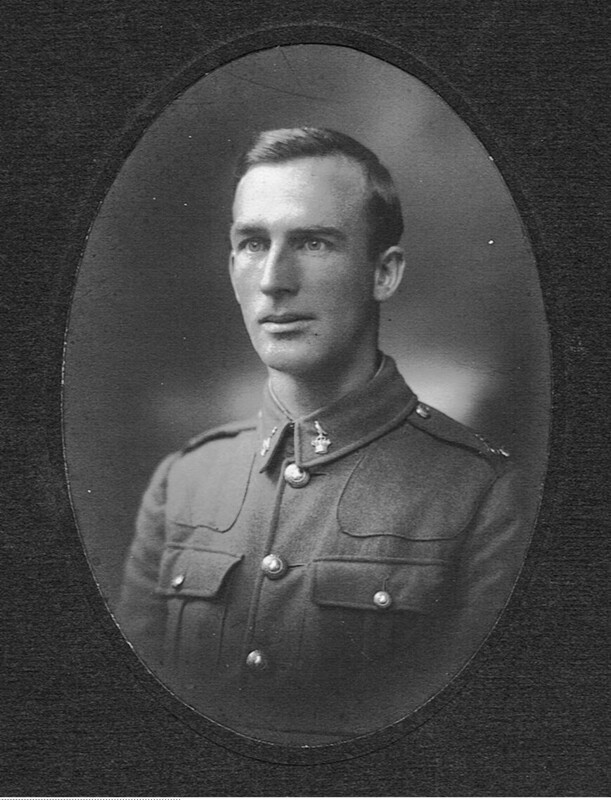 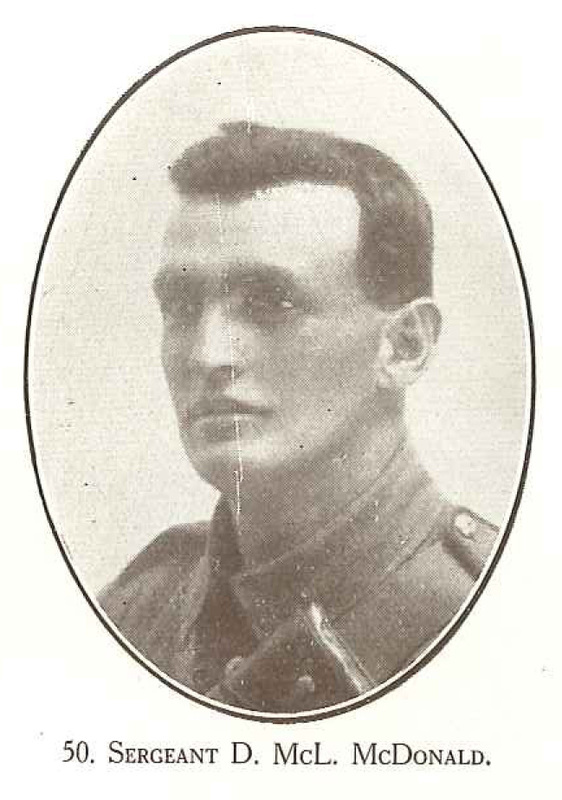 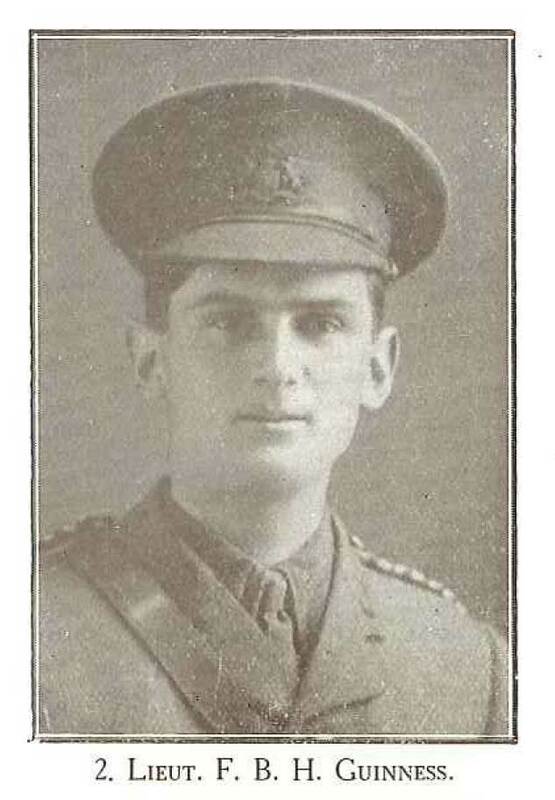 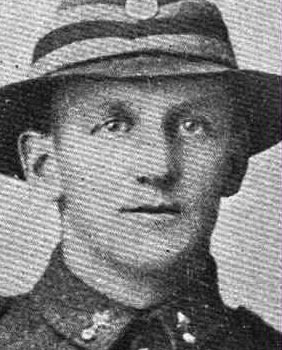 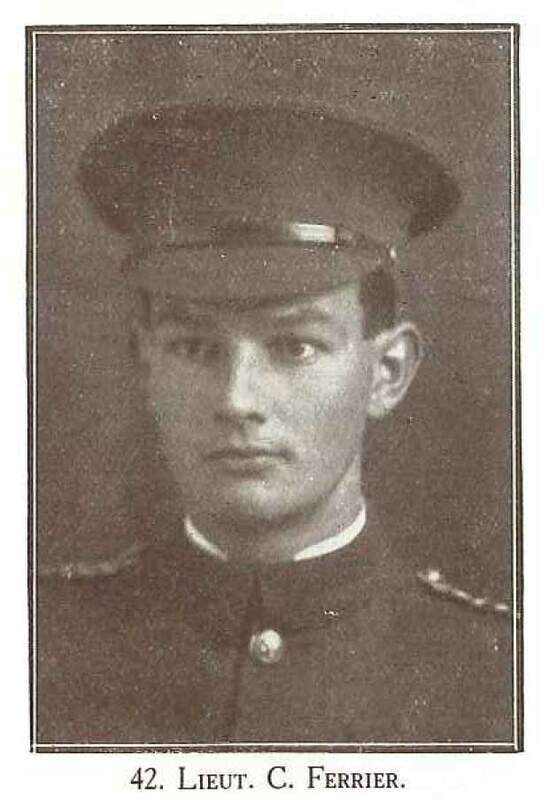 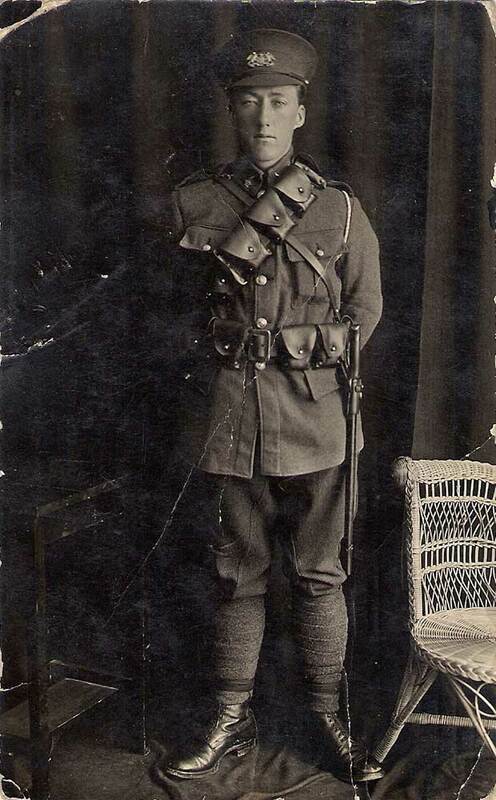 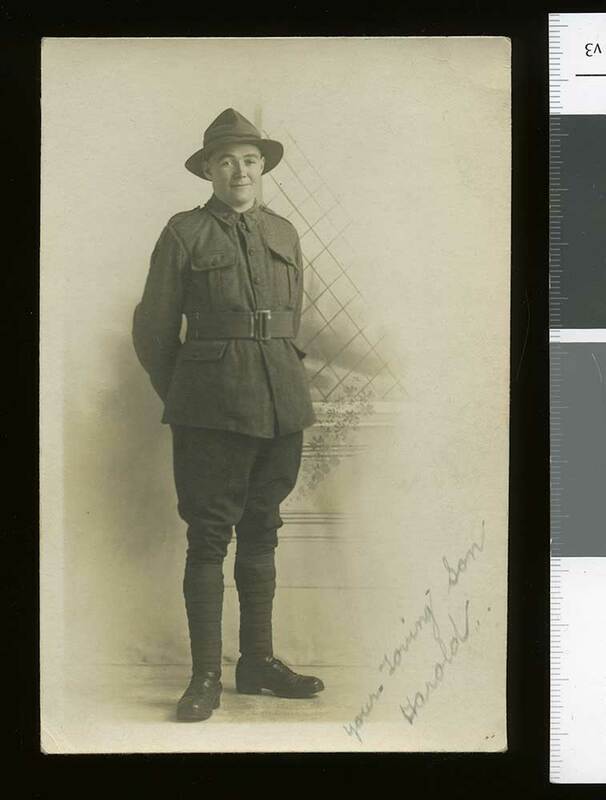 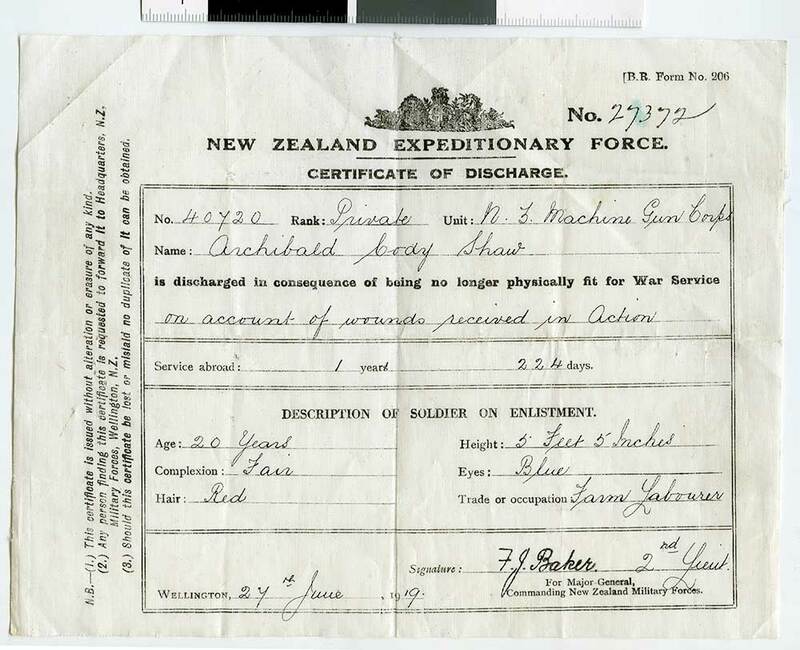 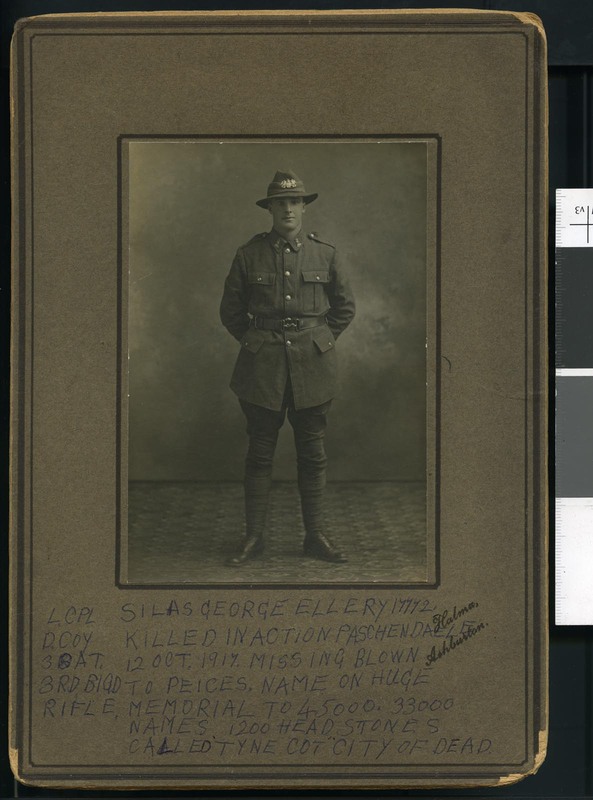 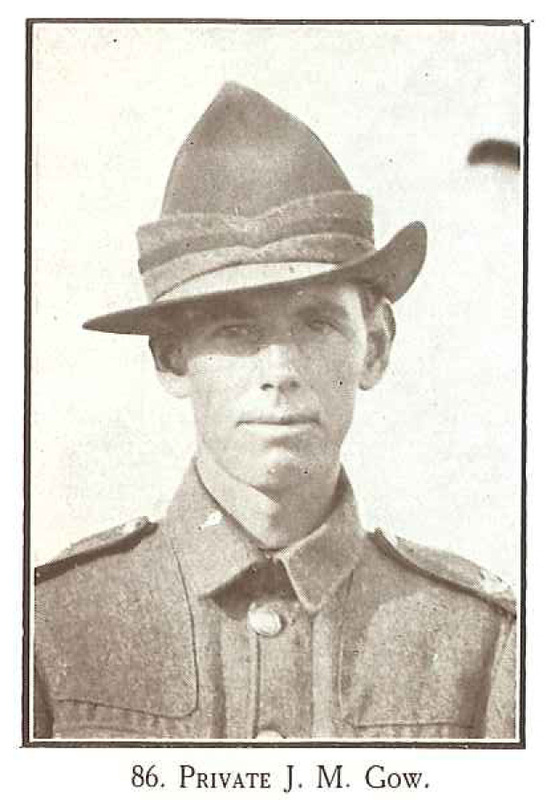 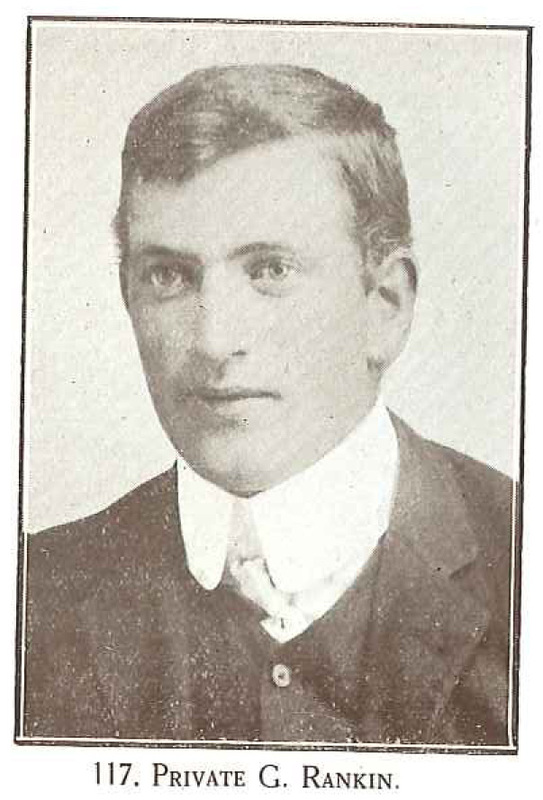 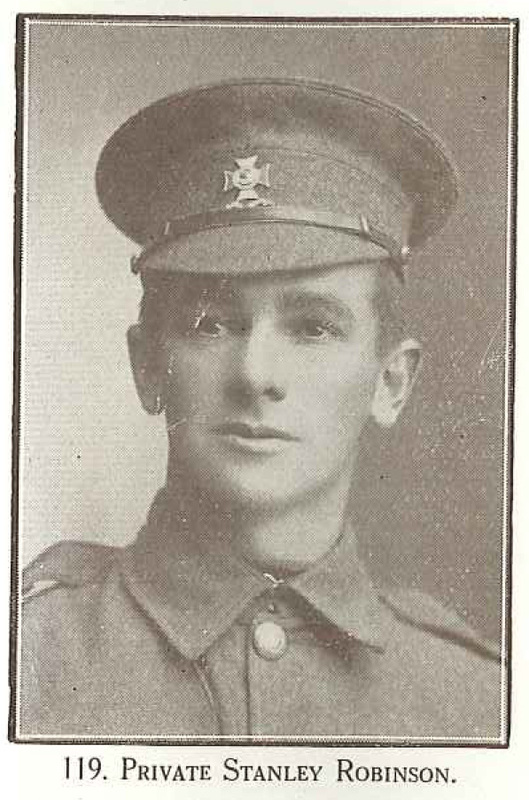 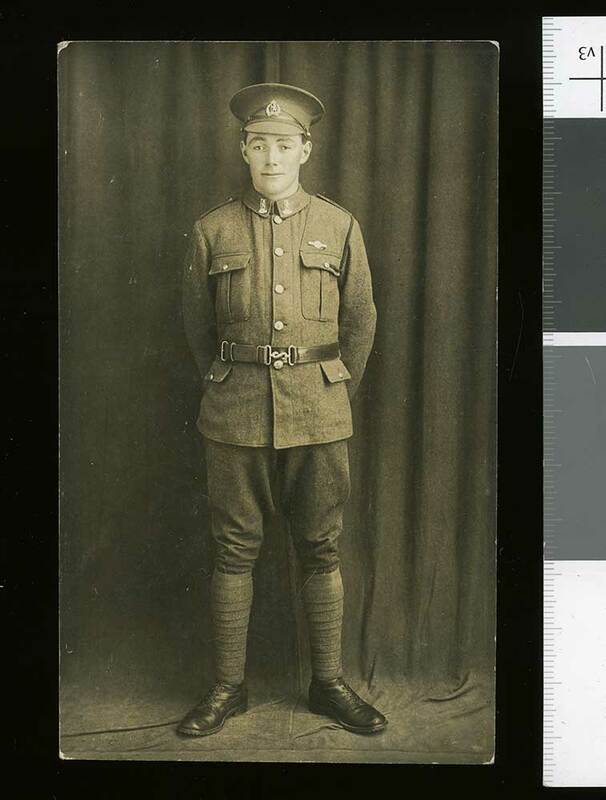 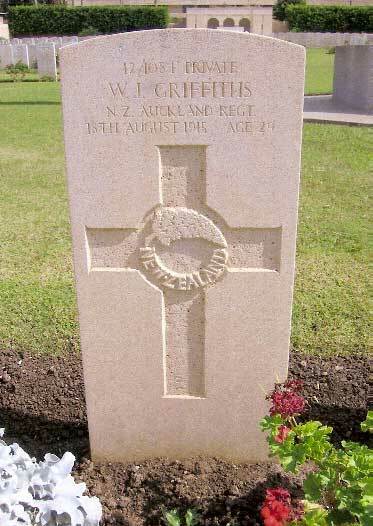 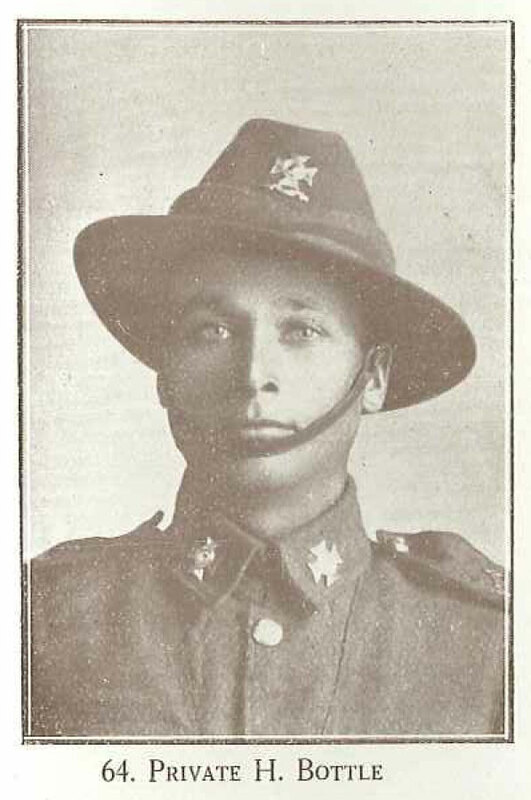 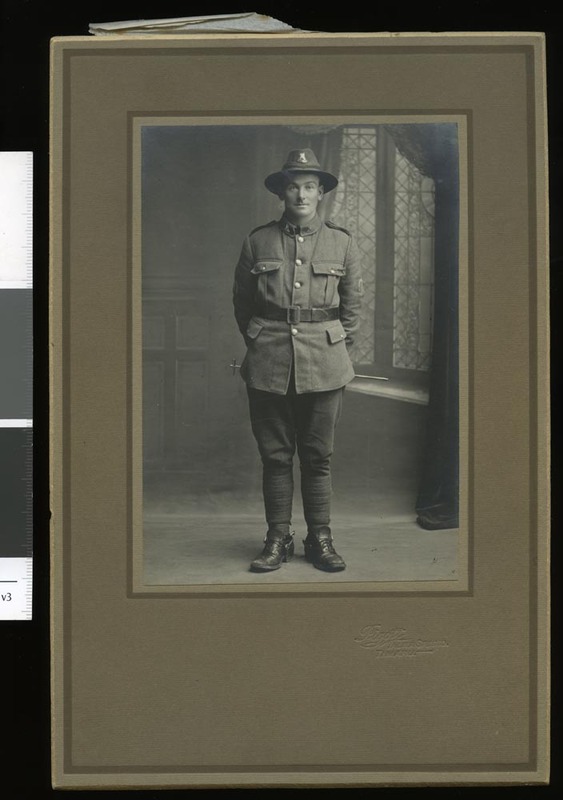 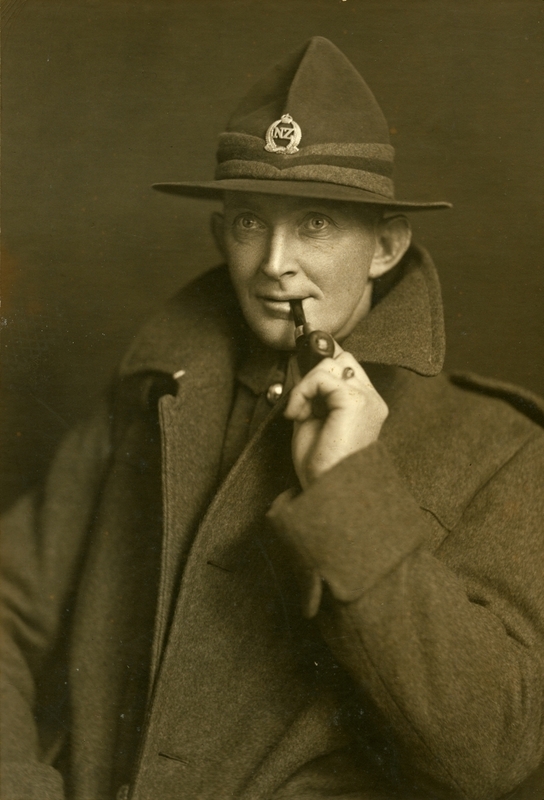 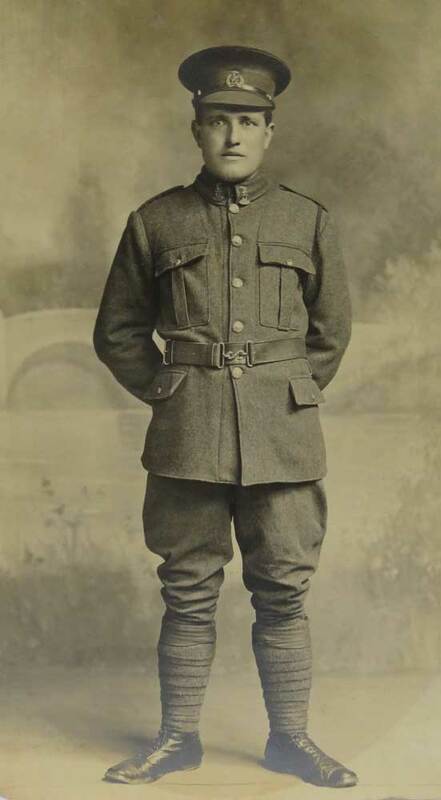 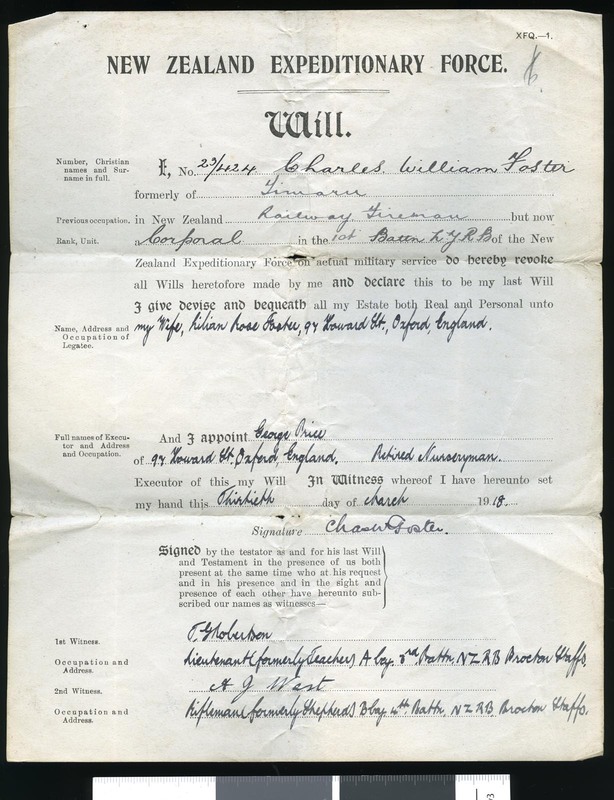 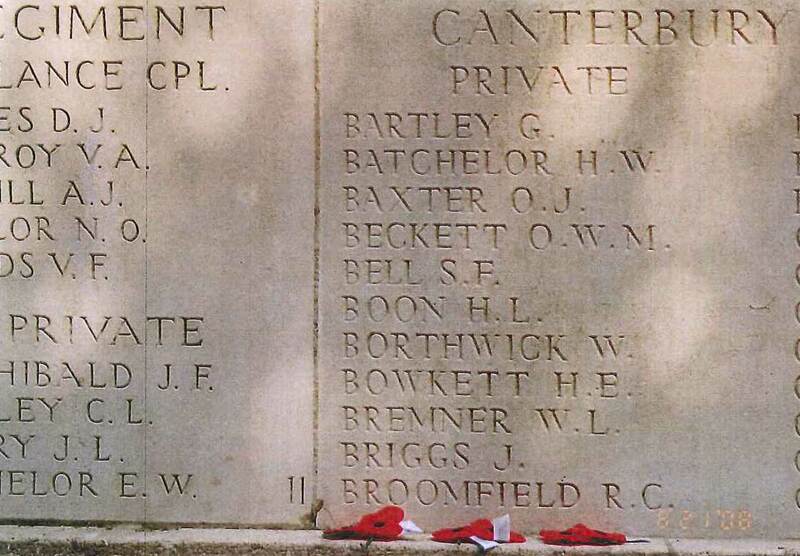 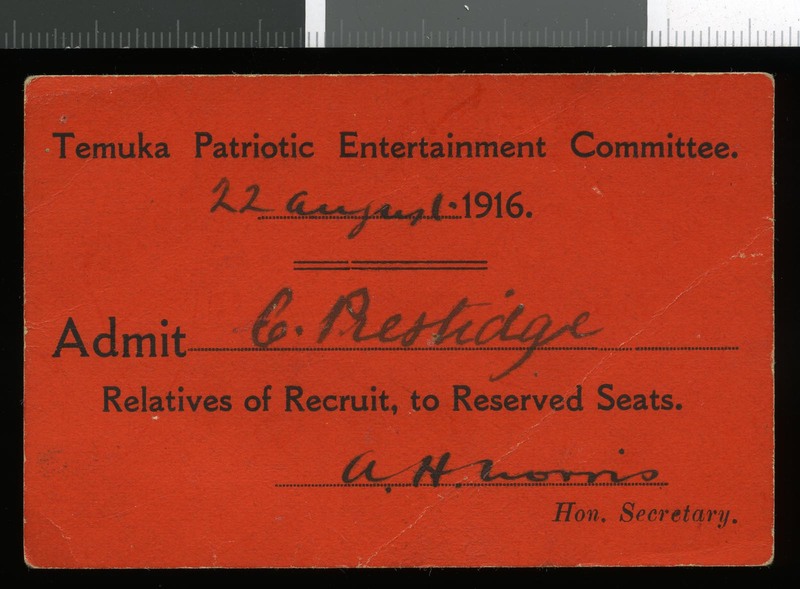 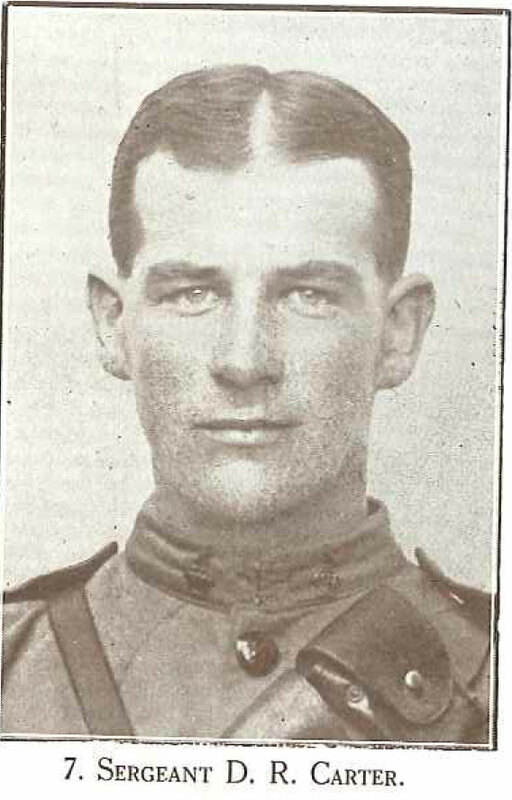 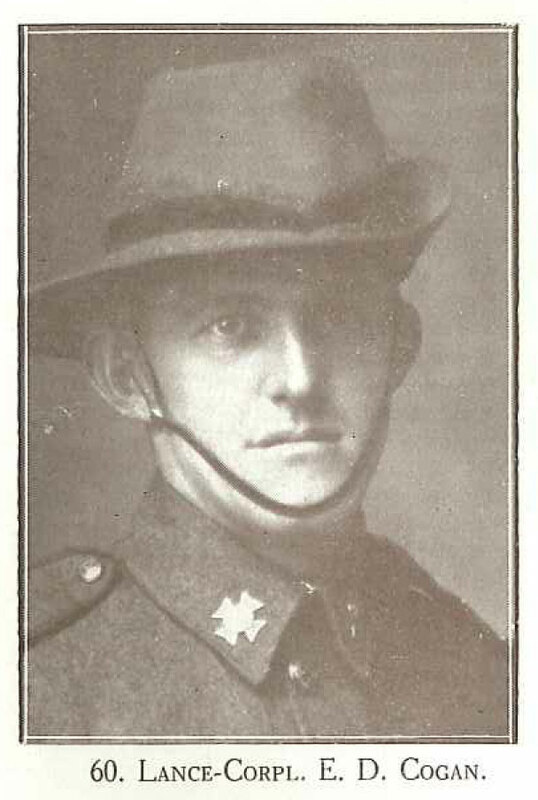 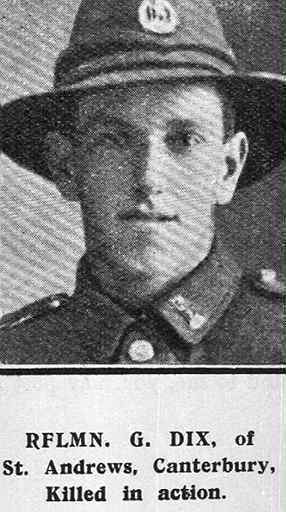 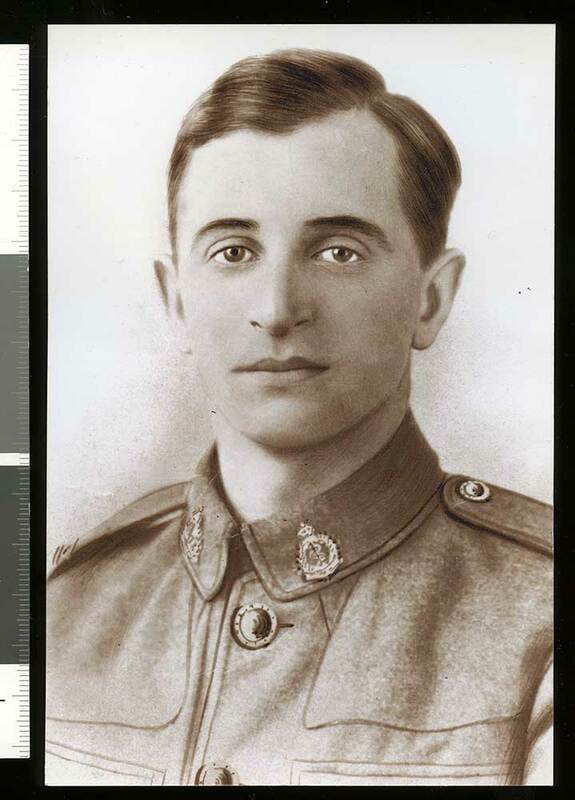 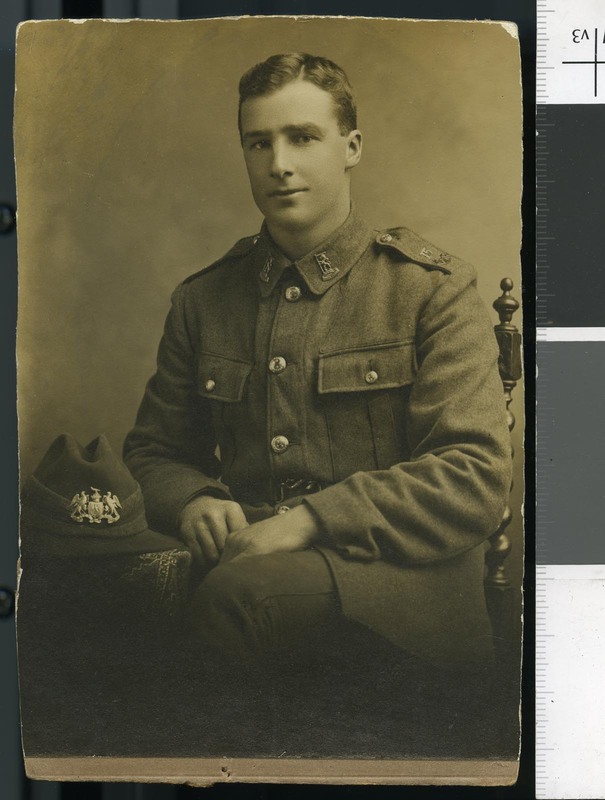 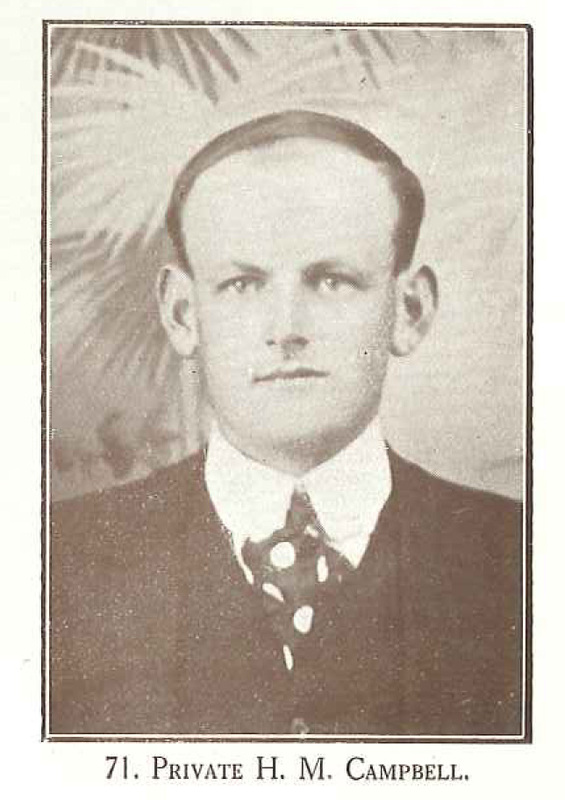 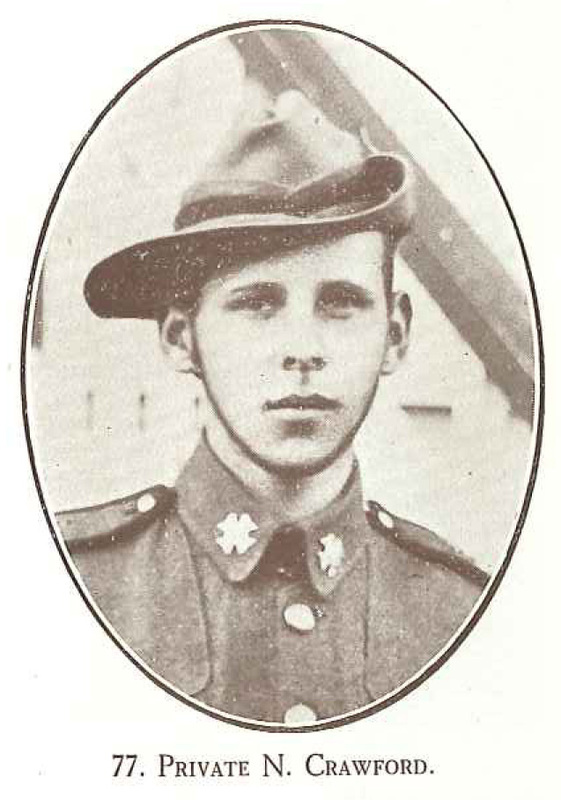 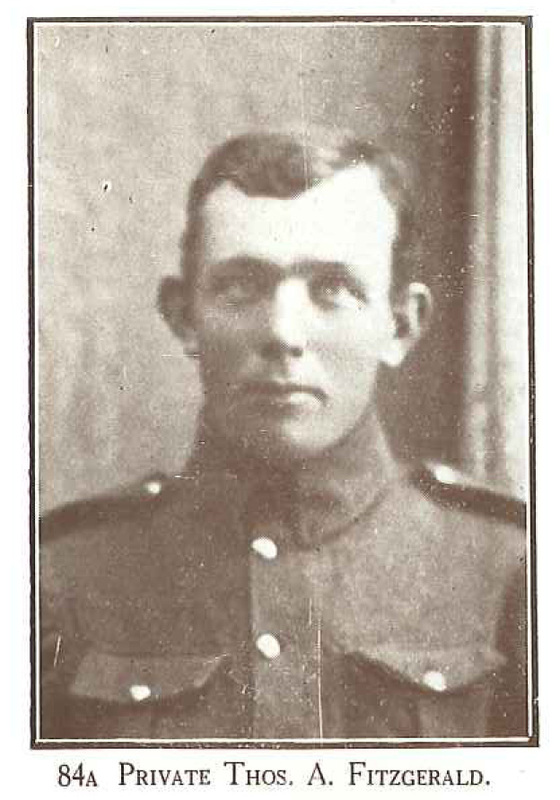 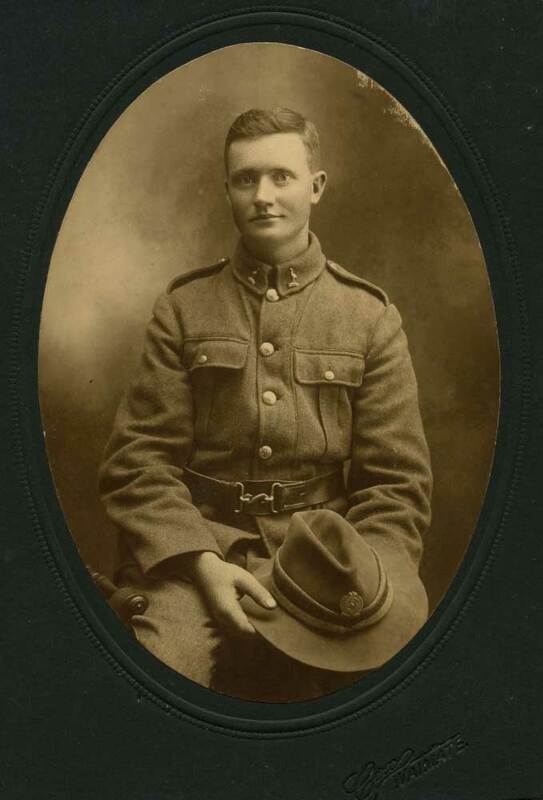 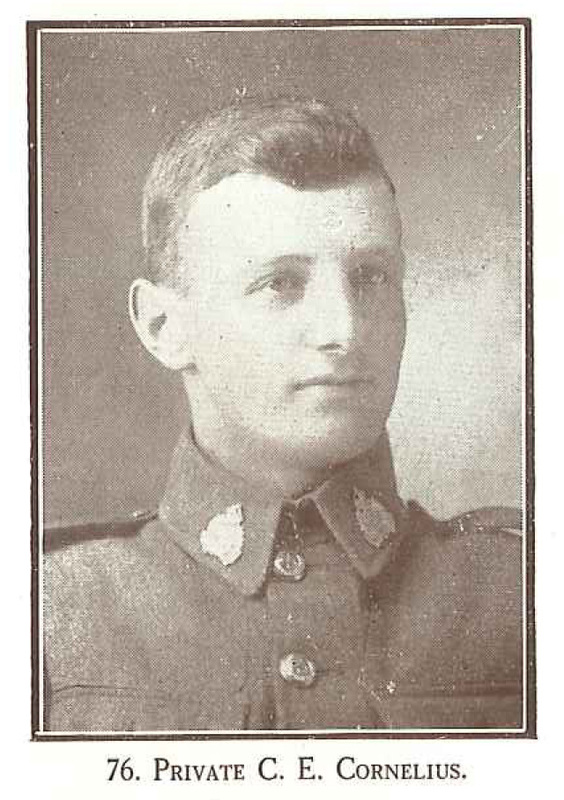 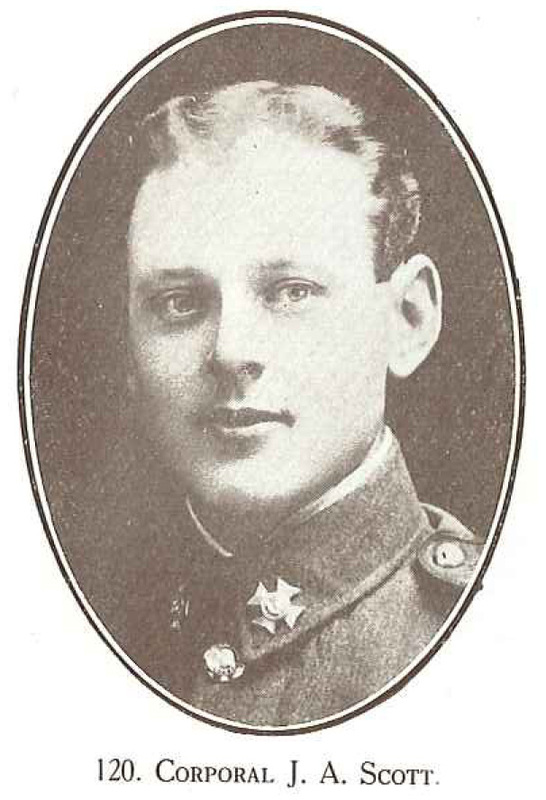 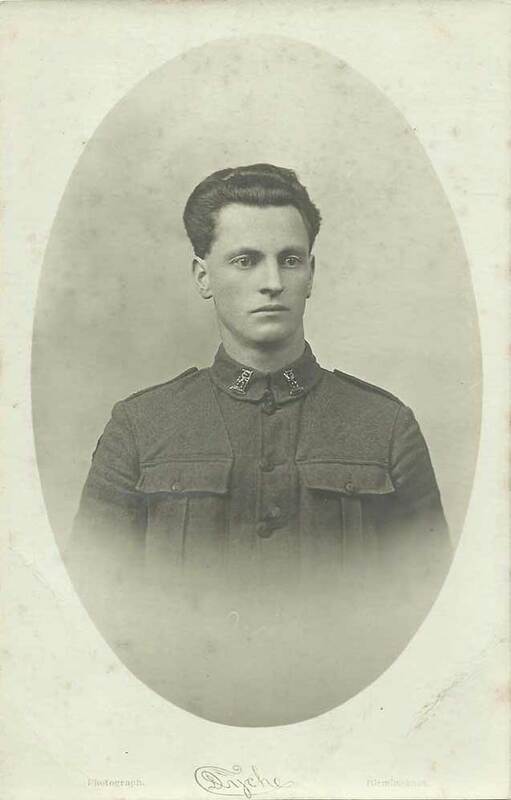 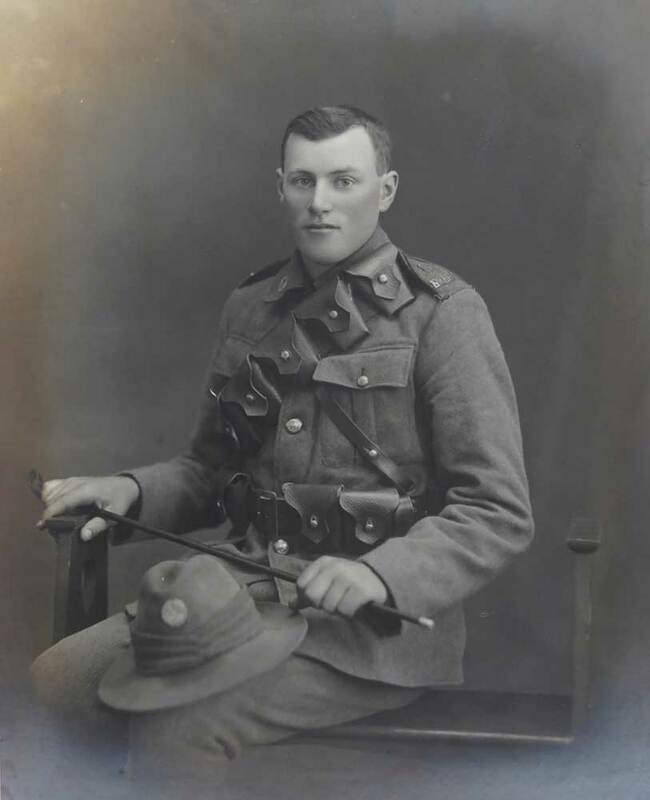 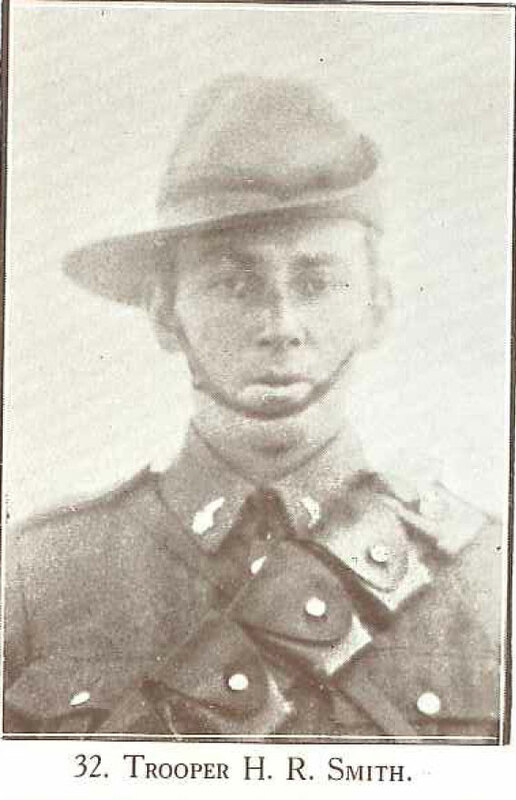 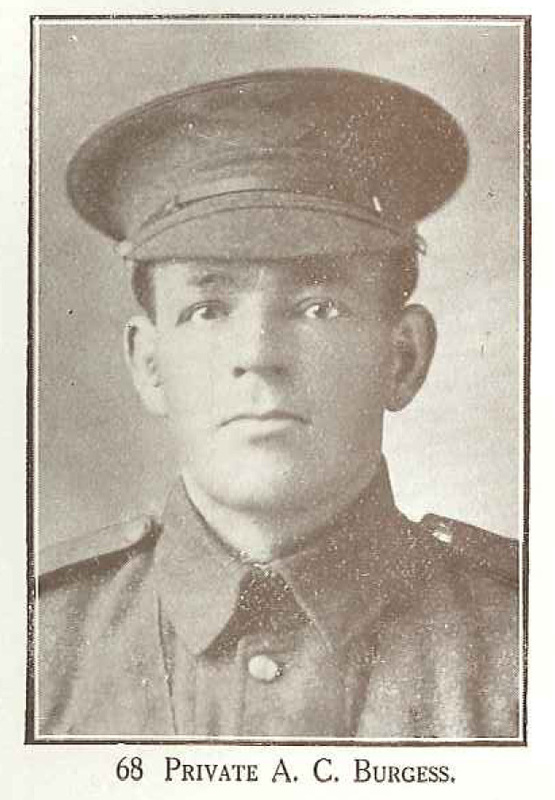 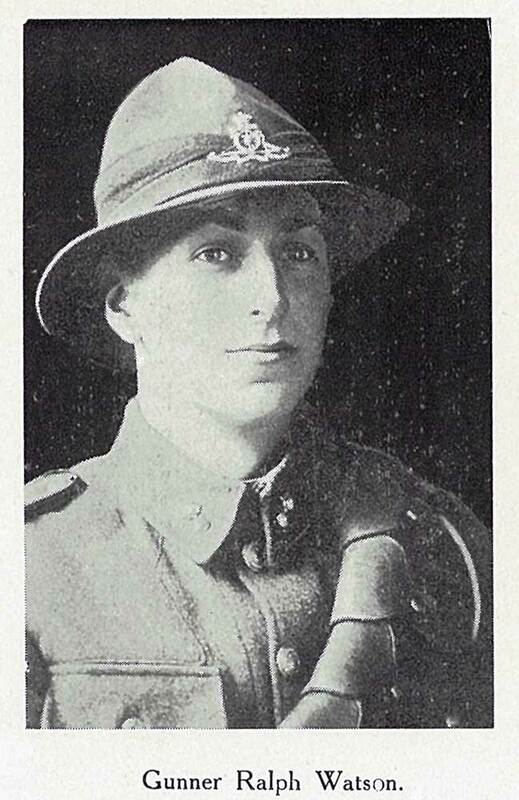 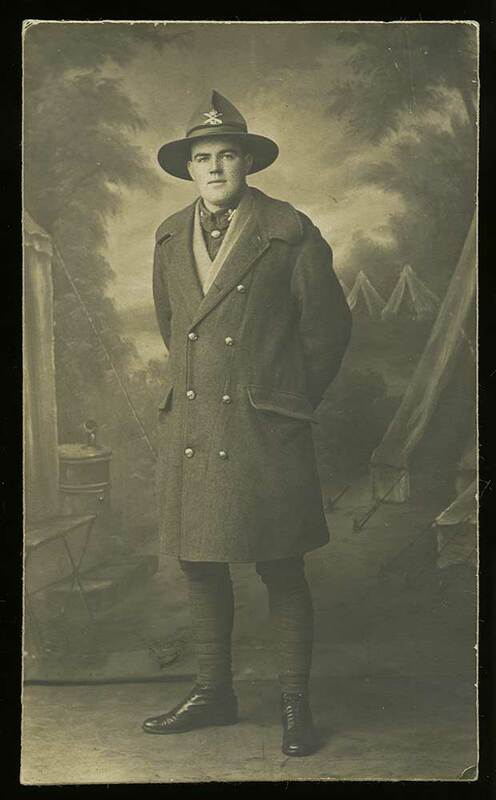 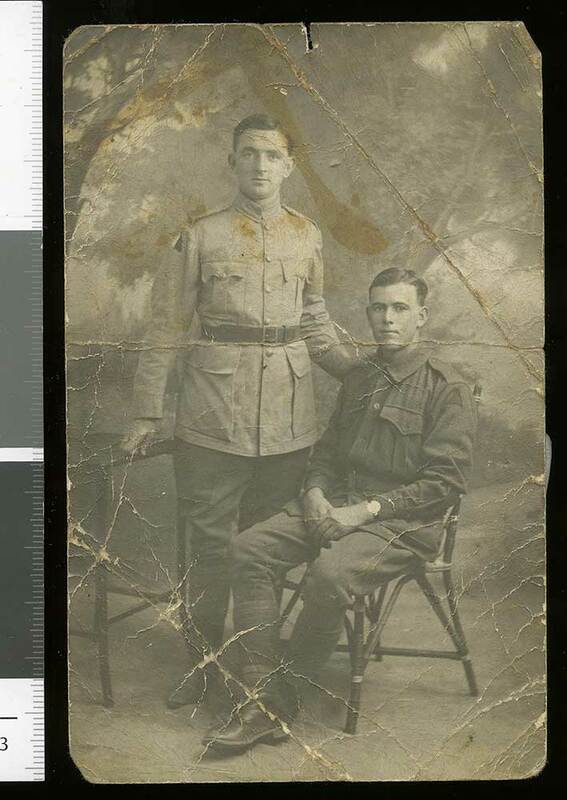 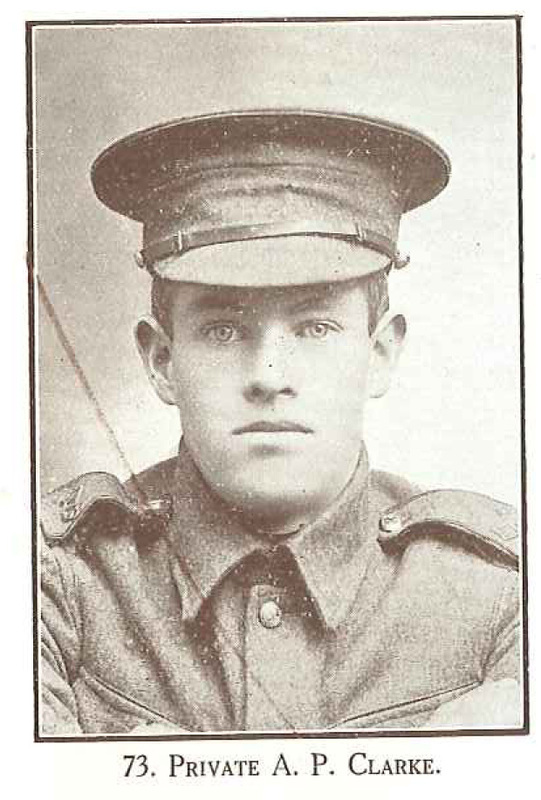 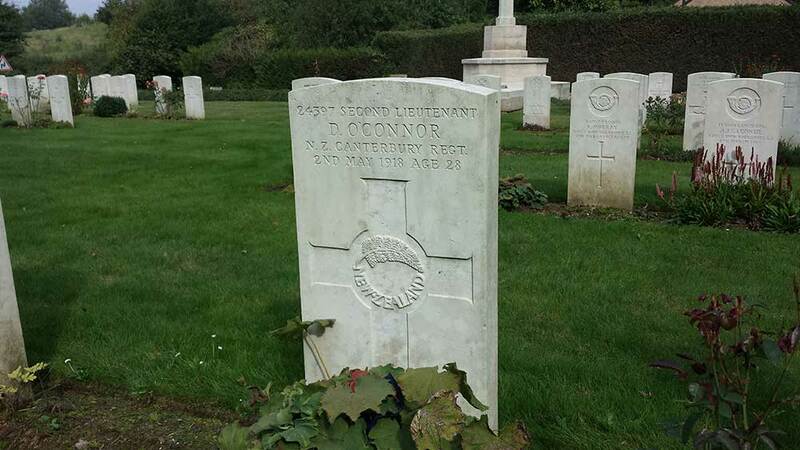 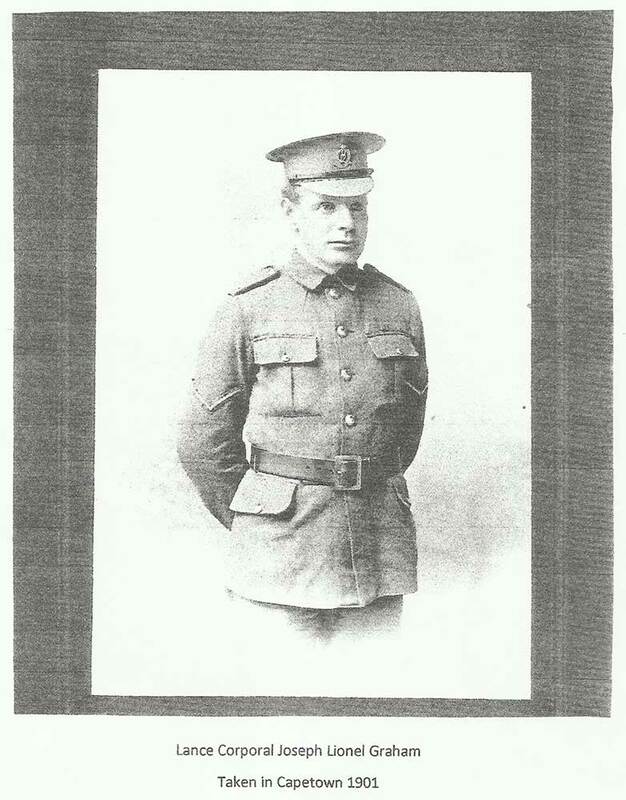 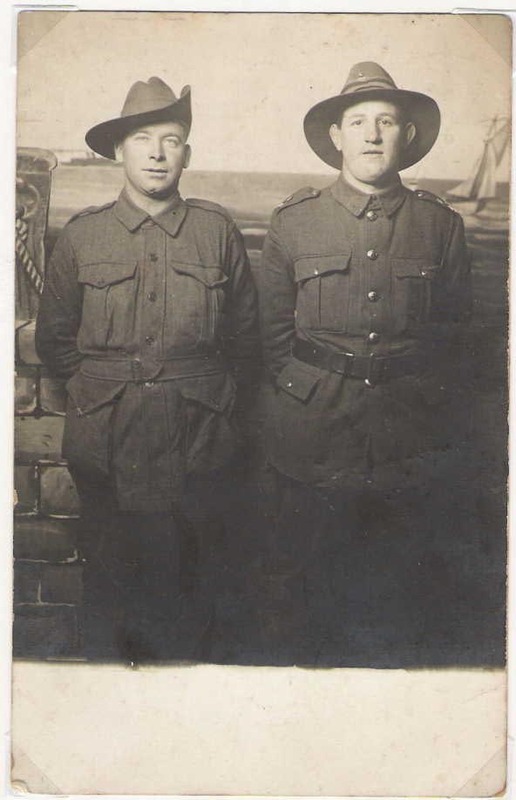 Looker served with the 40th and 44th Reinforcements before joining the Canterbury Infantry Regiment, all in 1918. 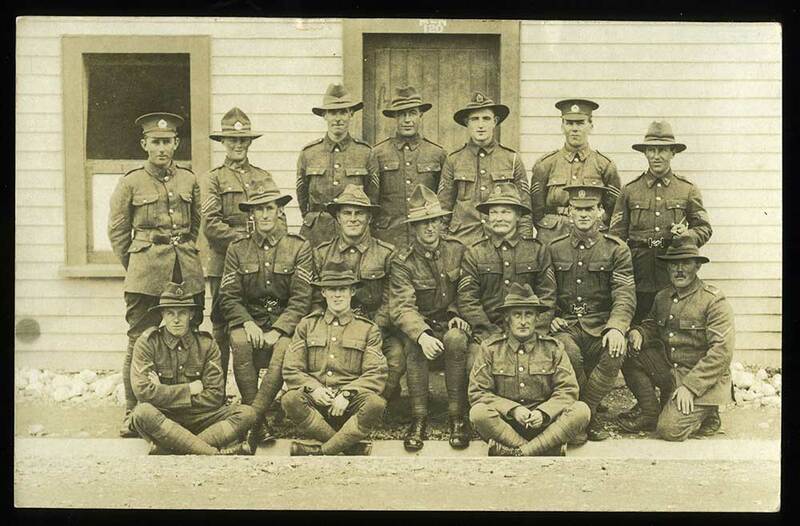 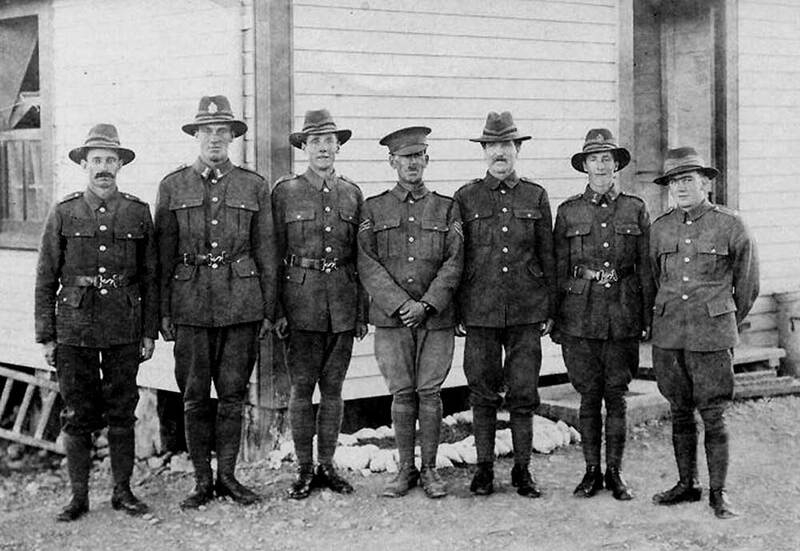 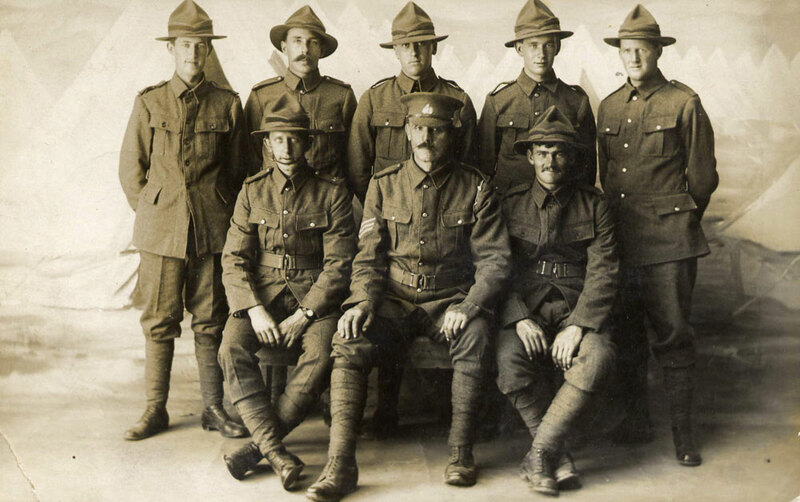 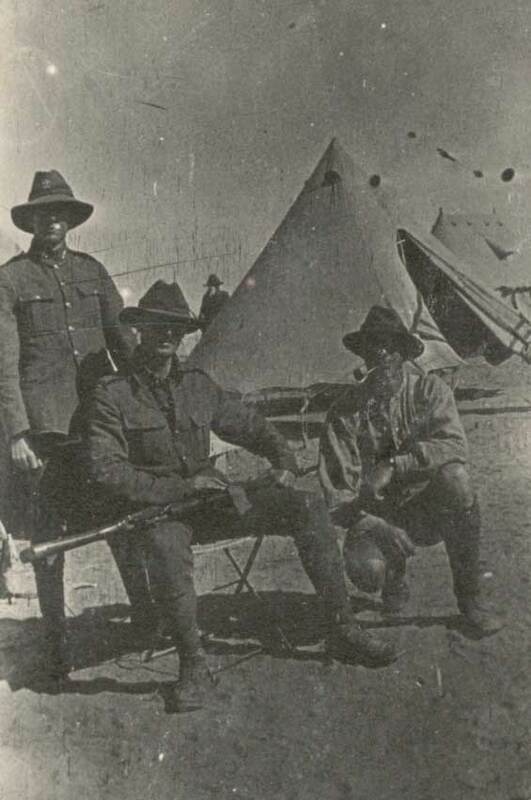 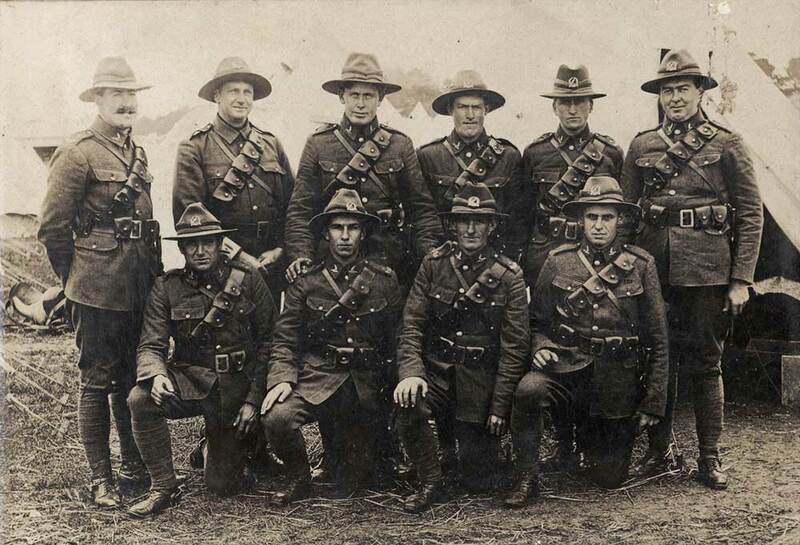 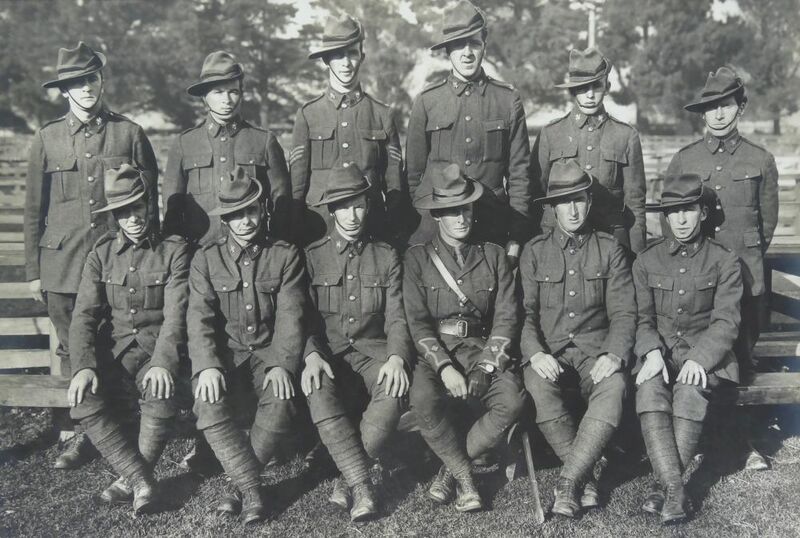 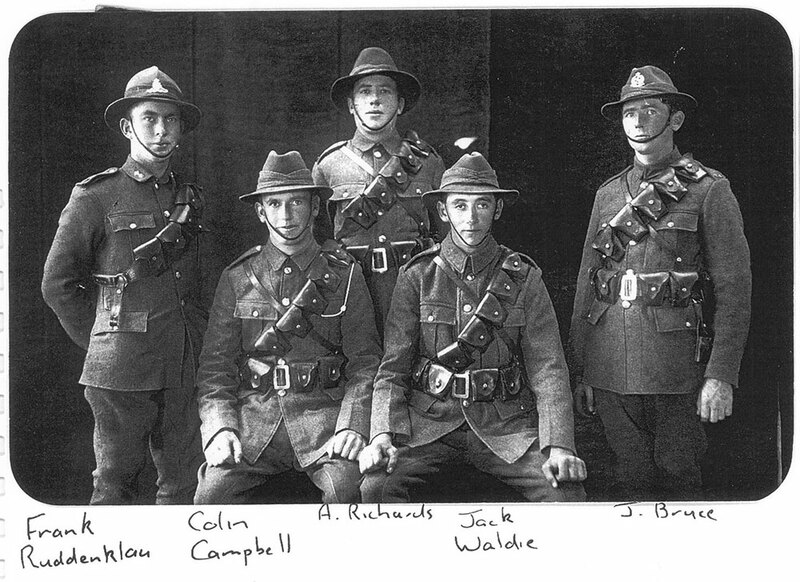 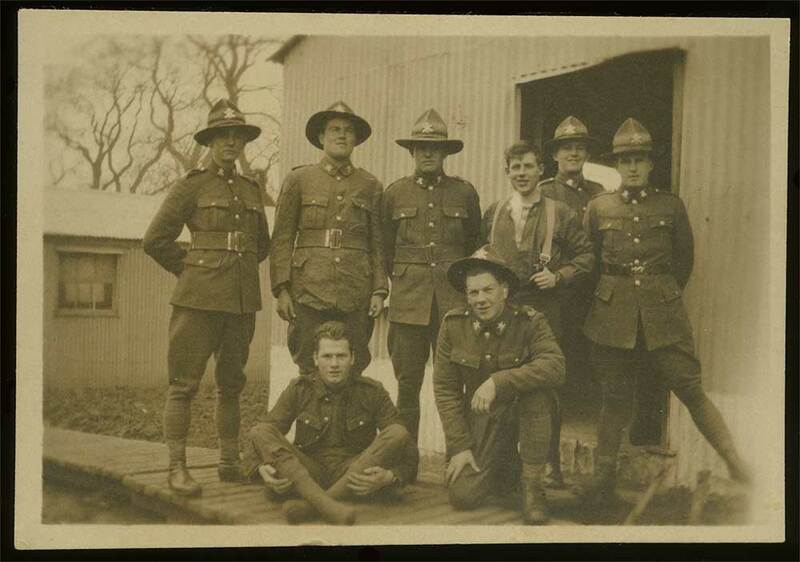 Alister Ross (service no.62883, pictured standing second from left) with other NZ Machine Gun Corps soldiers at camp in Grantham, England, in early 1918 prior to going to the front. 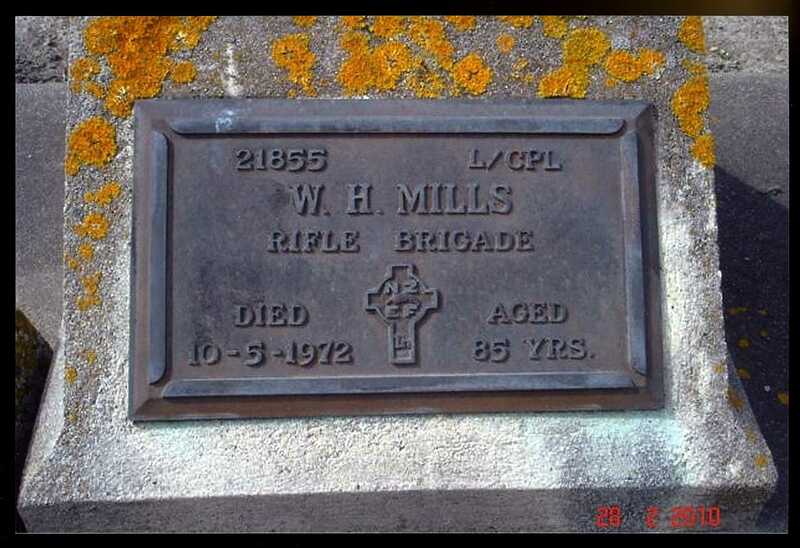 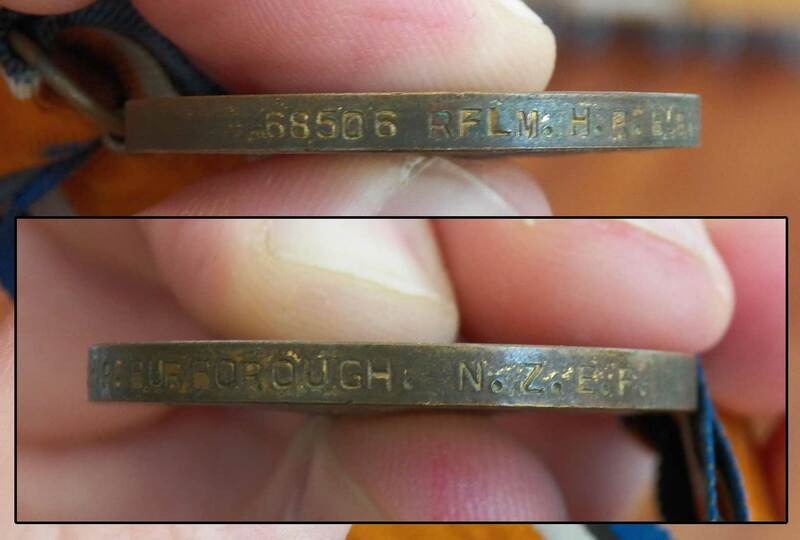 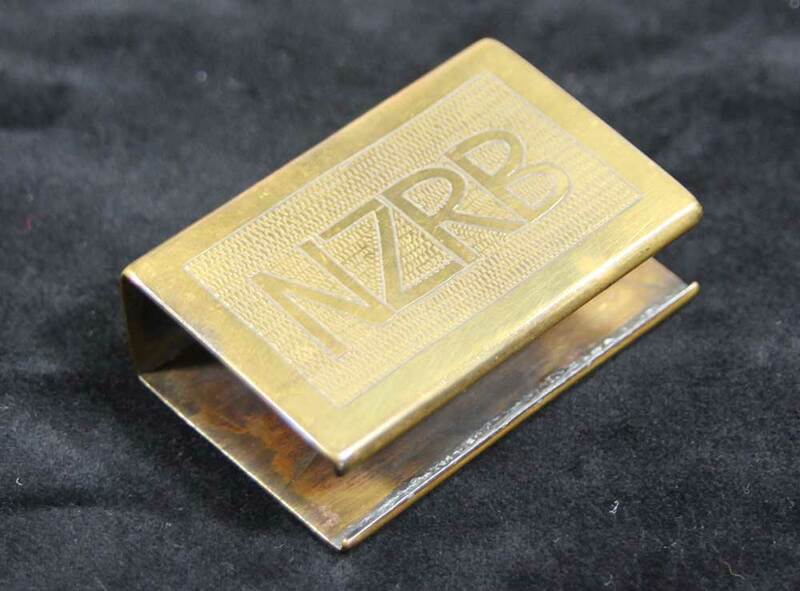 Showing the unique edge-stamping of his name, rank and service number. 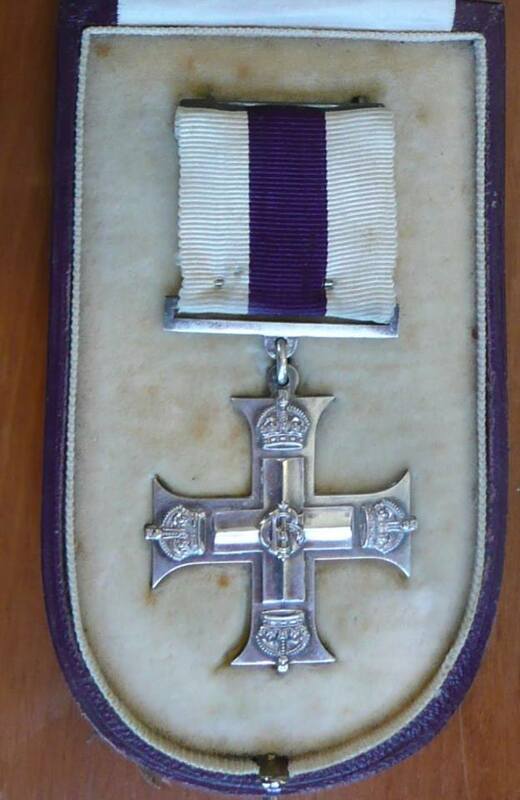 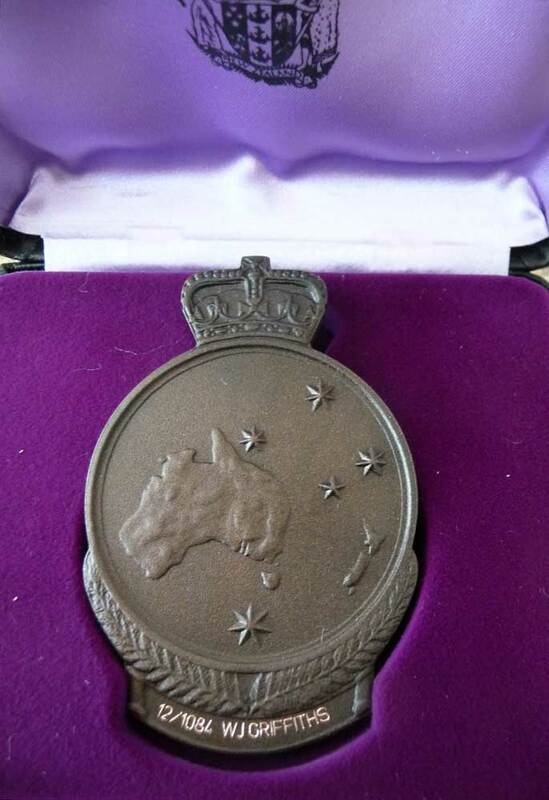 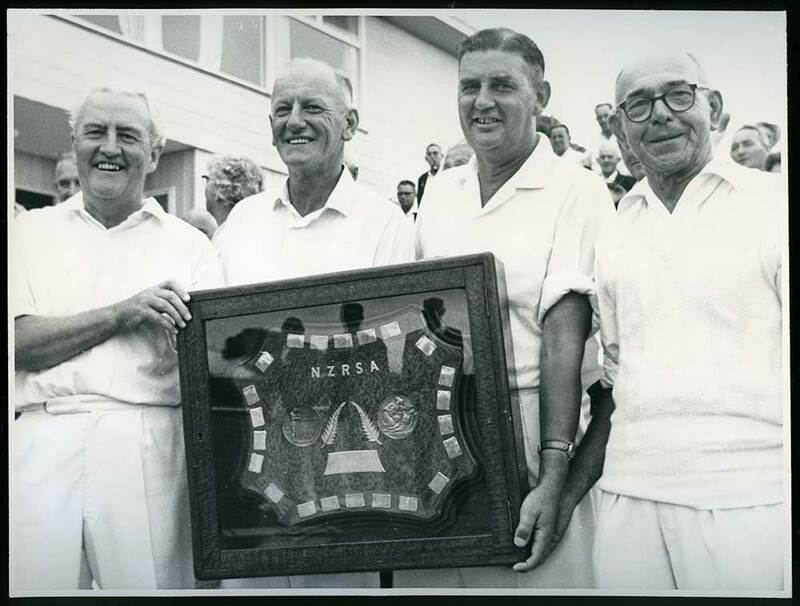 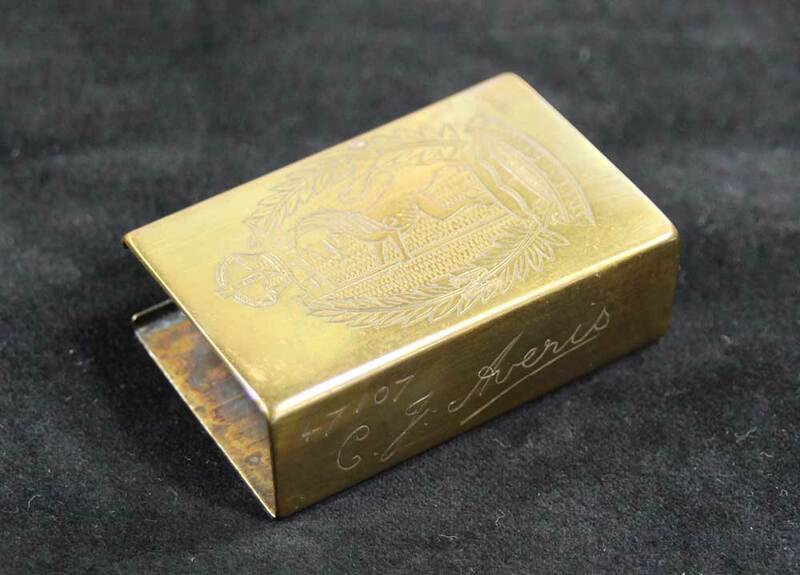 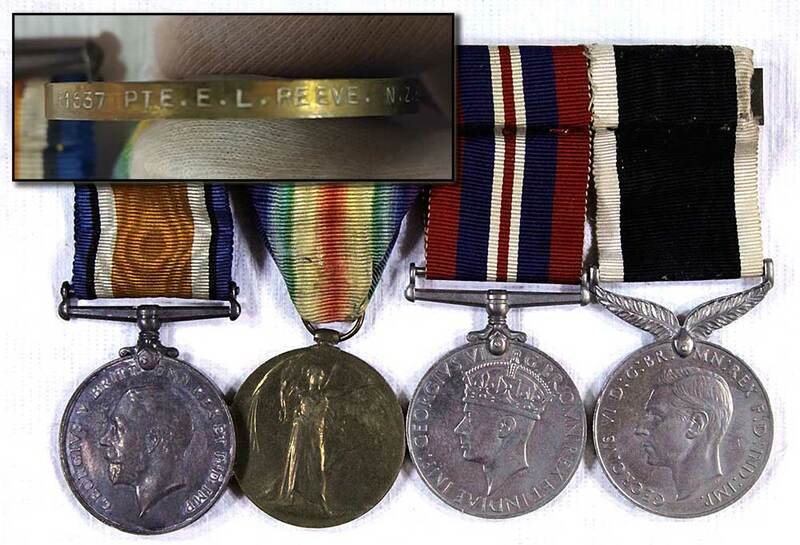 Given to Cecil Averis on his return from active service. 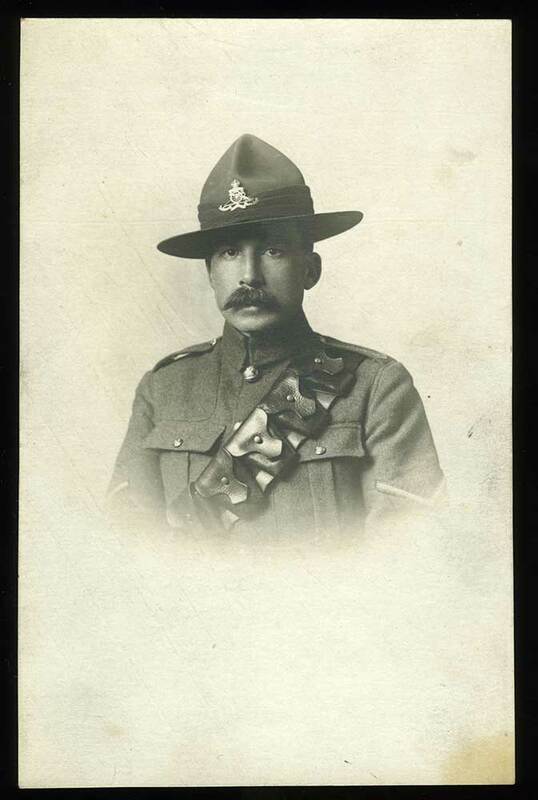 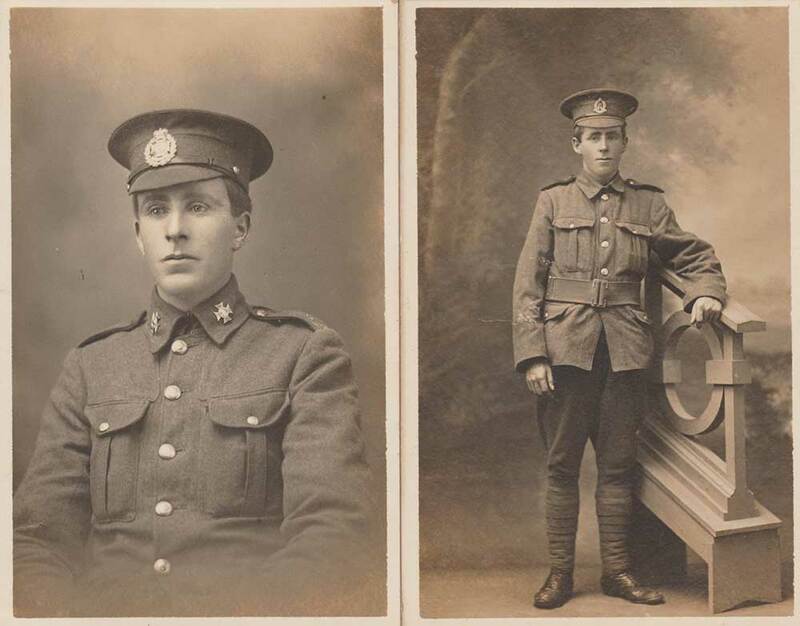 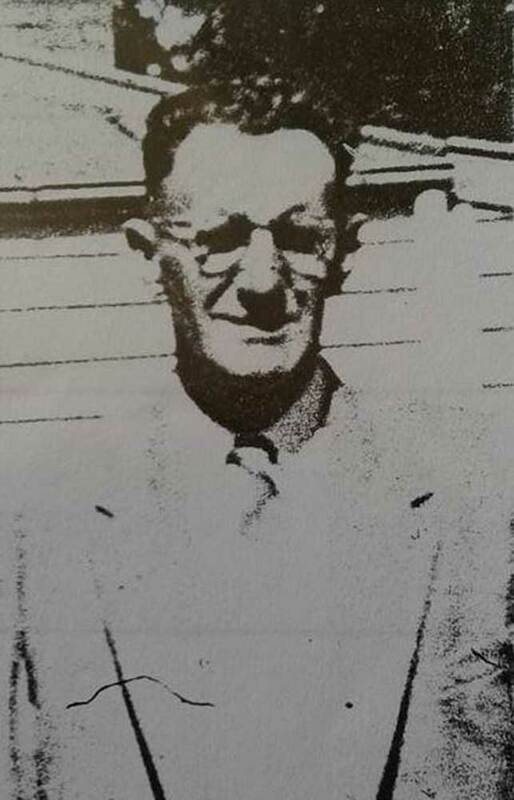 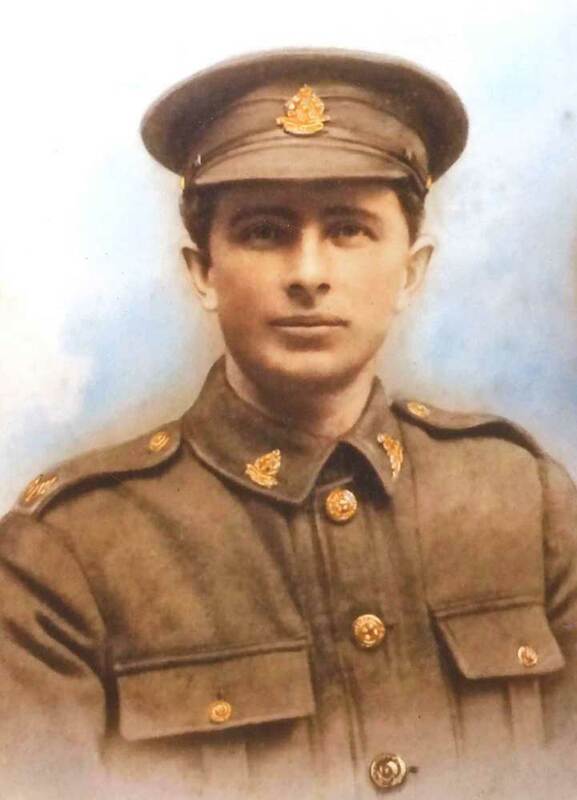 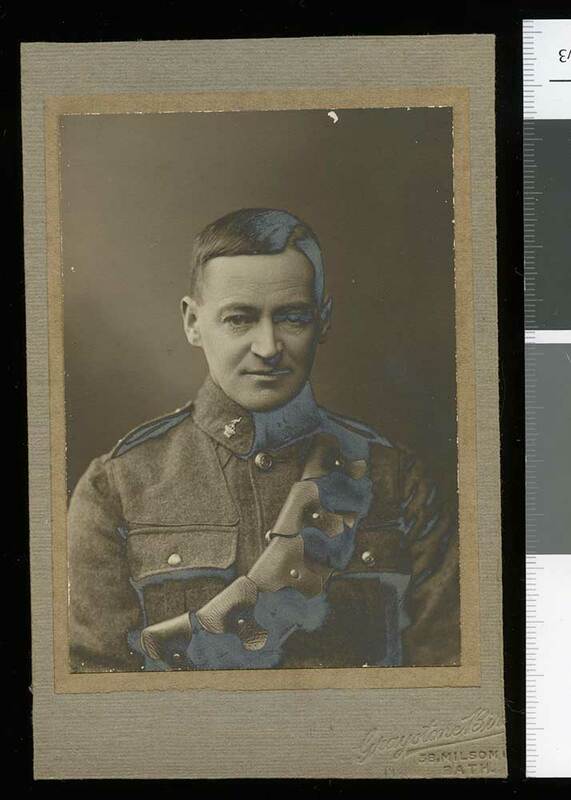 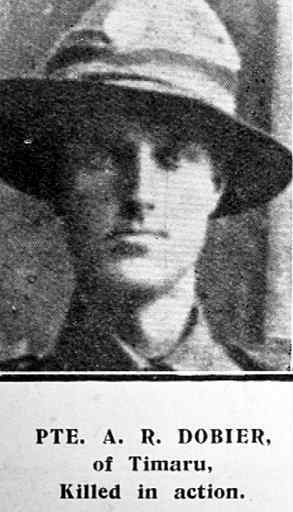 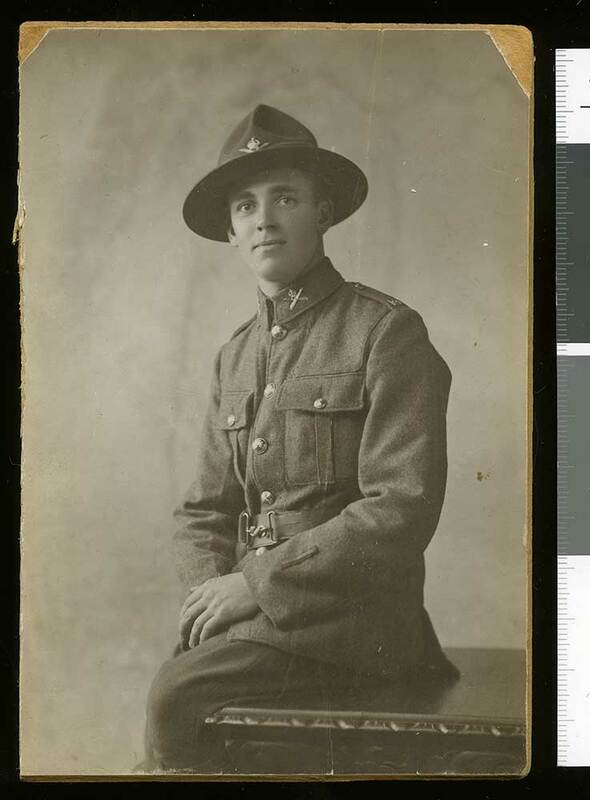 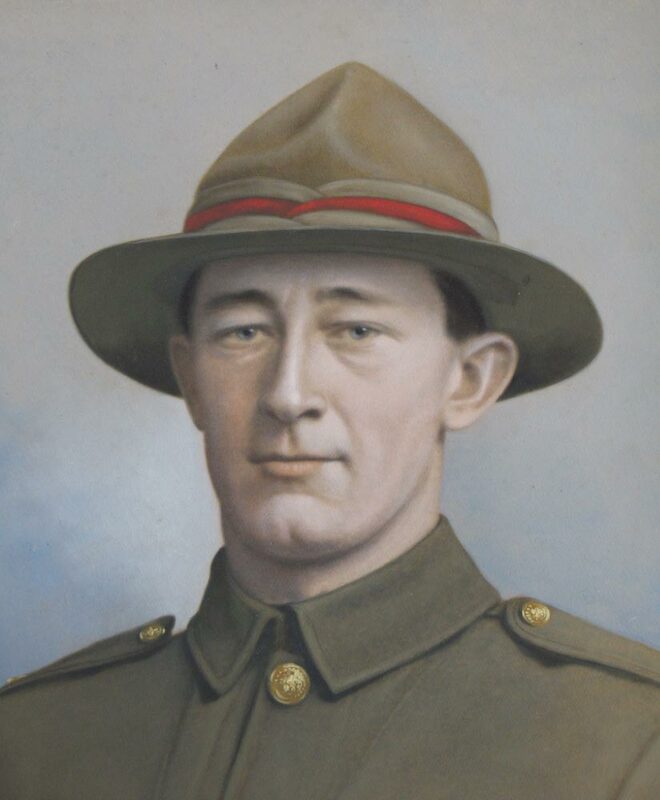 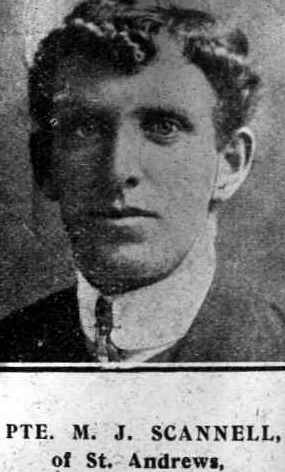 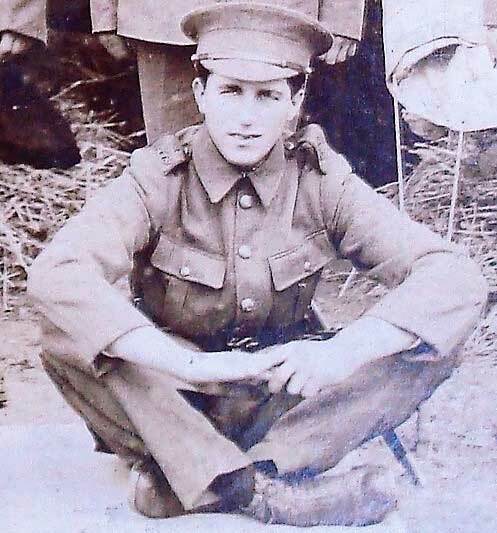 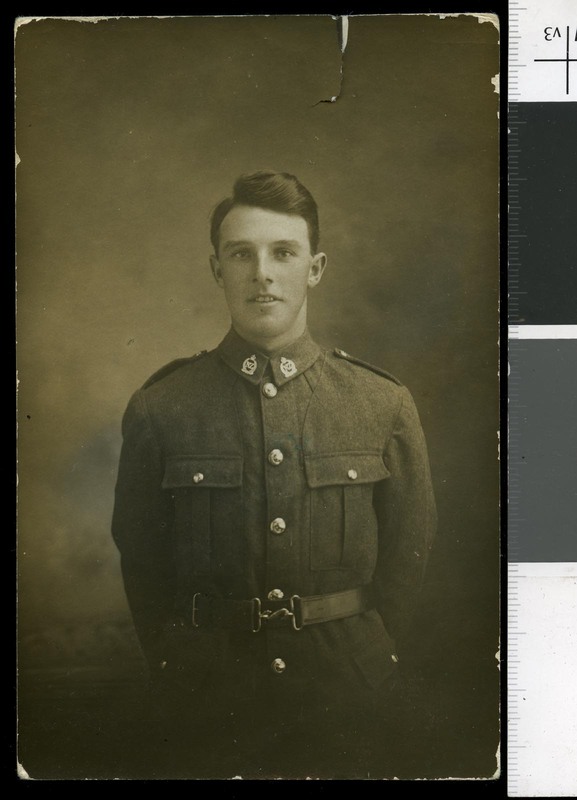 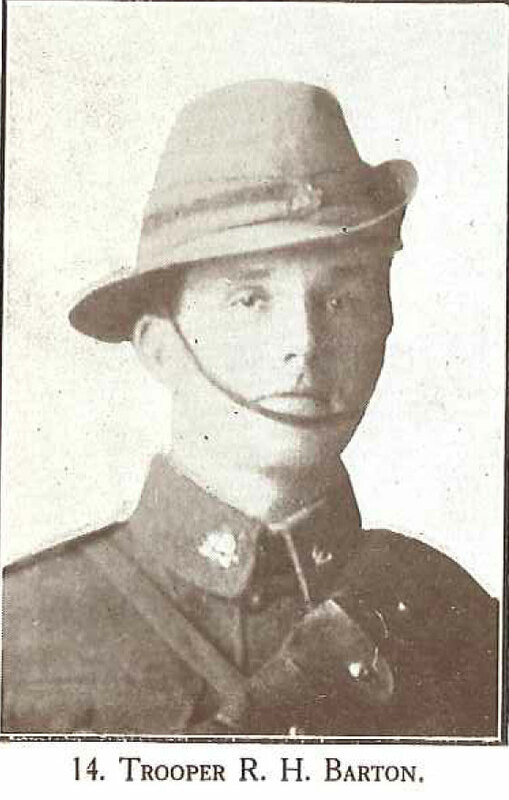 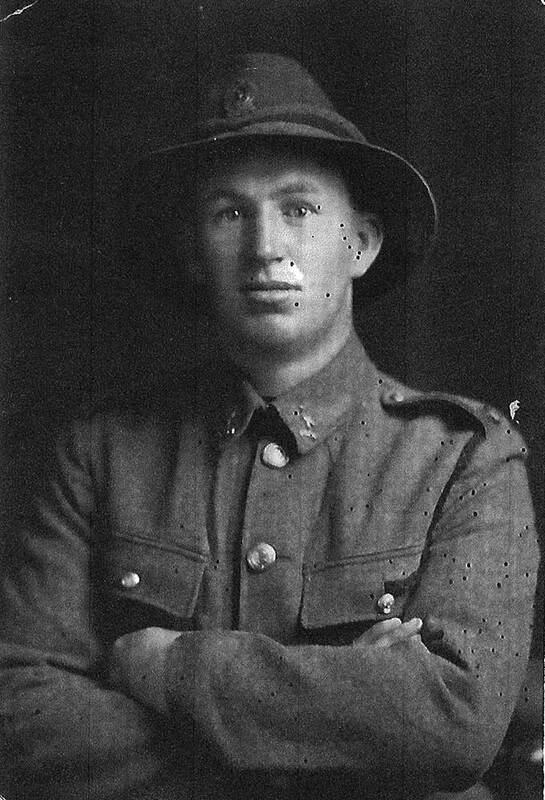 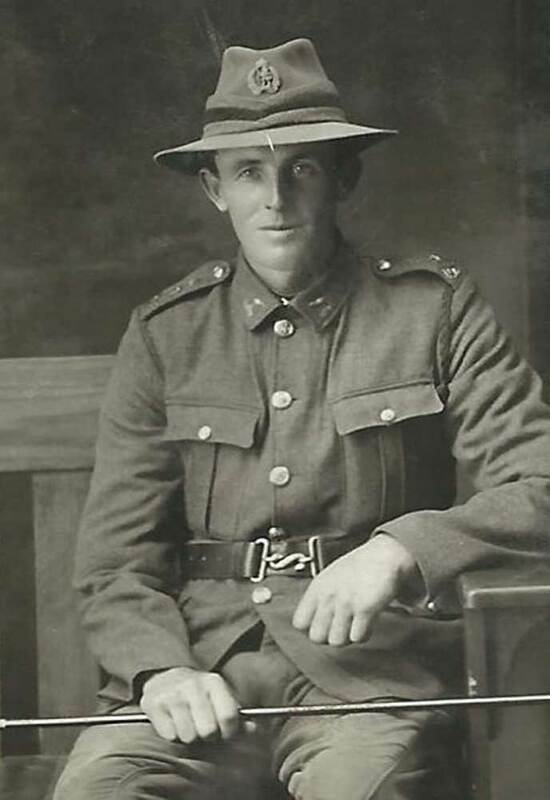 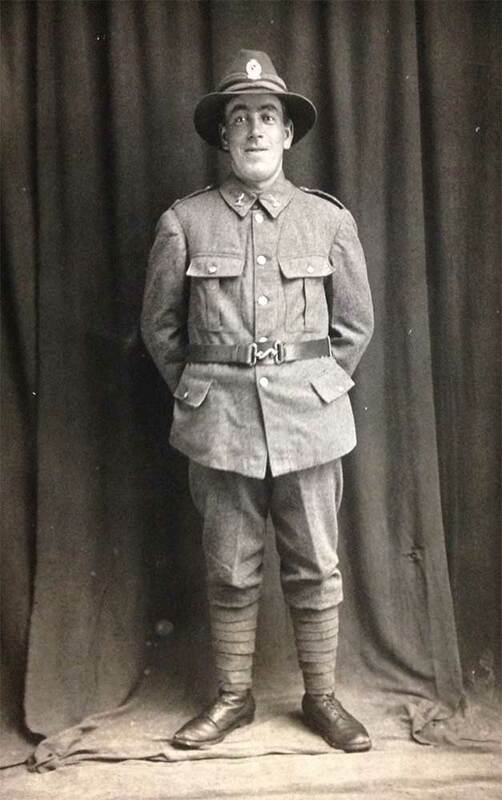 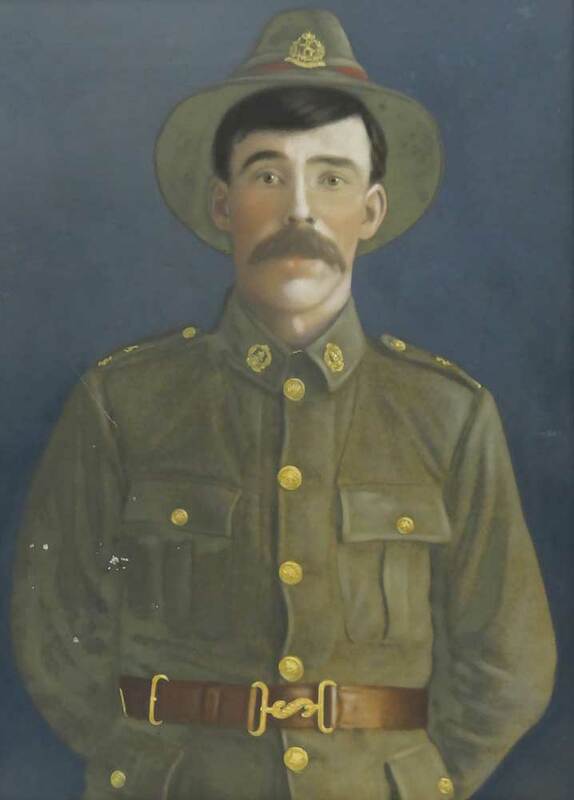 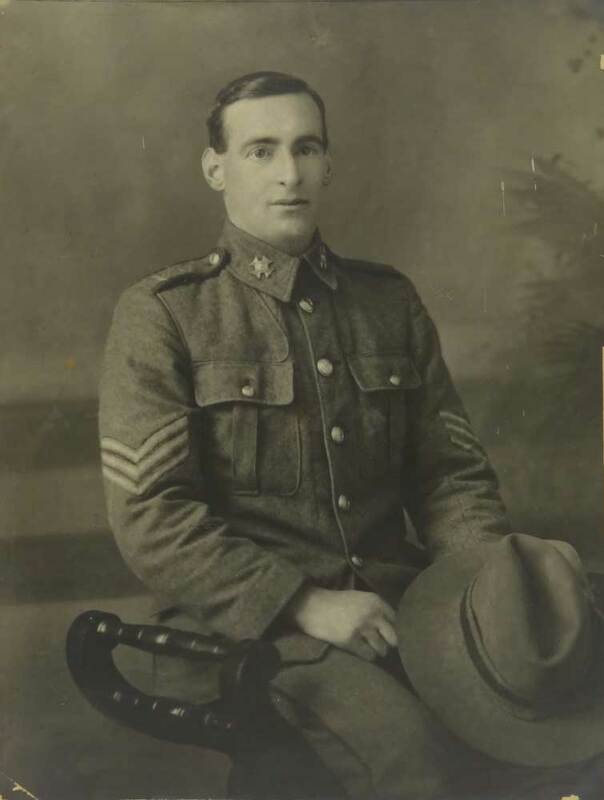 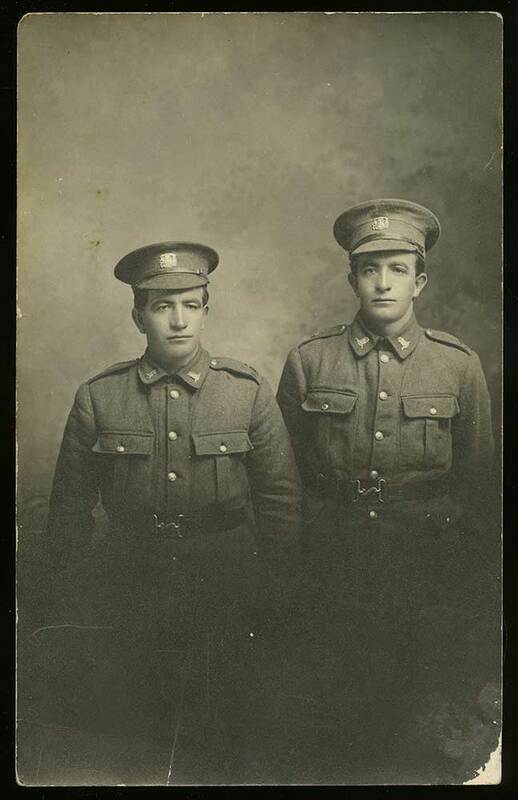 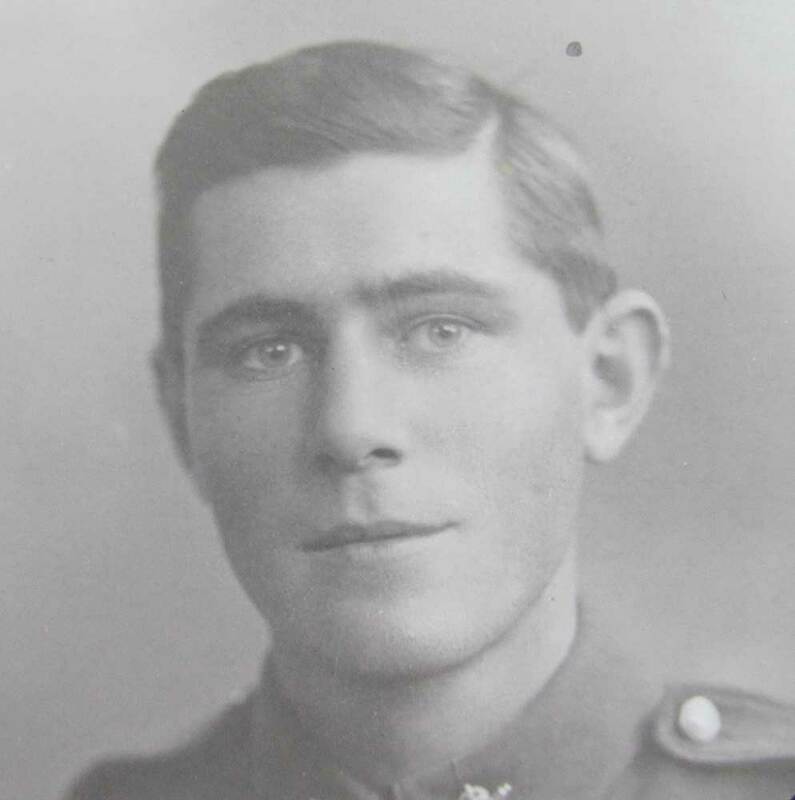 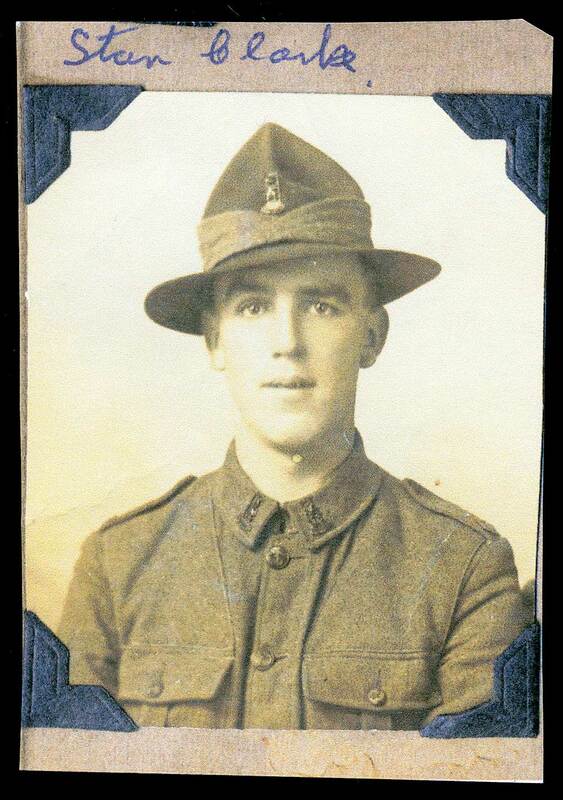 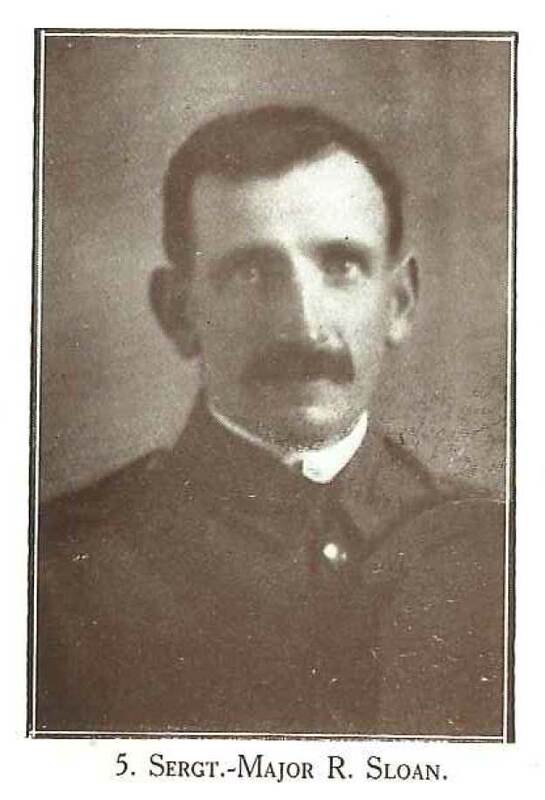 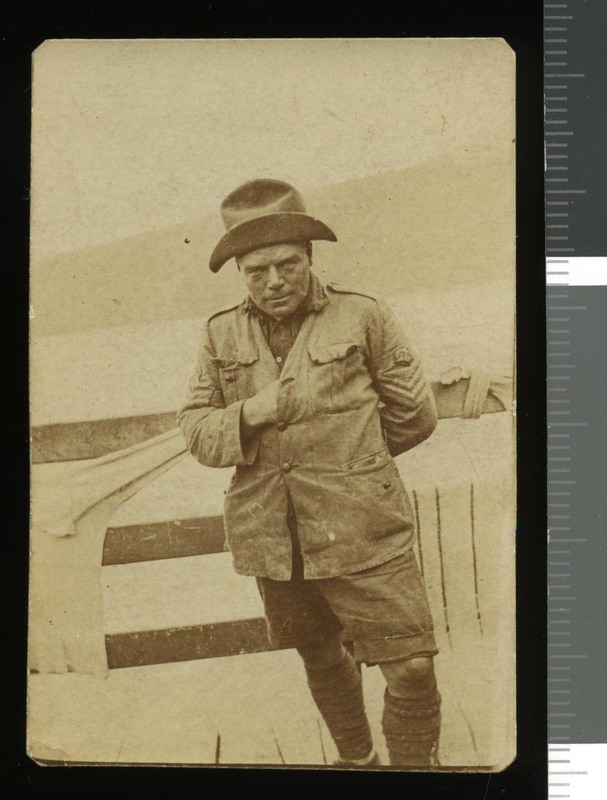 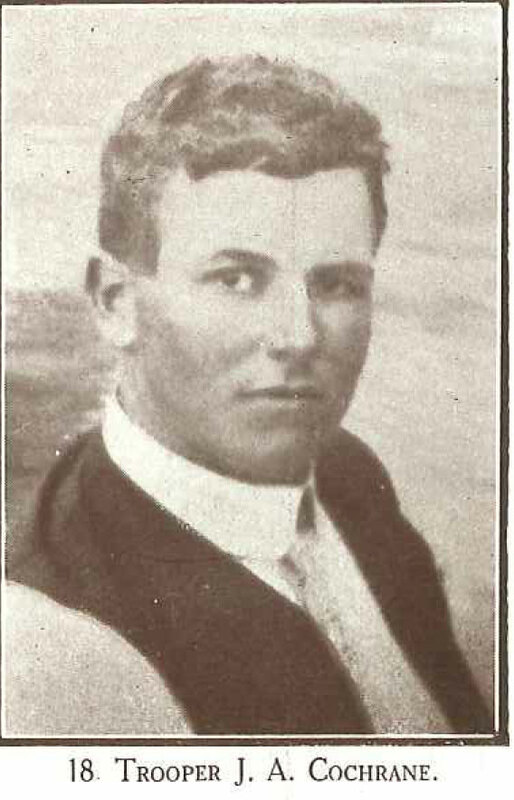 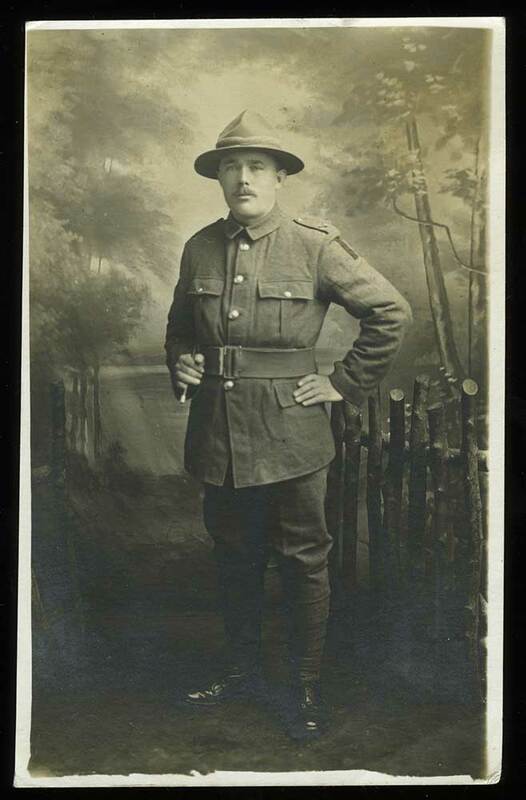 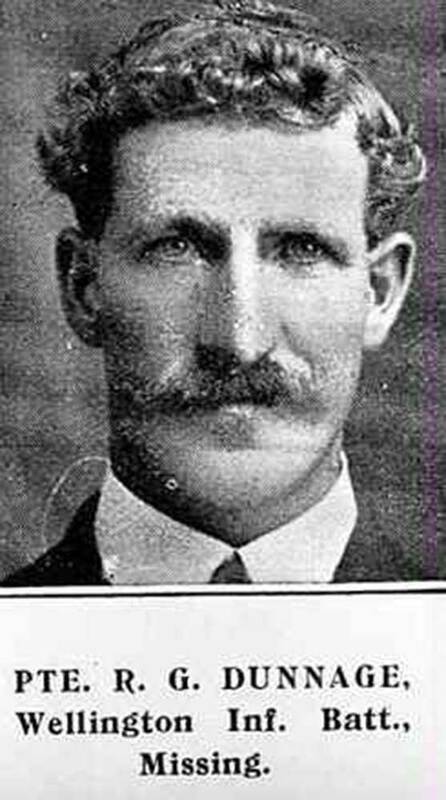 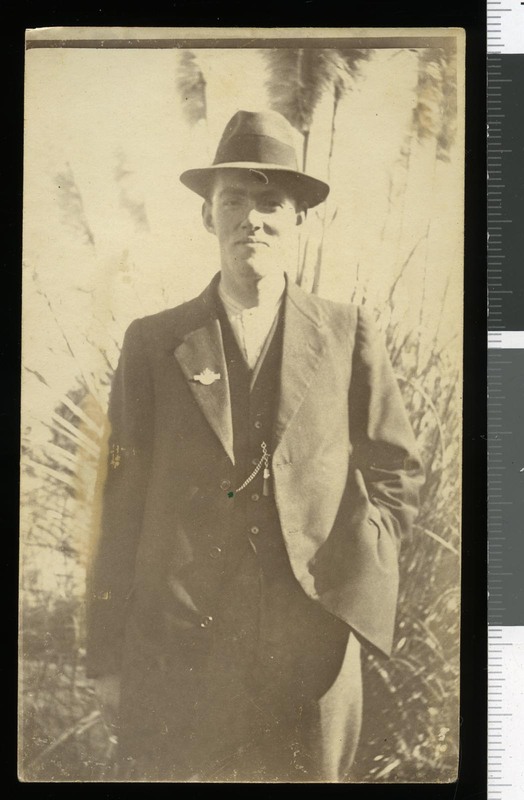 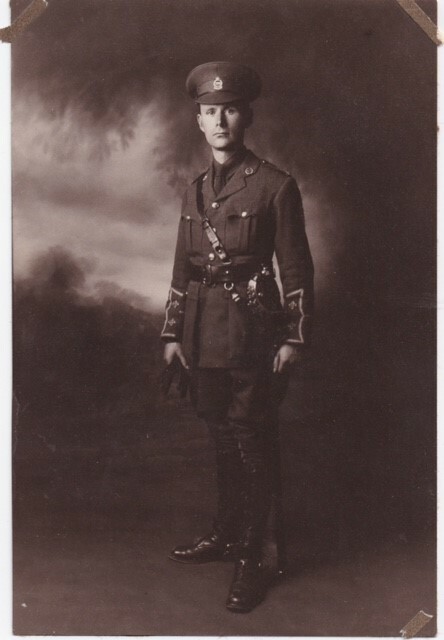 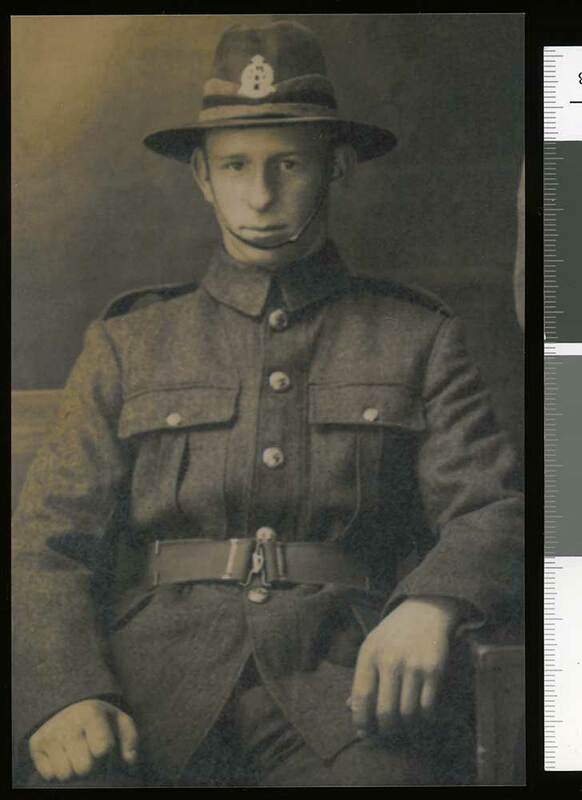 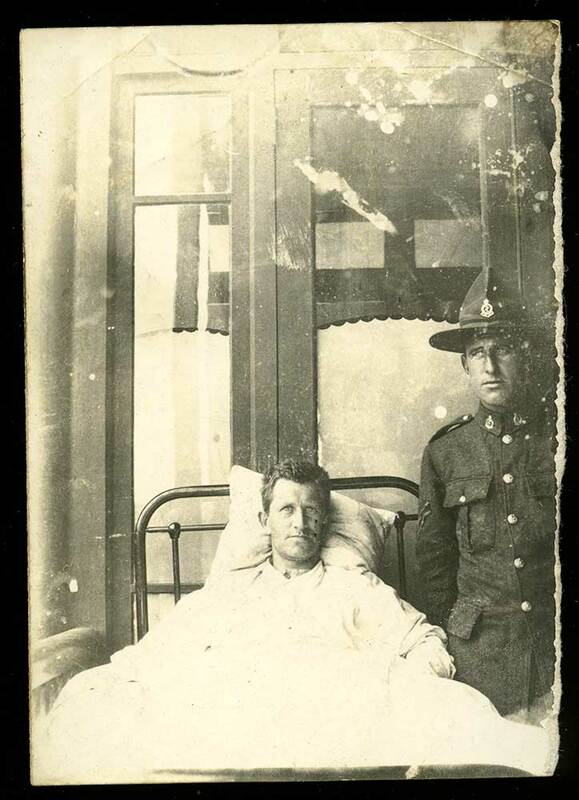 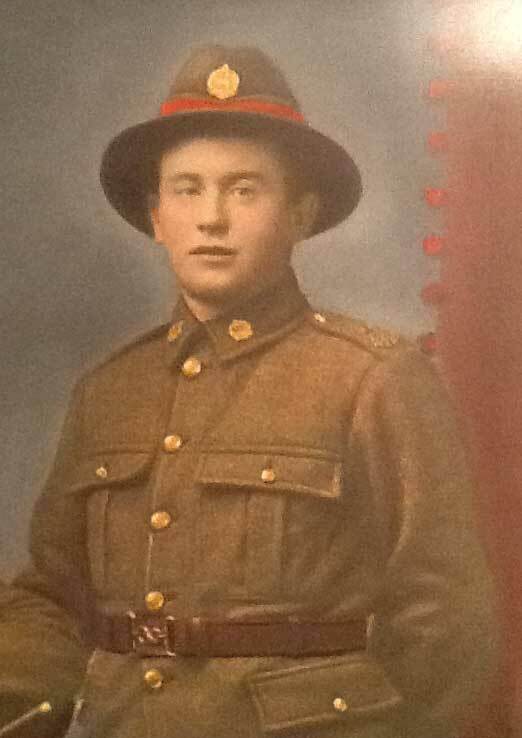 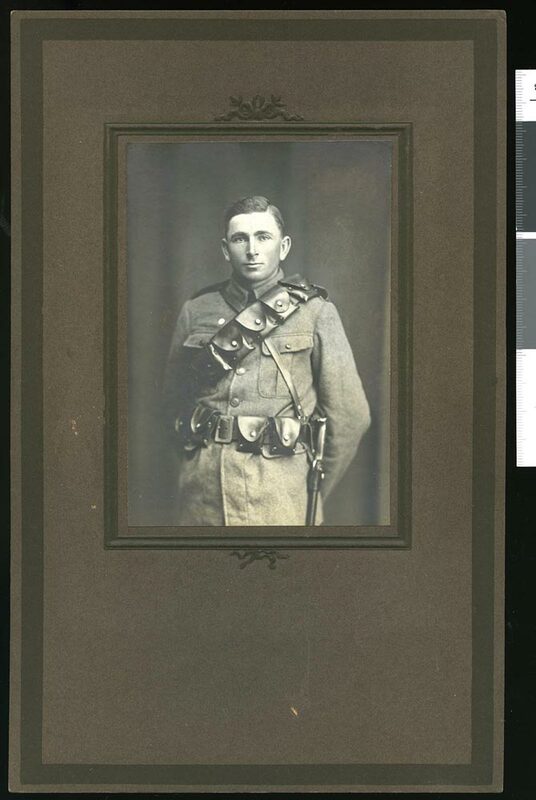 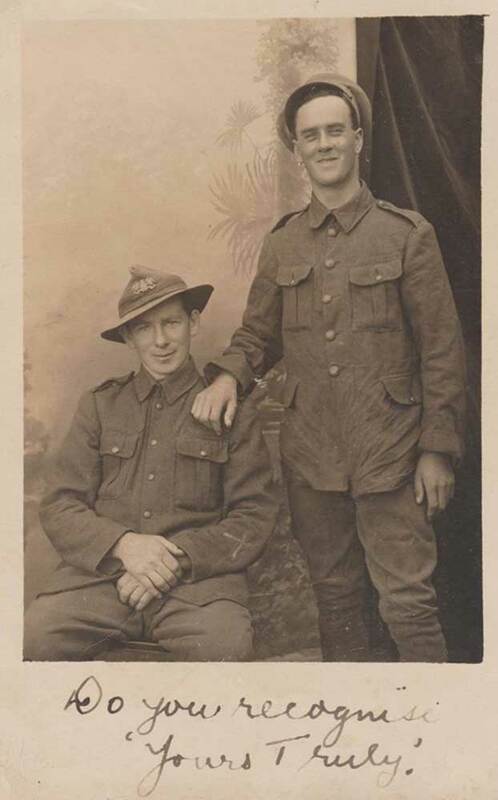 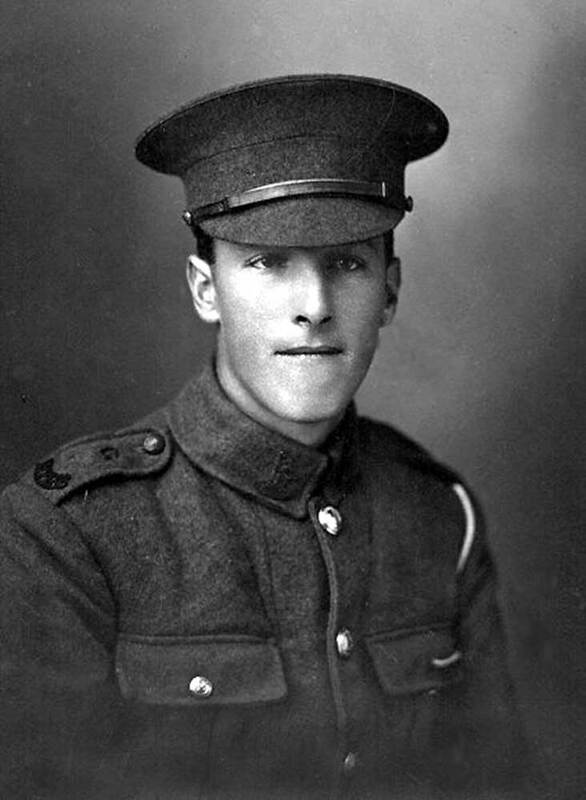 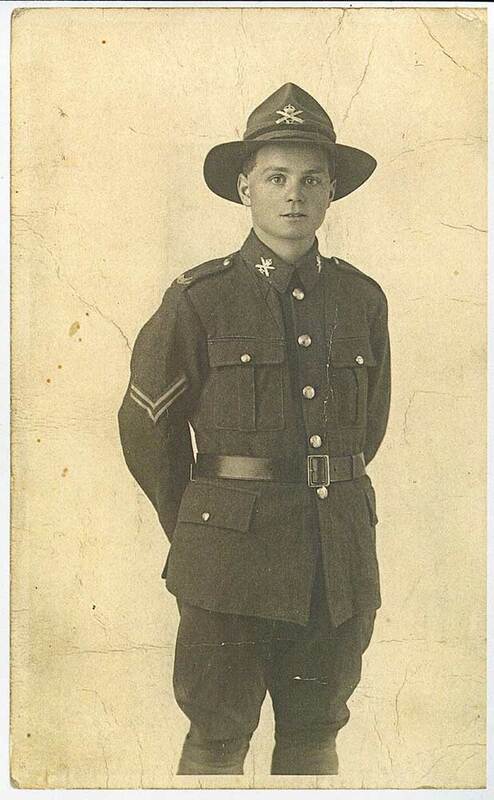 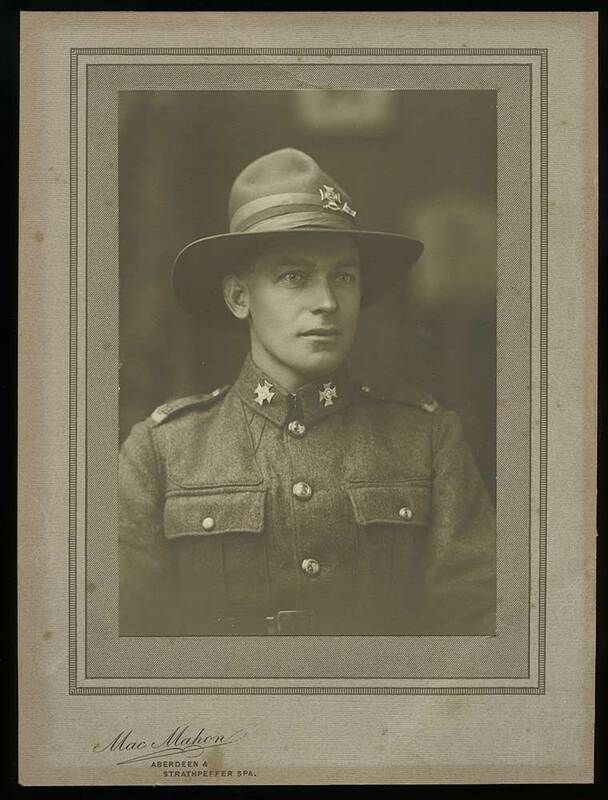 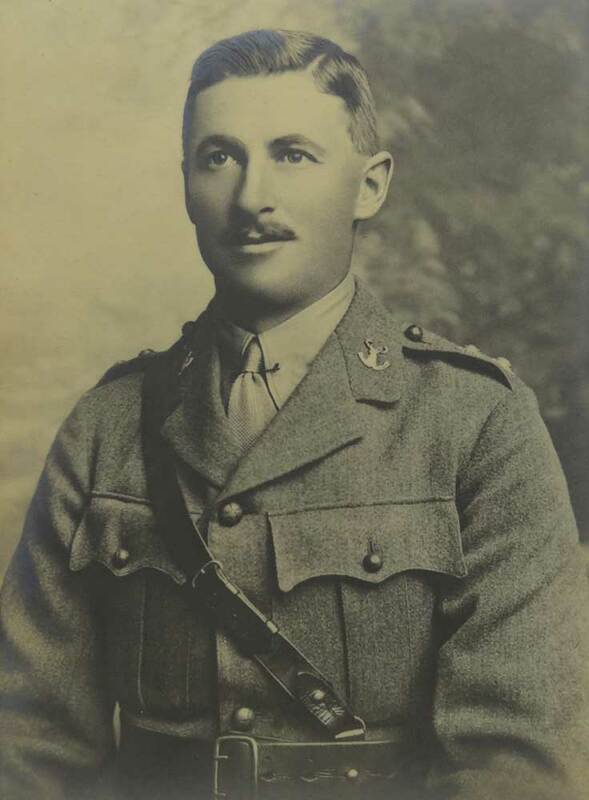 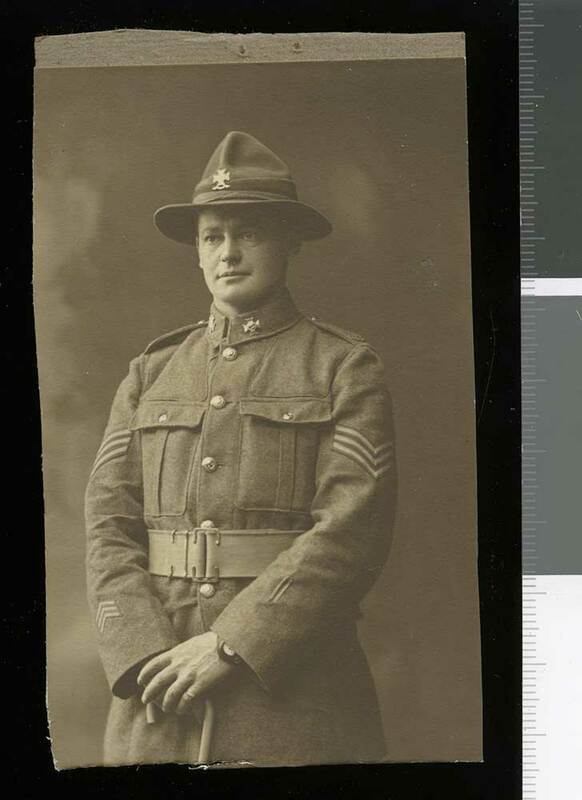 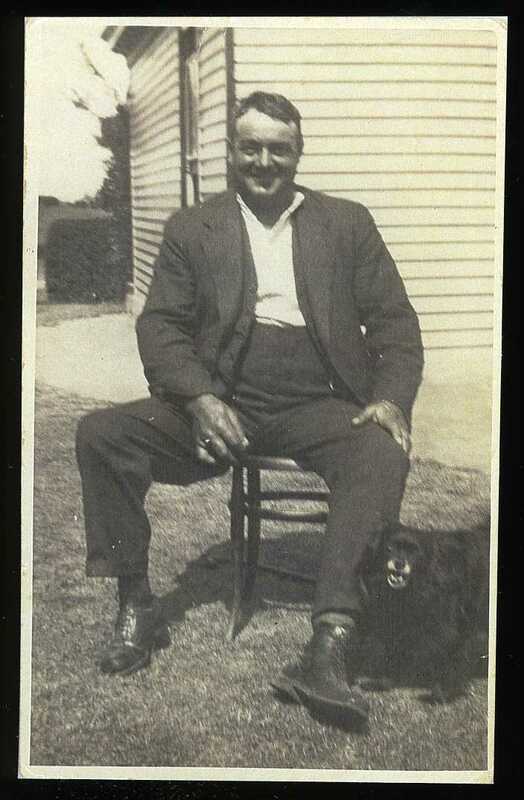 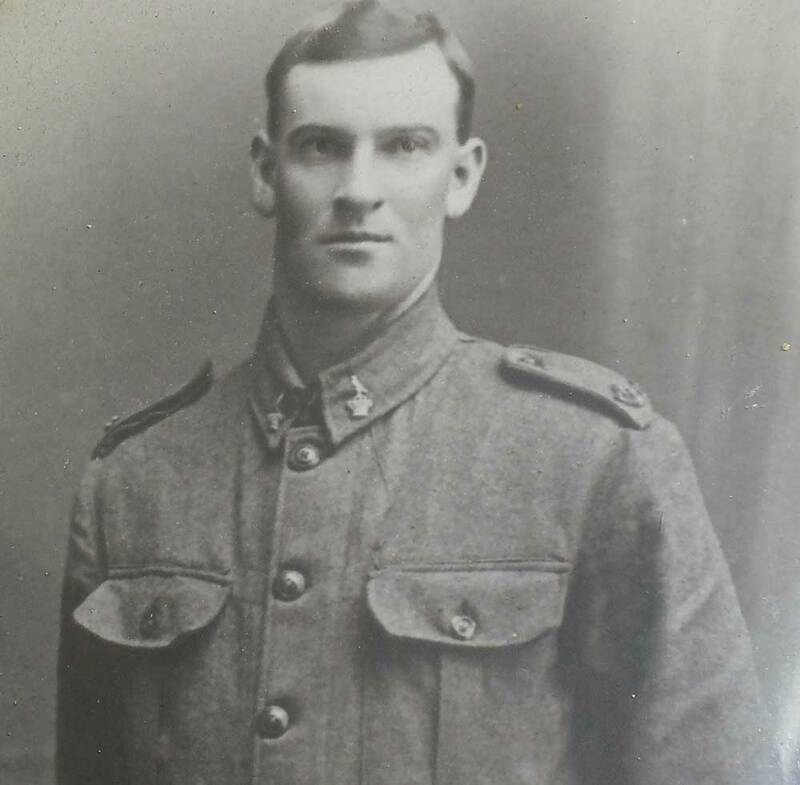 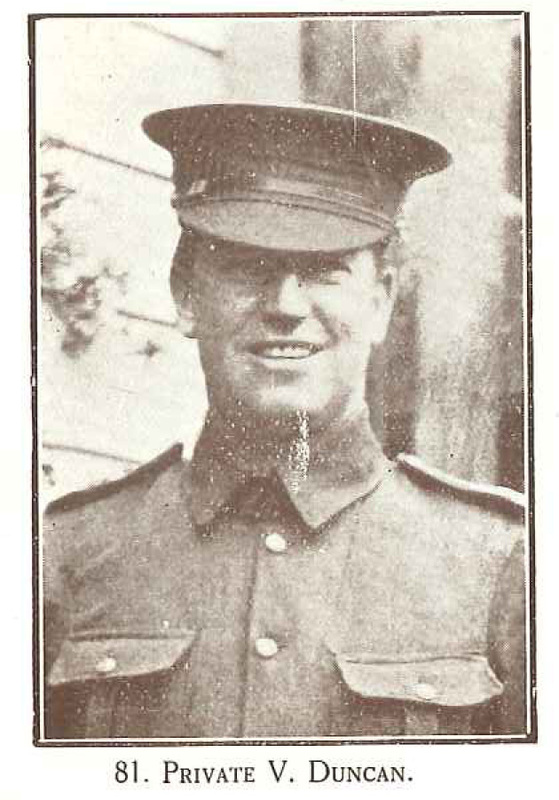 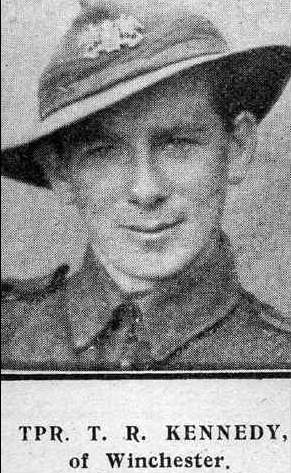 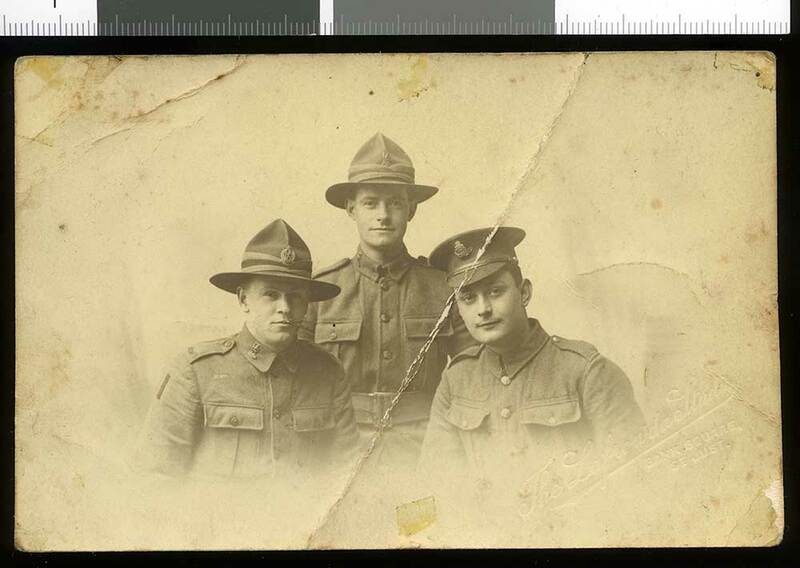 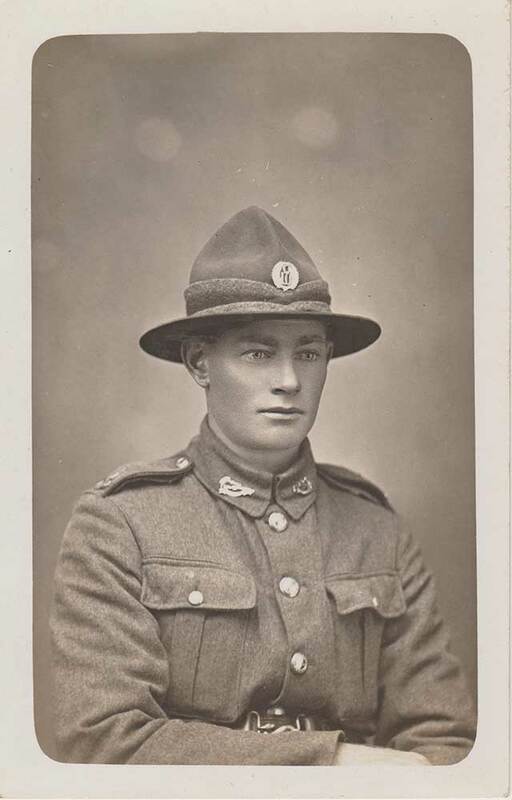 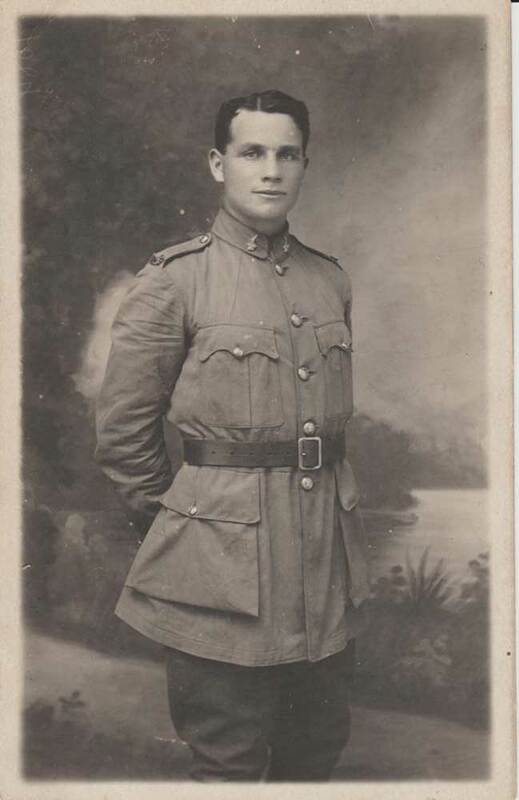 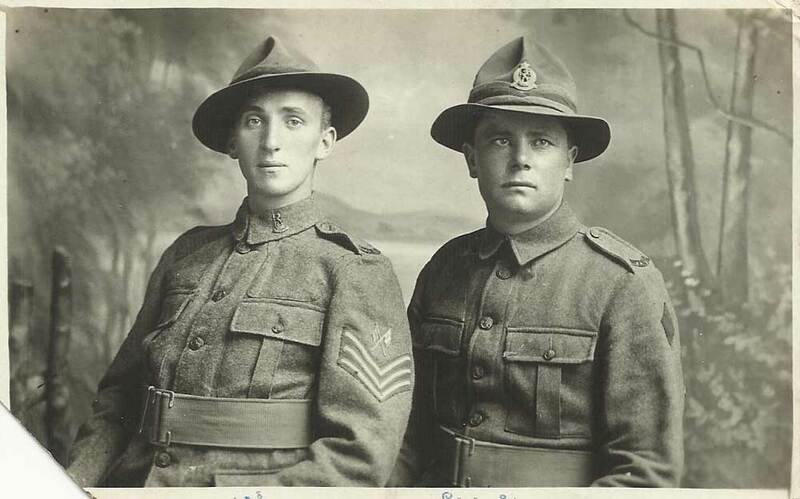 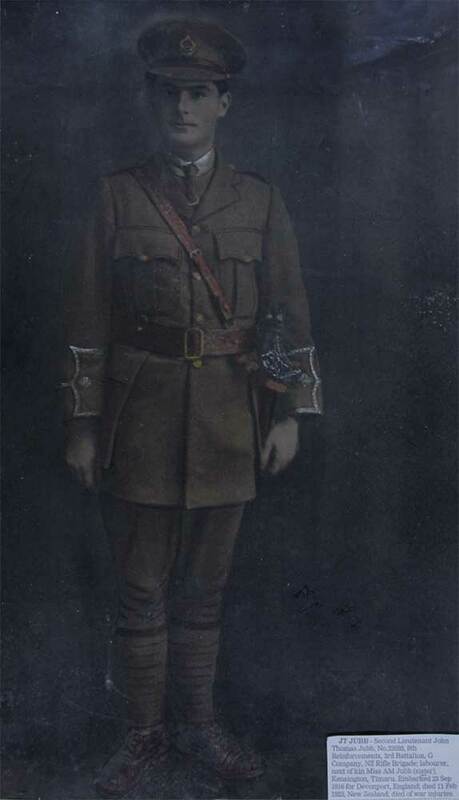 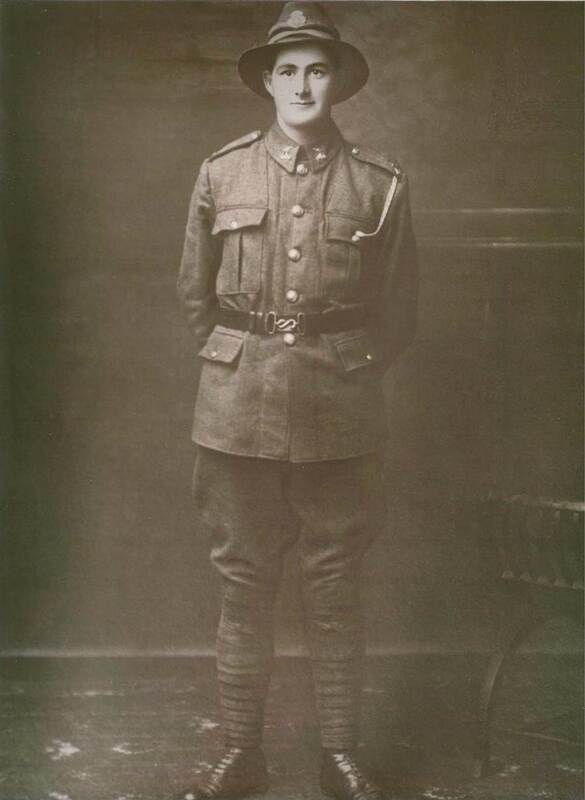 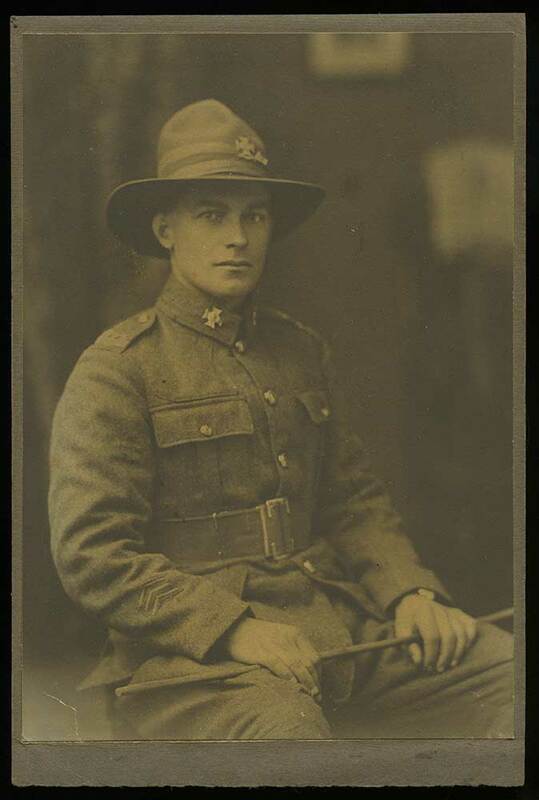 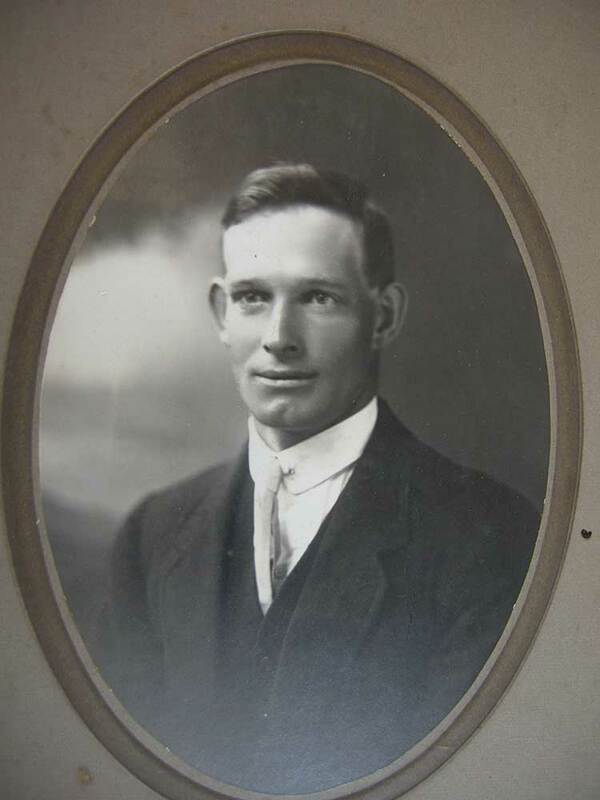 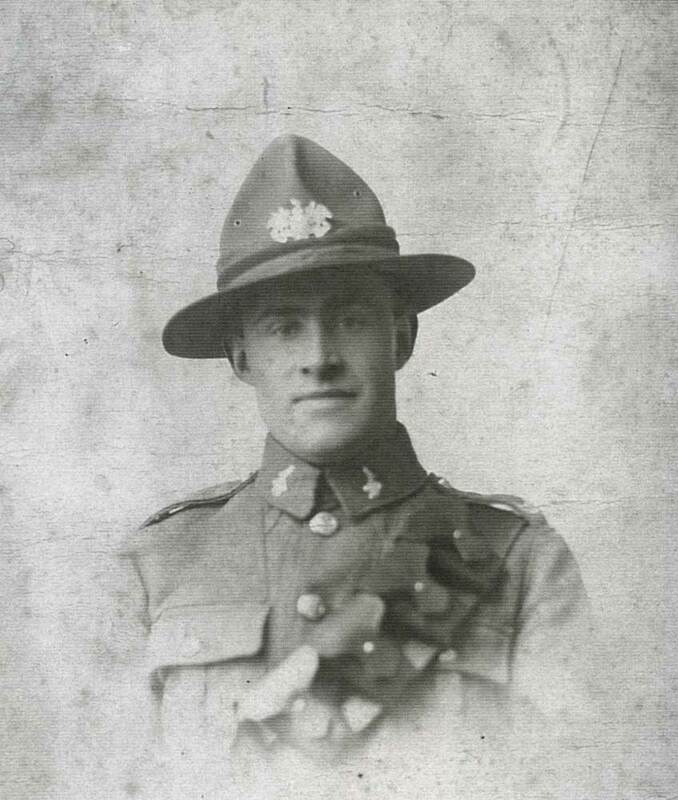 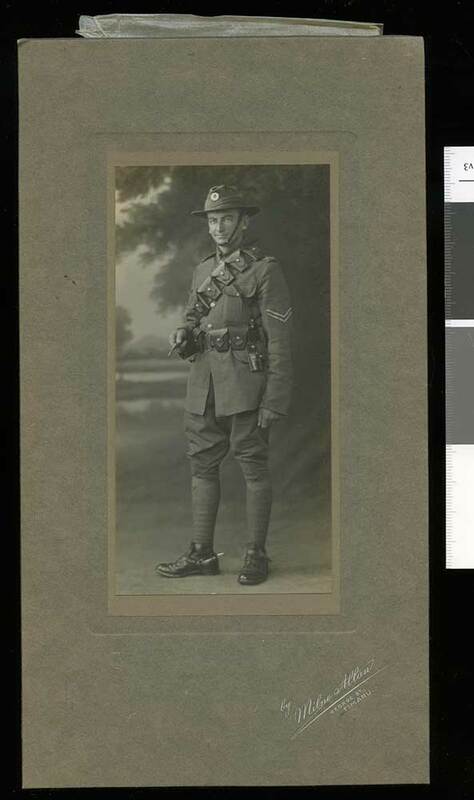 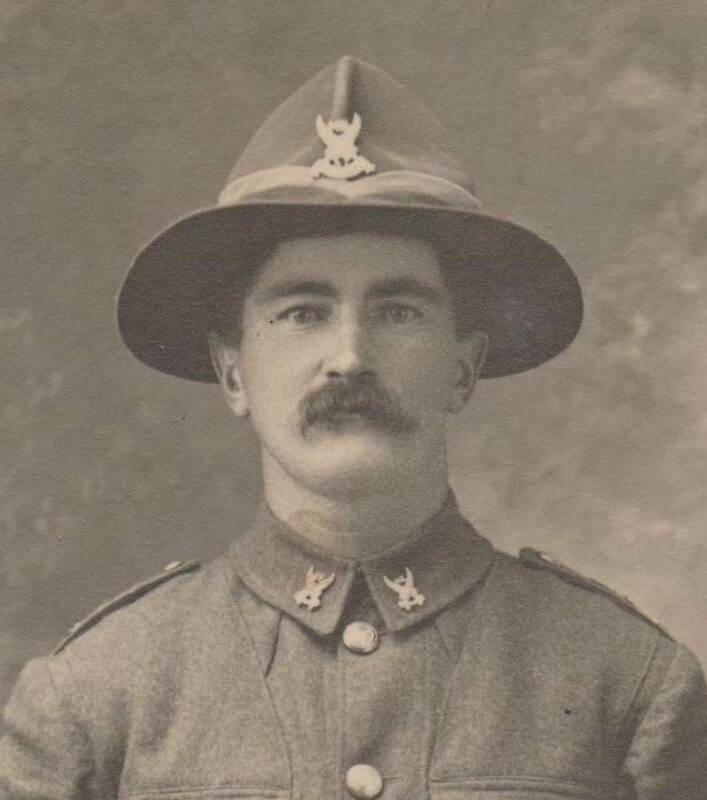 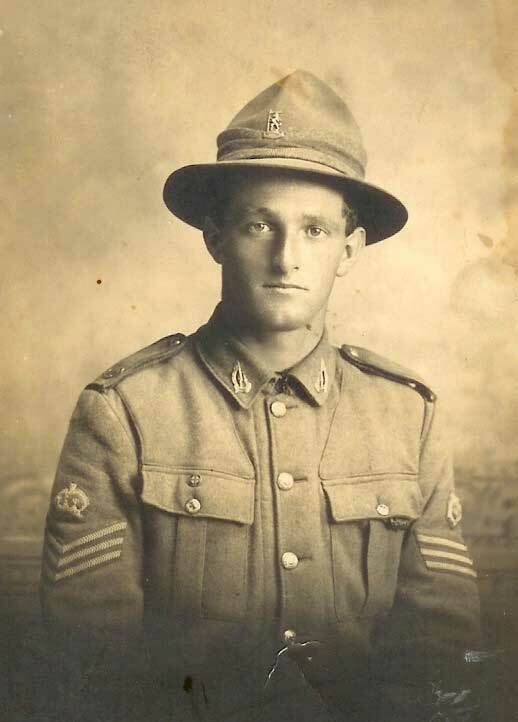 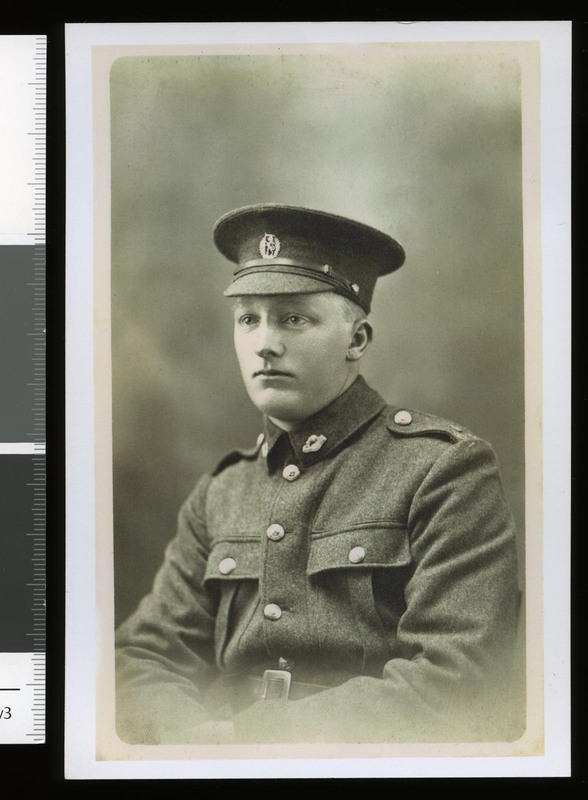 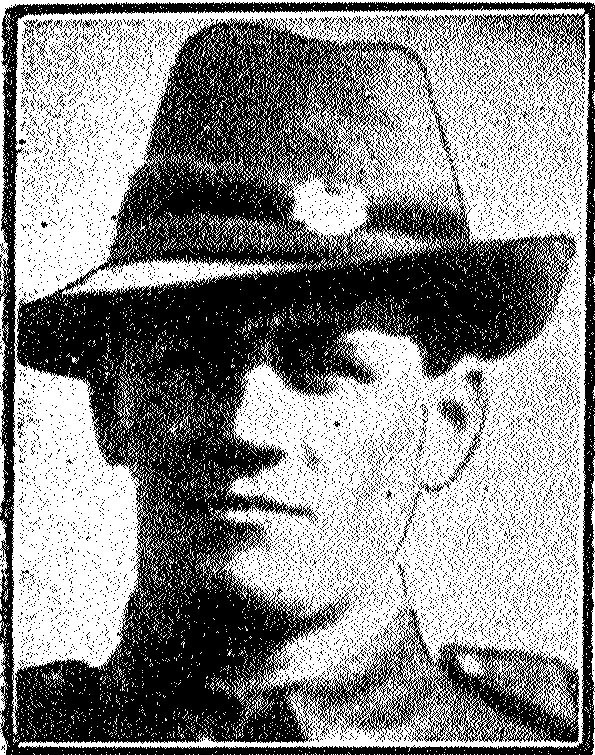 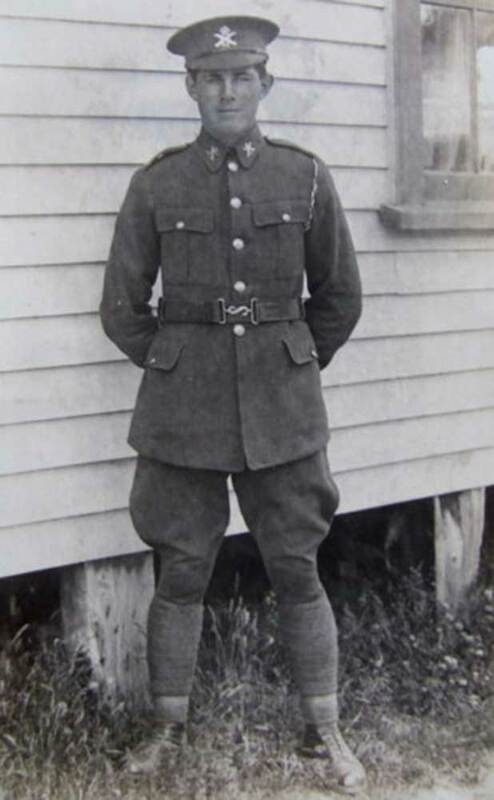 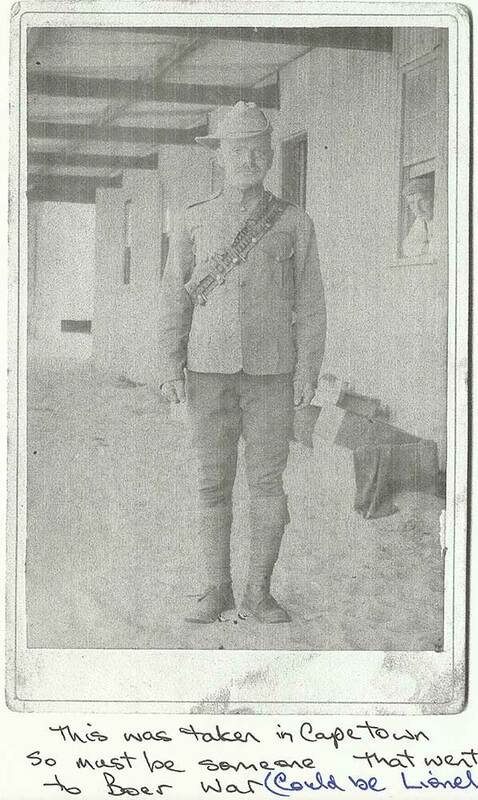 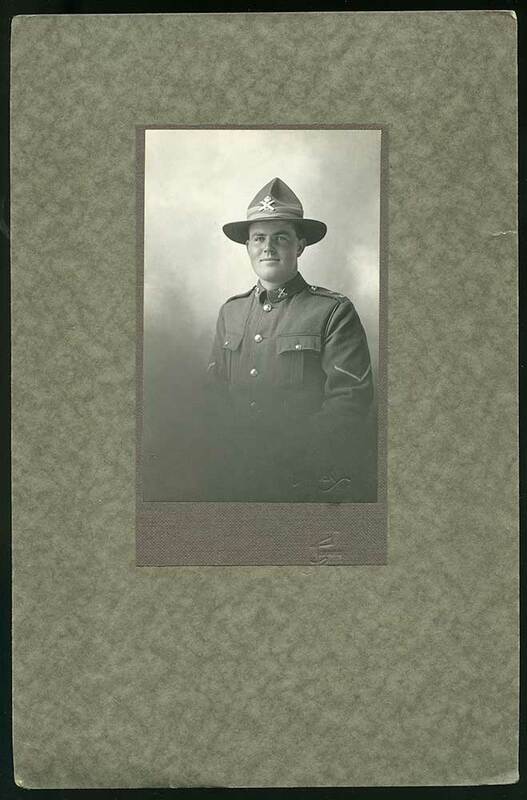 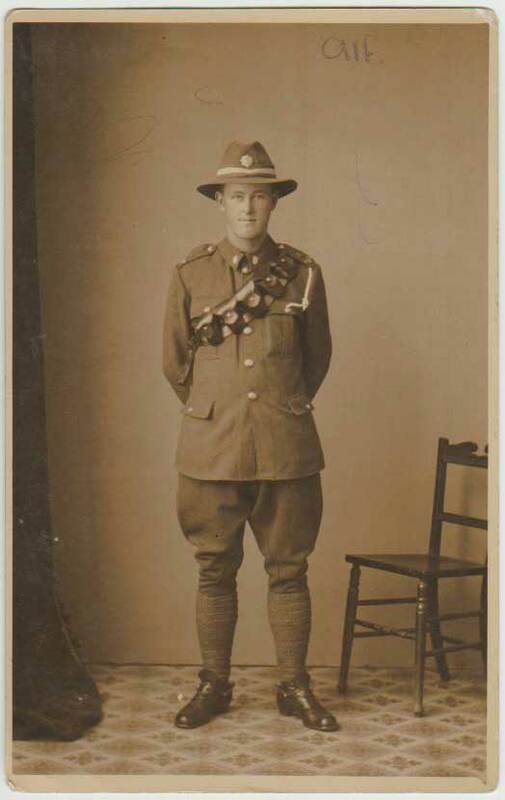 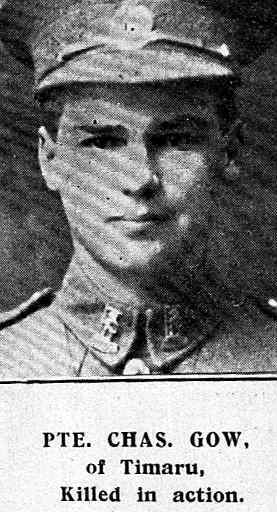 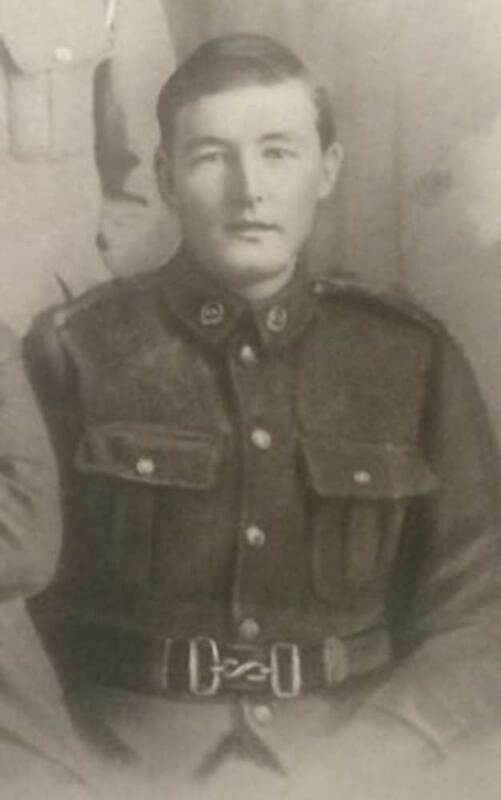 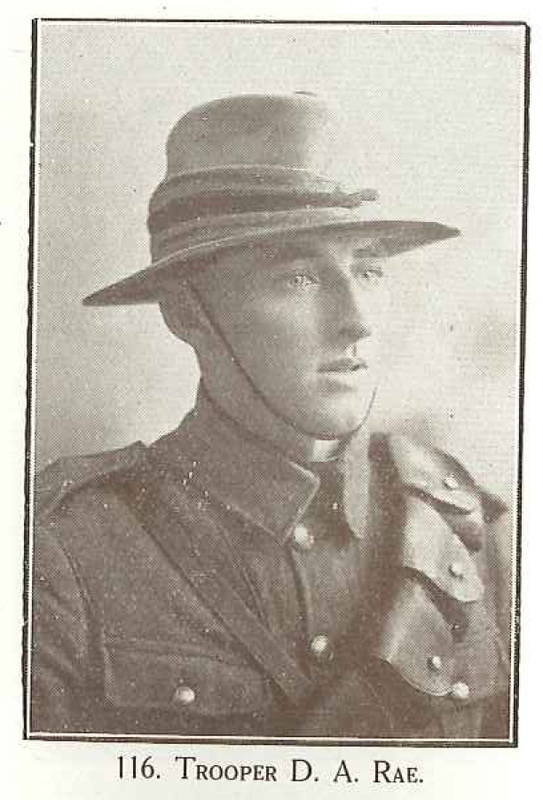 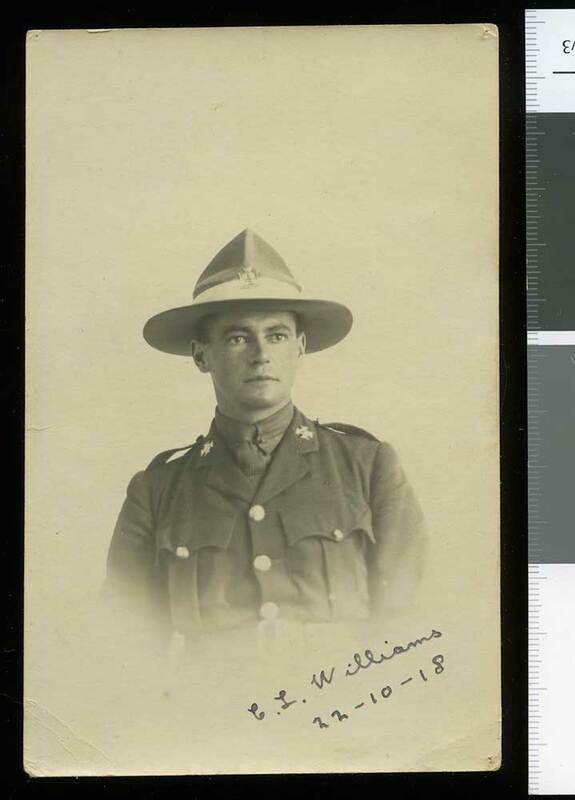 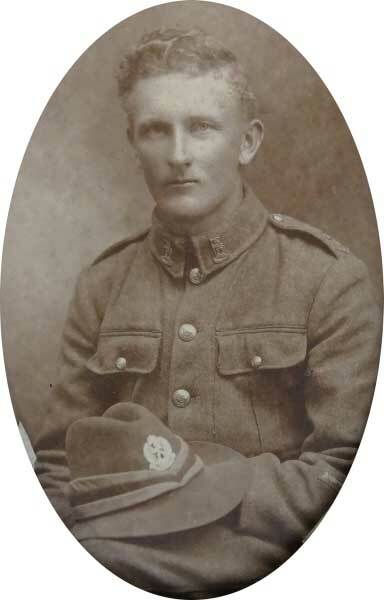 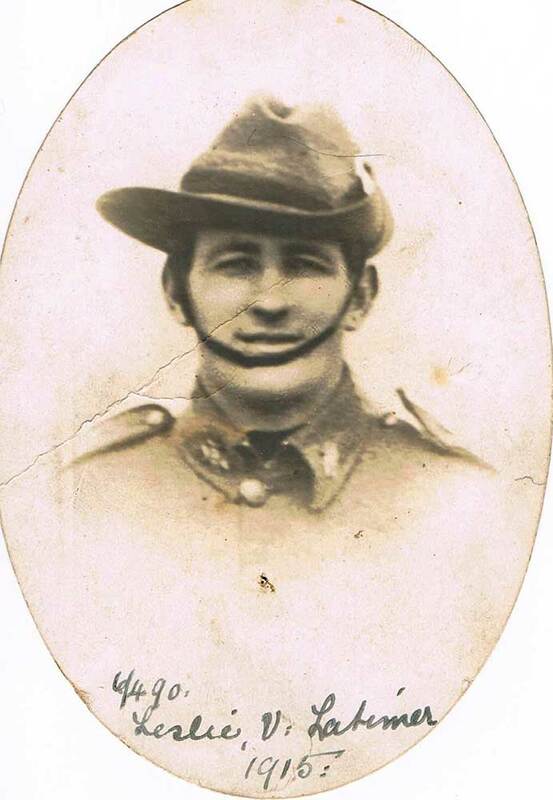 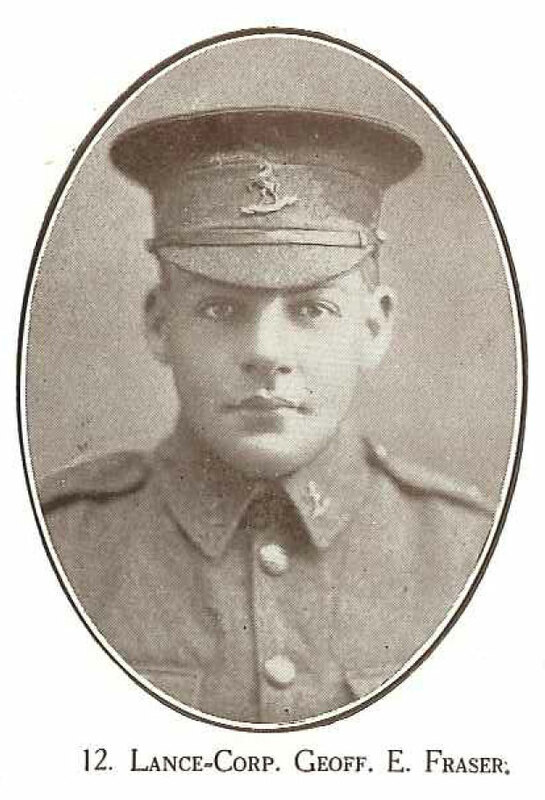 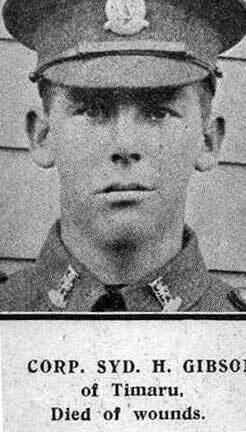 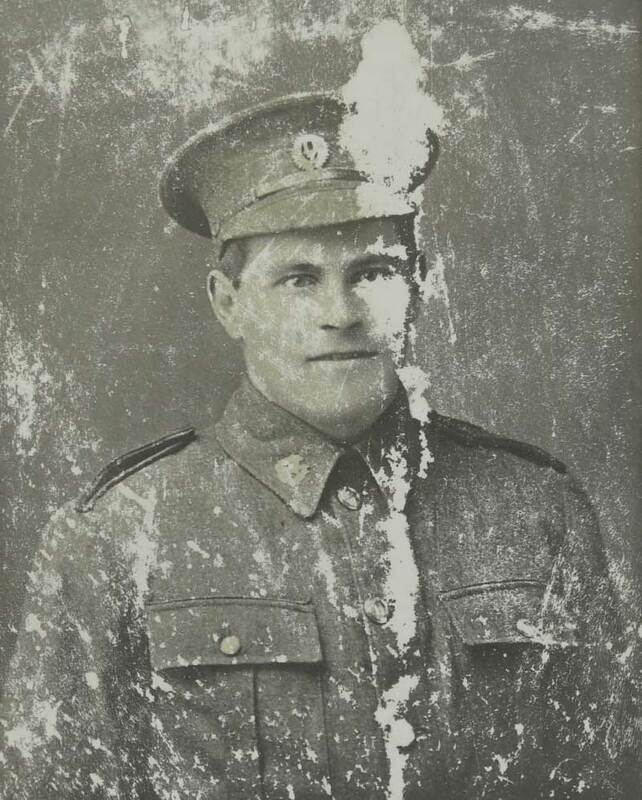 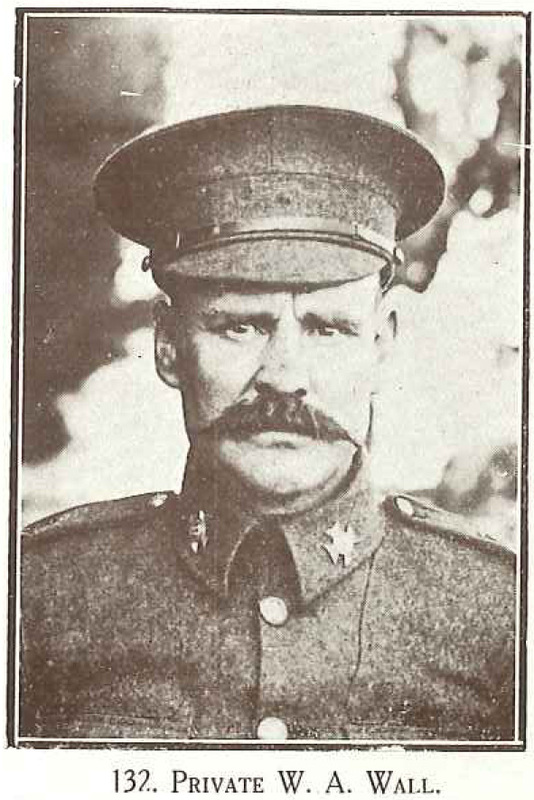 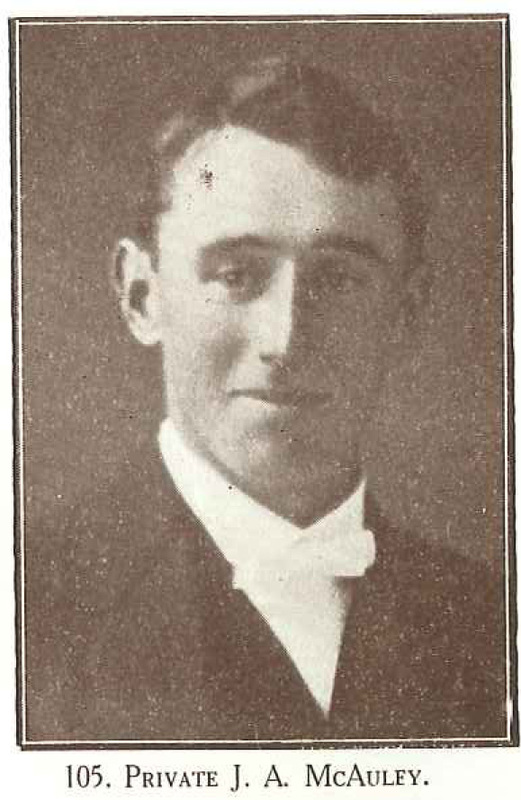 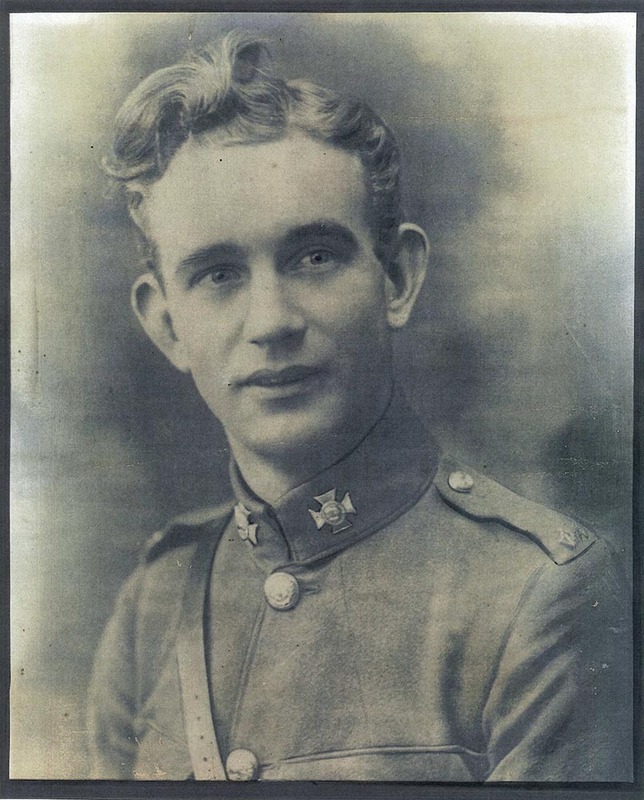 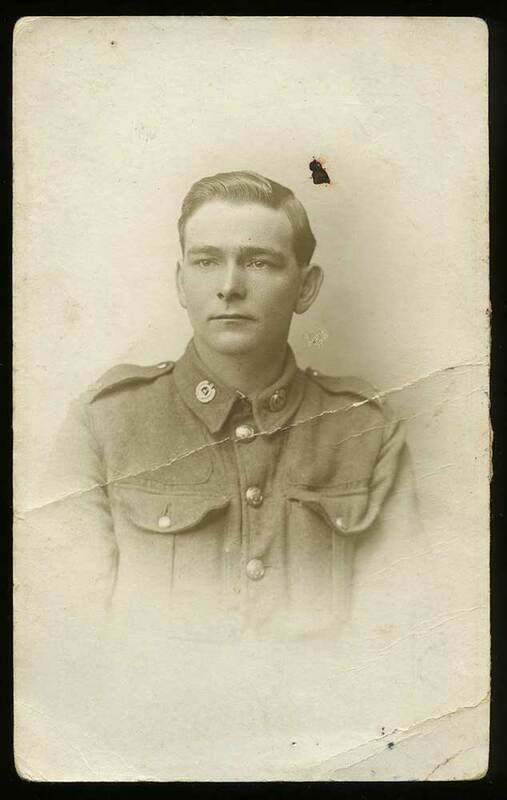 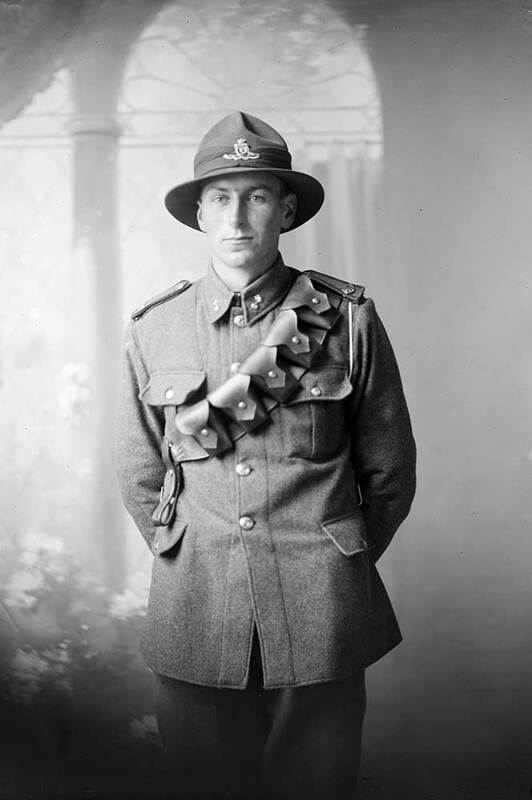 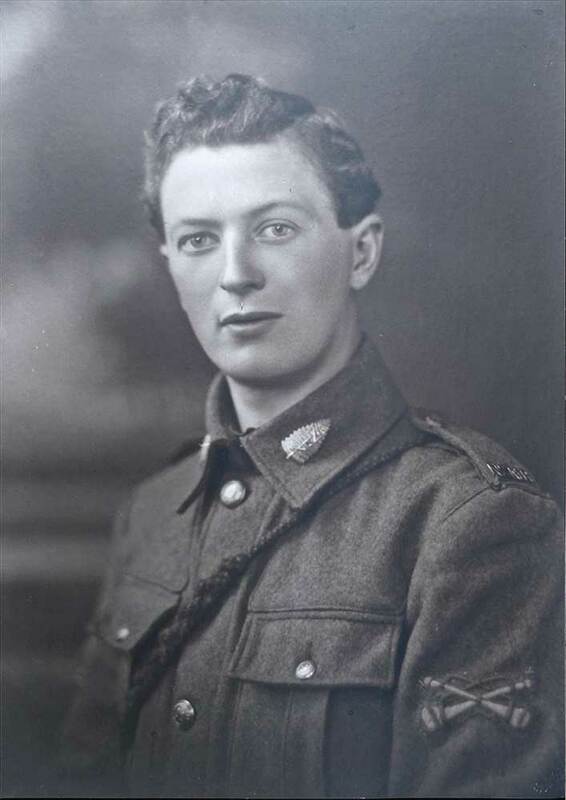 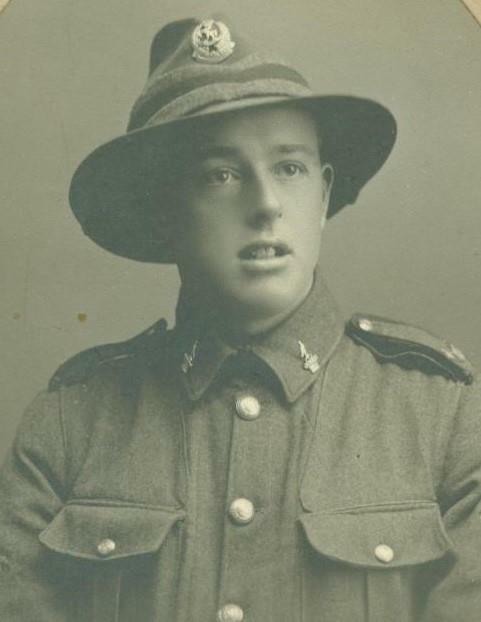 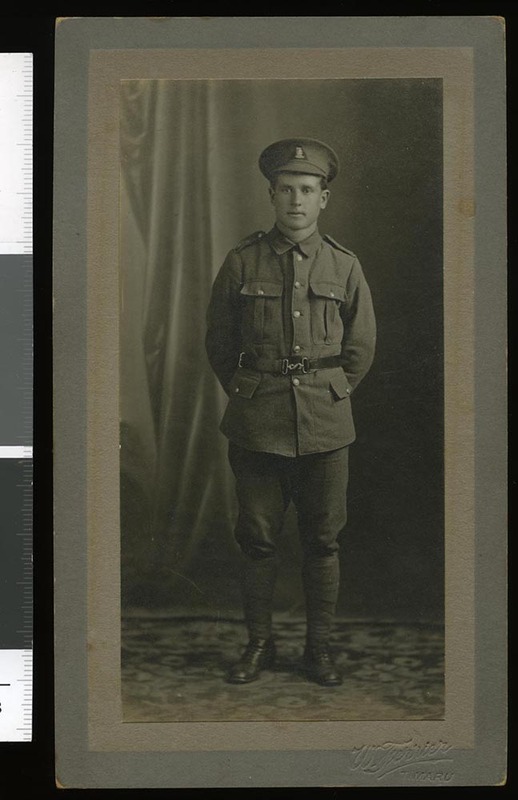 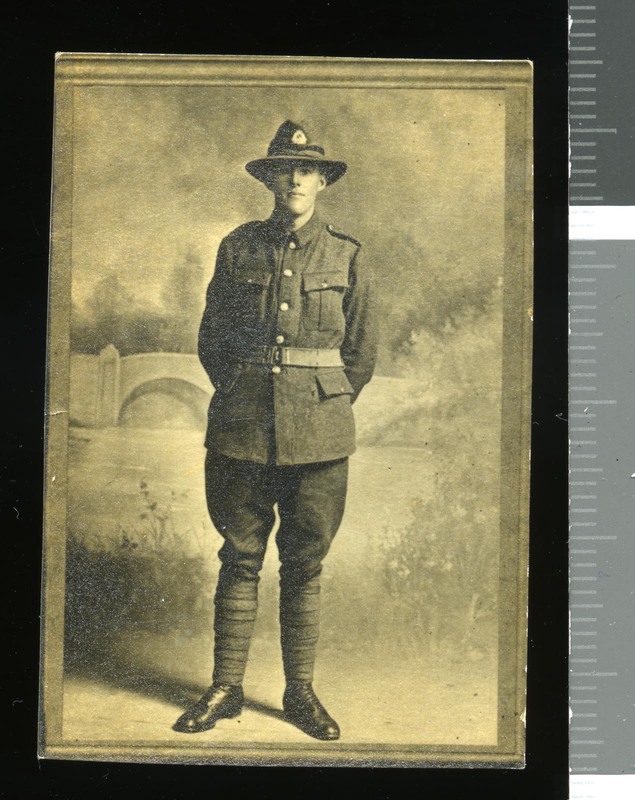 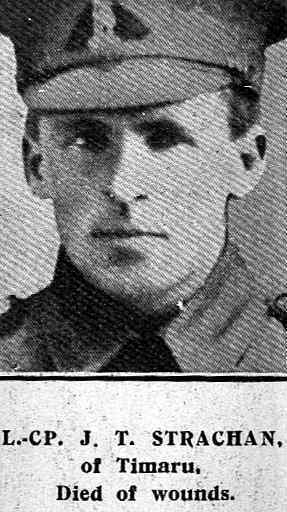 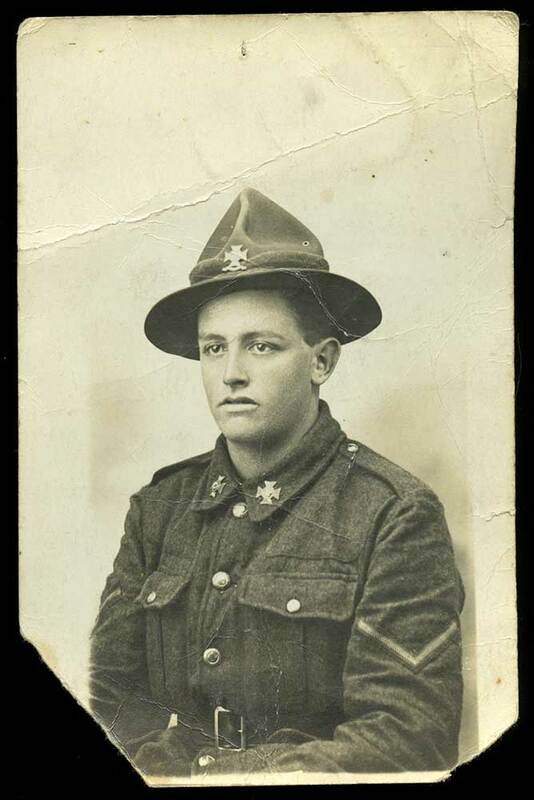 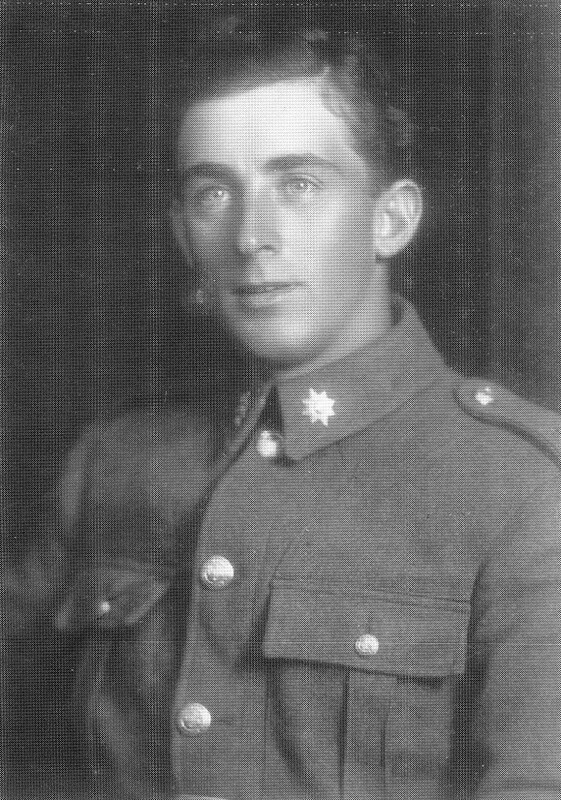 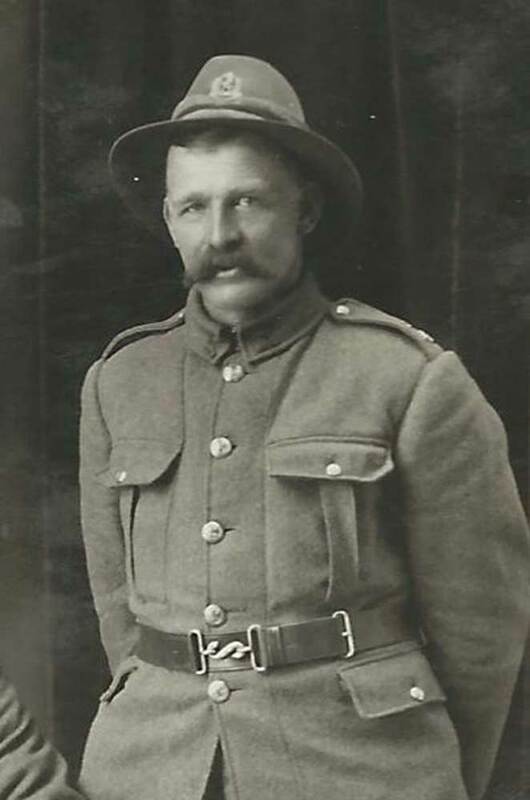 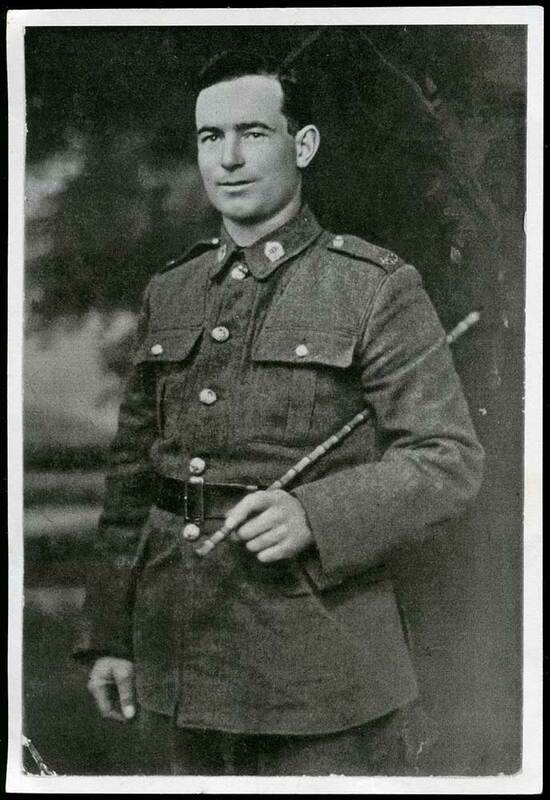 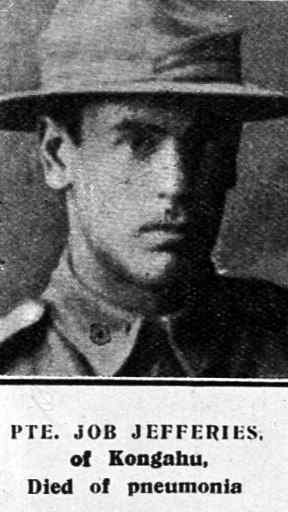 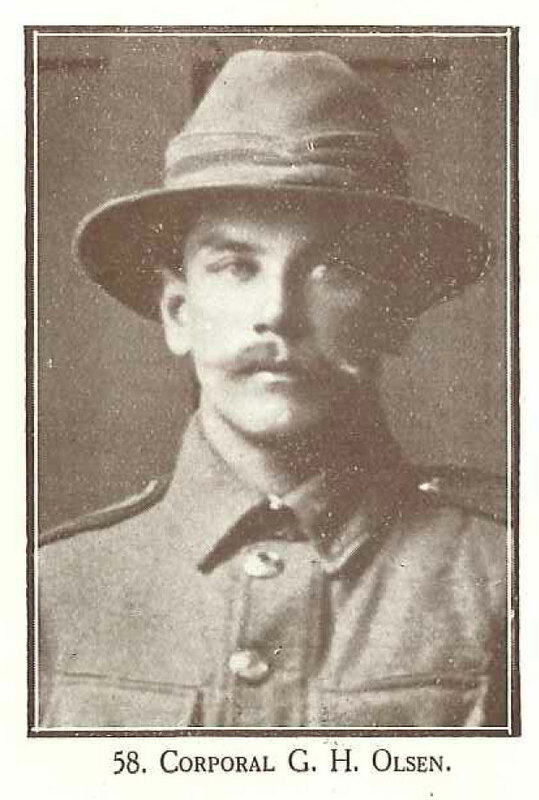 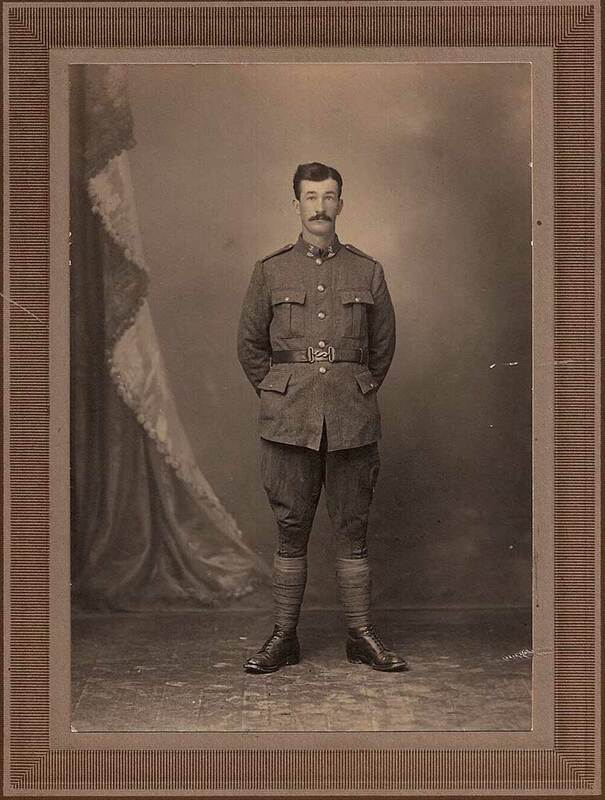 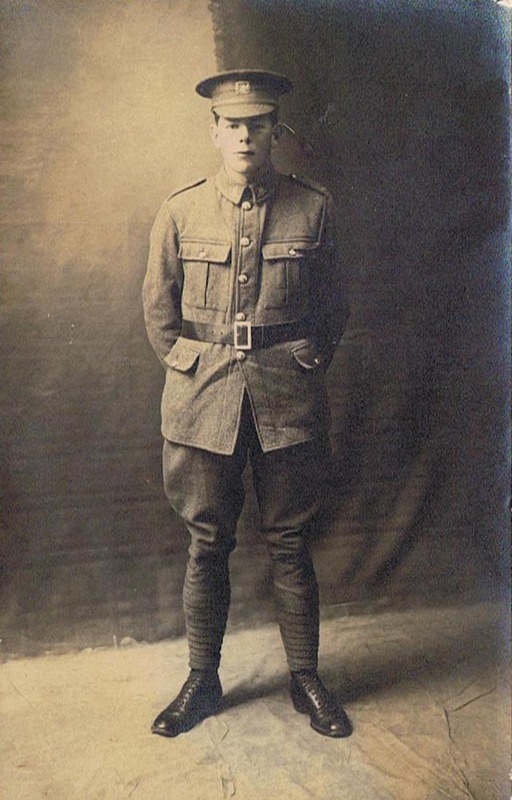 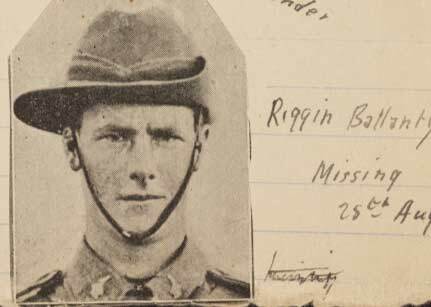 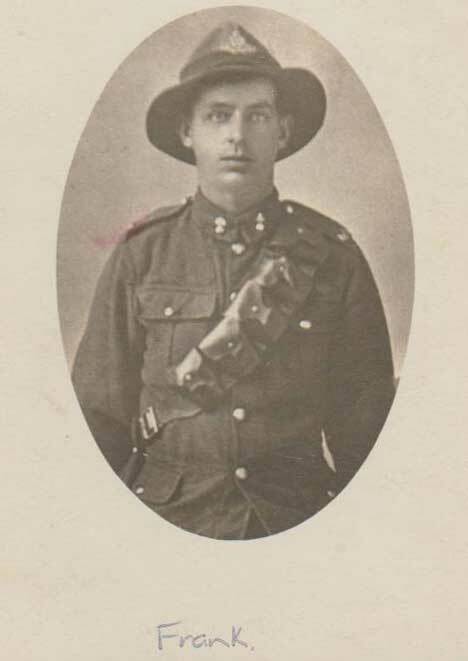 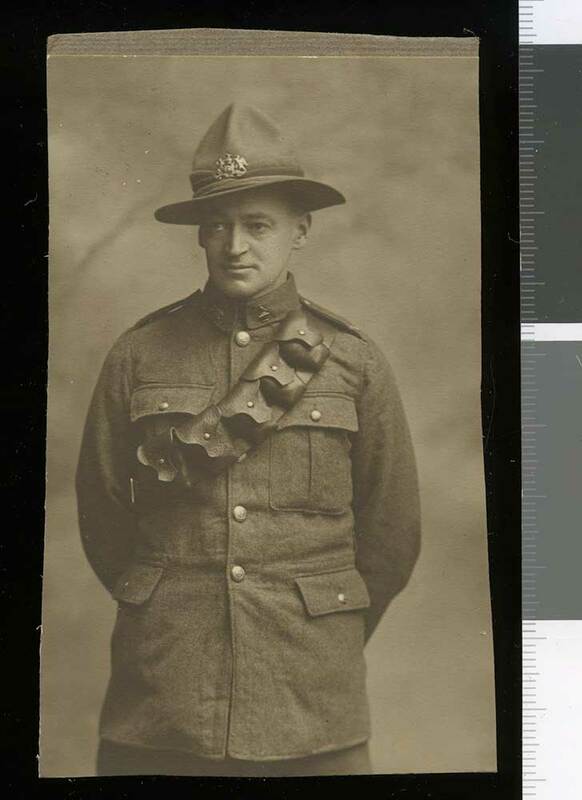 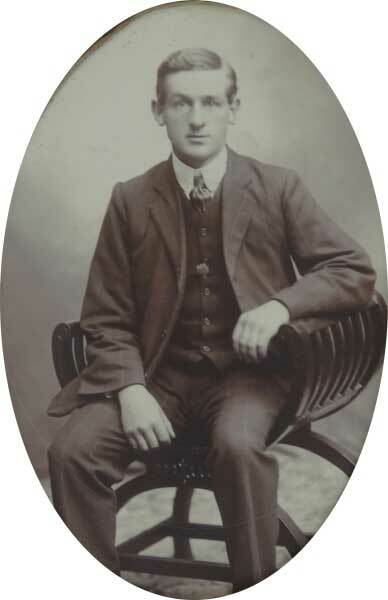 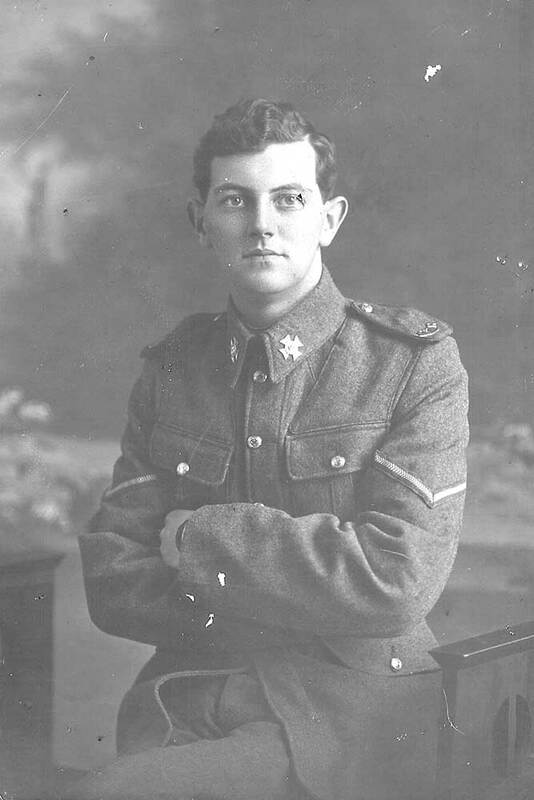 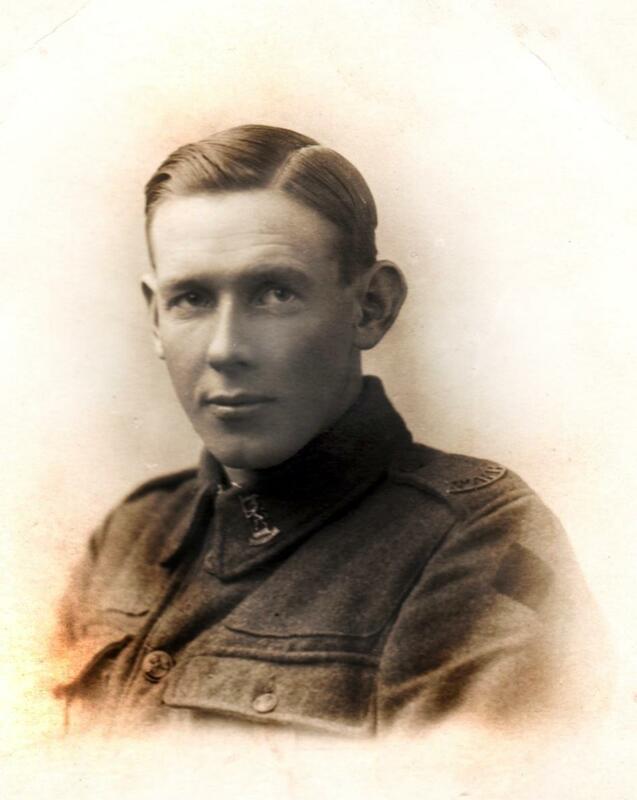 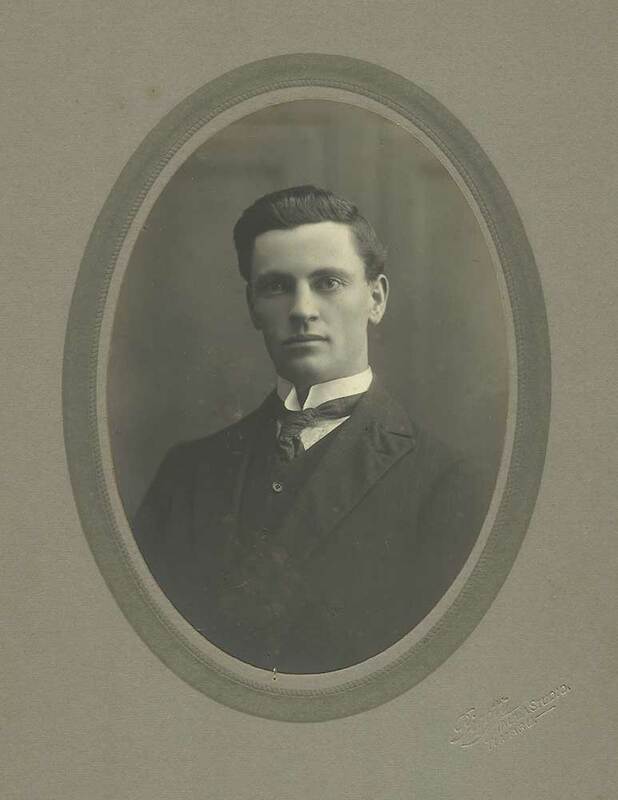 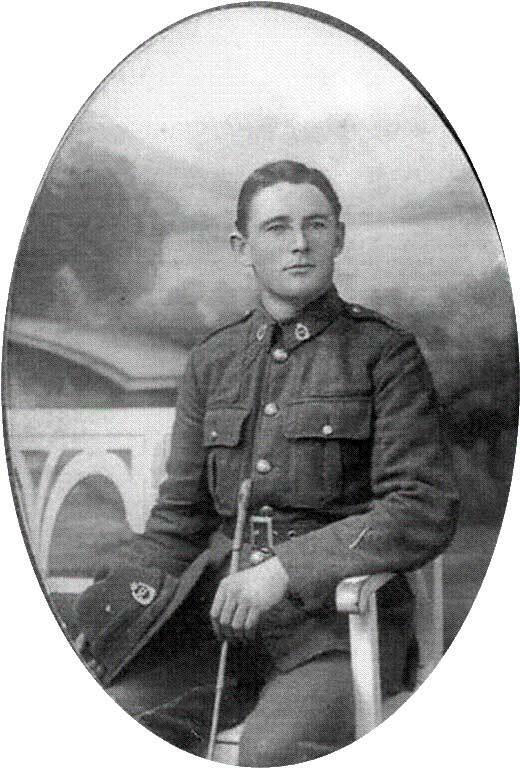 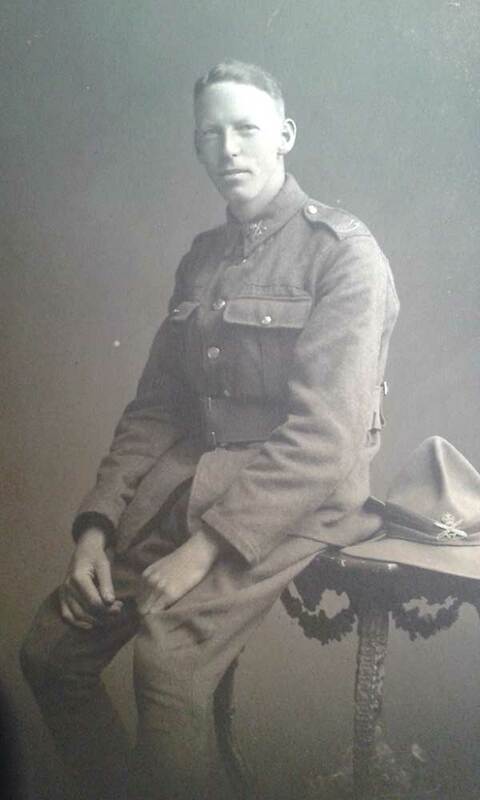 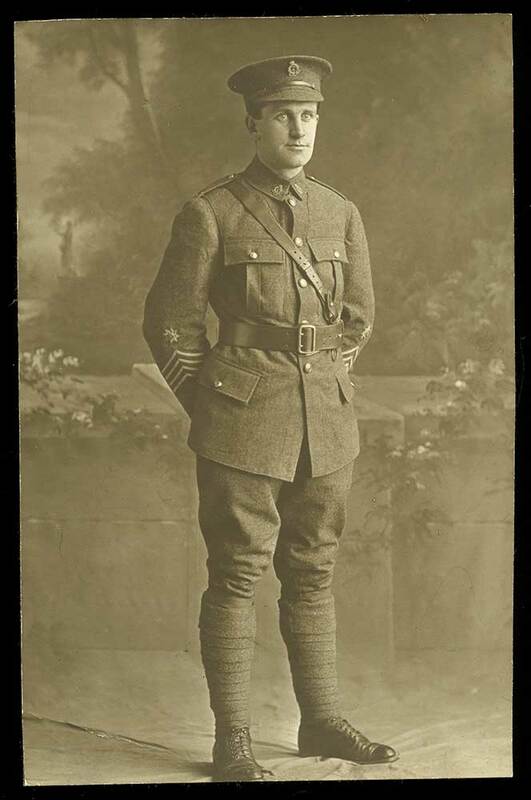 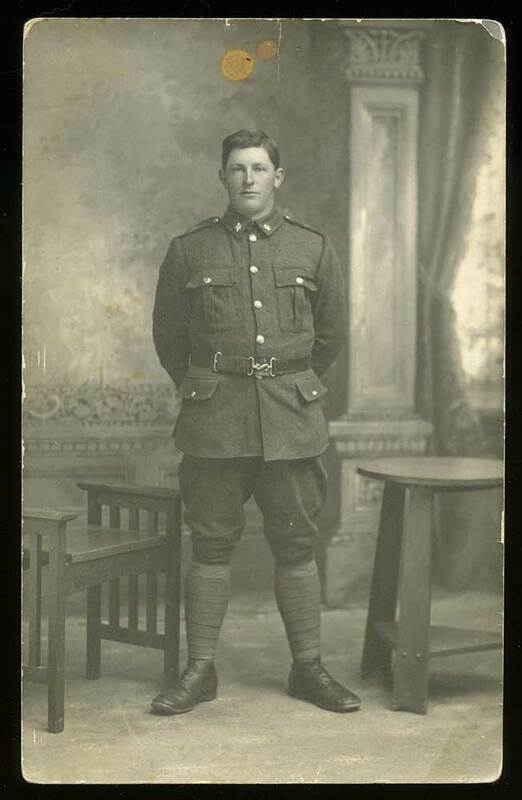 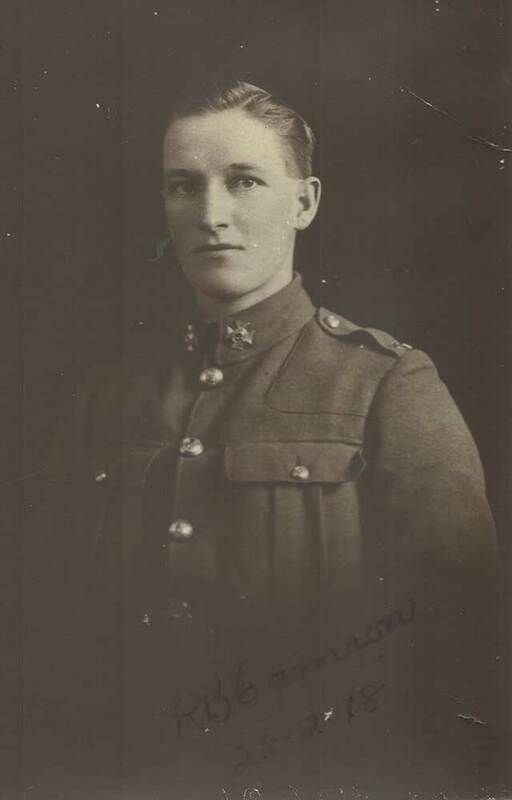 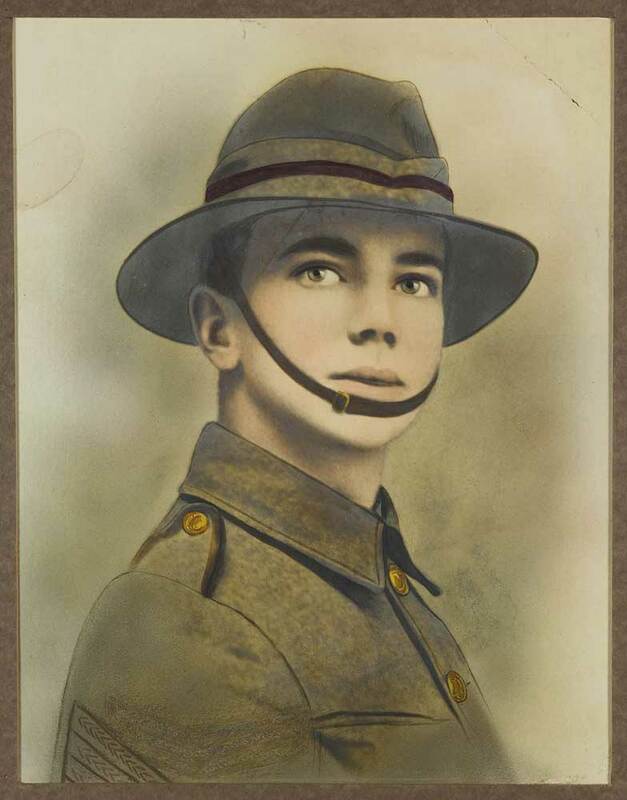 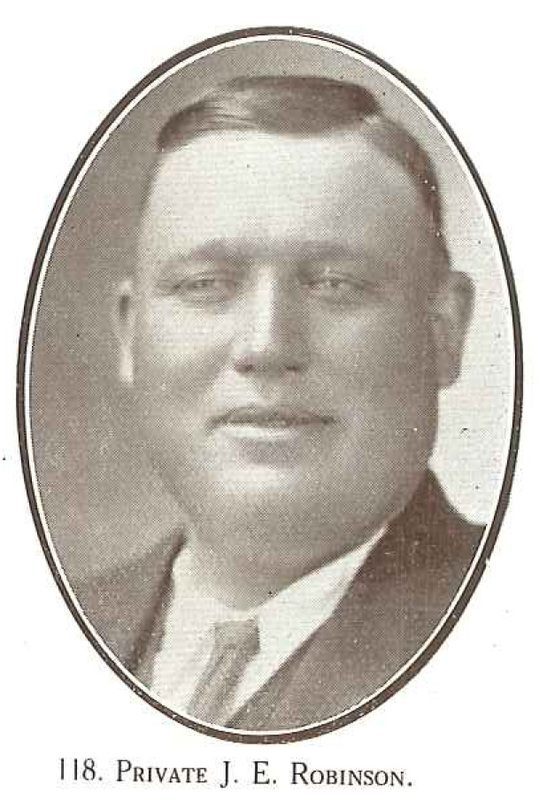 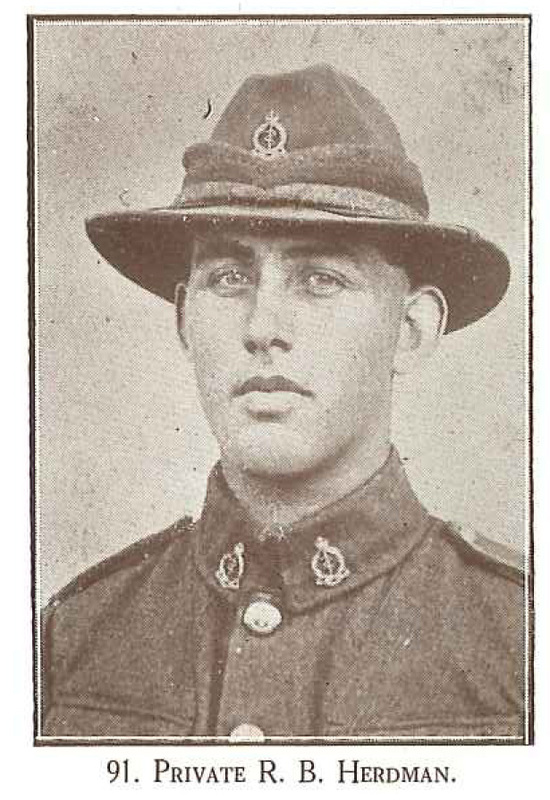 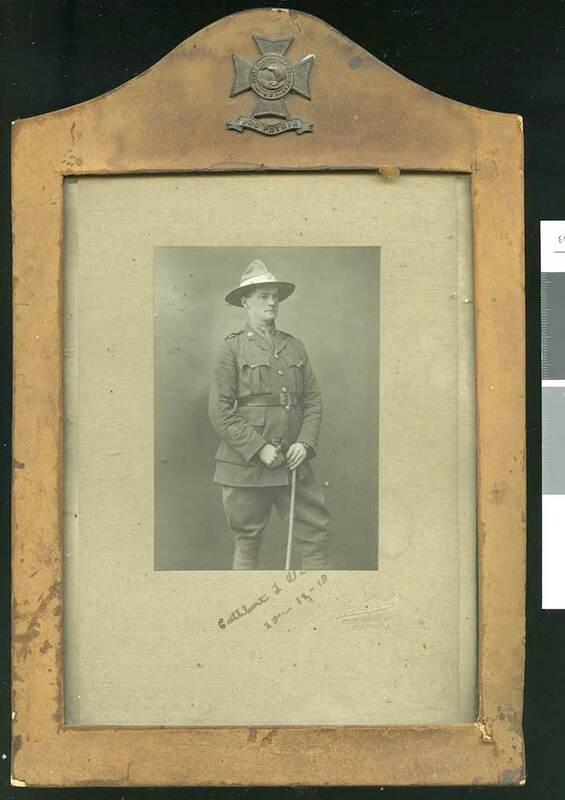 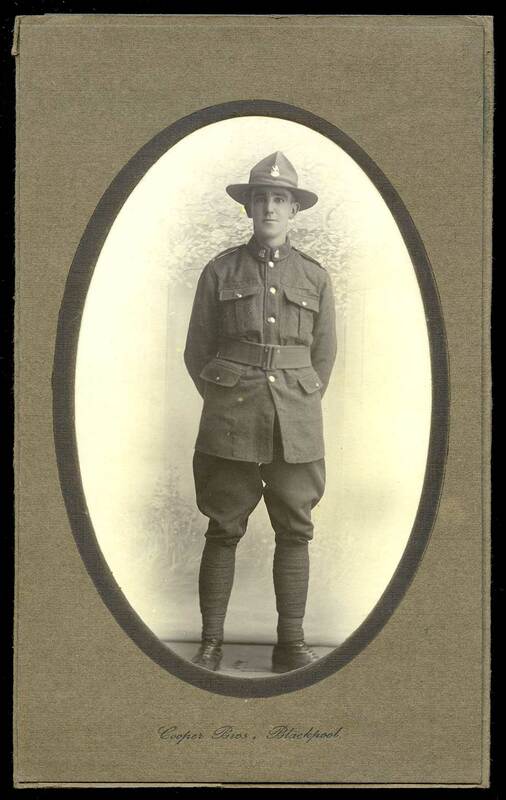 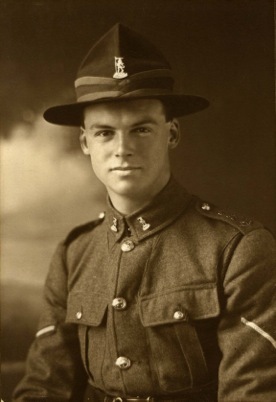 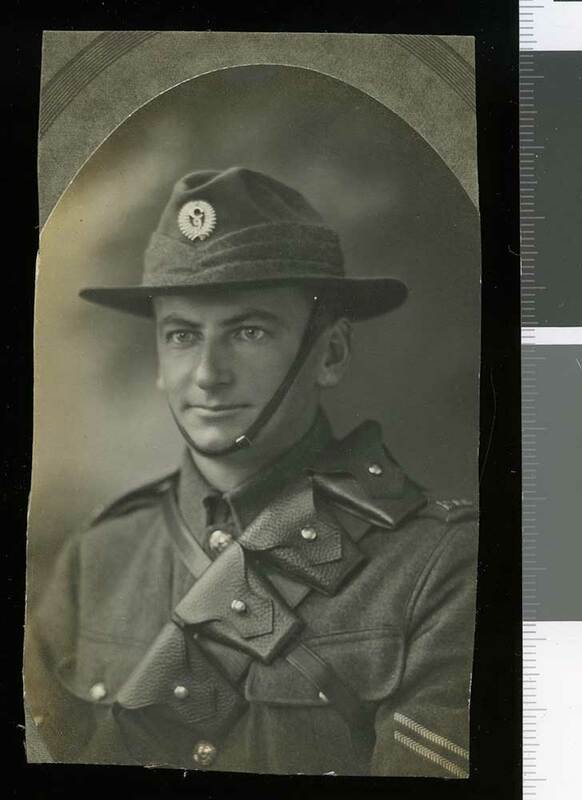 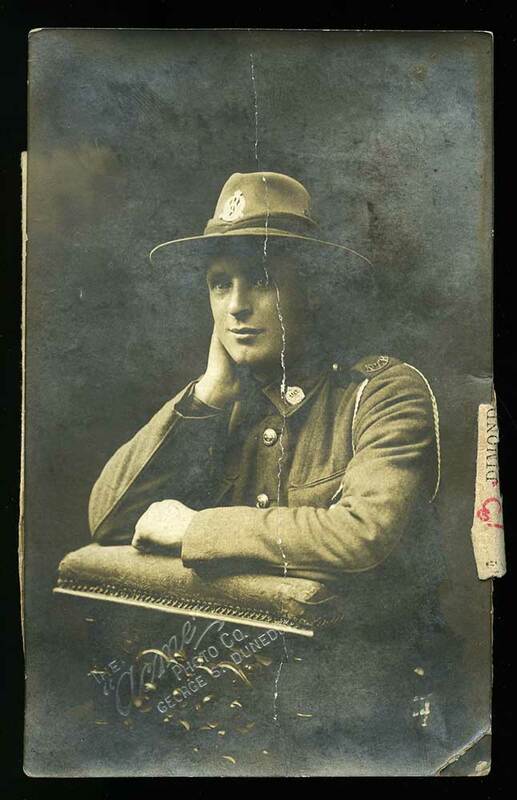 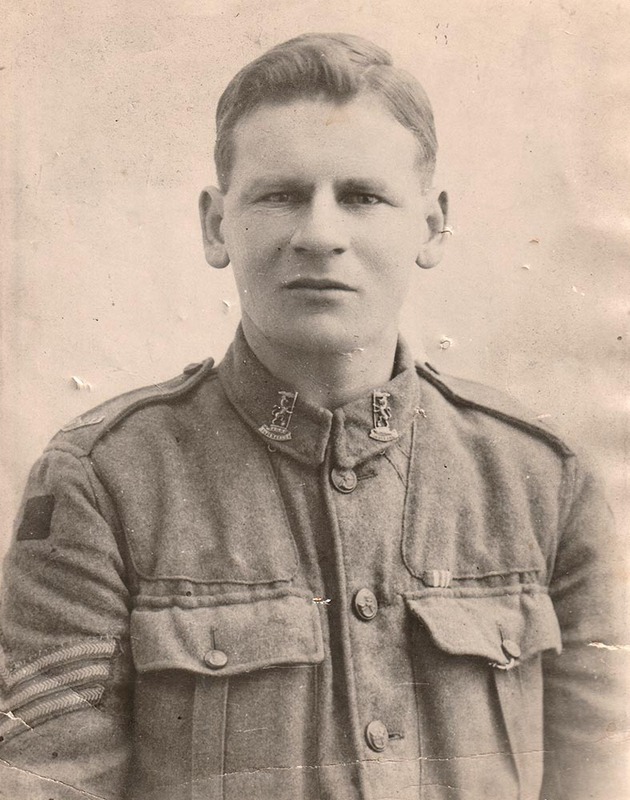 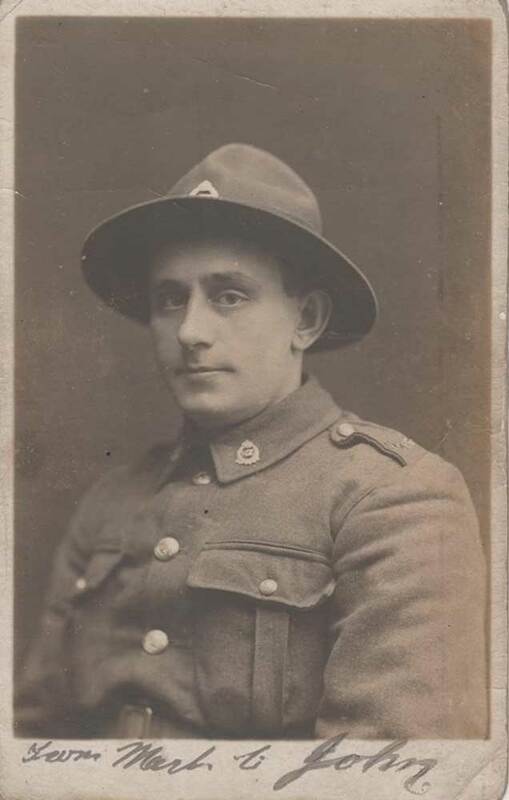 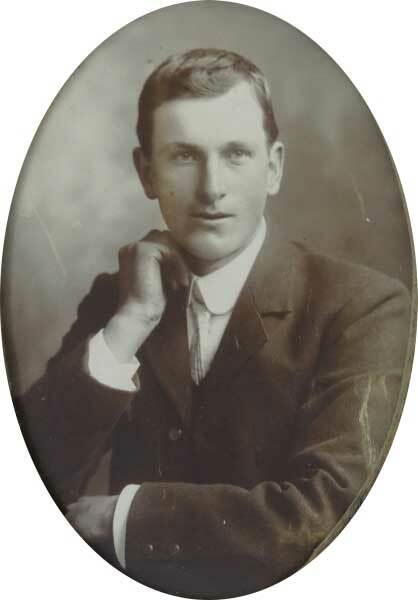 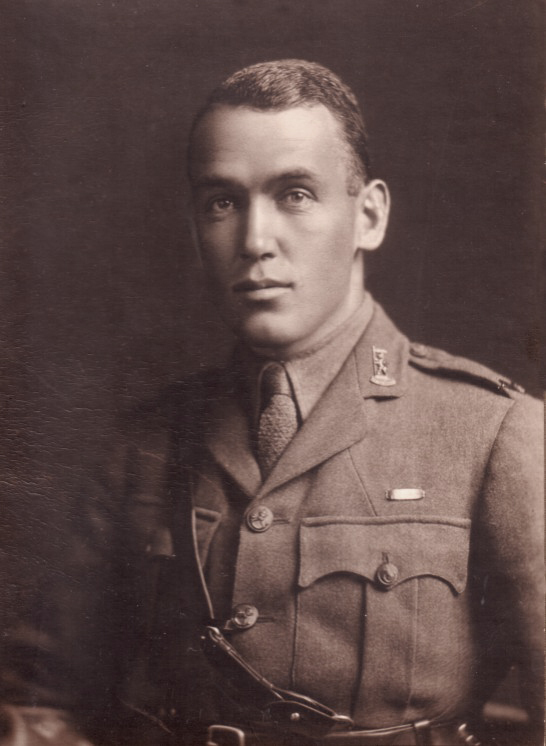 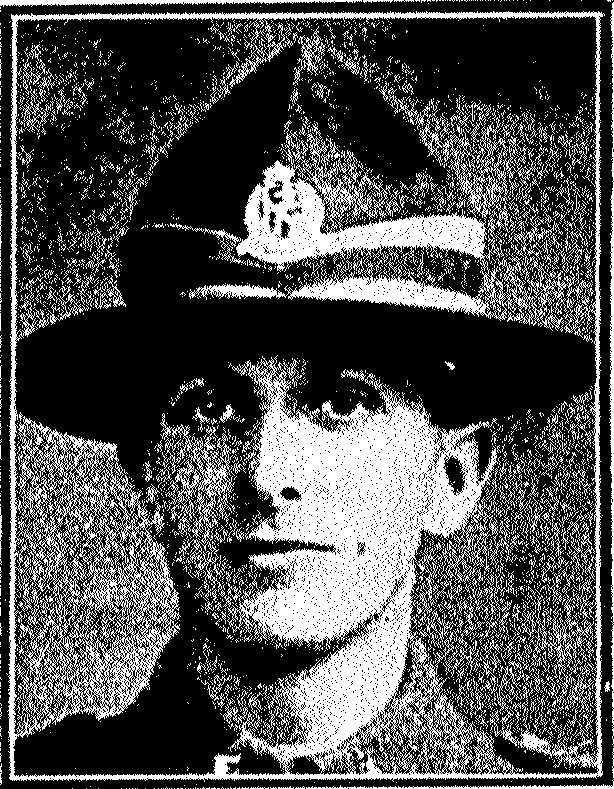 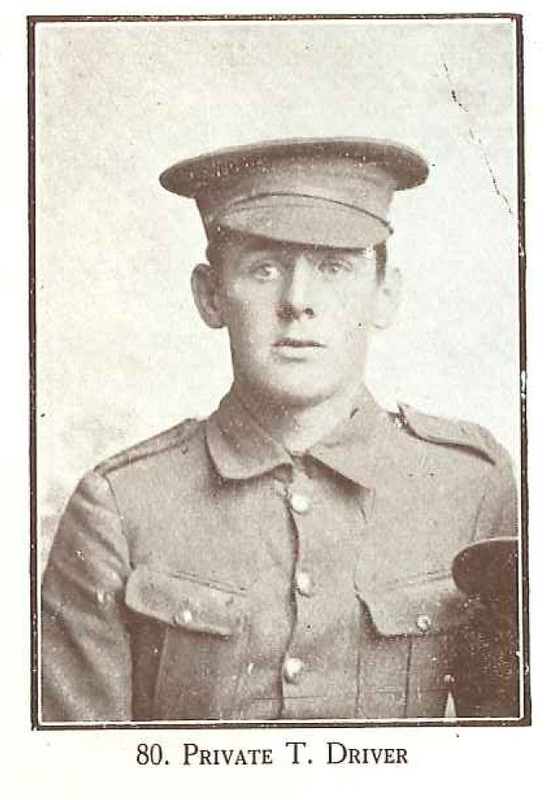 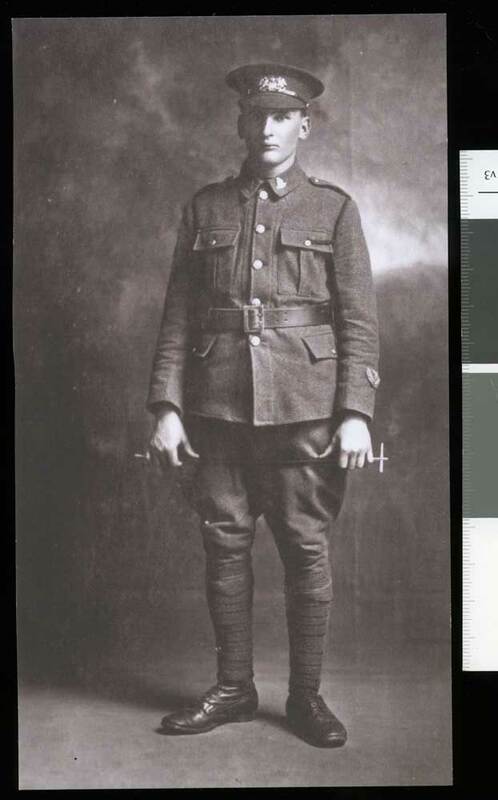 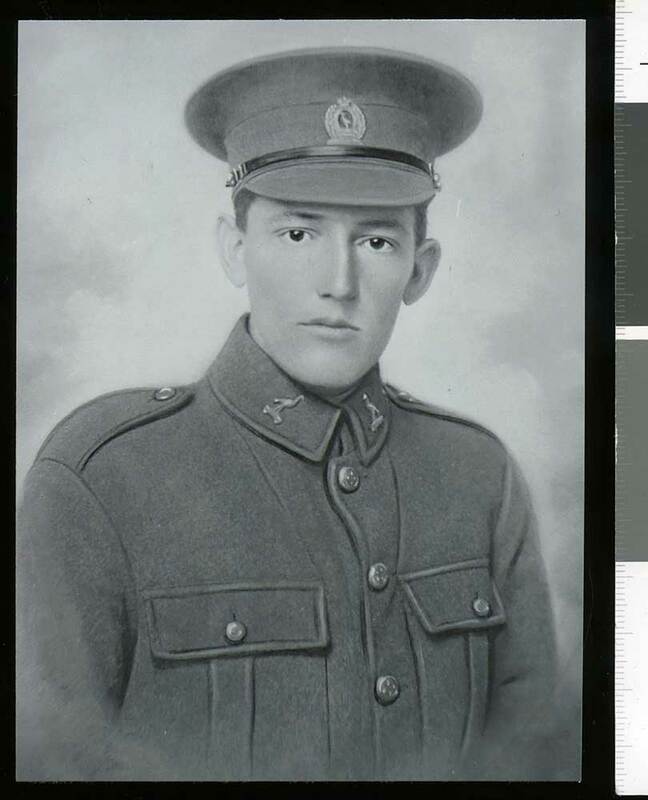 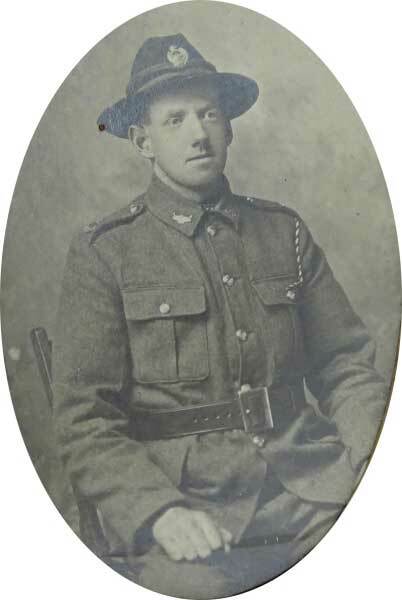 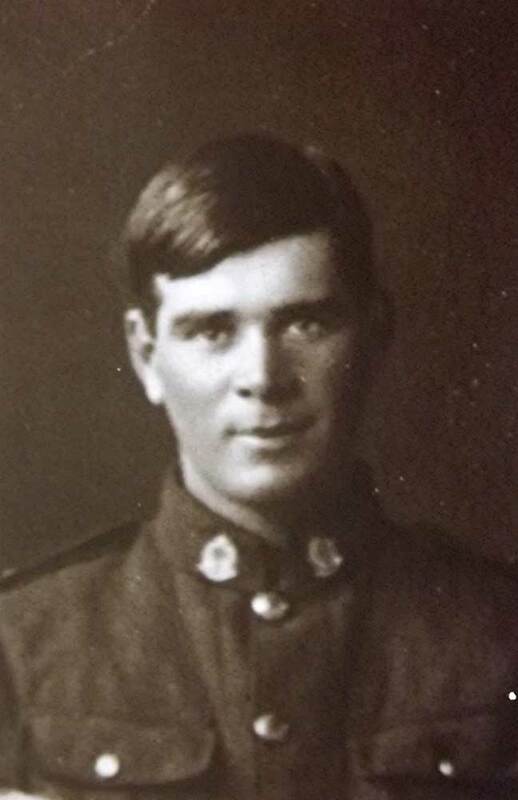 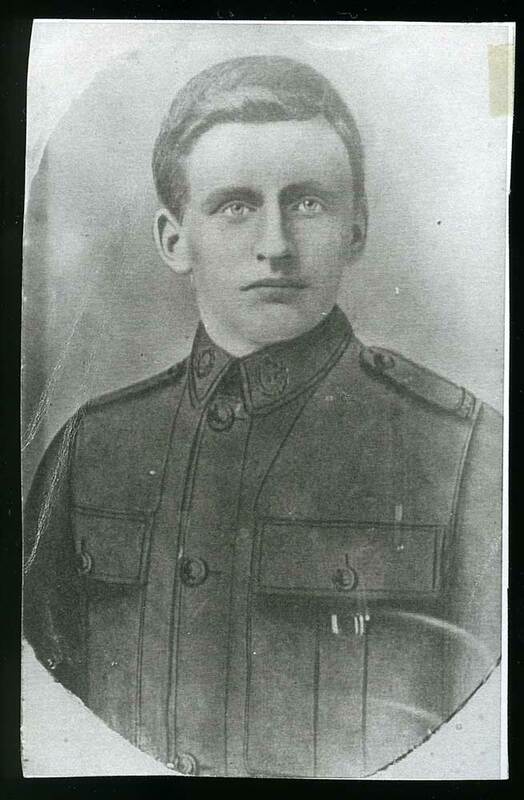 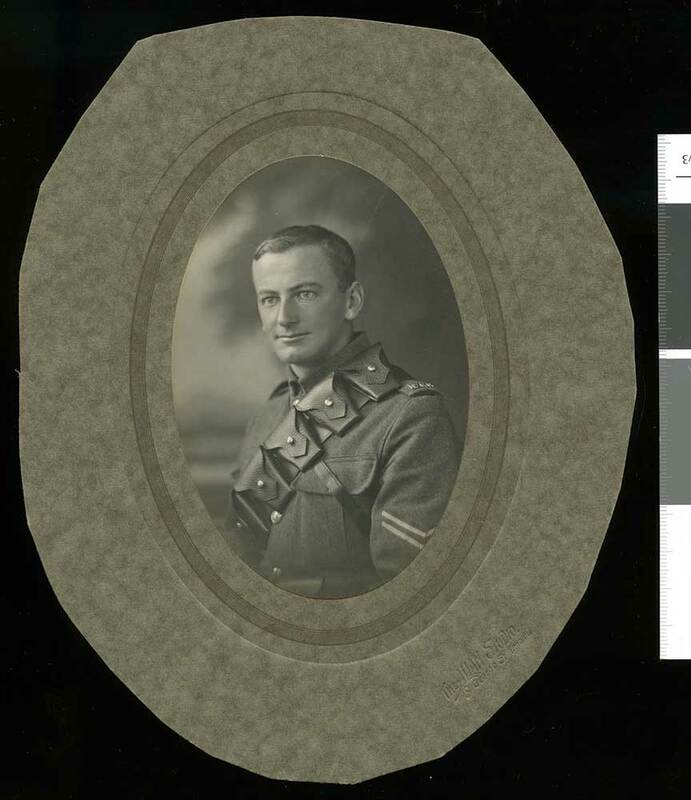 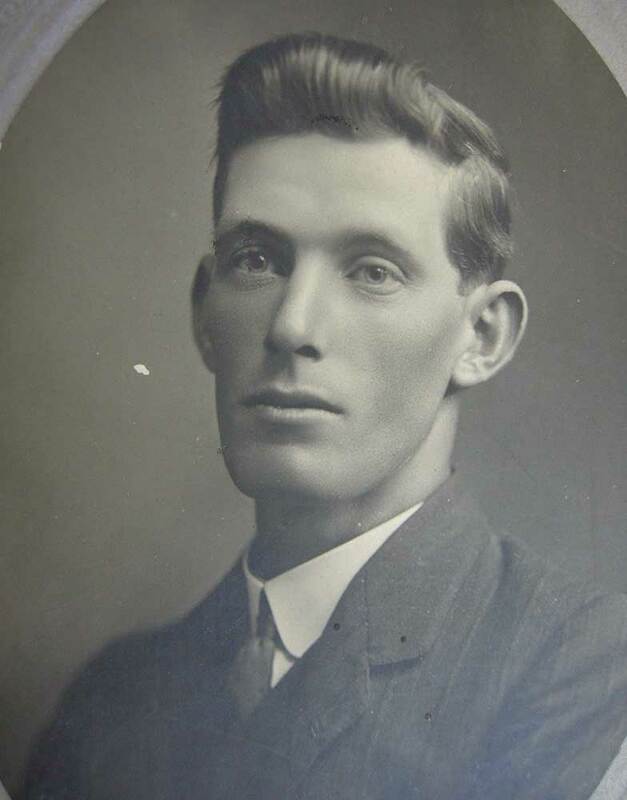 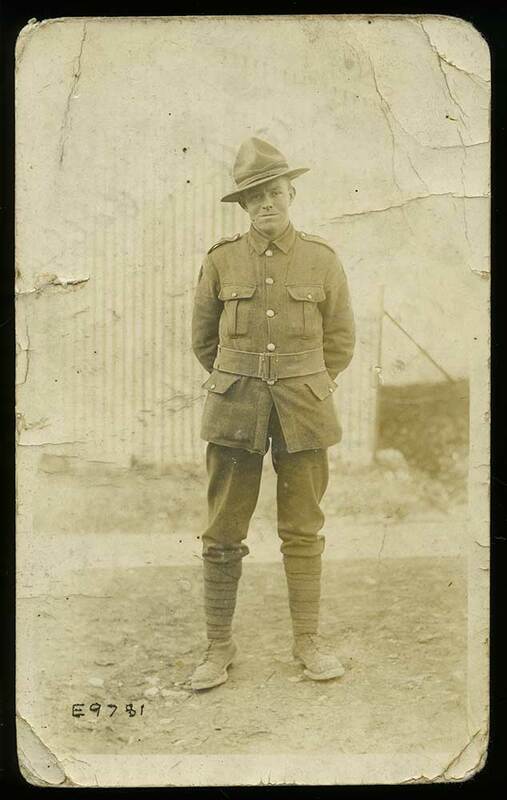 A 'unidentified' portrait that looks like it could be William Roy Davison of Albury when compared to another portrait of NCOs of the C Company, 25th Reinforcements on the Unknown Warriors of the NZEF Facebook page. 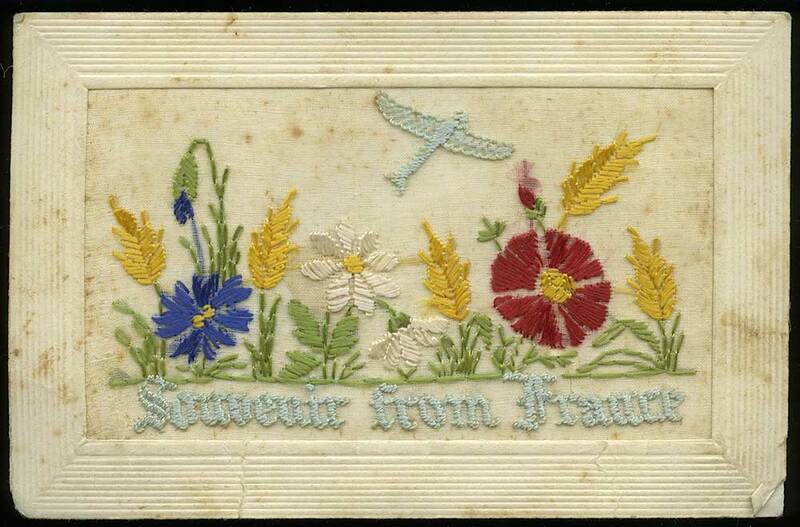 The reverse of a a 'silkie' postcard, a common souvenir in France. 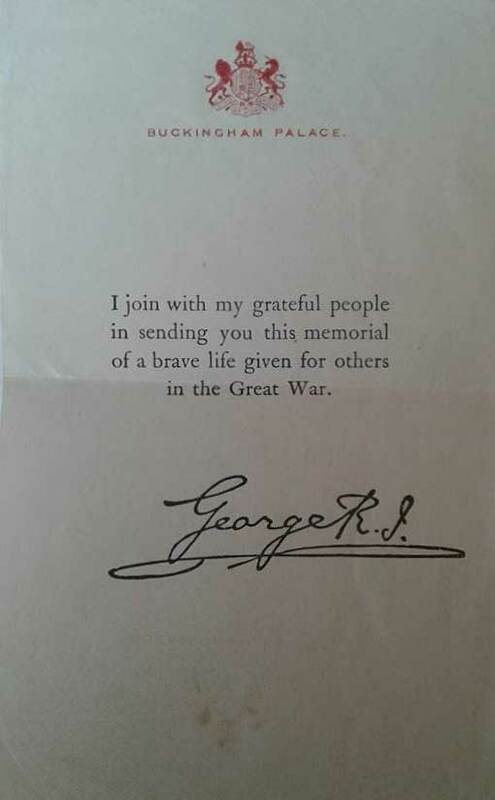 Hazel, George's sister, was only was only aged five when she received this..
A letter, which as you may be sure was most welcome arrived from you today and it is good of you to write so often. 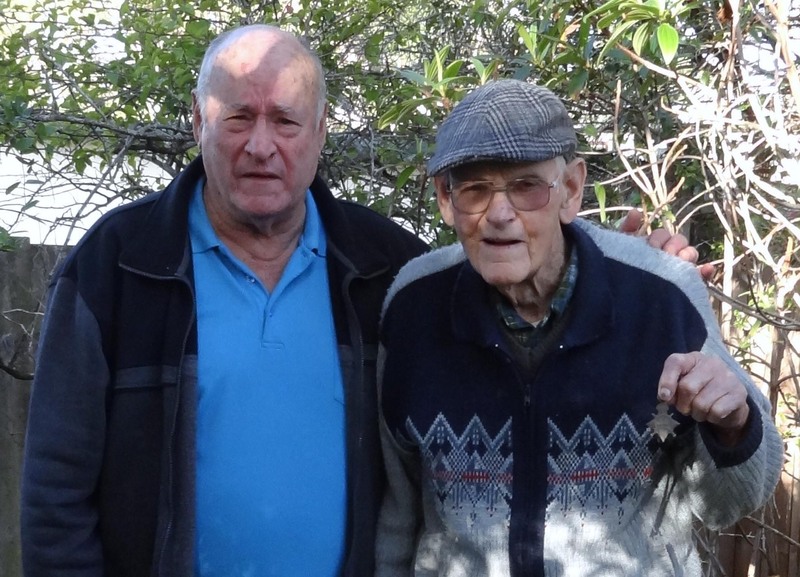 Billy G. was across on Sunday to see me – he is in good health – looks well and appears to be happy. 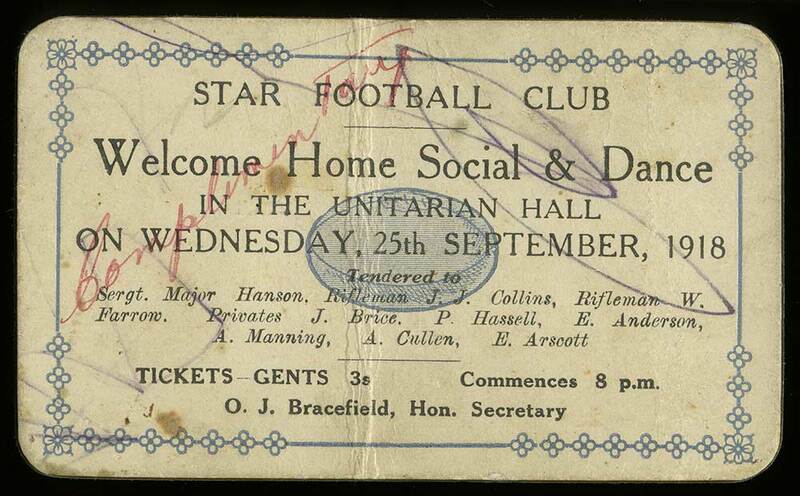 I must try and go across to see him tomorrow night. 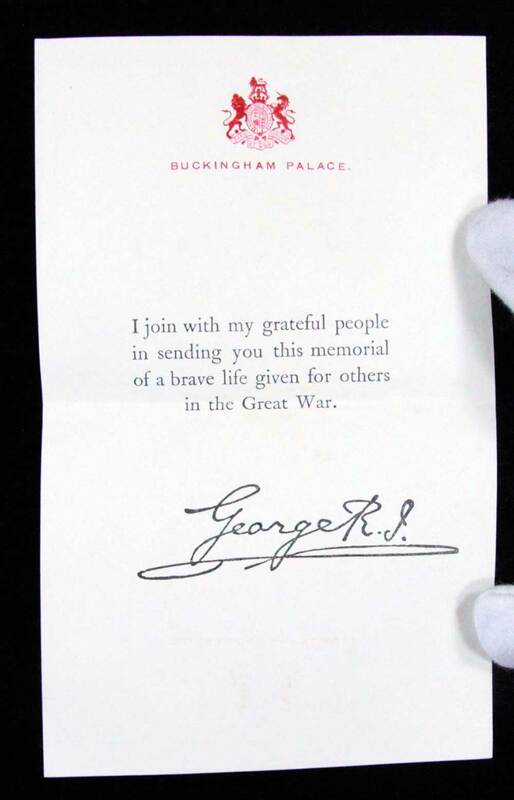 Hope you got over the Election alright. 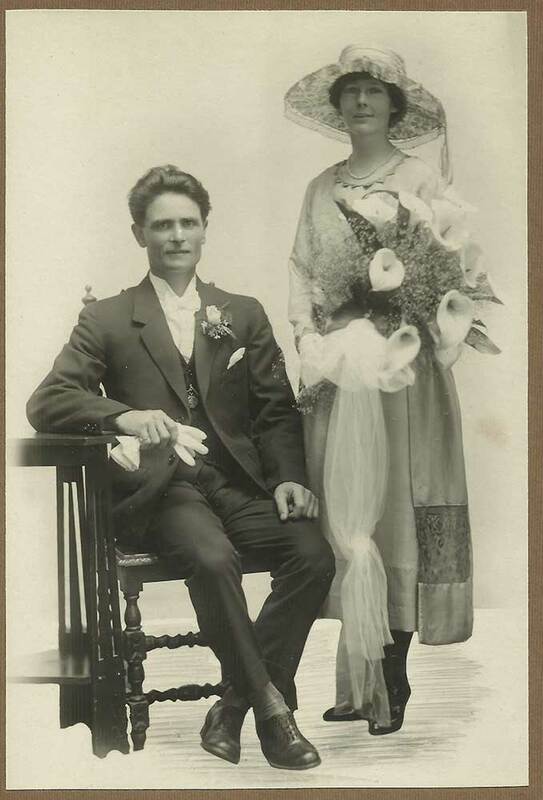 So you have one or two weddings lately – this would liven the dear old place up a bit. 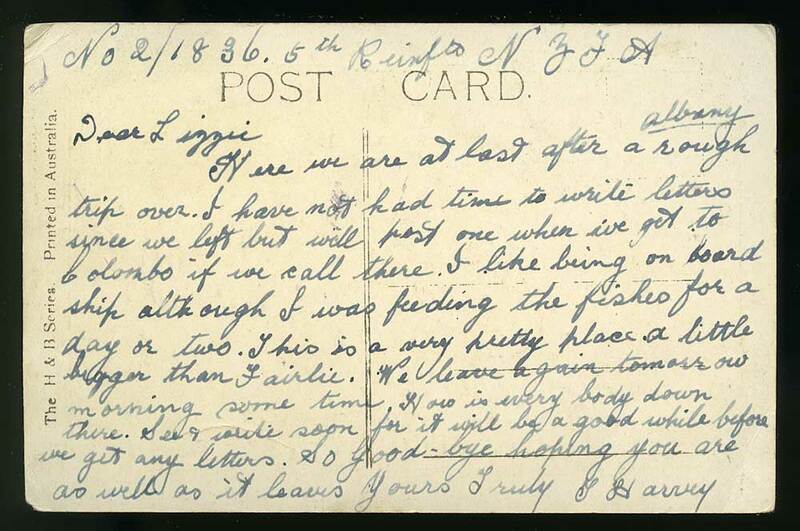 Don’t get the ‘blues’ Jess. 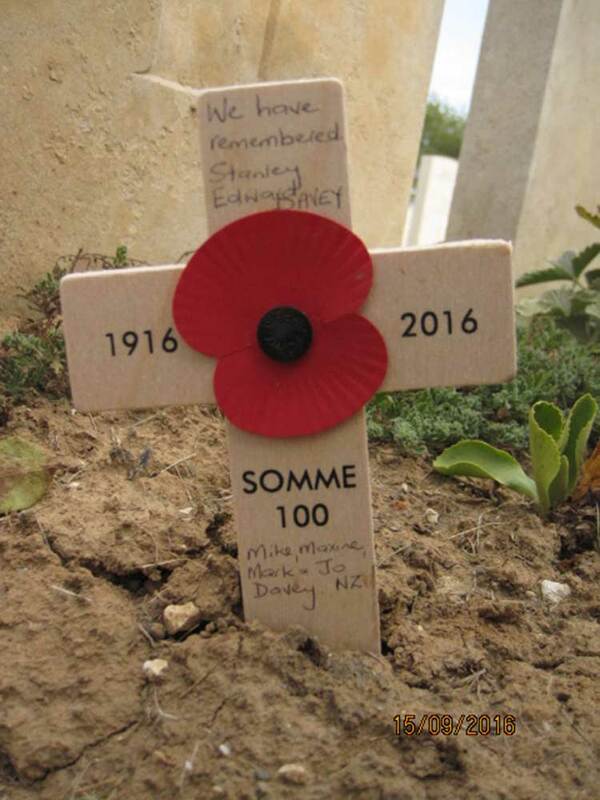 We are alright and treated well while here. 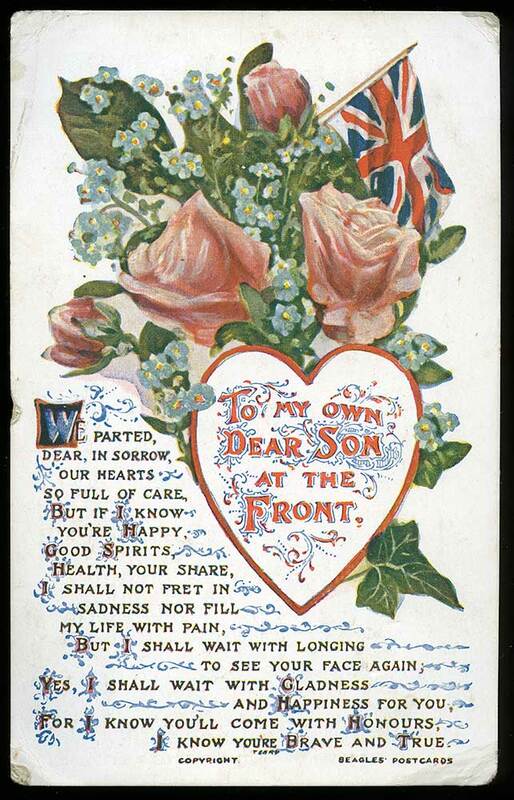 You will be brave and keep Mother to be too, I know. 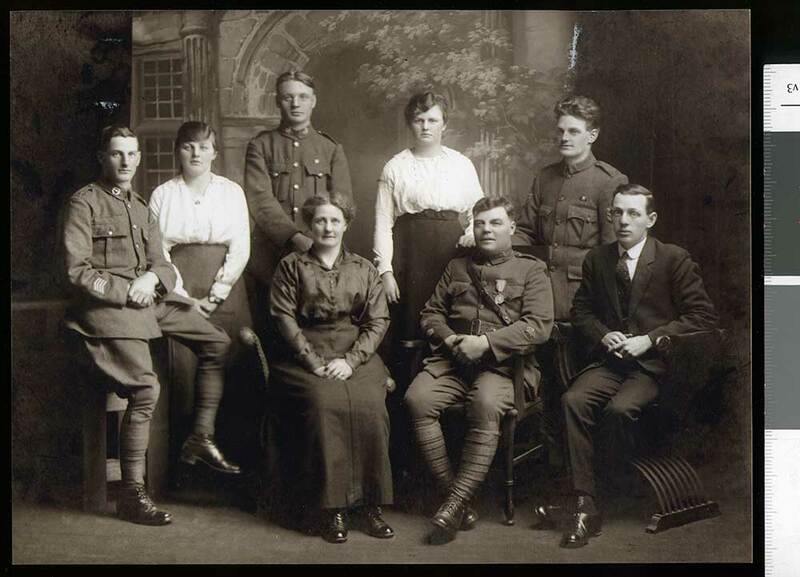 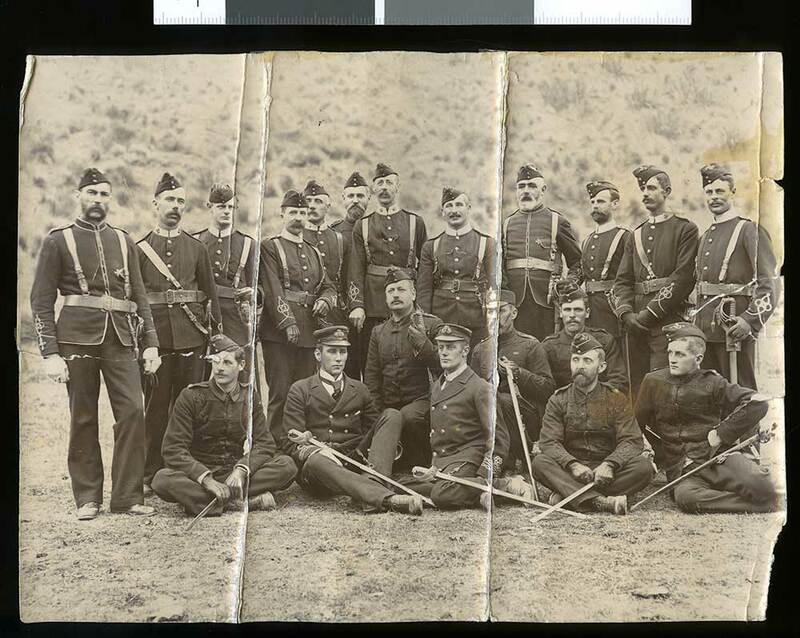 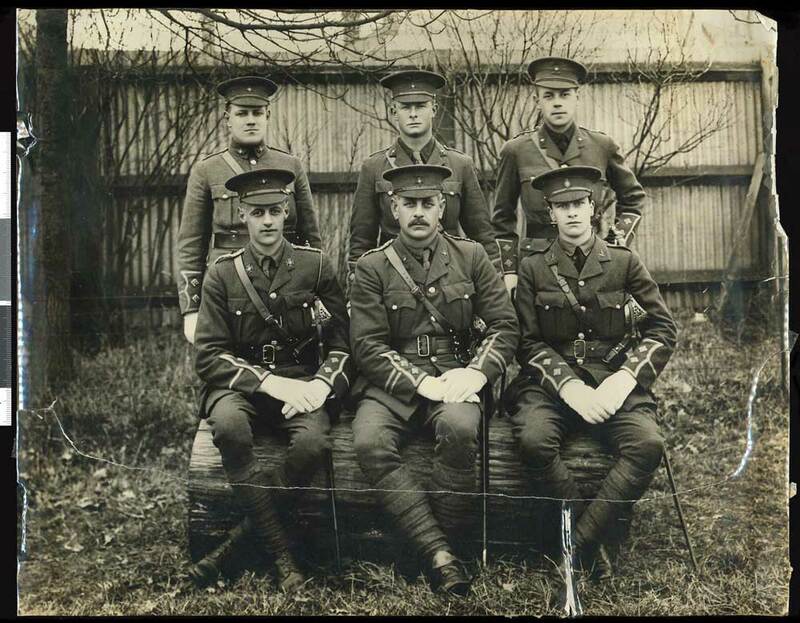 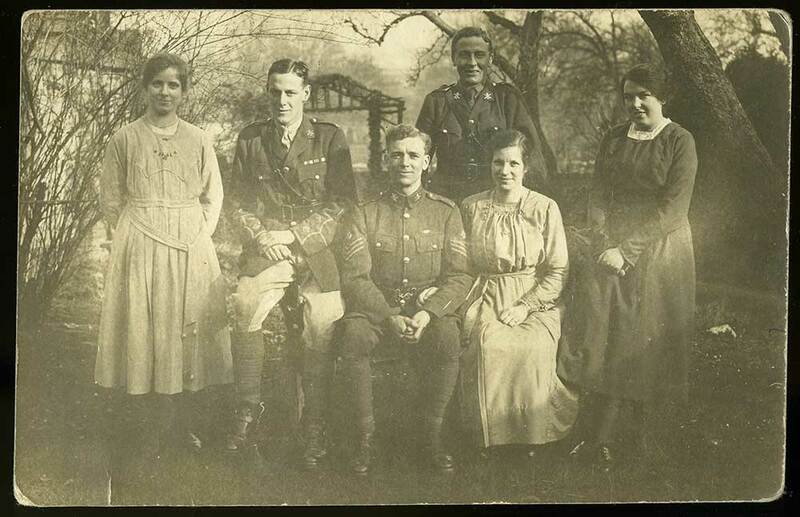 This group of the NCO’s of the regiment was taken on Xmas Day. 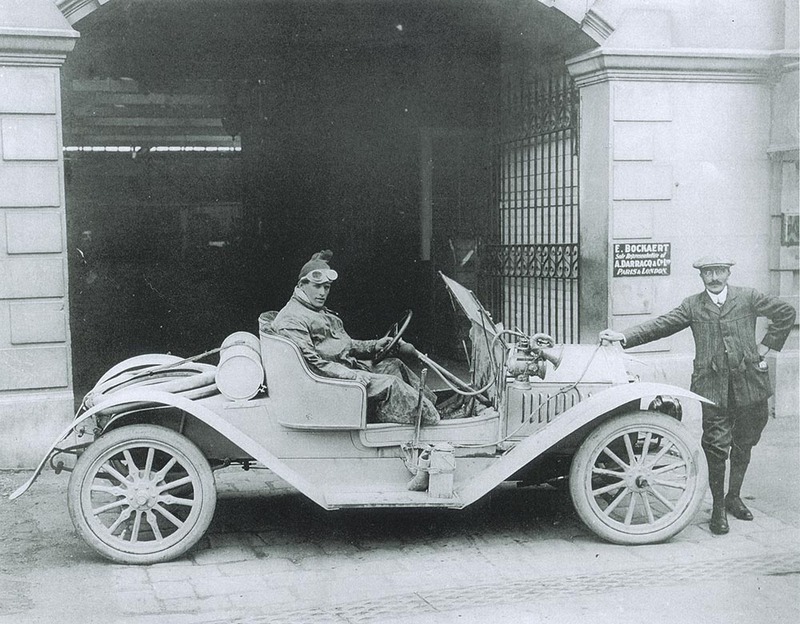 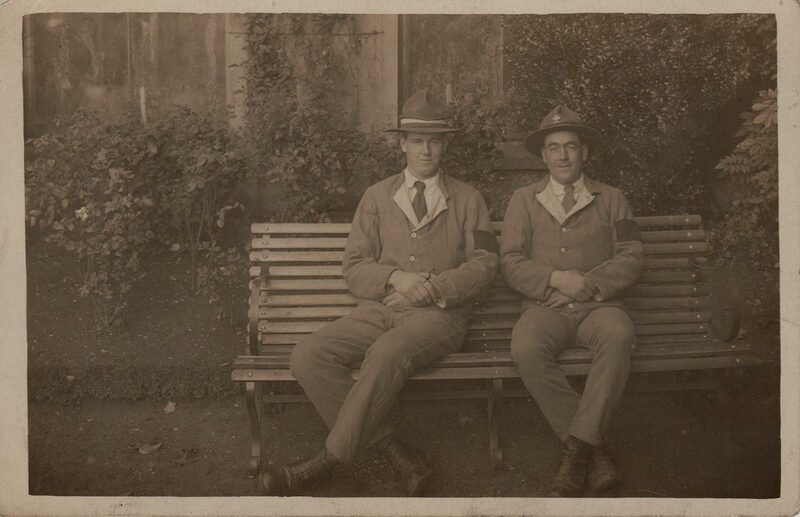 The Colonel and Major Overton were present. 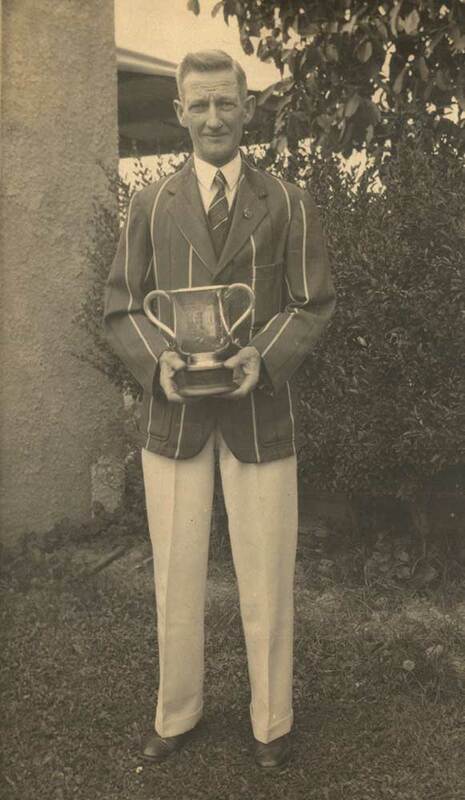 I am in good form and keep in good health. 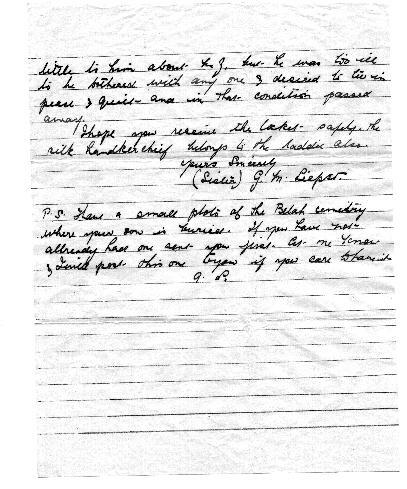 Will write further later. 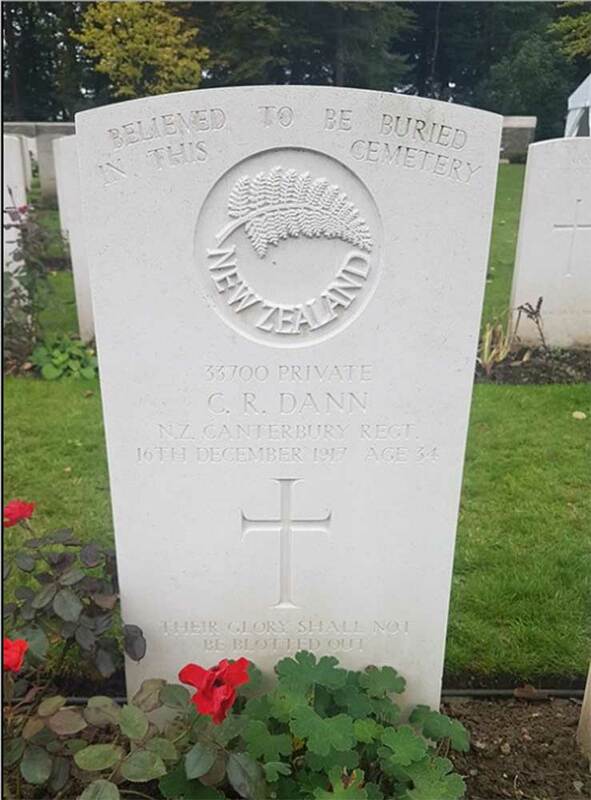 Au Revoir. 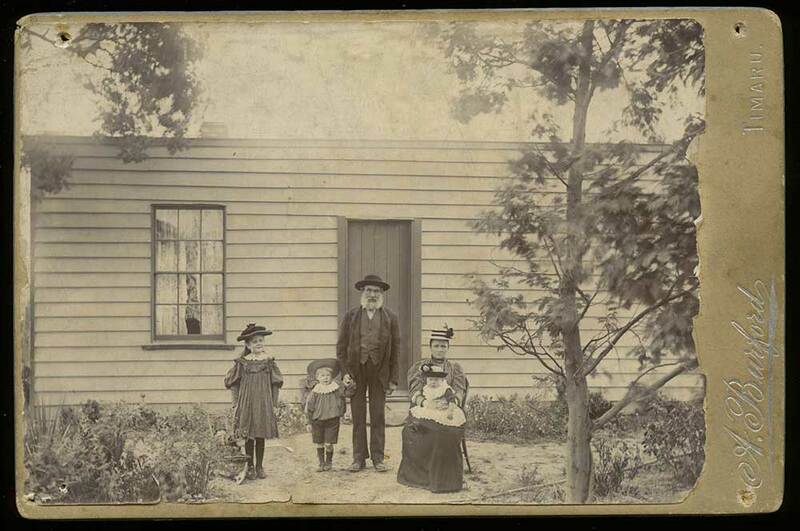 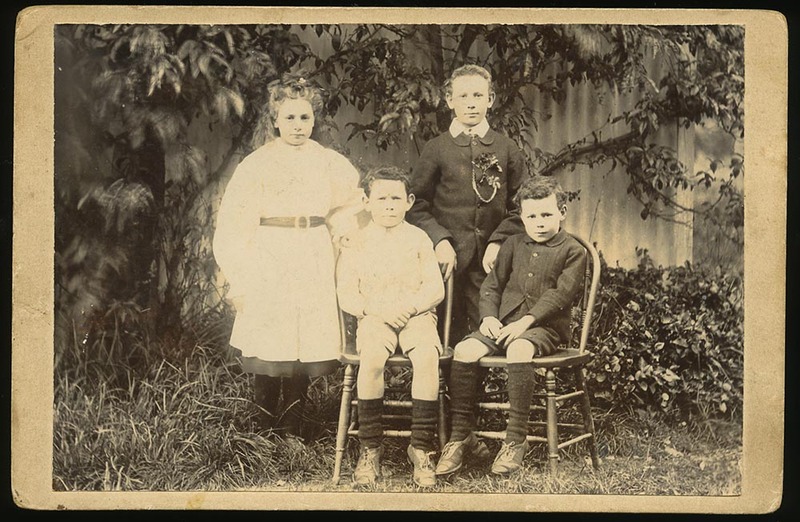 Portrait of Mr John Wilds with his daughter Mrs Mary Annie Davidson and her three children, outside his home in North Street, Timaru, circa 1896. 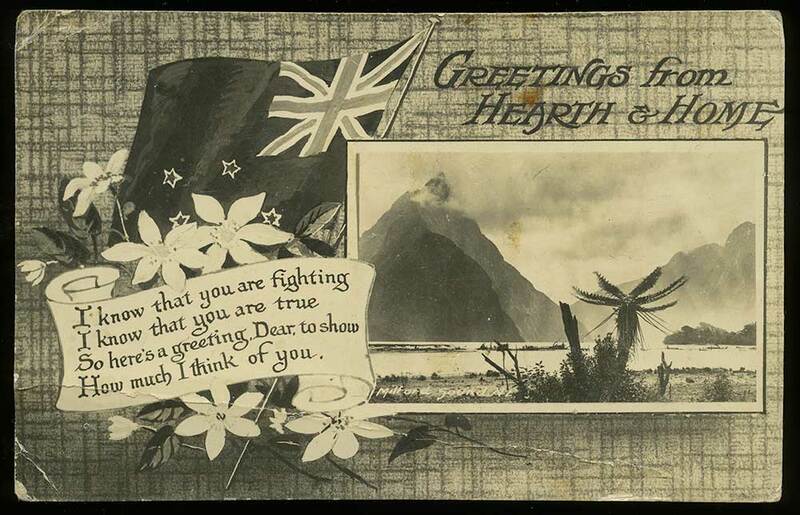 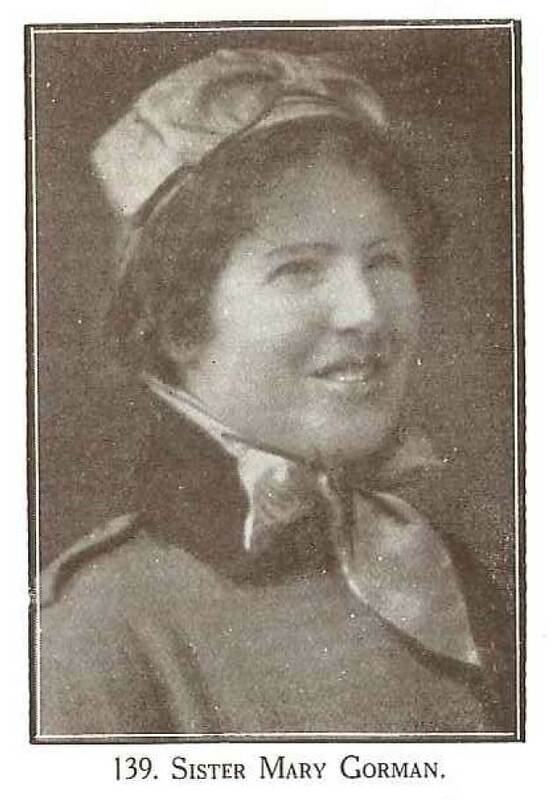 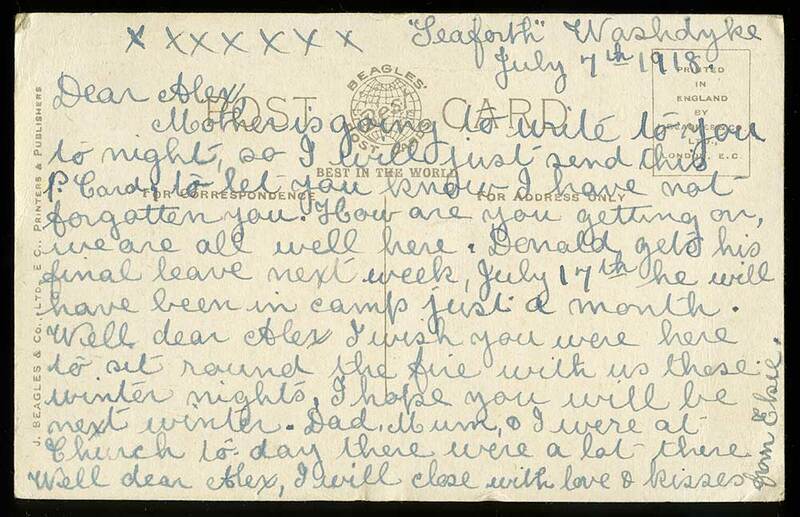 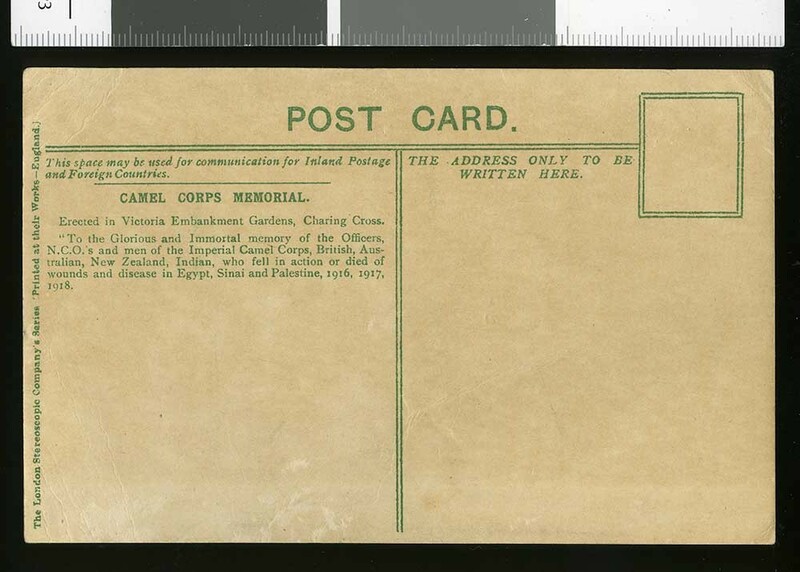 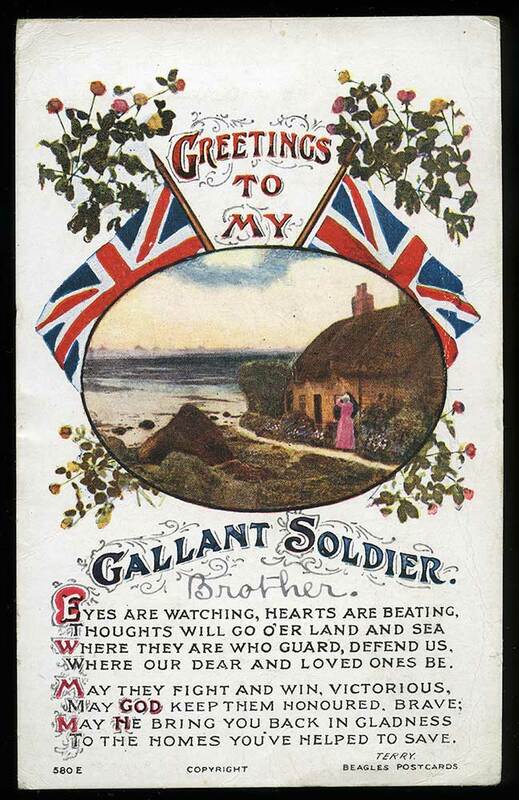 A postcard, bearing the message "Greetings to my Gallant soldier [Brother]", from Elsie Ross of Seaforth at Washdyke, Timaru, to Alister (Alex) Ross, serving in France, dated 7 July 1918. 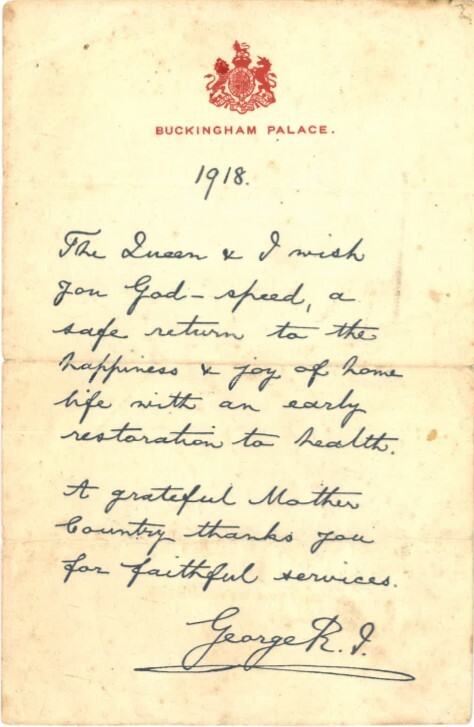 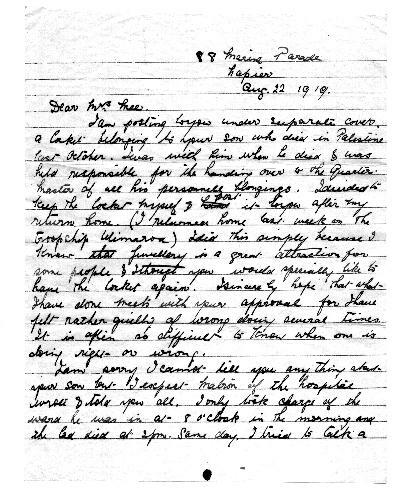 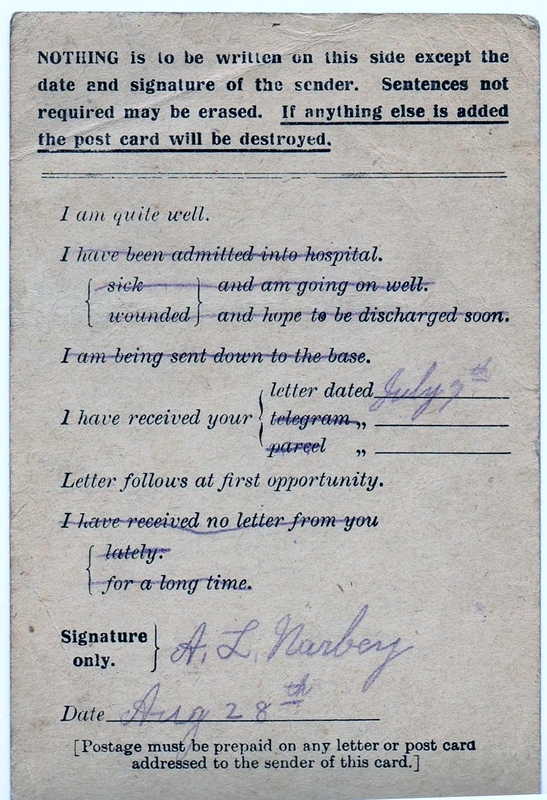 The verso bears a message of love, assuring Alex all was well at home, and that "Donald [no surname] was to have his final leave the following week (prior to leaving for the front). 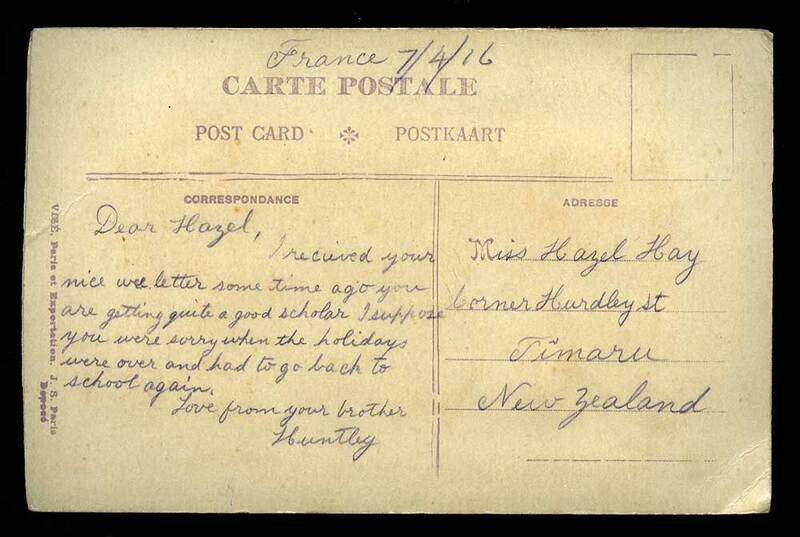 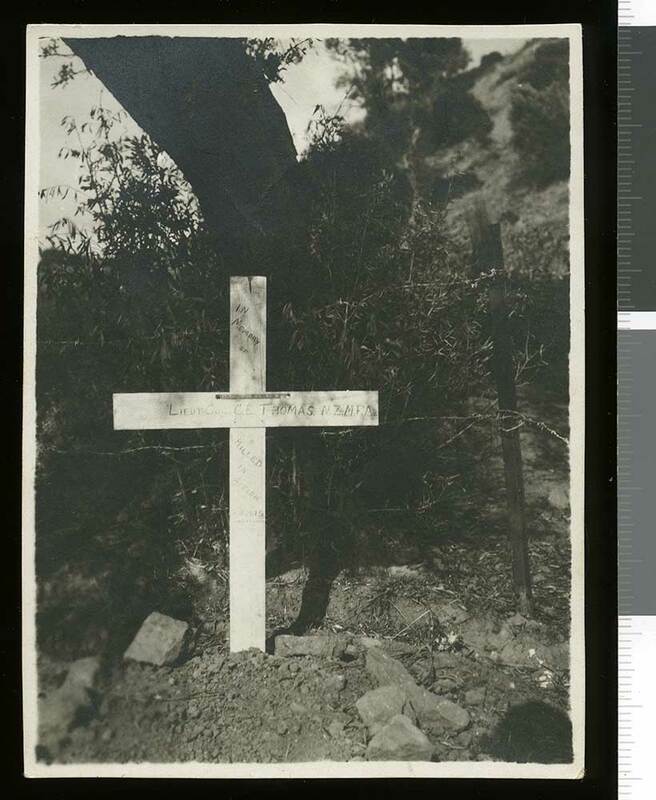 A postcard, bearing the message "In honours Cause may God bless and keep you", from Elsie Ross of Seaforth at Washdyke, Timaru, to Alister (Alex) Ross, serving in France, dated 7 September 1918. 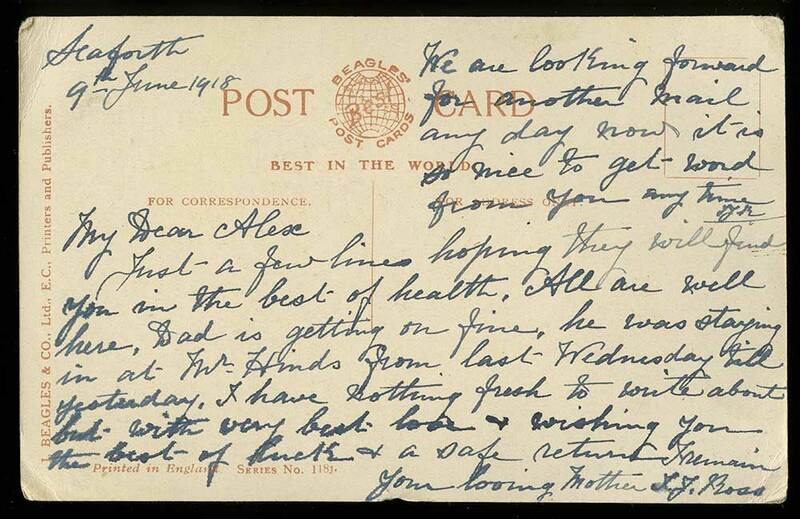 The verso bears a message of wishing good health, assuring Alex all was well at home. 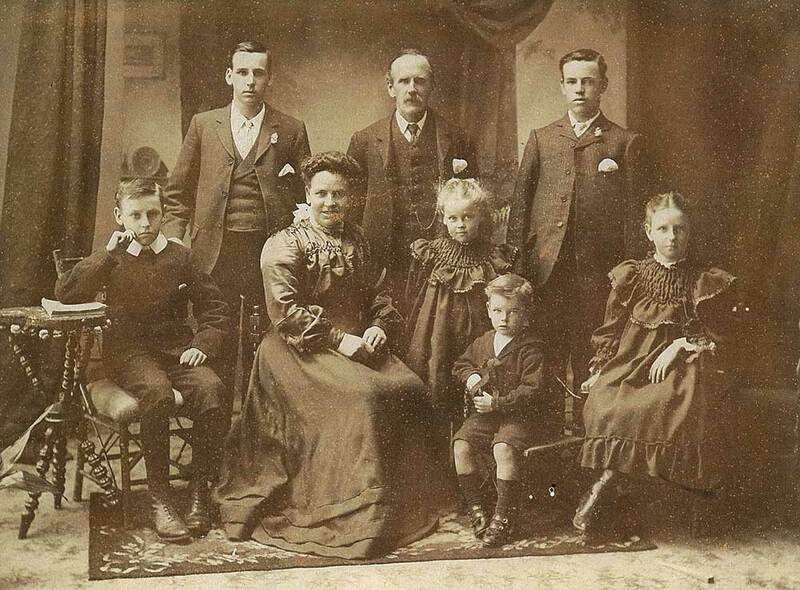 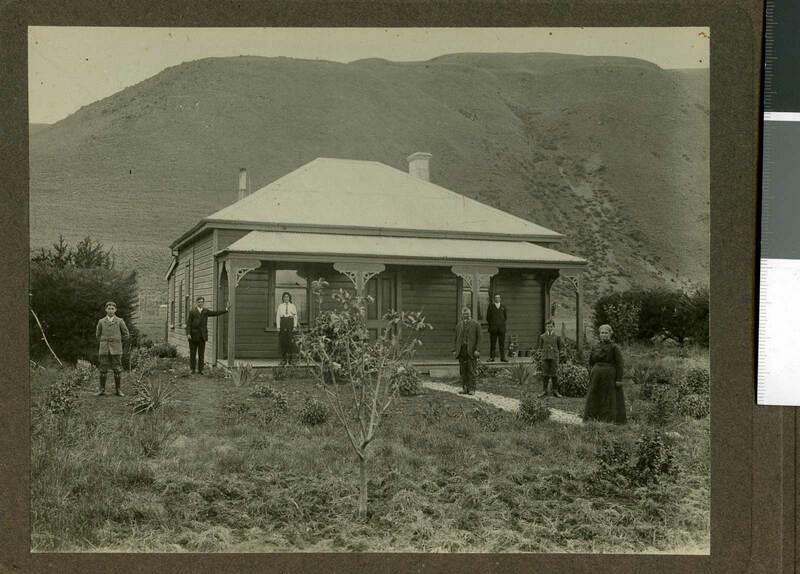 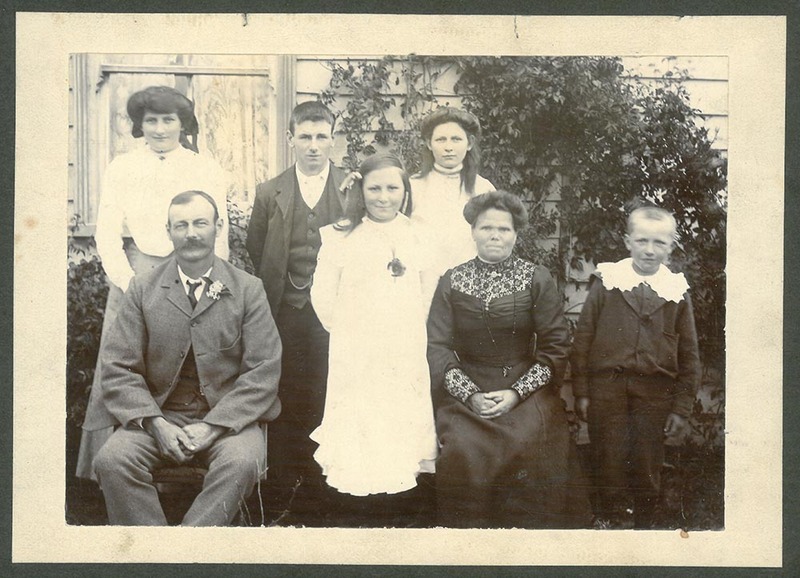 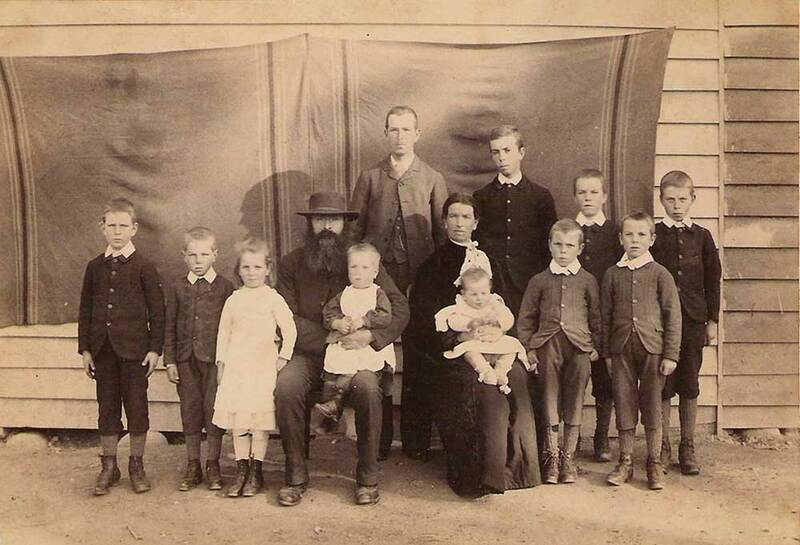 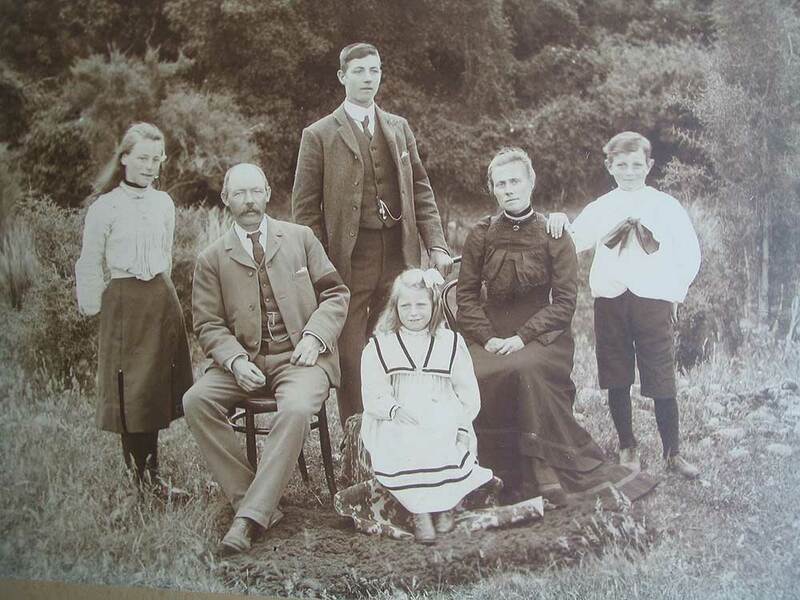 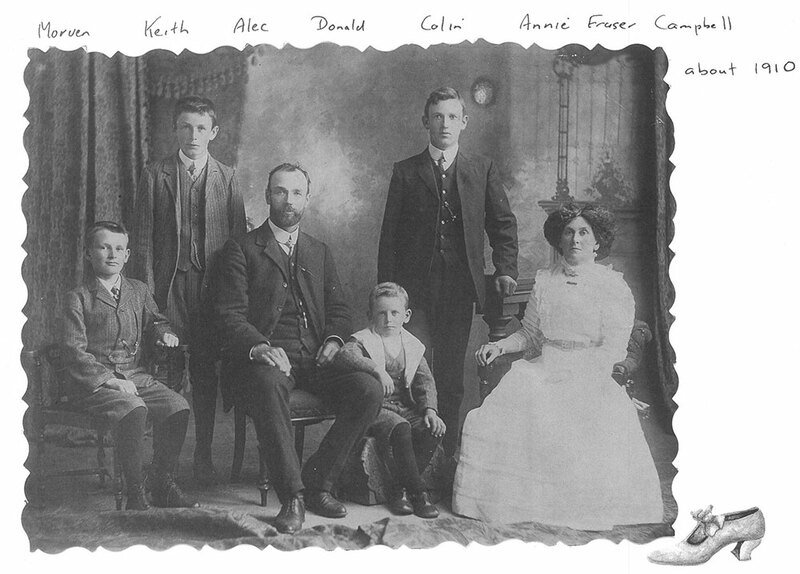 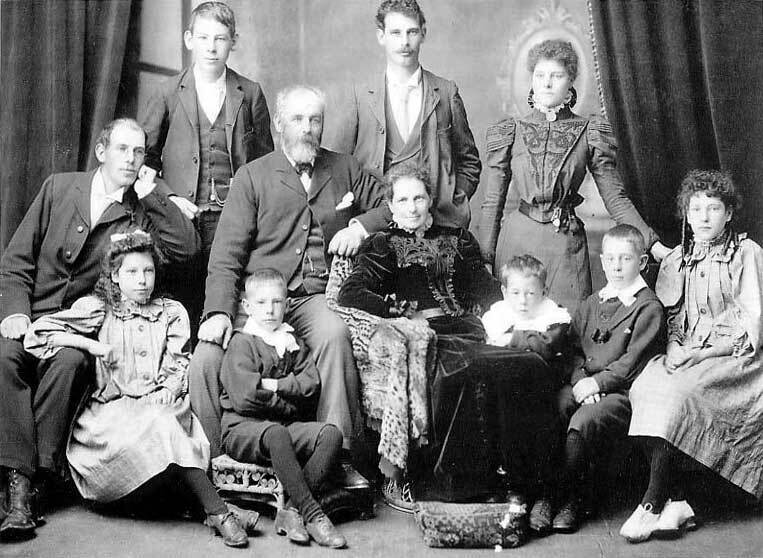 Portrait of Mr John Wilds with his daughter Mrs Mary Annie Davidson and three grandchildren (including a baby John Davidson), outside his home in North Street, Timaru, circa 1896. 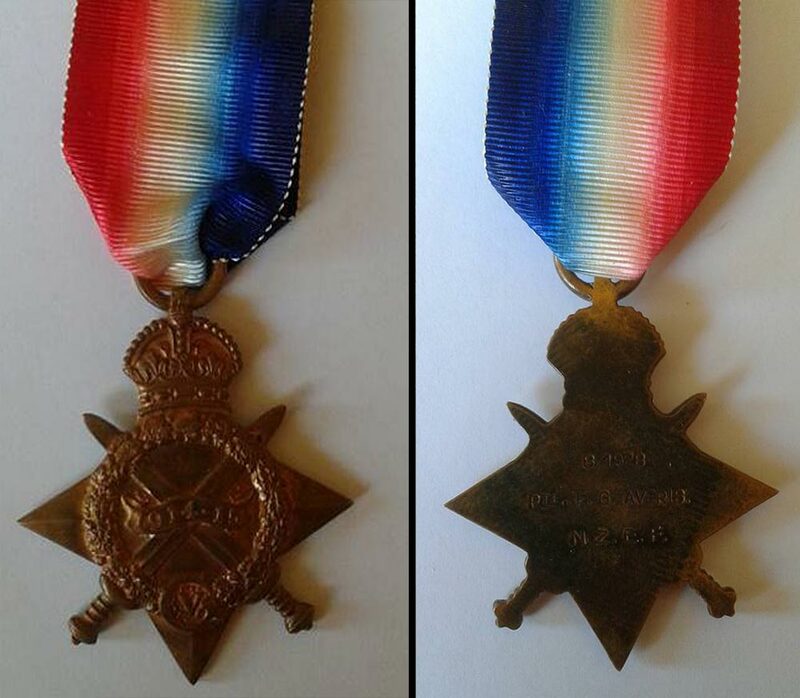 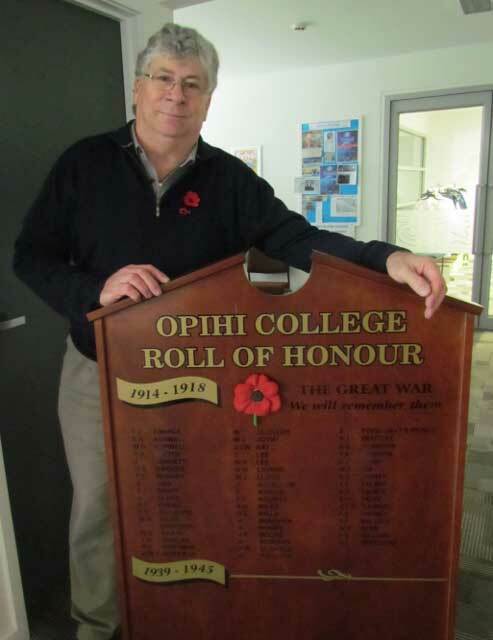 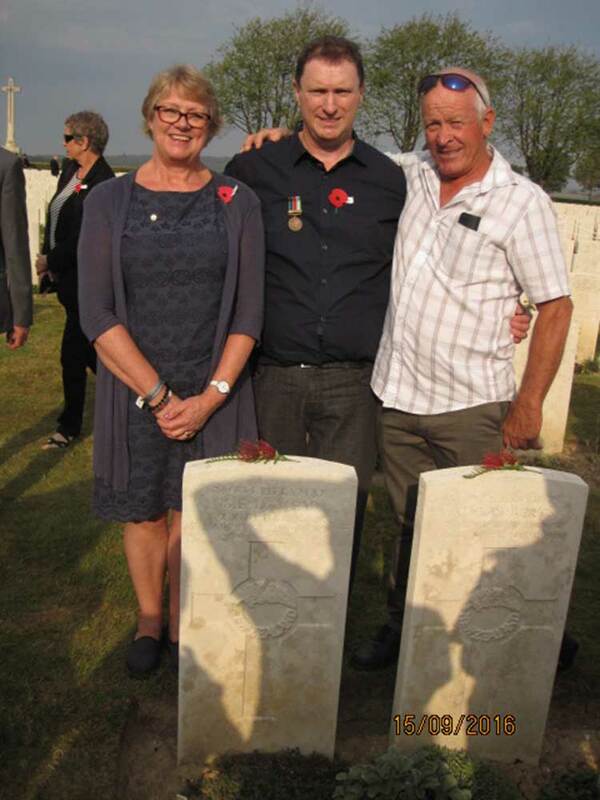 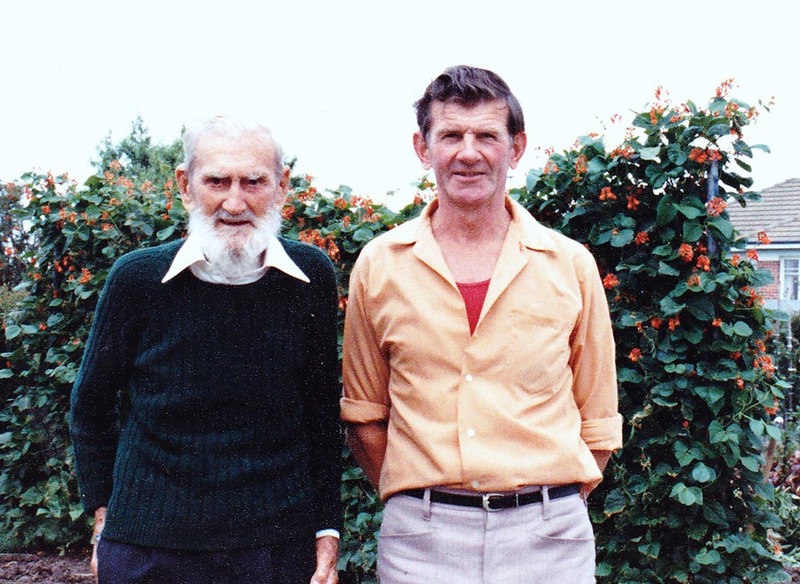 Ray Marler junior (left) and senior (right) in 2018 with the 1914-1915 Star dug up in Australia 30 years earlier. 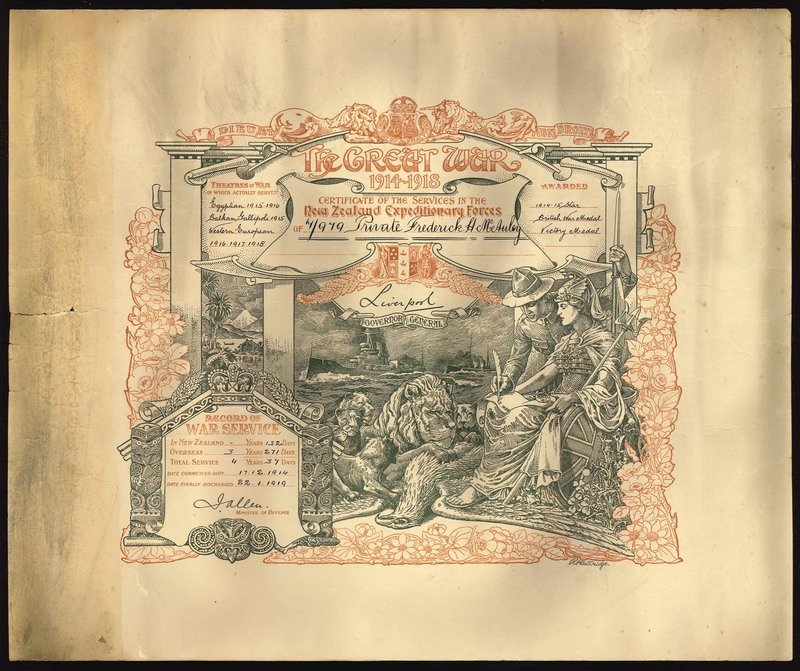 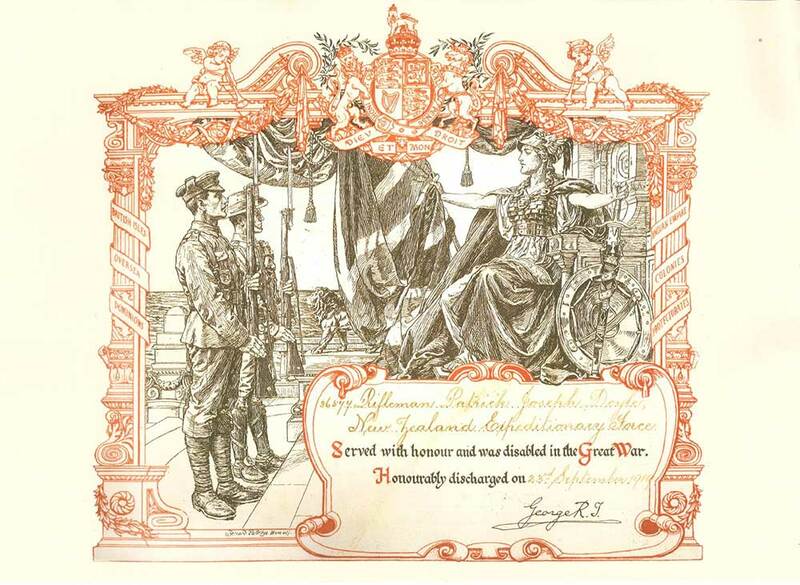 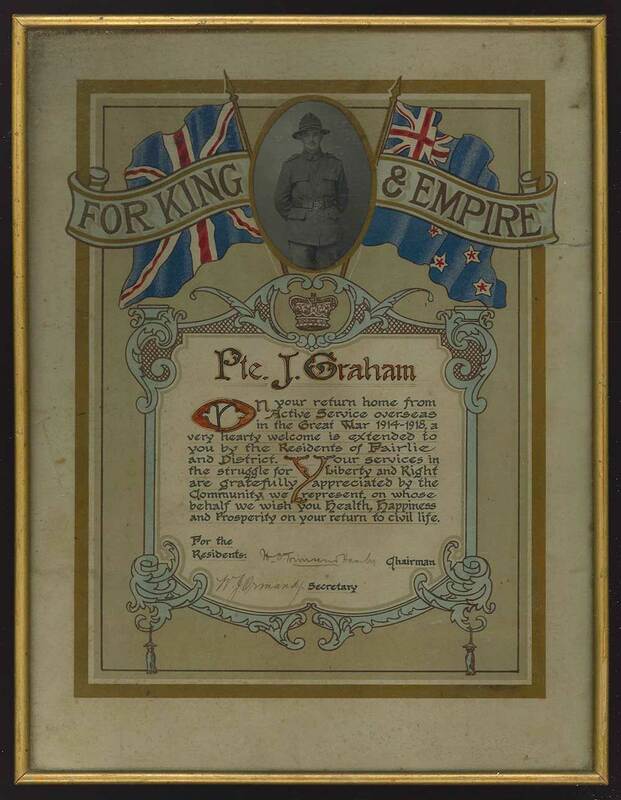 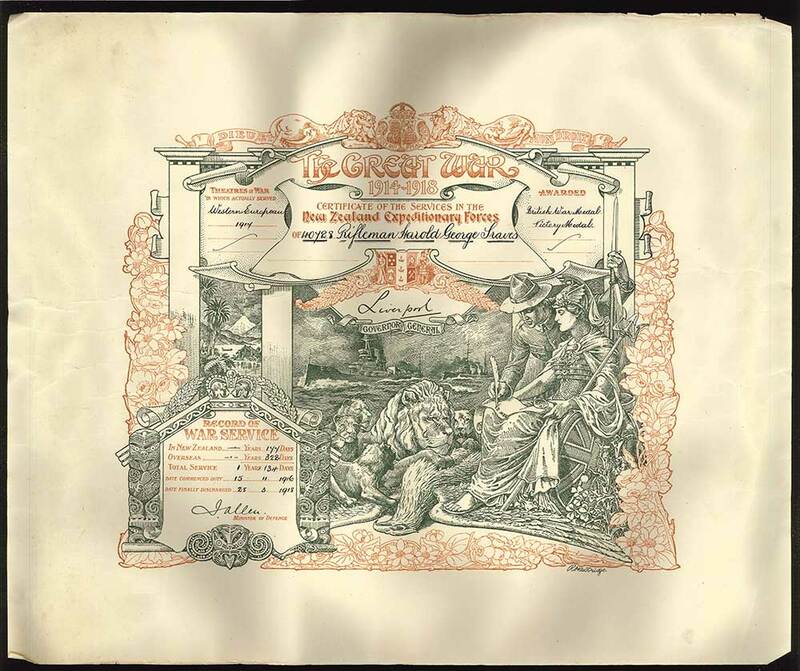 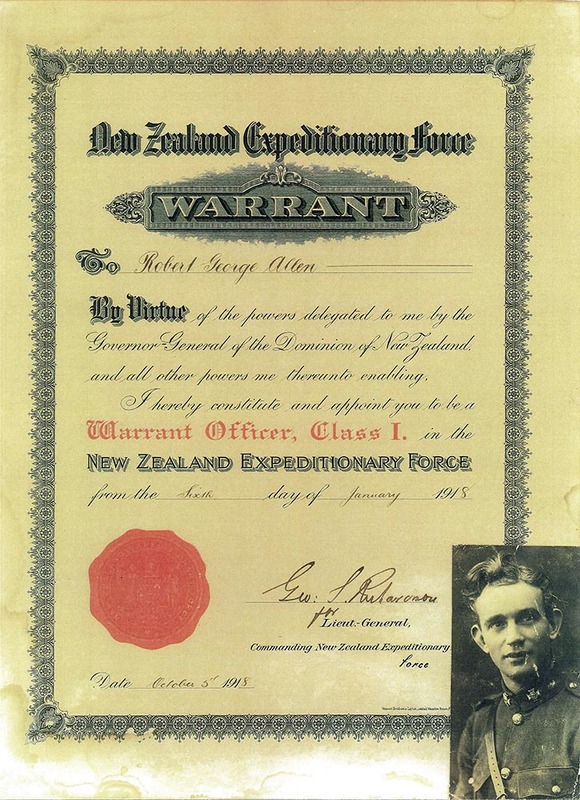 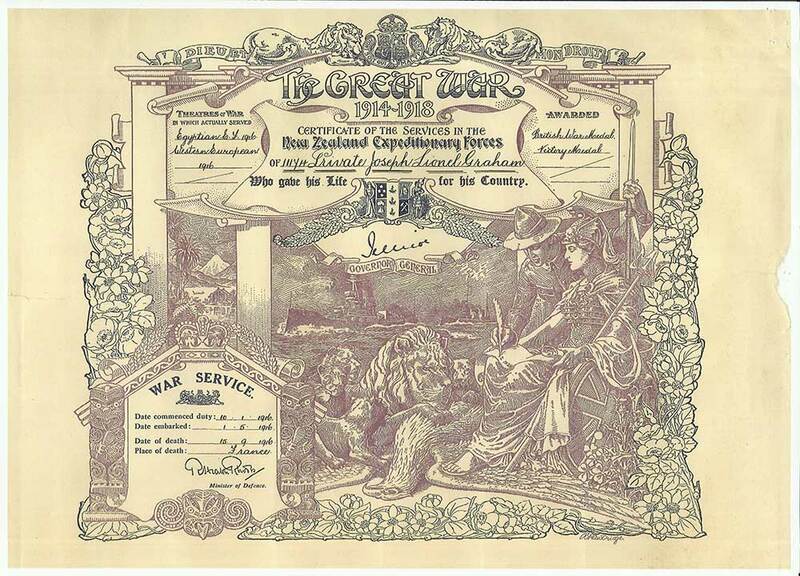 The full ftramed certificate issued to commemorate the sacrifice of Charles Smart's life, sometime between 1920 and 1924. 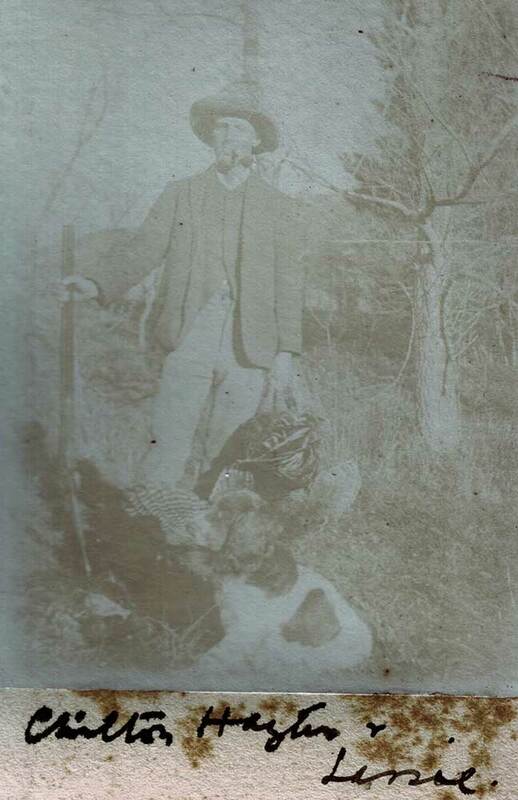 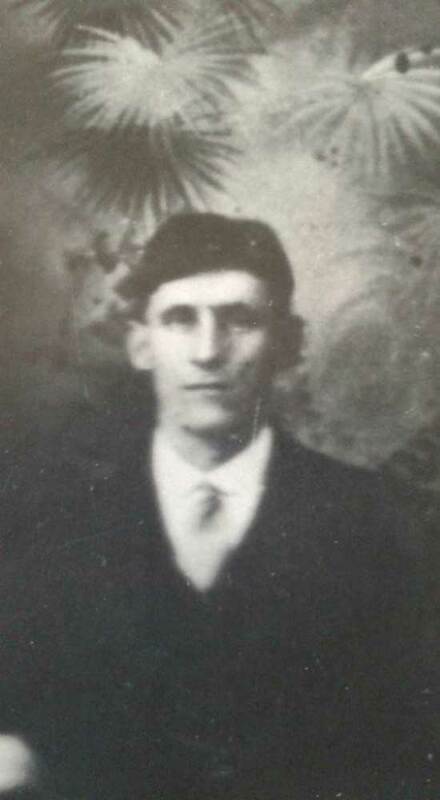 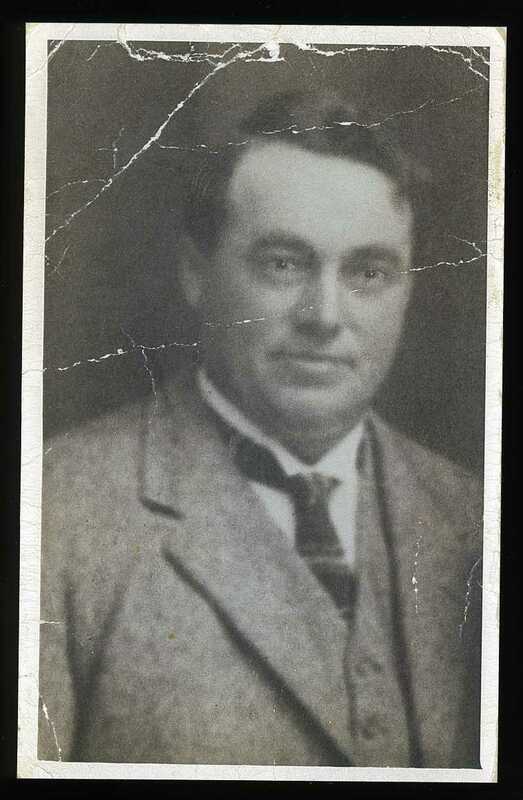 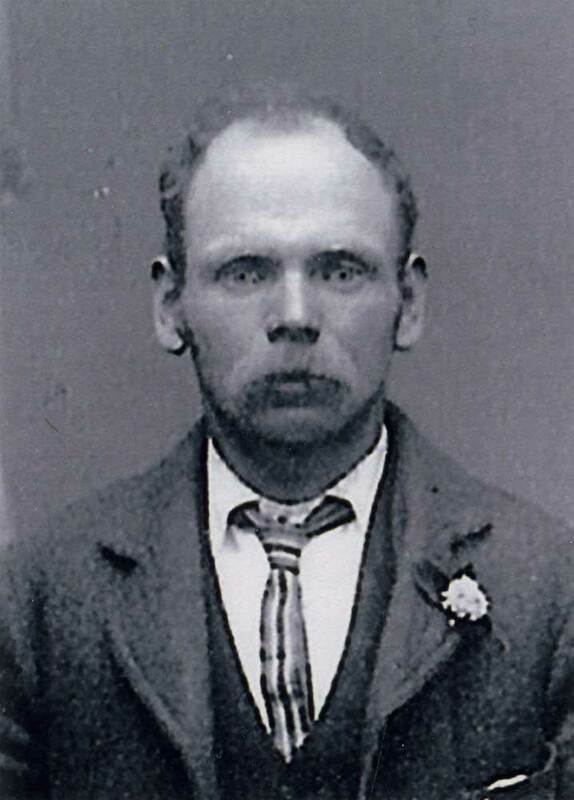 An 'unidentified' portrait that has been tentatively identified as that of Trooper Walter Patrick Boddye. 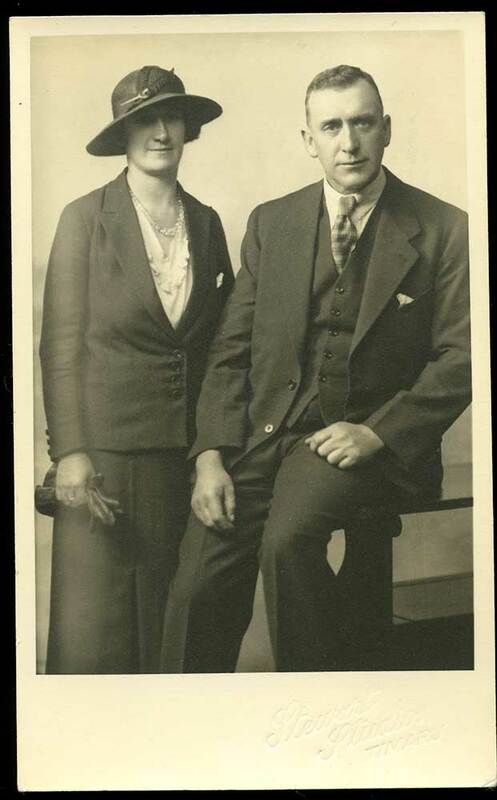 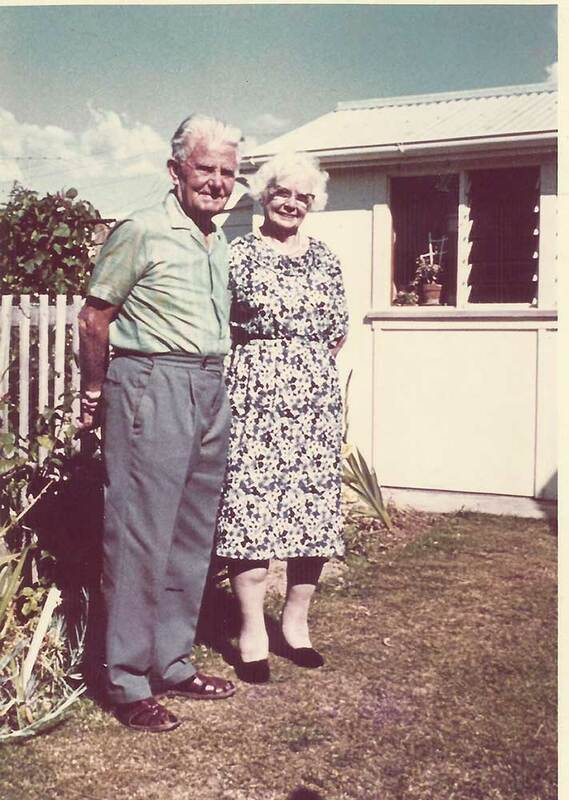 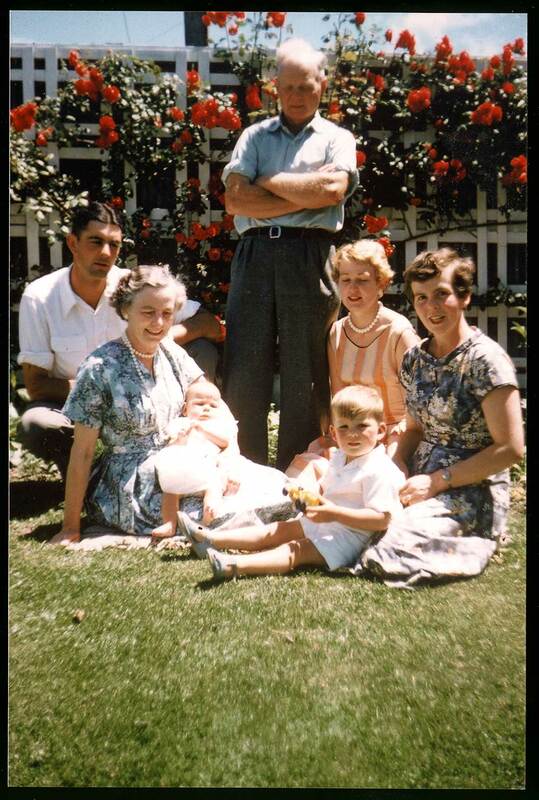 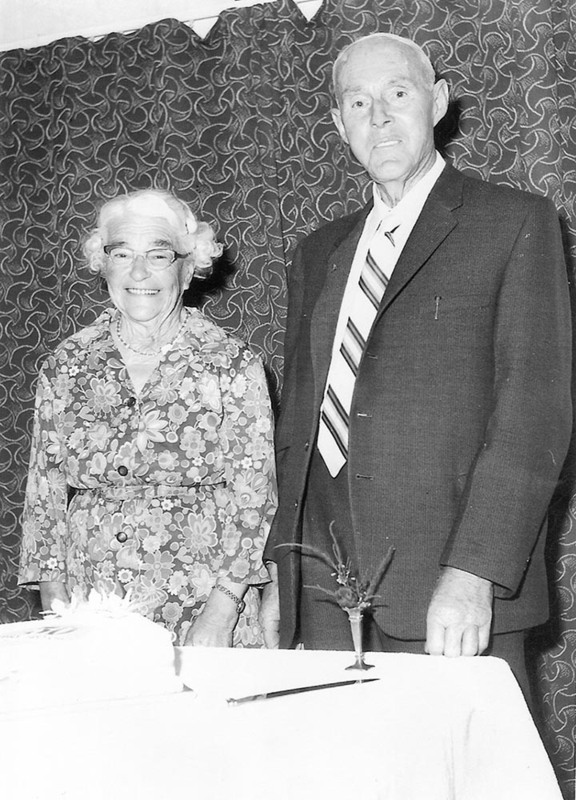 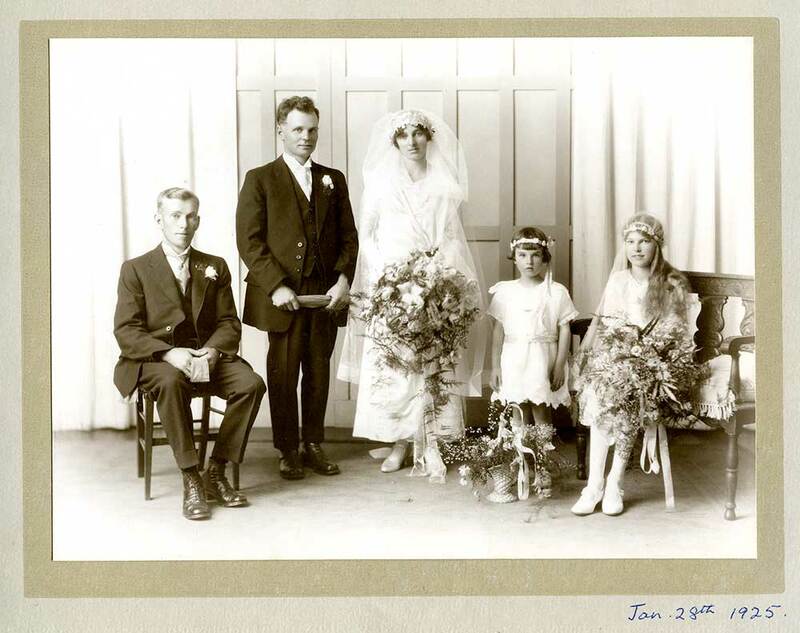 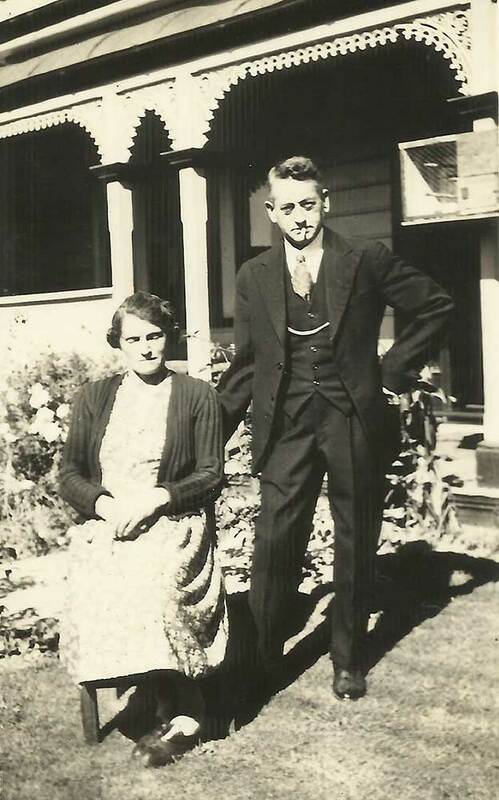 The portrait was owned by the family of Michael and Mary Ann O'Reilly of Albury. 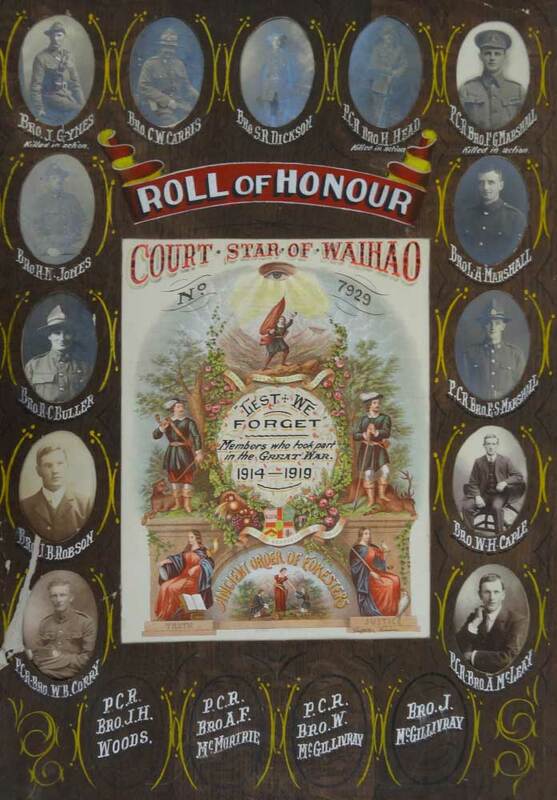 Roll of Honour Court Star of Waihao (No. 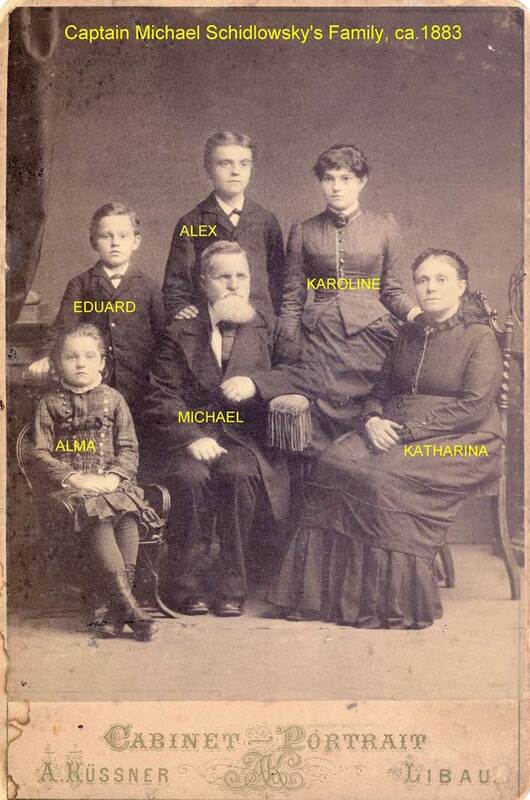 7929). 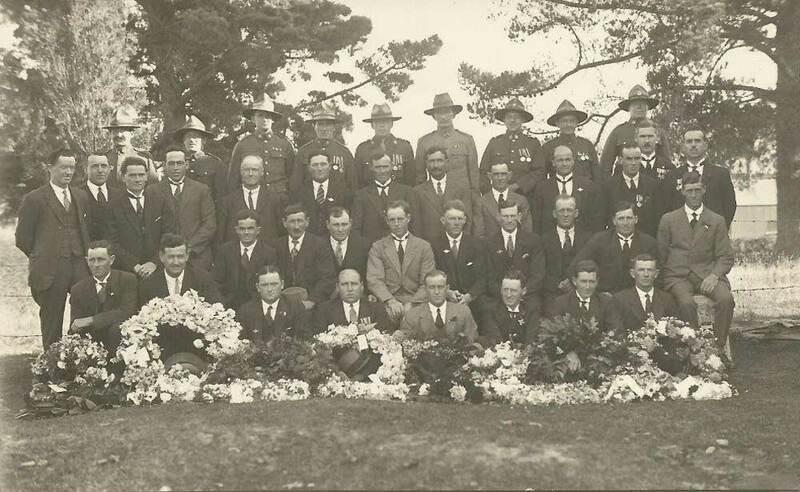 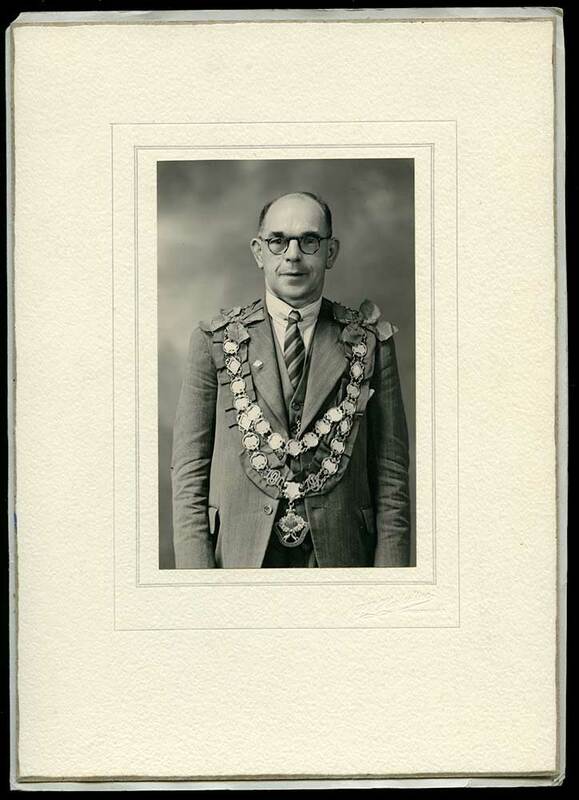 Ancient Order of Foresters. 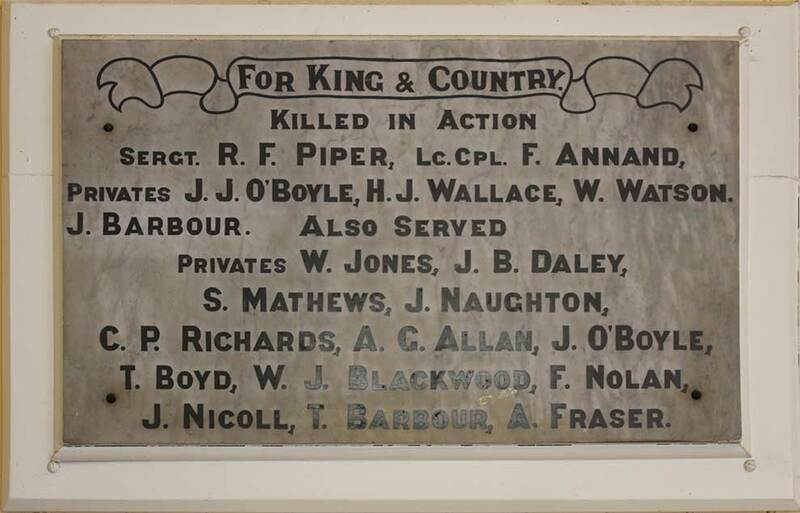 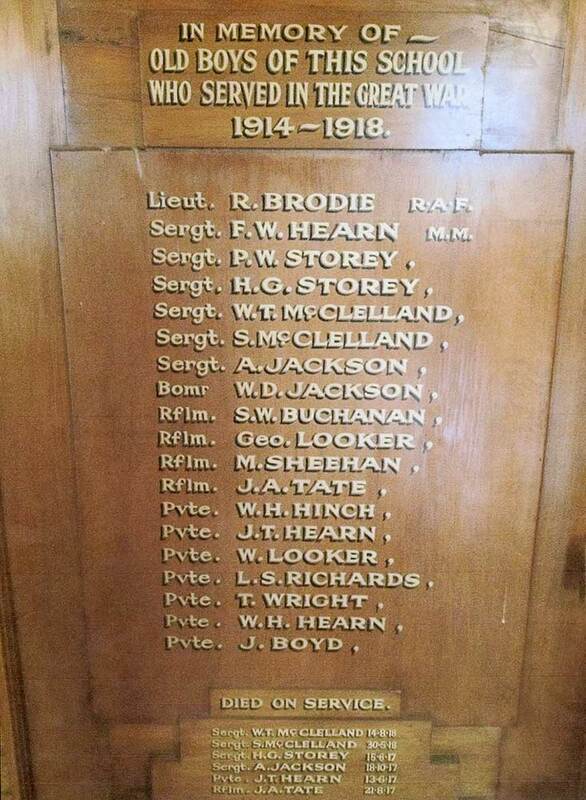 Members who took part in the Great War 1914-1919. 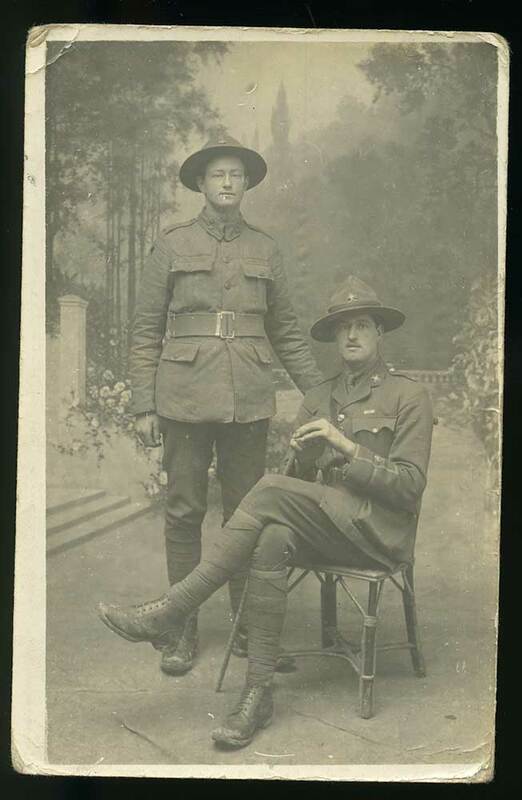 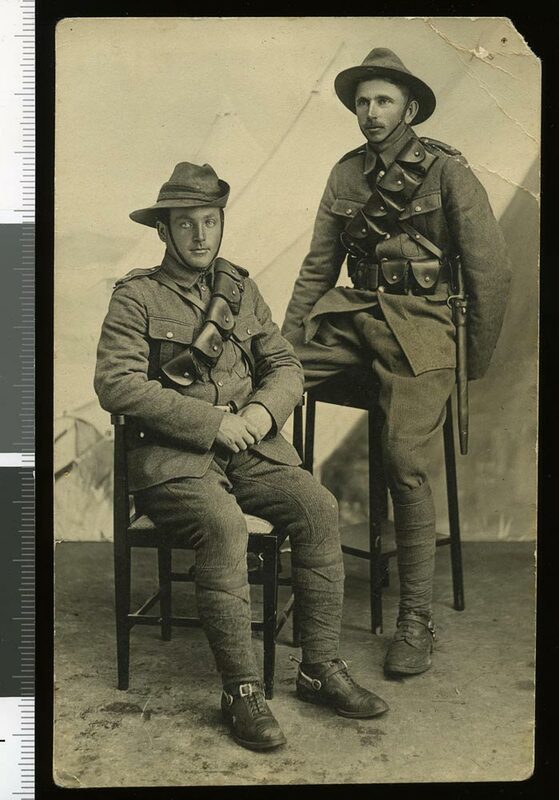 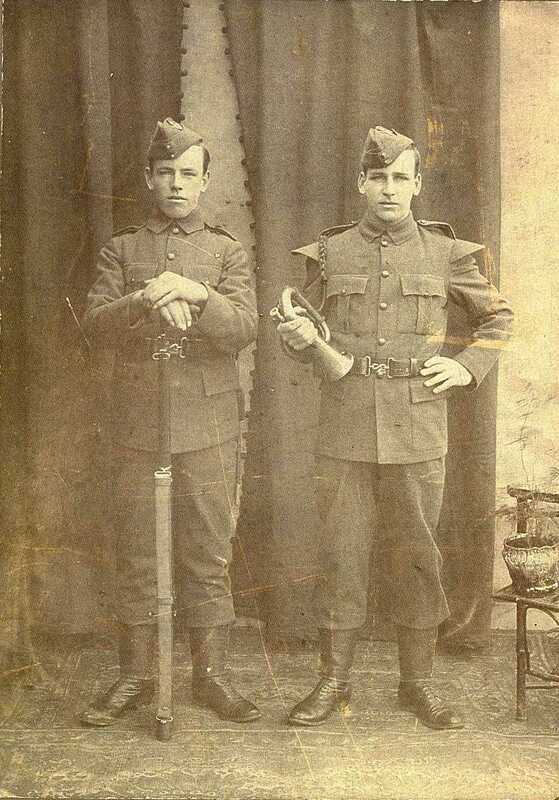 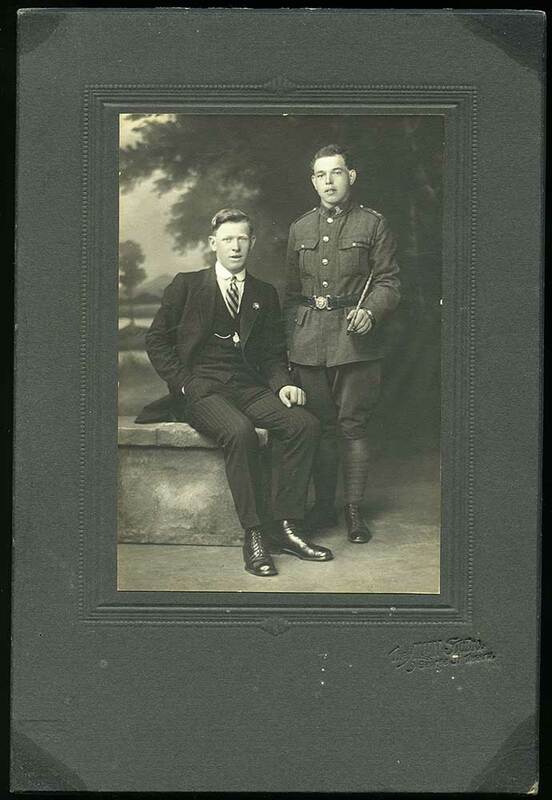 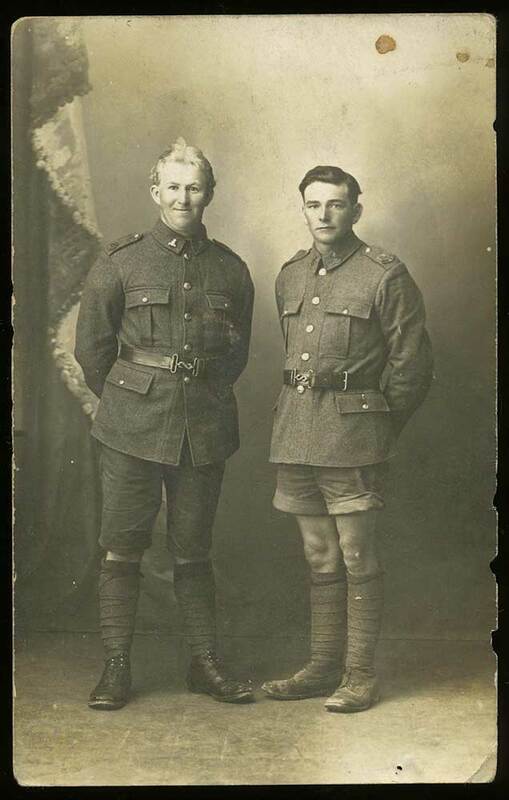 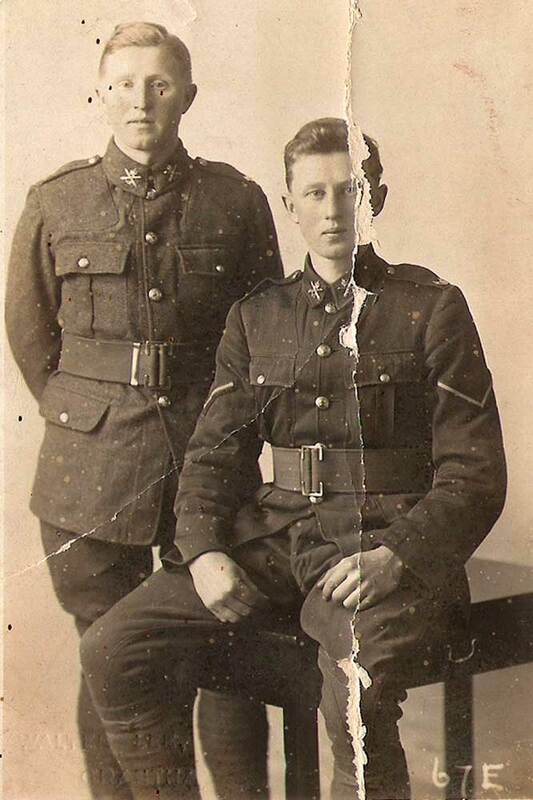 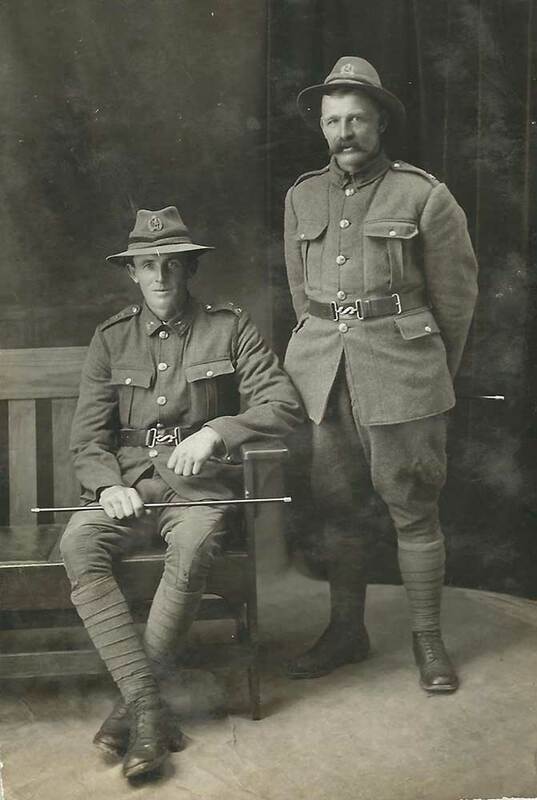 John Alexander Douglas Iverach (left) and Archibald Shaw (right), posed in uniform, in February or March 1917. 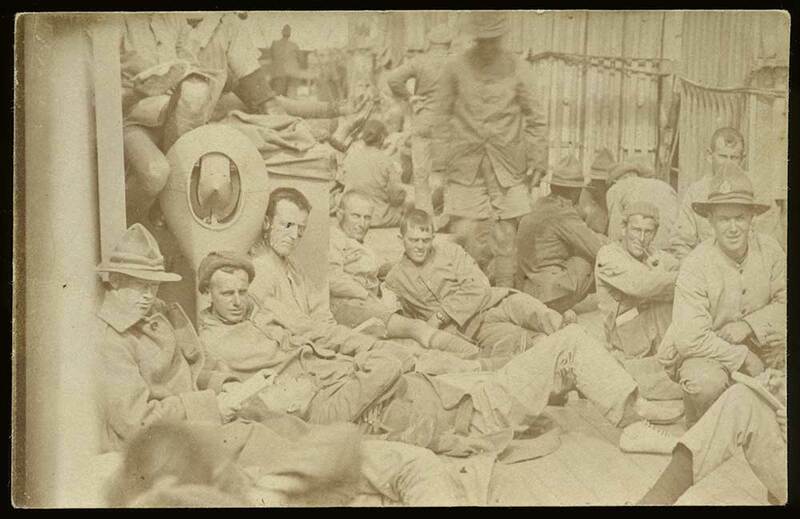 Presumably the group are pictured encamped, perhaps awaiting discharge. 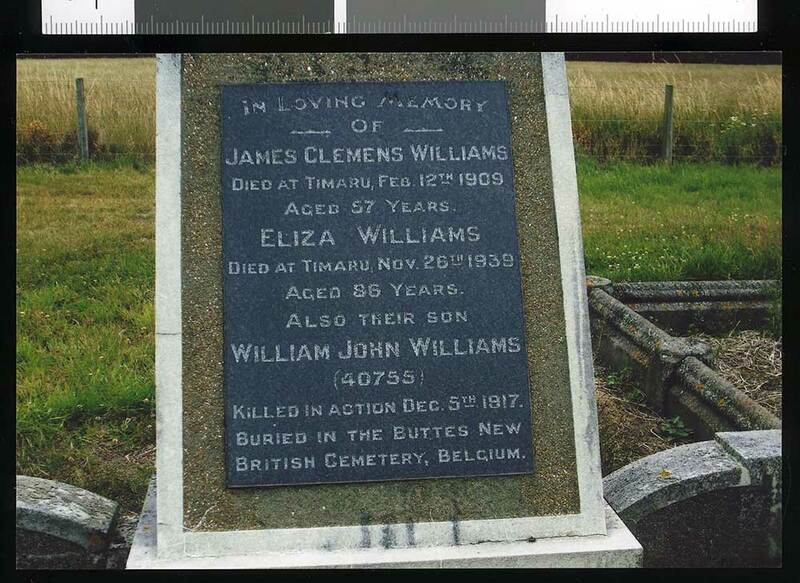 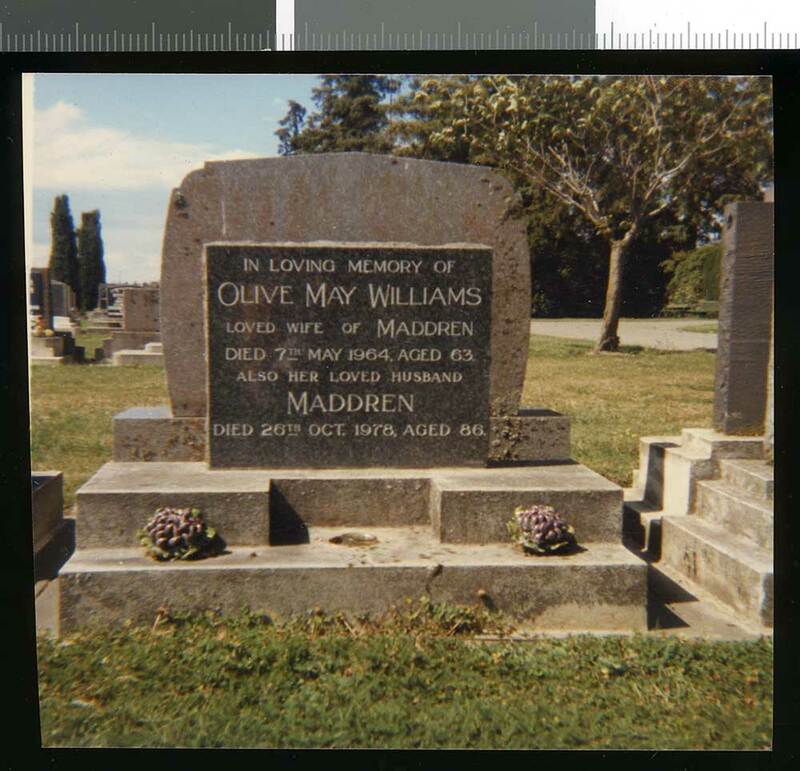 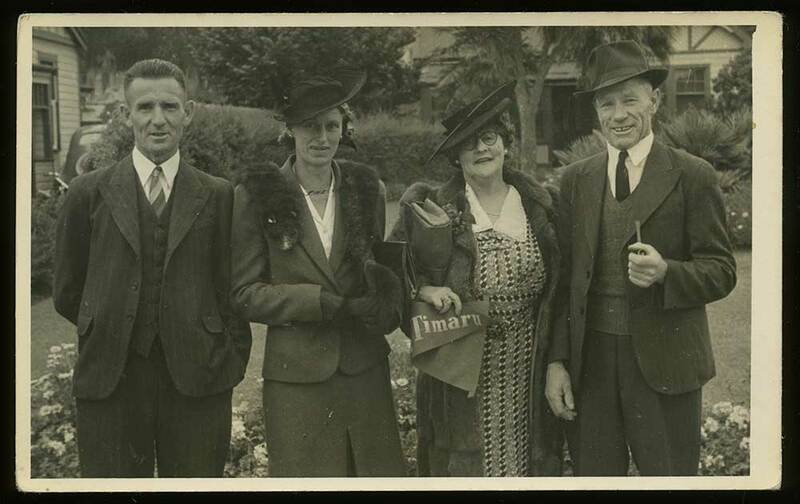 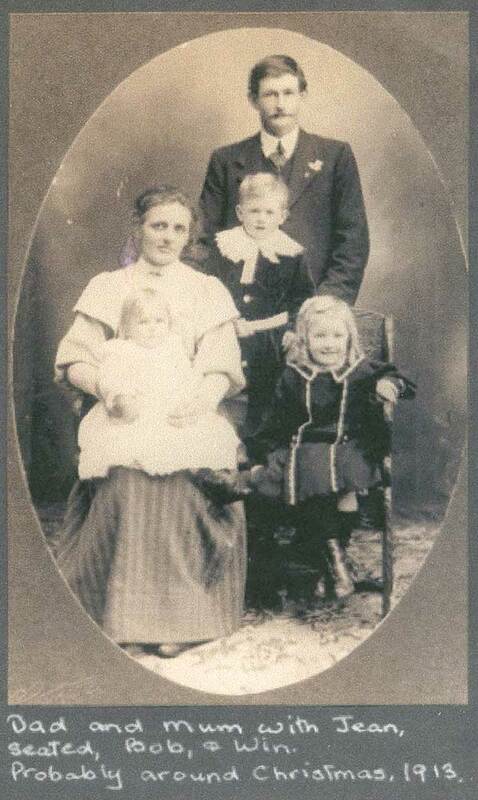 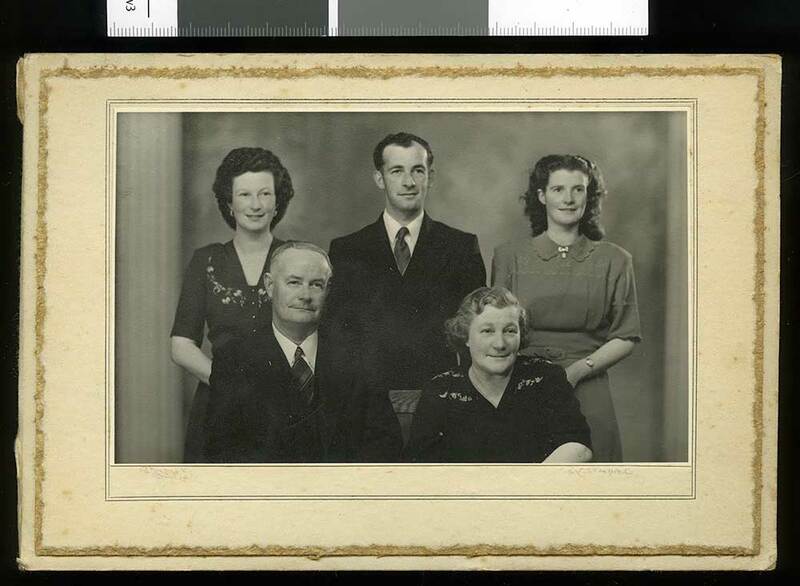 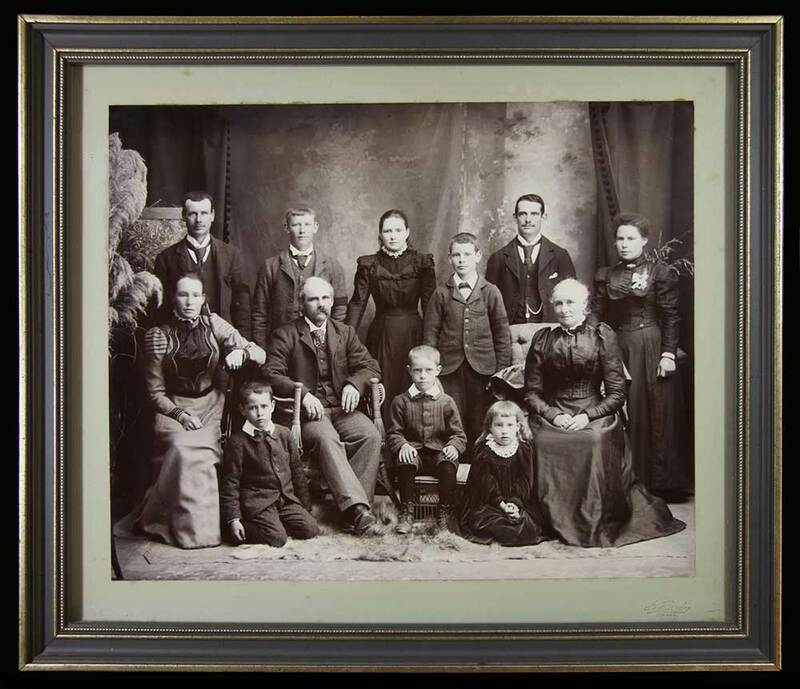 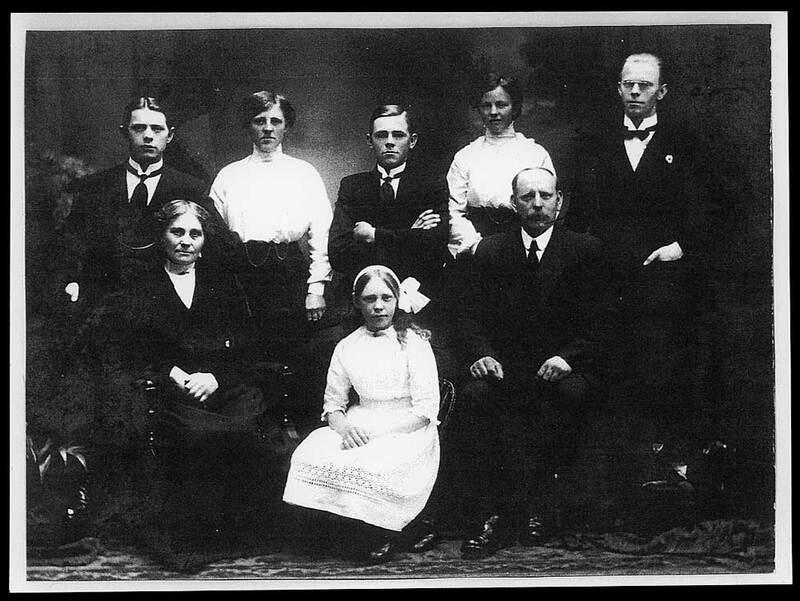 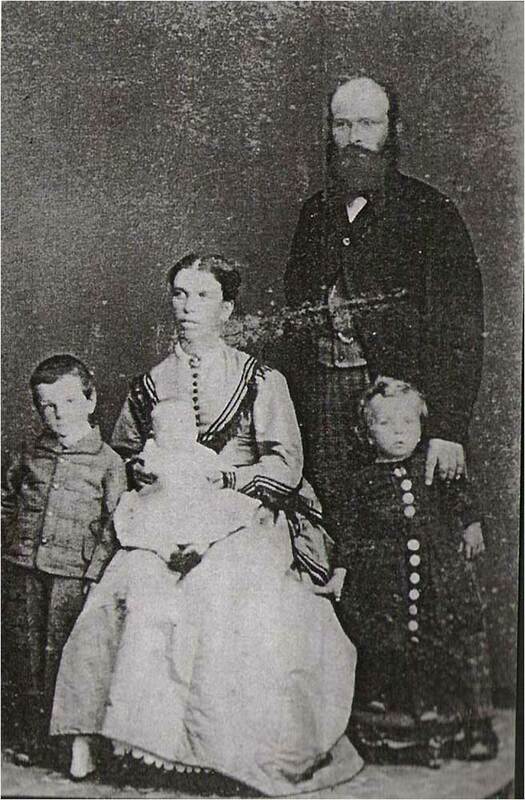 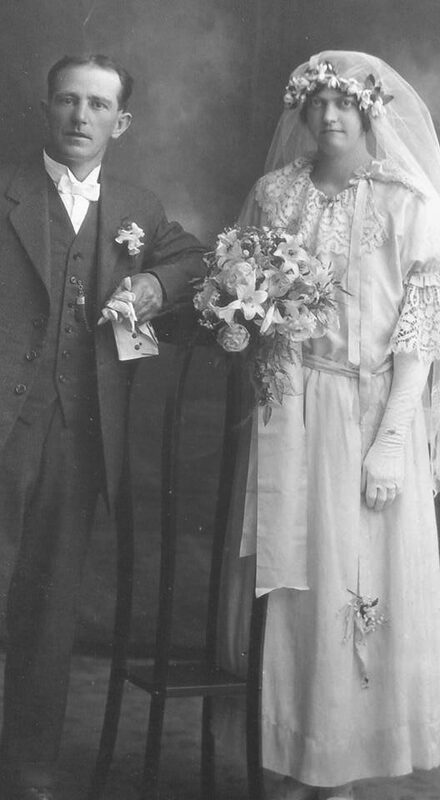 The family of Hannah & Ellis Mills and children. 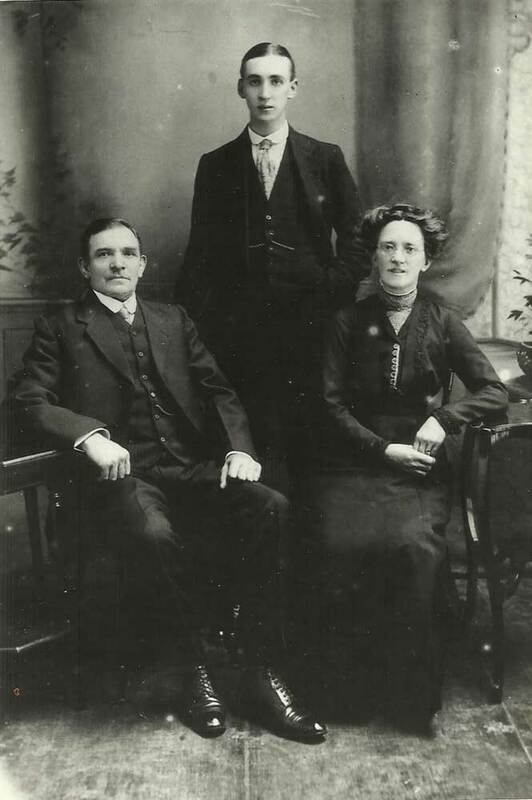 FRONT ROW: Hannah (mother), Violet, and Ellis (father). 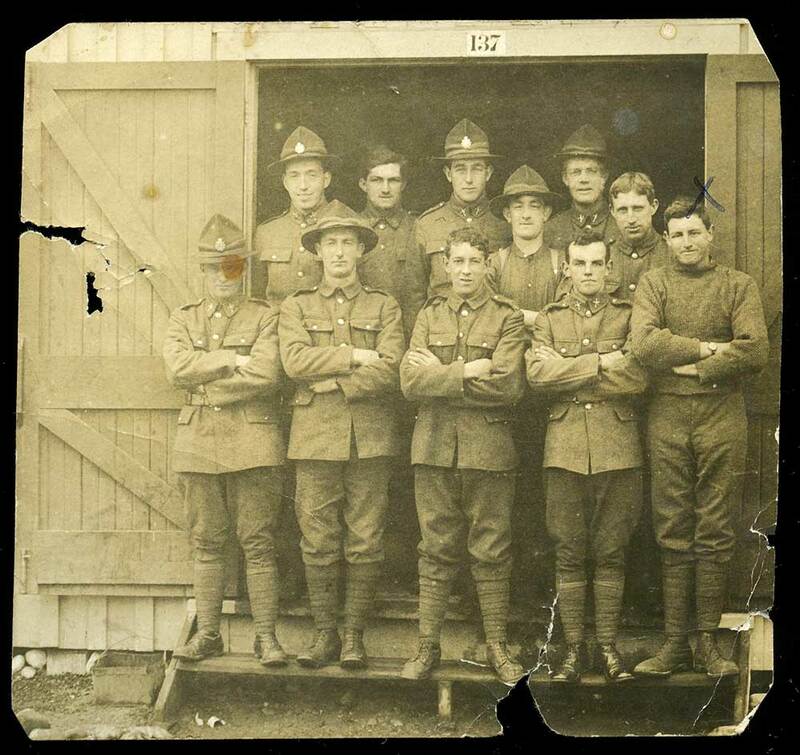 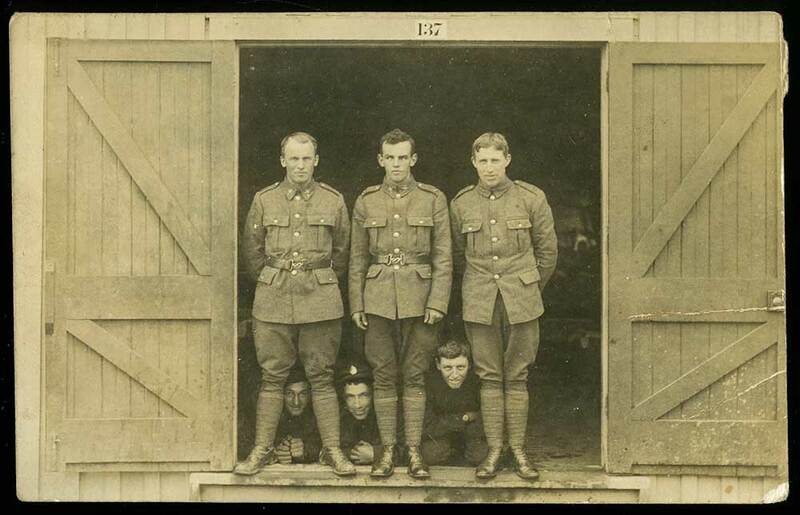 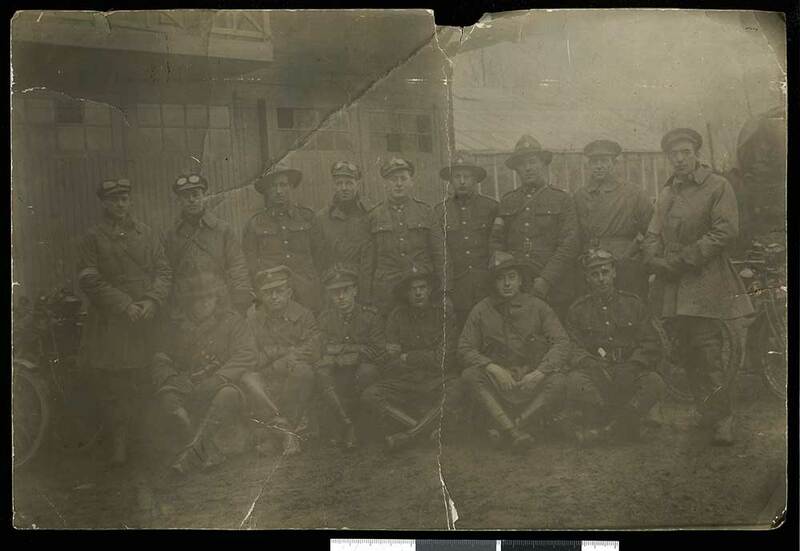 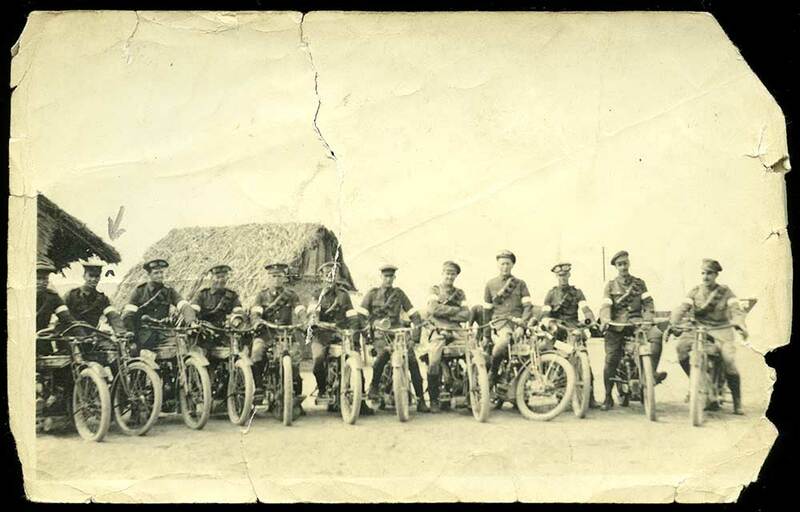 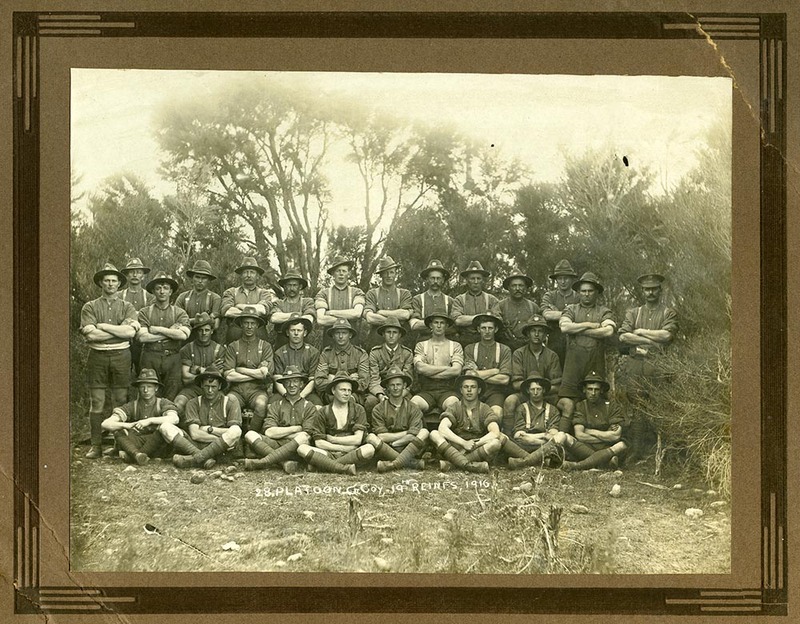 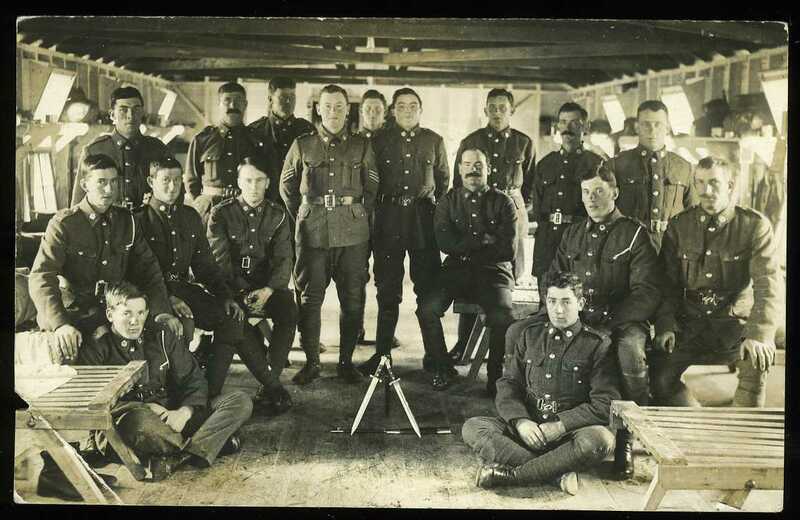 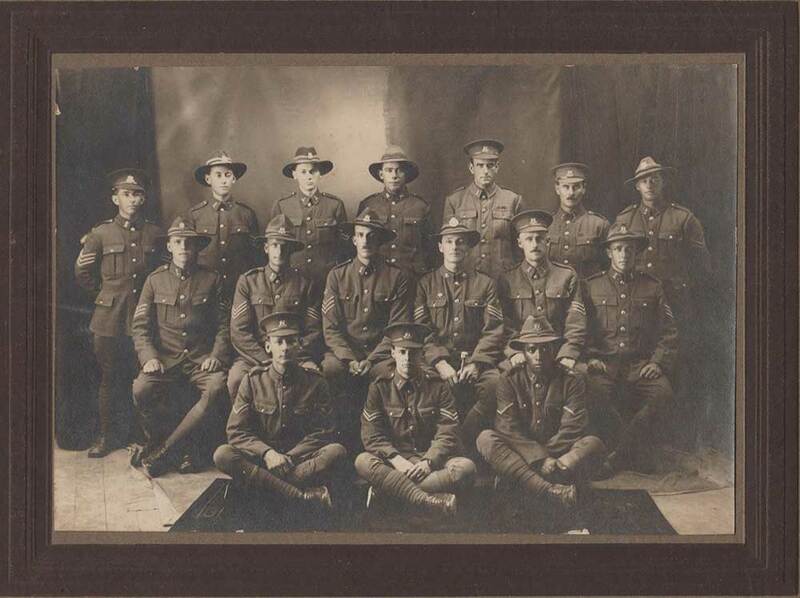 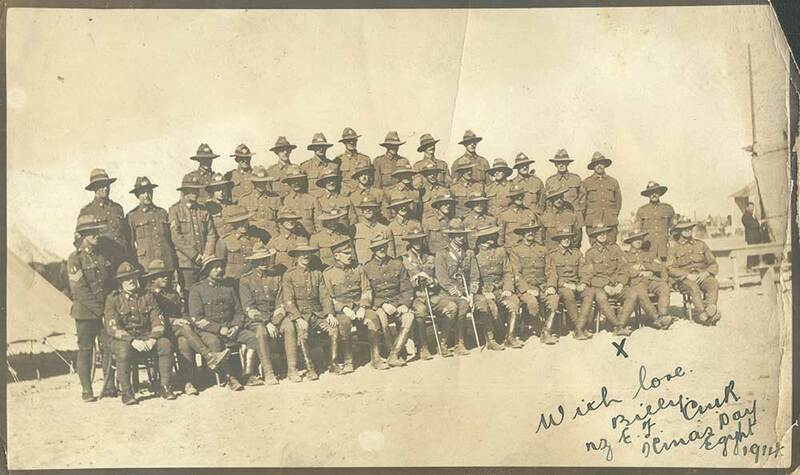 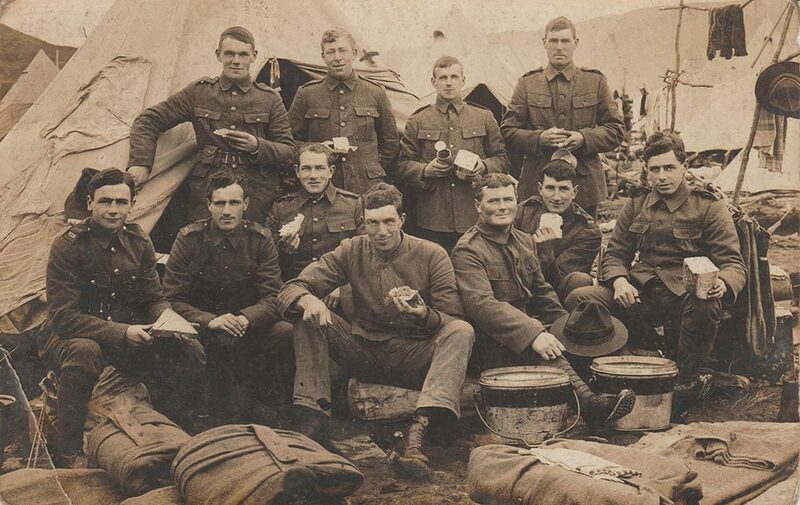 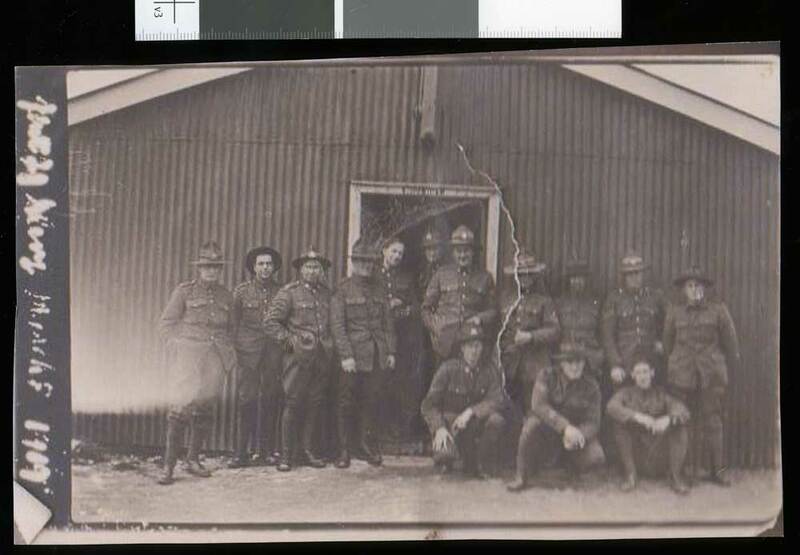 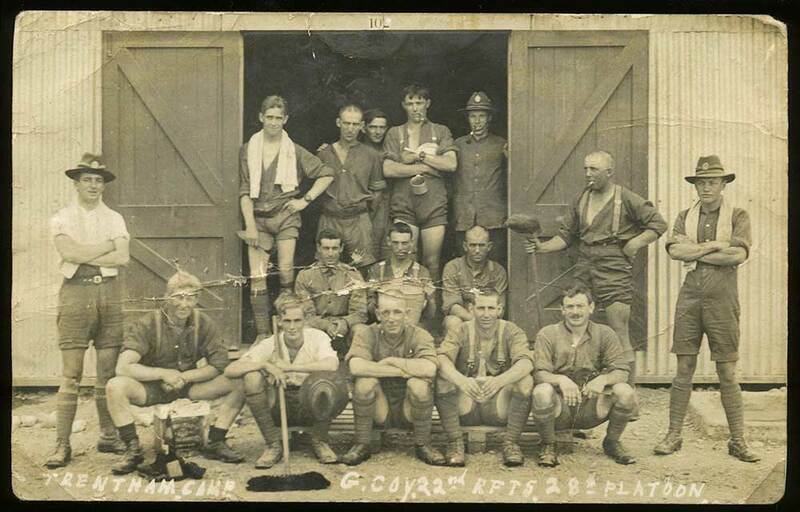 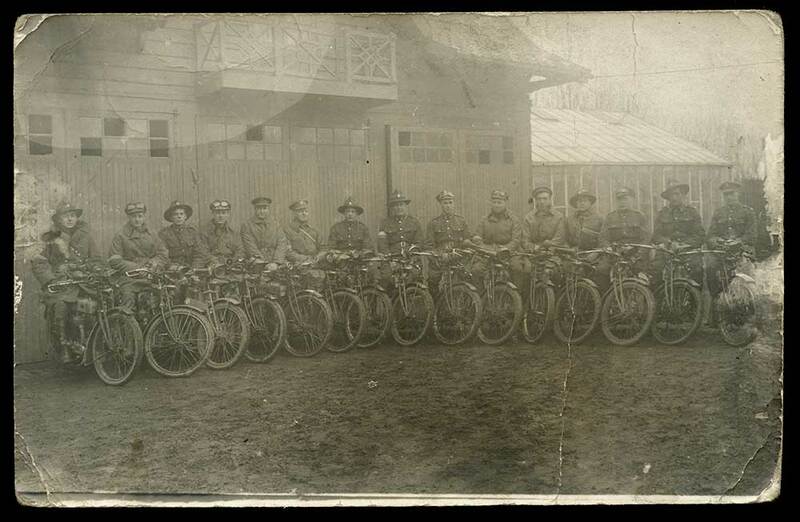 A group portrait postcard of soldiers, probably G Company of the 22nd Reinforcements, taken in Trentham Milititary Camp in 1916 or early 1917, before proceeding to their postings. 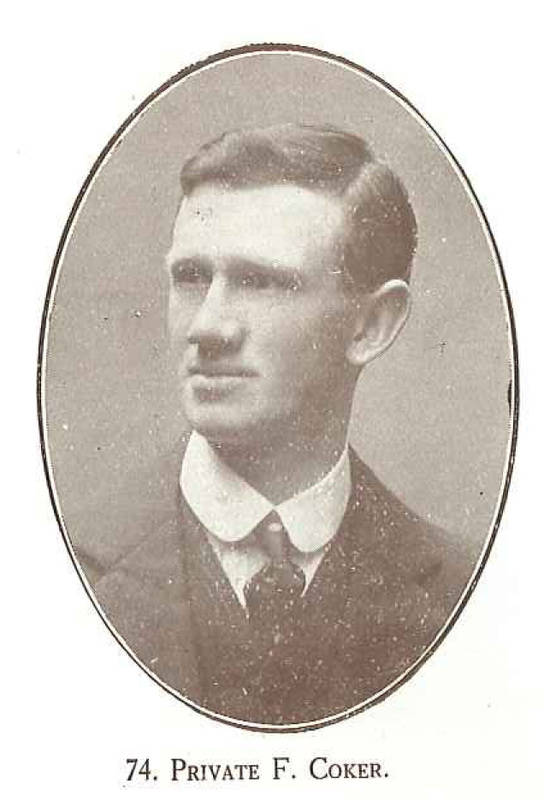 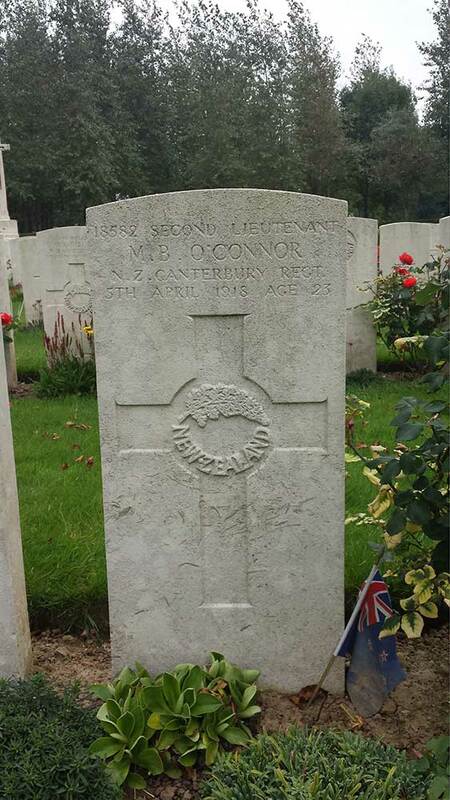 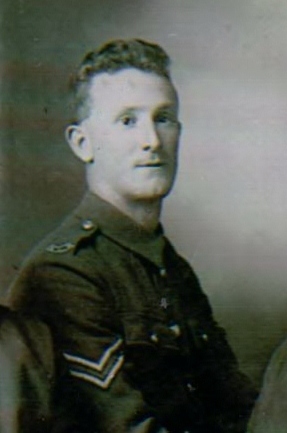 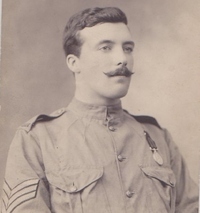 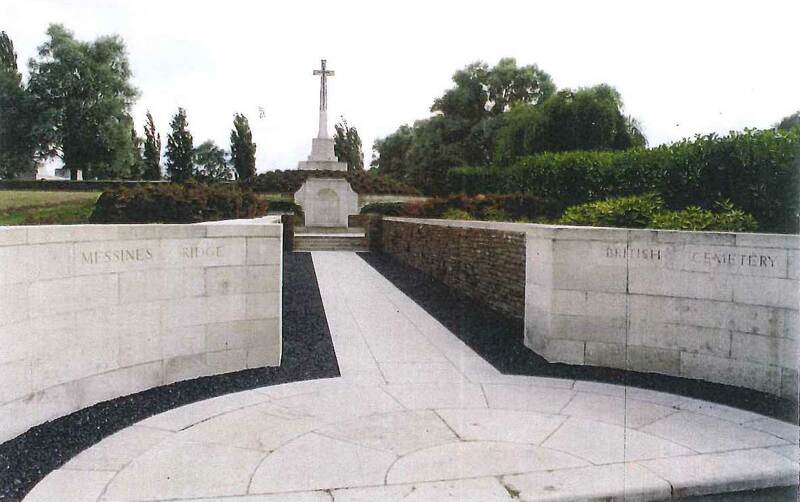 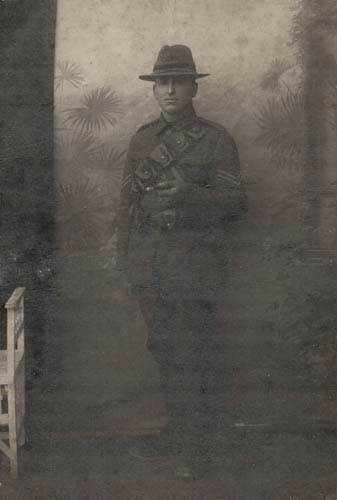 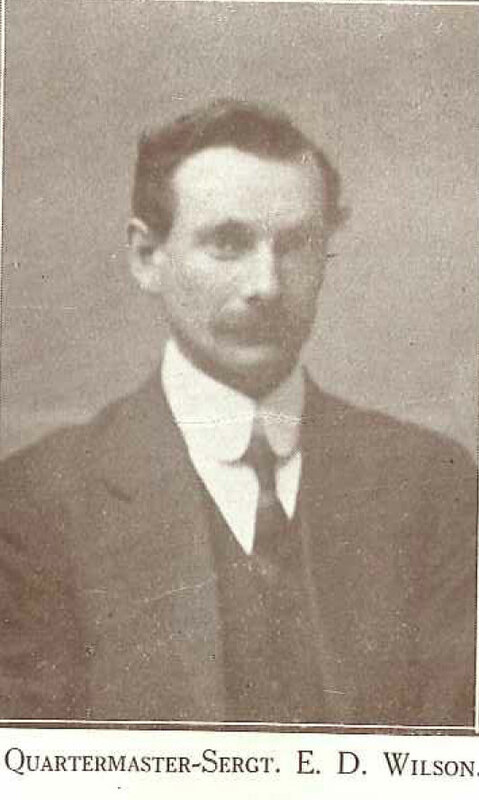 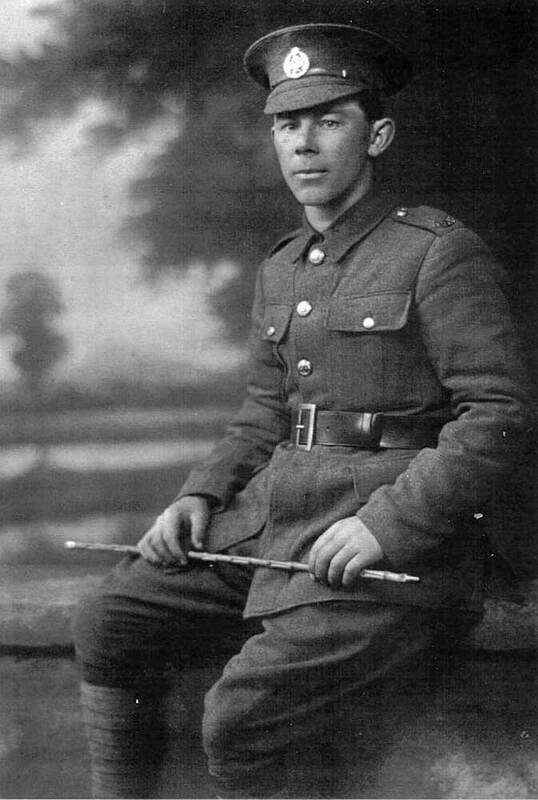 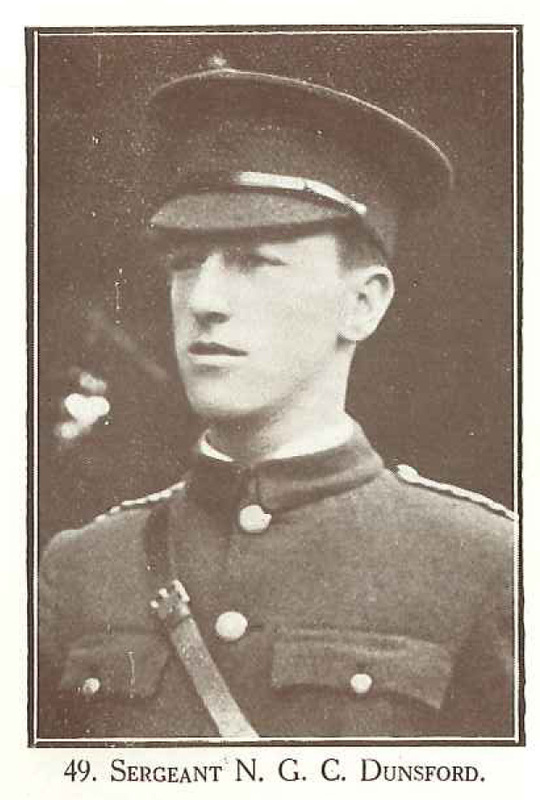 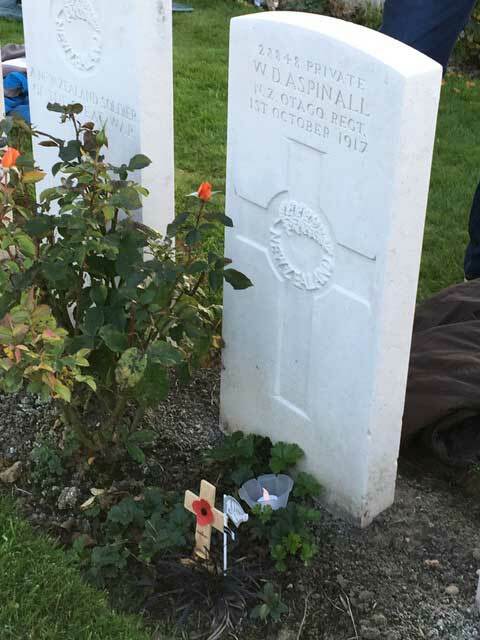 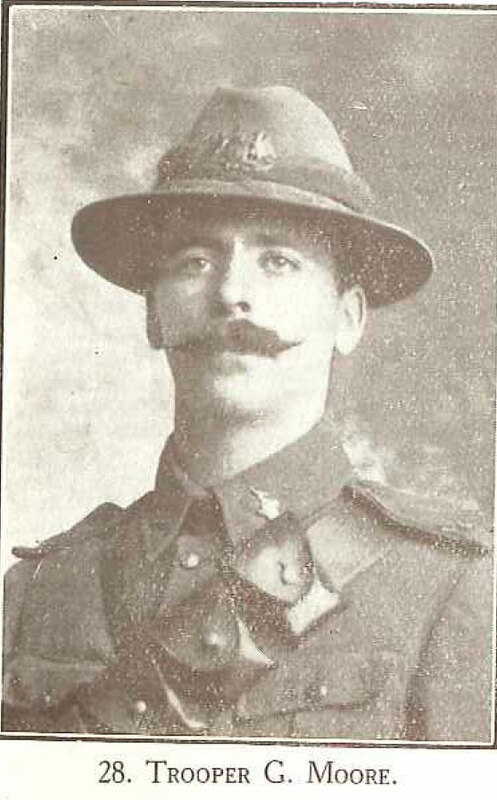 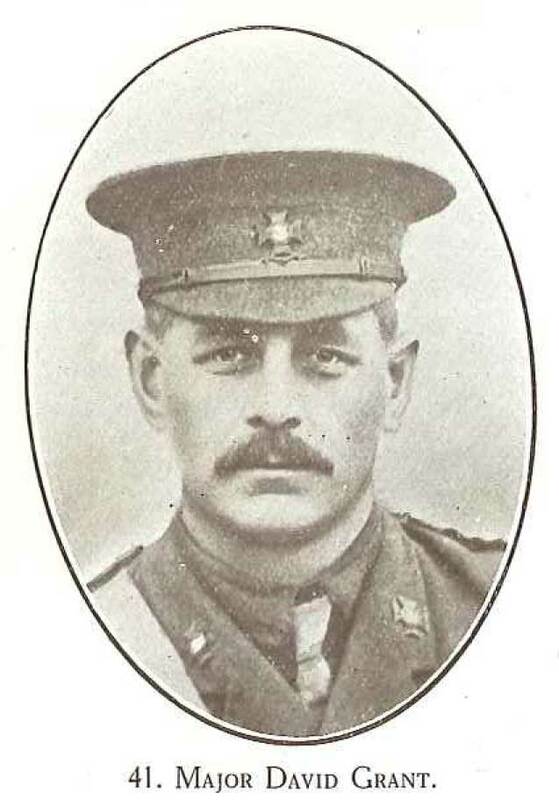 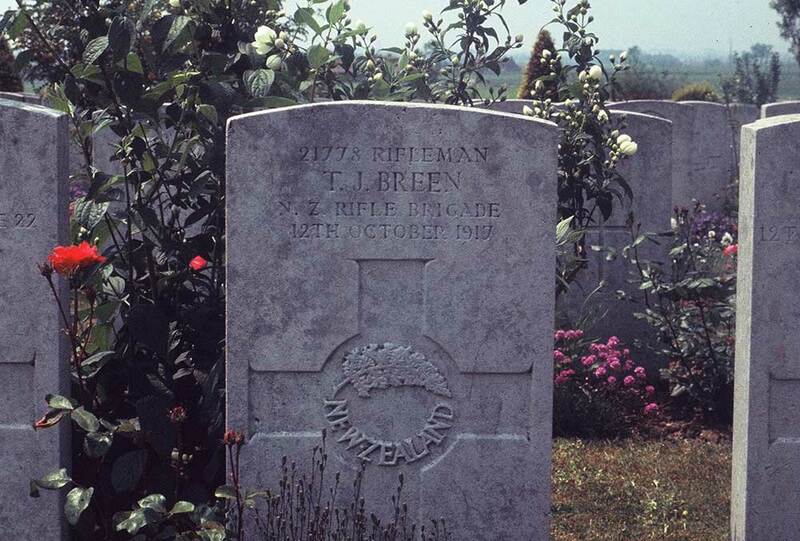 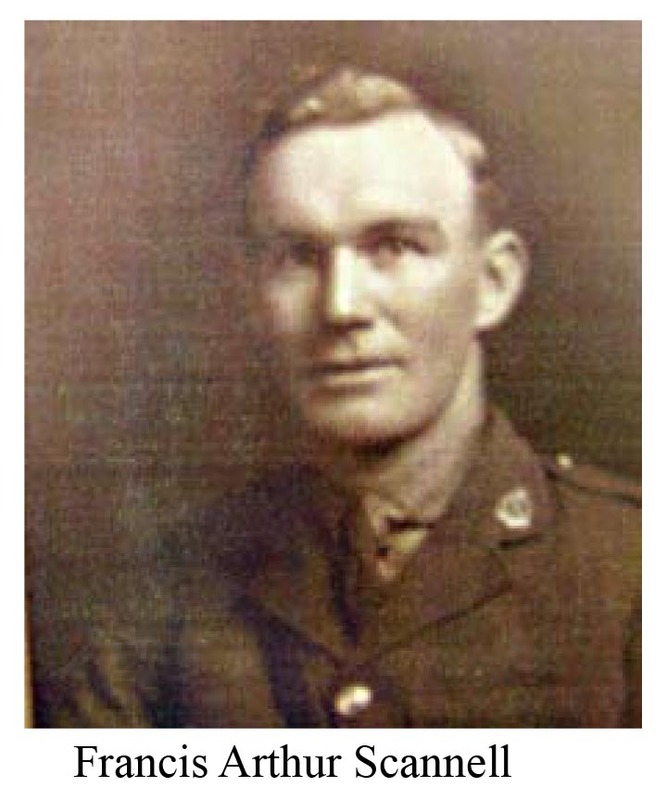 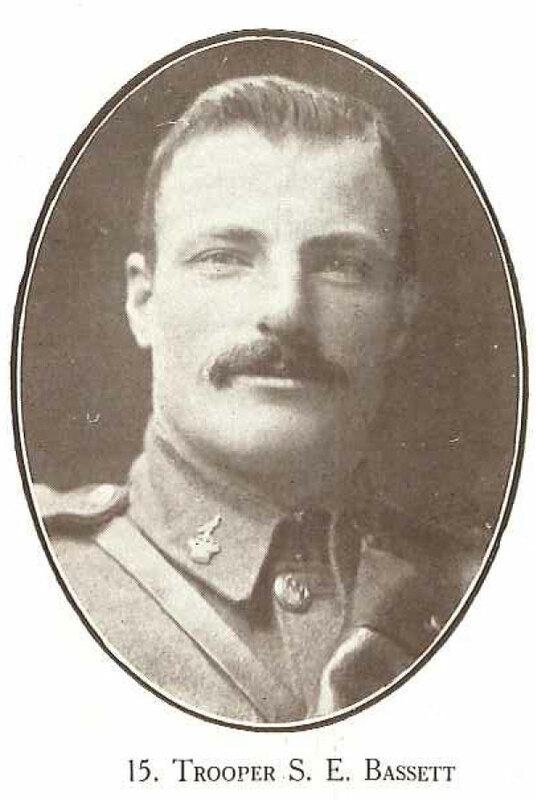 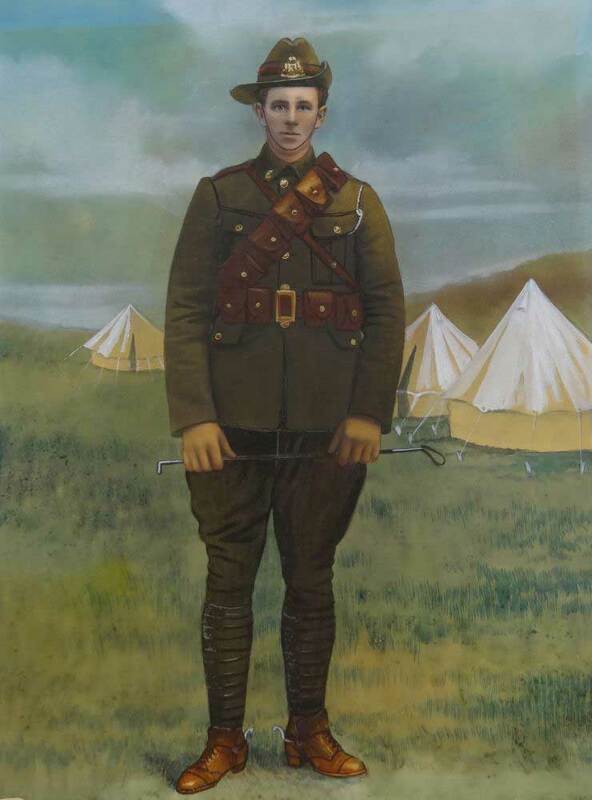 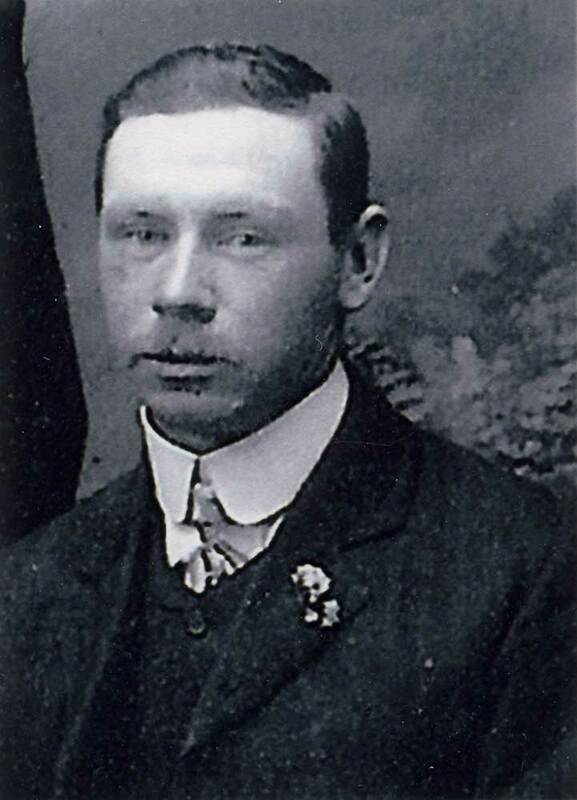 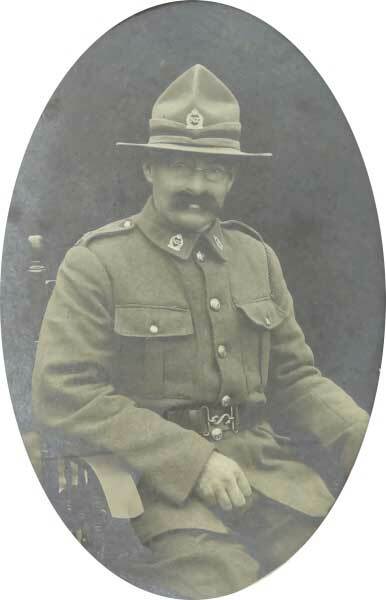 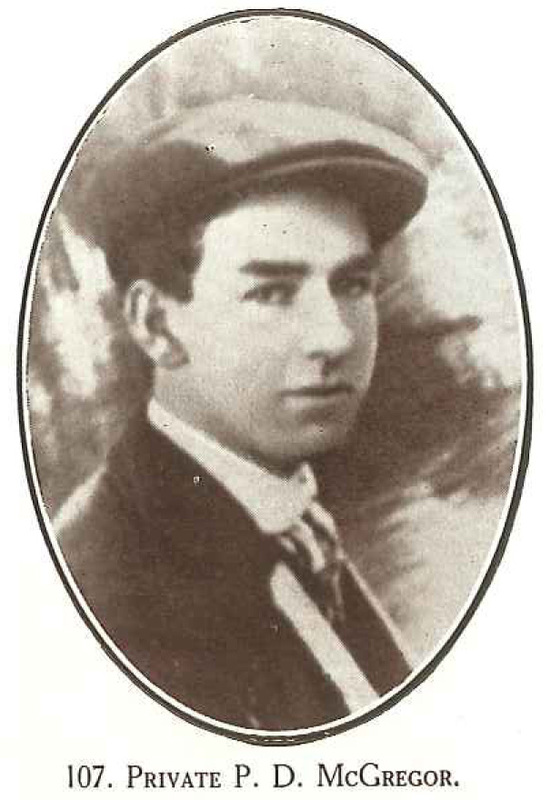 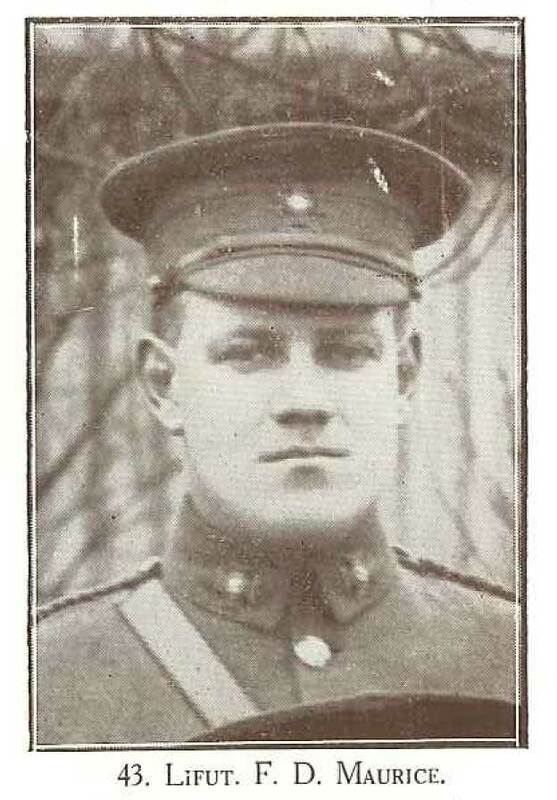 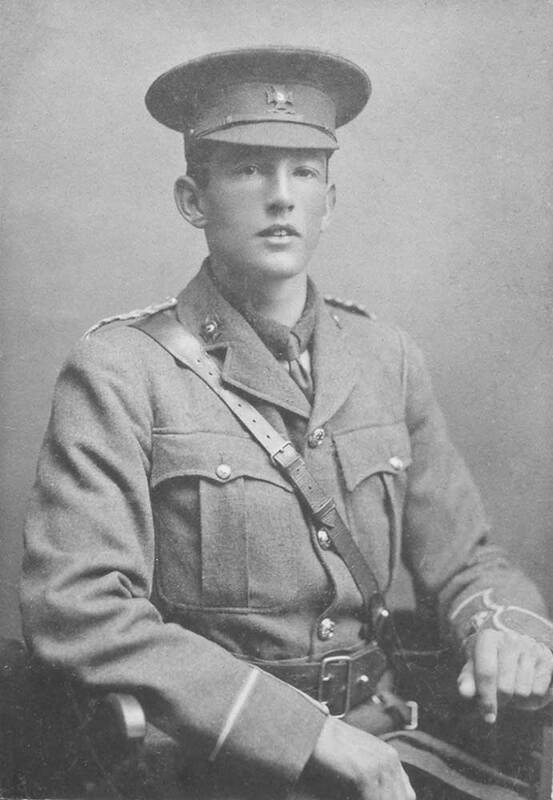 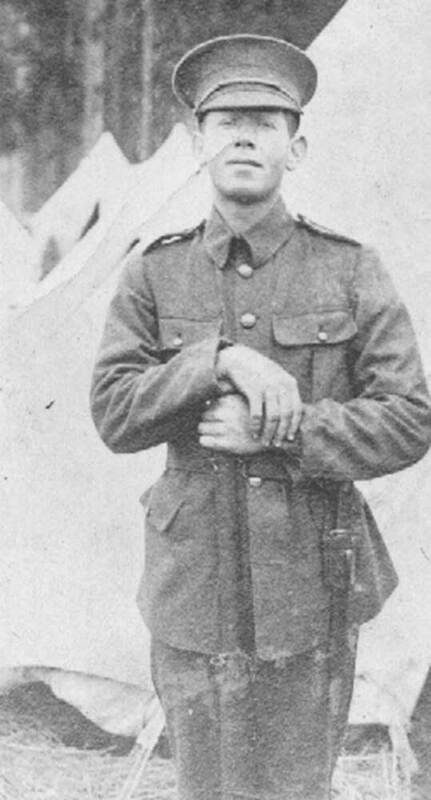 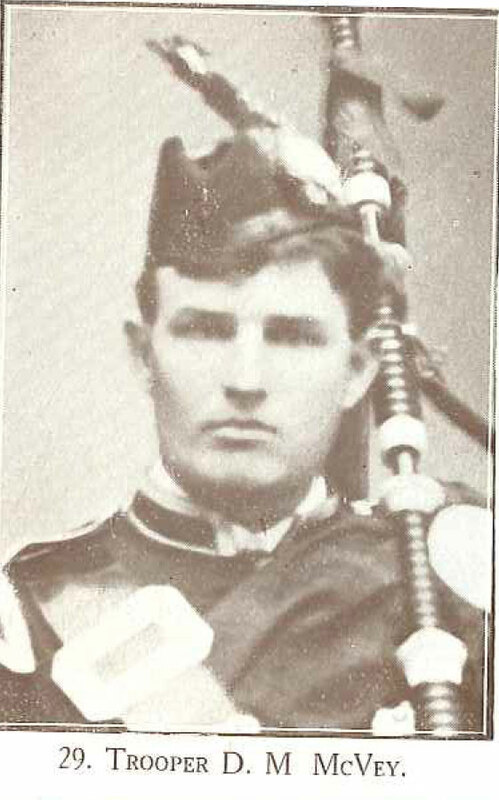 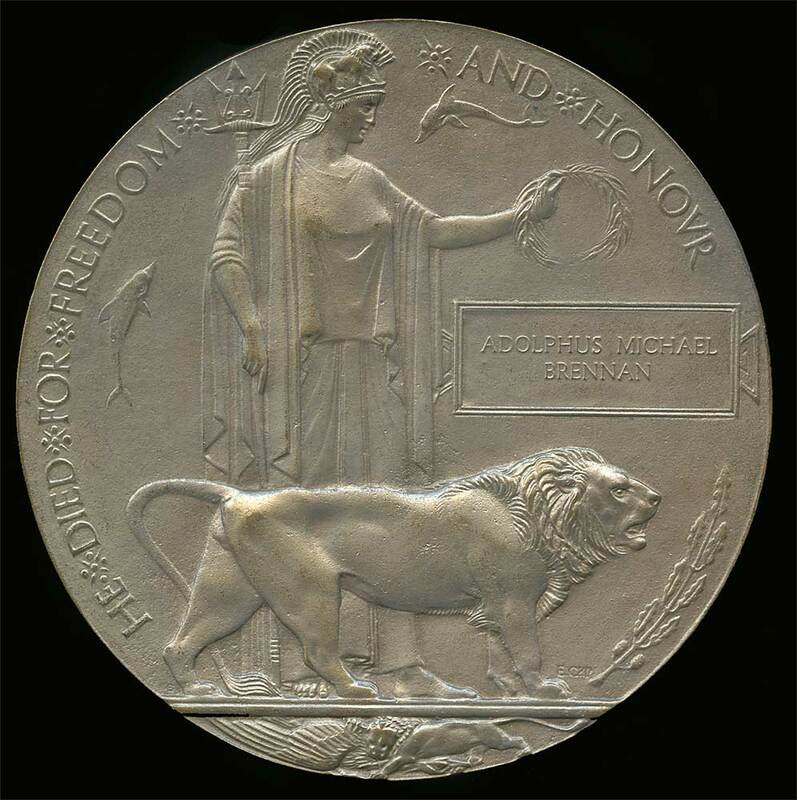 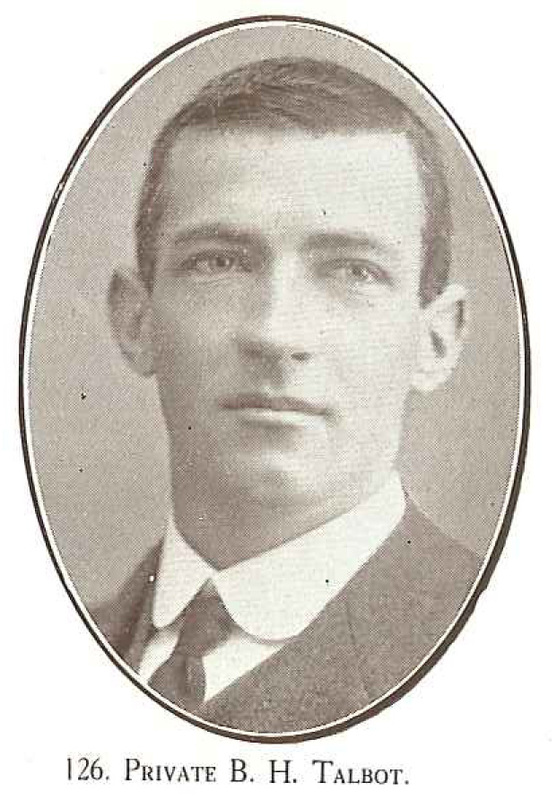 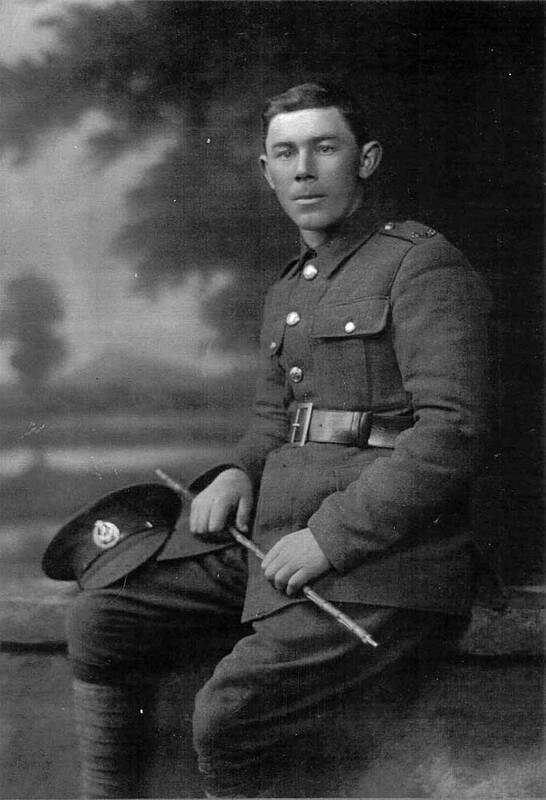 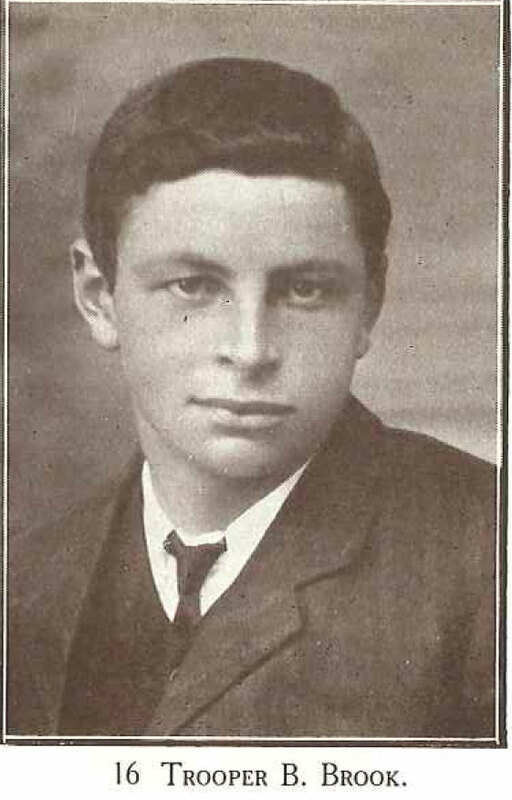 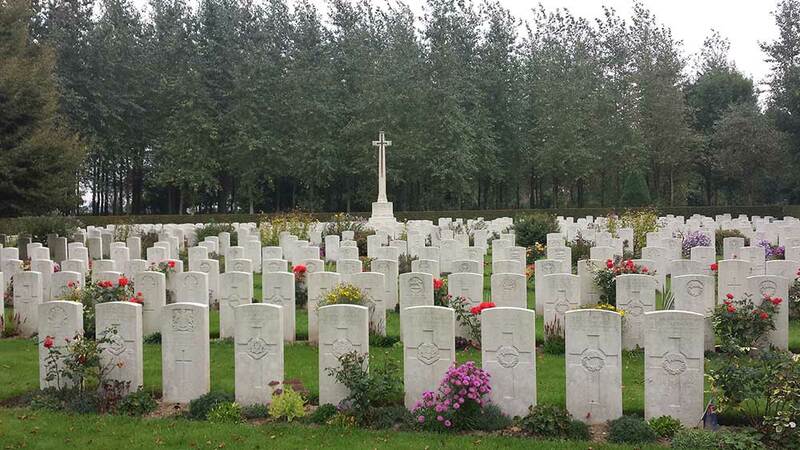 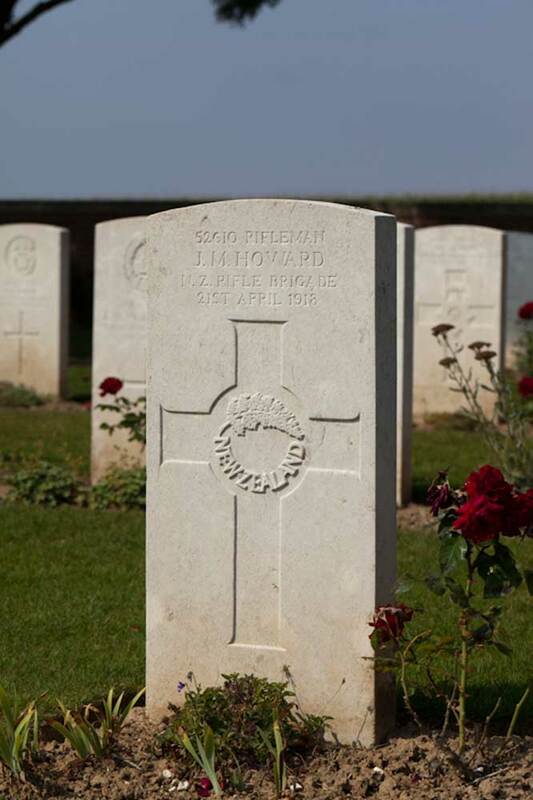 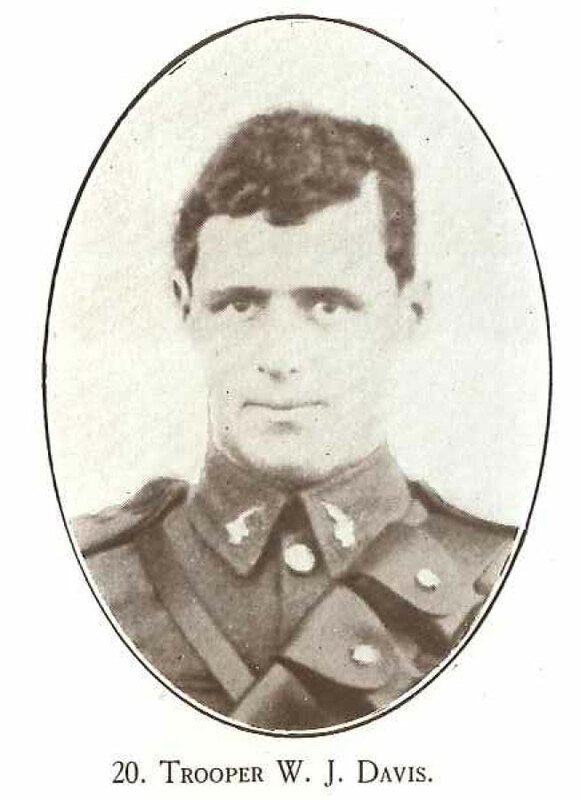 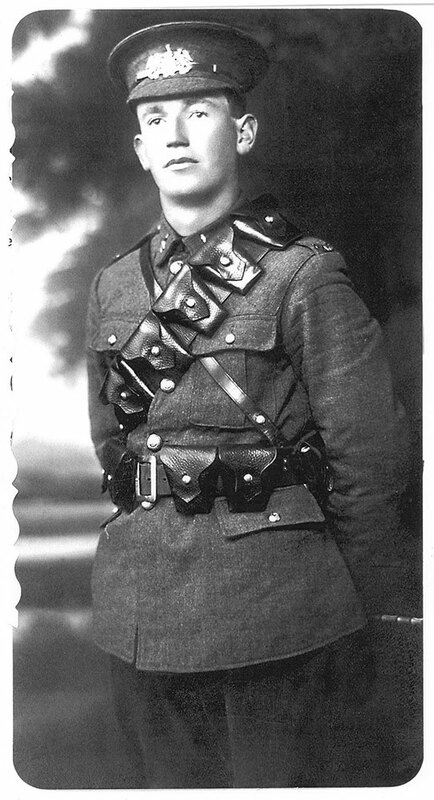 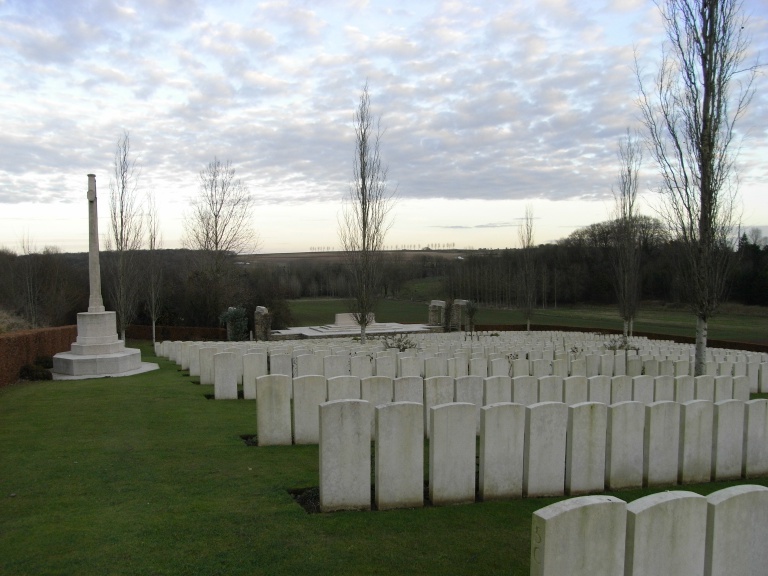 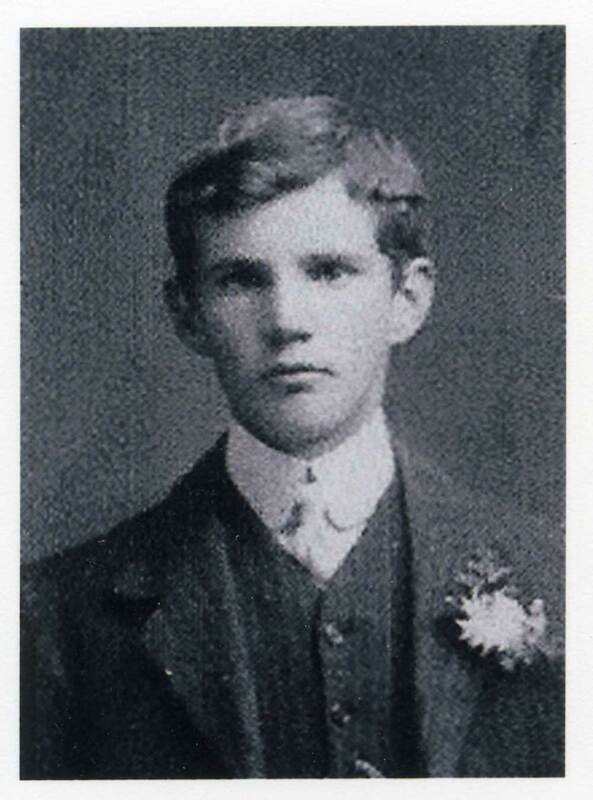 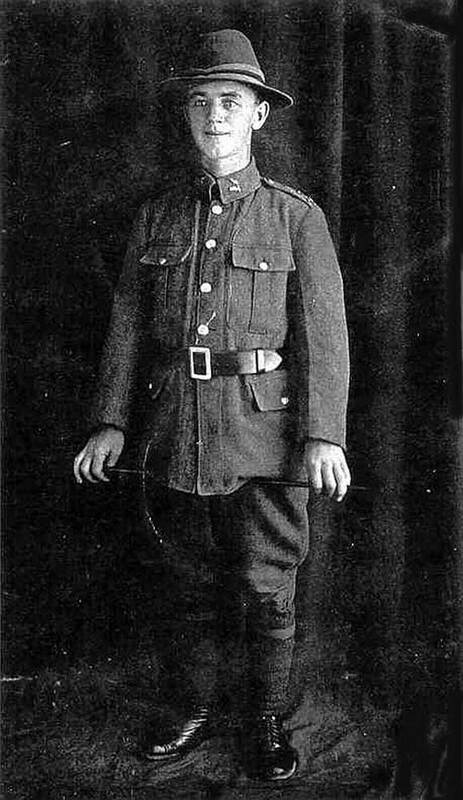 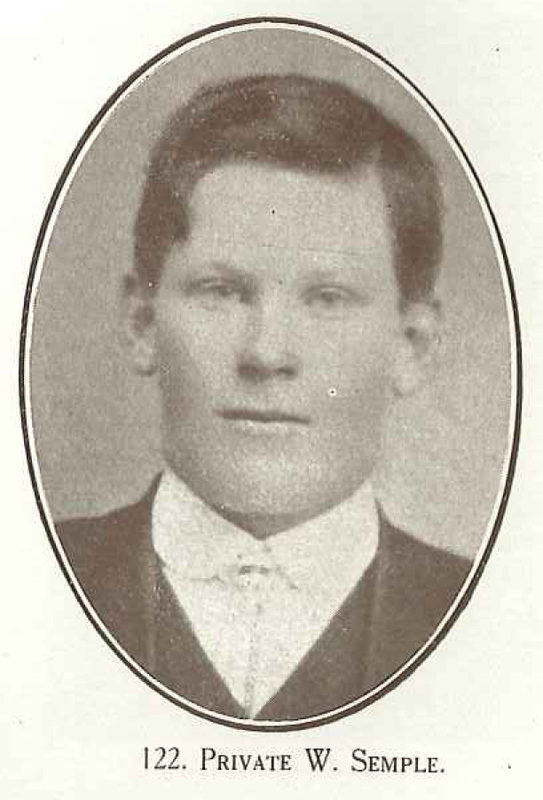 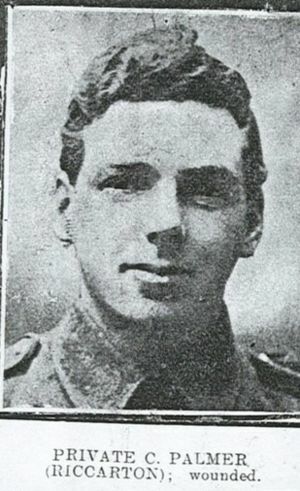 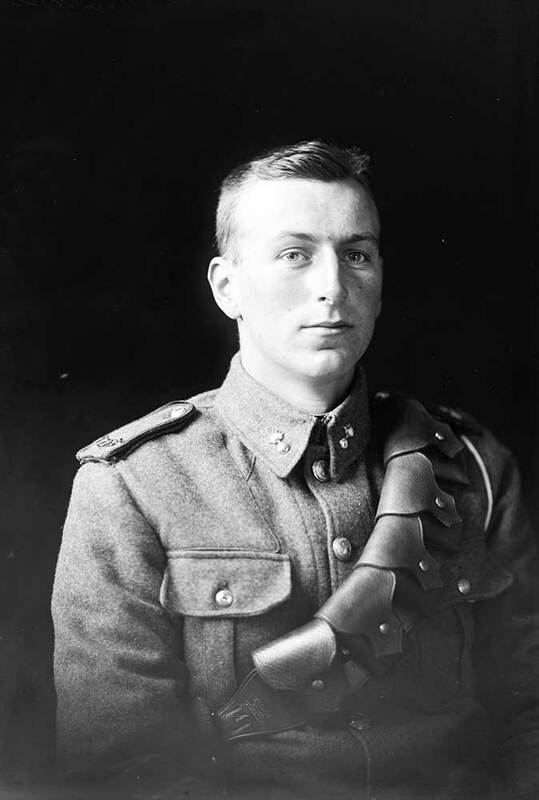 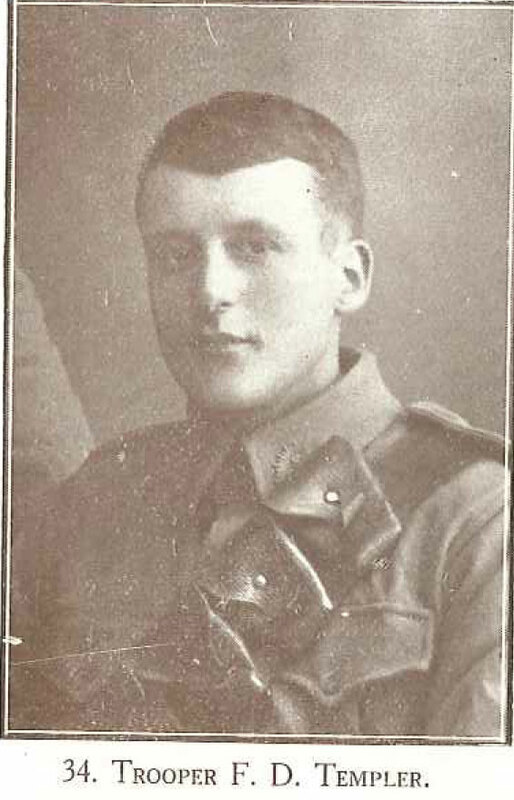 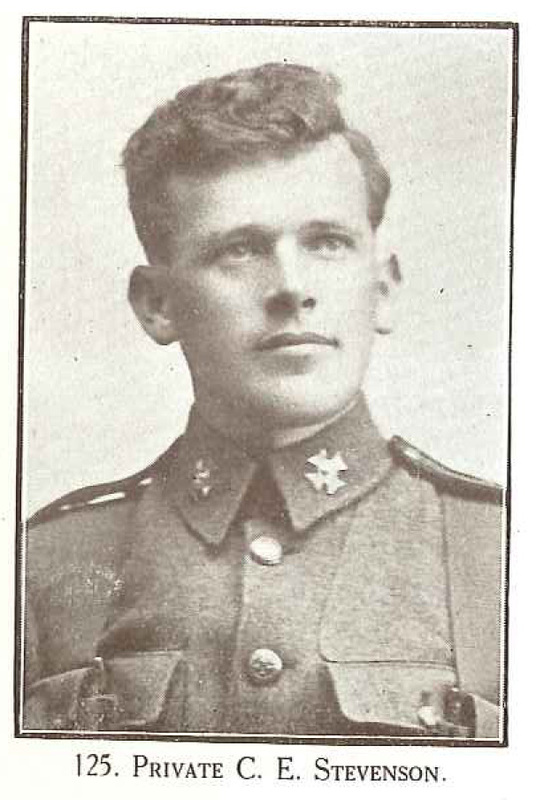 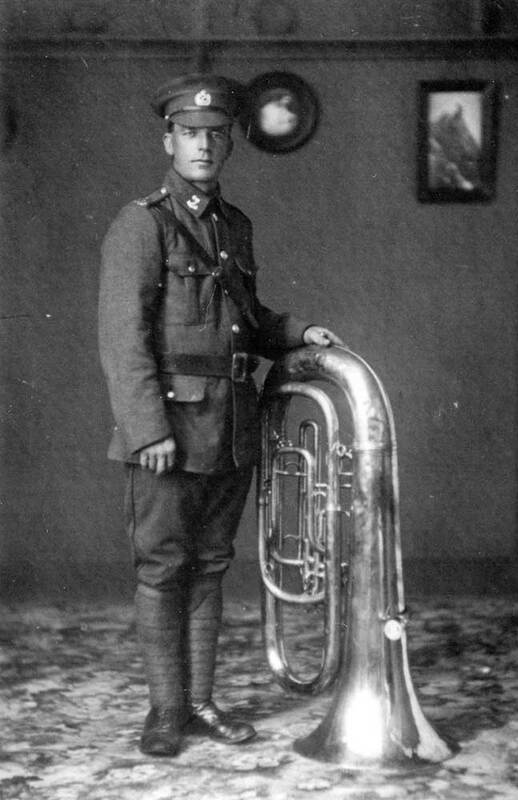 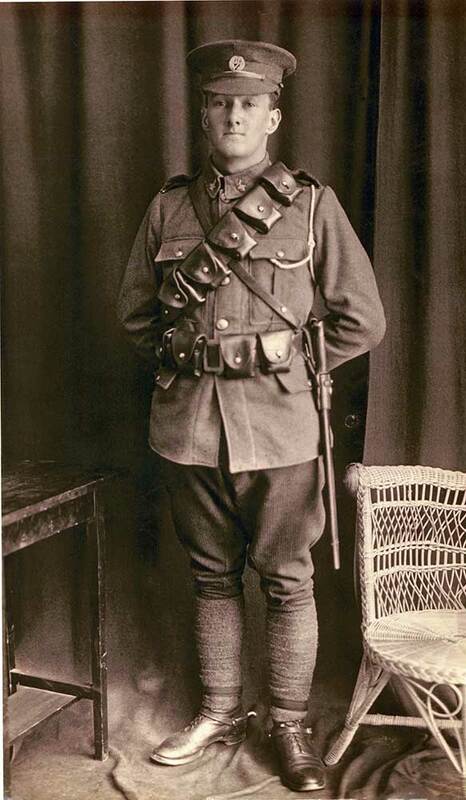 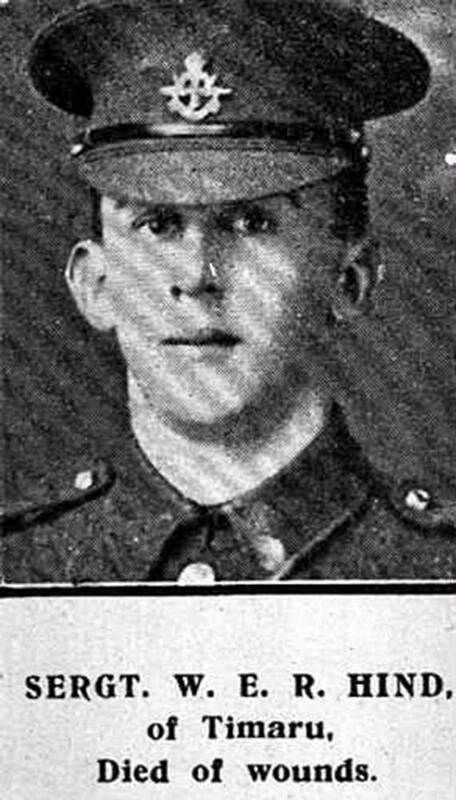 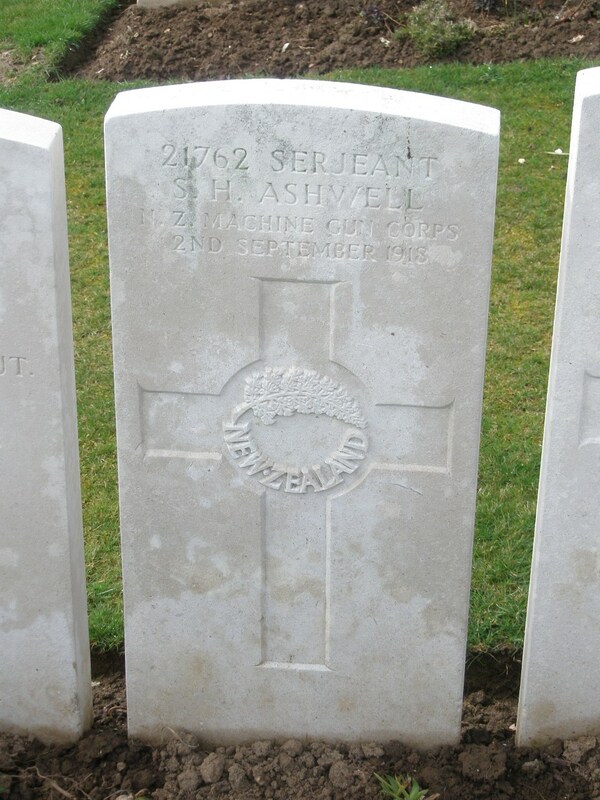 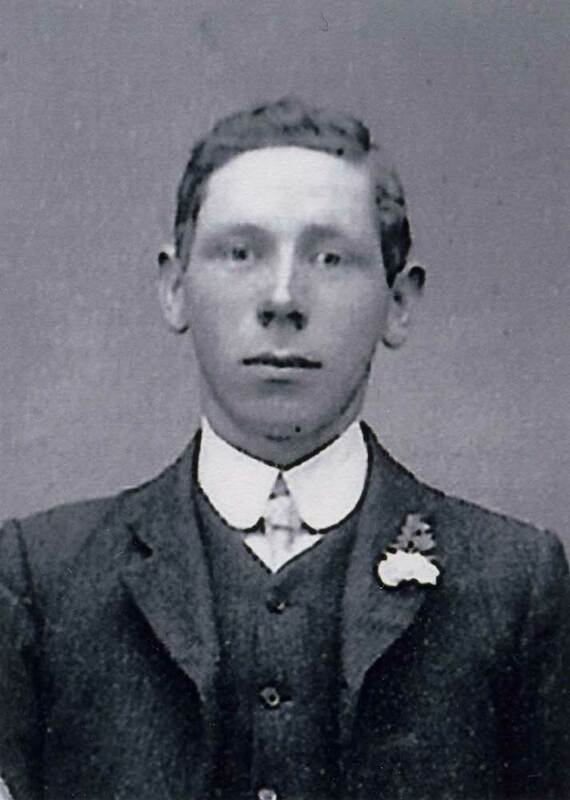 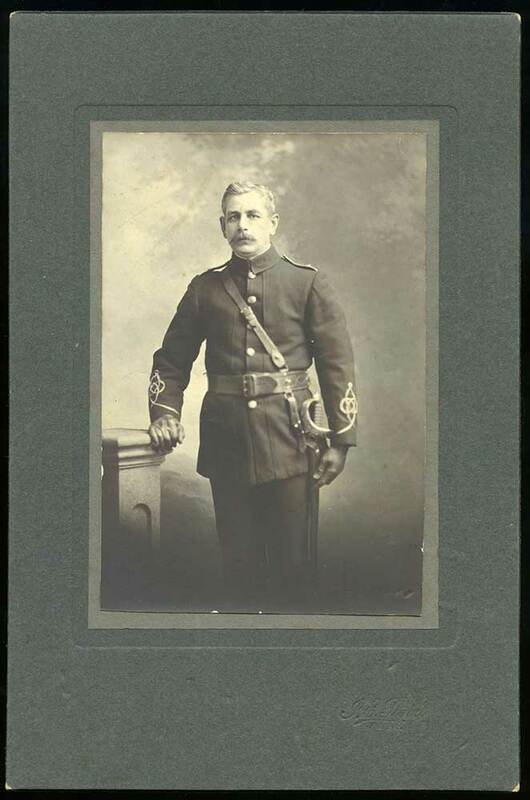 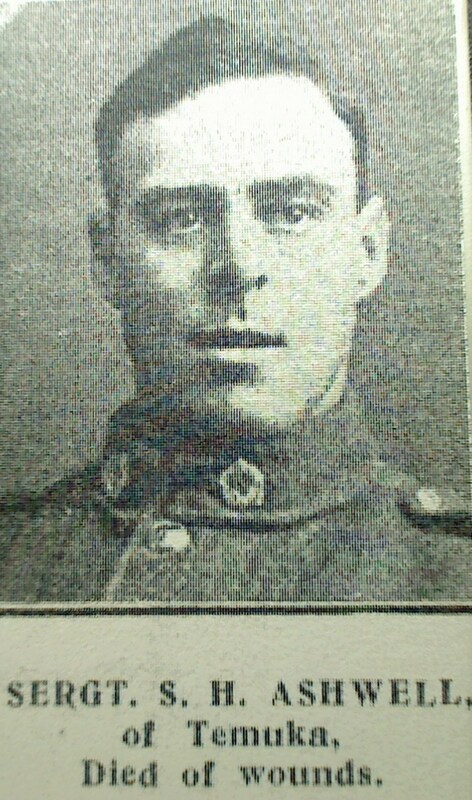 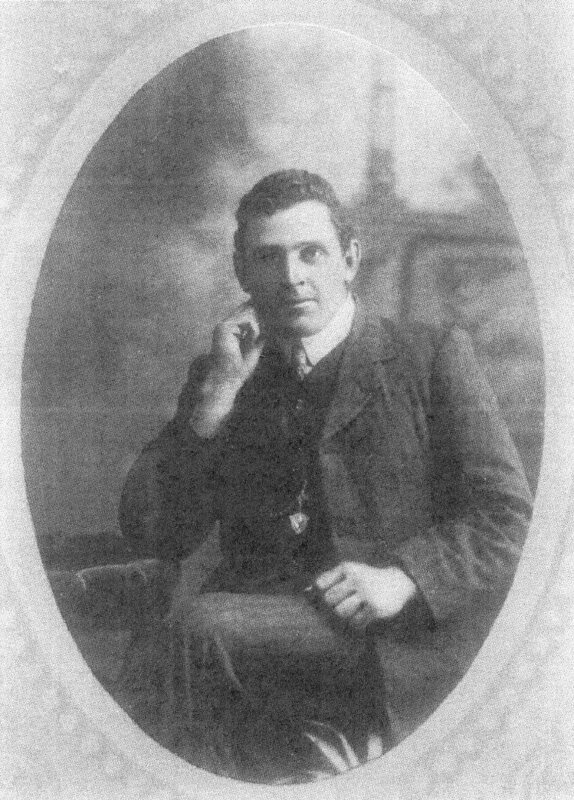 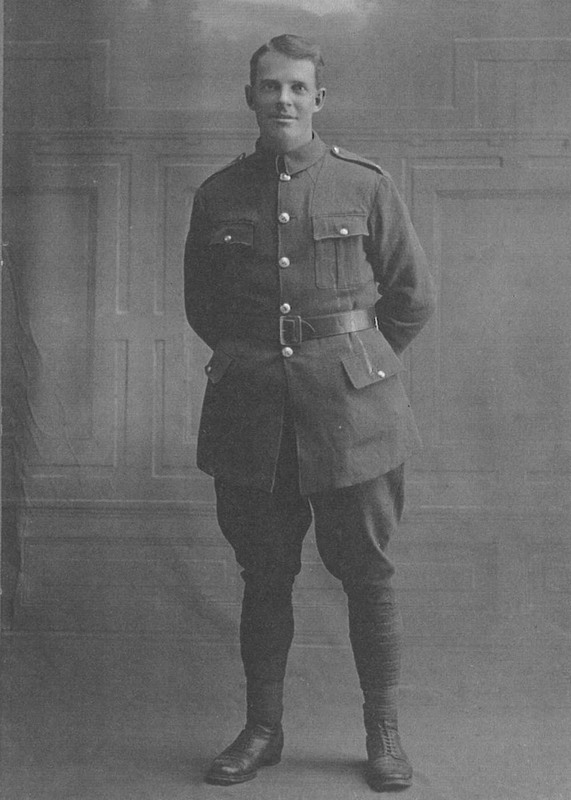 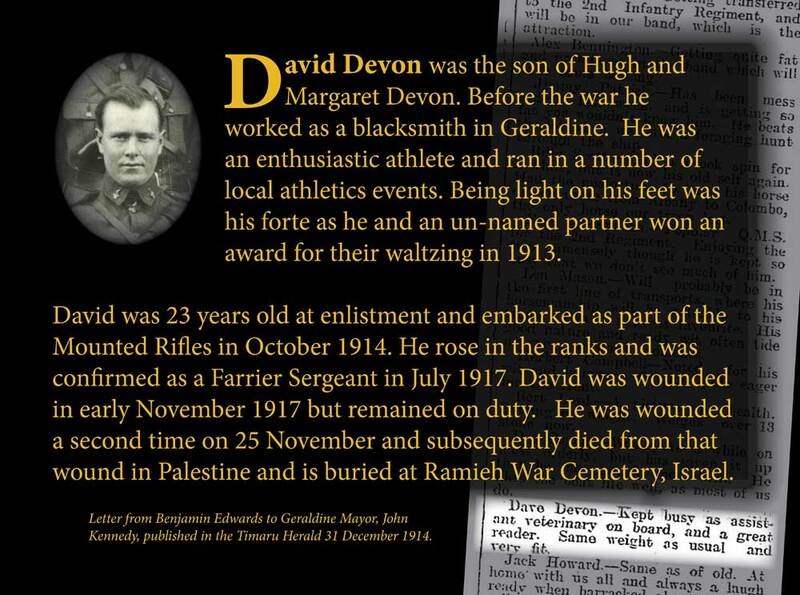 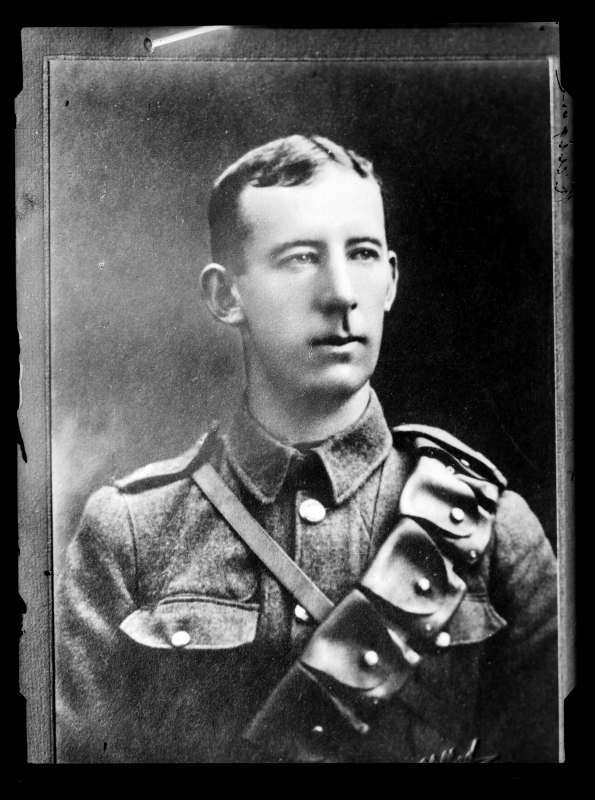 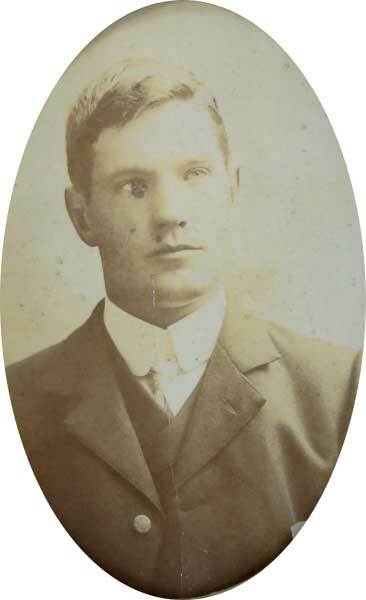 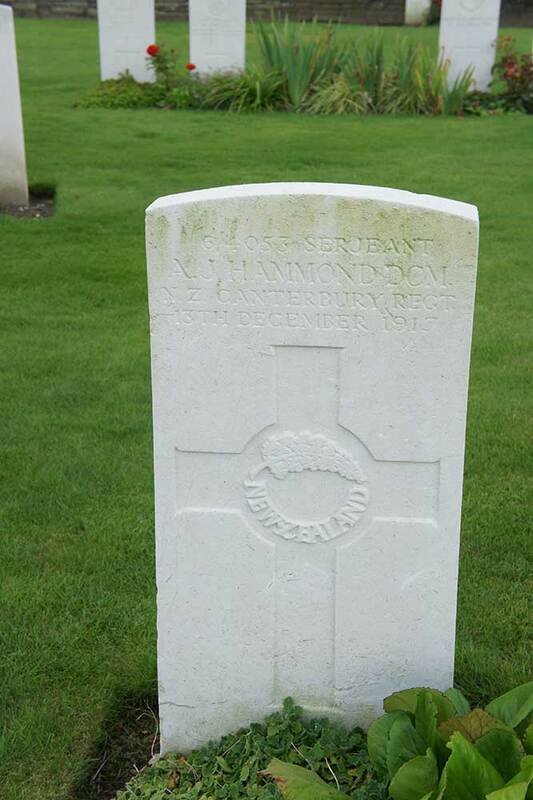 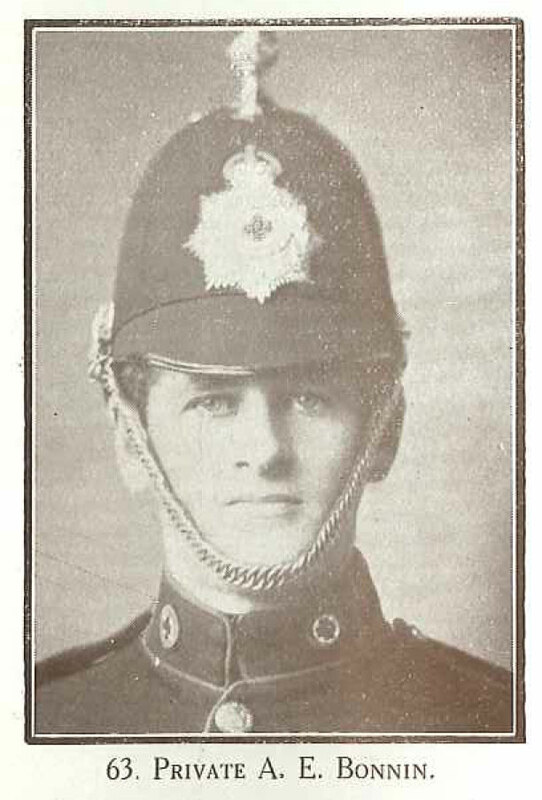 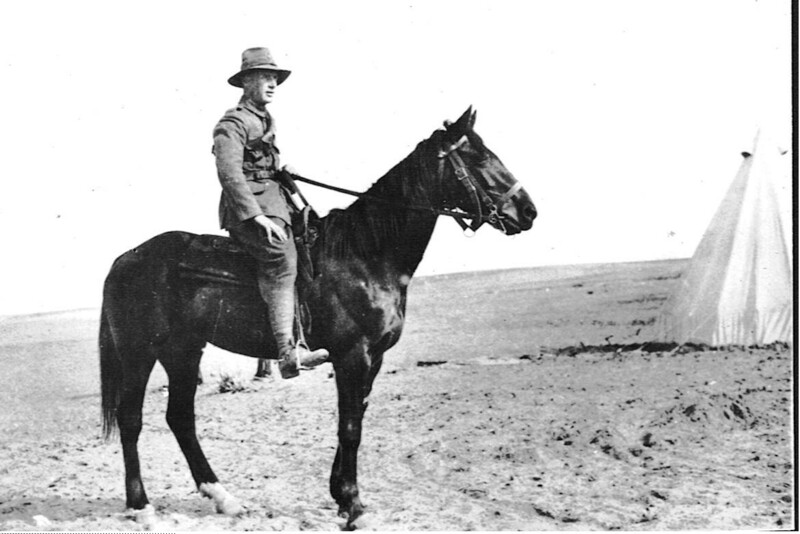 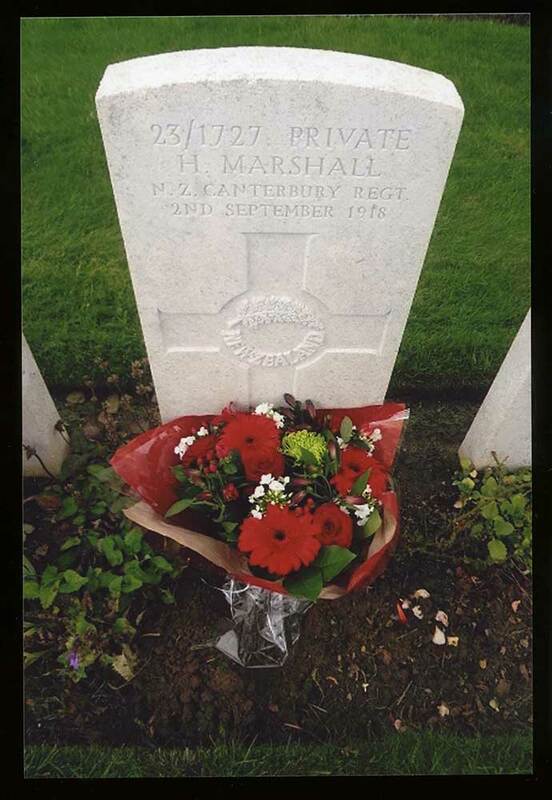 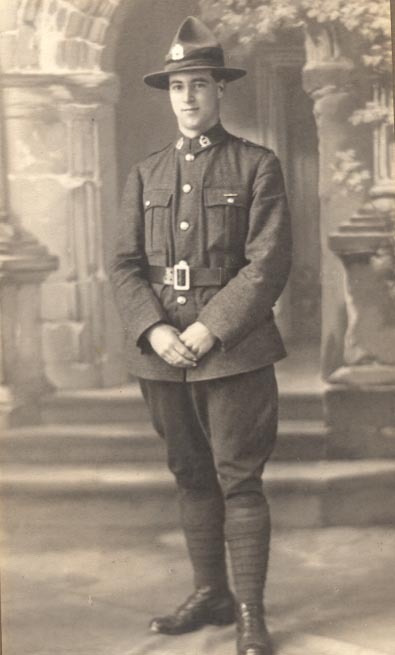 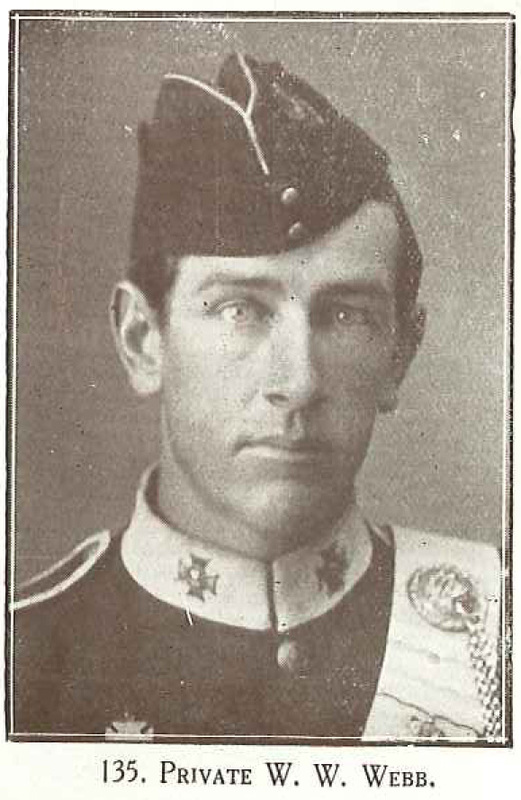 Saunderson was part of the first contingent that left for the front known as the "Main Body". 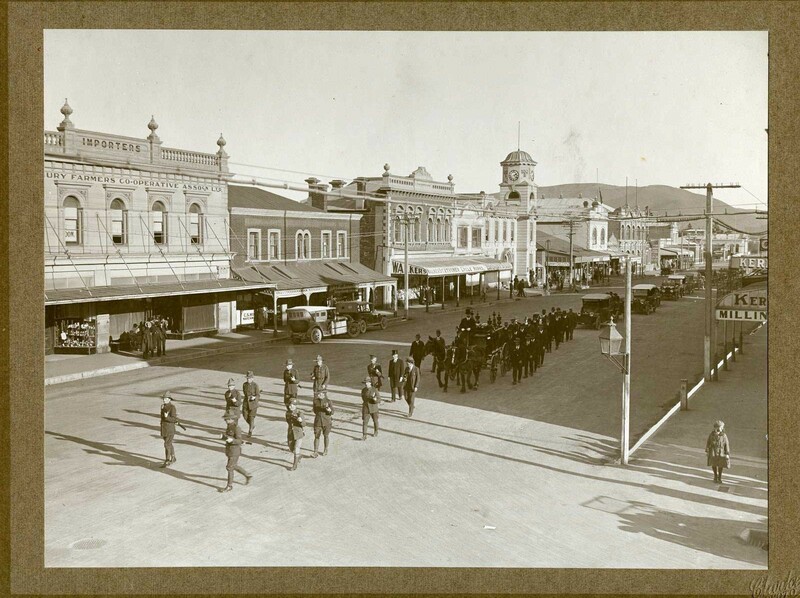 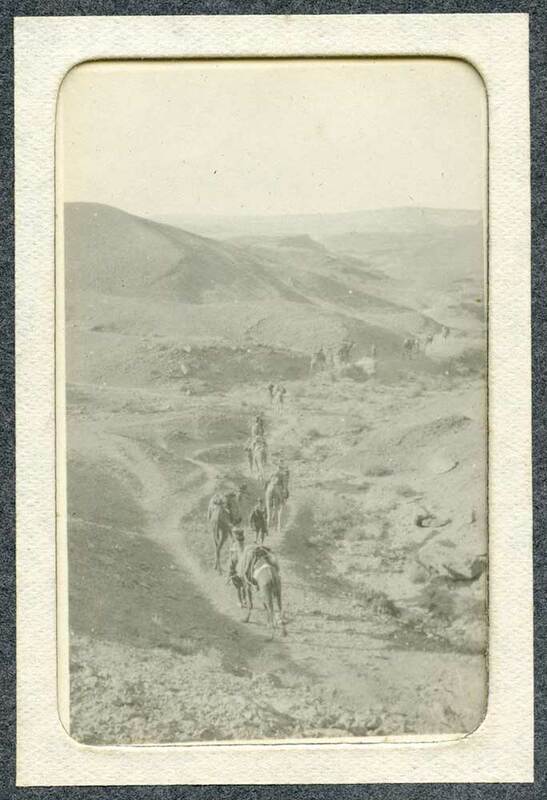 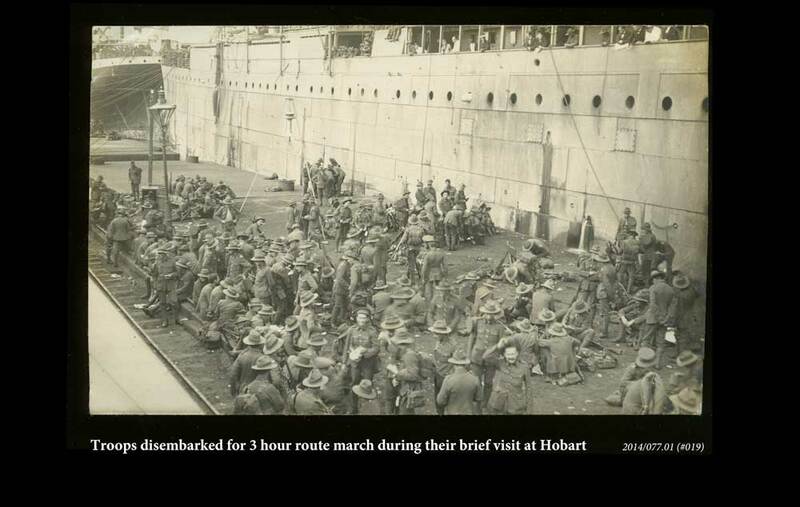 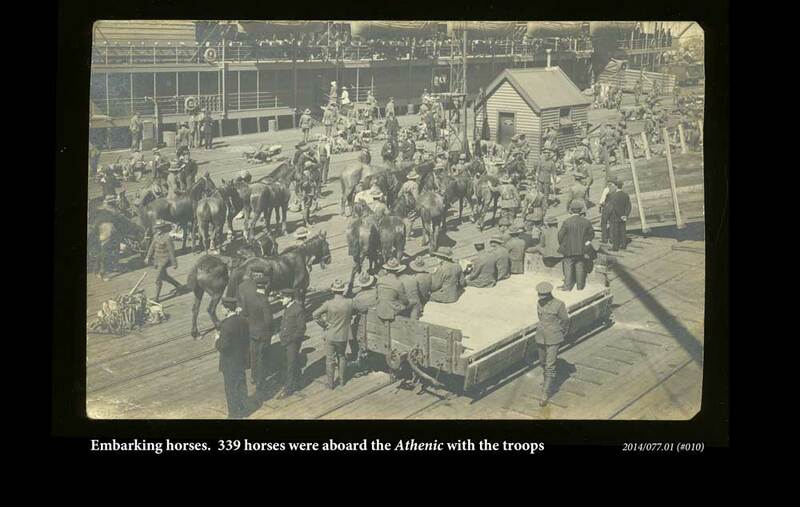 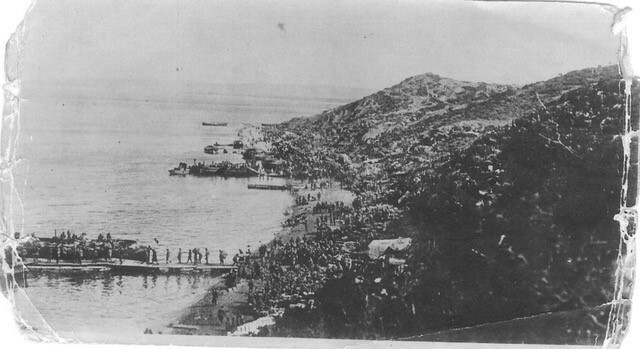 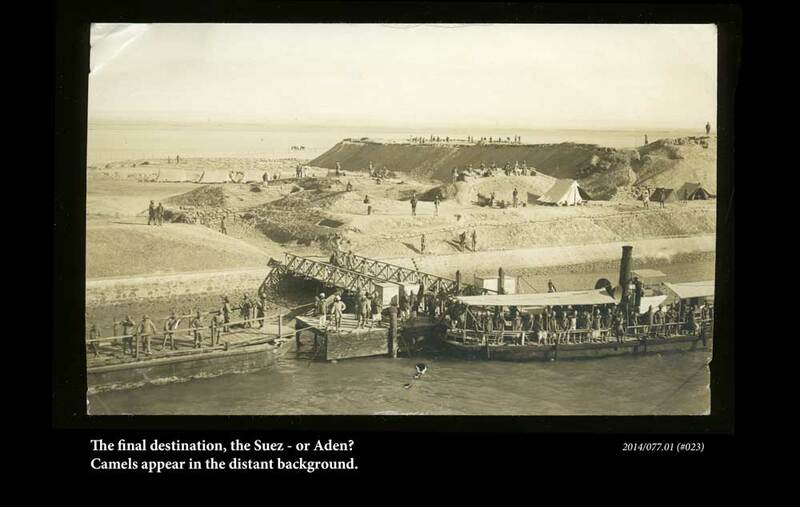 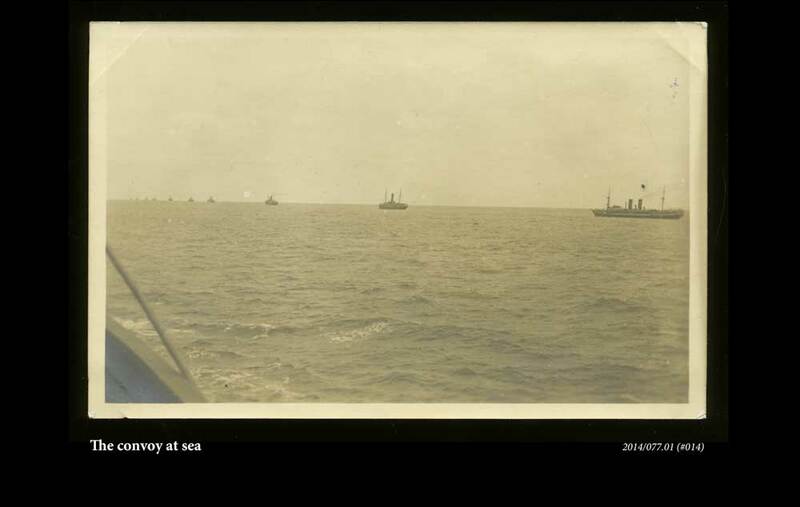 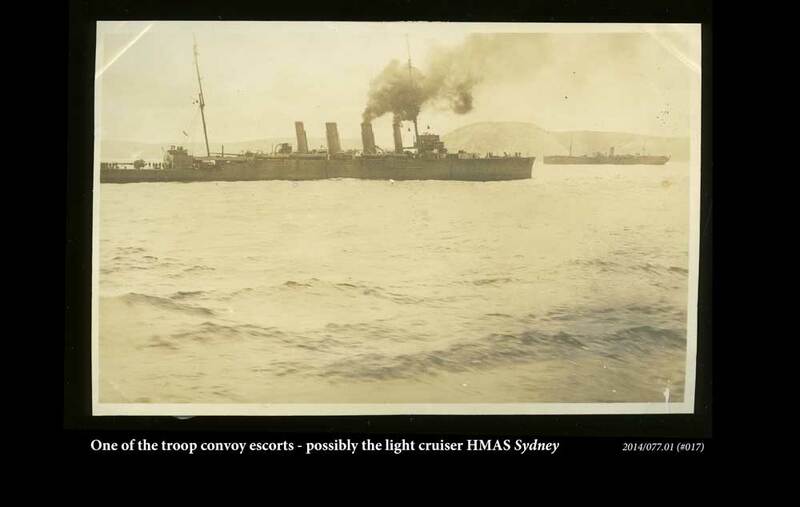 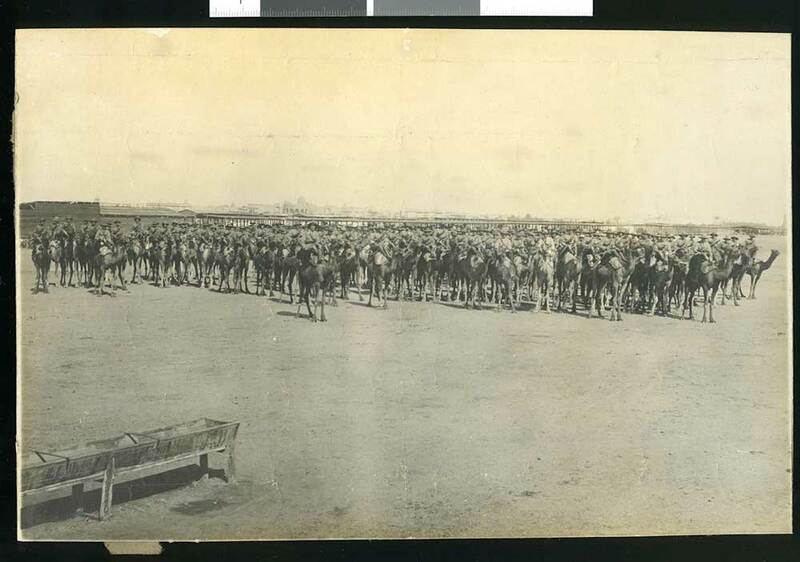 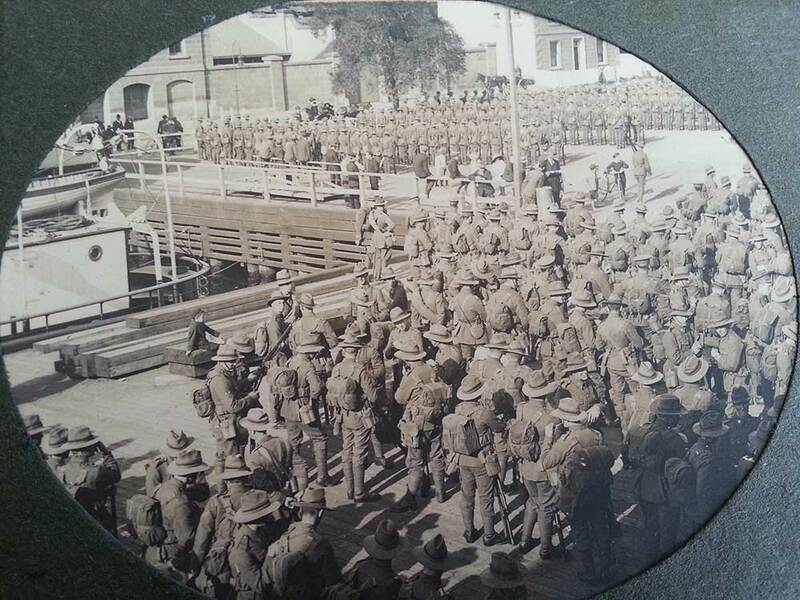 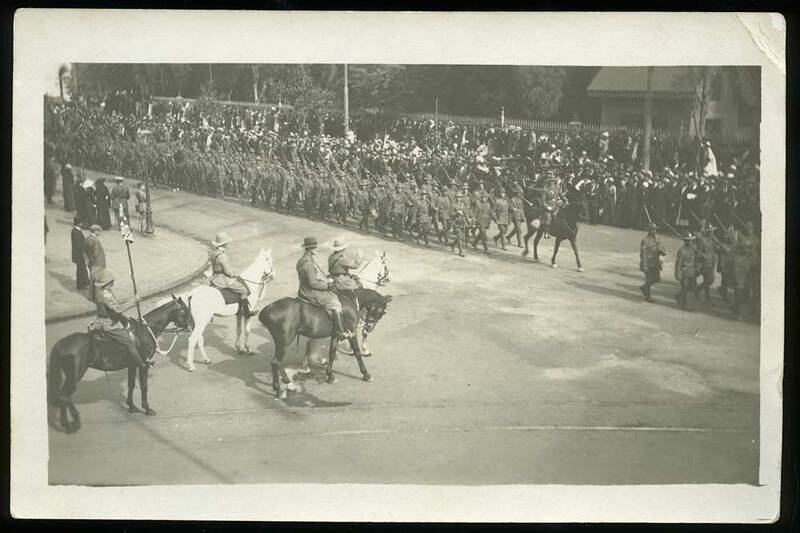 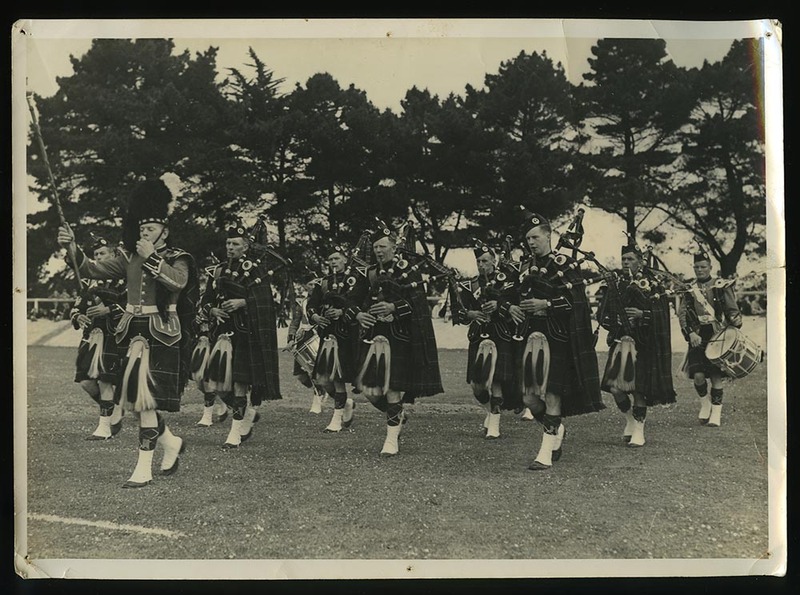 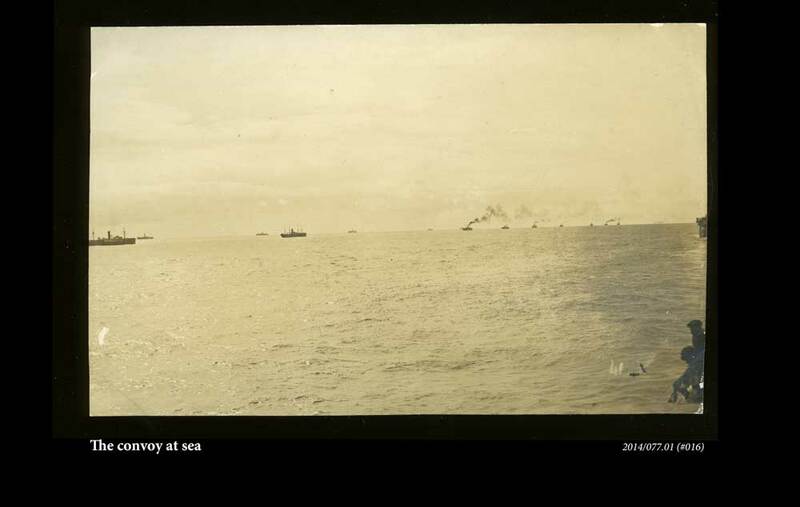 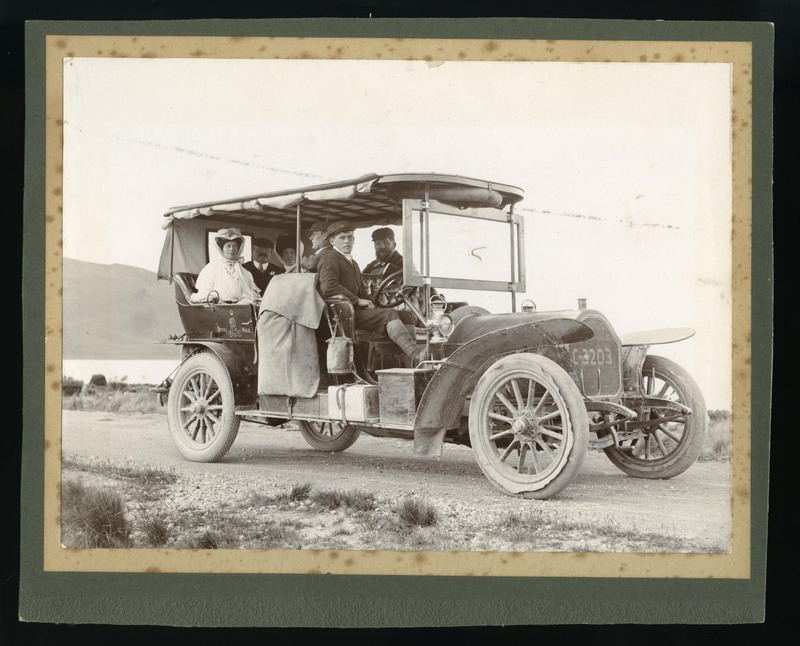 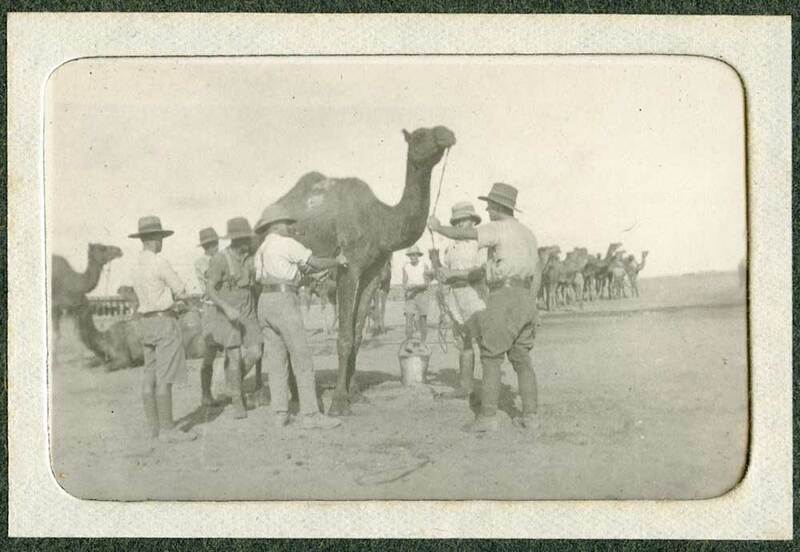 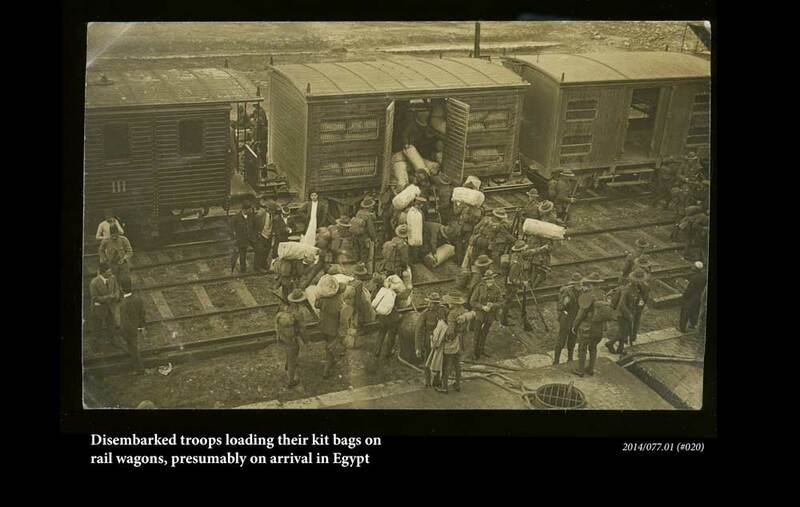 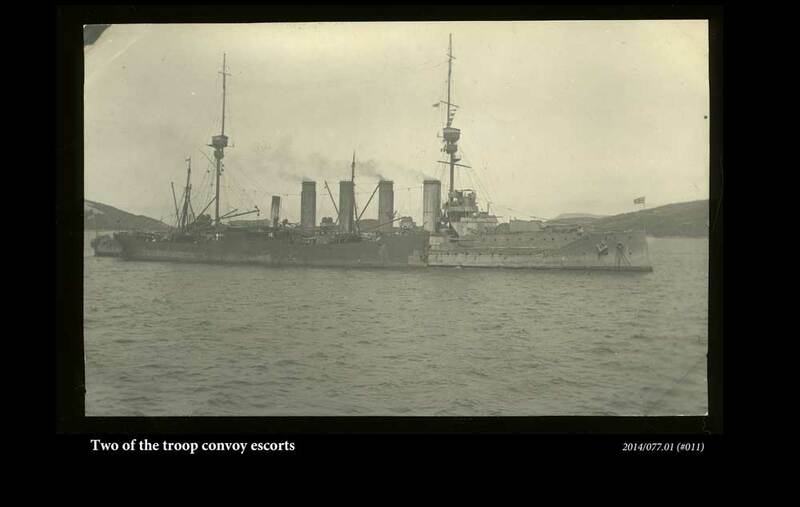 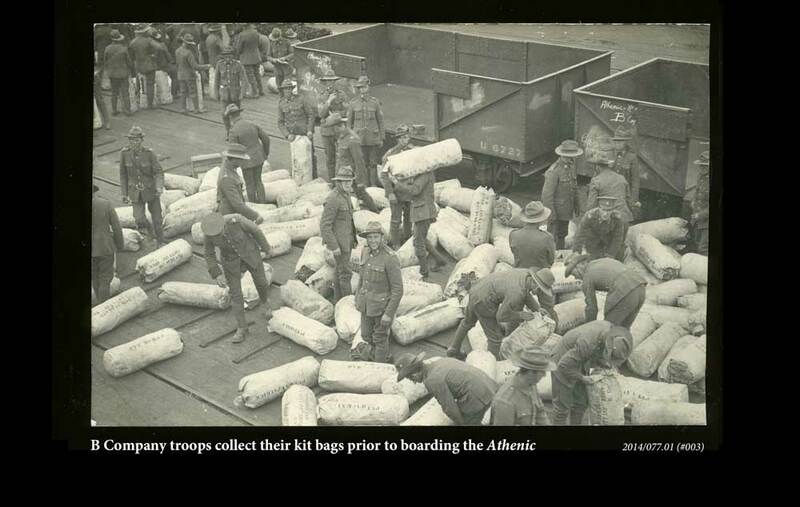 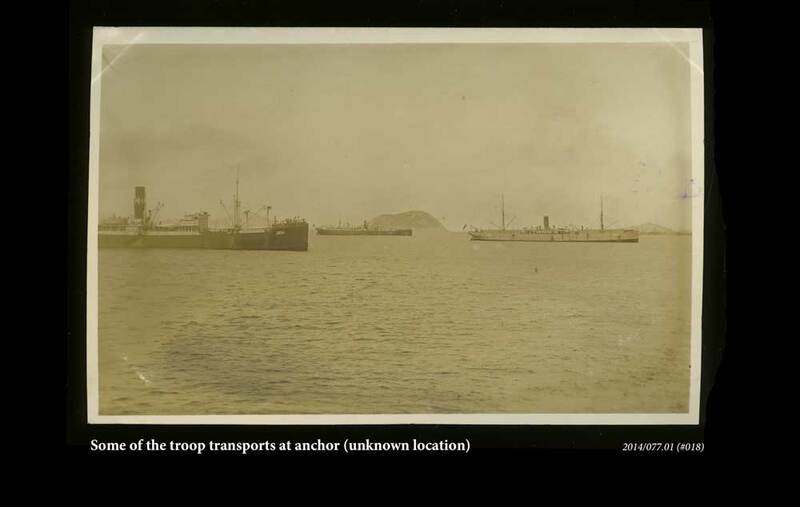 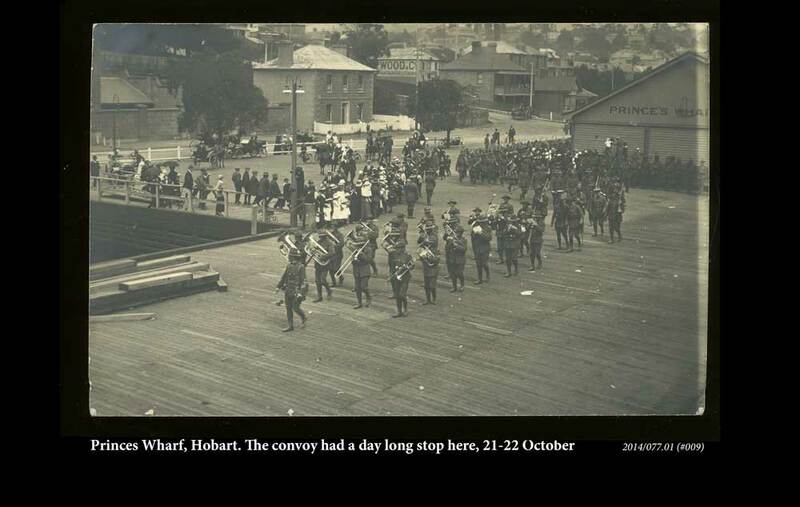 The convoy left New Zealand and stopped in Australia to join in convoy with Australian forces. 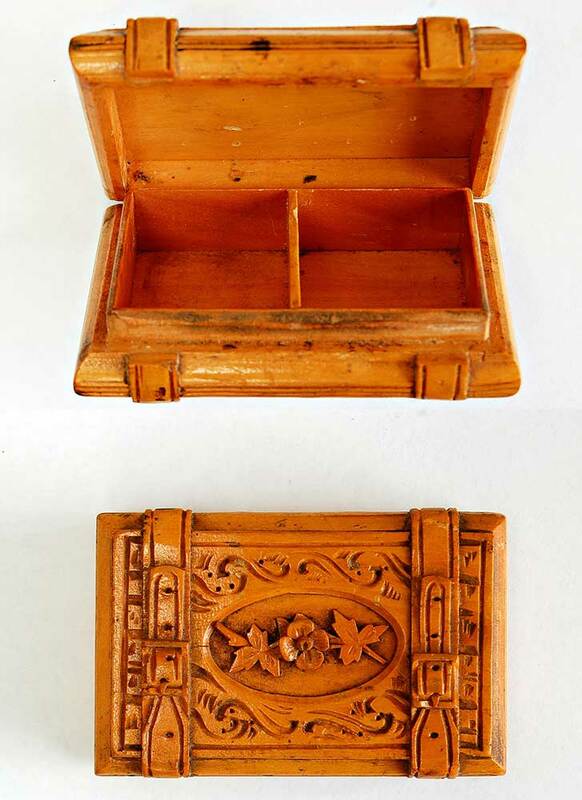 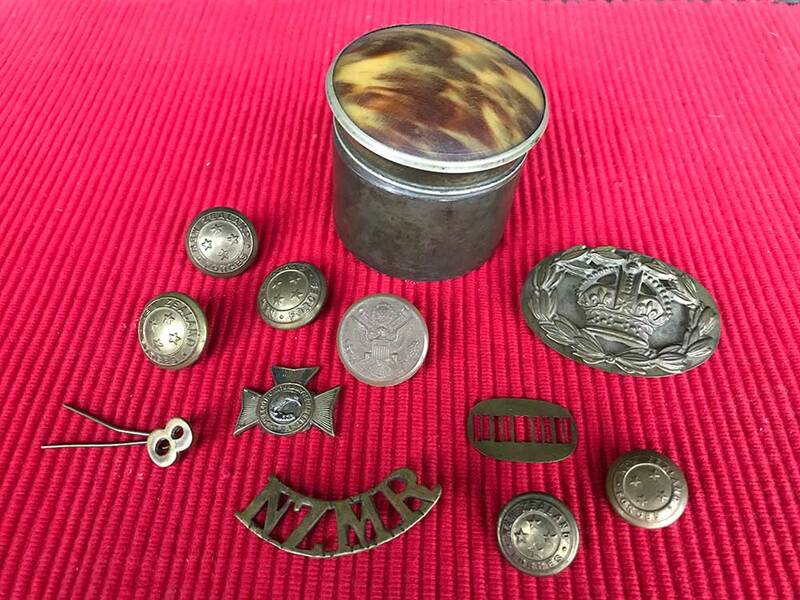 A small collection of personal effects, received by the family after Colin was killed in action. 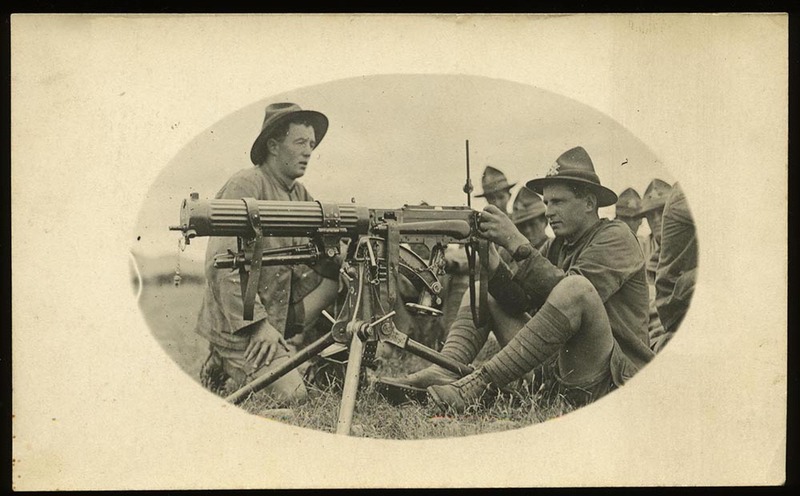 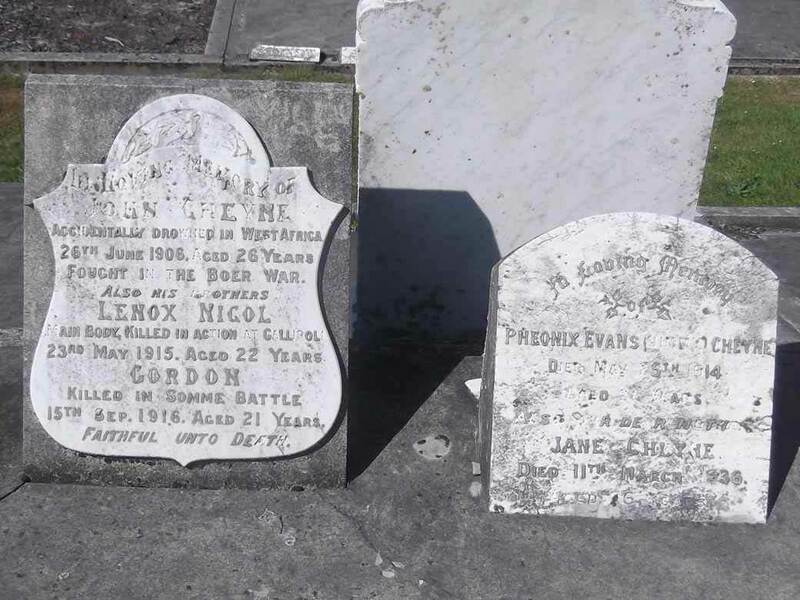 6/478 Private William Moyse Hocking (standing), 6/427 Private Lennox Nichol Cheyne cleaning his rifle (killed in action 25 April 1915, Gallipoli) and 6/568 Sergeant Joseph Henry Wallace (killed in action Gallipoli 7 August 1915), all of the 2nd (South Canterbury) Company at Zeitoun Camp, 1915. 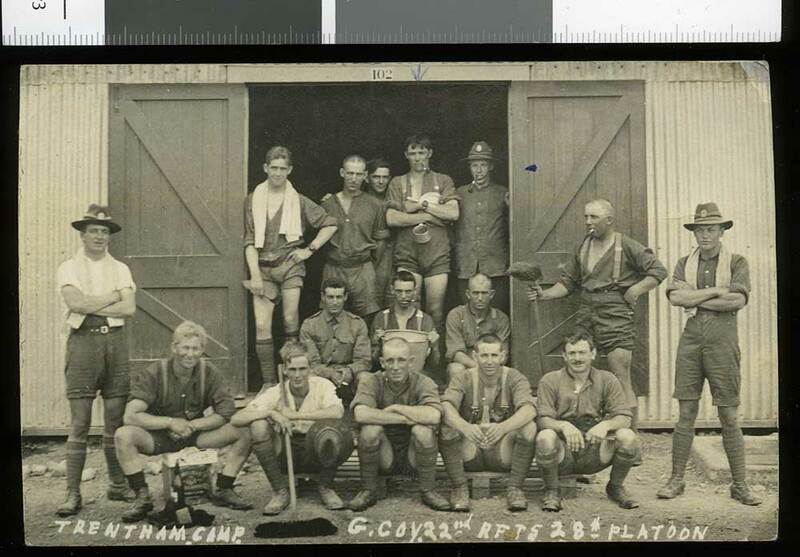 A group portrait postcard of 28th Platoon, G Company of the 22nd Reinforcements, taken in Trentham Milititary Camp in 1916 or early 1917. 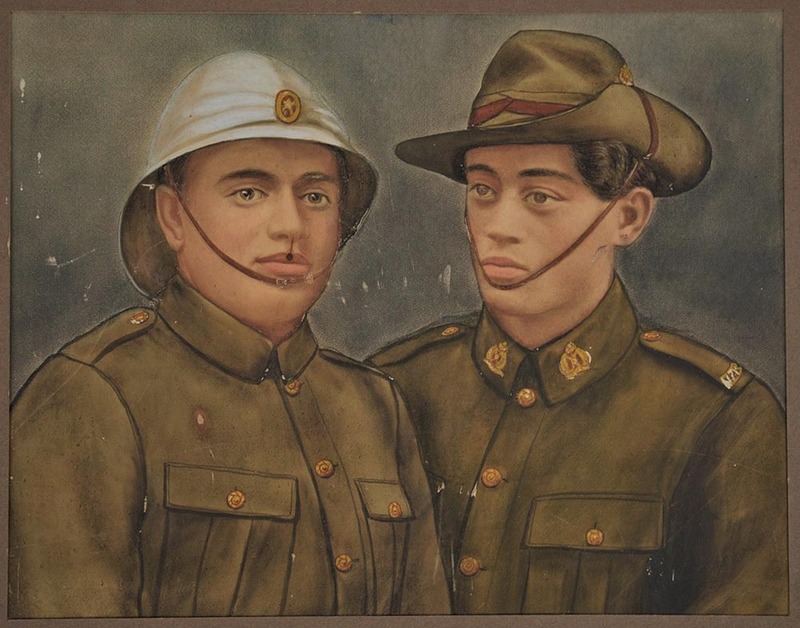 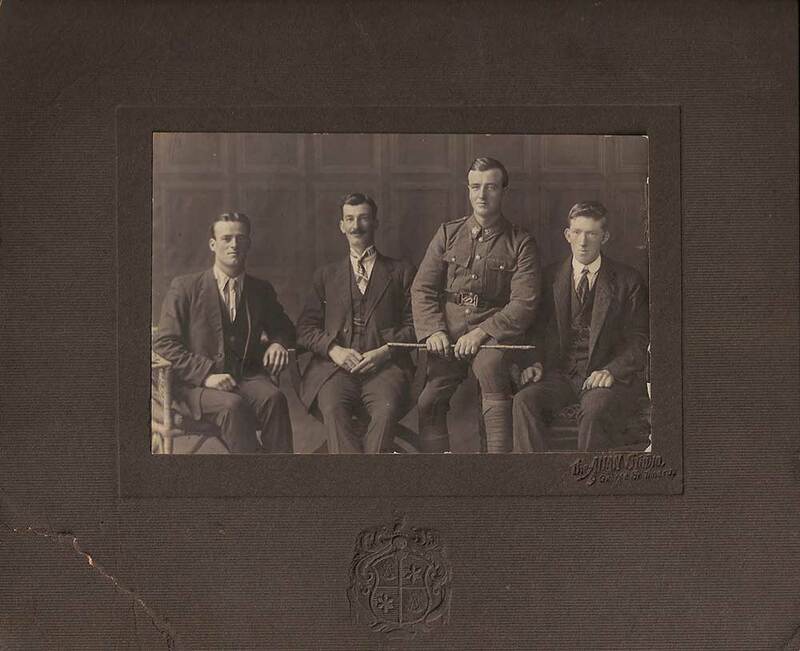 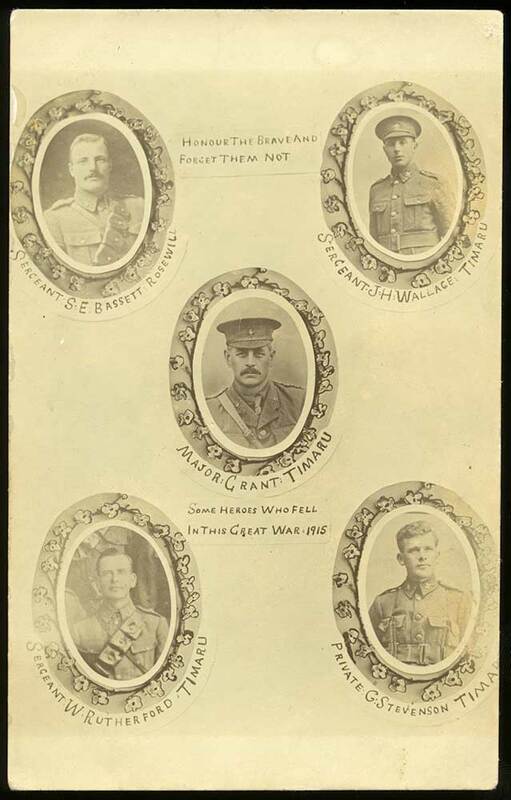 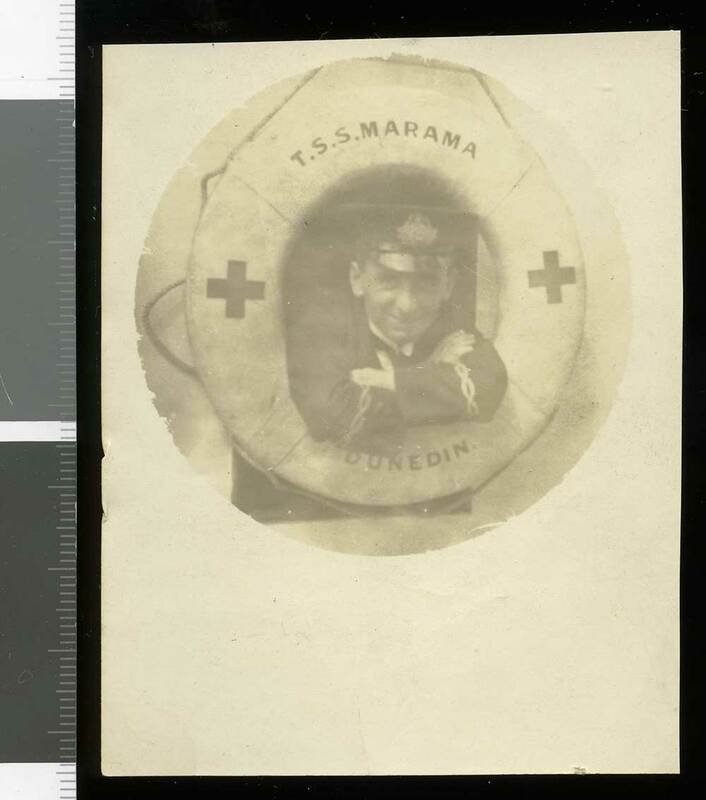 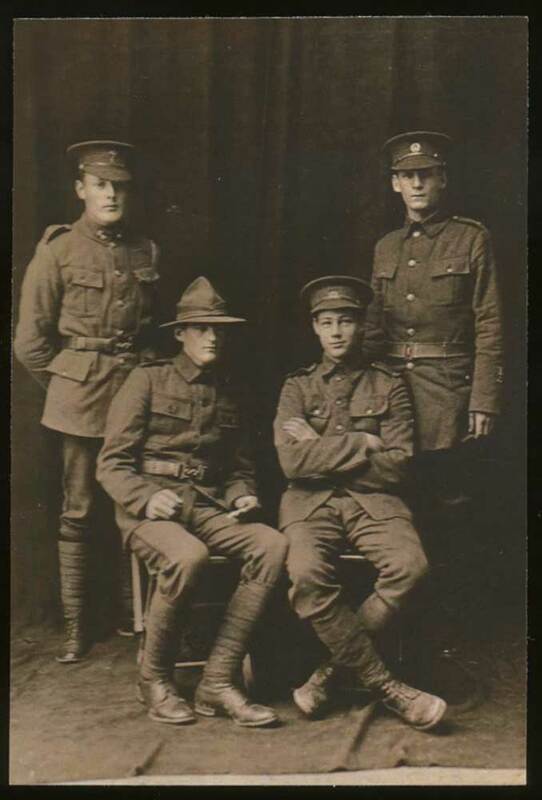 A pictorial postcard consisting of five oval portraits of South Canterbury men who died in World War One, presumably produced in 1915. 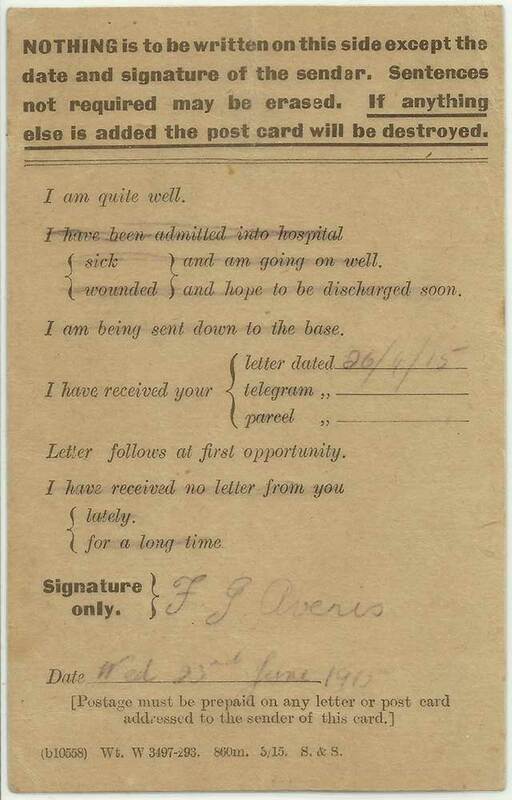 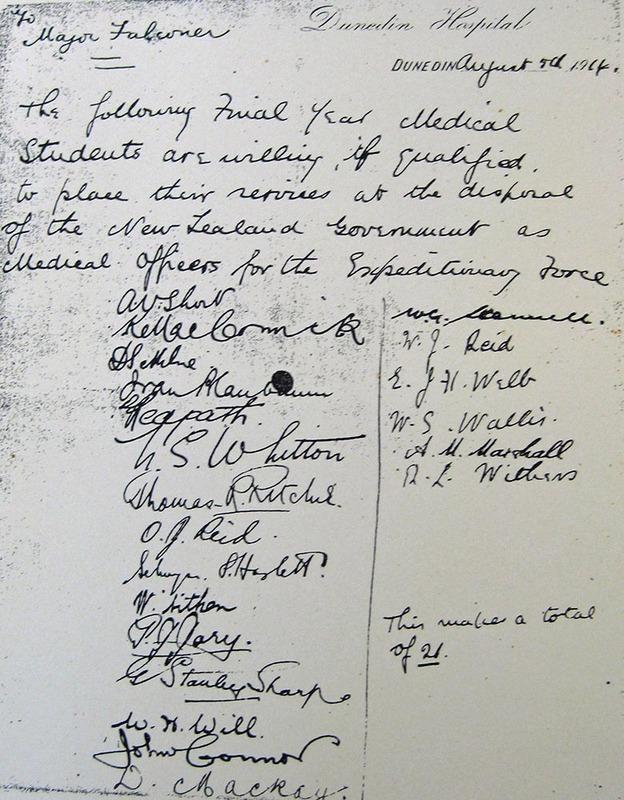 A copy of a letter from final year medical students wrote offering their services when war broke out. 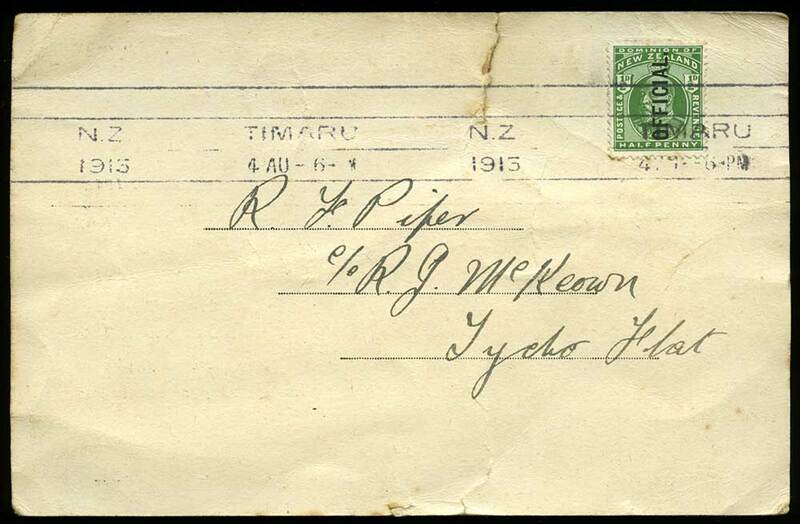 William Scannell's signature is at the top of the second column. 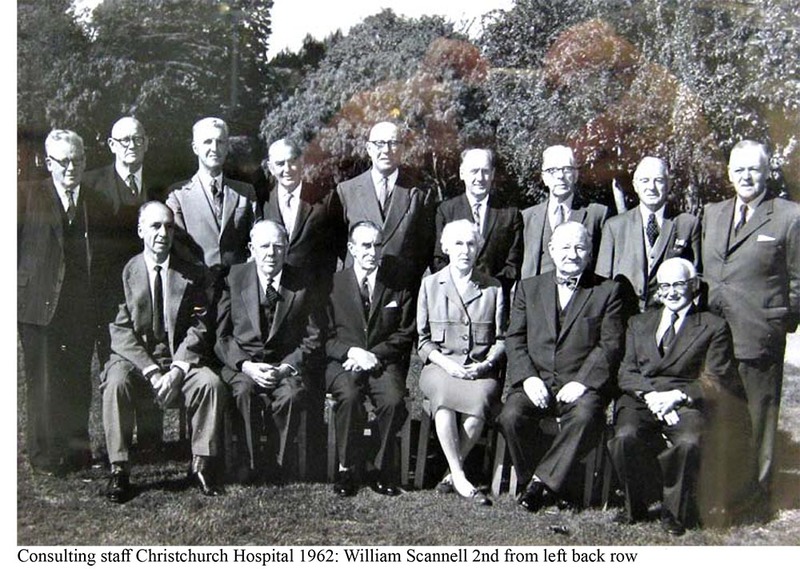 The original letter was framed and hung for many years on the corridor wall of the old Dunedin Hospital. 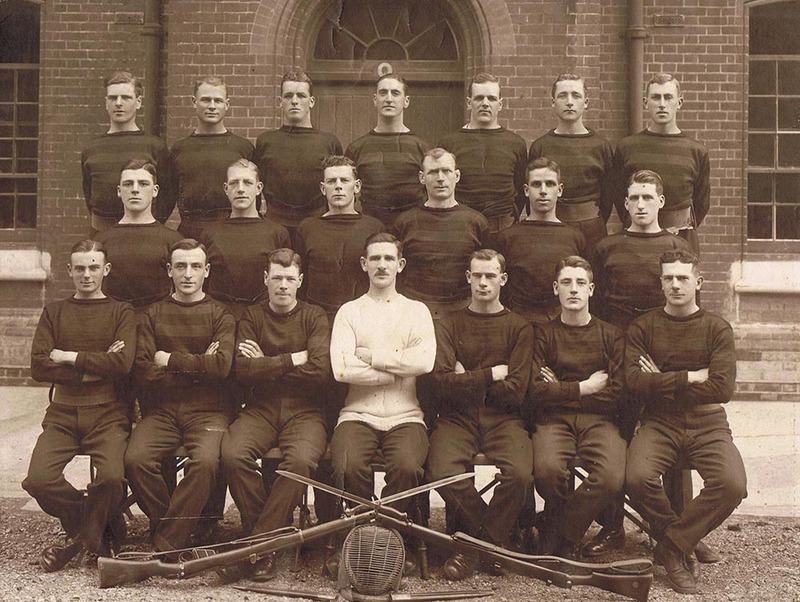 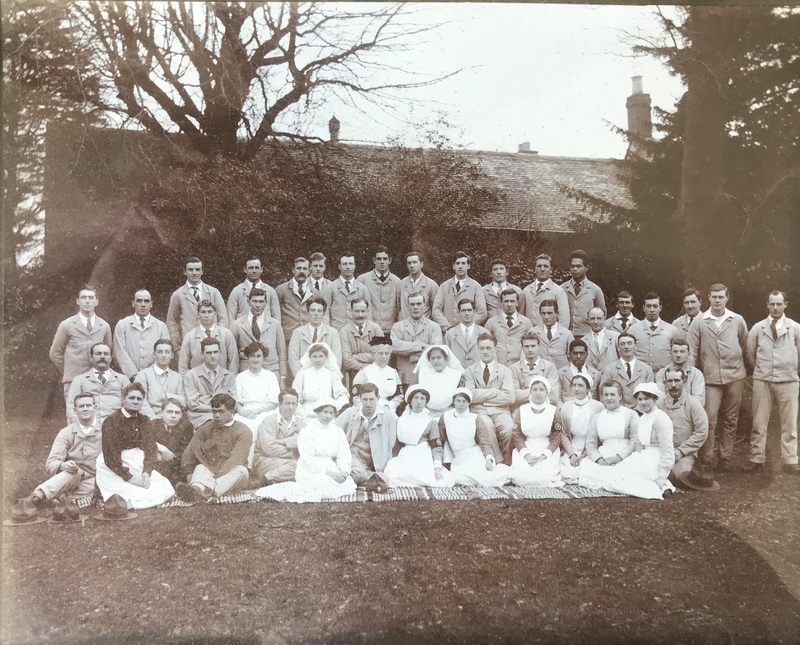 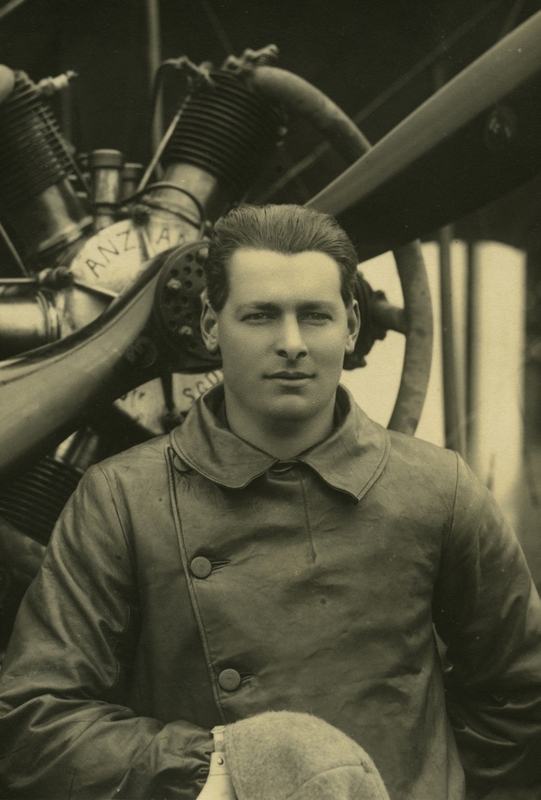 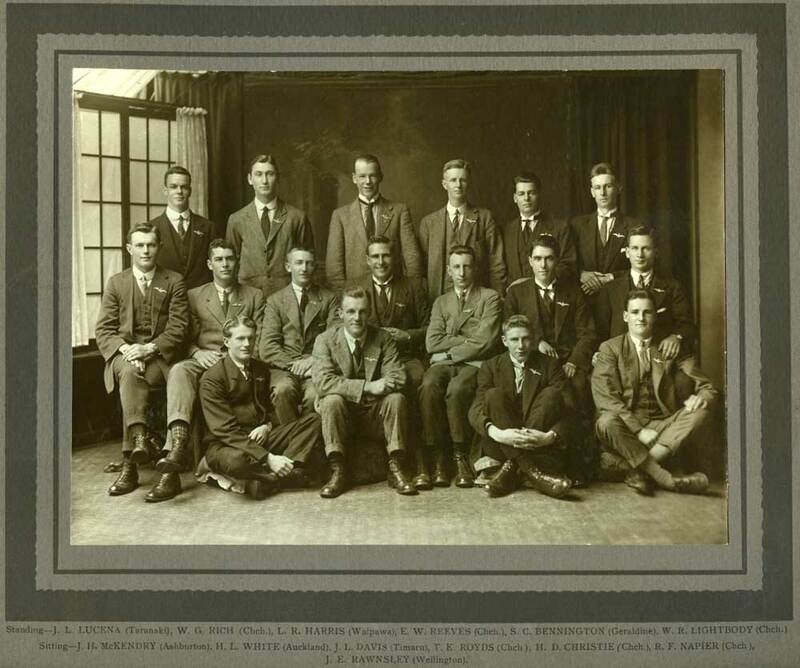 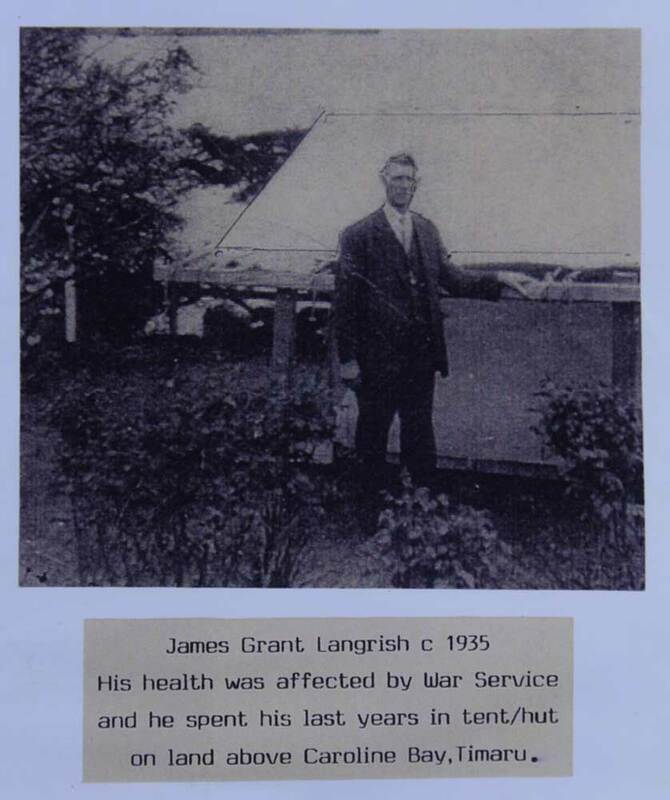 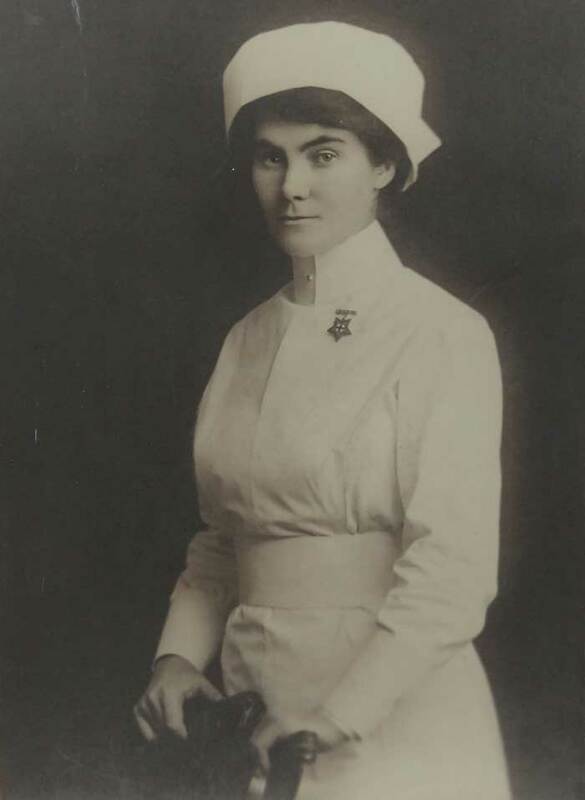 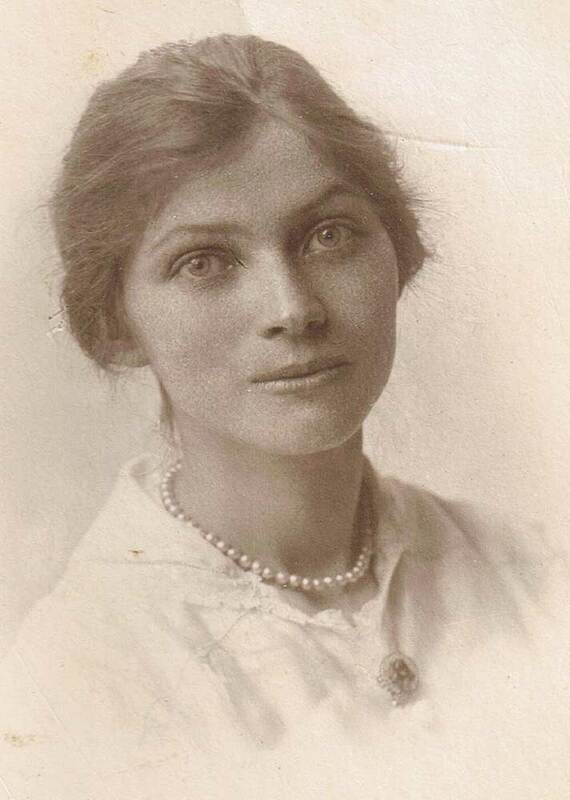 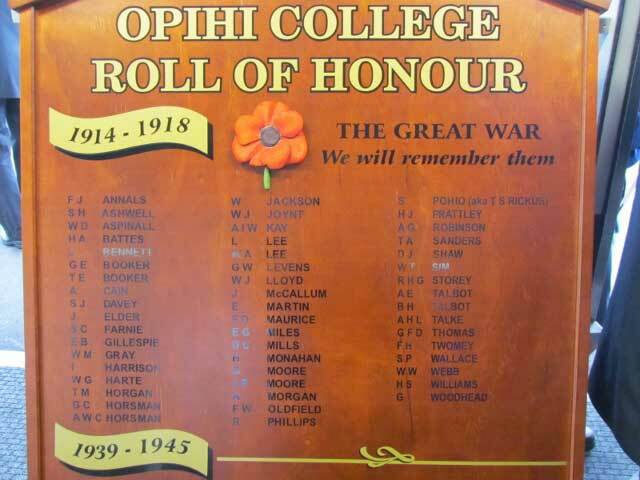 Due to the ongoing war (they all thought it would end in three months) they were recalled by the university in July 1915 to resume their studies or help where more experienced doctors had gone to war. 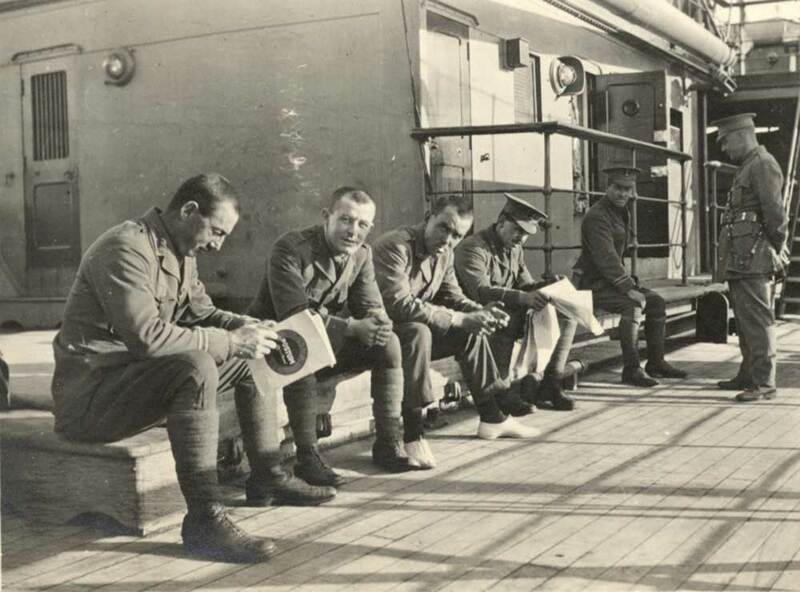 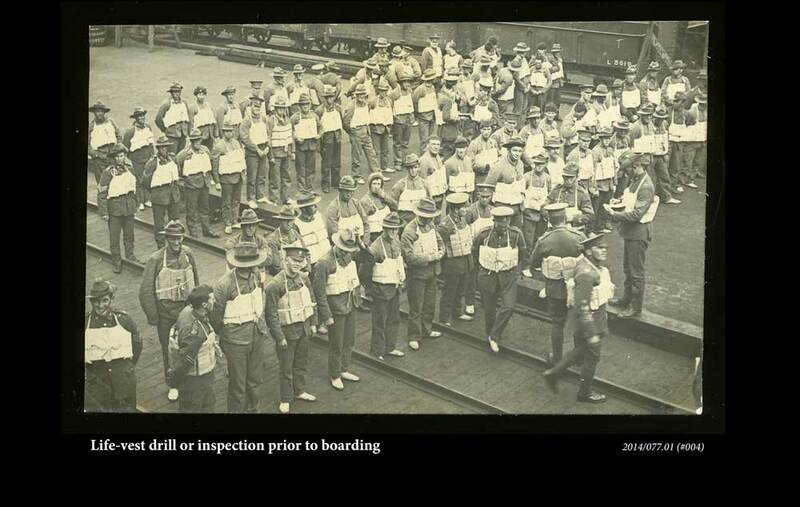 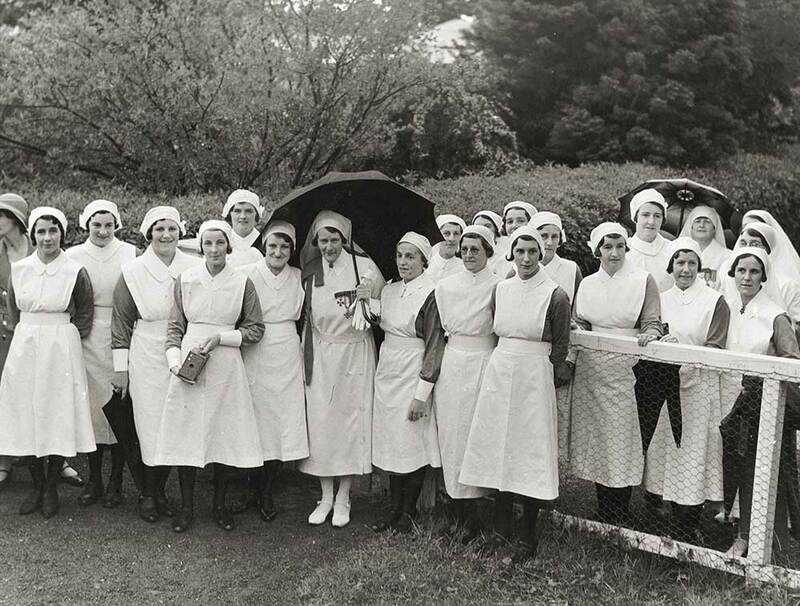 They began their work on board the troopships, attending to men who were ill, vaccinating them for smallpox and inoculating them for typhoid. 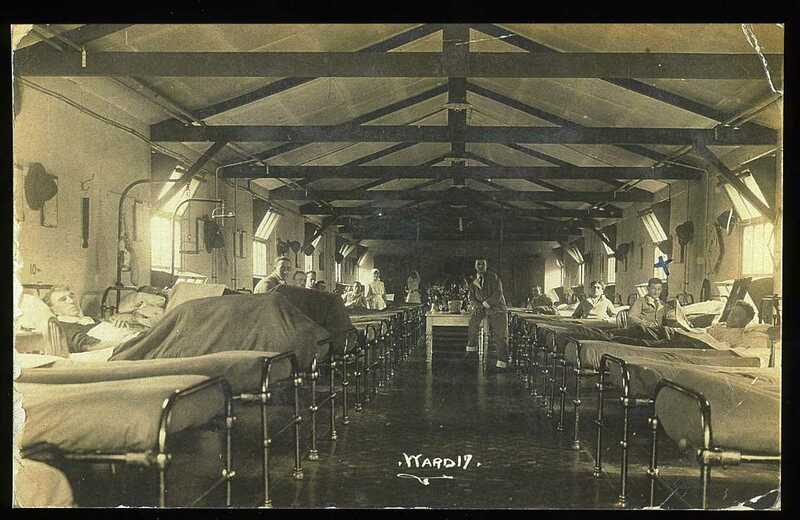 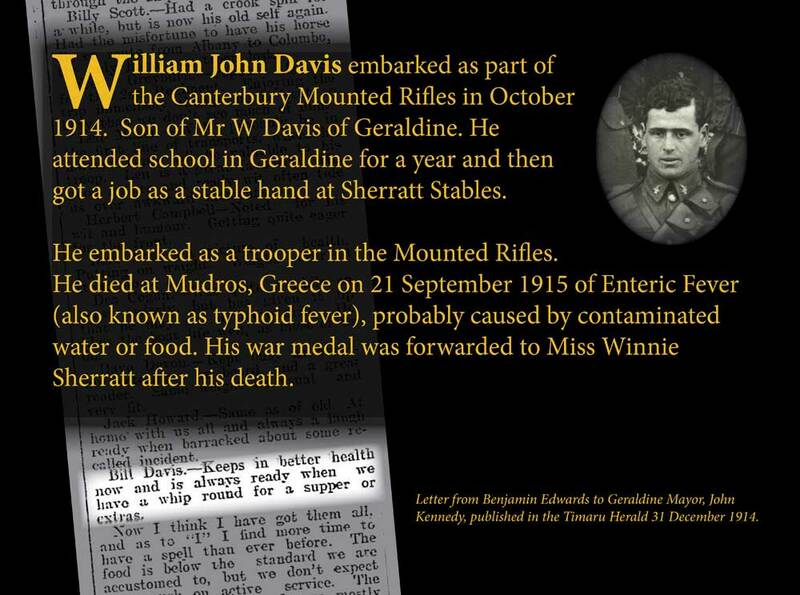 In William's case the typhoid vaccine (at this time the term vaccination referred only to smallpox) did not work well enough to stop him contracting it. 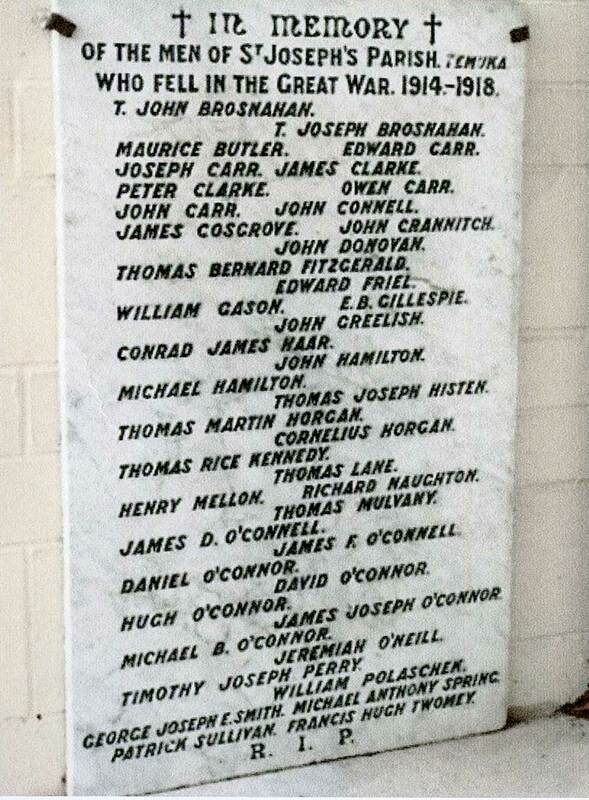 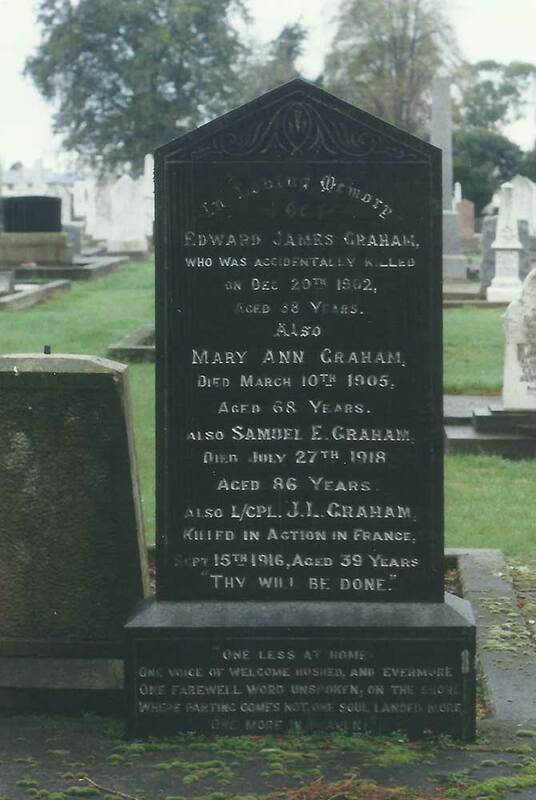 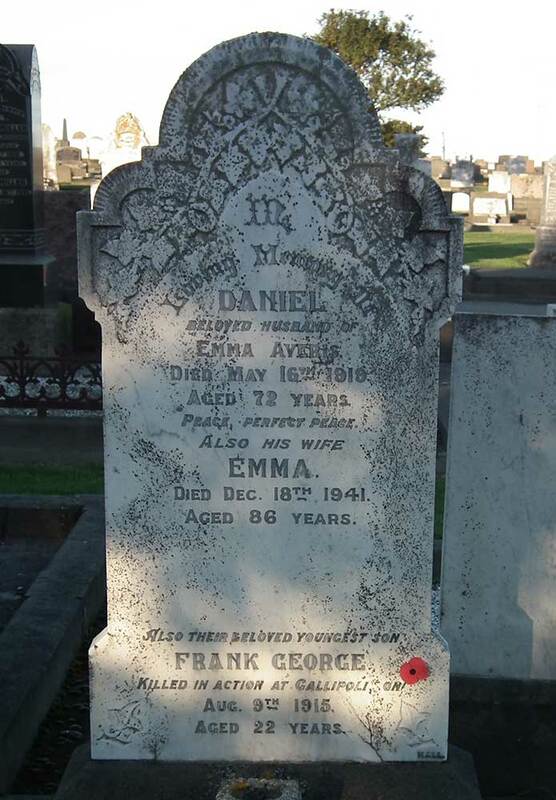 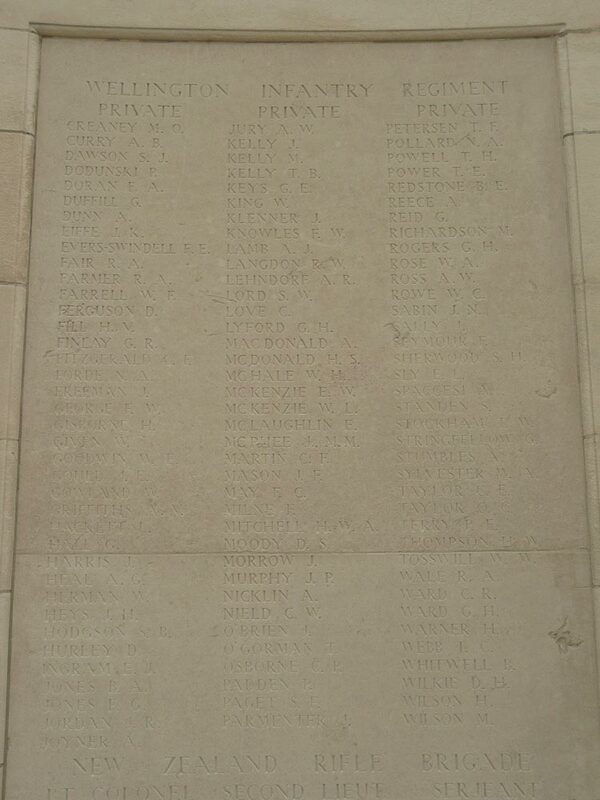 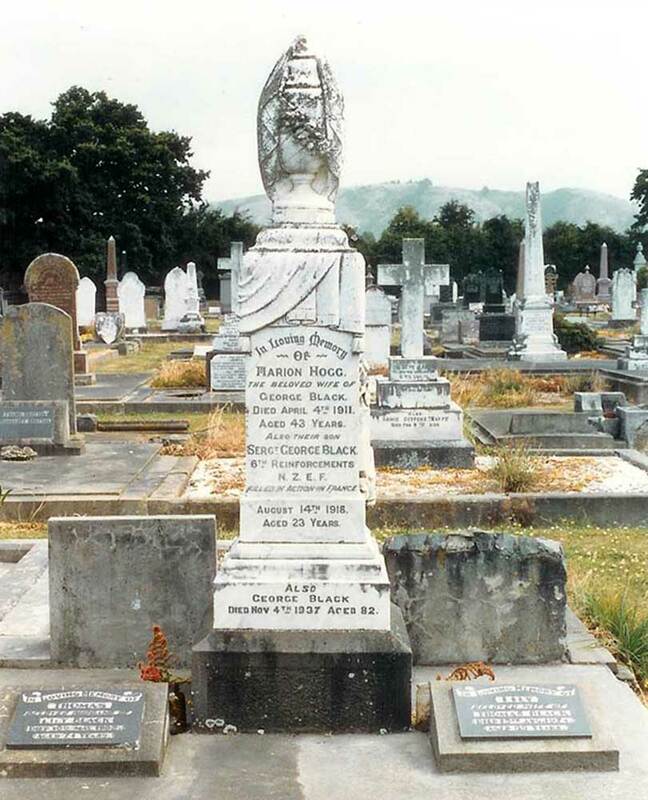 Includes the name of Ernest Purcell, listed almost half-way down the right column. 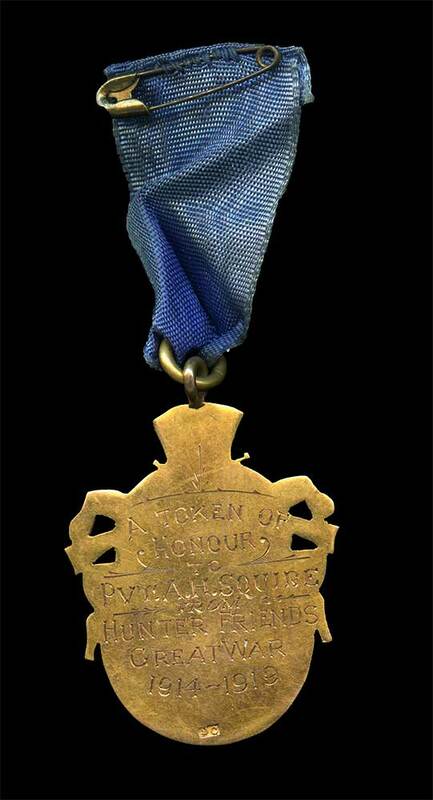 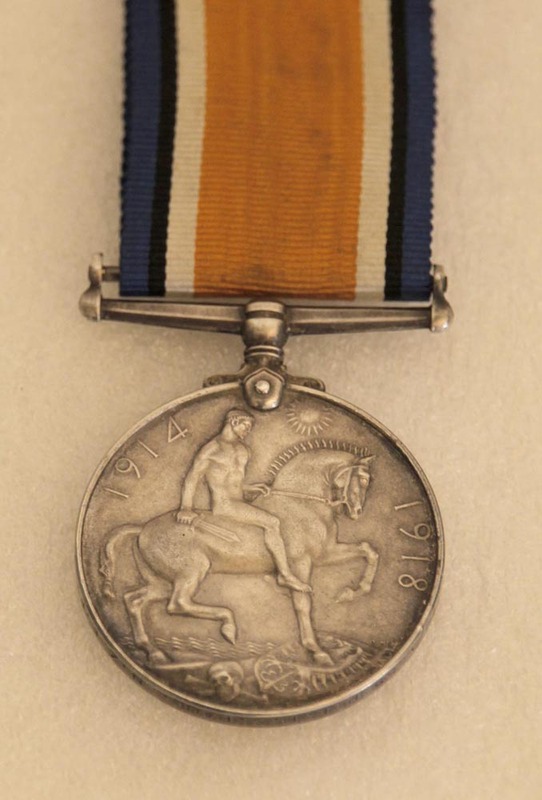 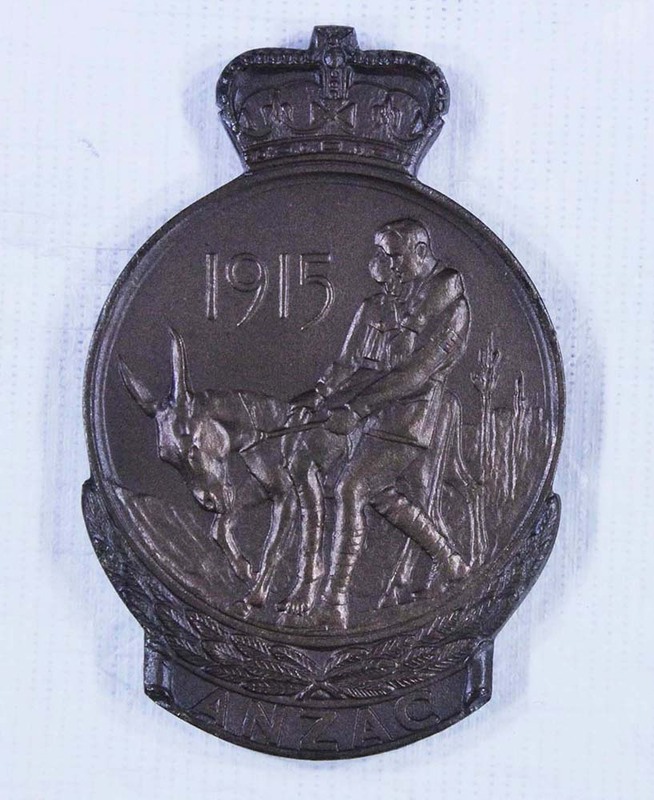 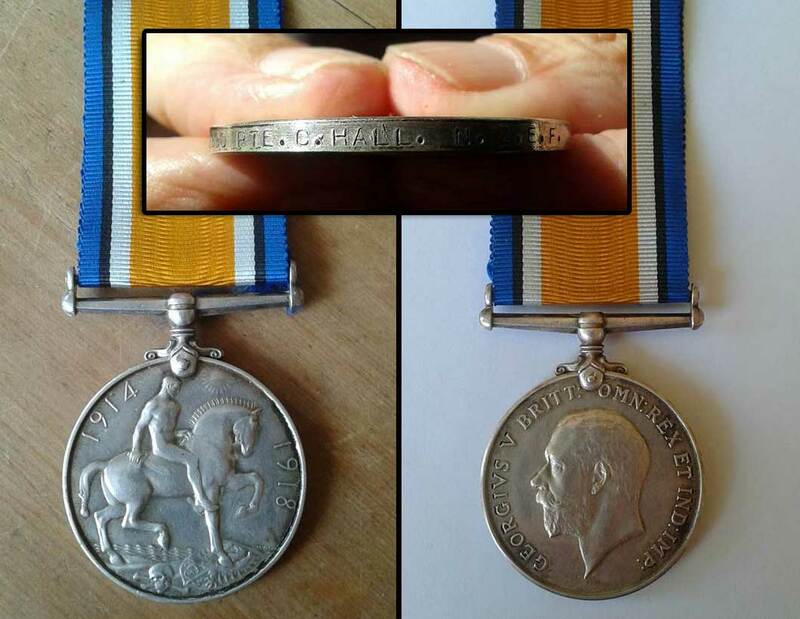 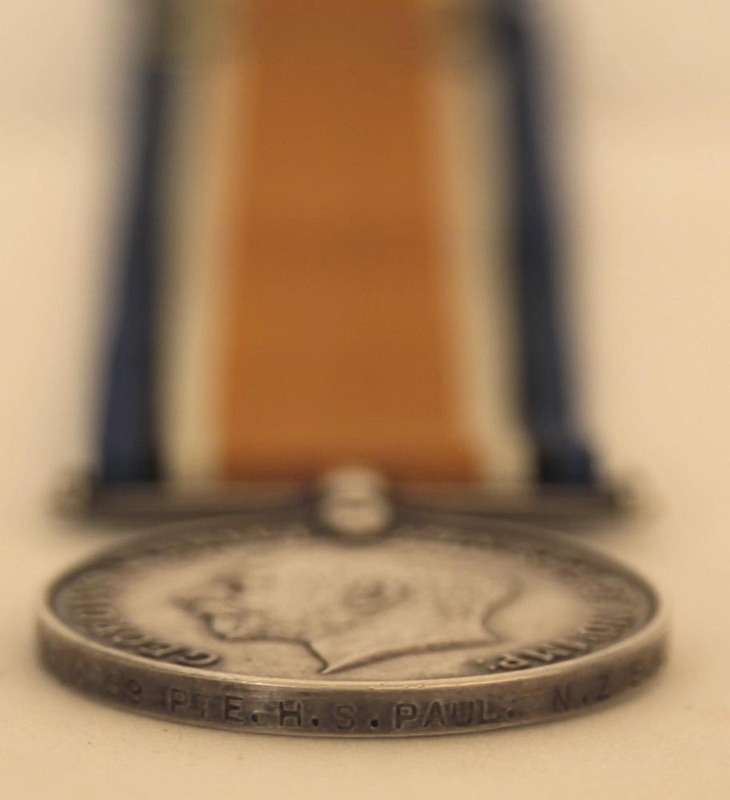 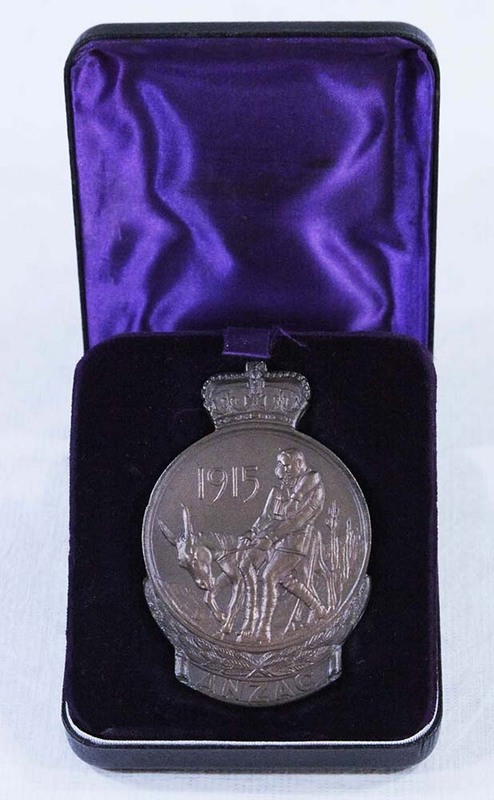 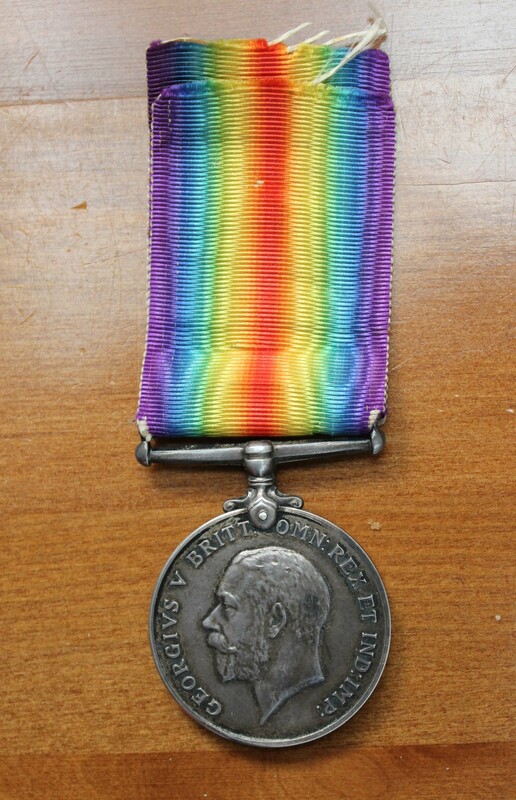 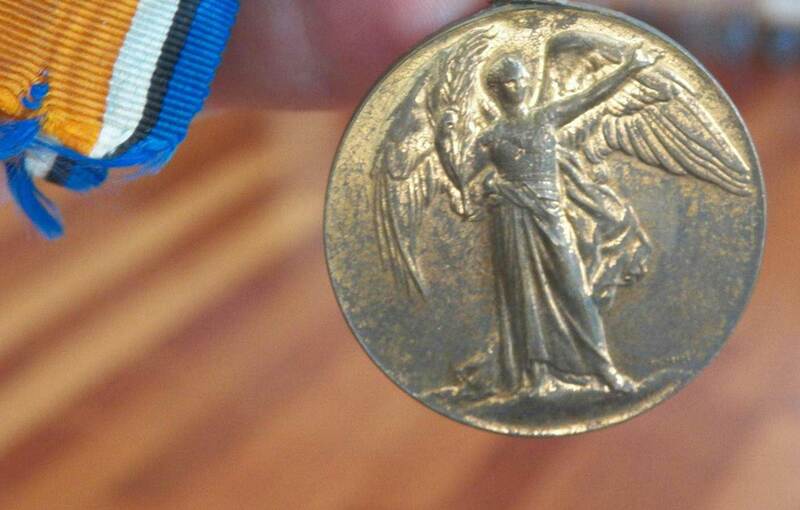 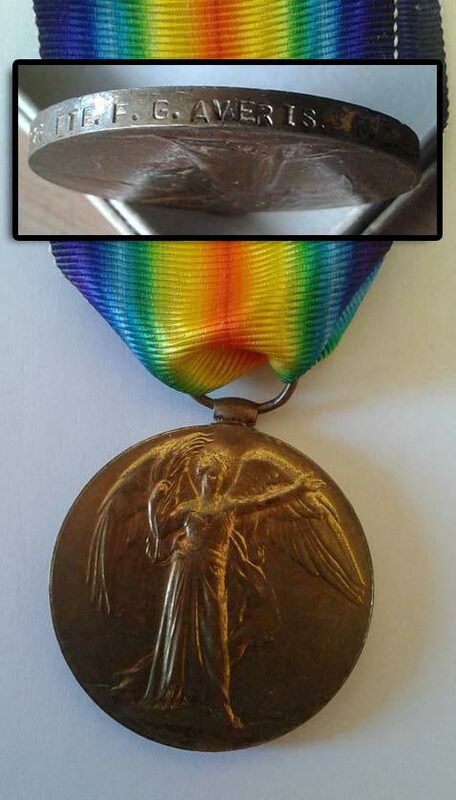 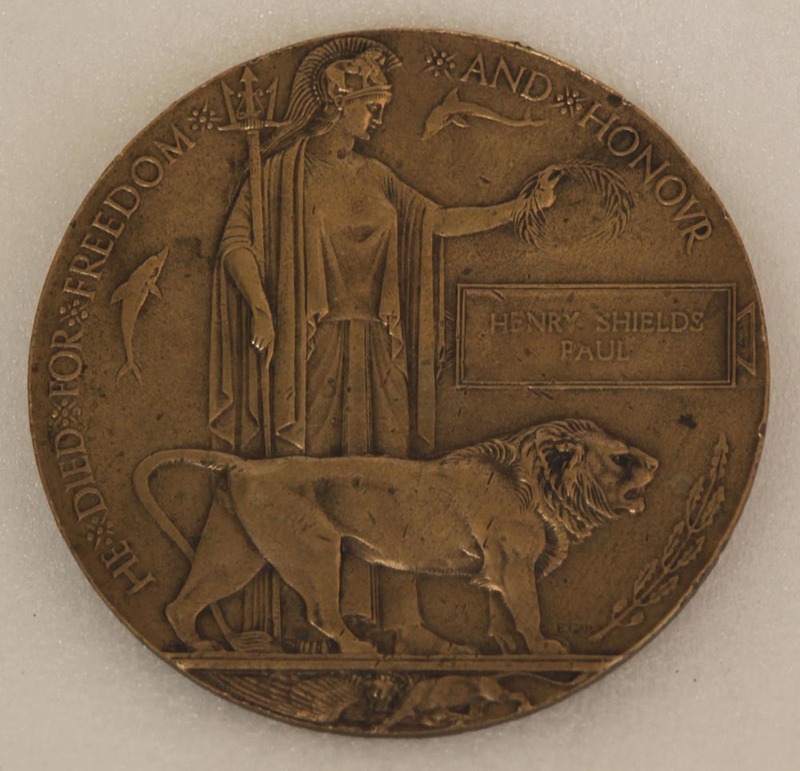 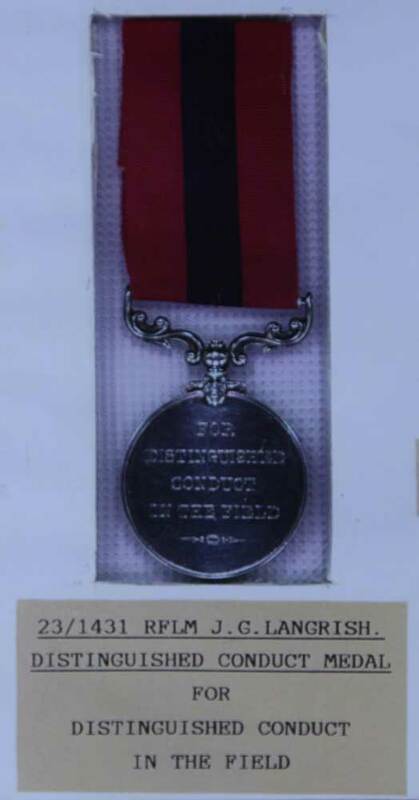 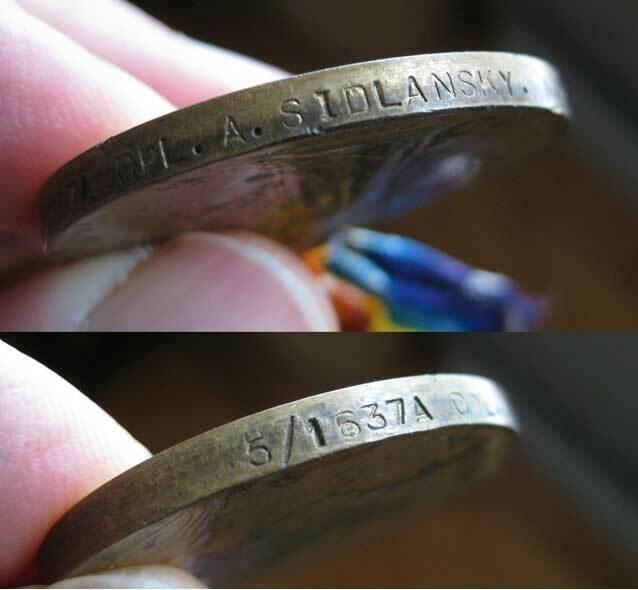 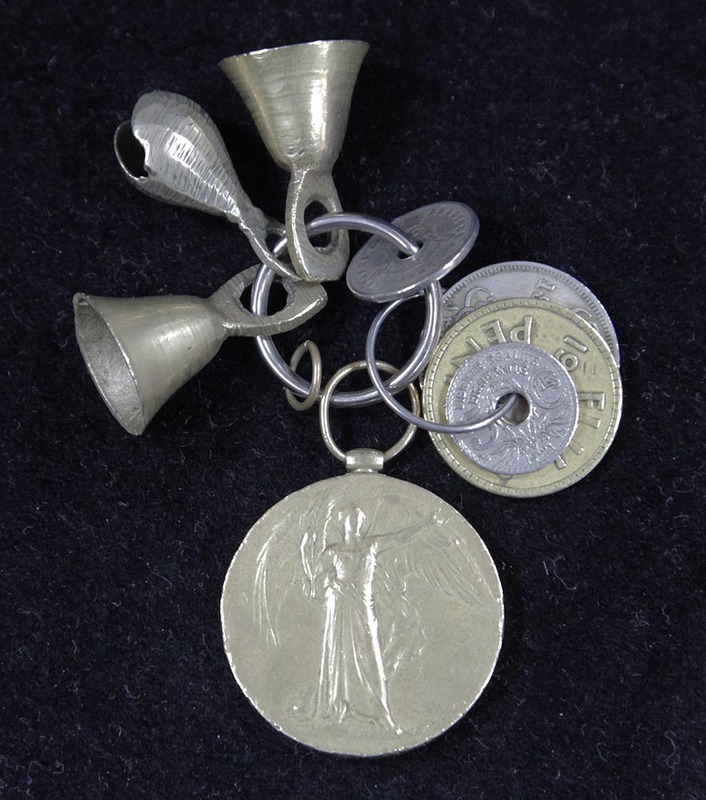 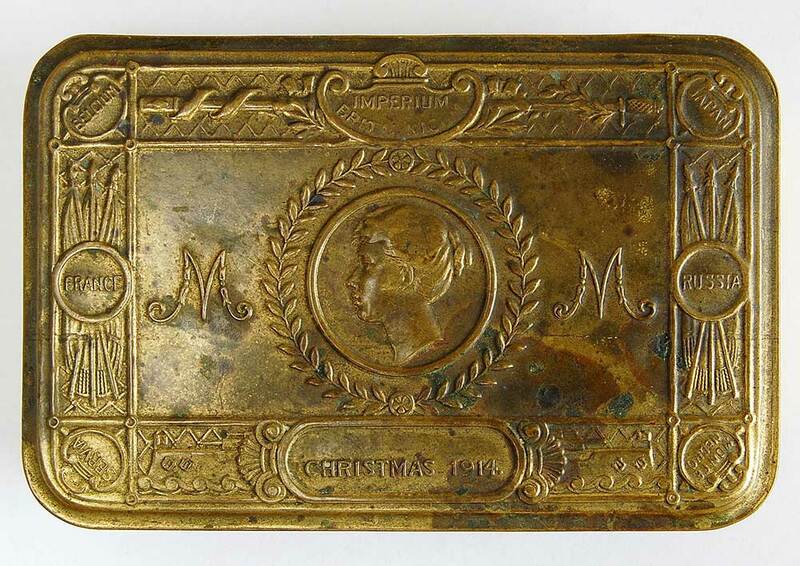 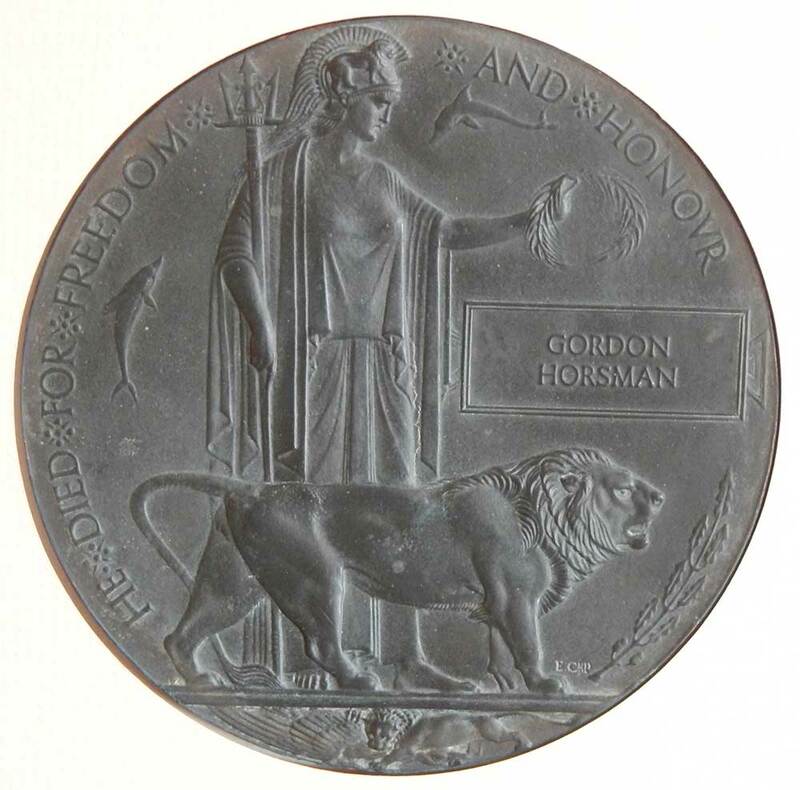 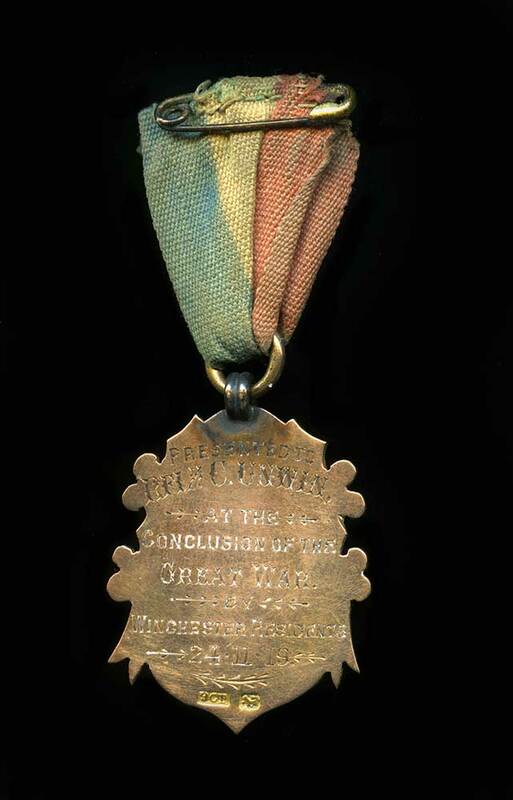 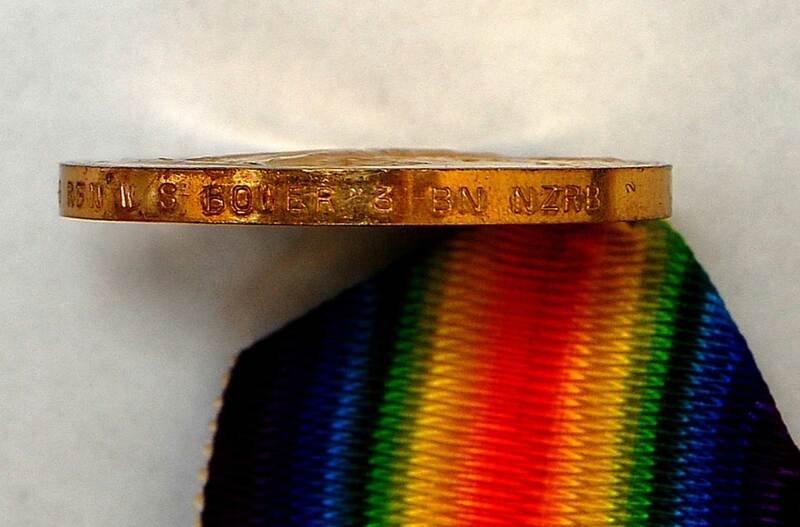 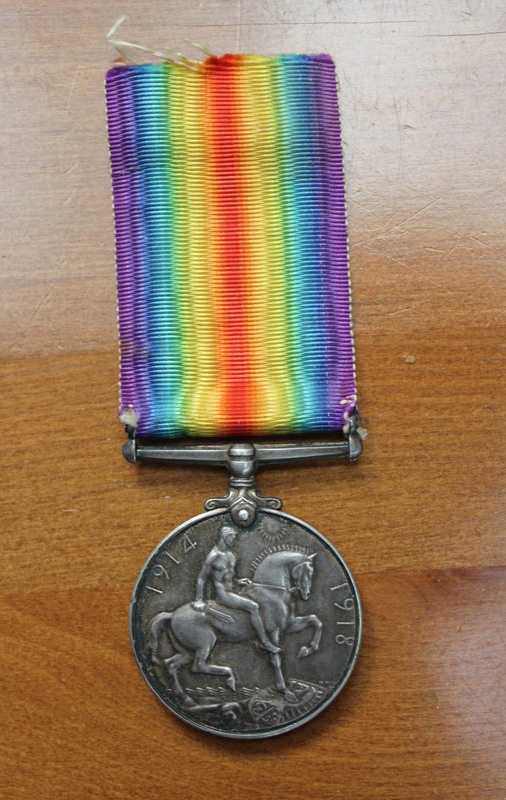 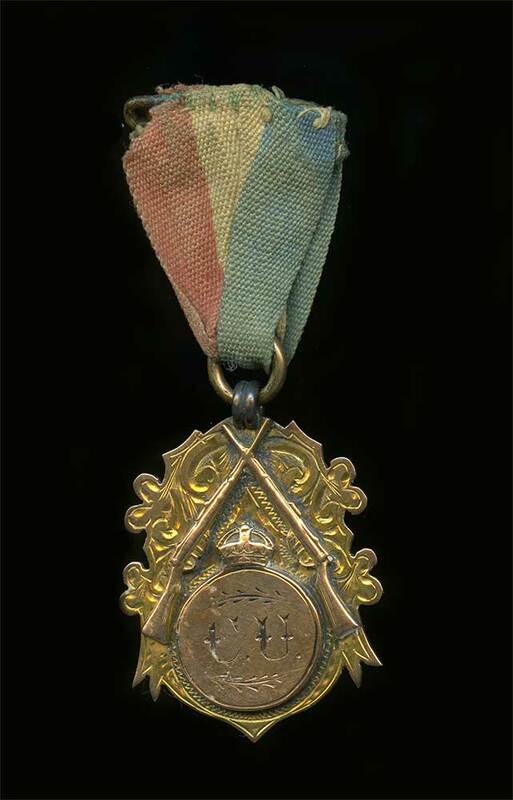 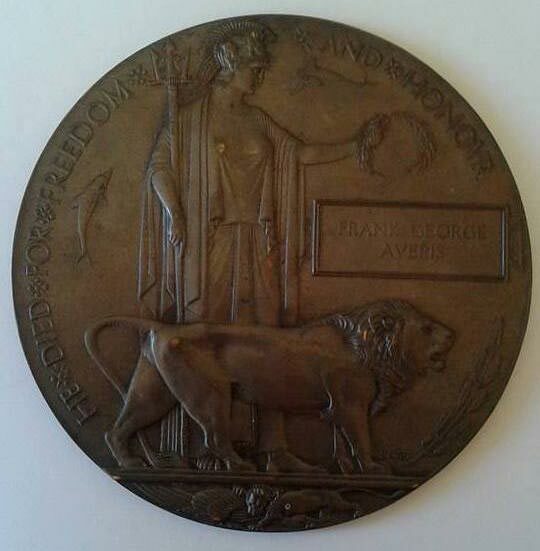 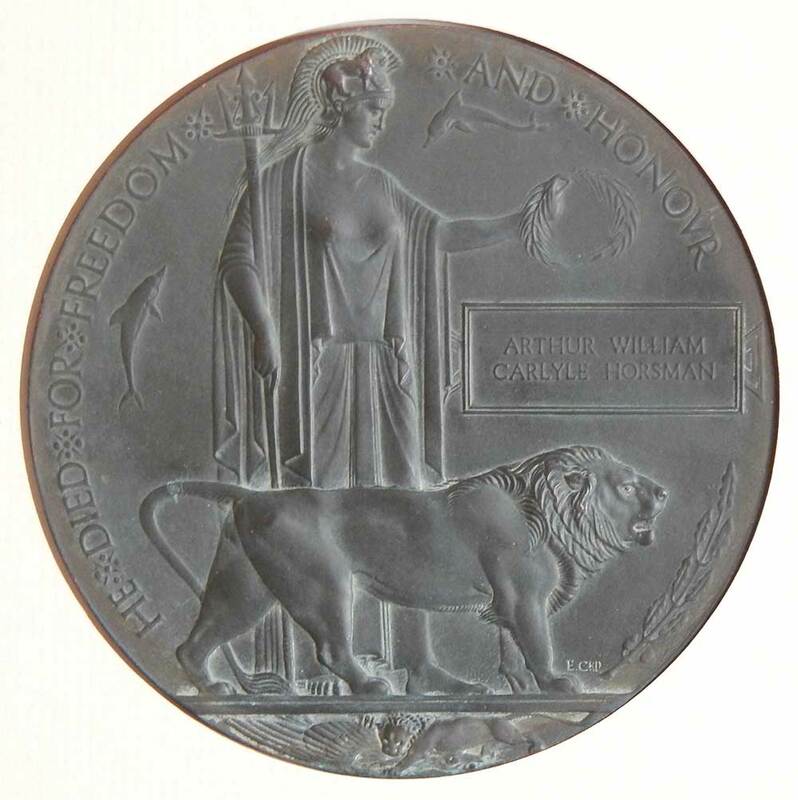 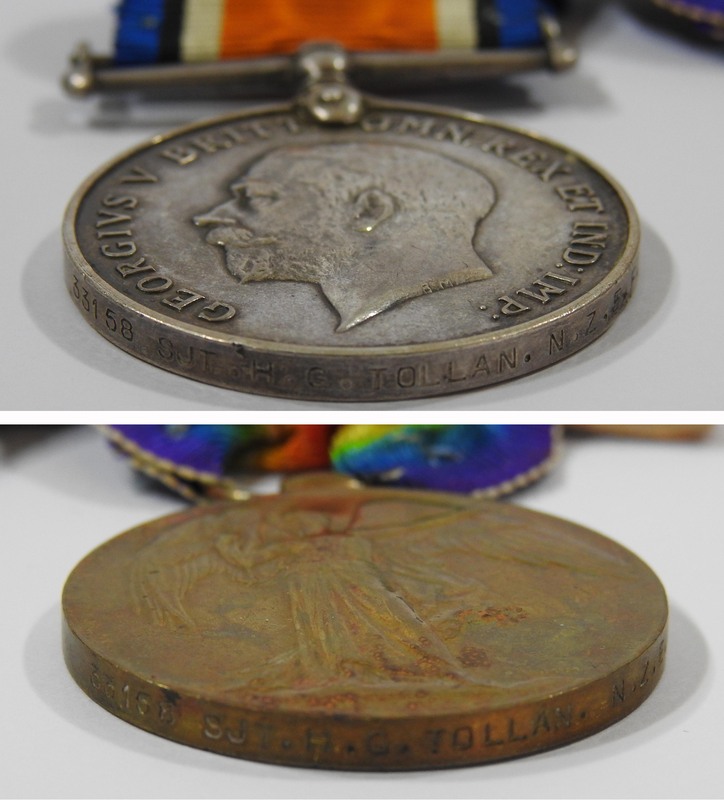 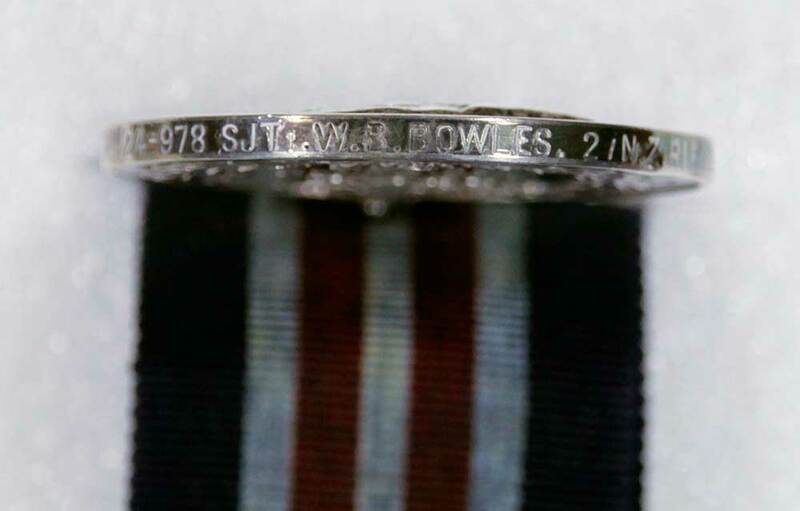 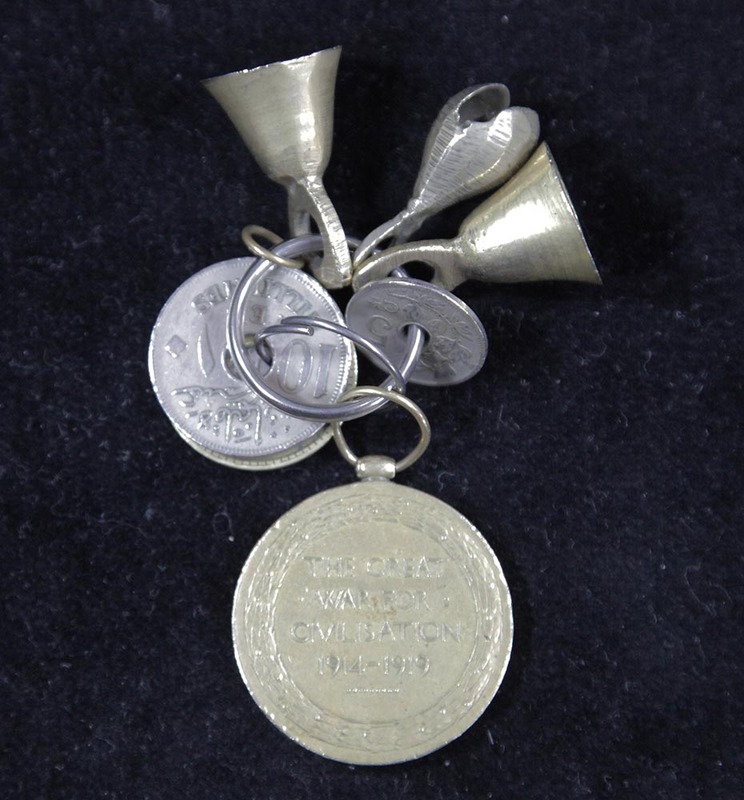 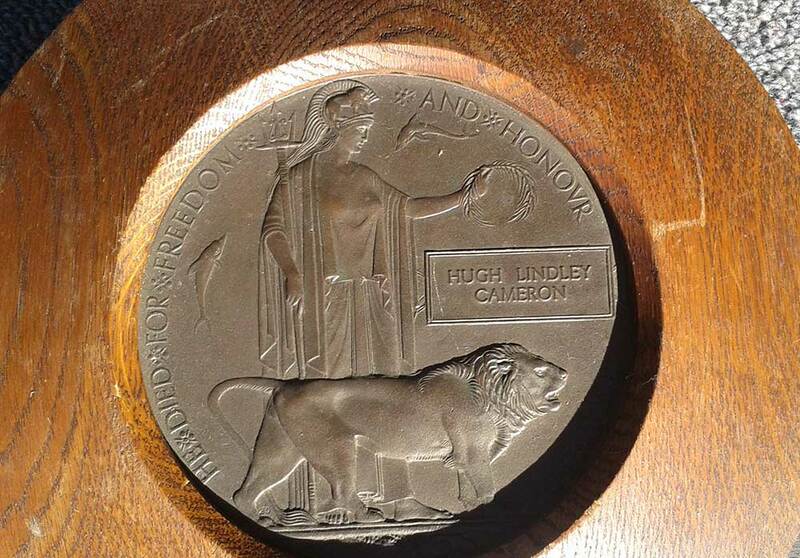 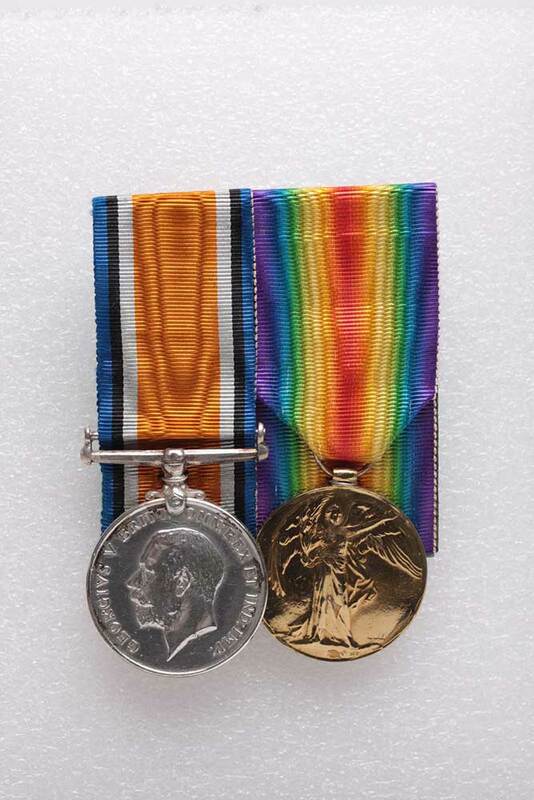 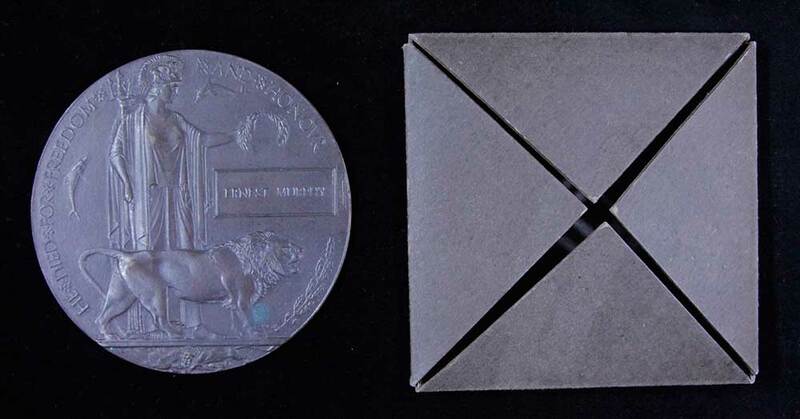 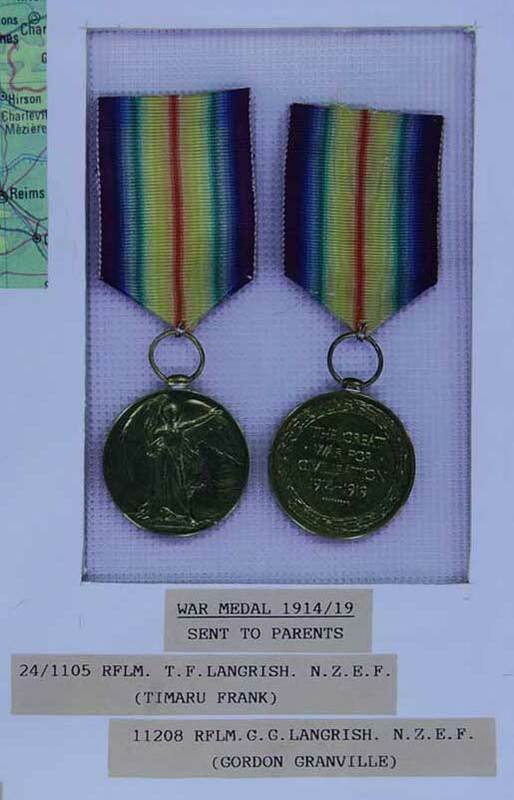 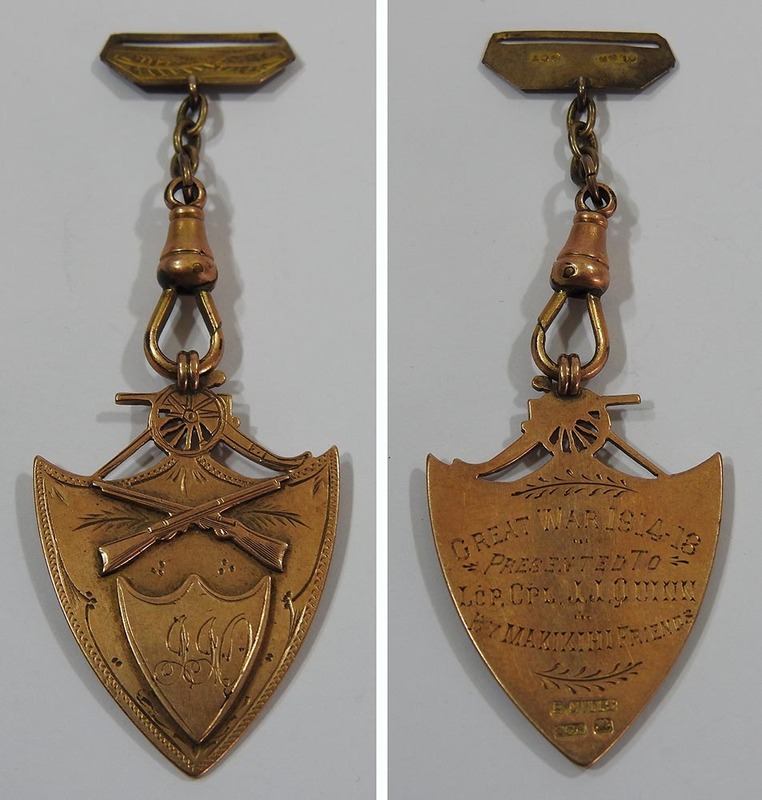 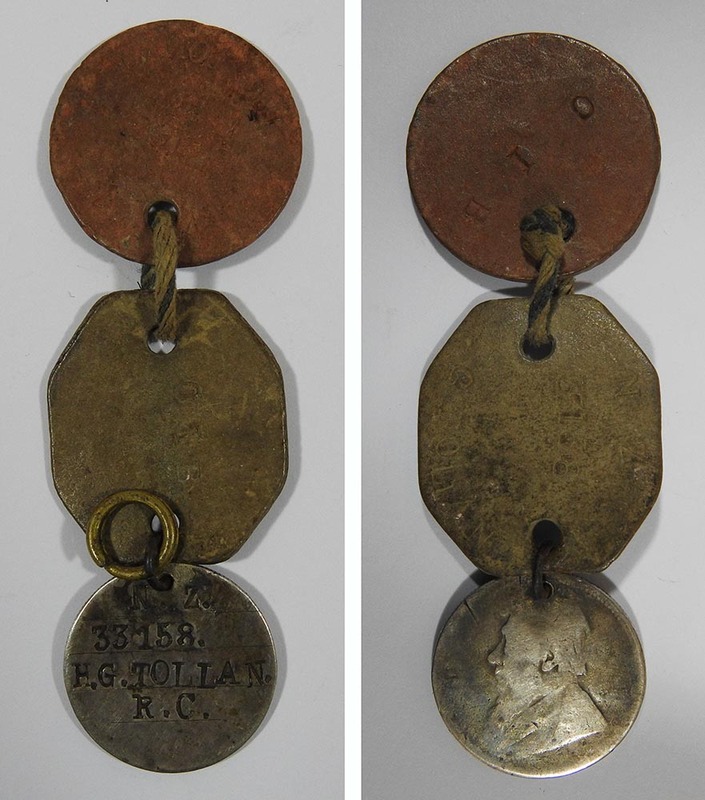 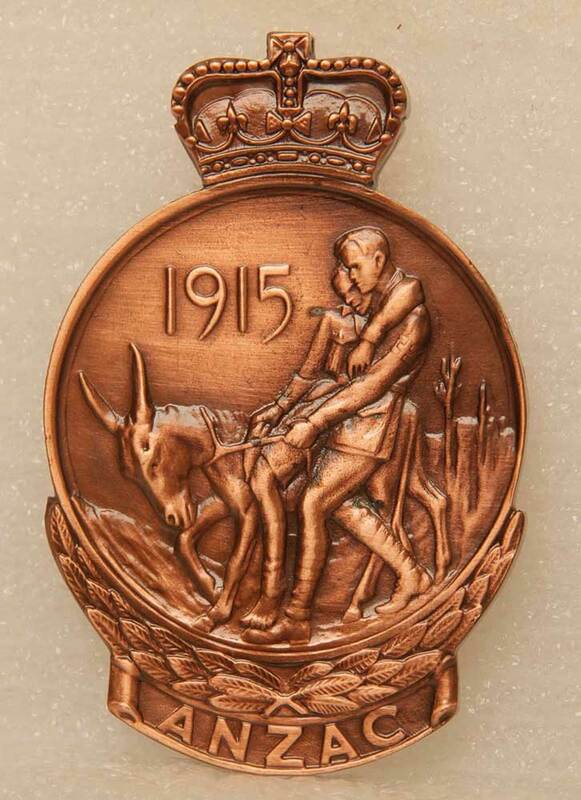 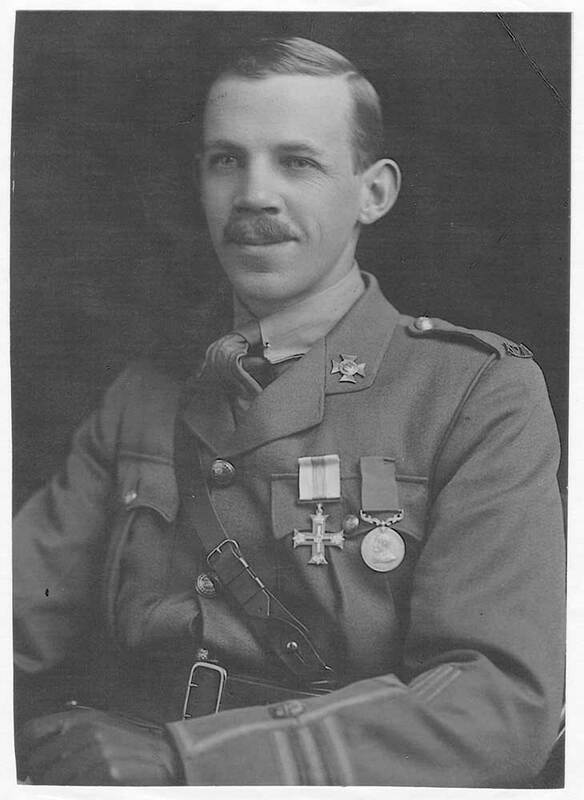 A Somme Medal belonging to James Driscoll. 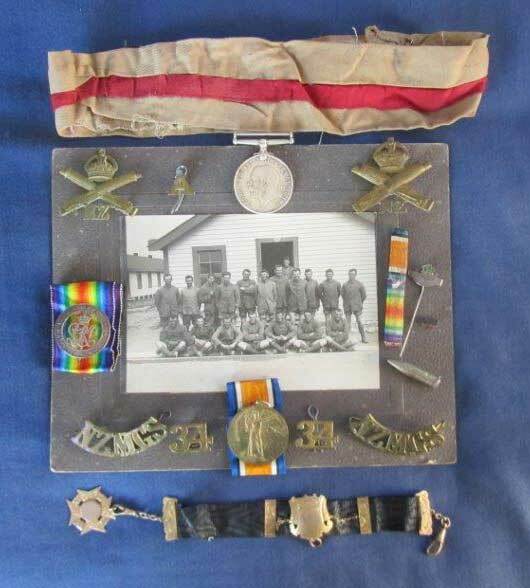 A collection of medals badges and other pieces belonging to Alex Ross, set on a photograph of him and some of his fellow soldiers. 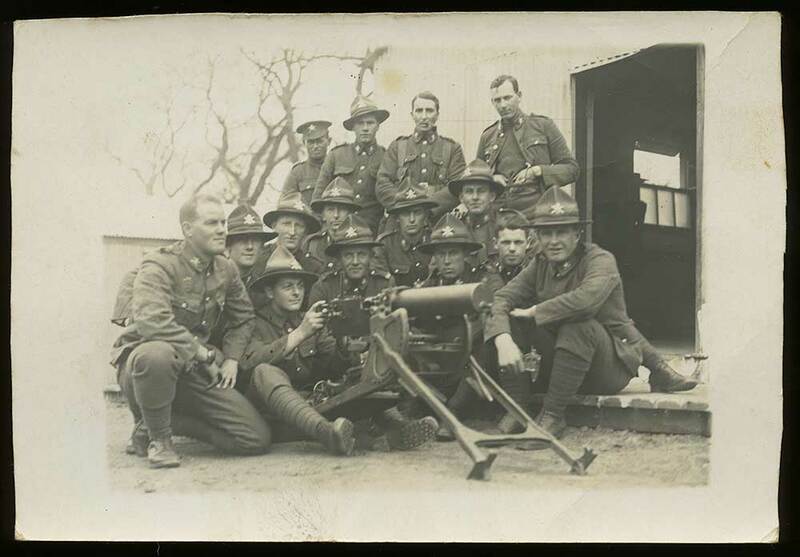 An unidentified group training with machine guns during World War One, circa 1916 to 1919. 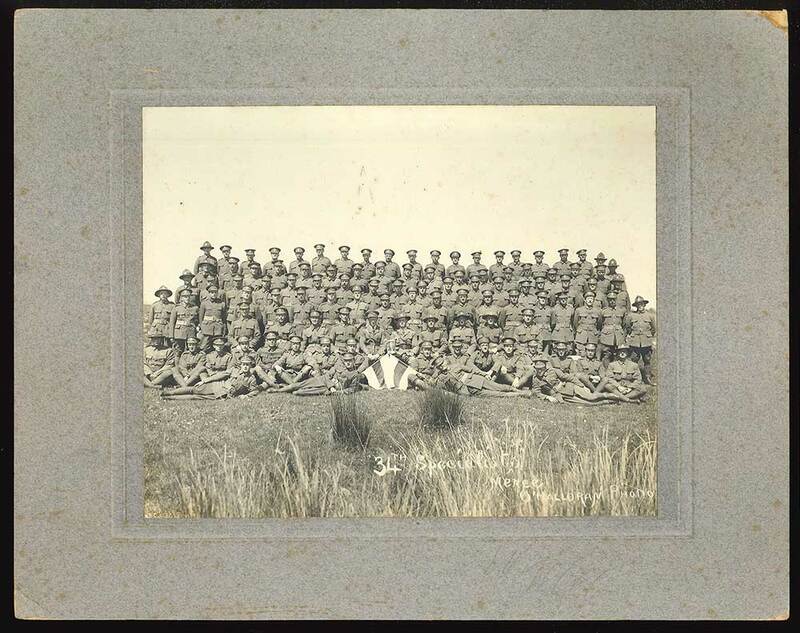 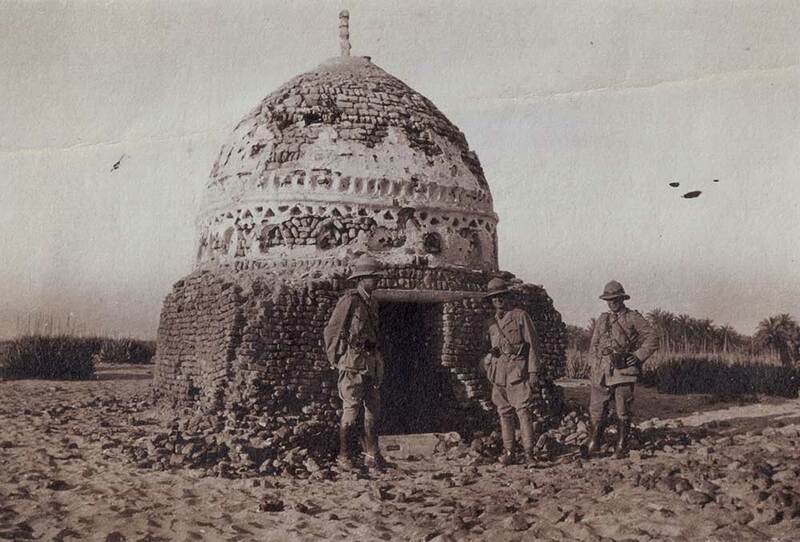 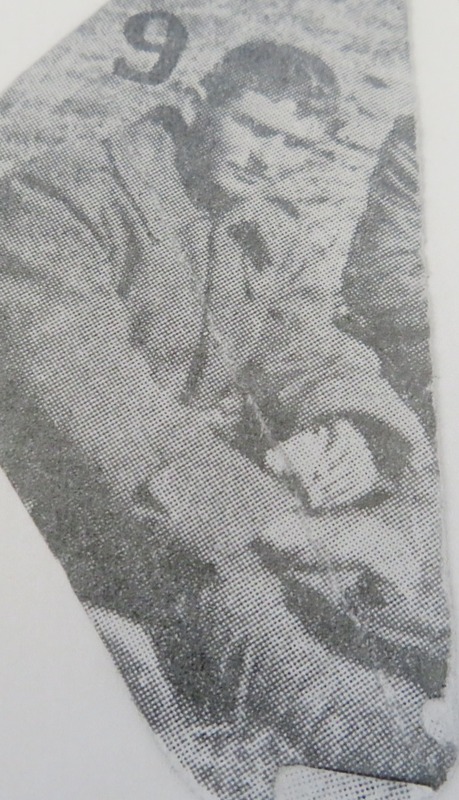 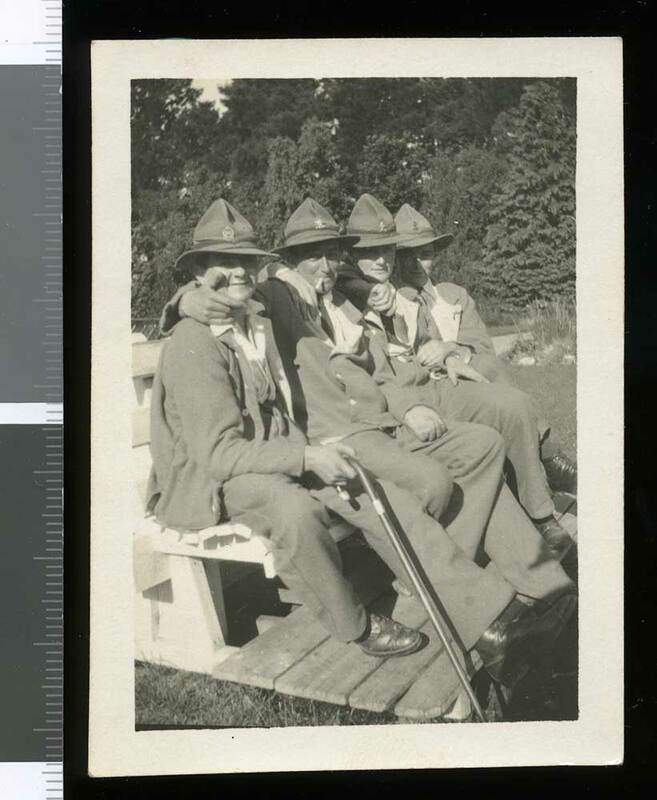 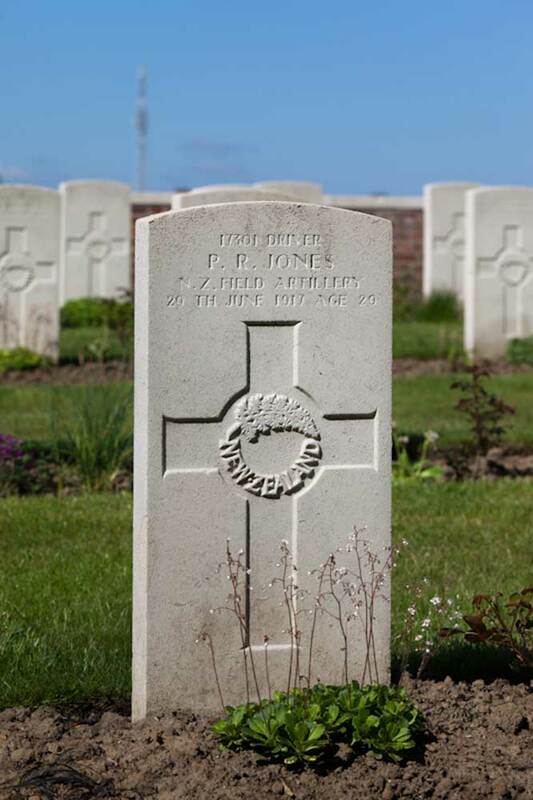 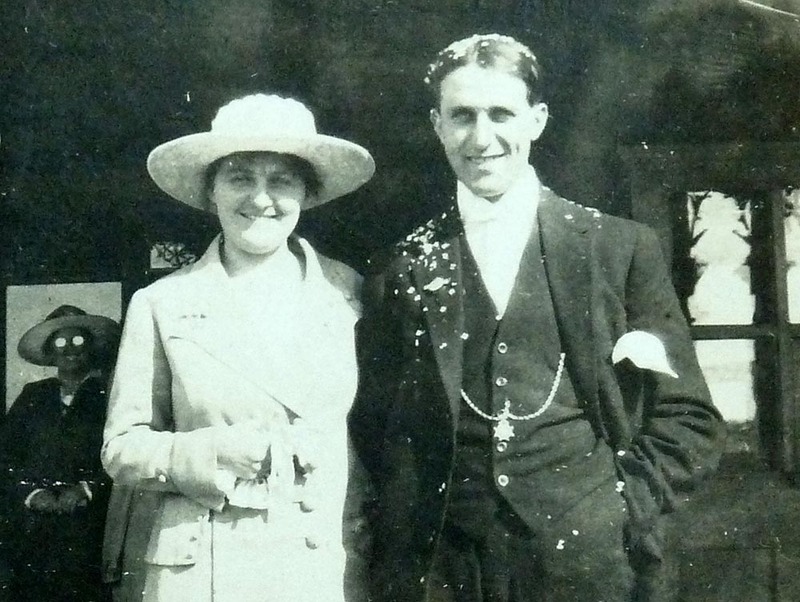 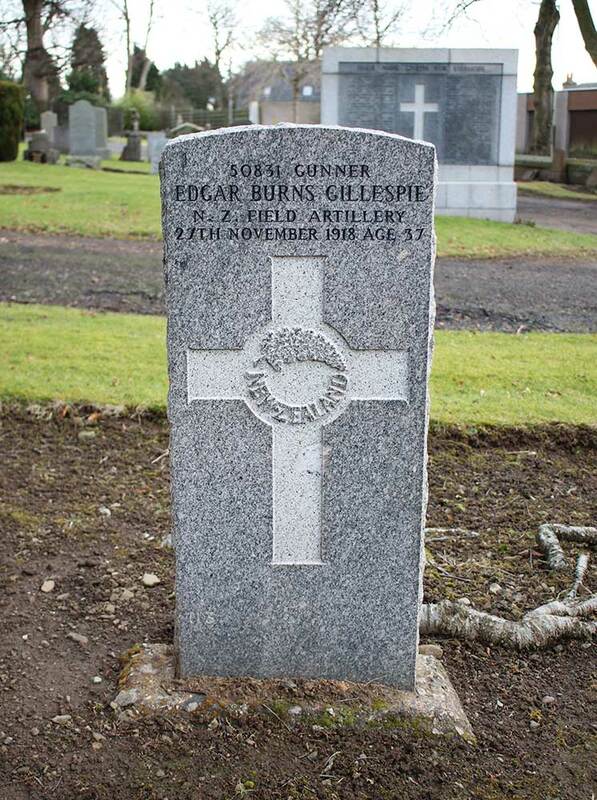 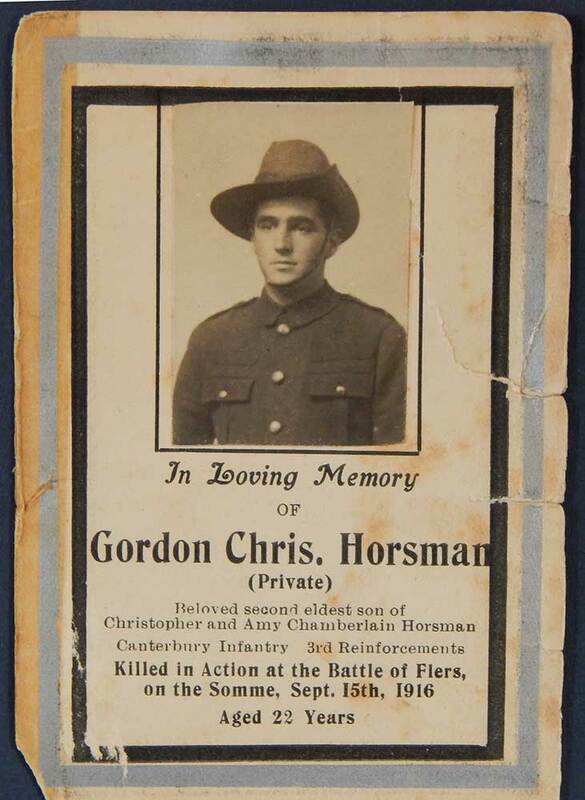 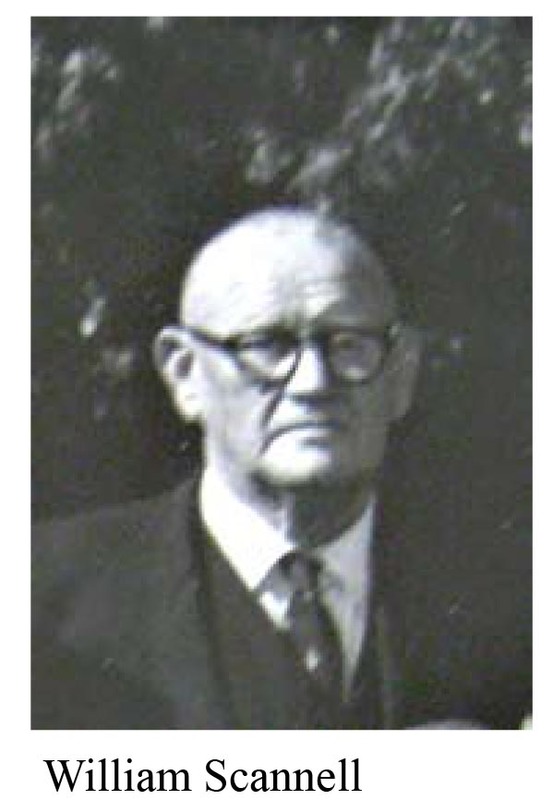 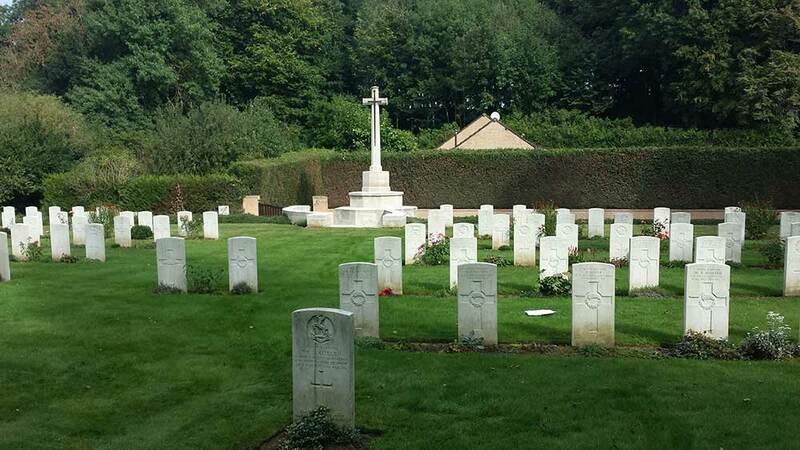 Presumably the group is associated or includes Gustave Squire, who served in a specialist machine gun unit.